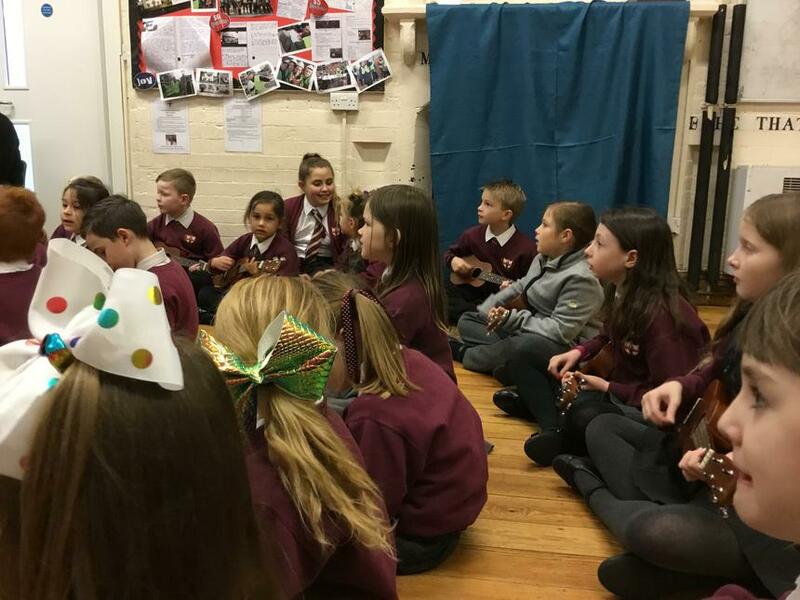 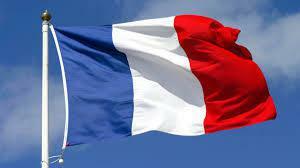 The children were immersed in a Multicultural Day based on Christmas in France. 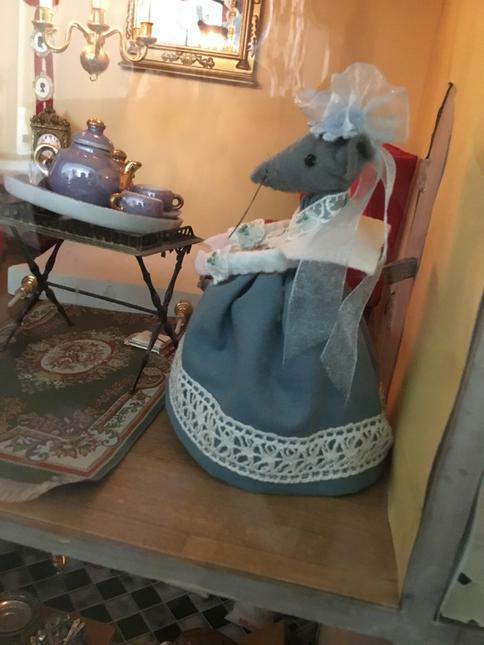 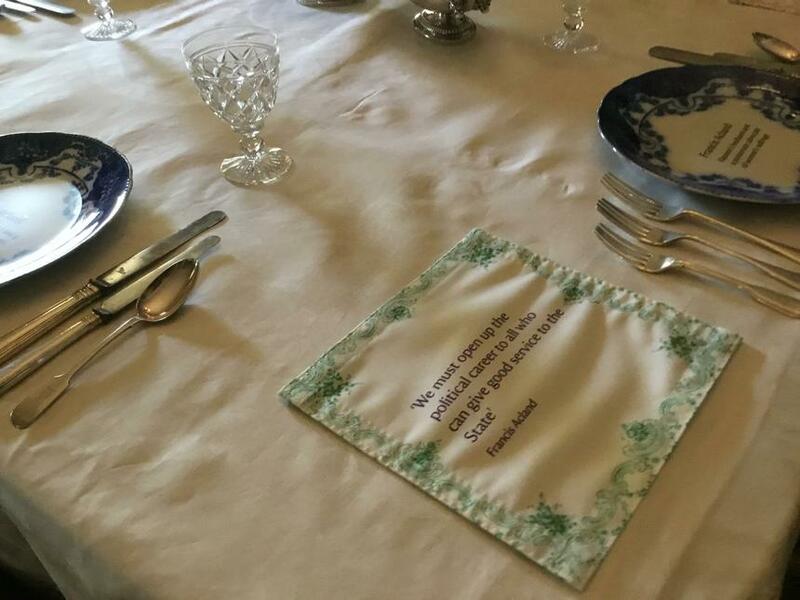 They started the day looking at the Reveillon Dinner and deigned 13 desserts which had a symbolic meaning to the last super. 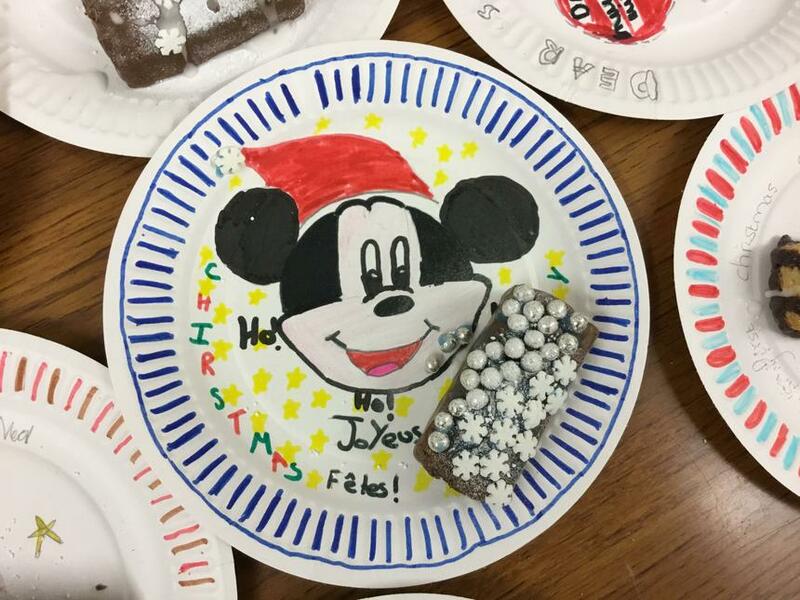 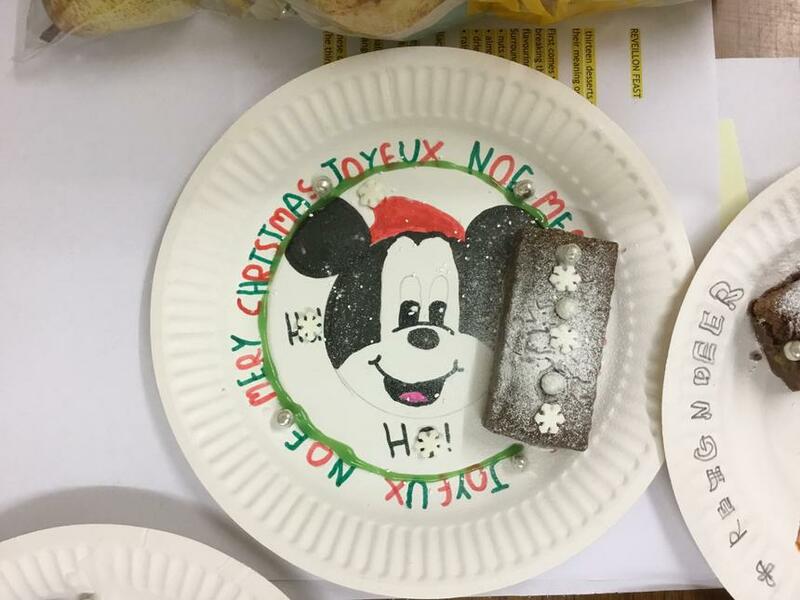 The children then designed a festive Christmas plate and decorated a chocolate log which they got to take home and enjoy for their supper. 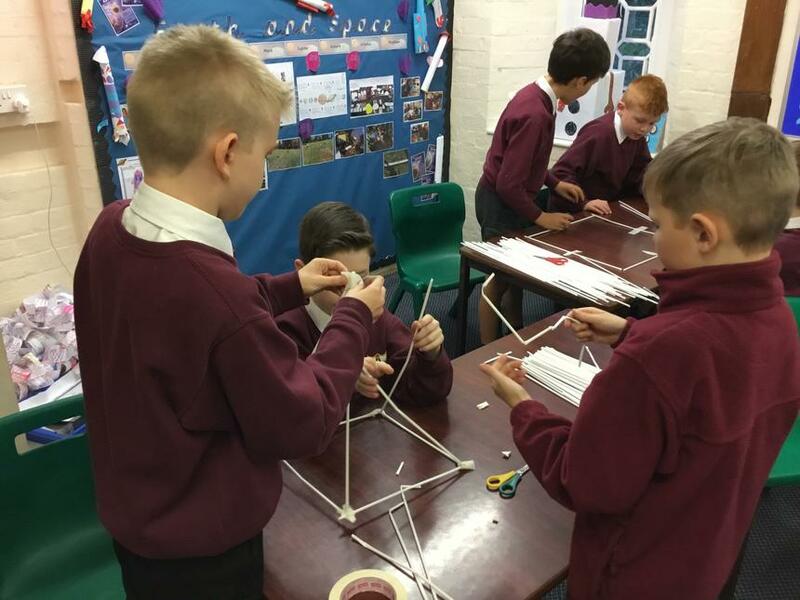 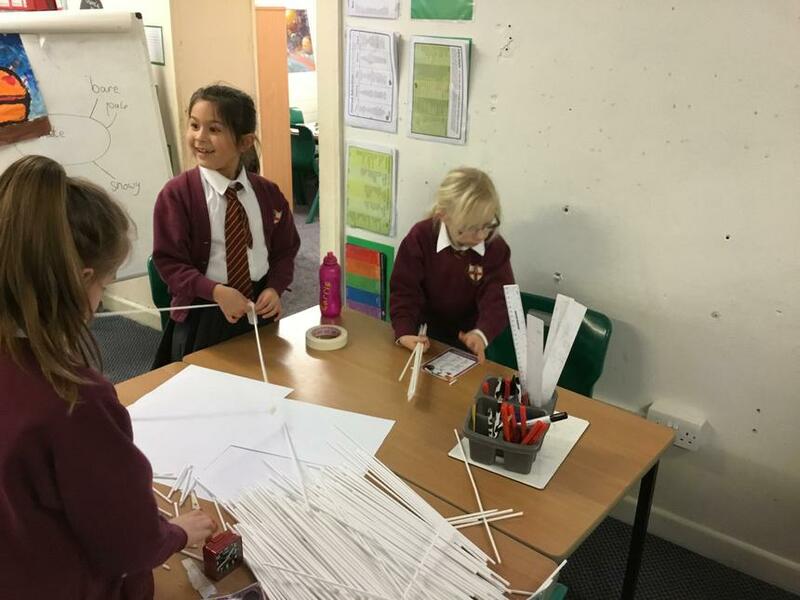 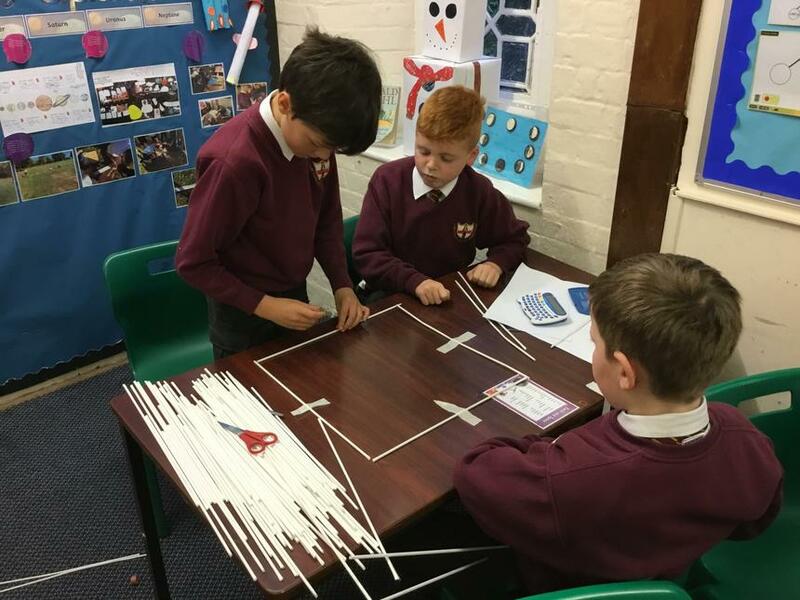 To end the day, class 3 explored the construction of the Eiffel Tower and were asked to construct their own using art sticks and masking tape. 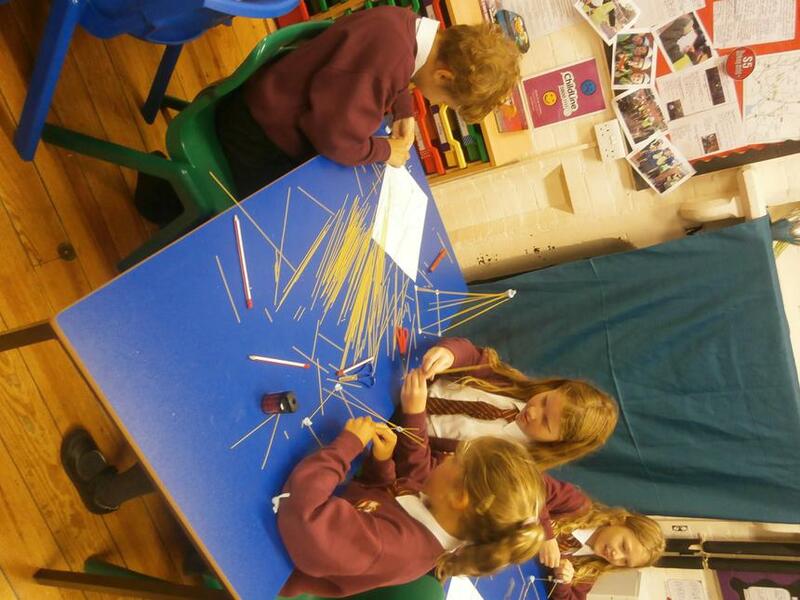 The only rule was that their tower needed to stand up unaided at the end of the session. 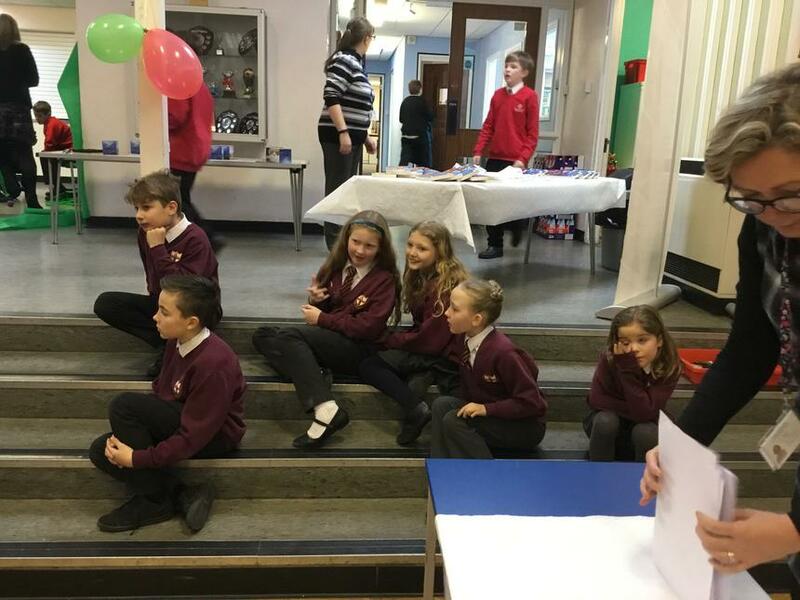 The children made Christingles for our yearly Carol Service held at Clyst St George Church. 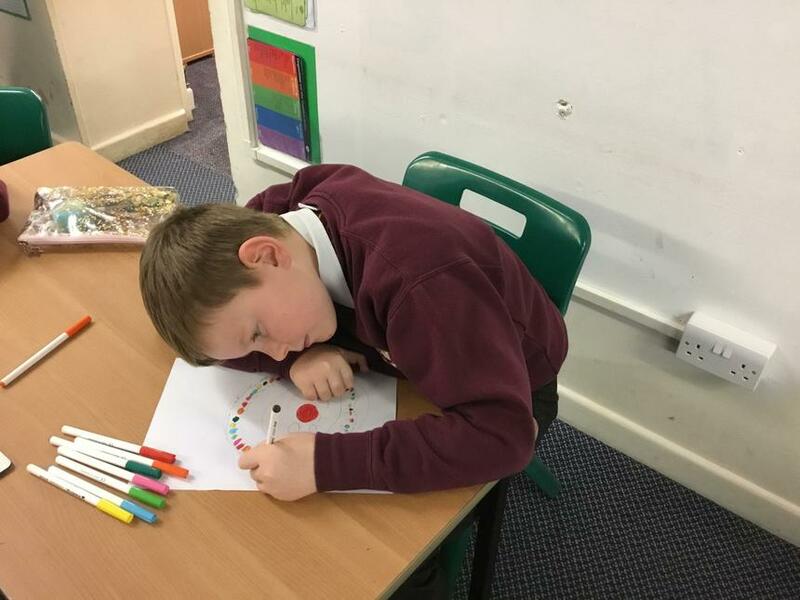 The children learnt what Christingles symbolise and the history behind them. 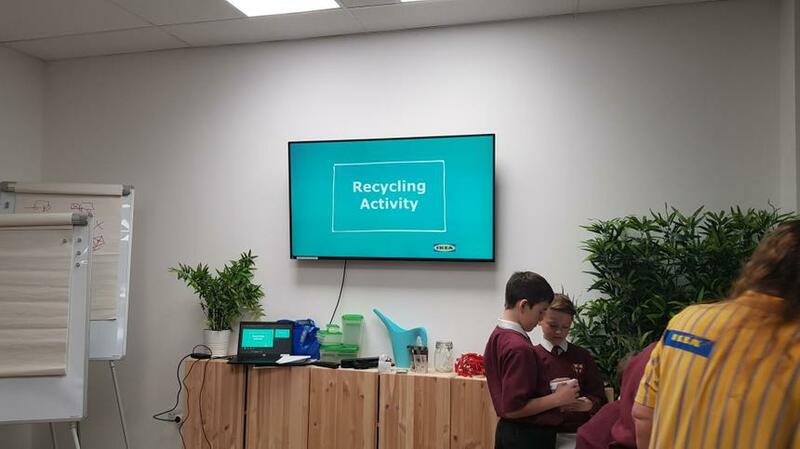 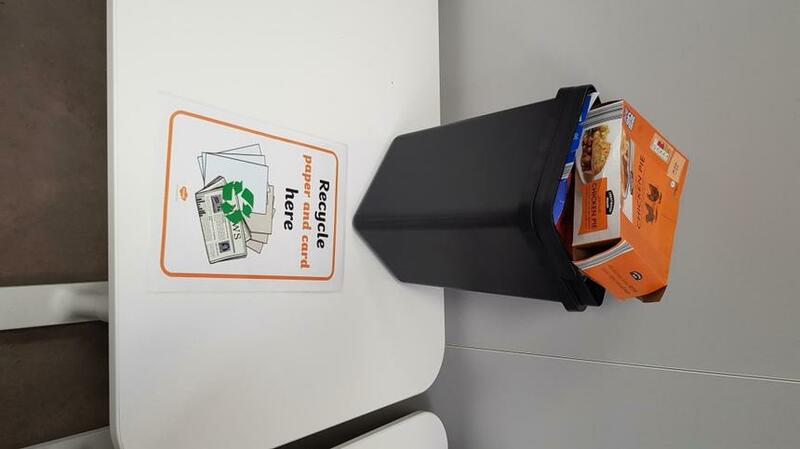 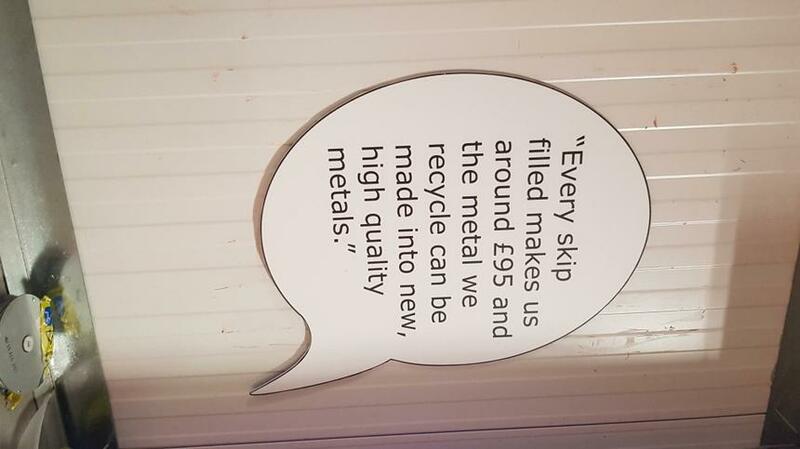 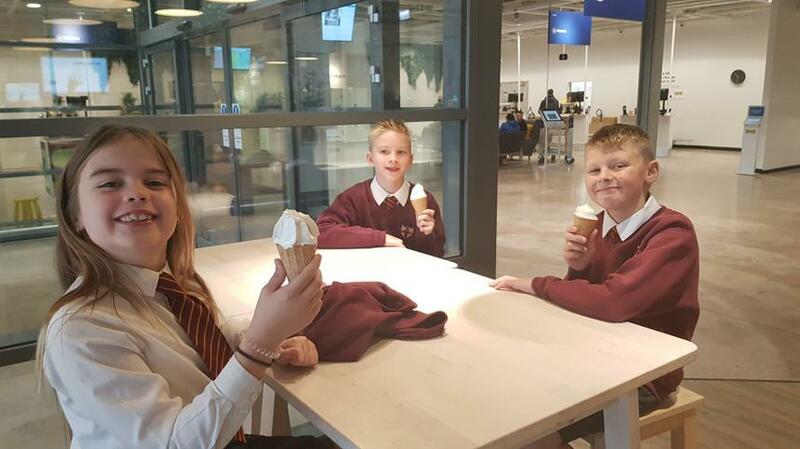 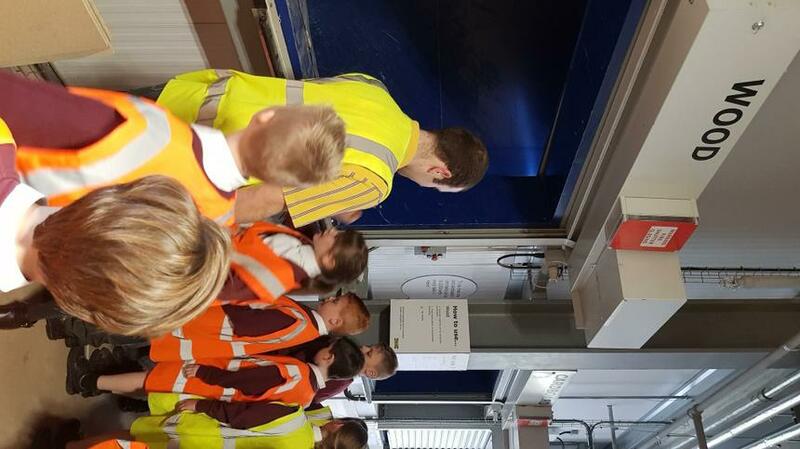 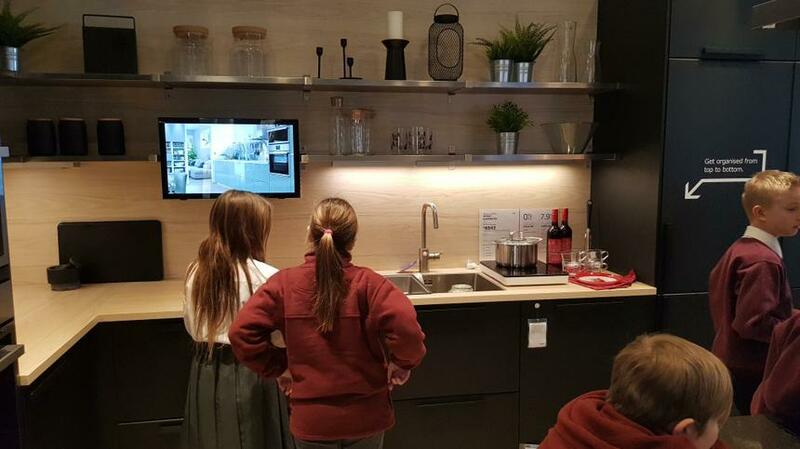 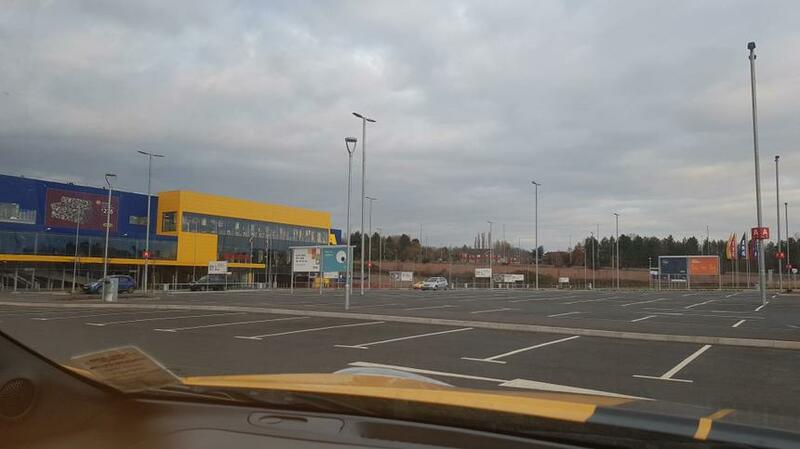 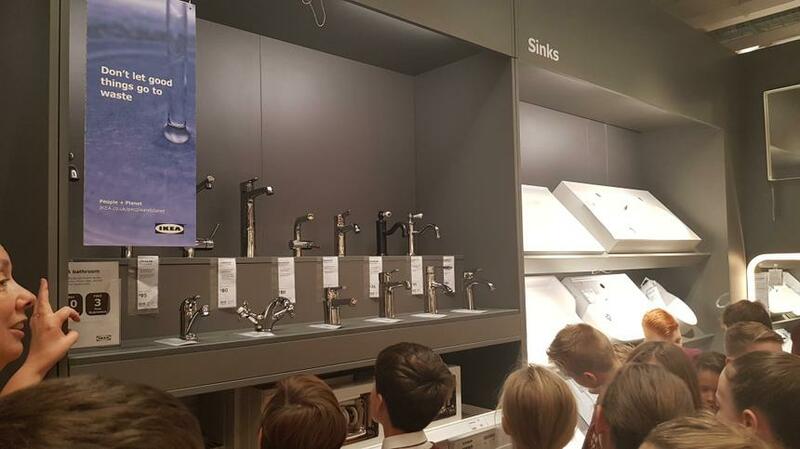 Class 3 were lucky enough to be invited along to Ikea for a store tour and a talk about recycling and sustainability. 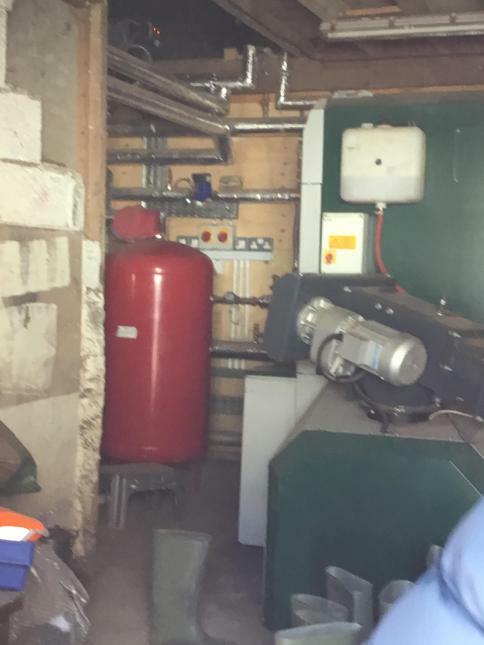 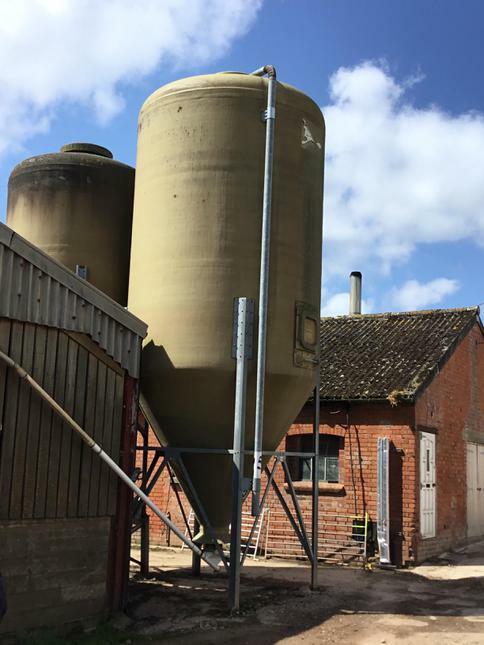 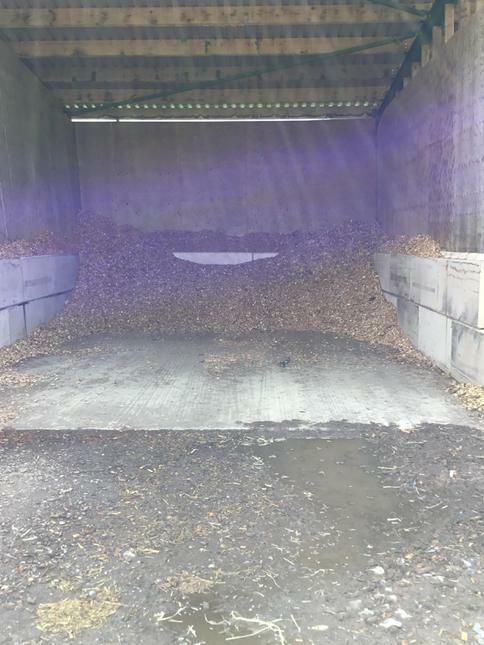 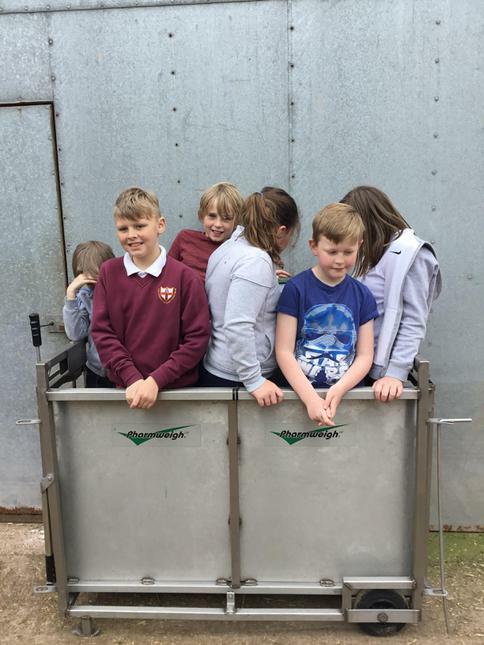 The children took part in a number of activities around recycling and even got to recycle some large equipment out the back of the store. 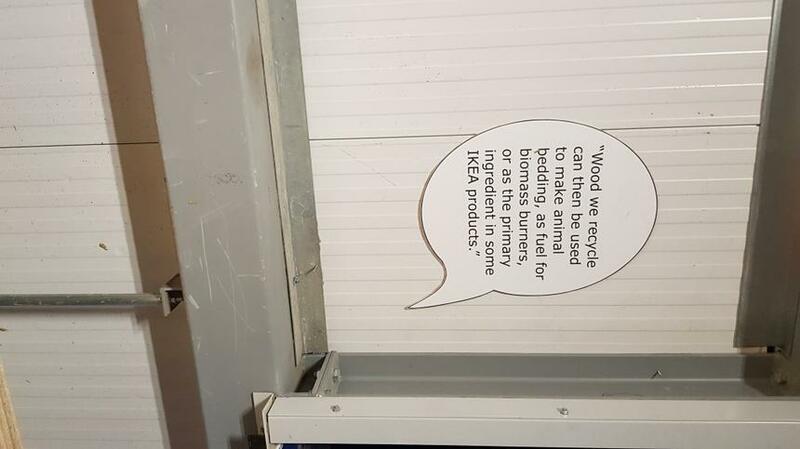 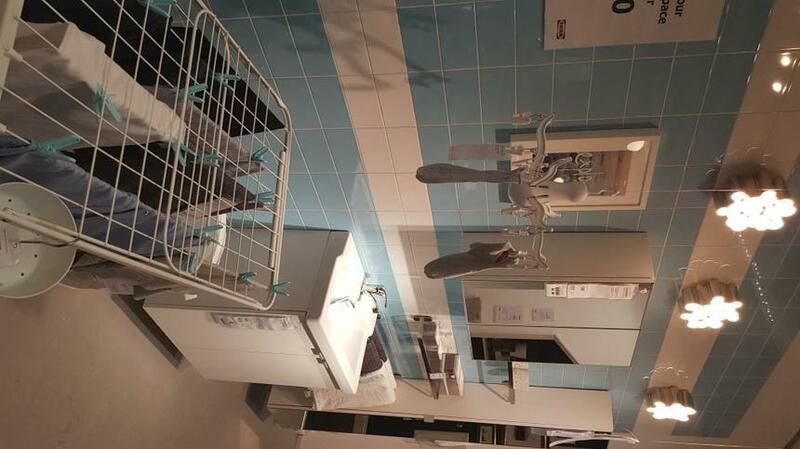 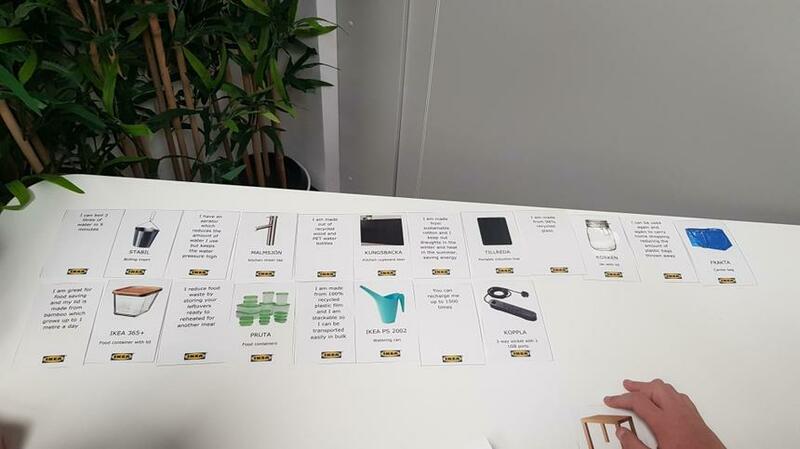 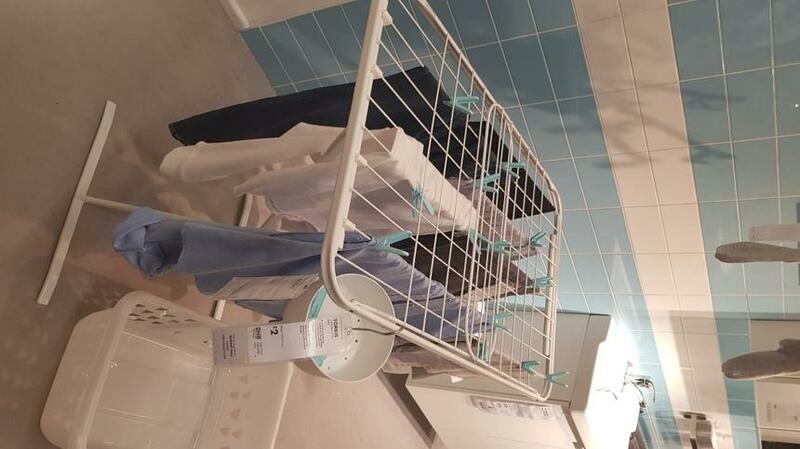 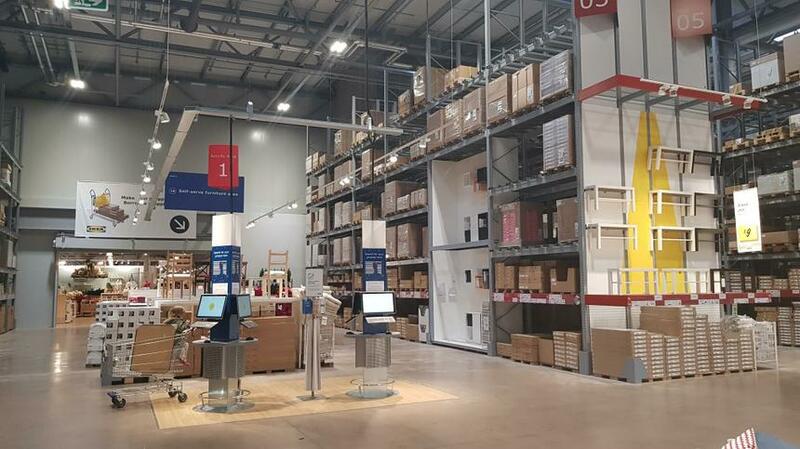 We would like to thank Ikea for having us. 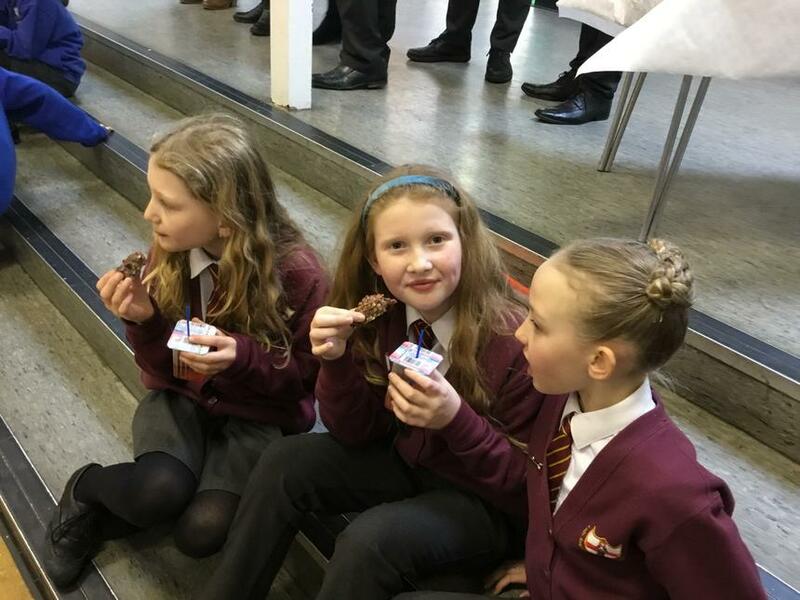 The children in Class 3 got to try real astronaut food that is designed to be eaten in space. 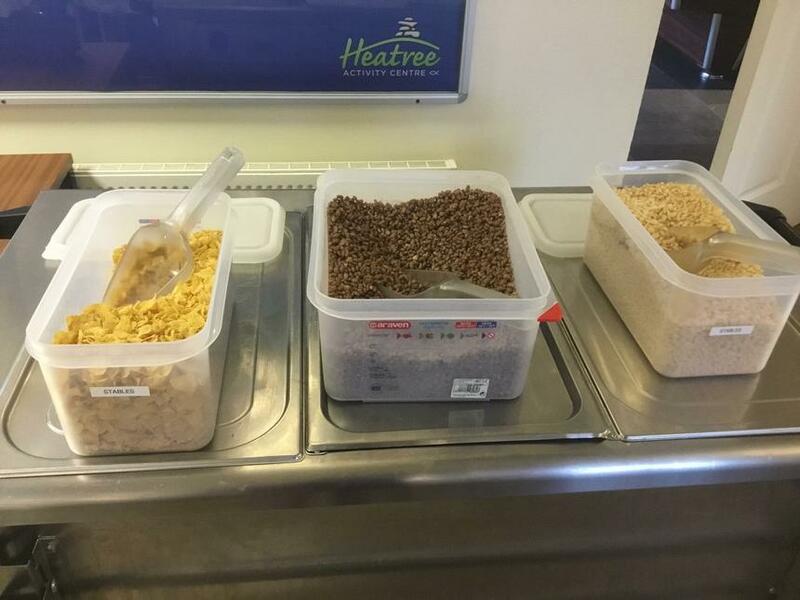 The flavour was chocolate ice cream with chocolate chips. 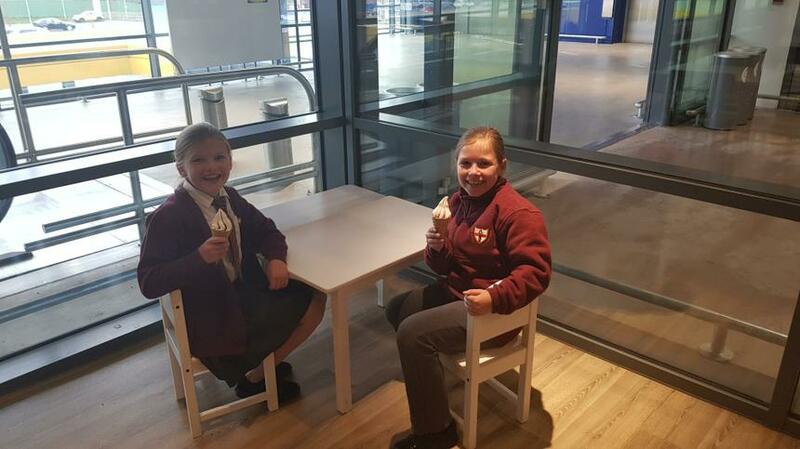 We discussed why most food is dry freezed and what would happen to ice cream if it was opened in space. 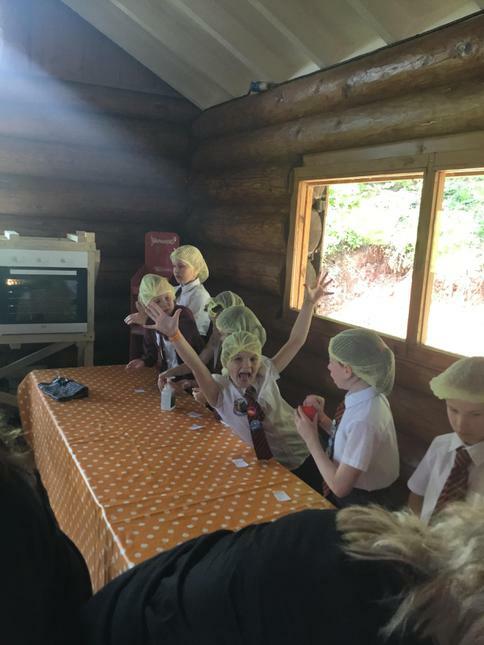 Judging by the children’s faces, they really enjoyed the taste! 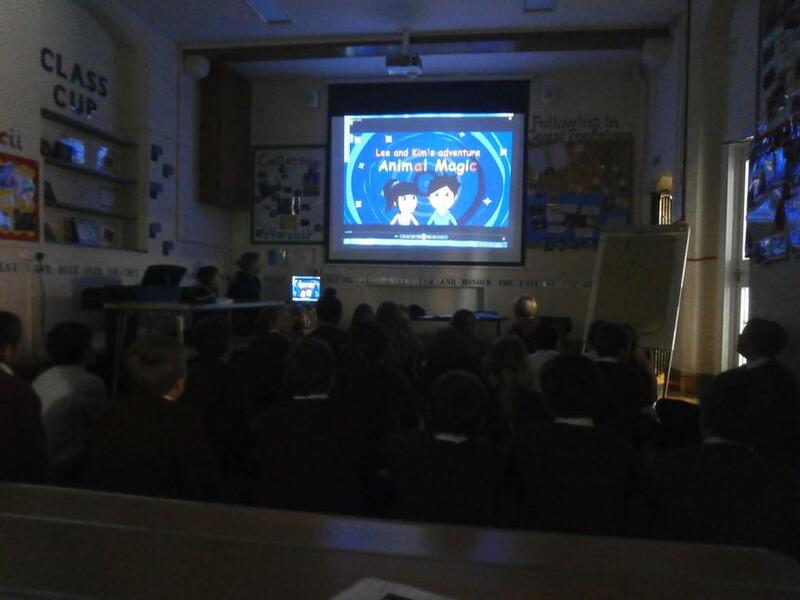 Class 3 celebrated the moon landings by going back in time to 1969 and watching a ‘live’ viewing of the moon landings. 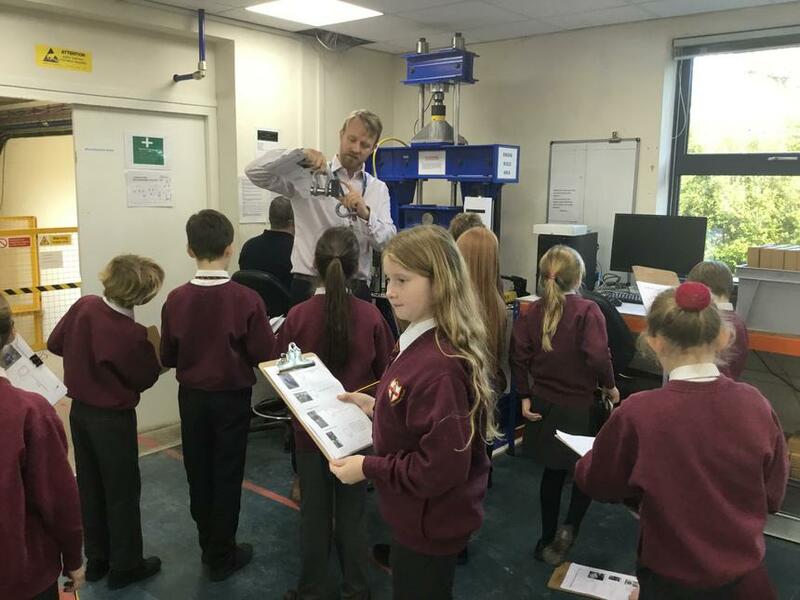 They learnt about the Apollo 11 mission and the important roles of the three astronauts on board at the time. 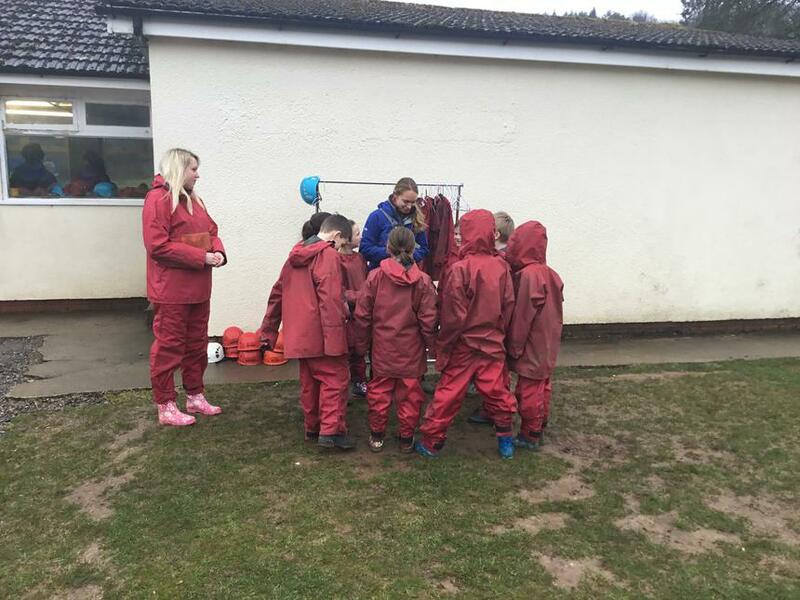 The children completed many activities around the moon landings and dressed up for the occasion. 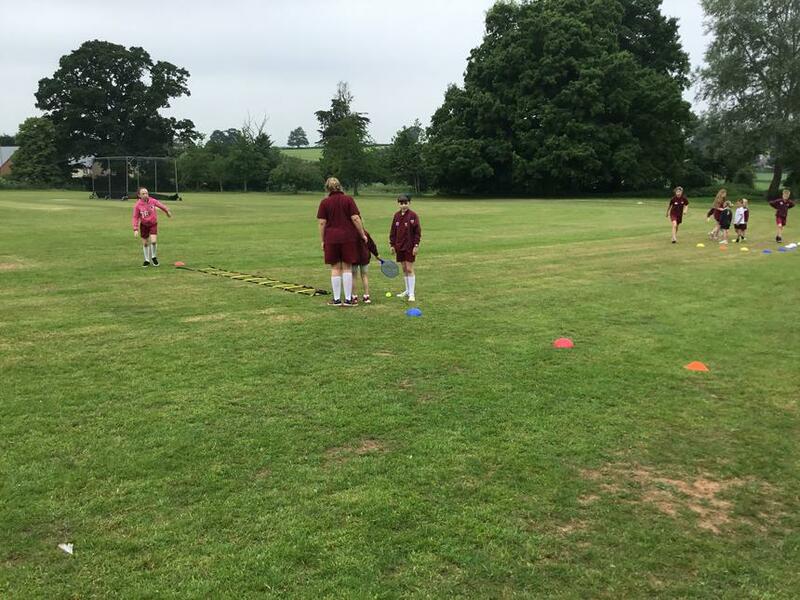 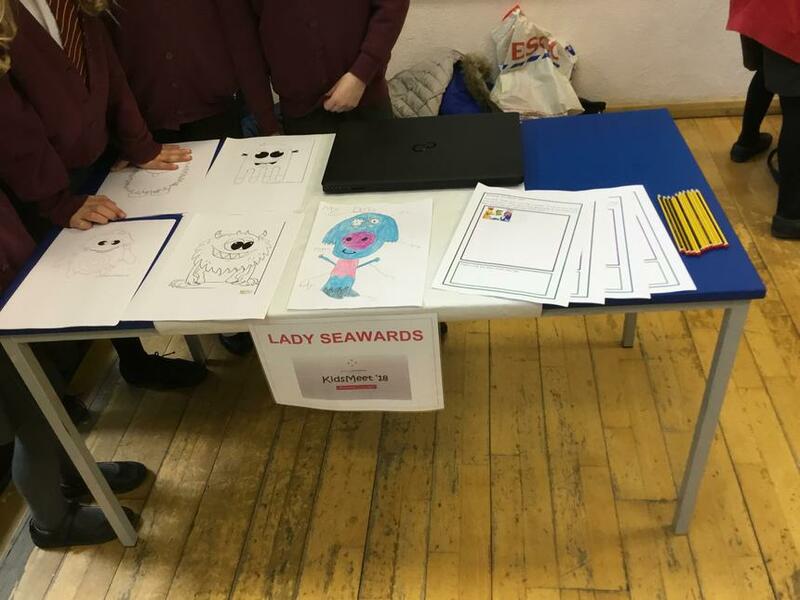 Lady Seaward's took part in a Healthy Eating Day across all classes with many activities taking place. 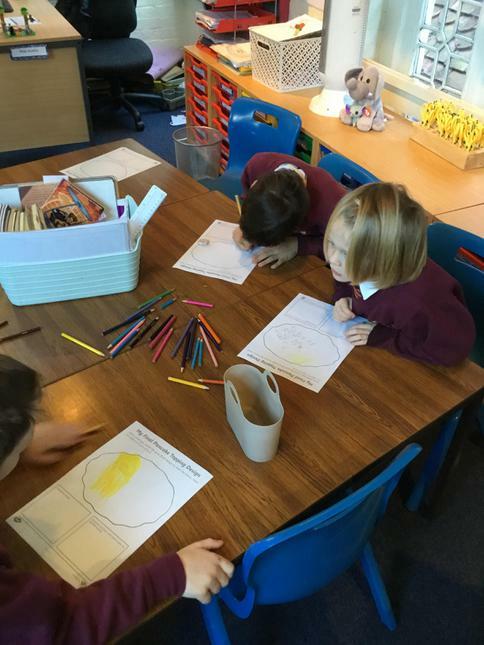 Class 3 explored the importance of a healthy lunchbox and how to provide a balanced diet with 5 different fruit and vegetables a day. 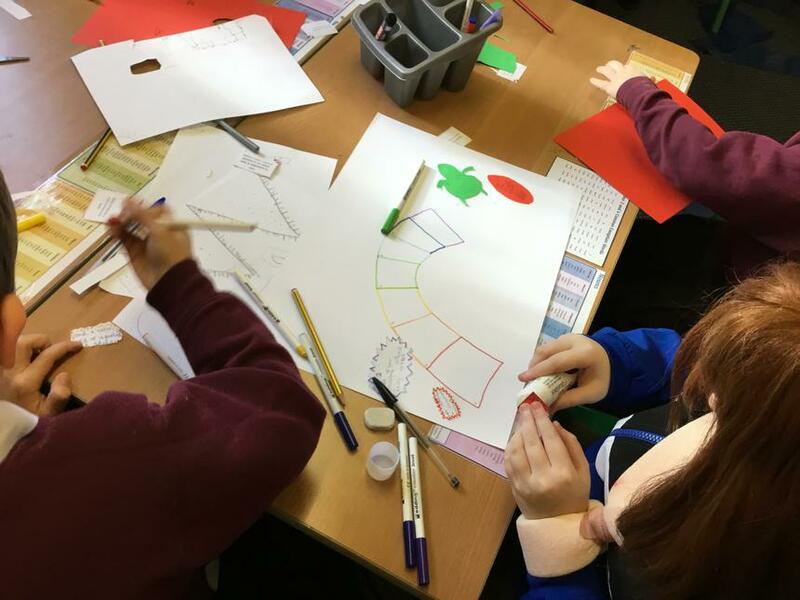 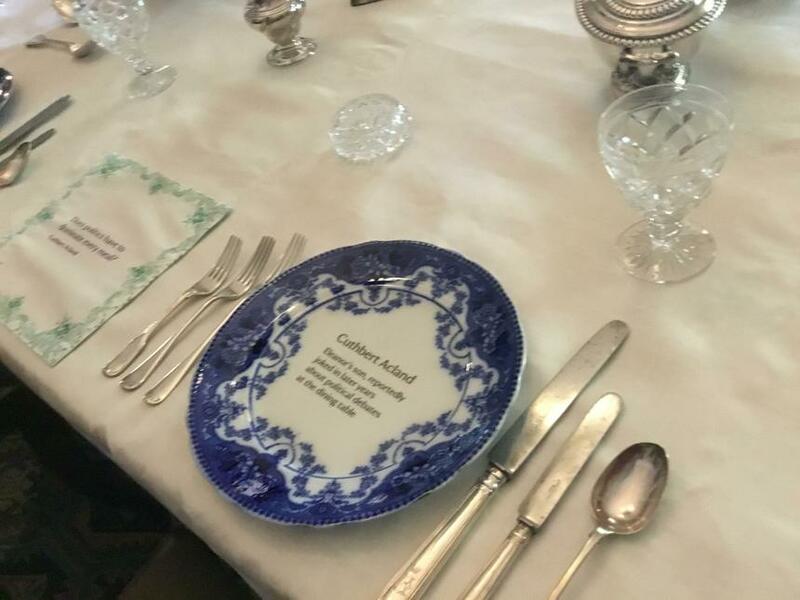 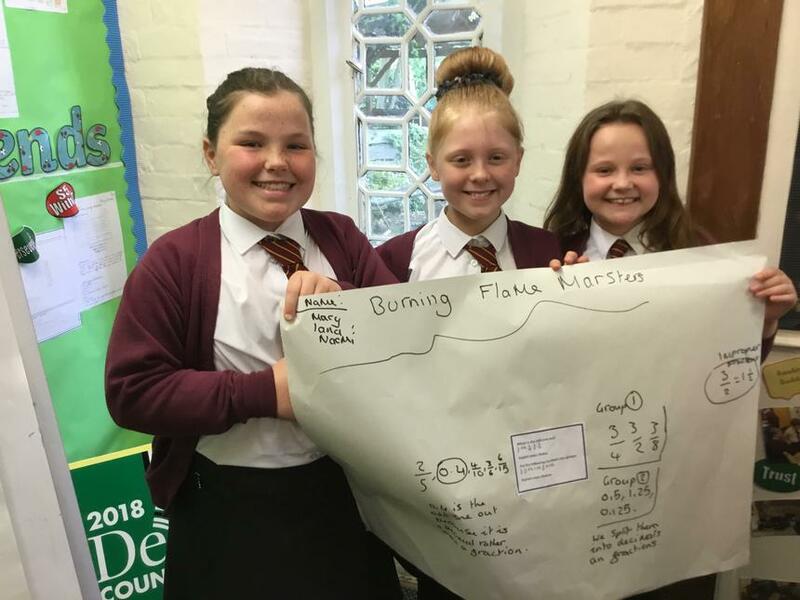 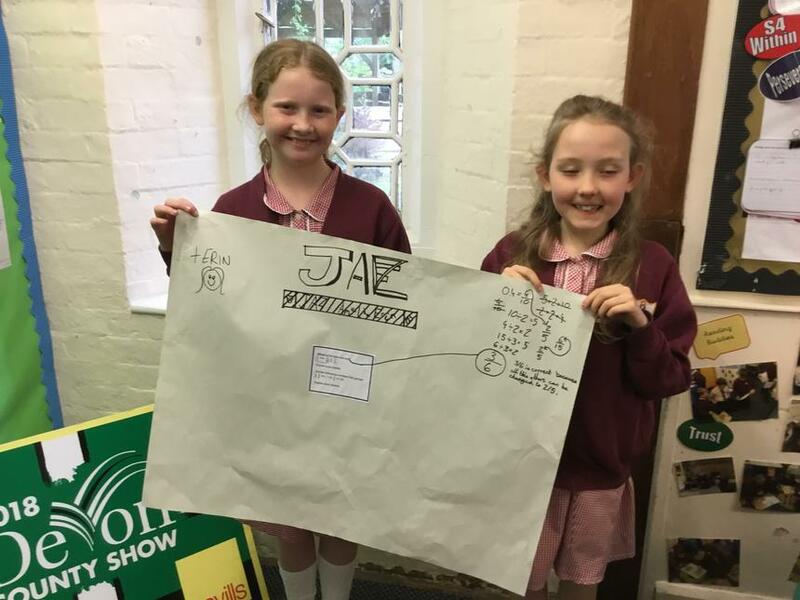 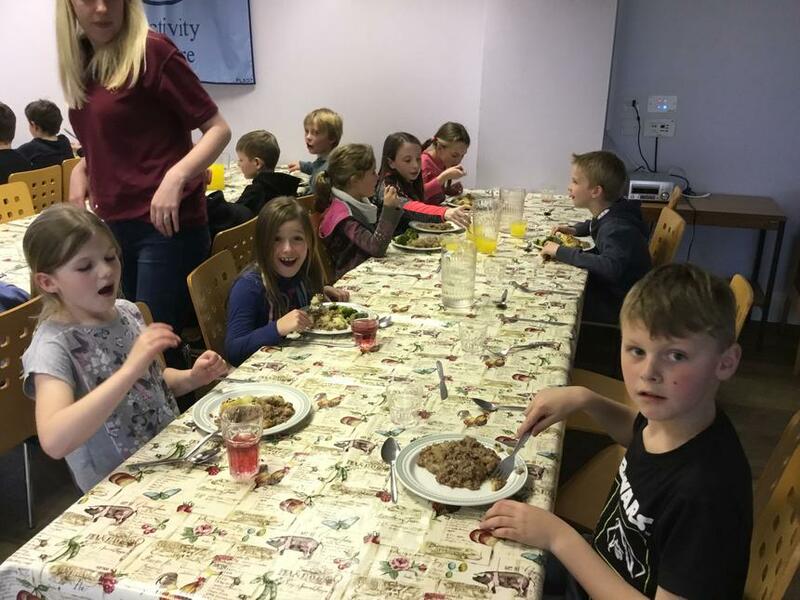 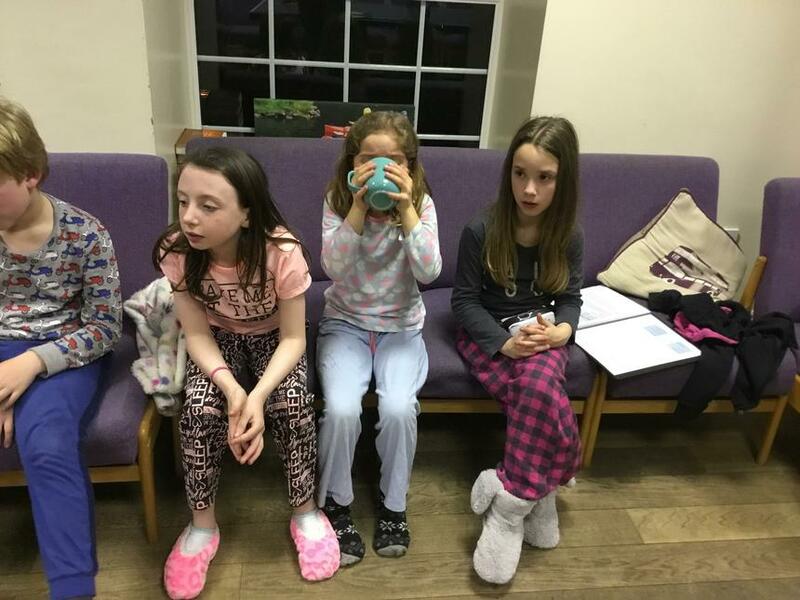 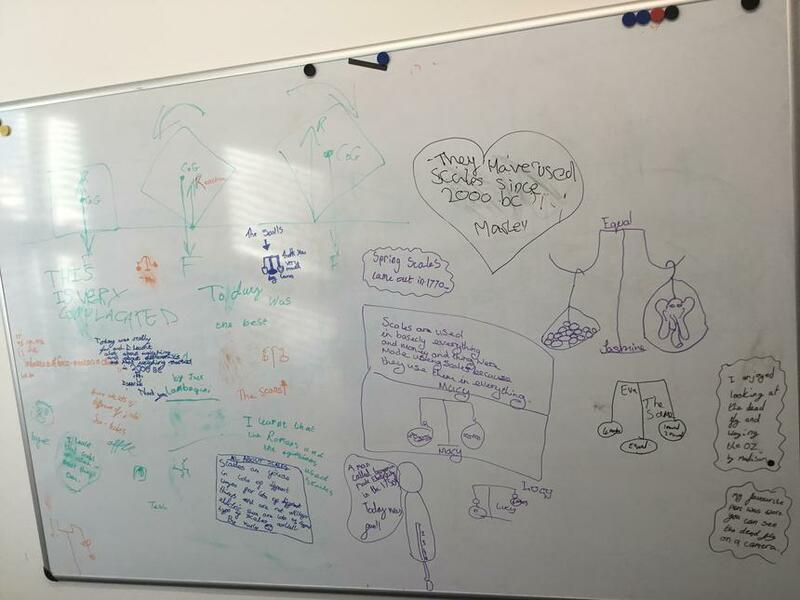 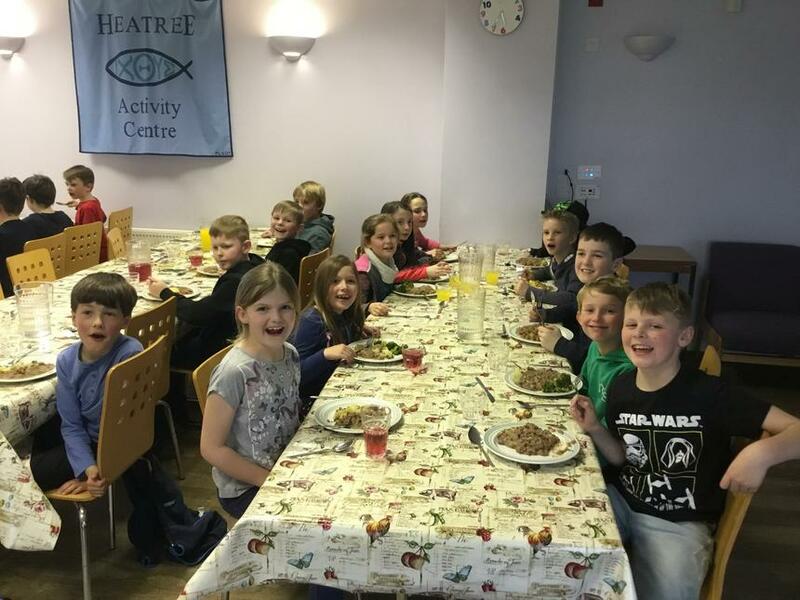 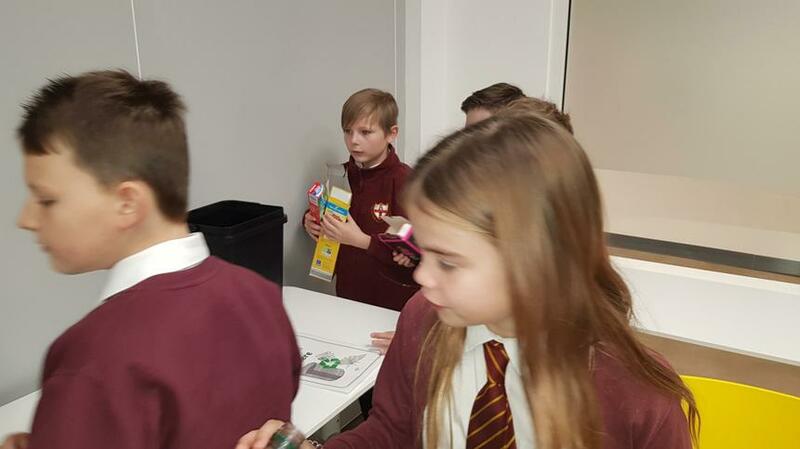 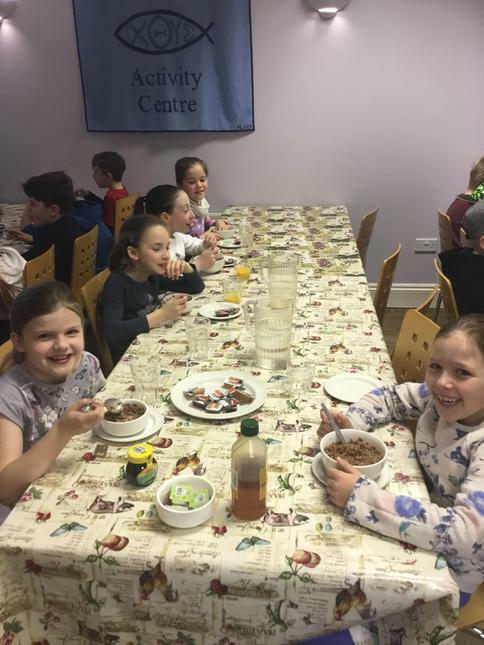 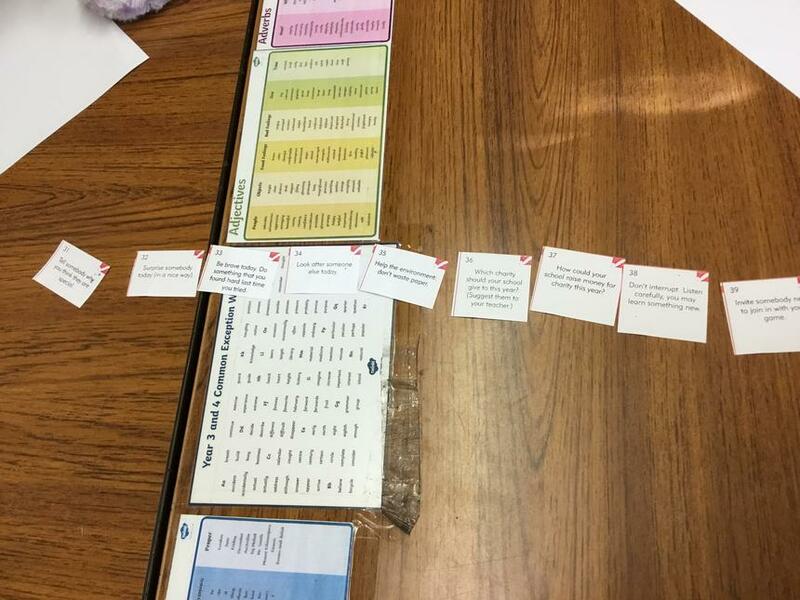 They were then set a budgeting task, where they had £15 to spend in an online supermarket and created a weekly lunch plan, considering the different food groups. 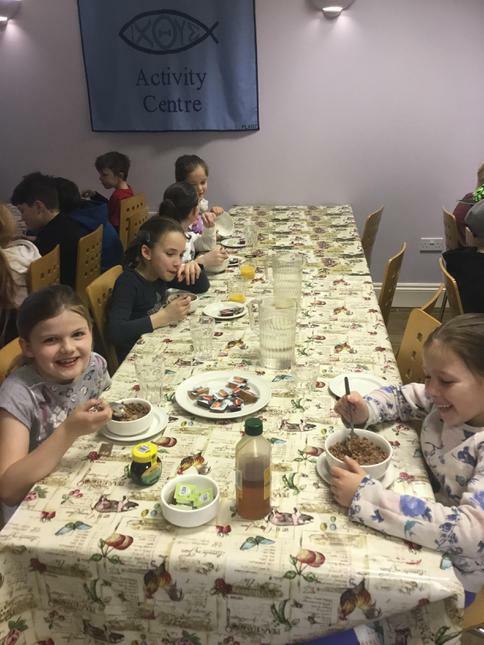 Children were then given the opportunity to make some healthy snacks. 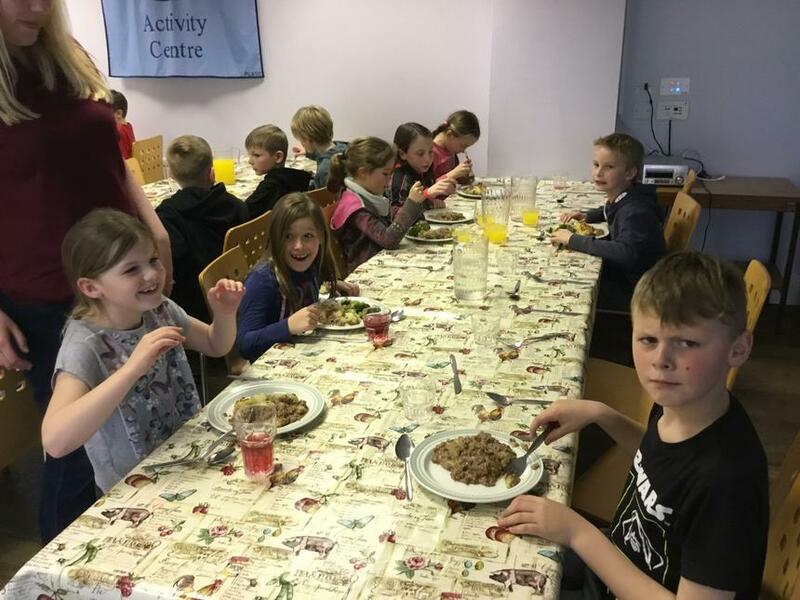 They explored different ingredients, including a variety of salads and made a wrap which they then got to taste. 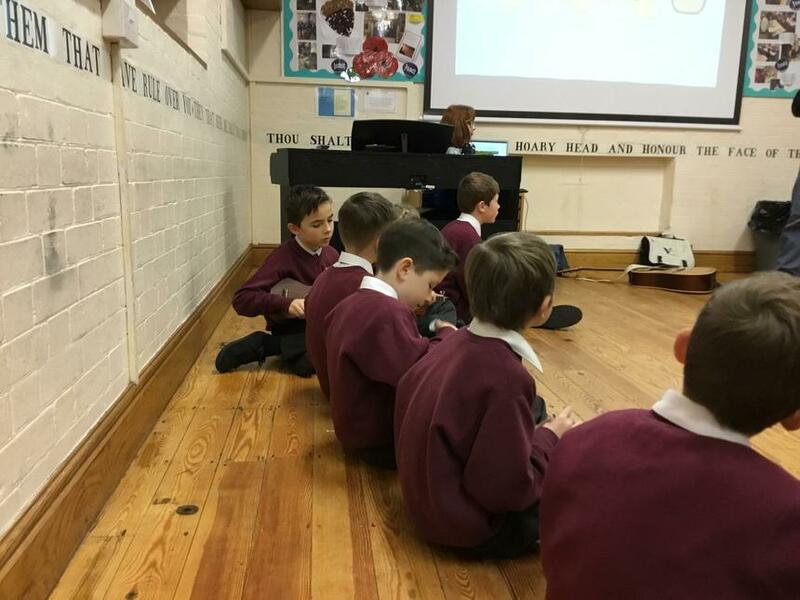 In the afternoon, Class 3 & 4 got together to learn about the importance of exercise on the body. 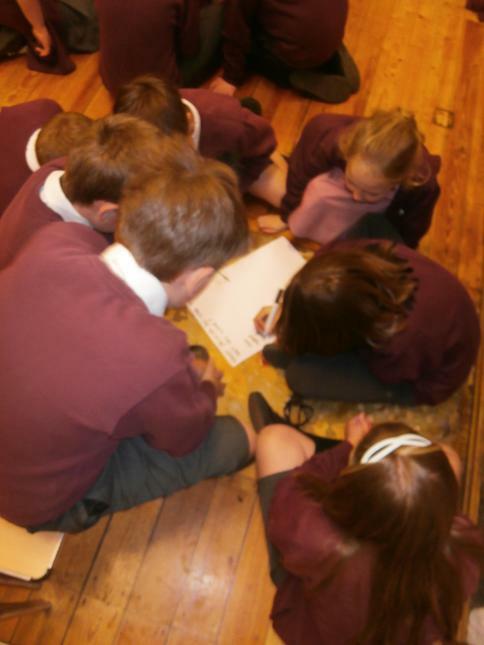 They then tested their memory skills with a series of pictures, exploring how many they could remember in 20 seconds. 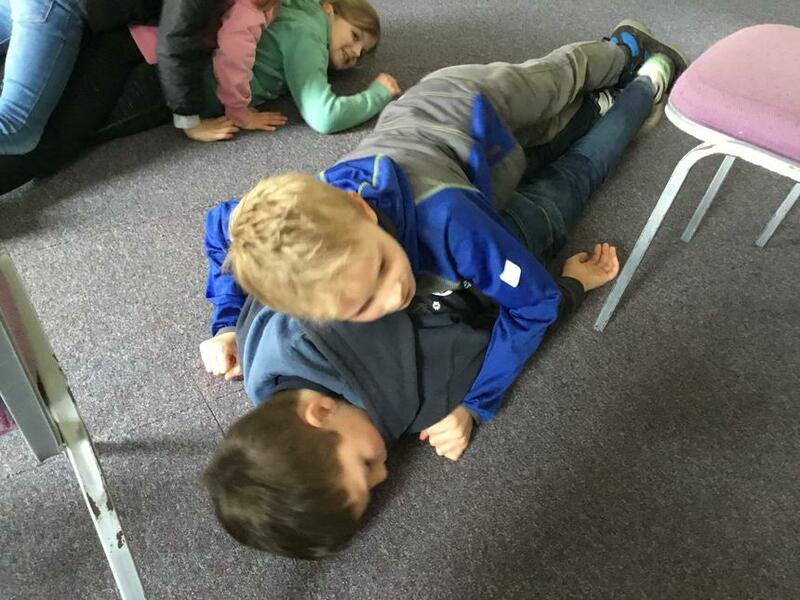 They also learnt how to time their pulse. 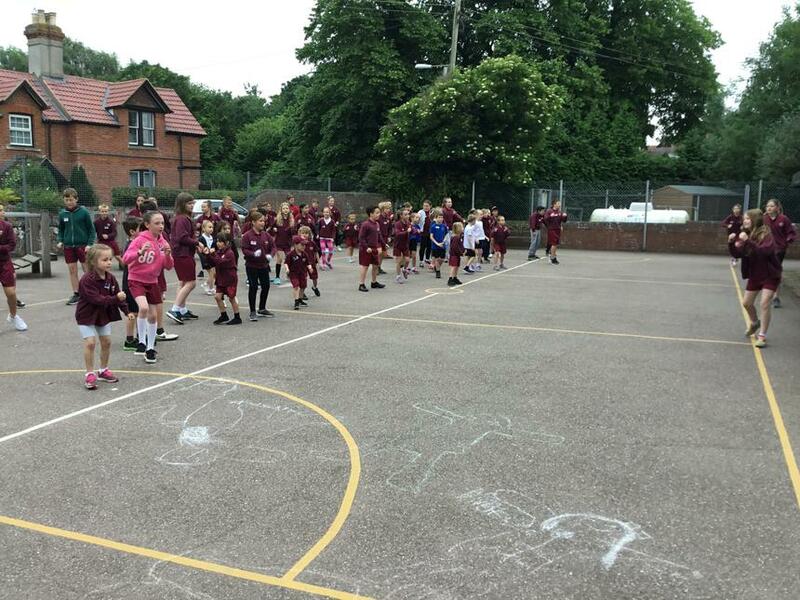 After this, they went outside and completed a series of group exercises to raise their heart beat. 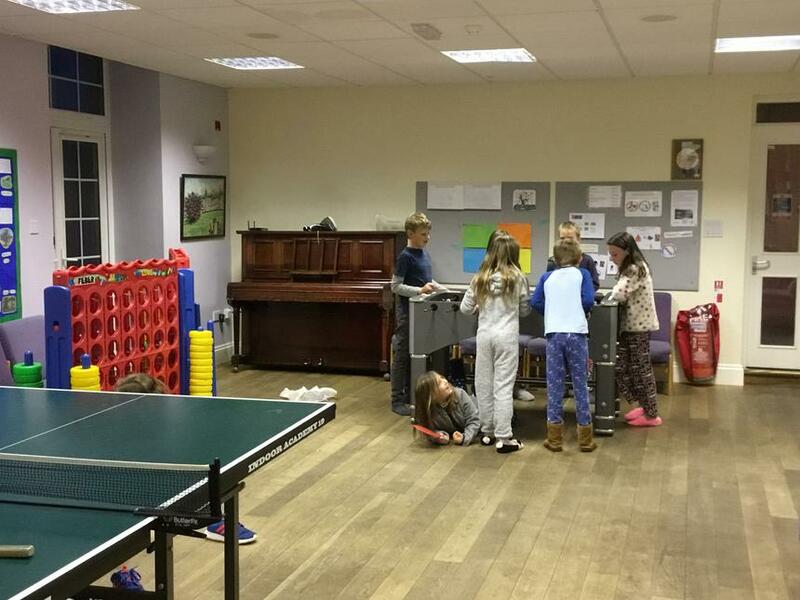 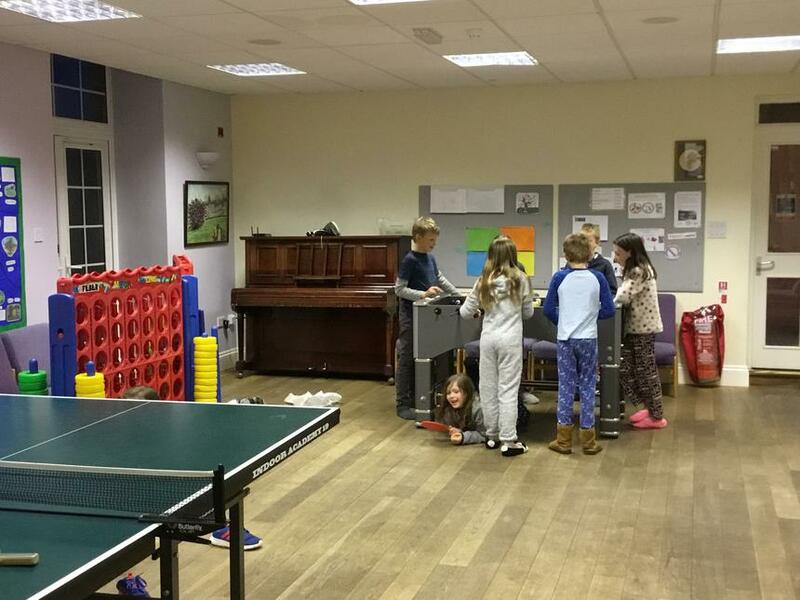 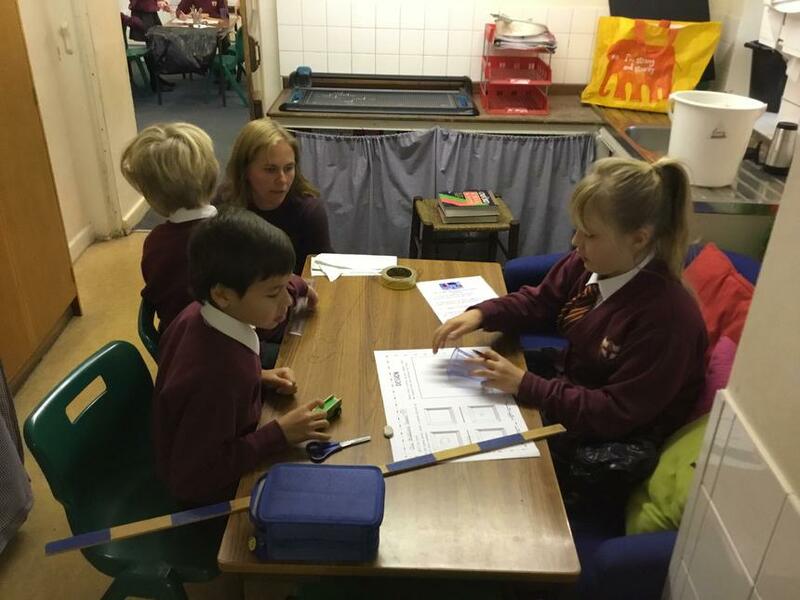 When back indoors, the children then experimented to see whether their memory skills had improved. 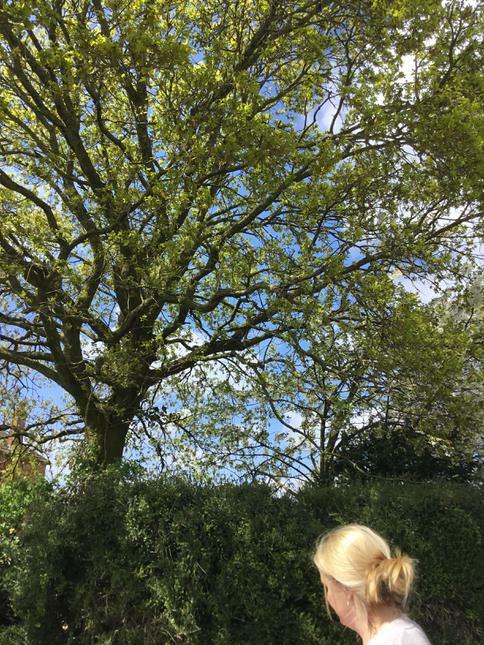 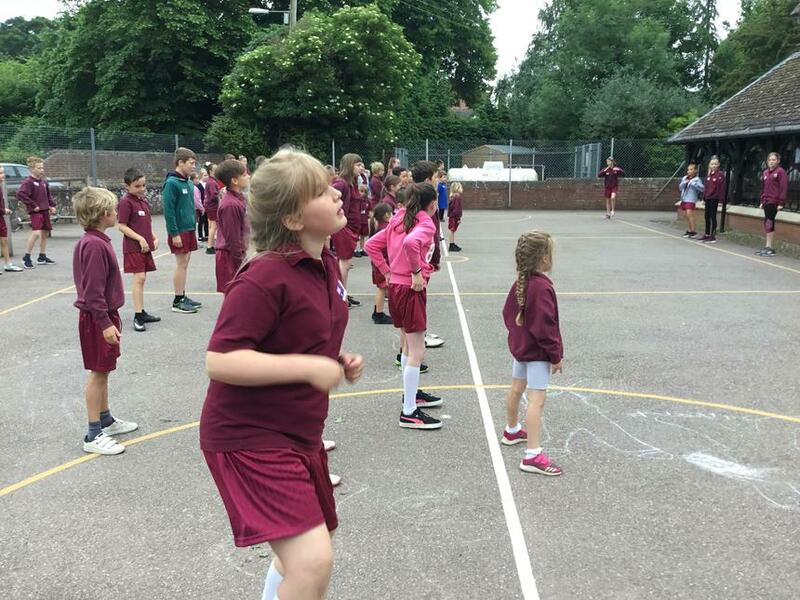 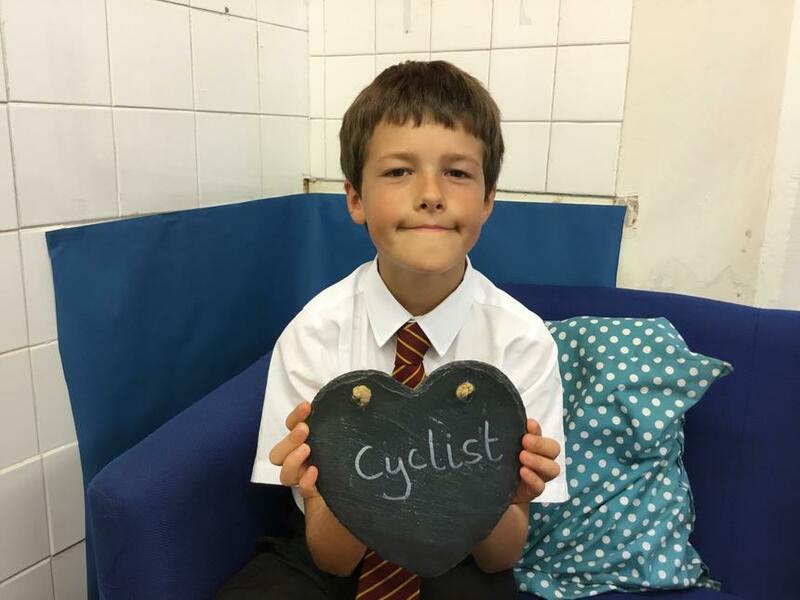 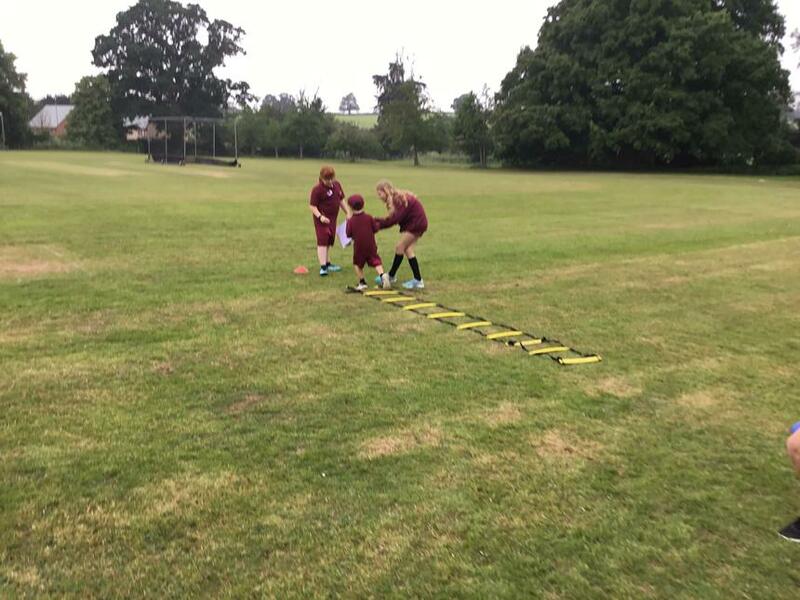 This did in fact work, with many children doubling their previous scores, proving that exercise always has a positive effect on our memory and learning skills. 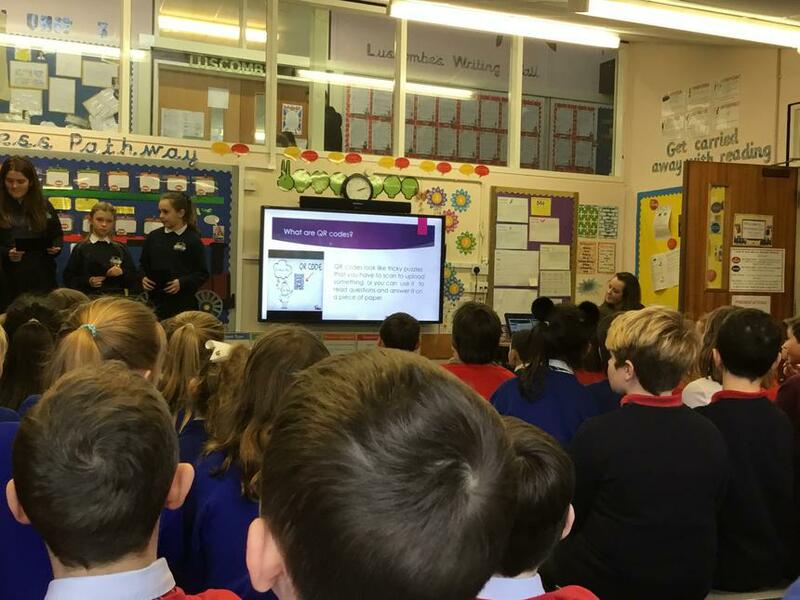 We then welcomed Mrs Esson into our school who kindly delivered a talk on the importance of healthy eating and keeping our teeth and gums clean. 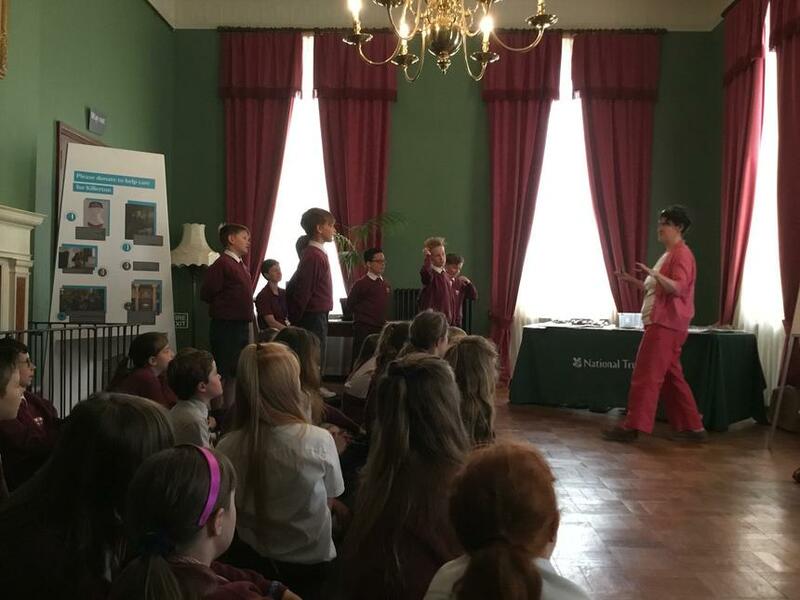 The children were asked to chew a plaque tablet to highlight any plaque that may be on their teeth and then were taught the techniques of brushing key areas in our mouth. 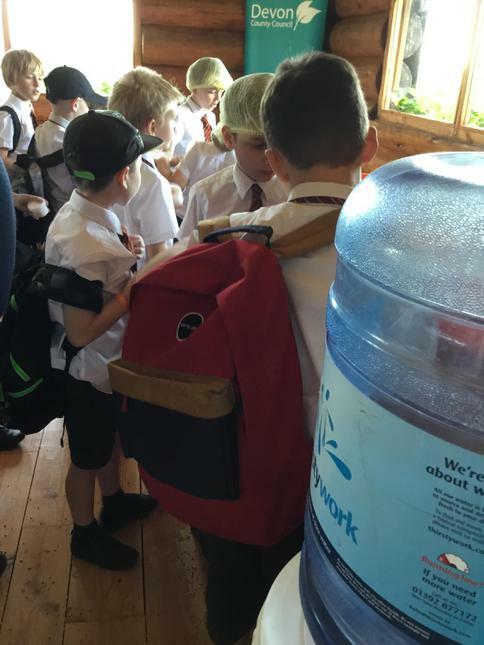 The children were all provided with a new toothbrush and toothpaste. 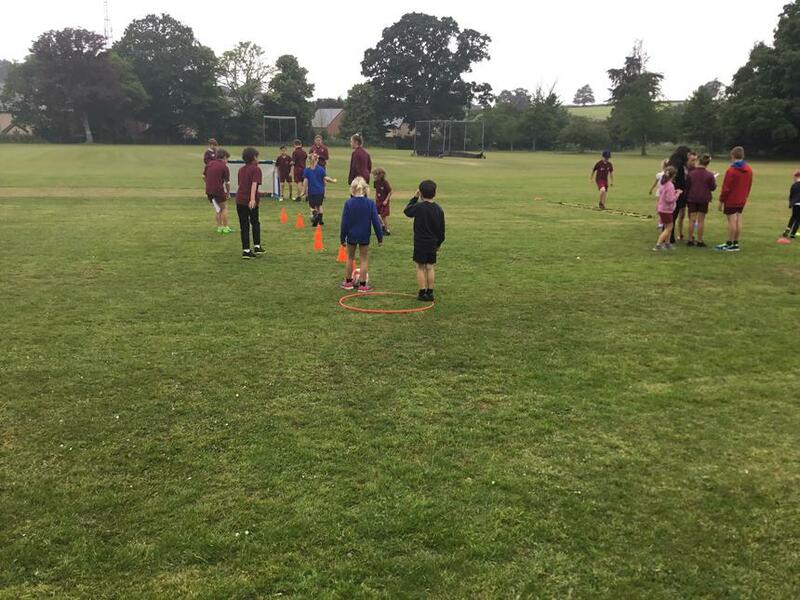 We would like to say a huge thank you to Mr Tyrell and Mrs Esson for their fantastic lessons which the children all enjoyed. 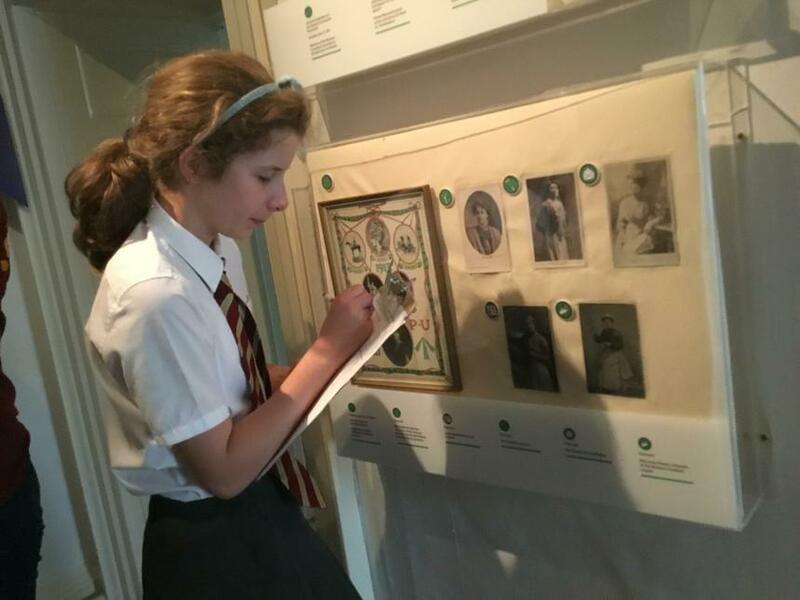 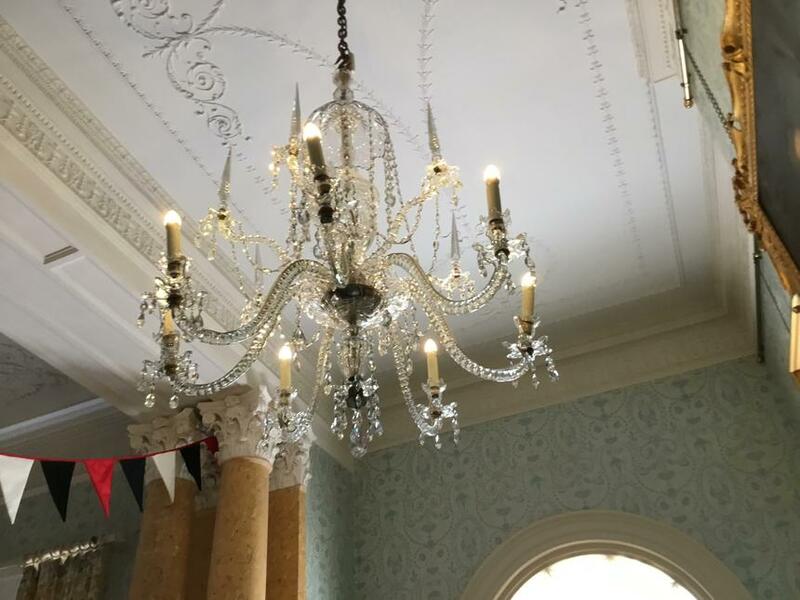 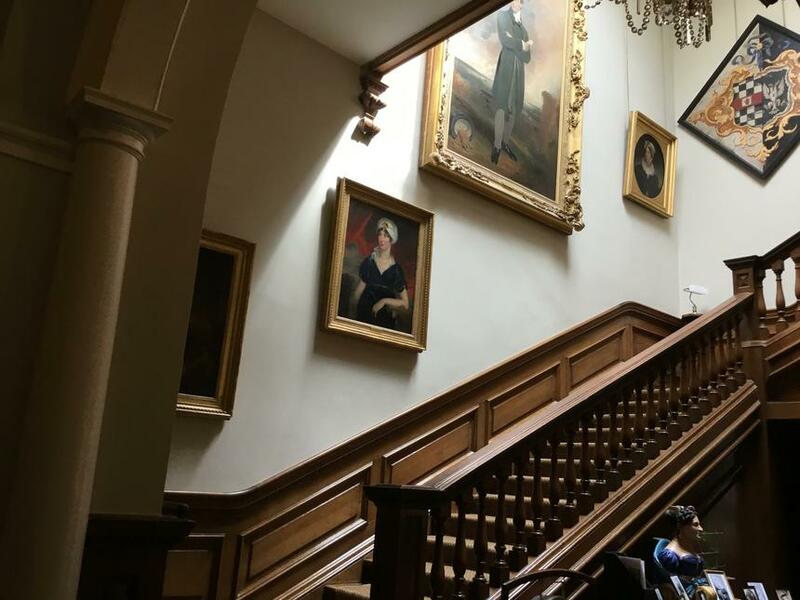 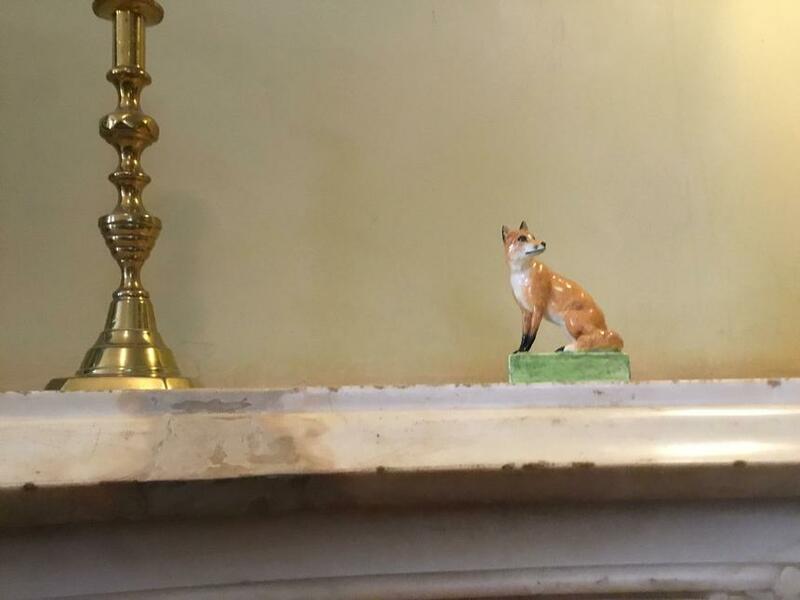 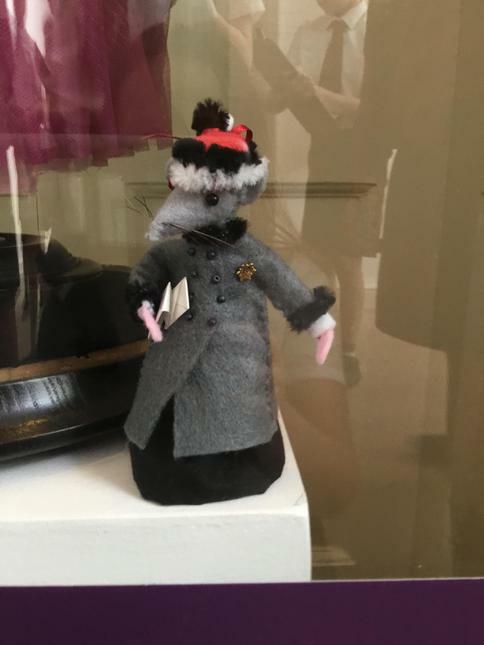 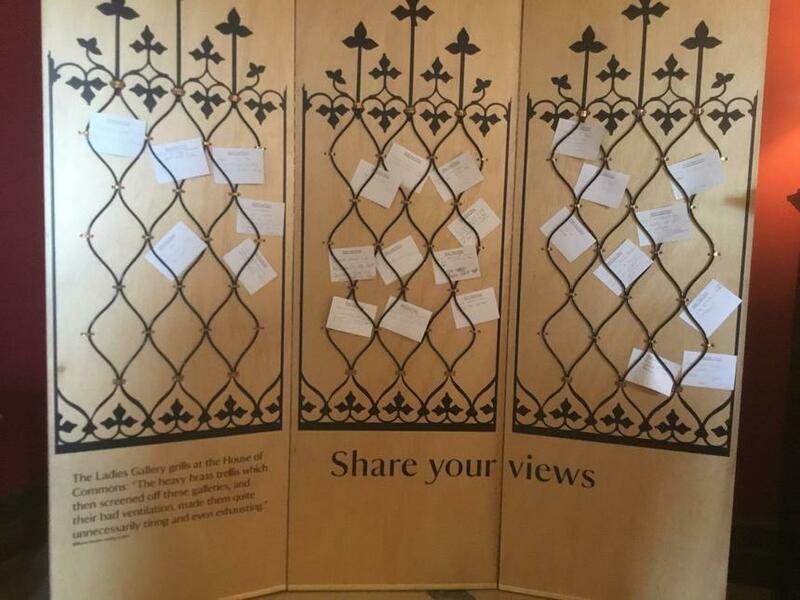 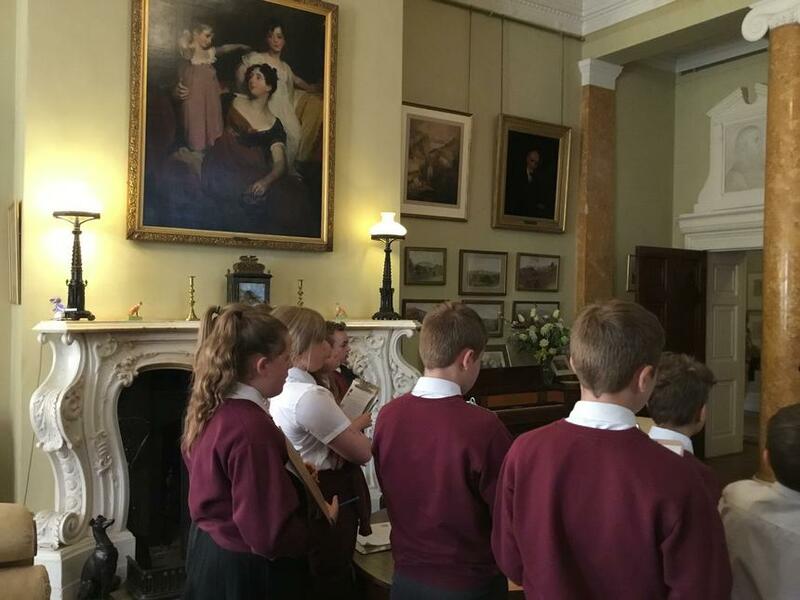 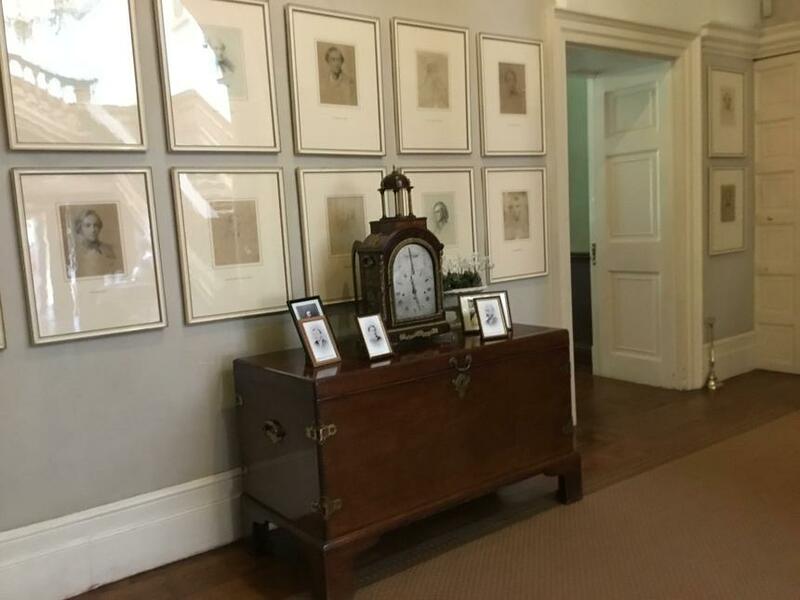 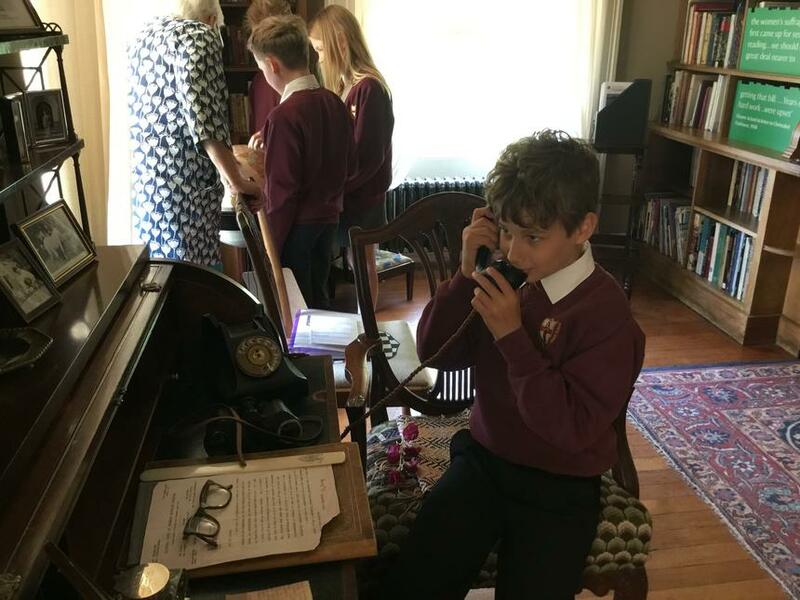 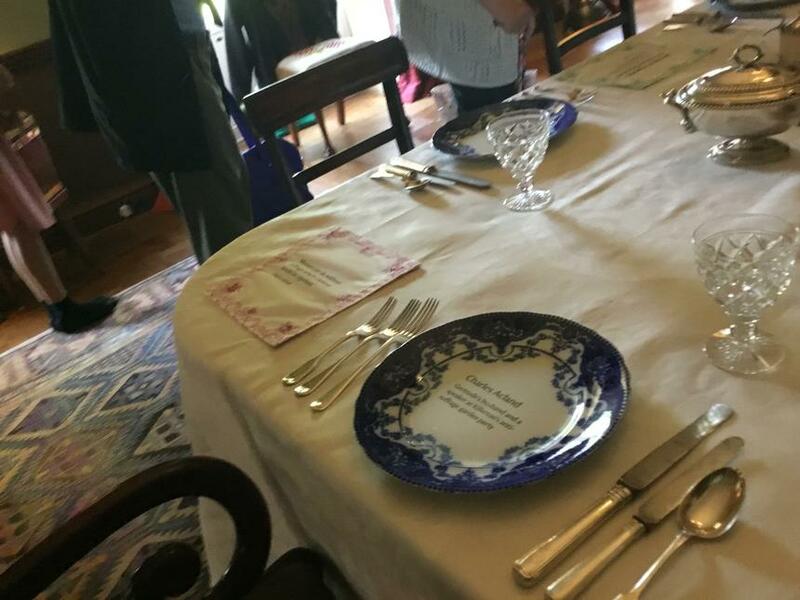 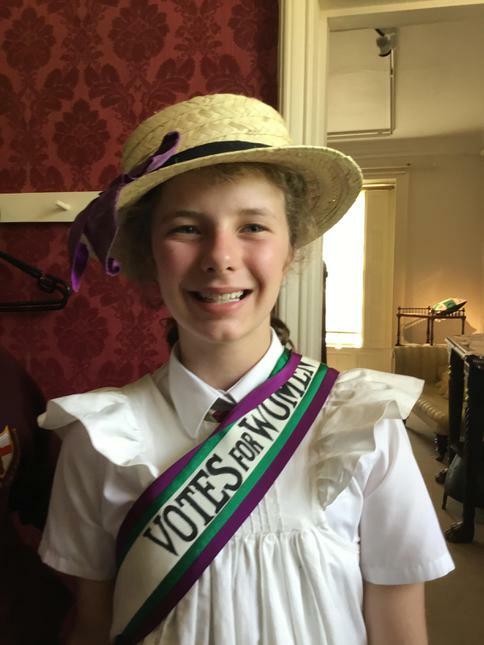 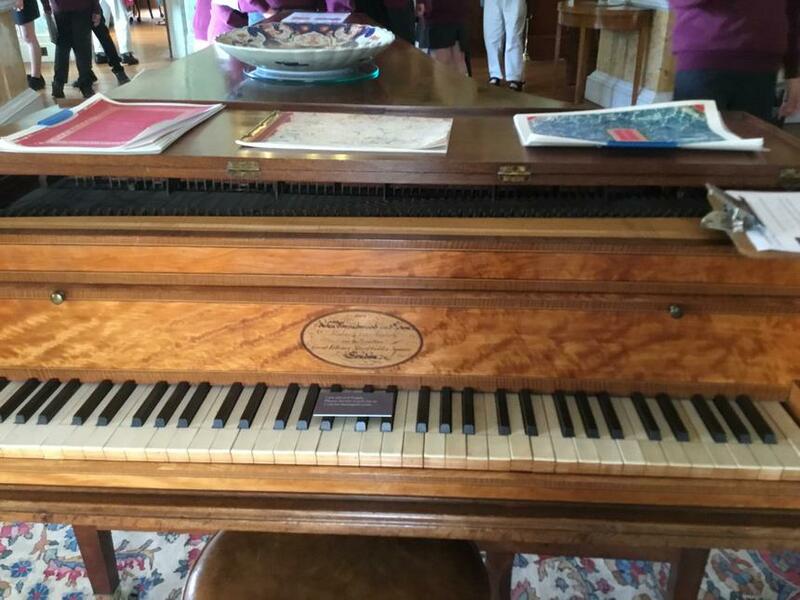 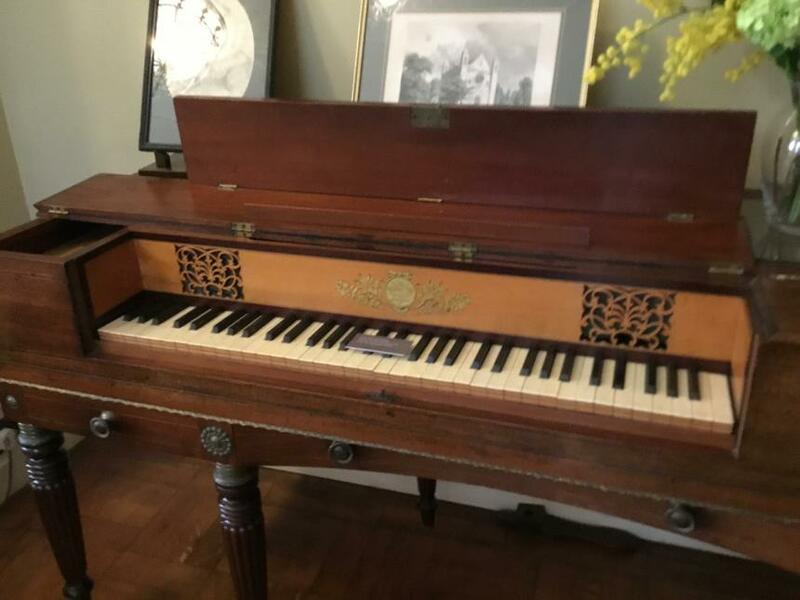 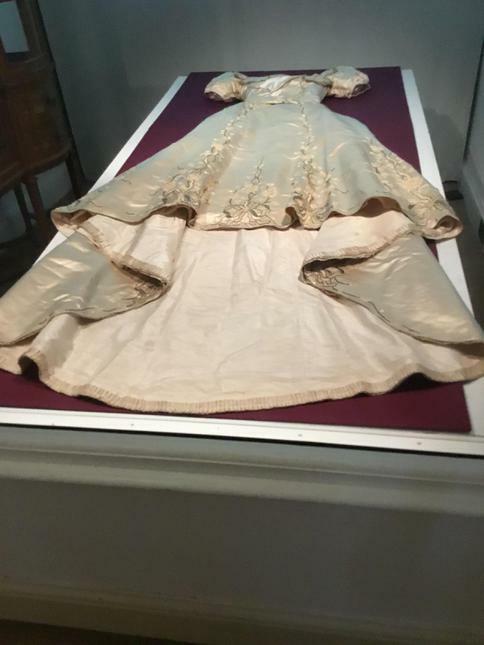 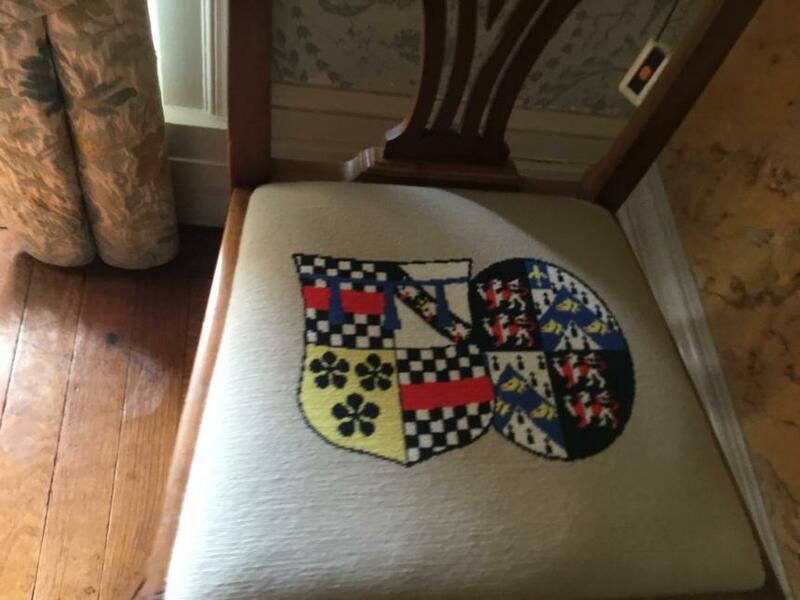 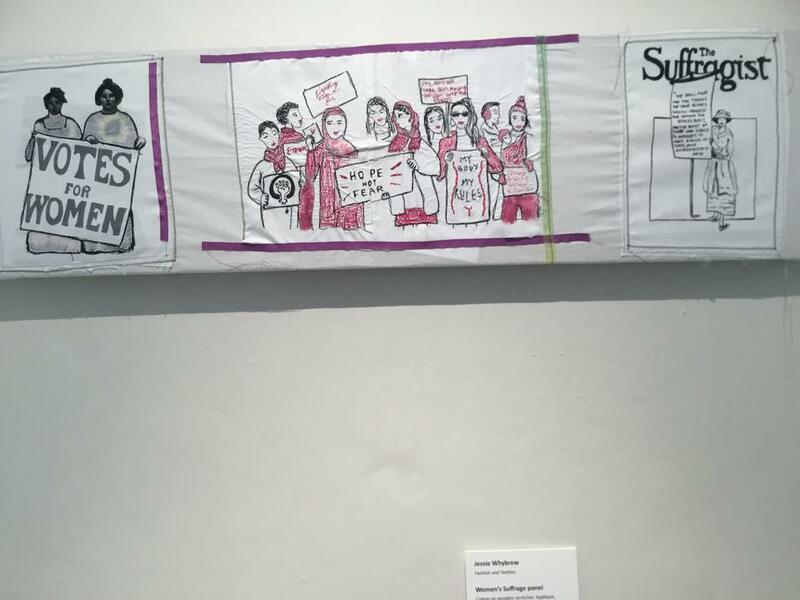 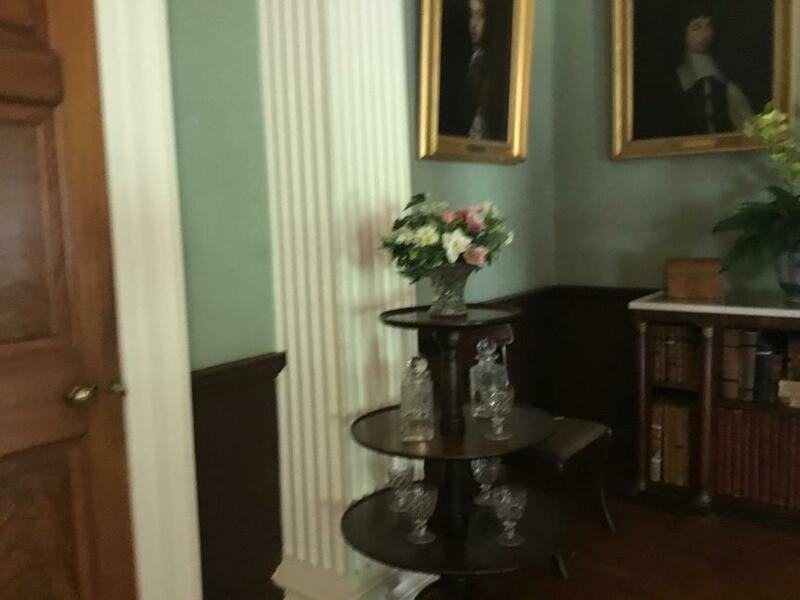 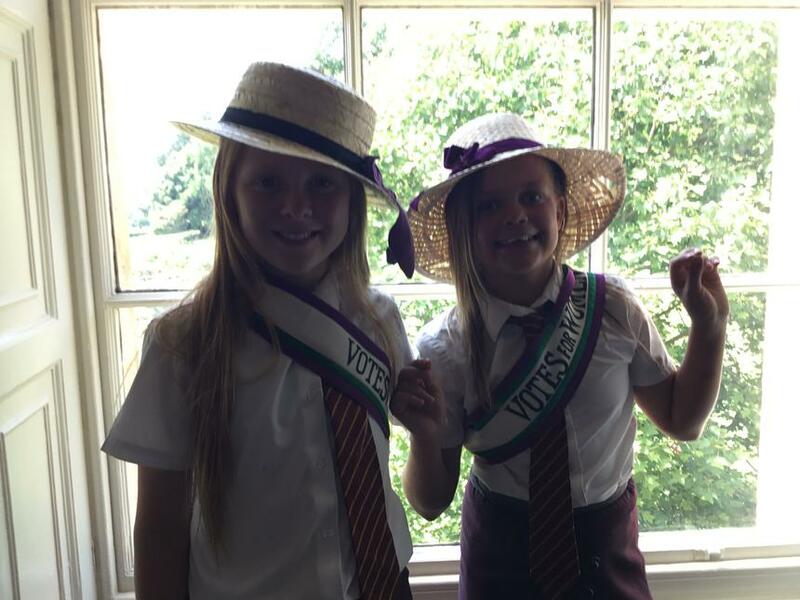 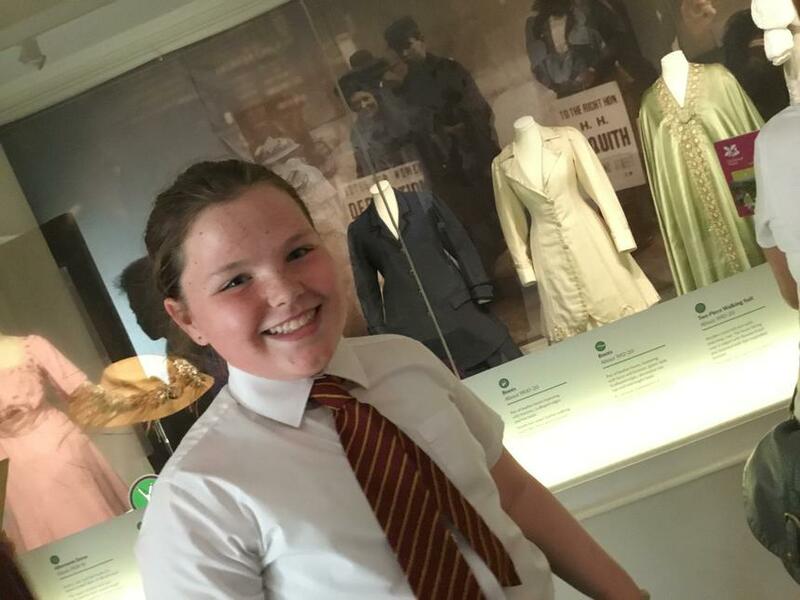 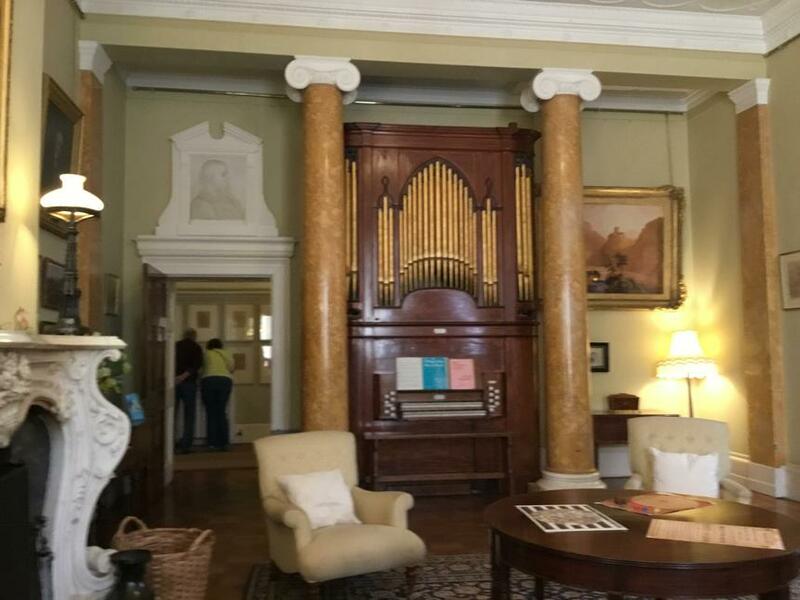 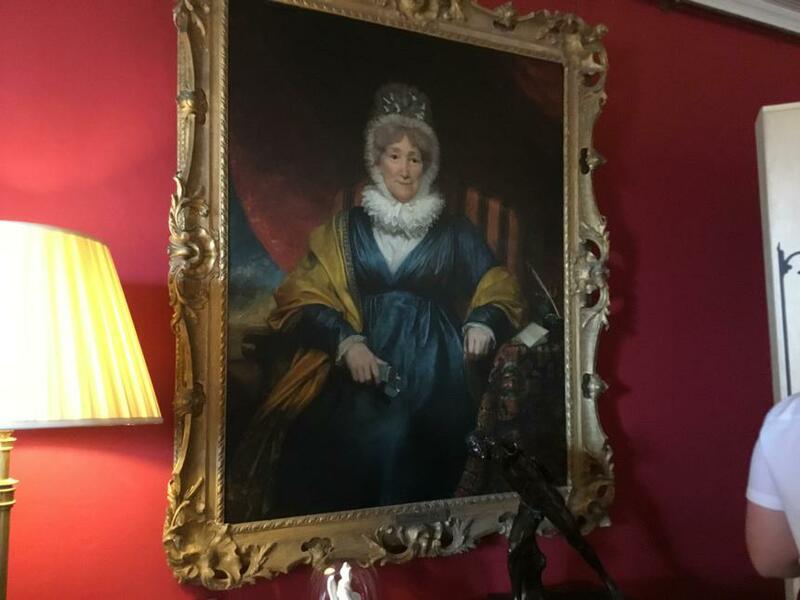 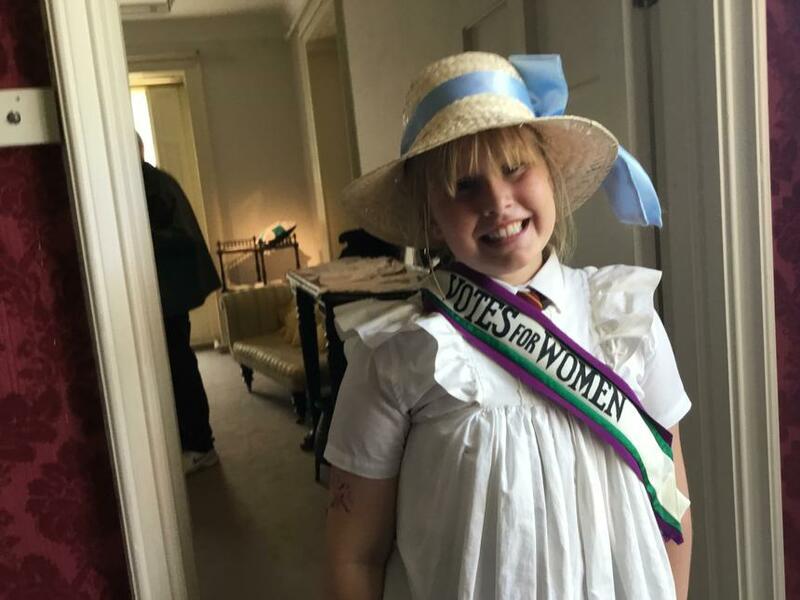 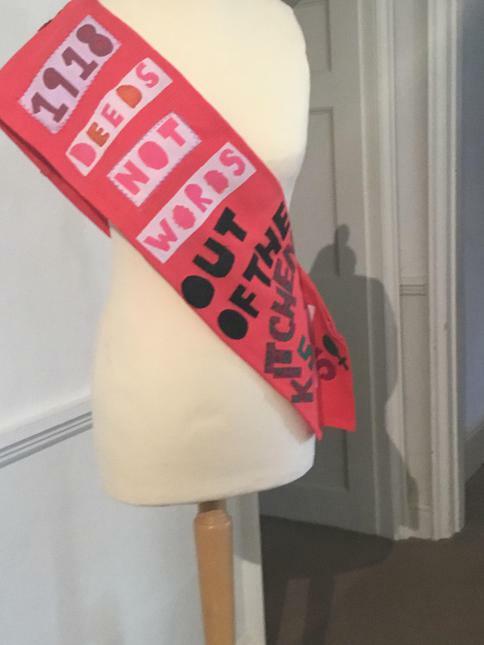 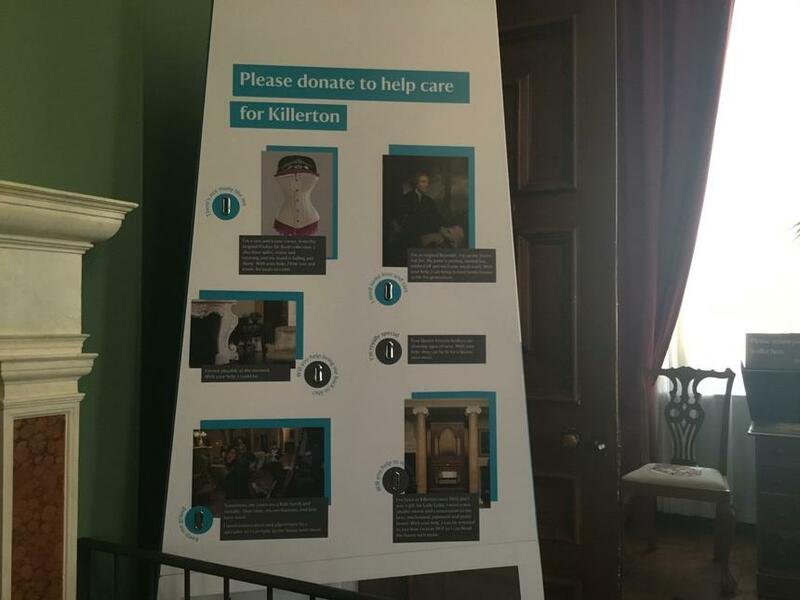 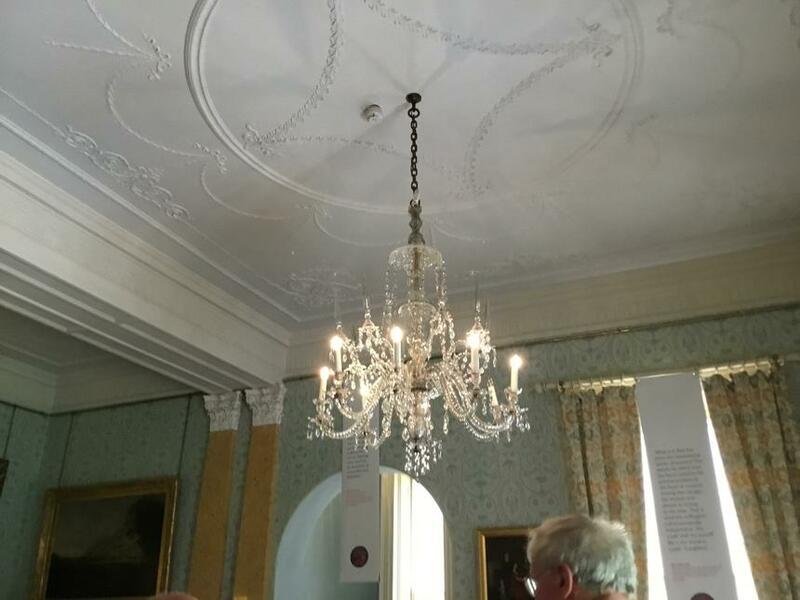 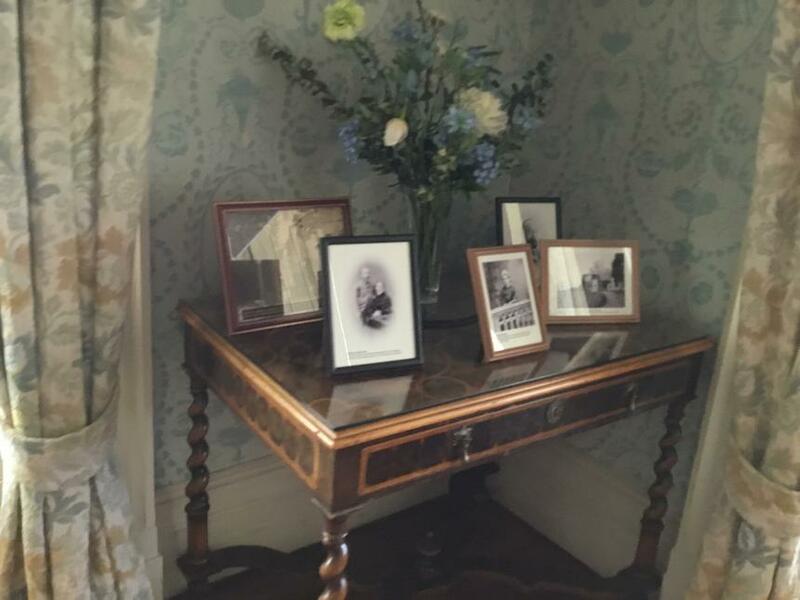 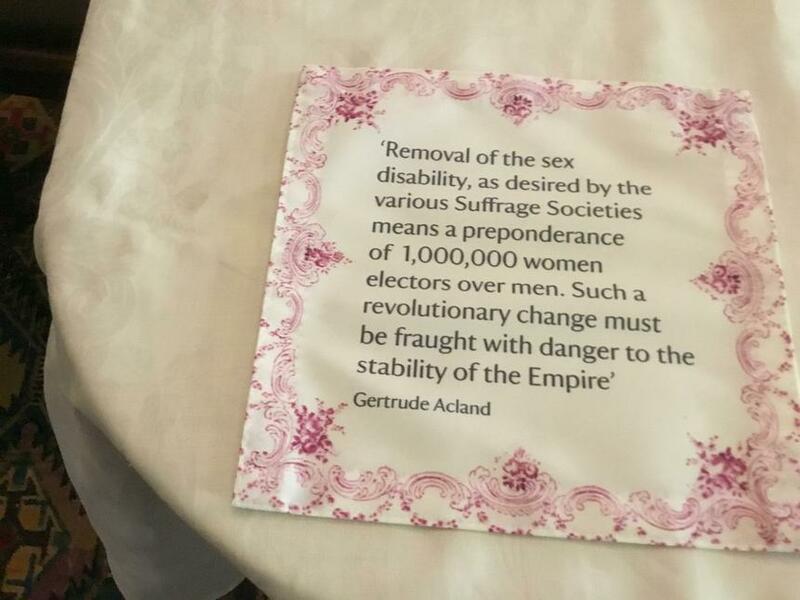 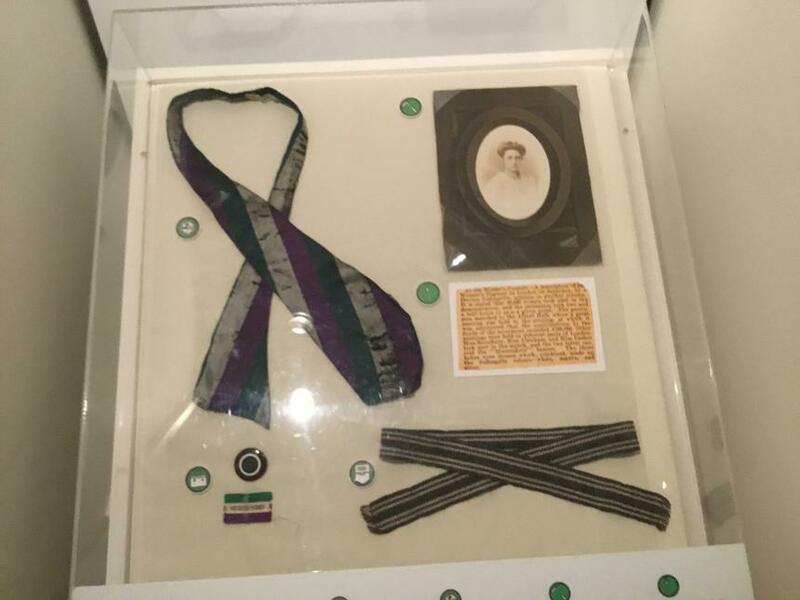 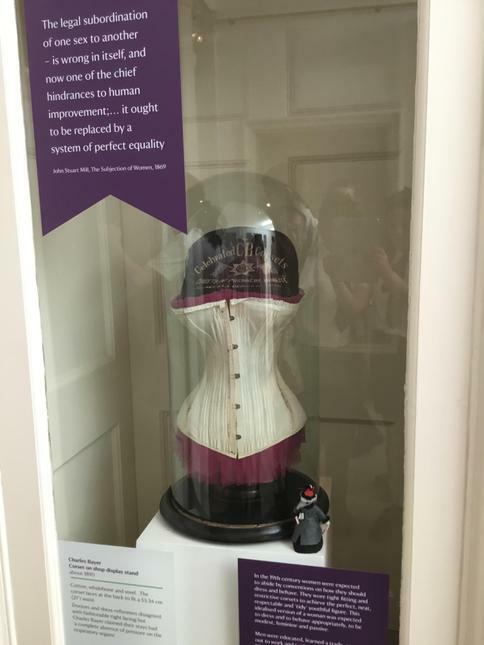 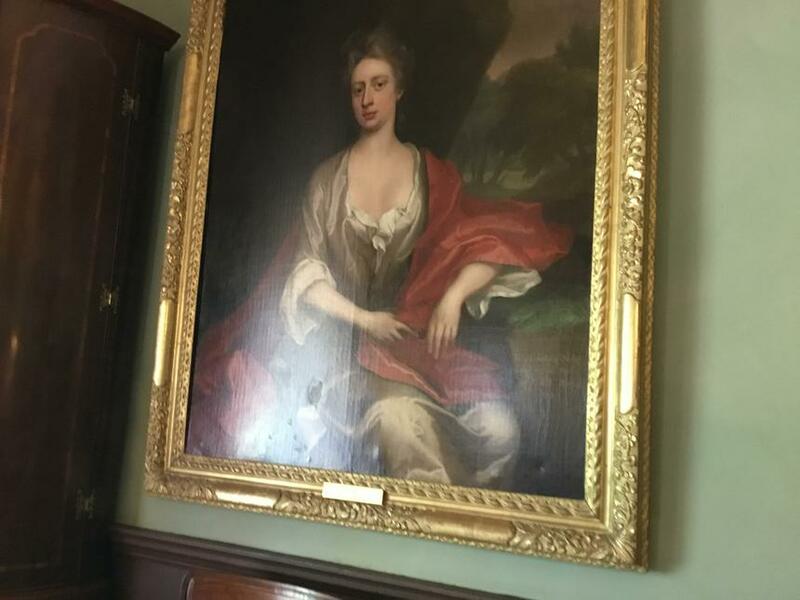 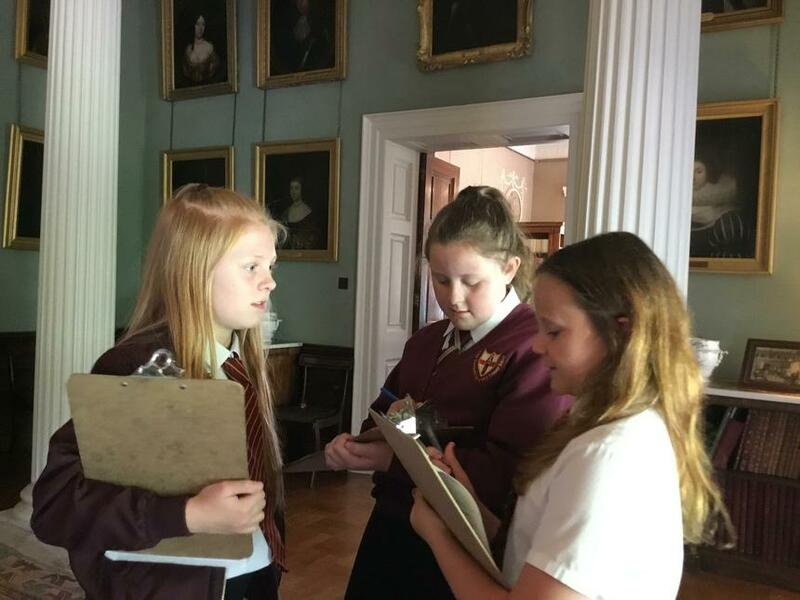 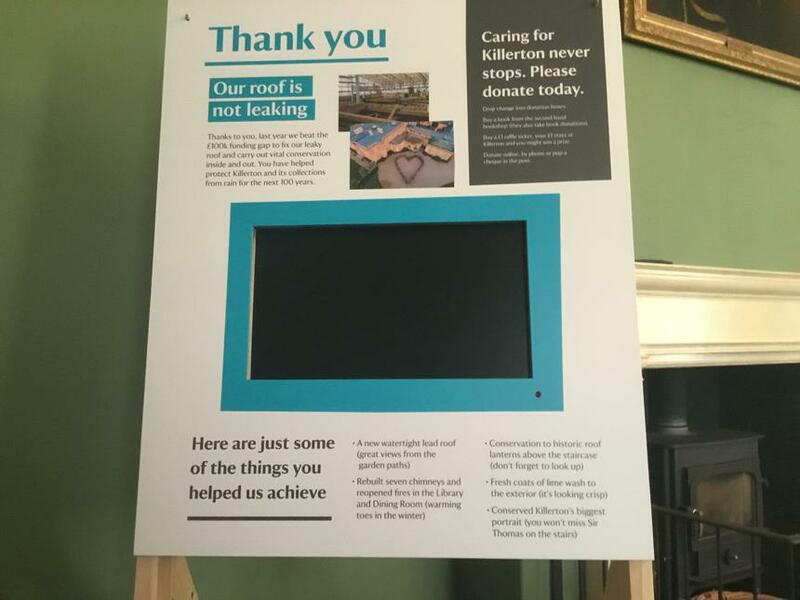 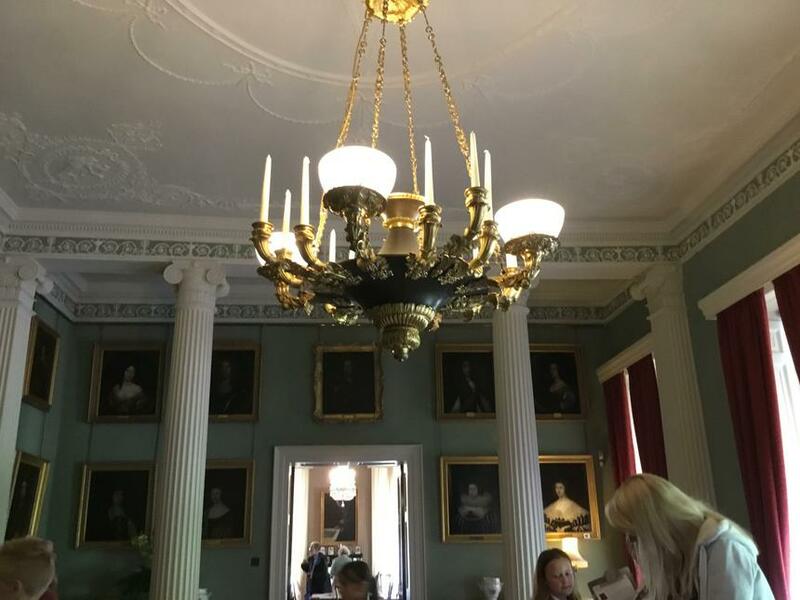 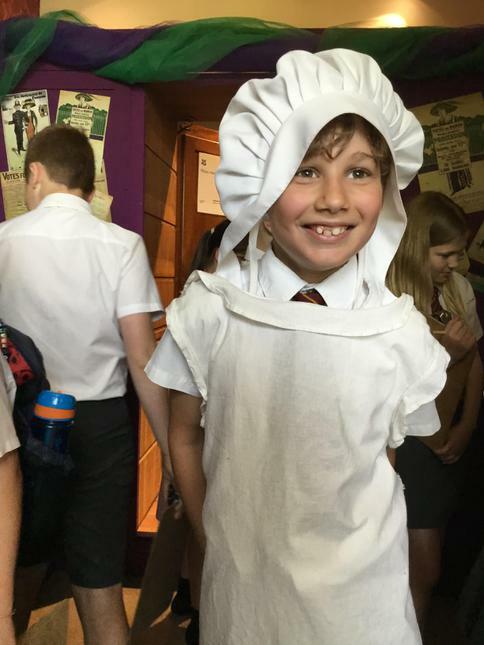 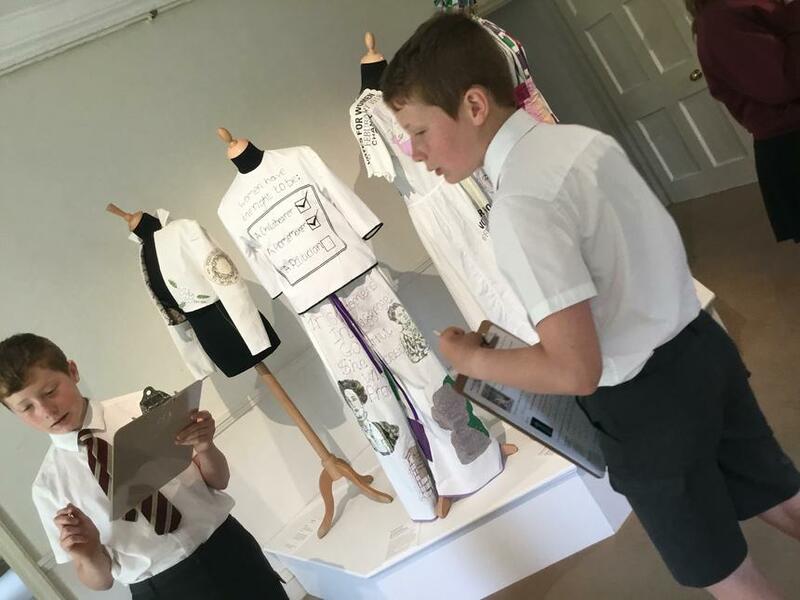 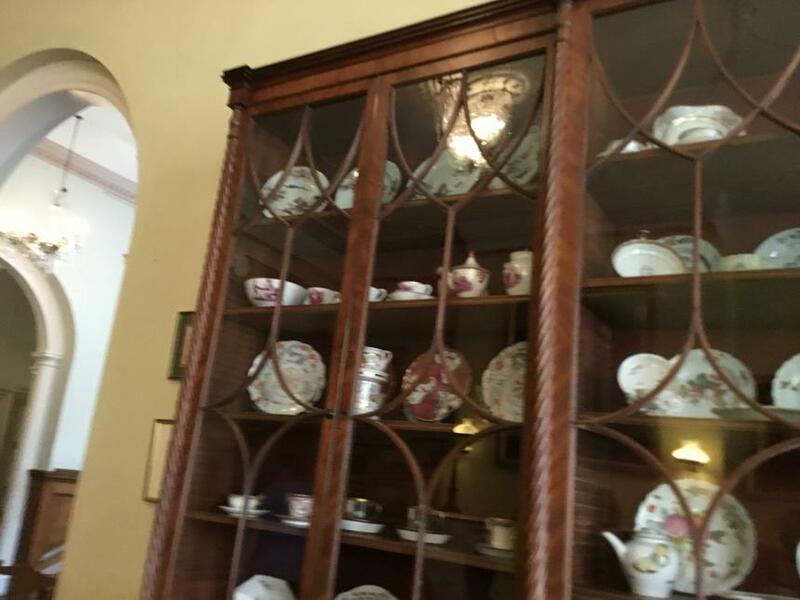 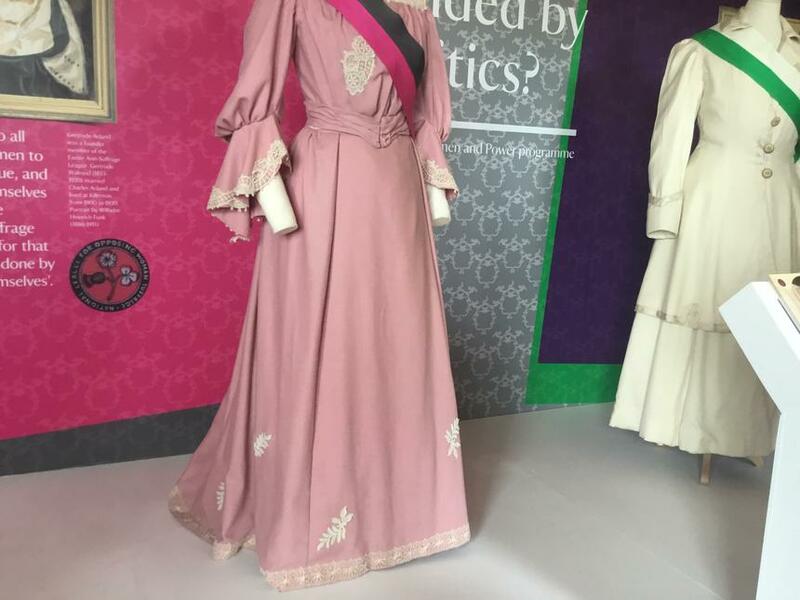 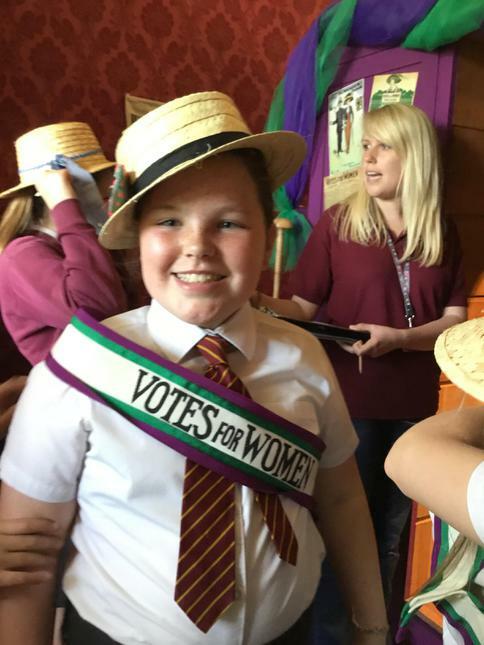 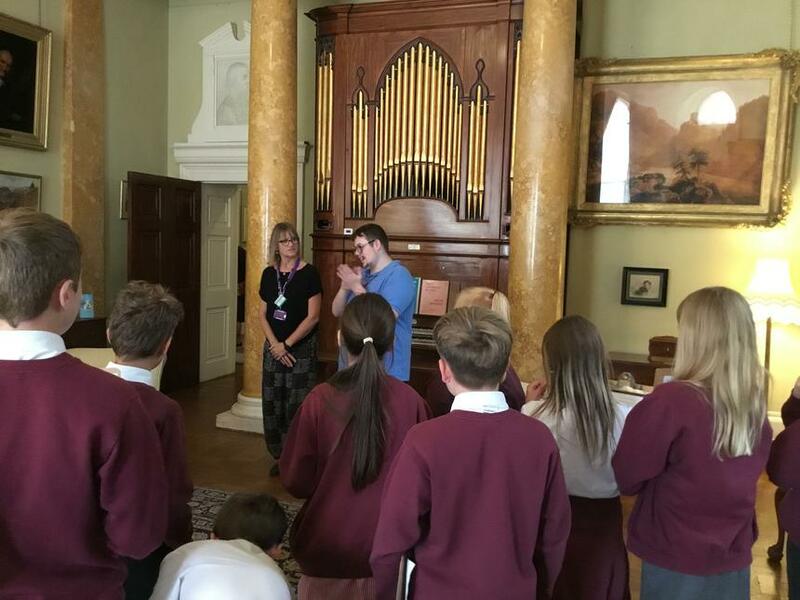 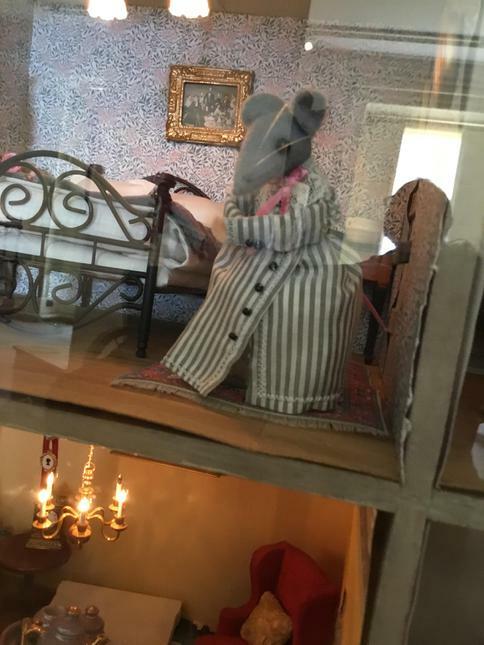 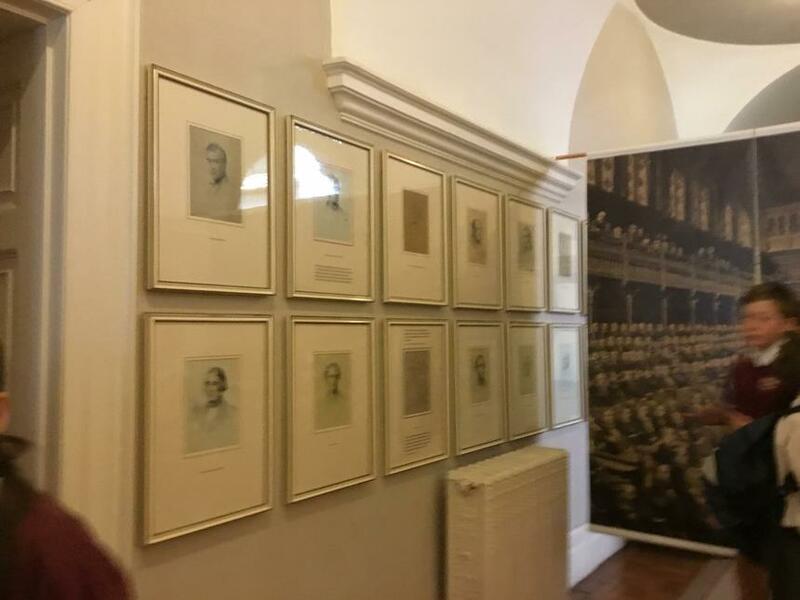 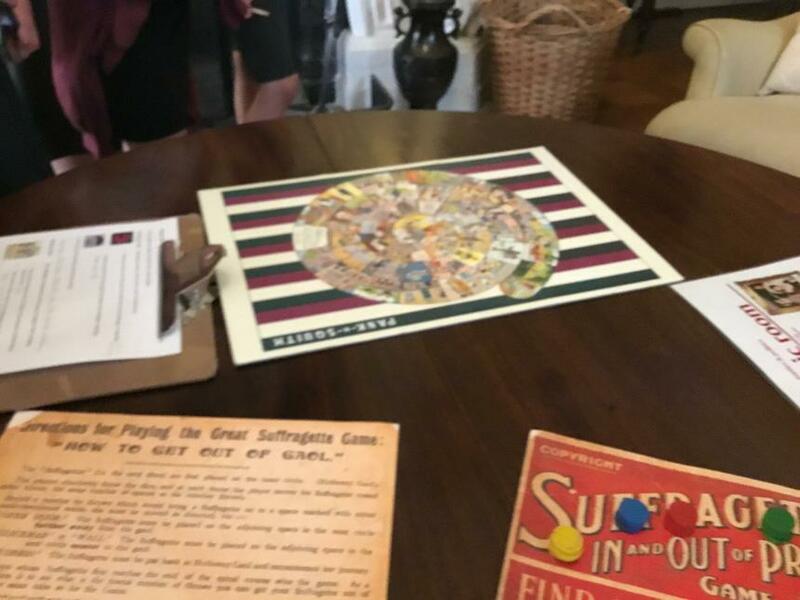 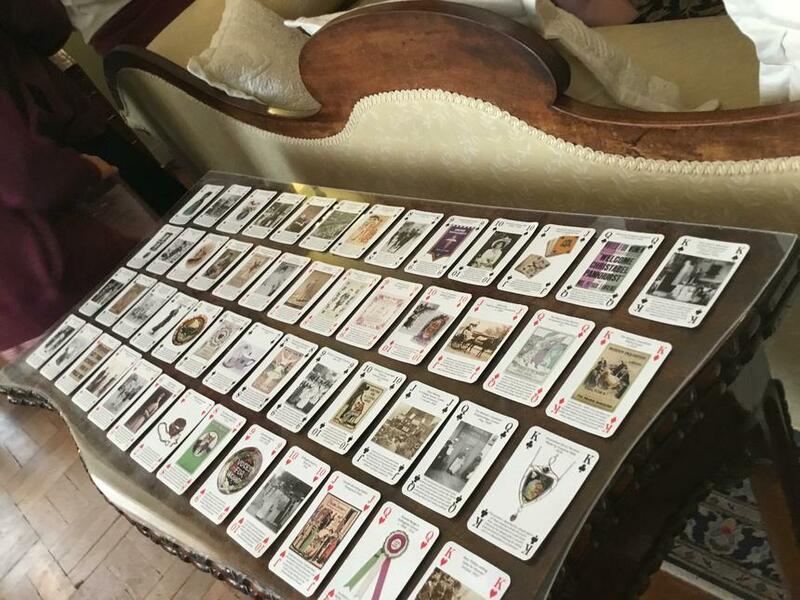 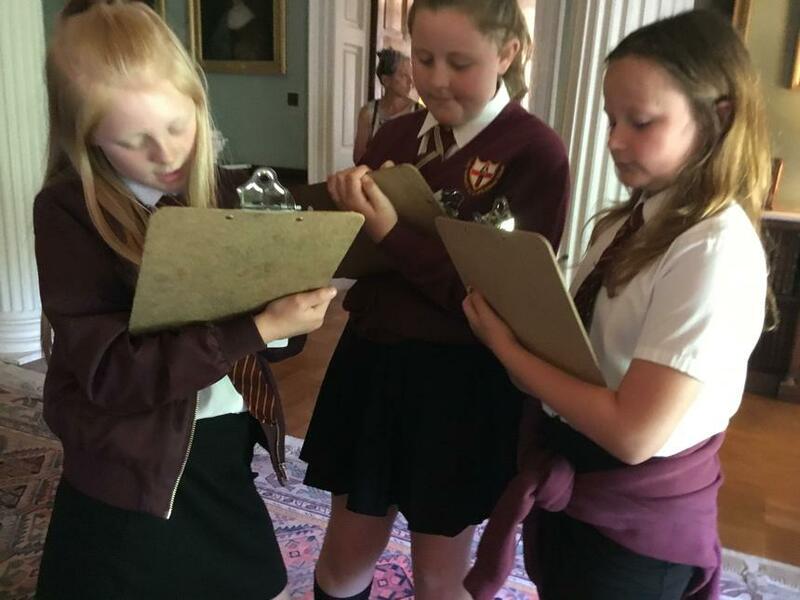 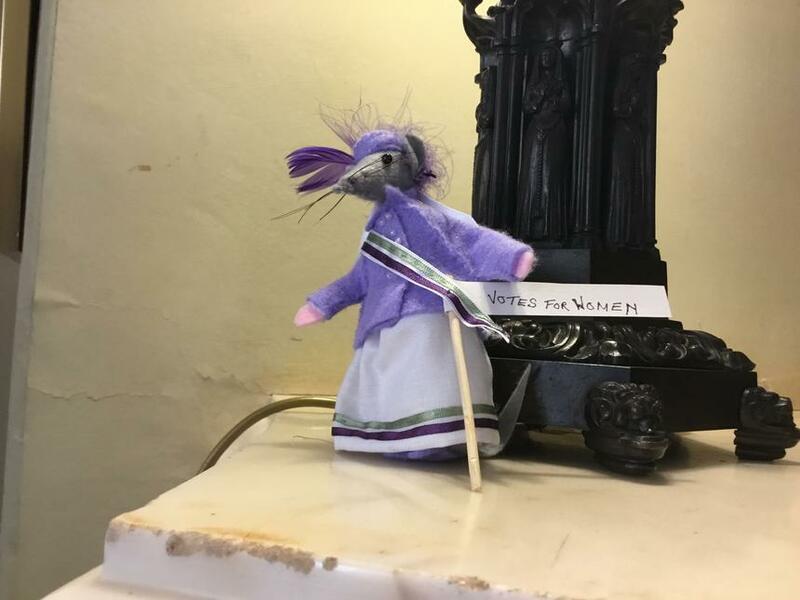 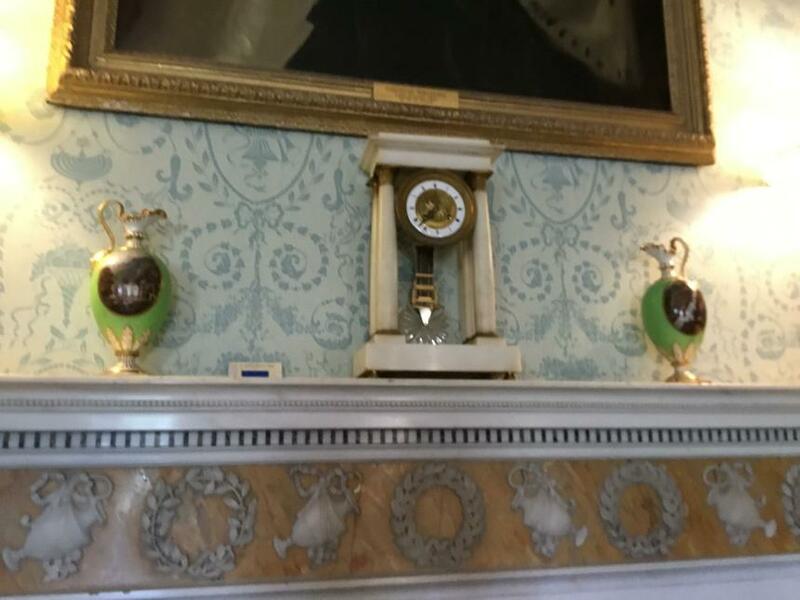 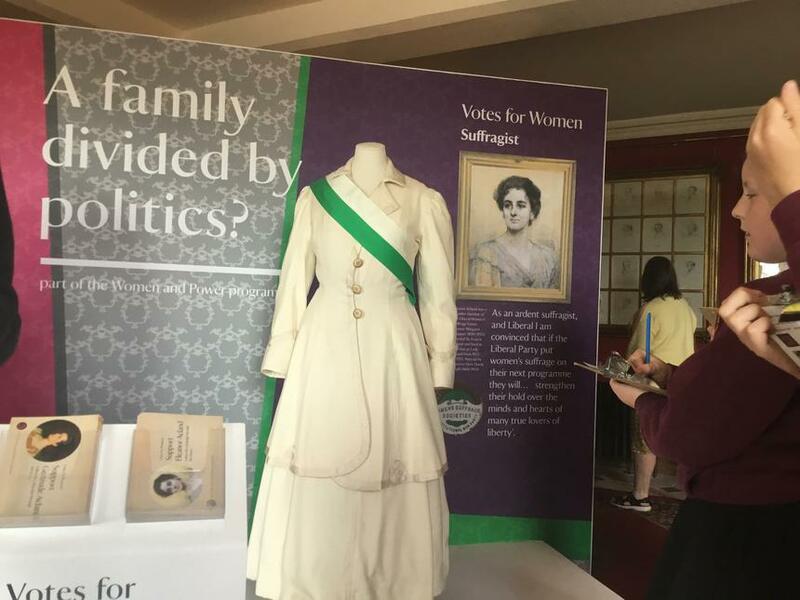 Year 5 & 6 were given the opportunity to visit Killerton in order to explore their new exhibition on Women’s suffrage. 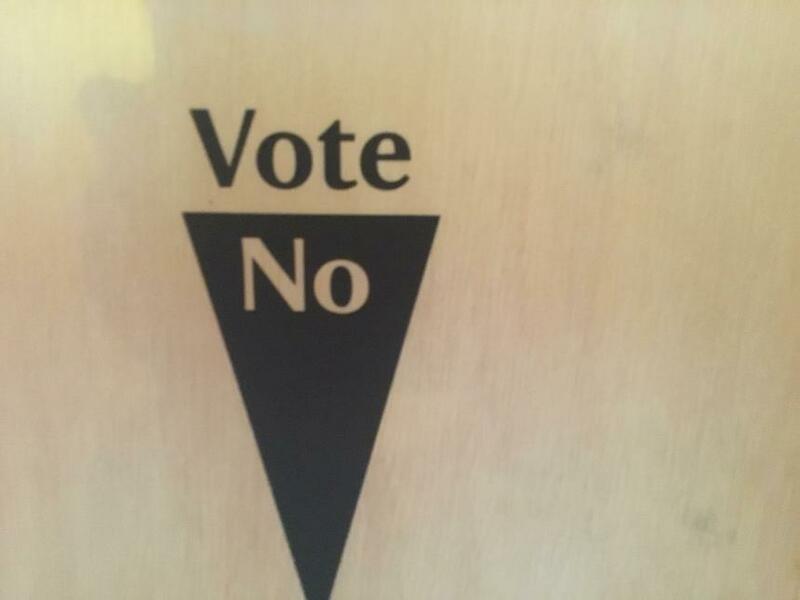 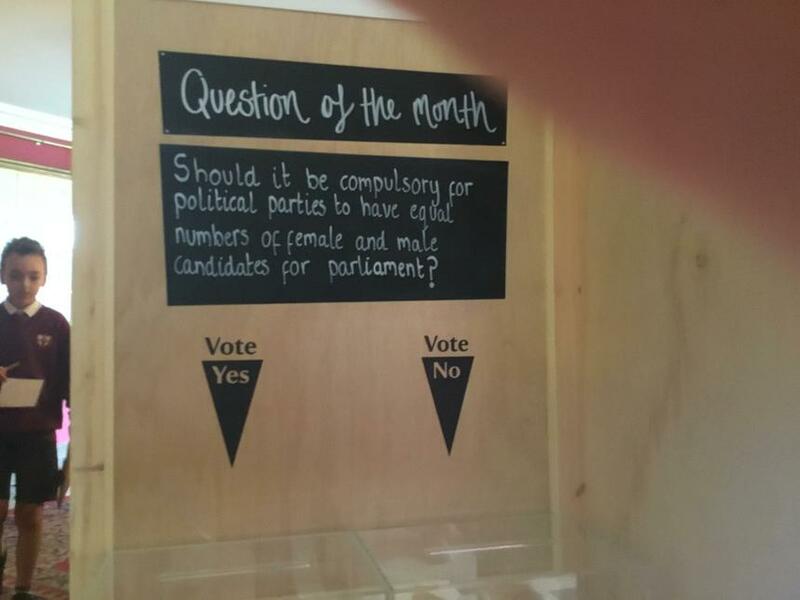 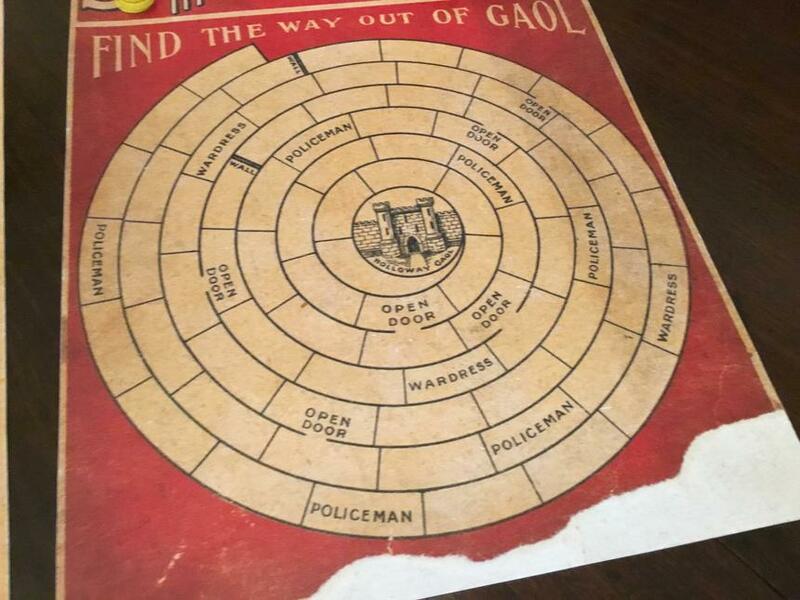 The children found this topic really interesting and were shocked at the policies that used to be in place for women and men. 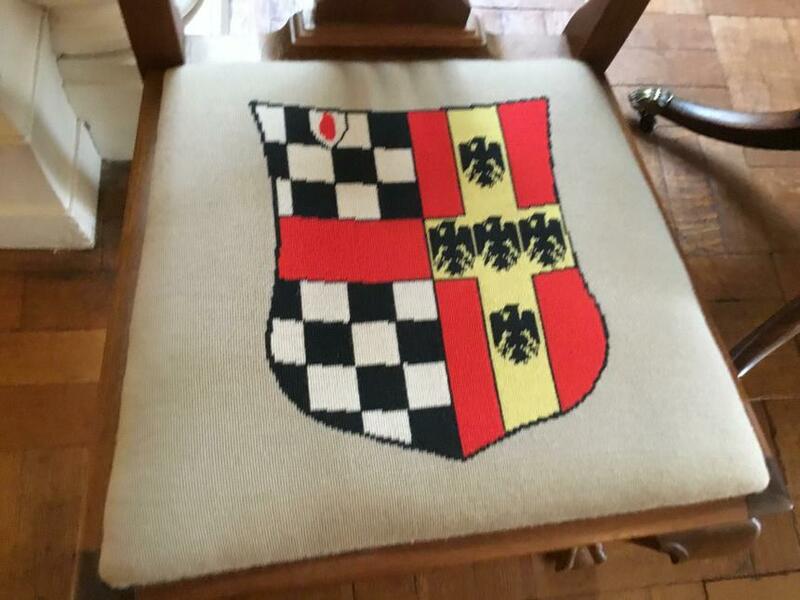 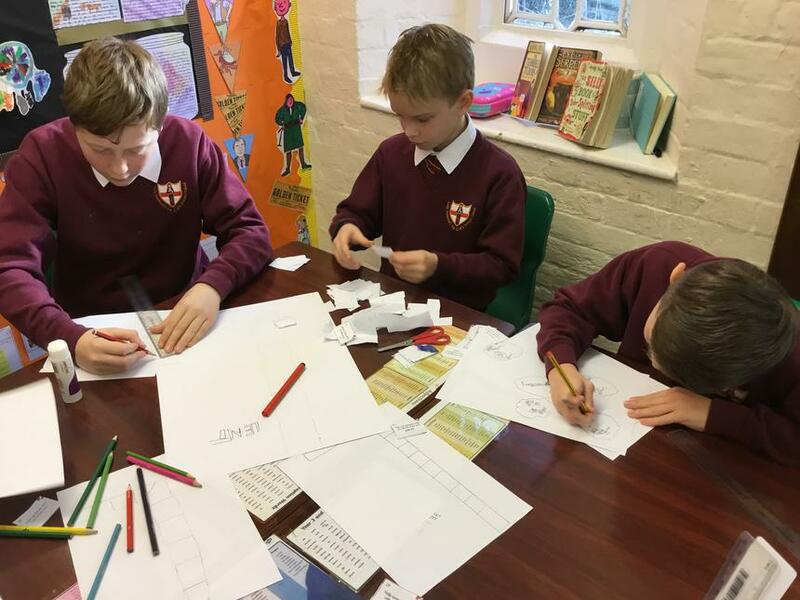 The children are now going to make a banner for Killerton’s art project which will be proudly displayed in their chapel. 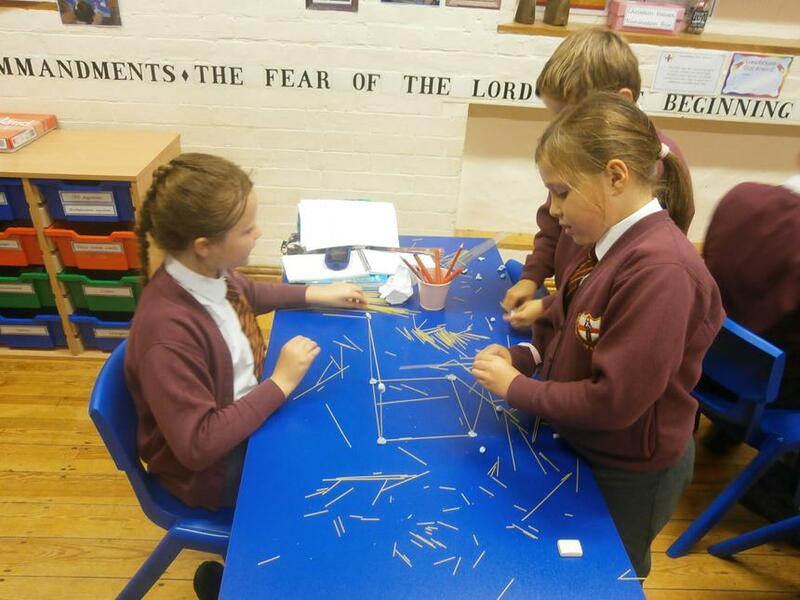 Children explored angles today in the classroom. 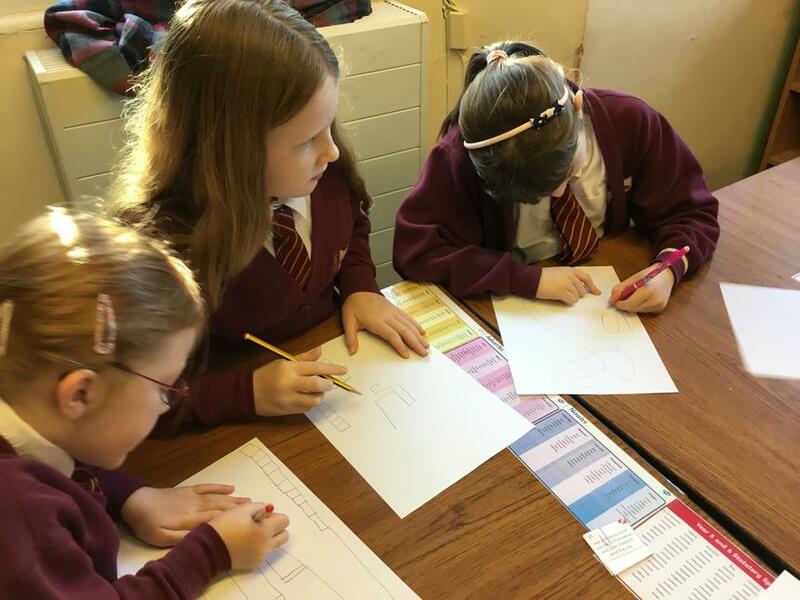 They looked at the difference between acute, obtuse and right angles and how to identify these angles. 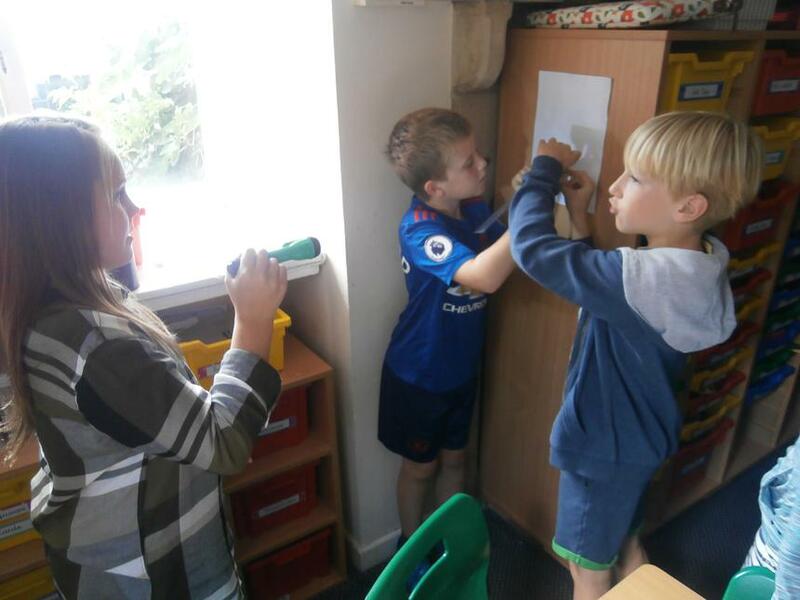 They used an angle finder to determine this knowledge and explored the classroom to see how many different angles they could find. 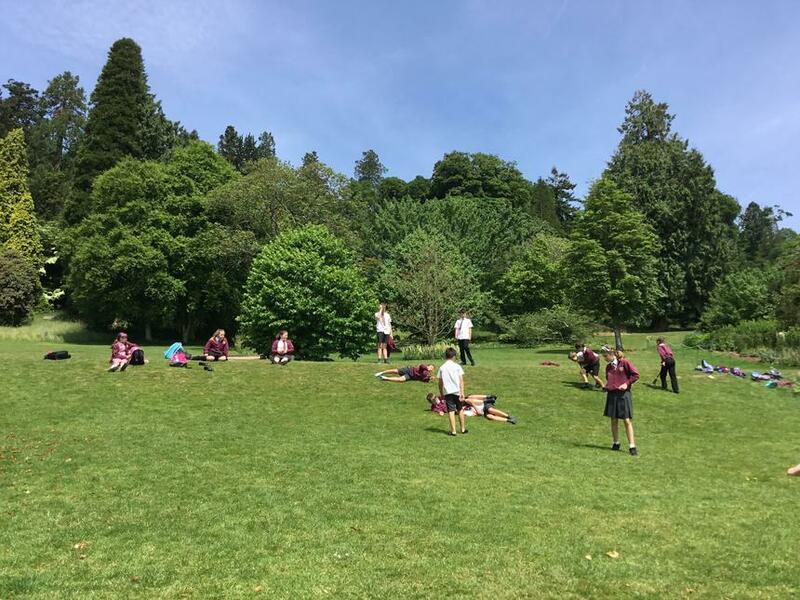 They then used dabbing to see how many different angles they could make with their bodies and performed these to the rest of the class. 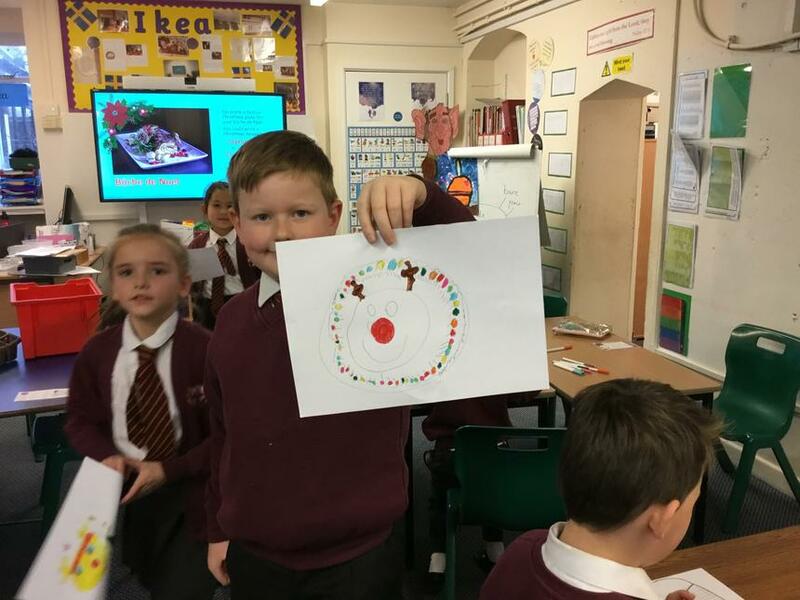 Can you identify the angles the children made? 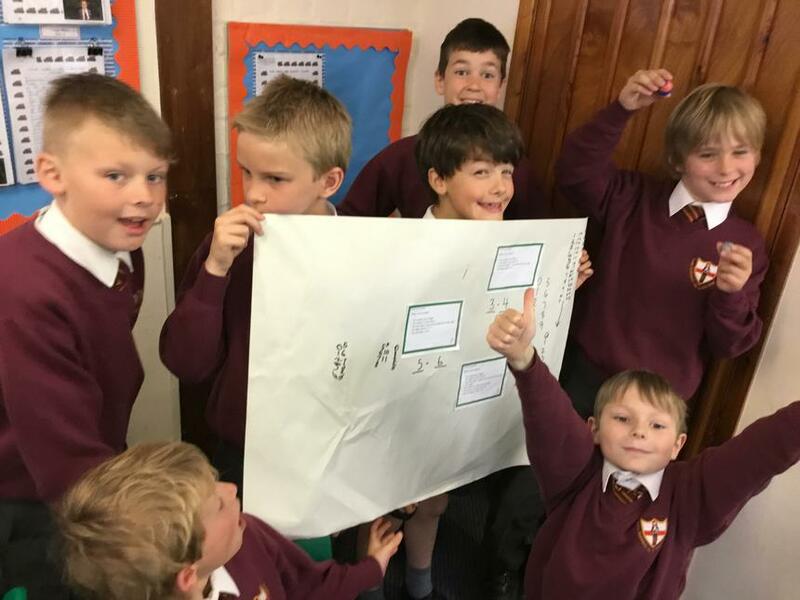 The focus for maths for June will be Properties of Shape where children will explore different angles, measurements and 2D & 3D shapes. 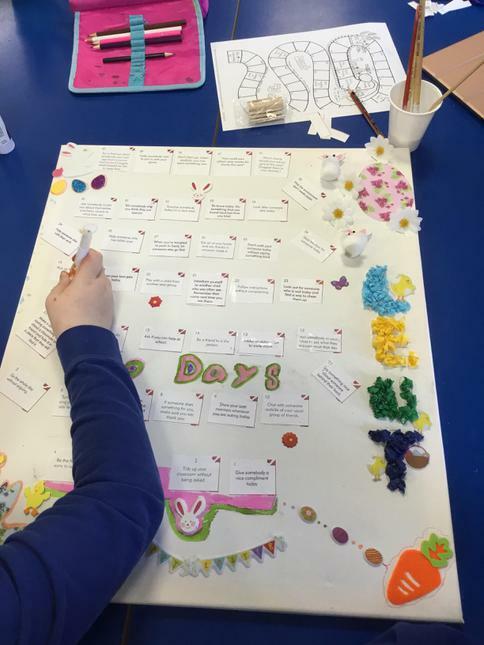 Please feel free to download the document below to identify what children will be learning. 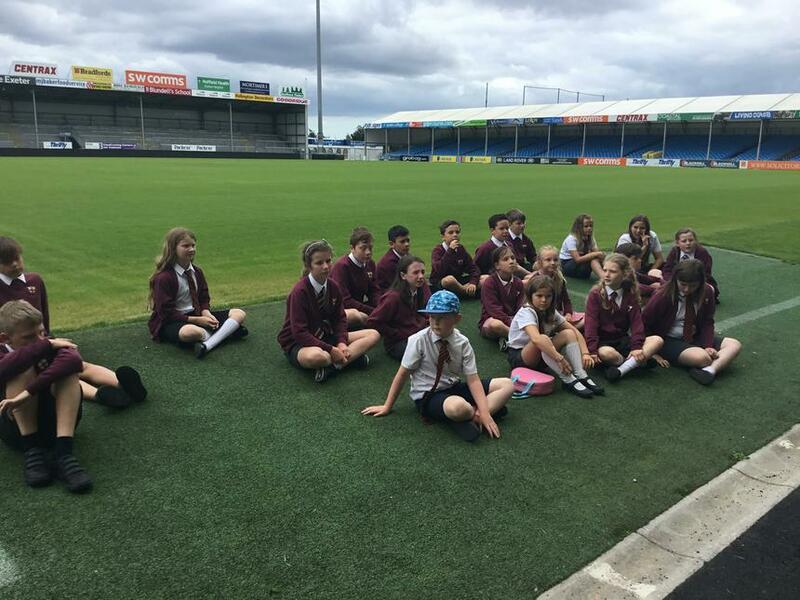 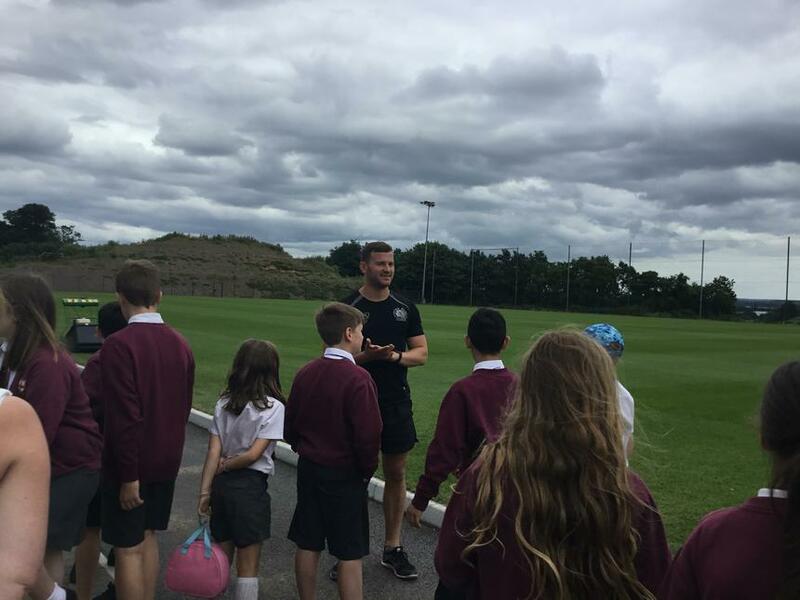 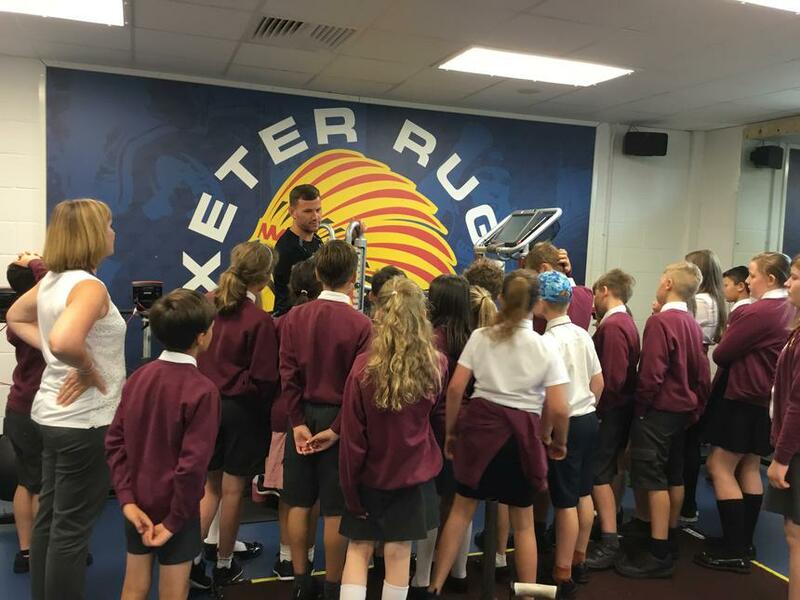 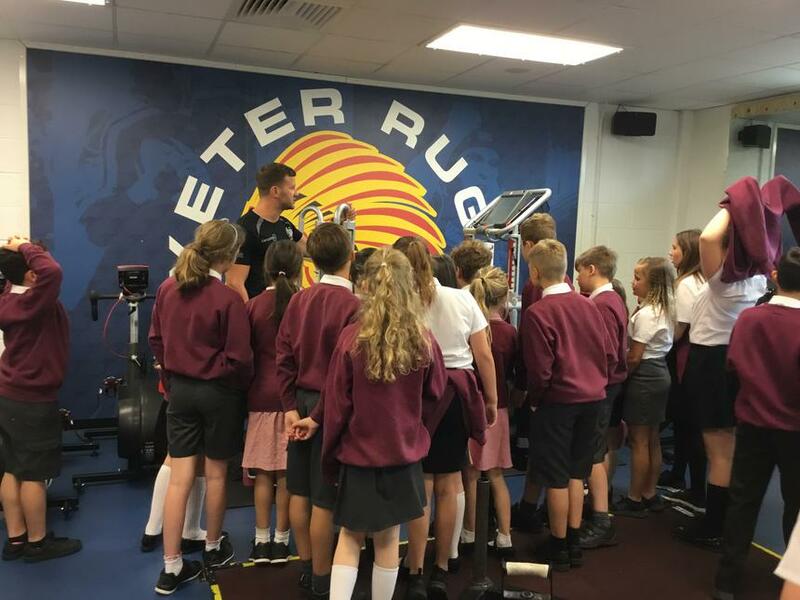 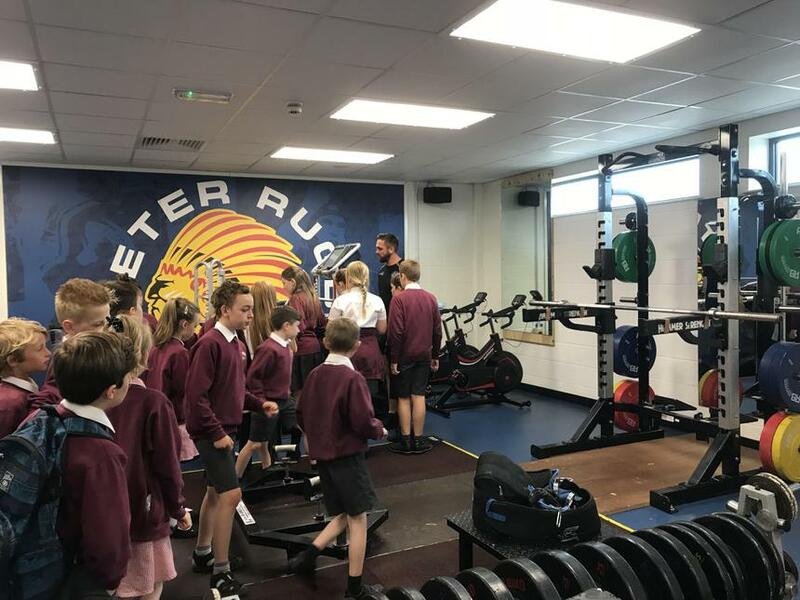 Classes 3 and 4 were extremely fortunate to have been invited to visit Exeter Chiefs and take part in tours around the ground. 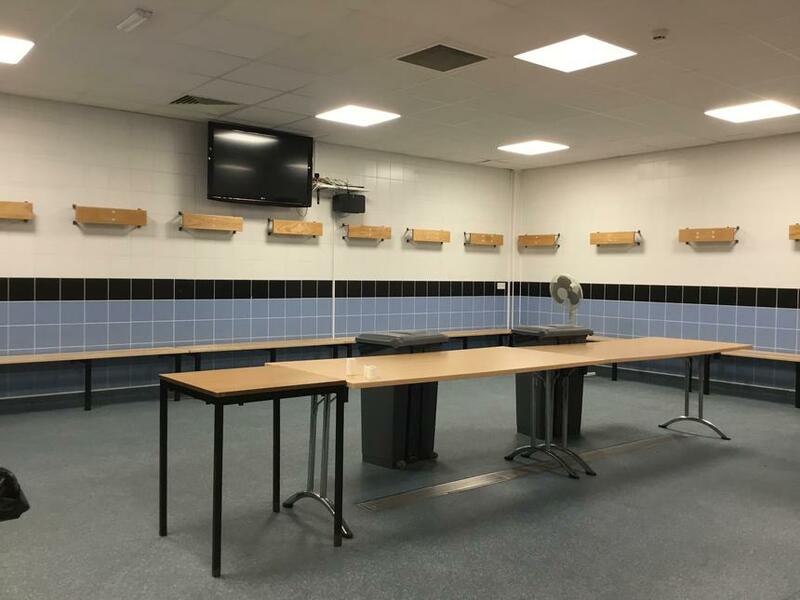 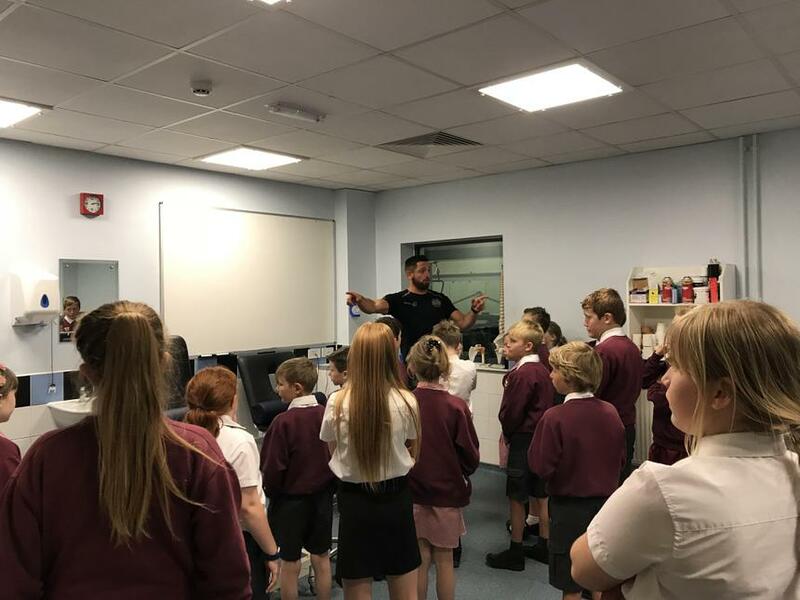 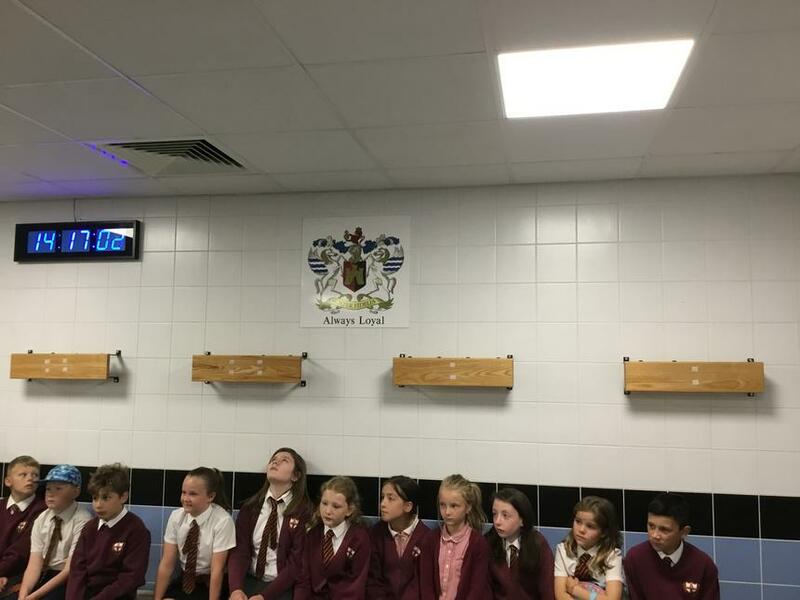 Both Aron and Richie showed the children all areas of the ground including 'behind the scenes' elements: the children were able to experience the changing rooms and sit in some of the players seats; visit the gymnasium, looking at the records set by different players; look in the physiotherapy room and find out about the cost of this and even visit the ice-bath pool! 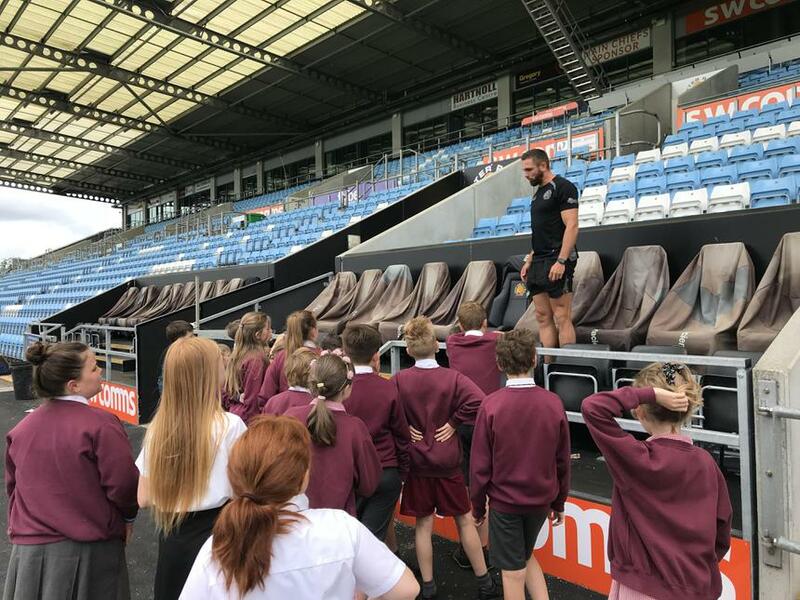 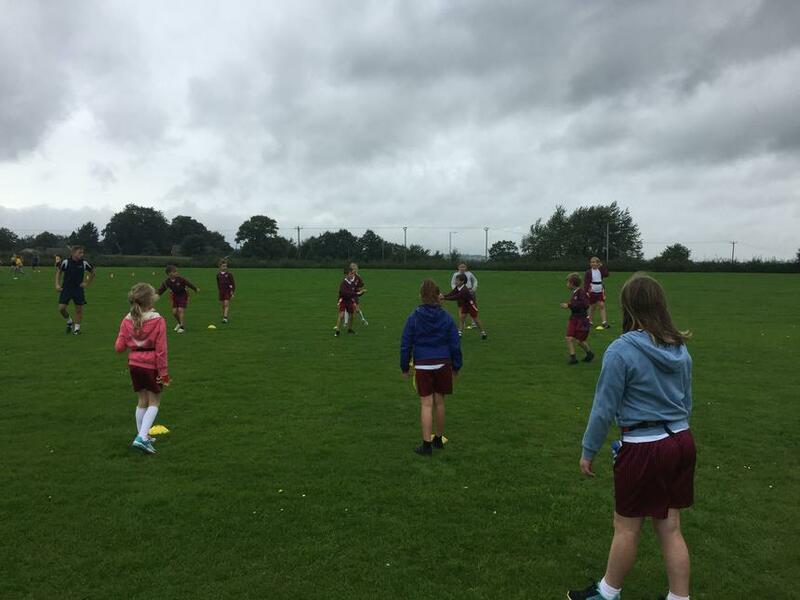 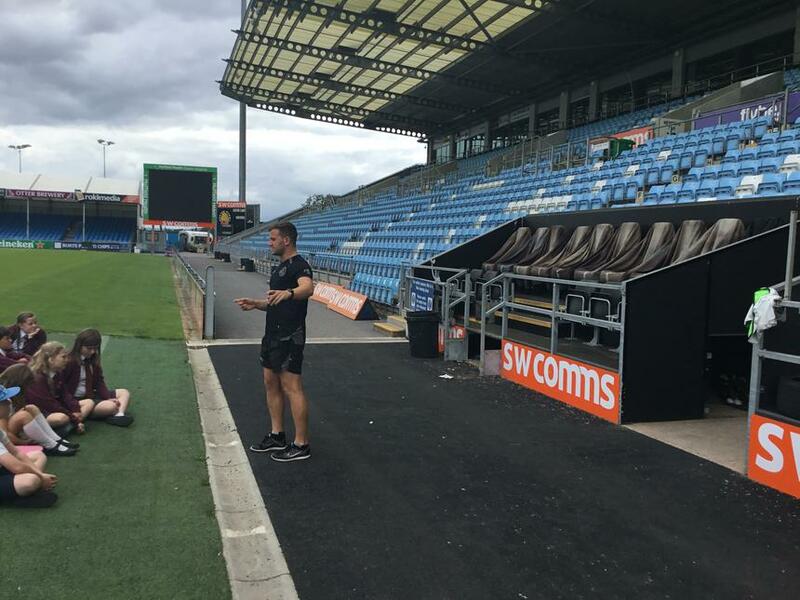 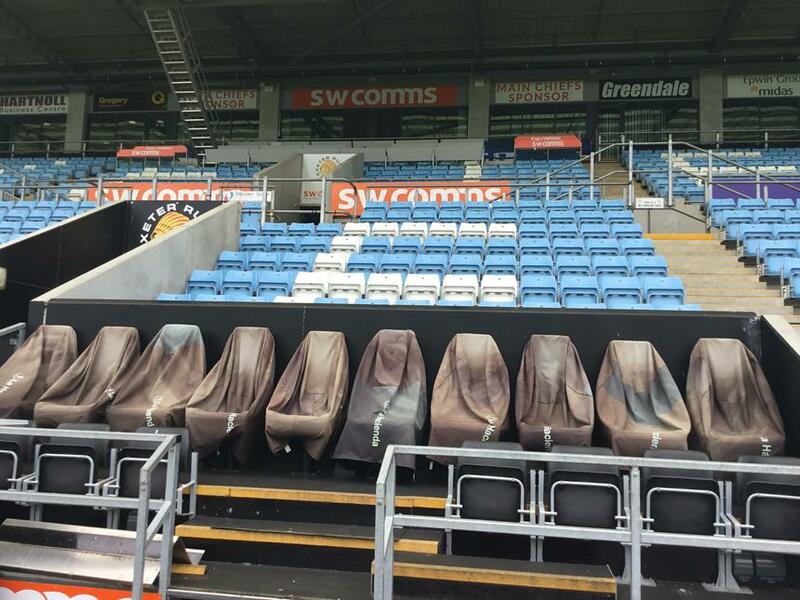 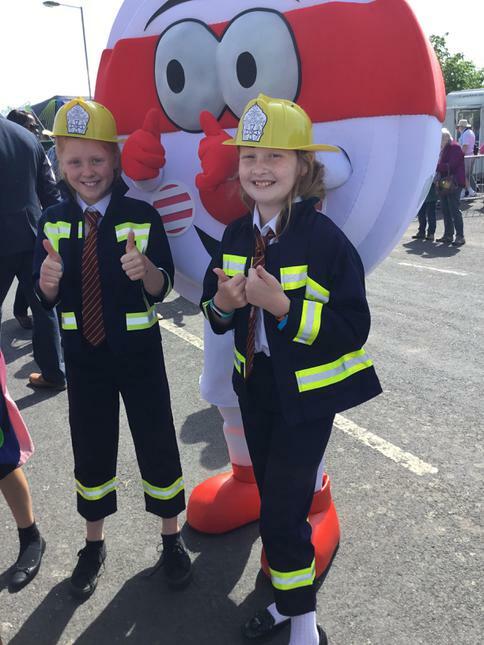 As well as this, the children learned about the new developments within the stands, found out why the pitch had a slight raise in the middle and even learned that the Exeter Chiefs sub seats are heated! 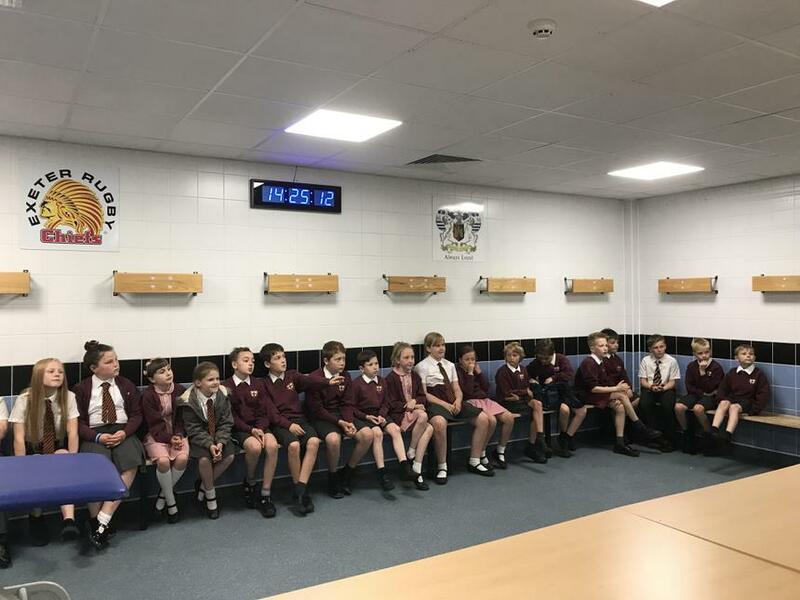 Throughout the afternoon the chidlren asked lots of interesting questions about the different roles within the club as well as gaining new information about some of the players. 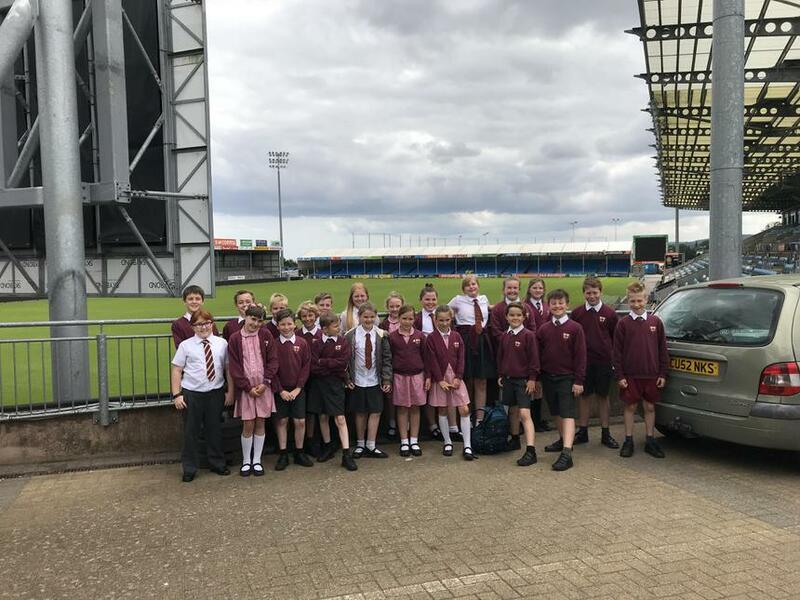 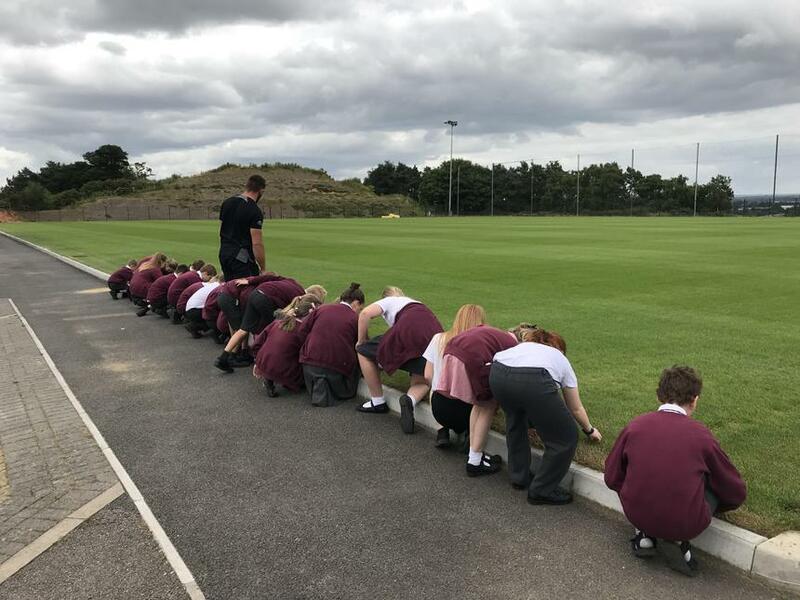 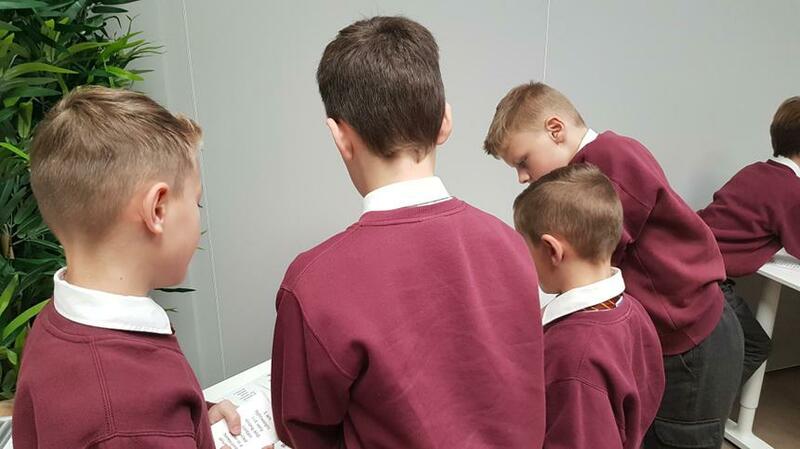 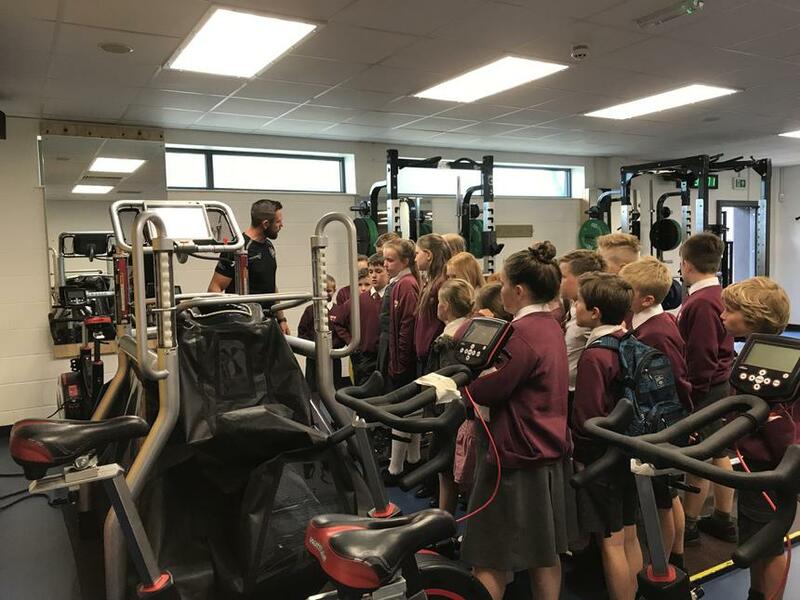 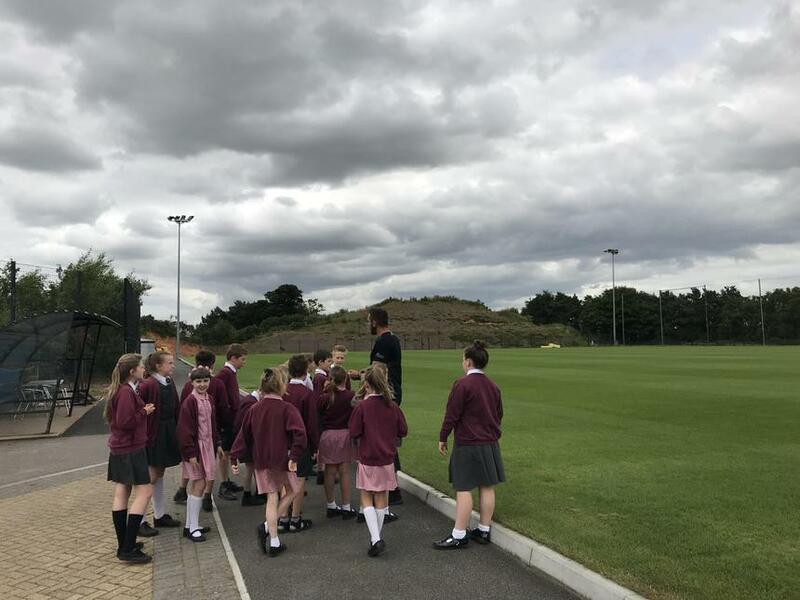 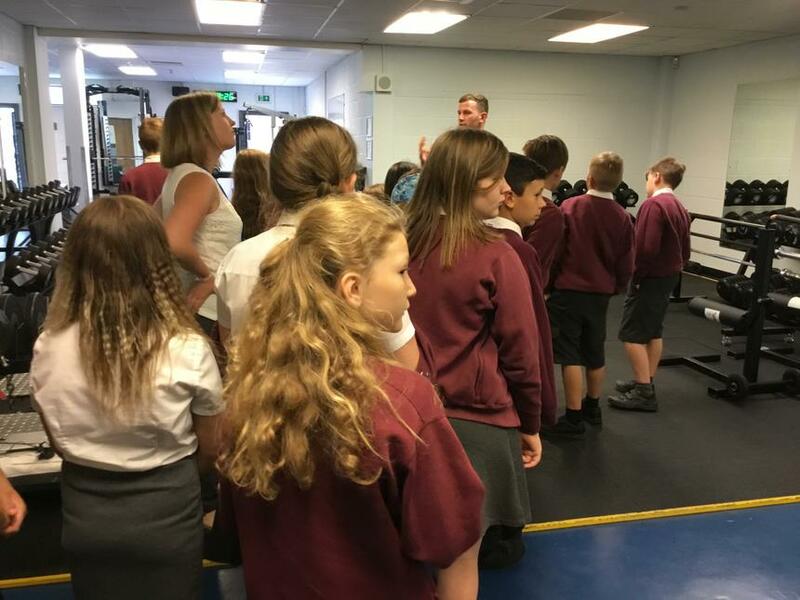 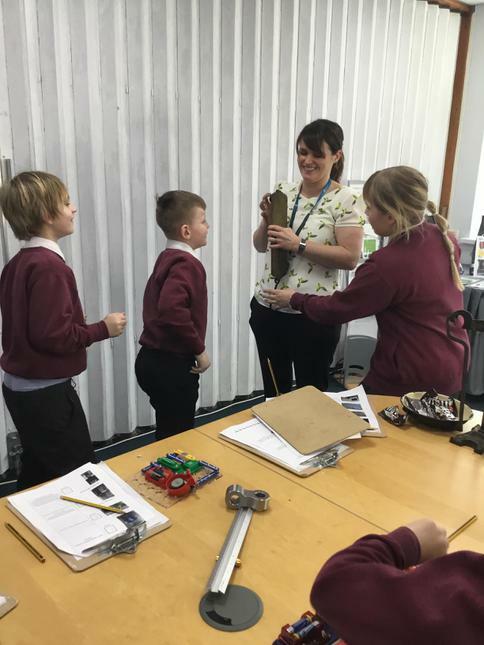 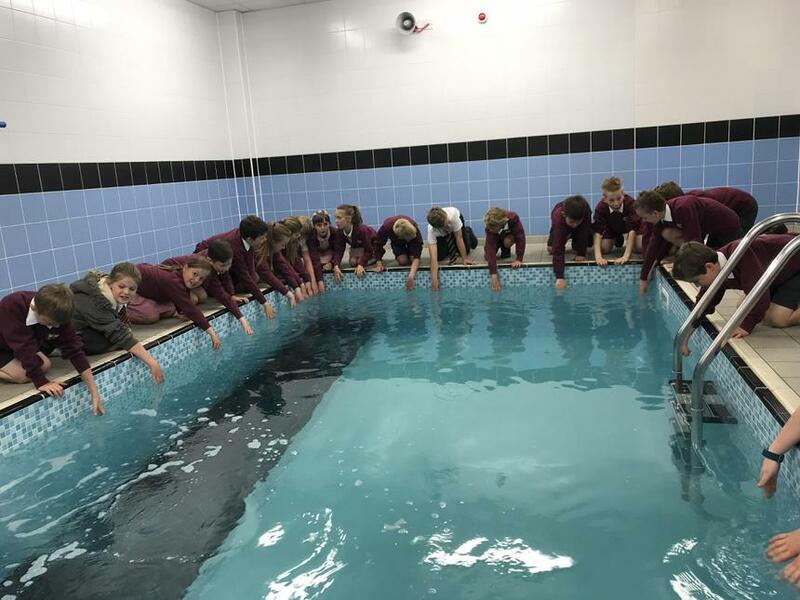 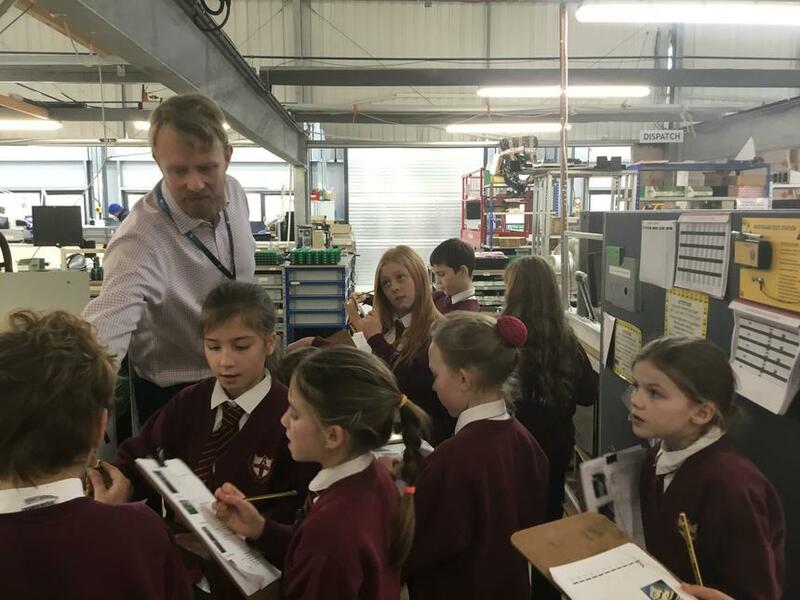 This was a brilliant opportunity for the children which engaged them even further with our Sporting Legends topic and allowed them to develop their understanding of the workings of a large sporting facility. 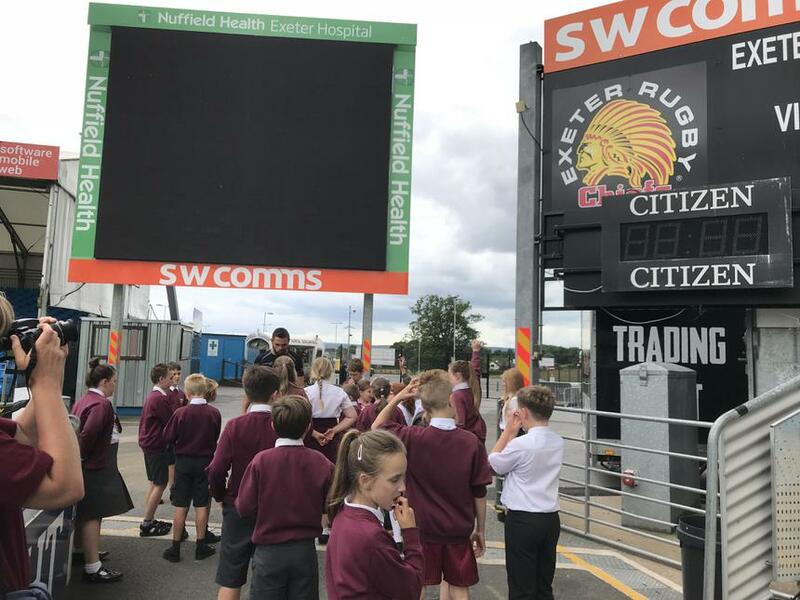 A massive thank you to Aron and Richie for giving up their time to show everybody around, we had a fantastic day and have learned so much about Exeter Chiefs! 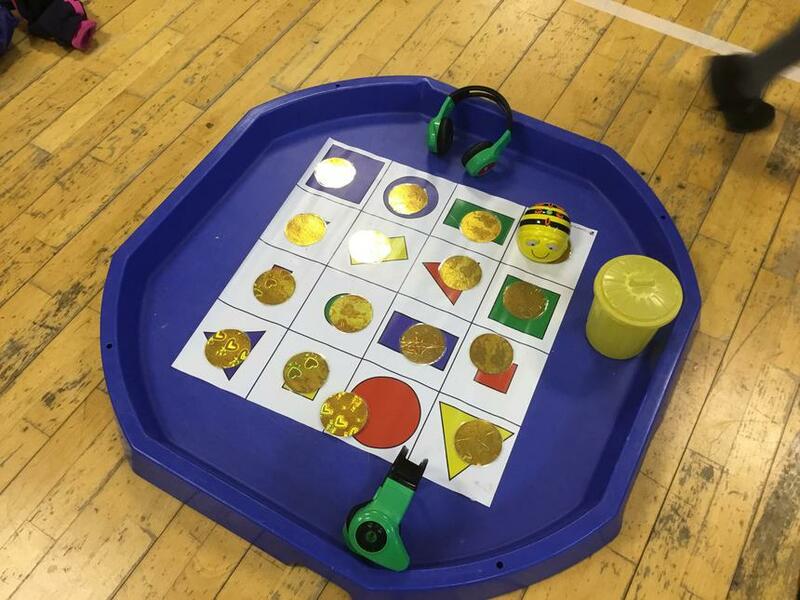 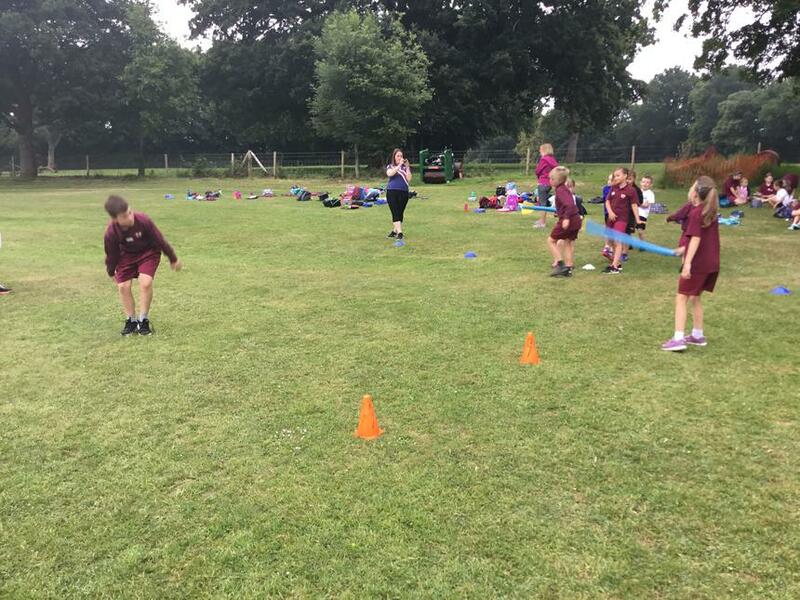 On Friday, Class 3 and 4 planned, resources and hosted their very own Commonwealth Games event for children across Reception, Year 1 and Year 2 from our local HUB schools. 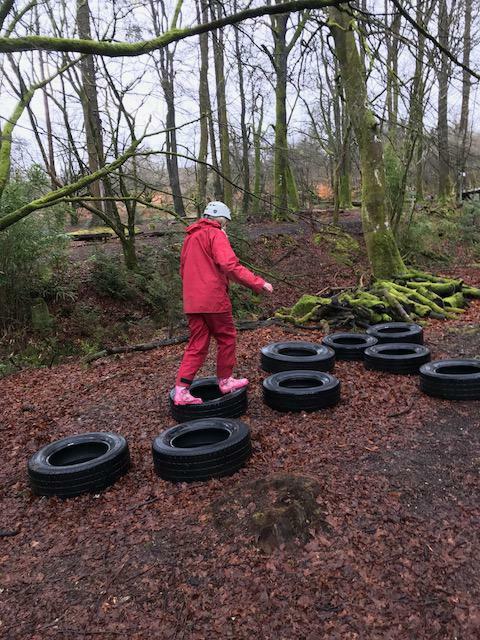 The events that the children planned focused on developing basic skills for the younger children, including jumping, balancing and throwing. 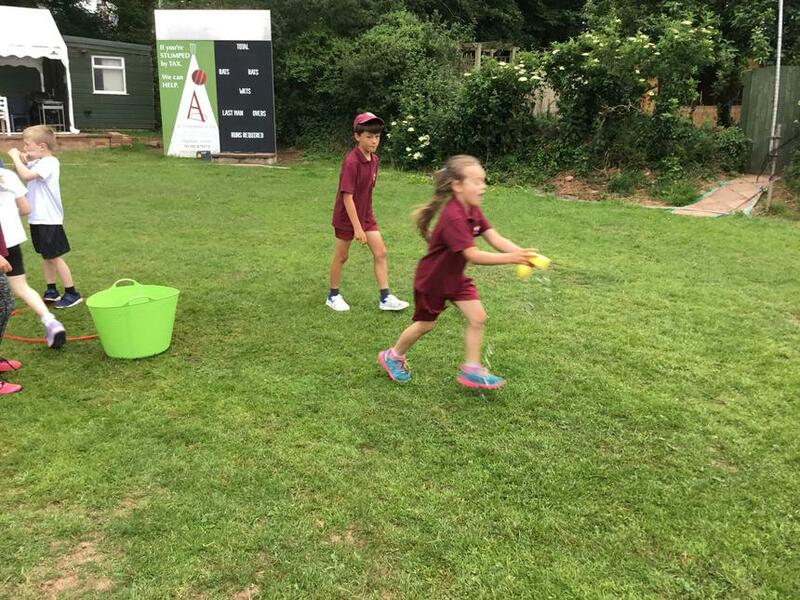 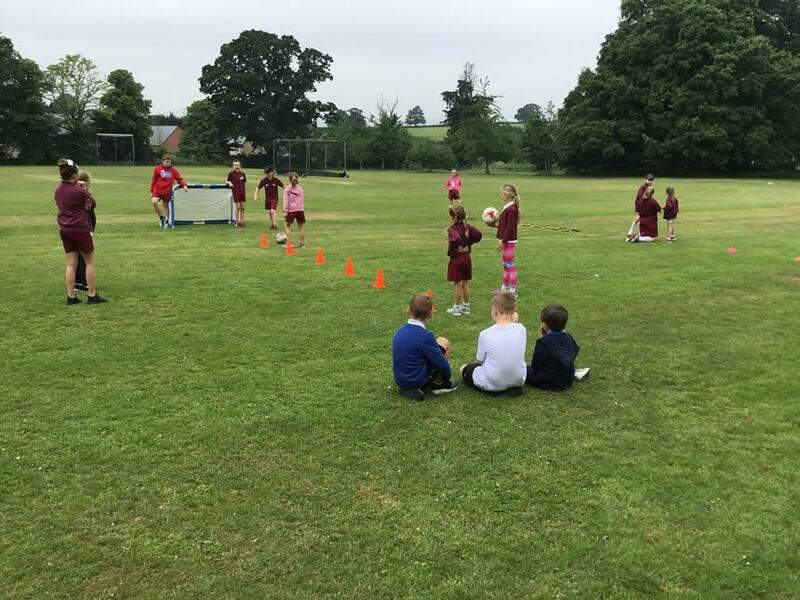 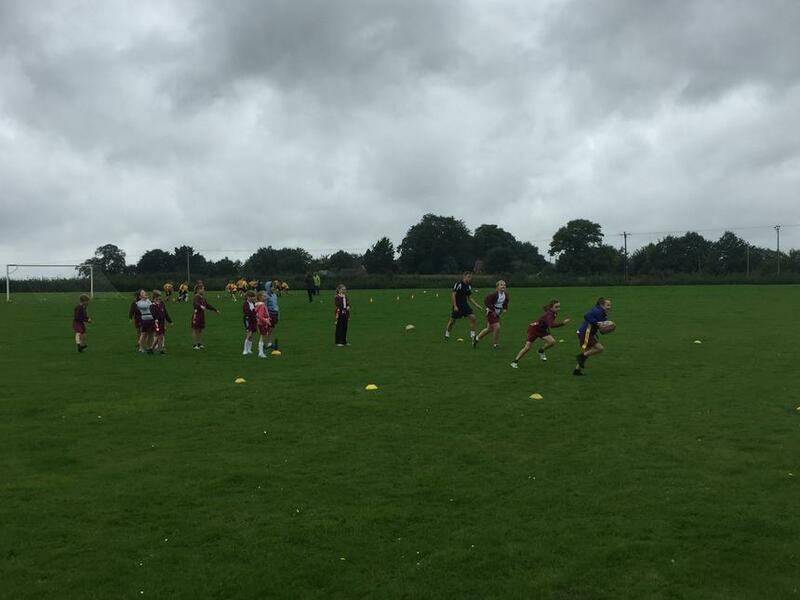 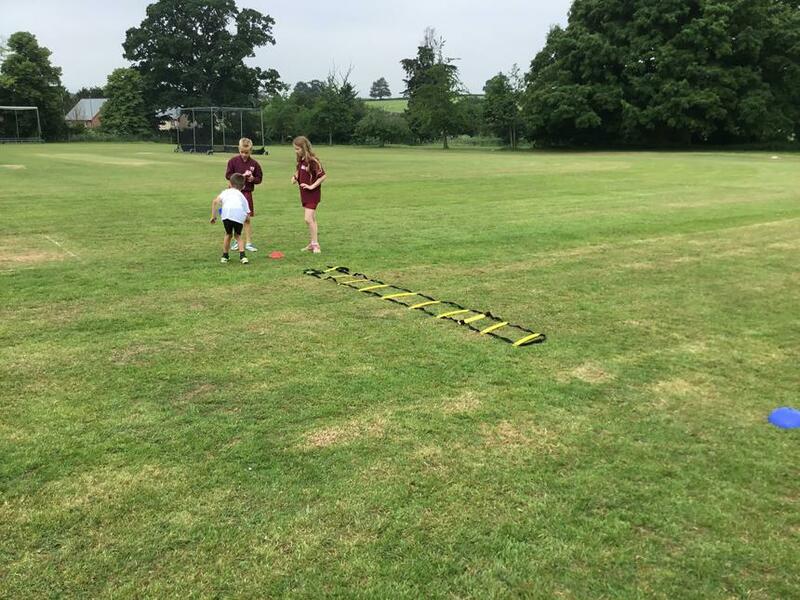 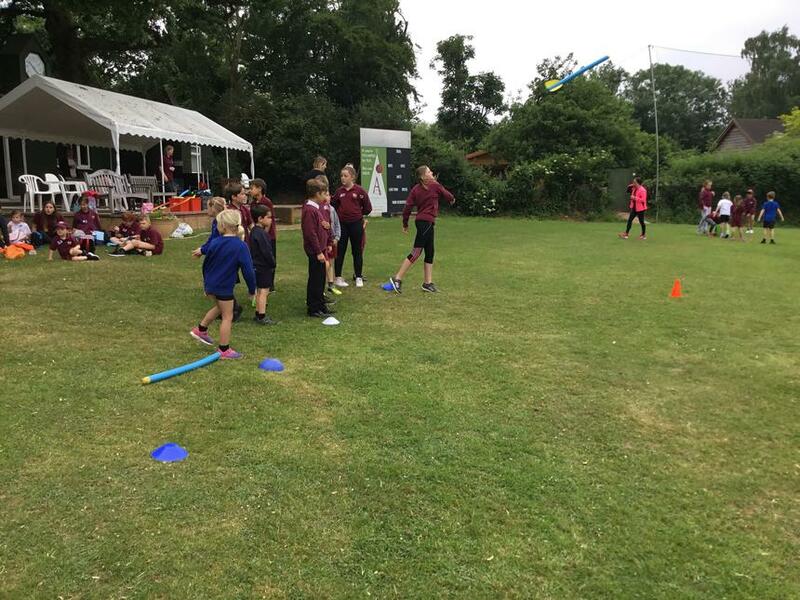 Some of the events delivered by the children included javellin, standing jump, target throw, a water relay and many more. 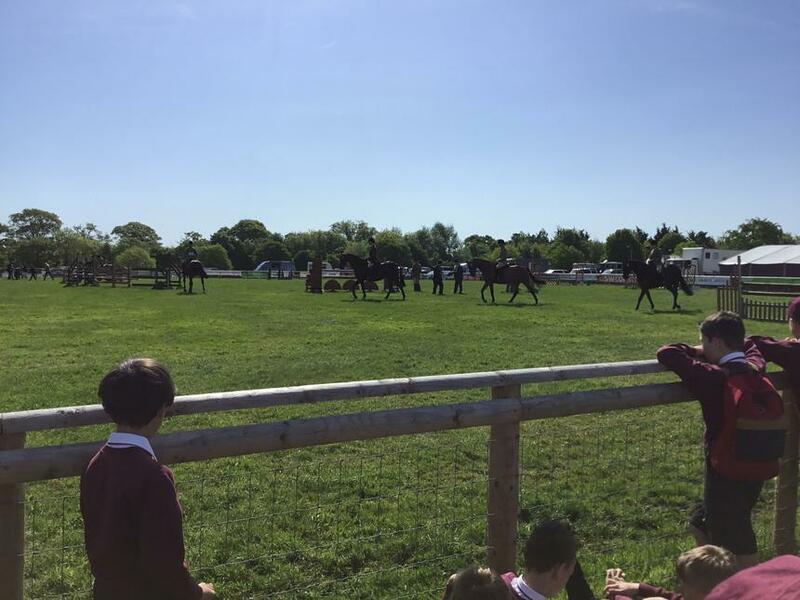 The children, as well as our visitors, thoroughly enjoyed this event. 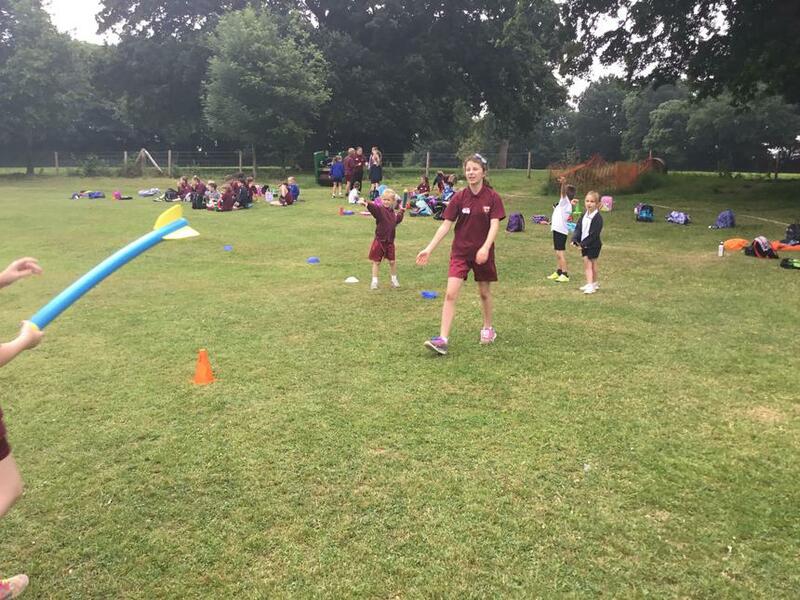 After being placed into a Commonwealth country, they were taught how to complete each event, before competing for points as a country. 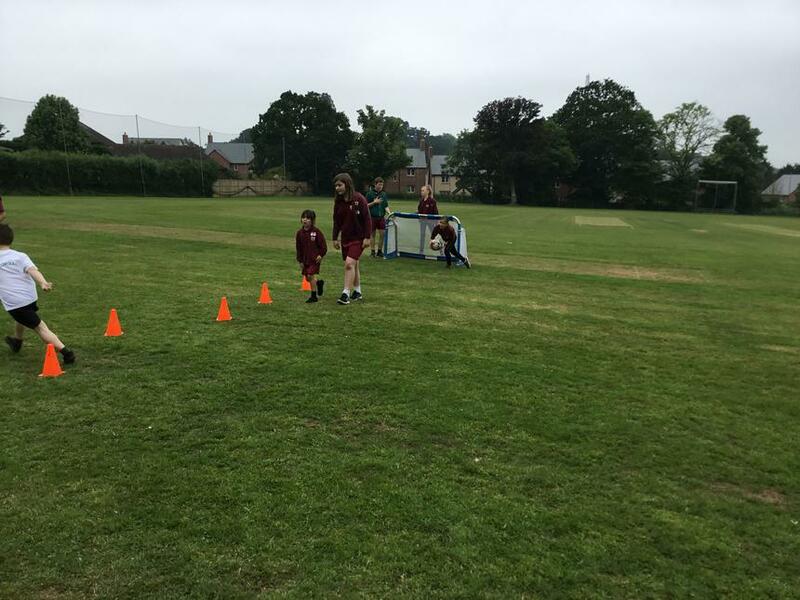 Himalayas and Pyrenees Class recorded the results and presented the winning country with certificates at the end of the sessions. 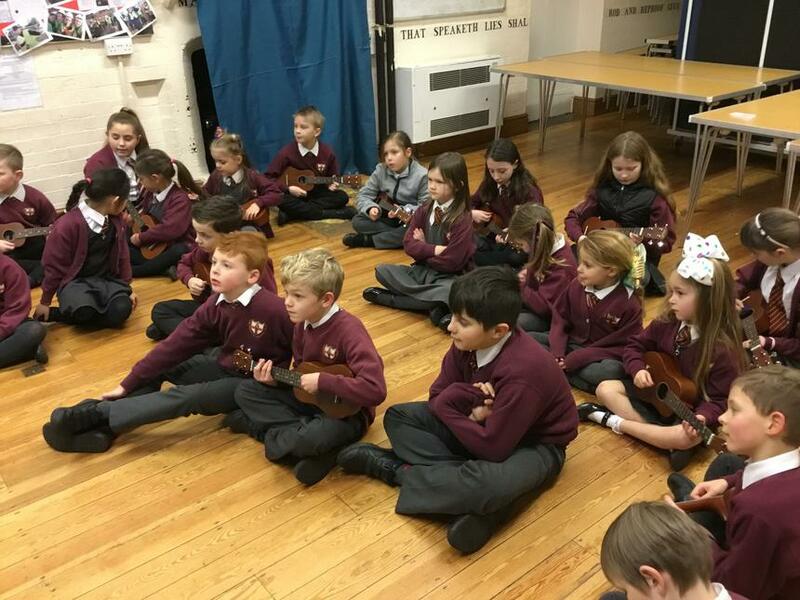 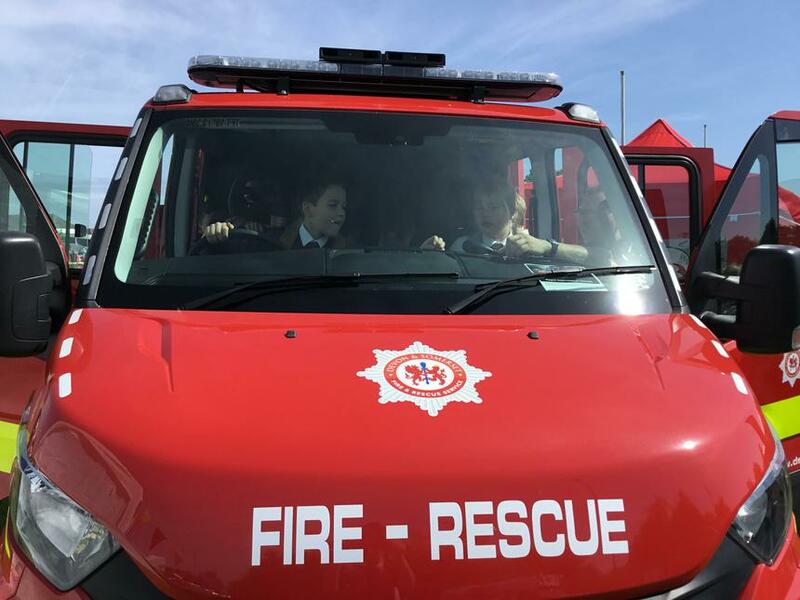 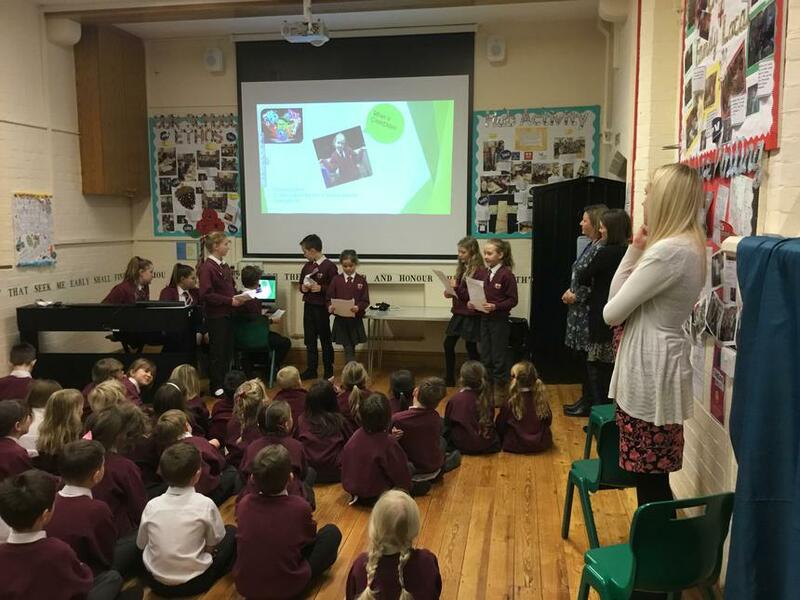 A huge well done to the children involved; we have recieved lots of positive feedback from our visiting schools and as teachers, we were very impressed by the leadership skills shown on the day. 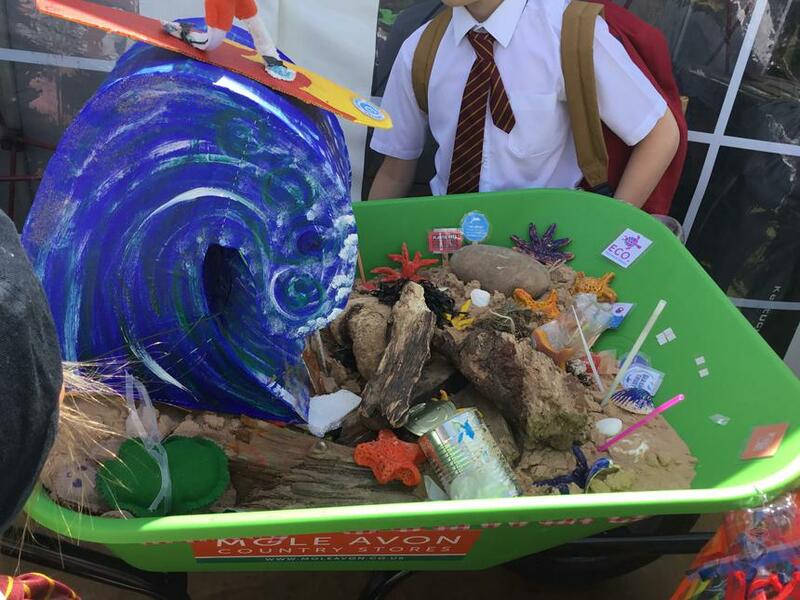 The children of Class 3 entered a competition in which they were asked to design a wheelbarrow based on the theme of plastics in the ocean. 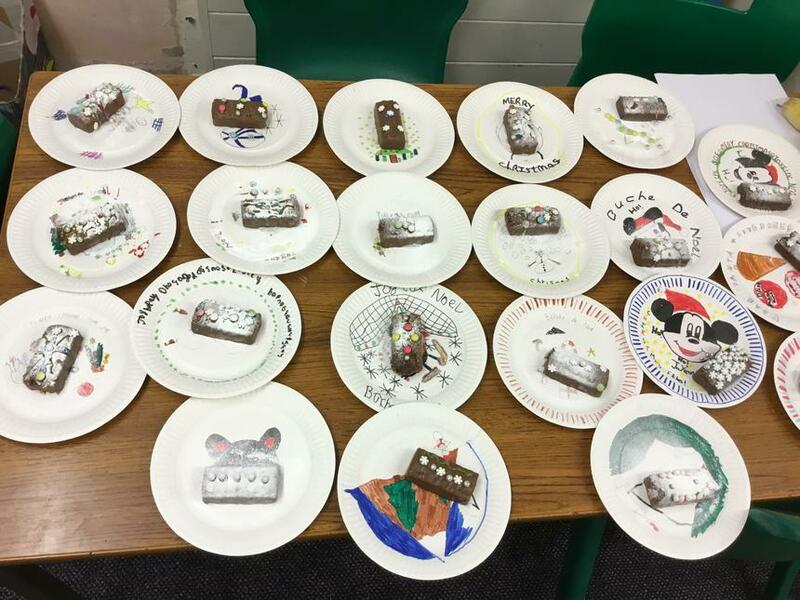 I am proud to announce that Himalayas Class won FIRST PLACE in the competition. 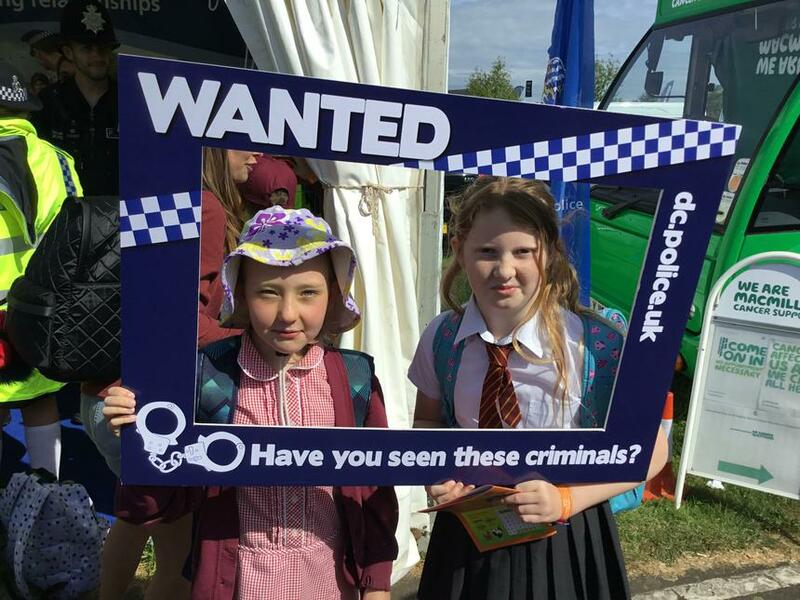 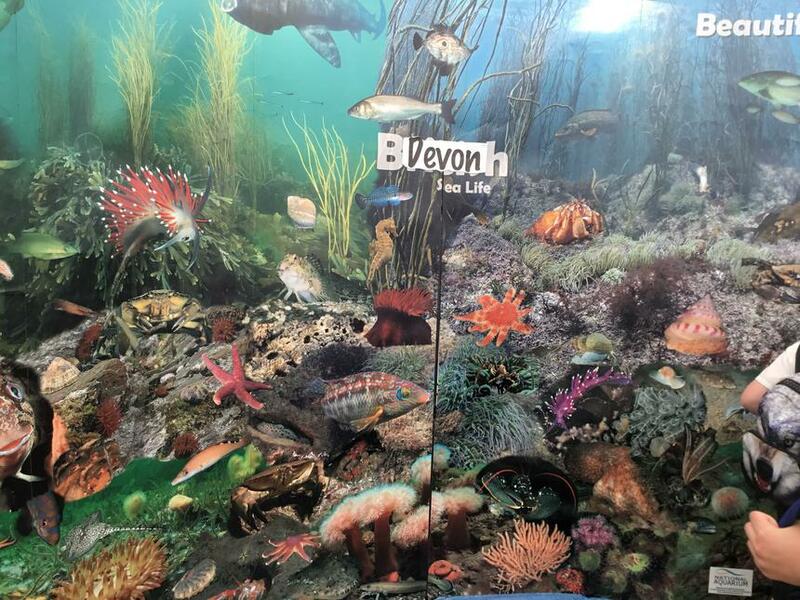 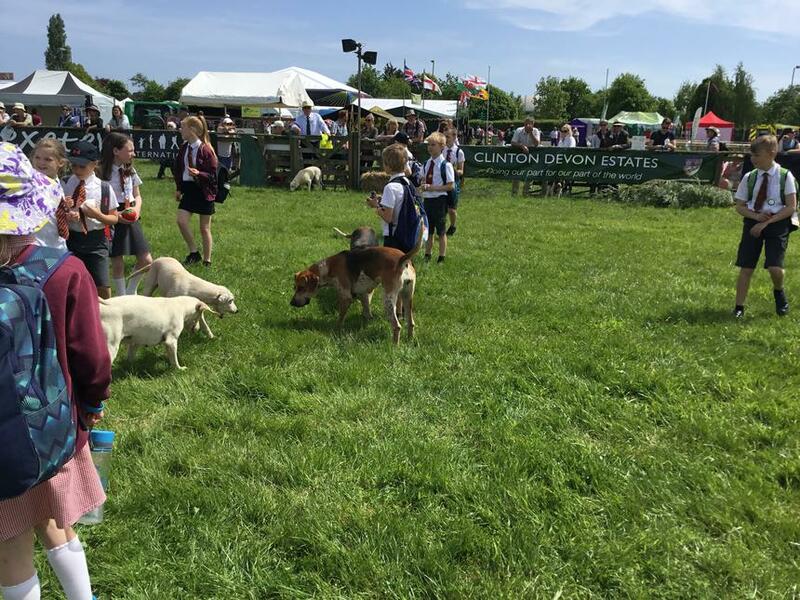 All children won a ticket to The Devon County Show. 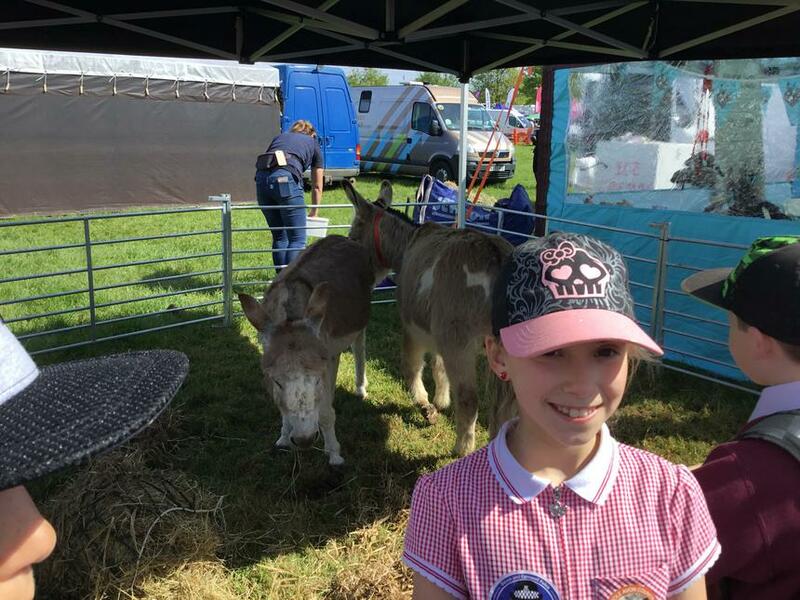 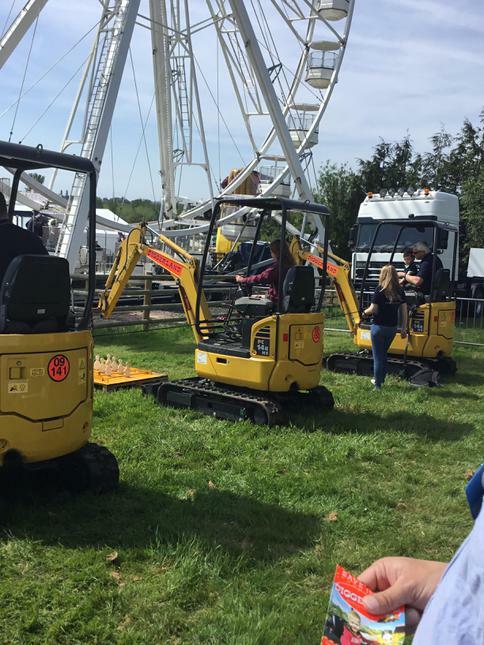 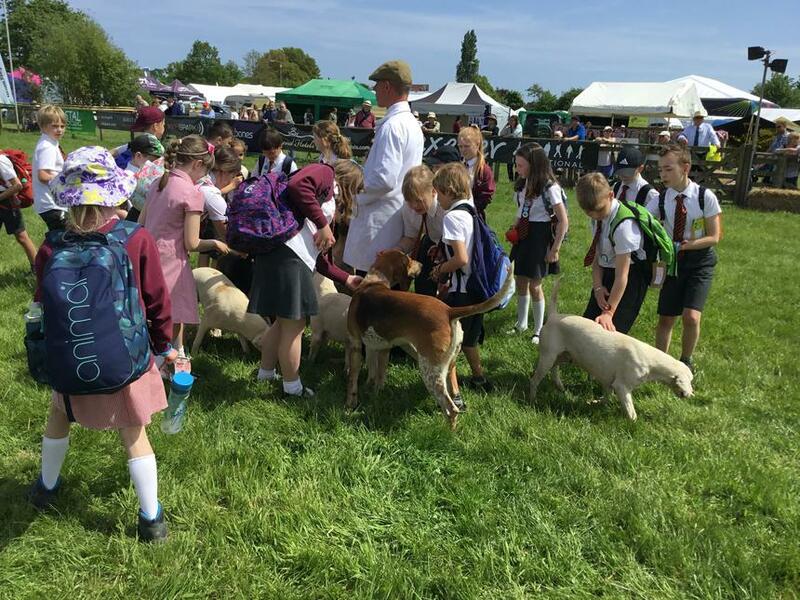 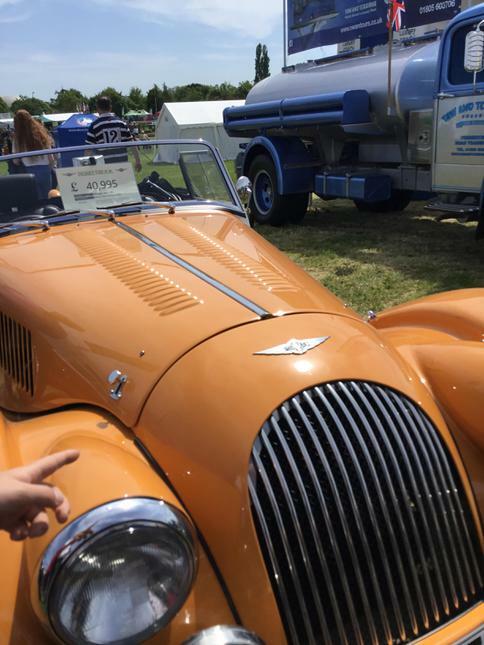 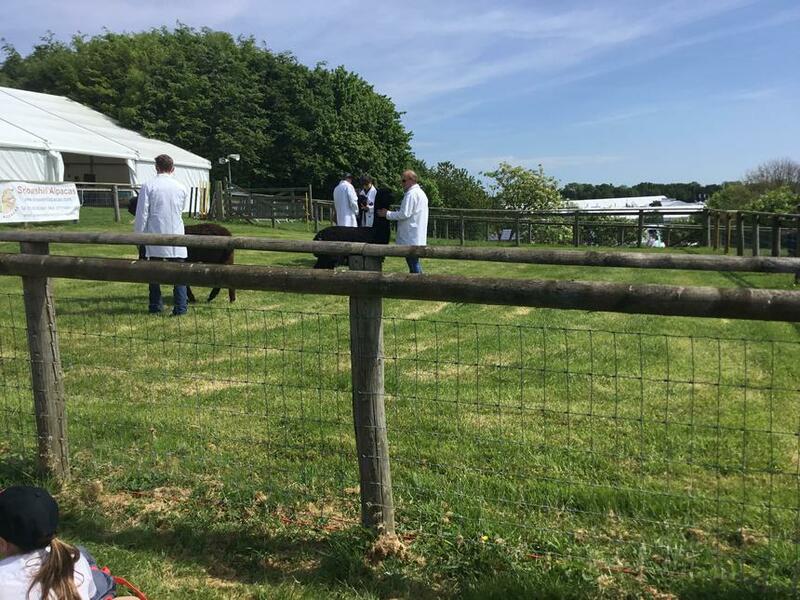 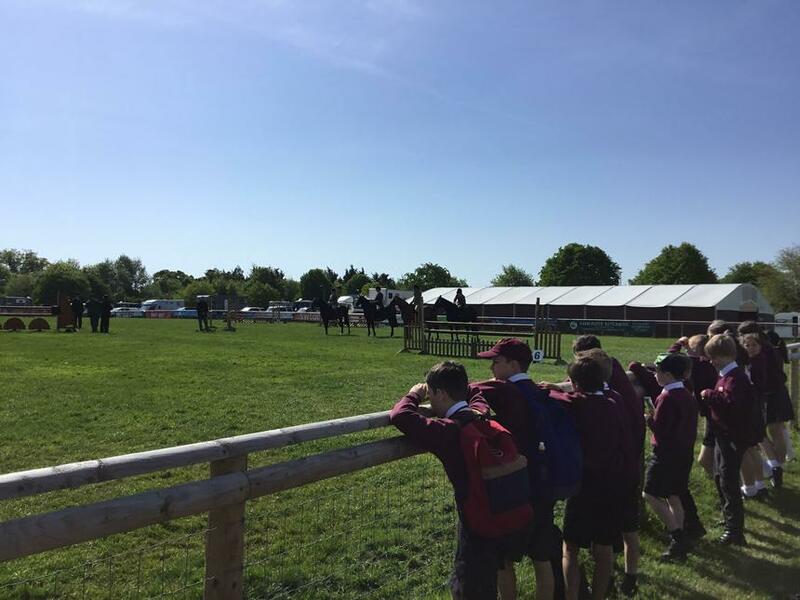 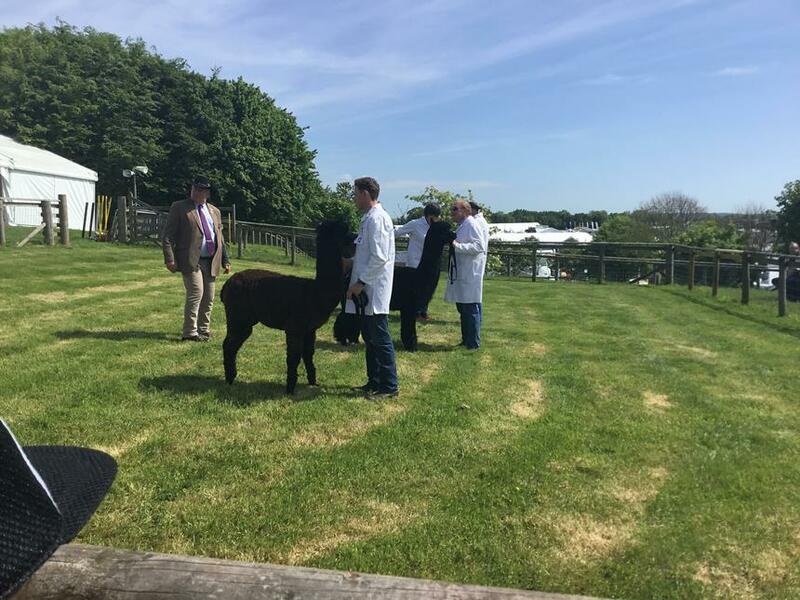 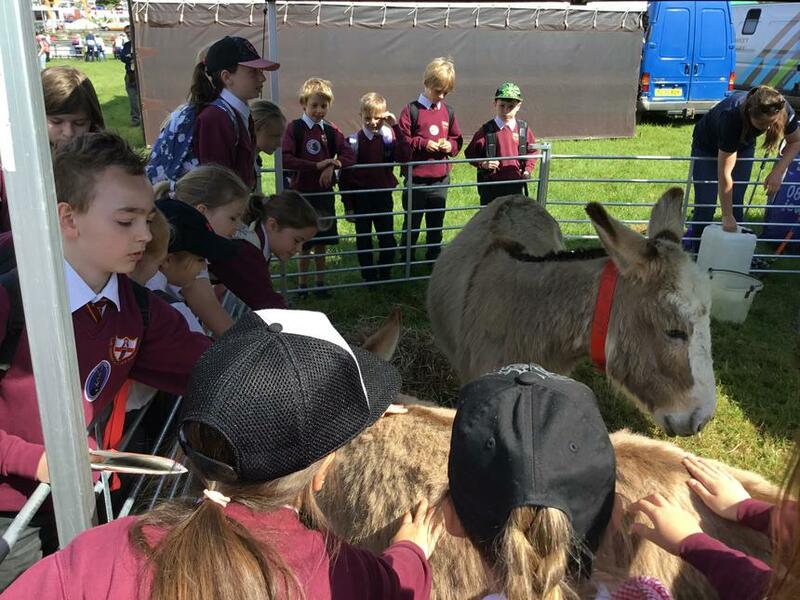 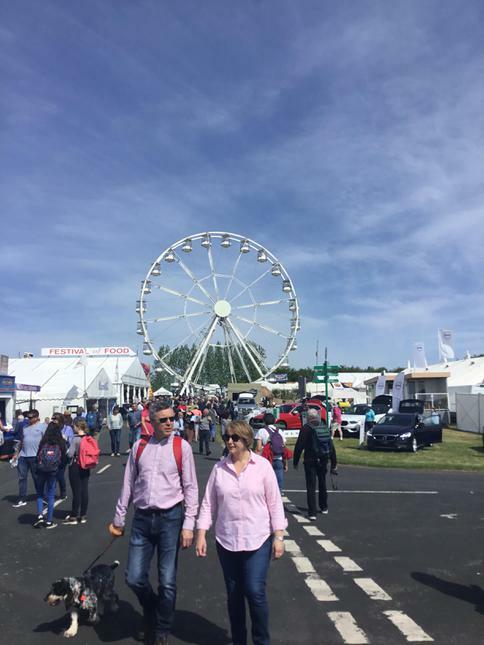 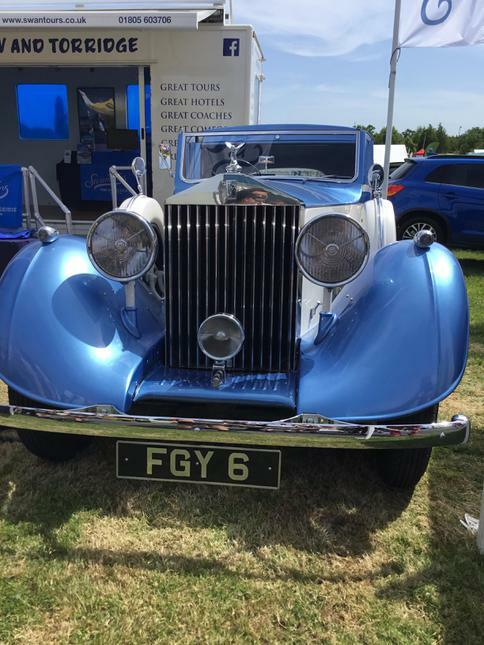 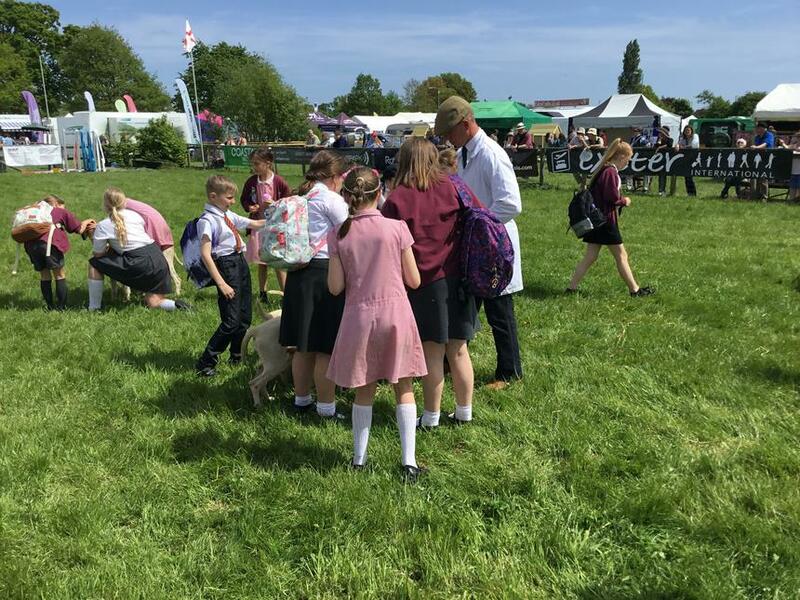 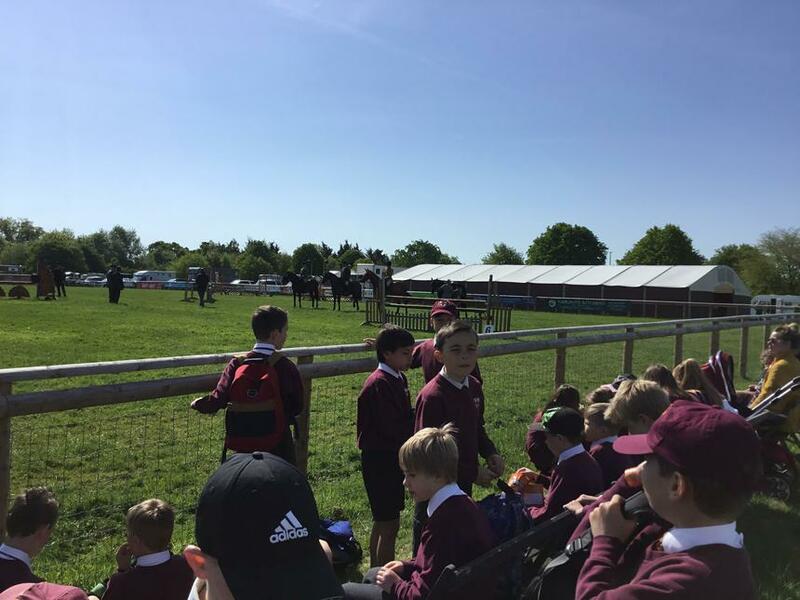 On Thursday, we took a class trip to the show and had an absolutely brilliant day out in the sunshine. 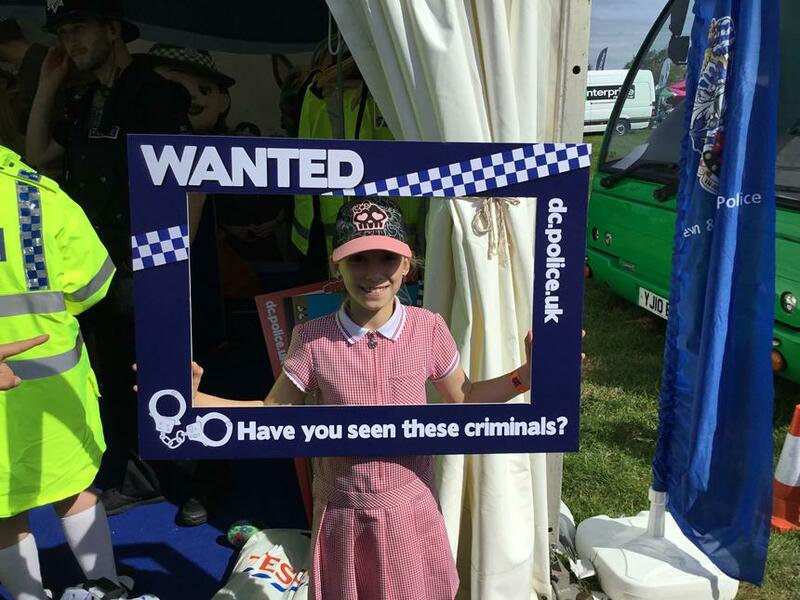 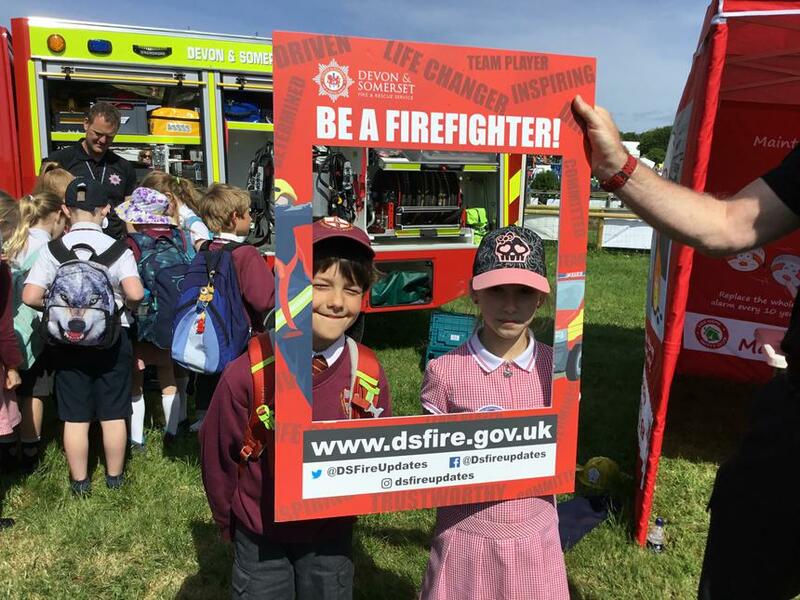 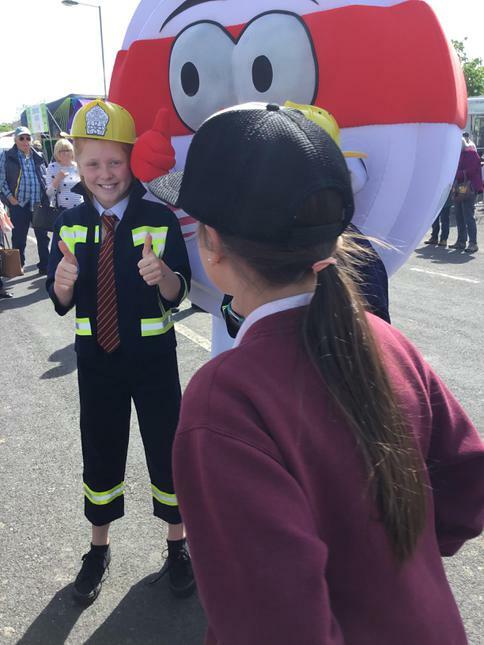 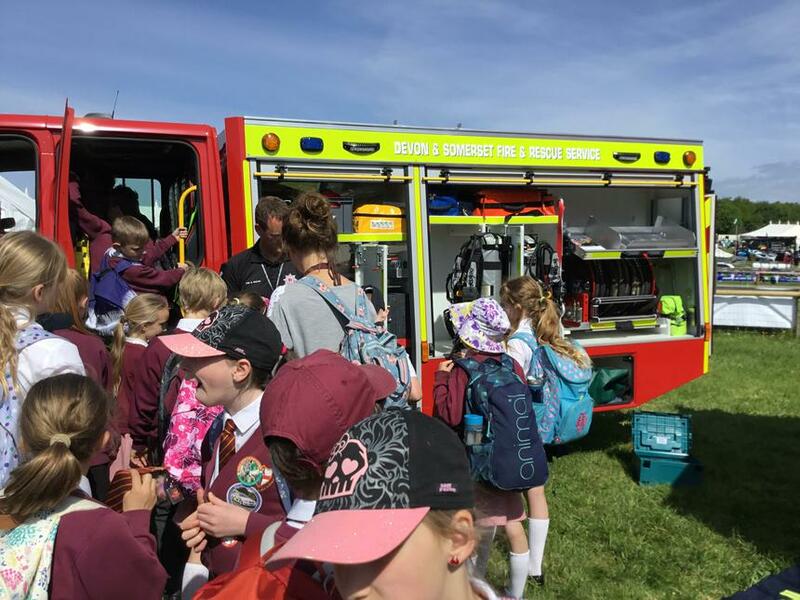 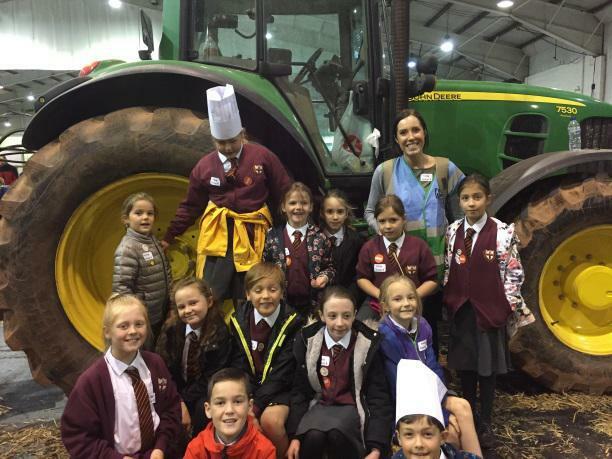 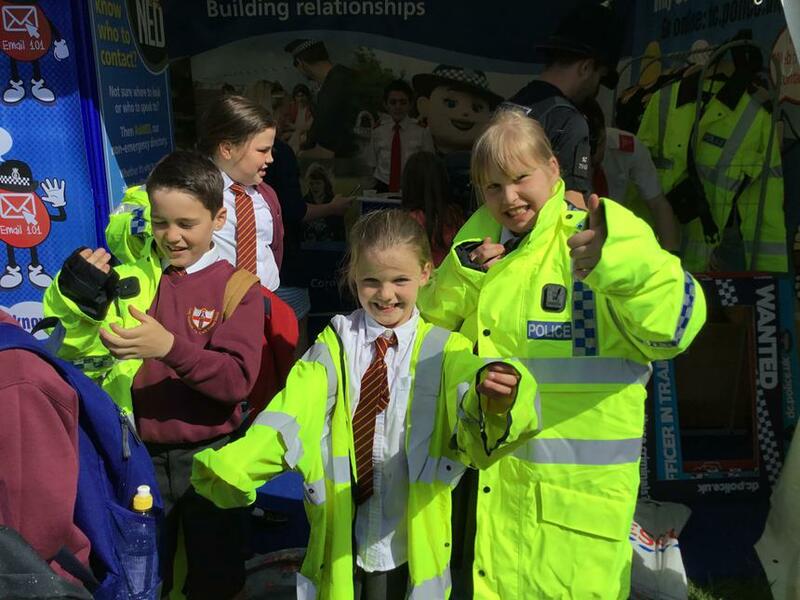 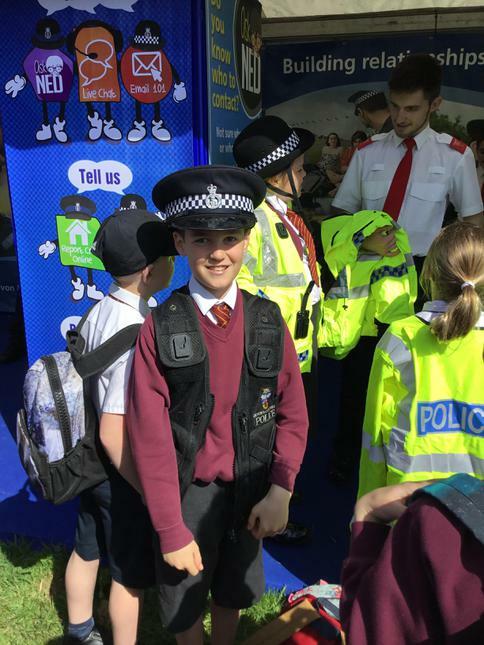 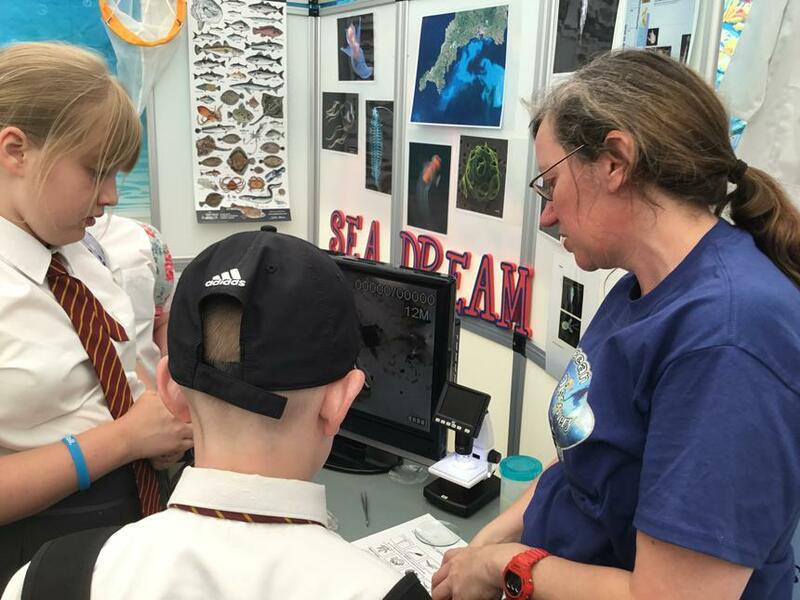 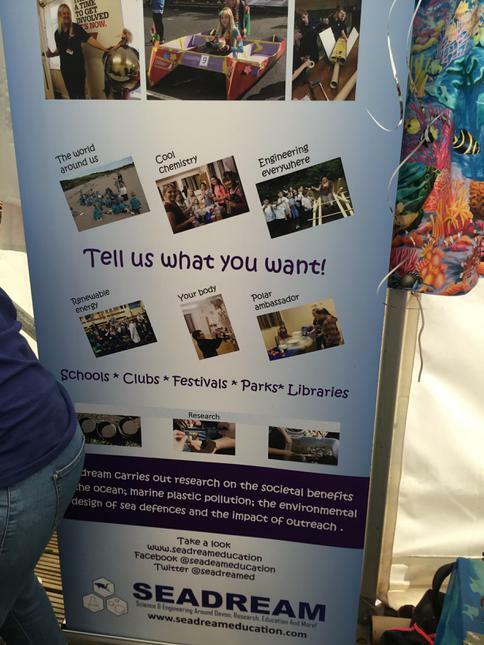 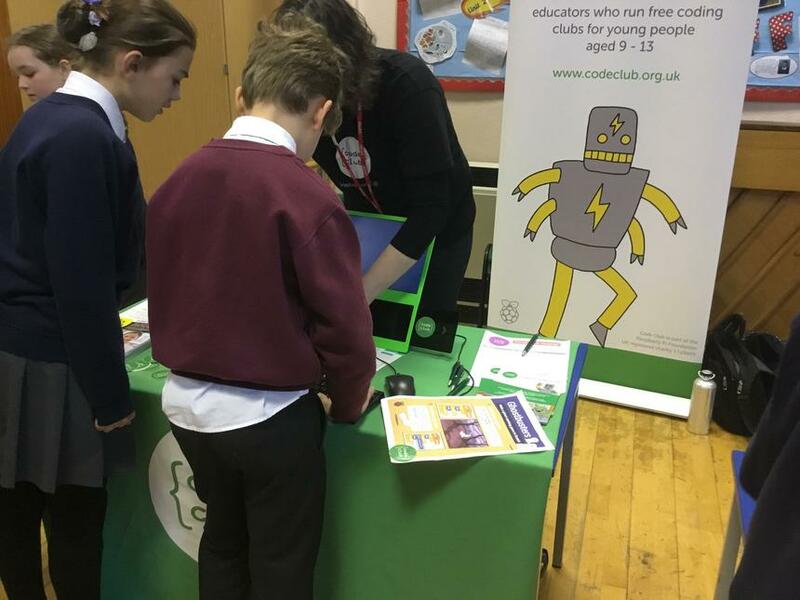 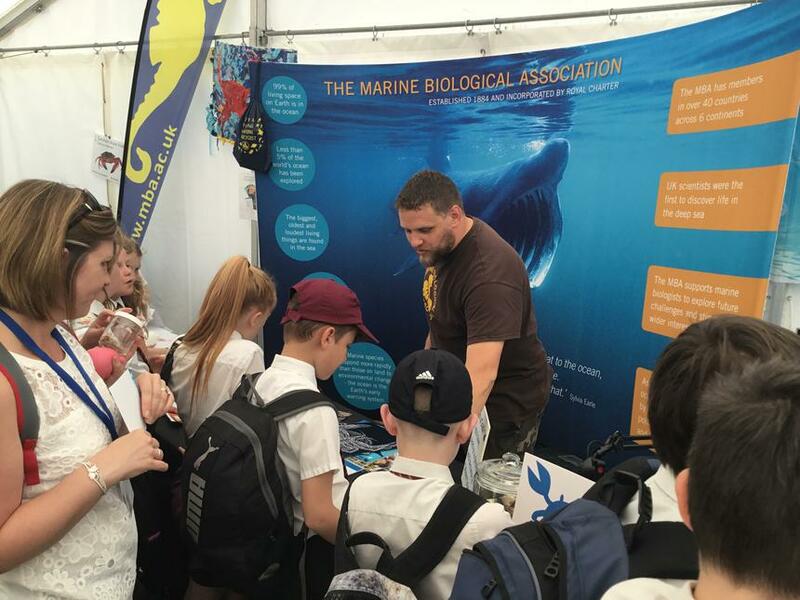 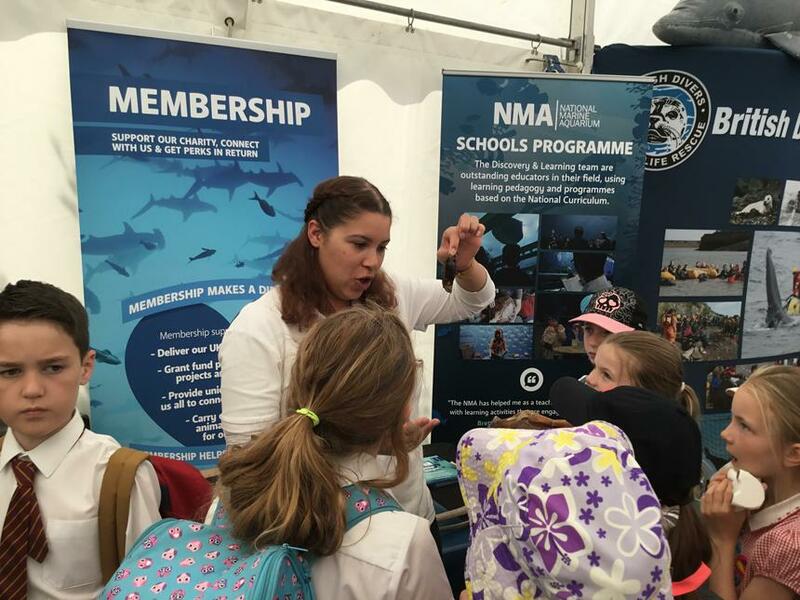 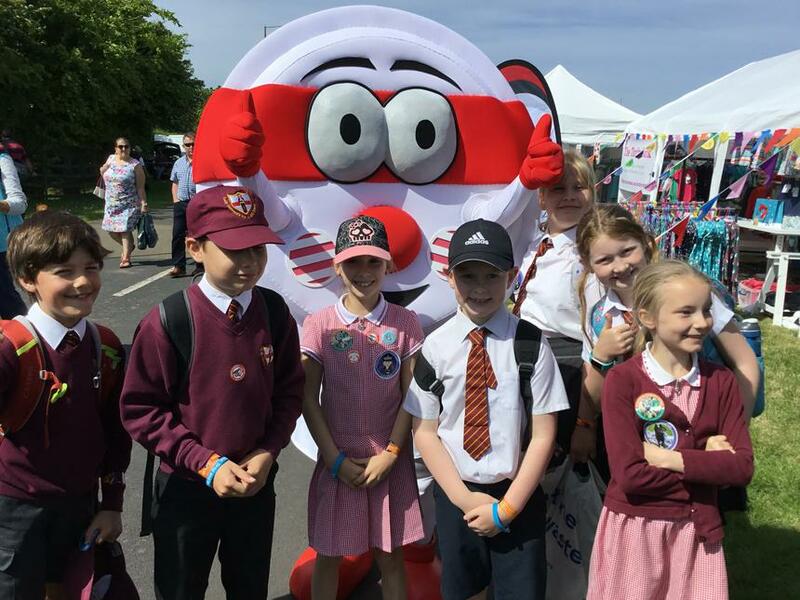 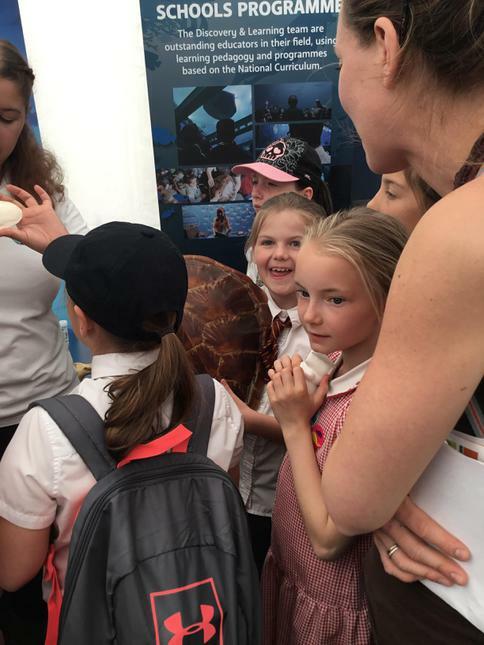 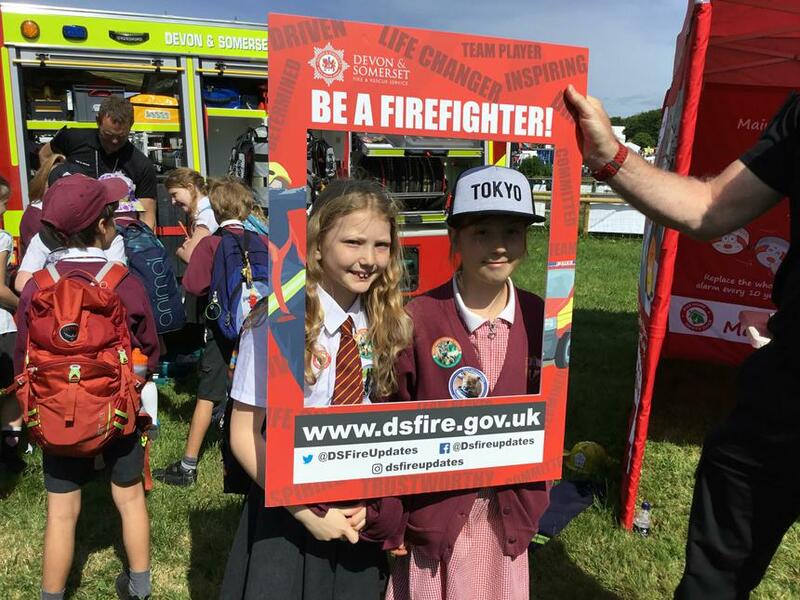 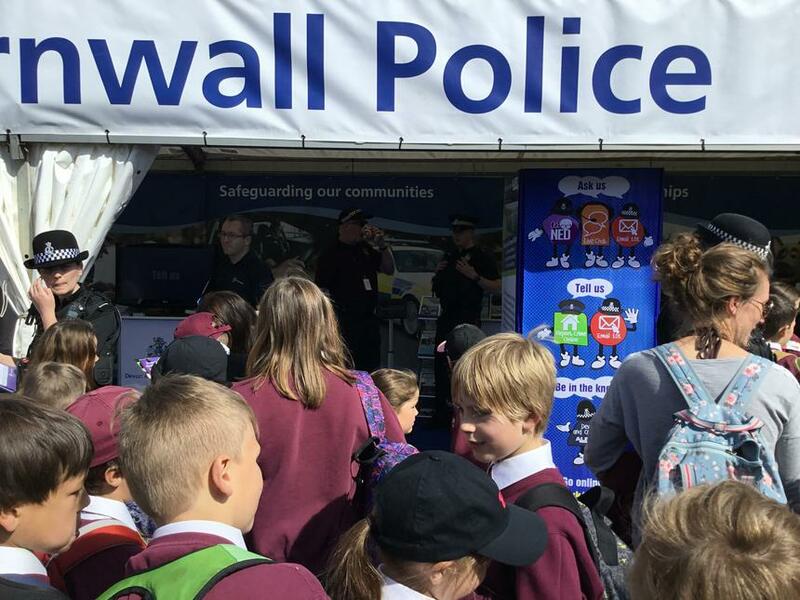 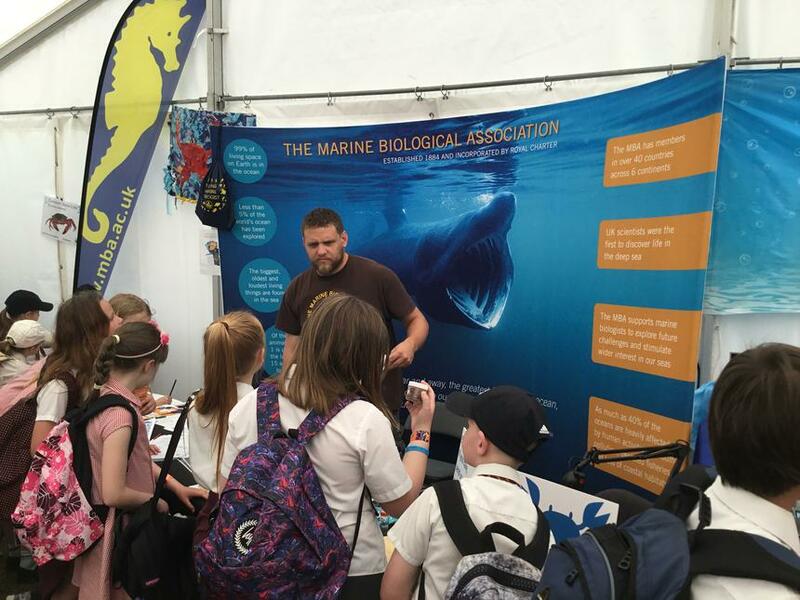 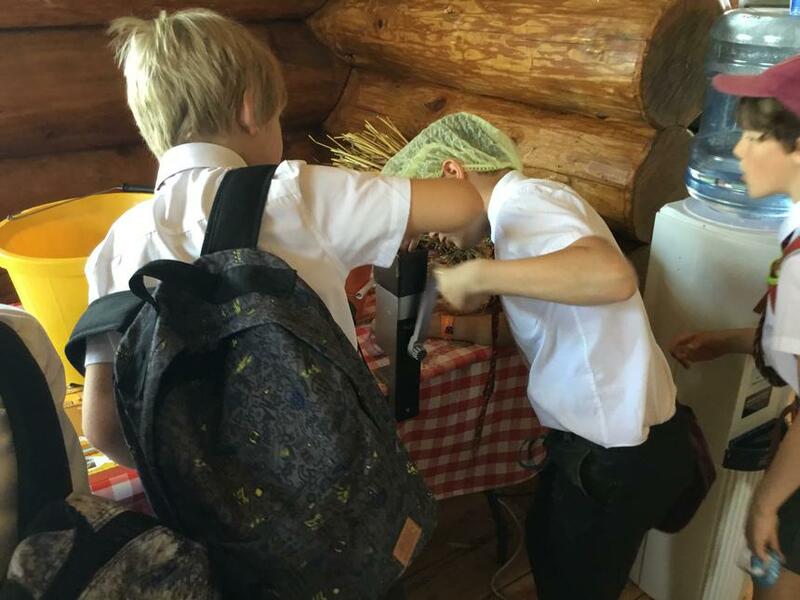 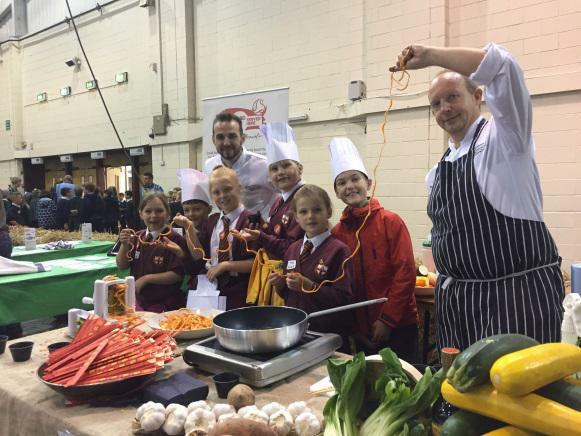 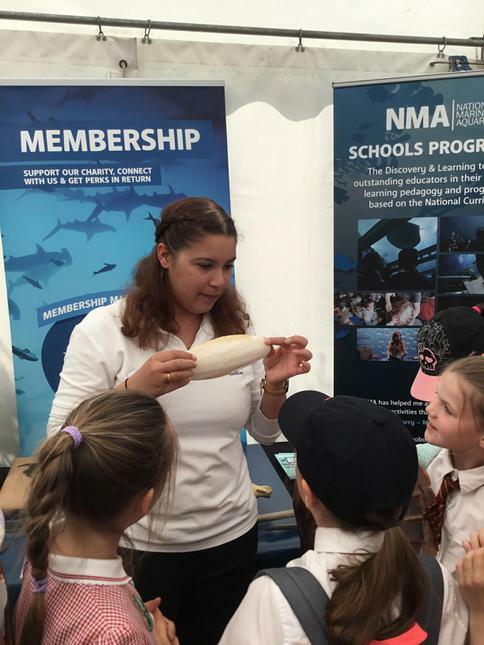 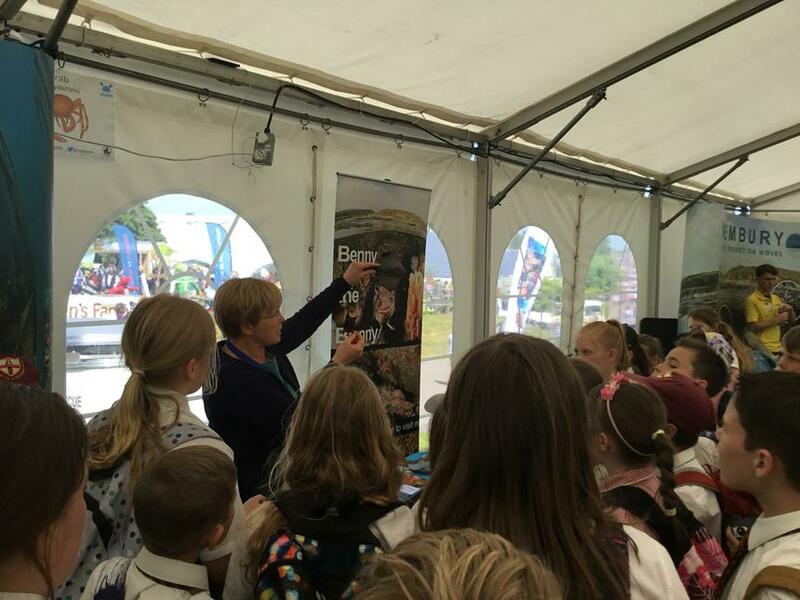 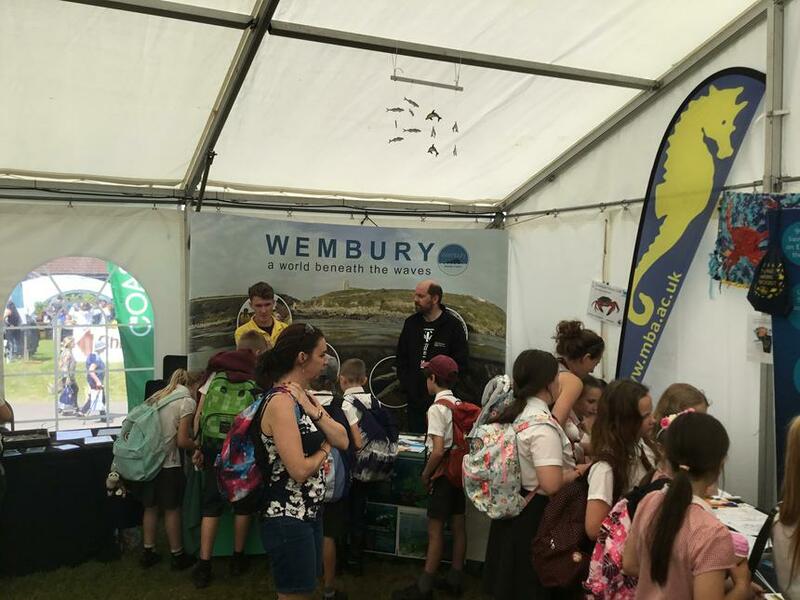 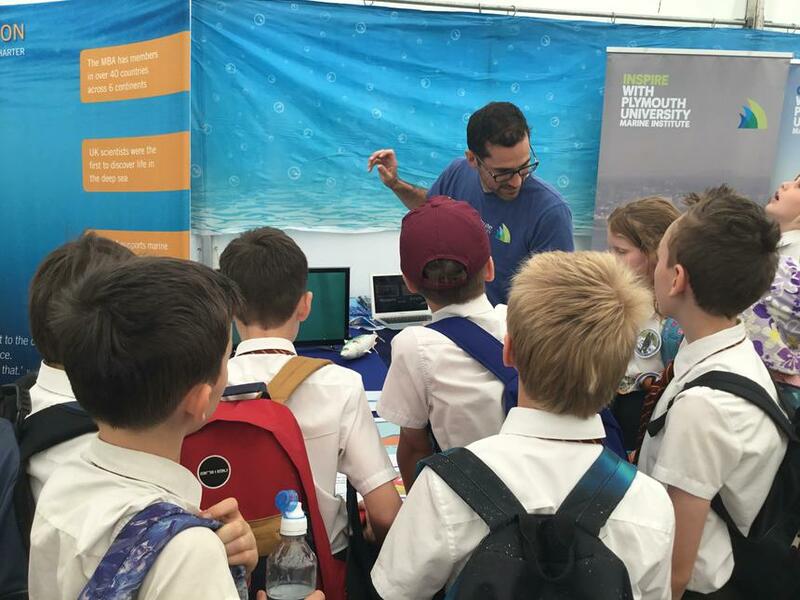 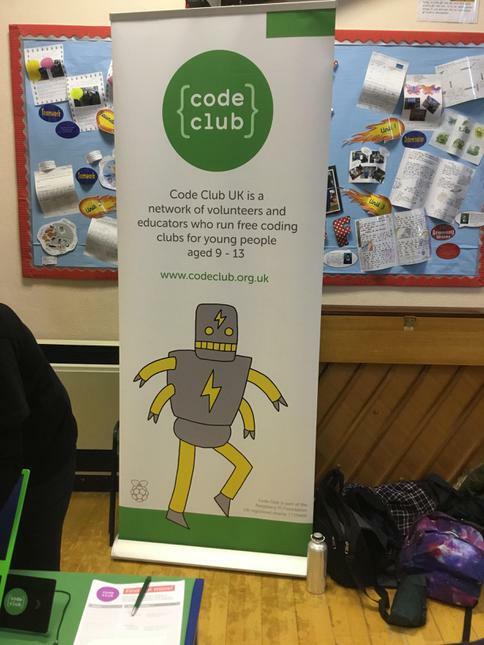 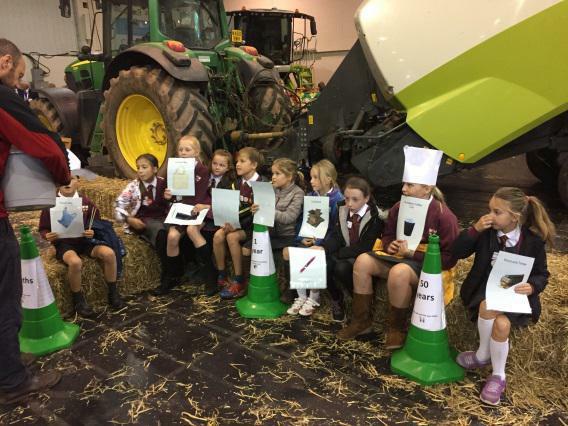 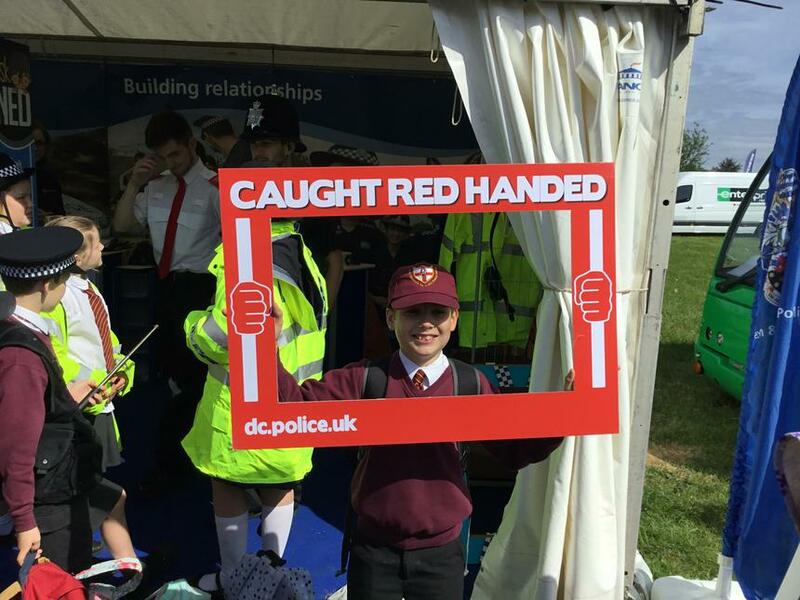 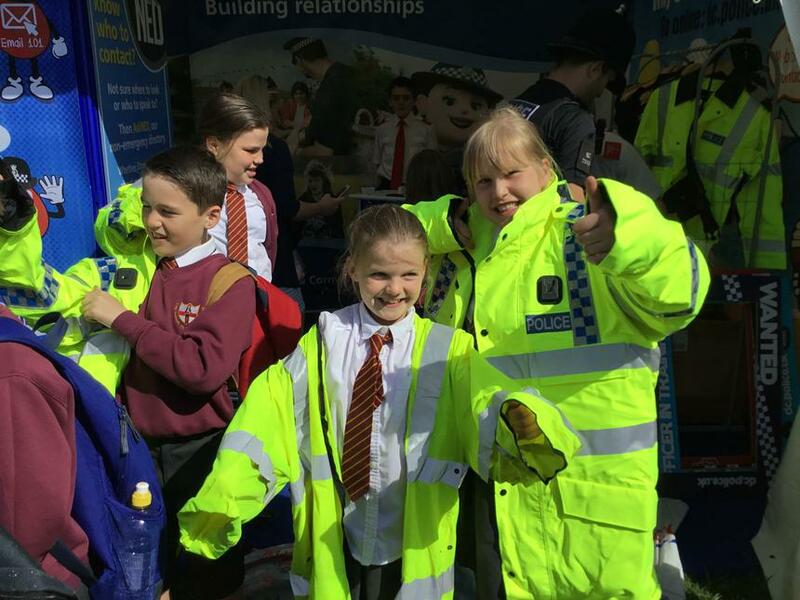 The children got the opportunity to meet many local businesses and education workshops. 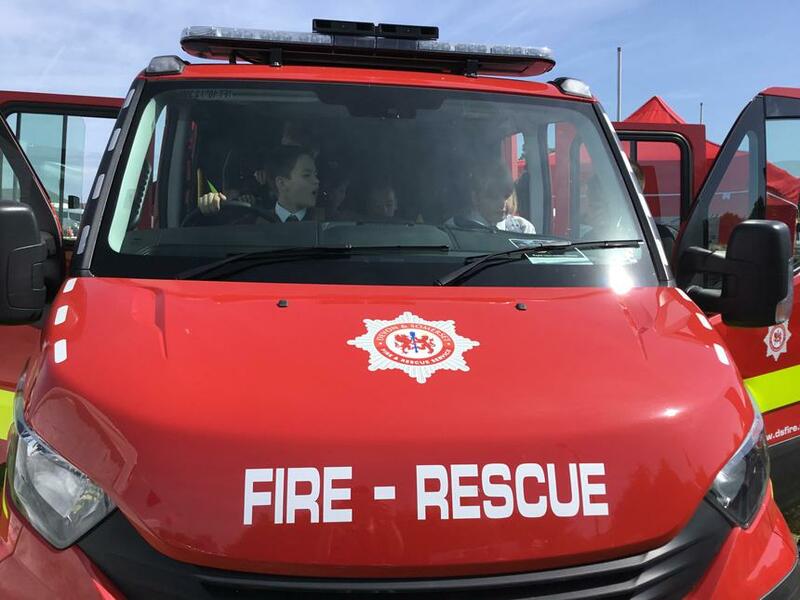 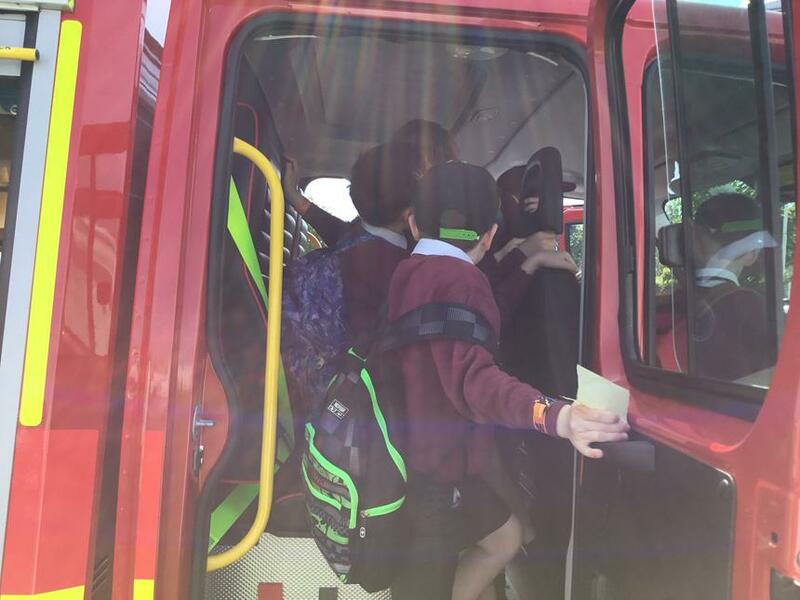 They got to make bread, butter and sit in a fire engine. 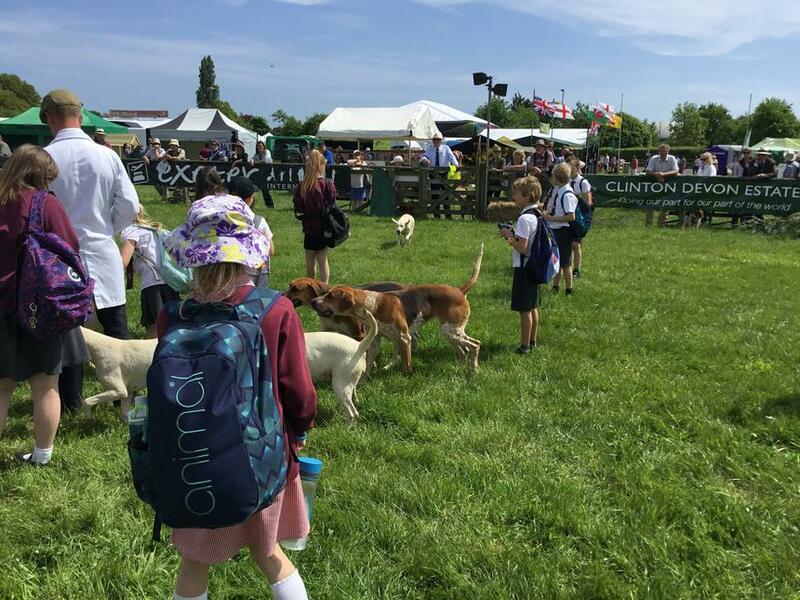 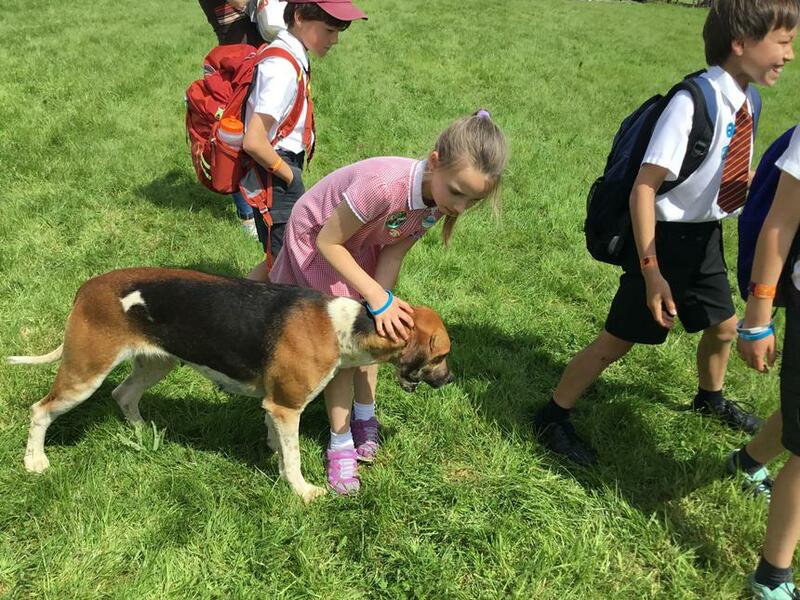 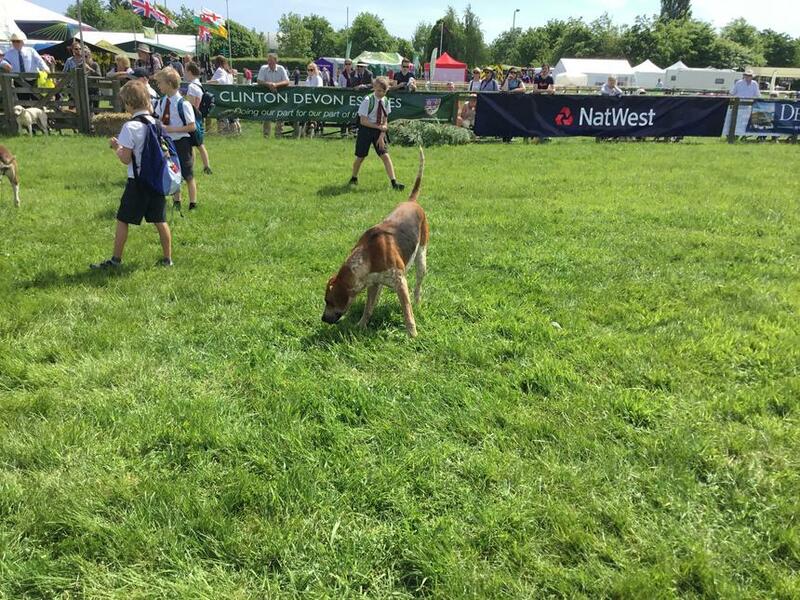 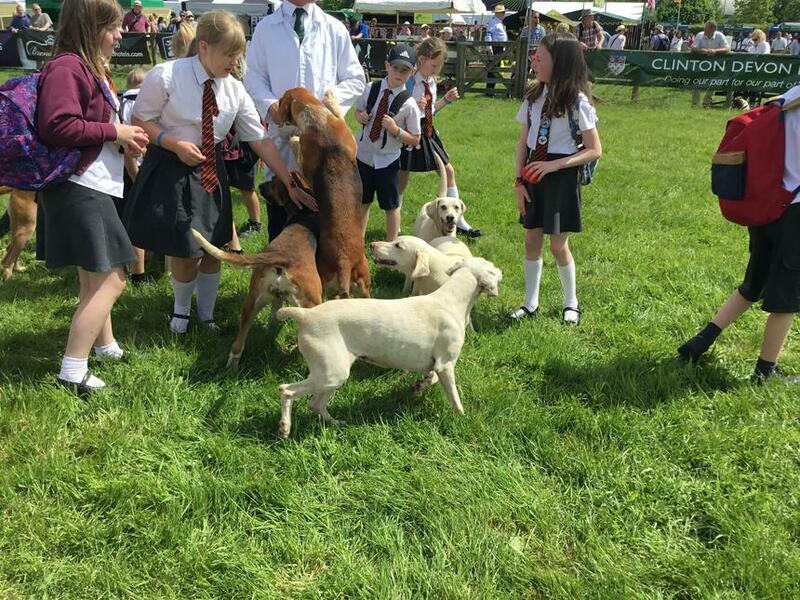 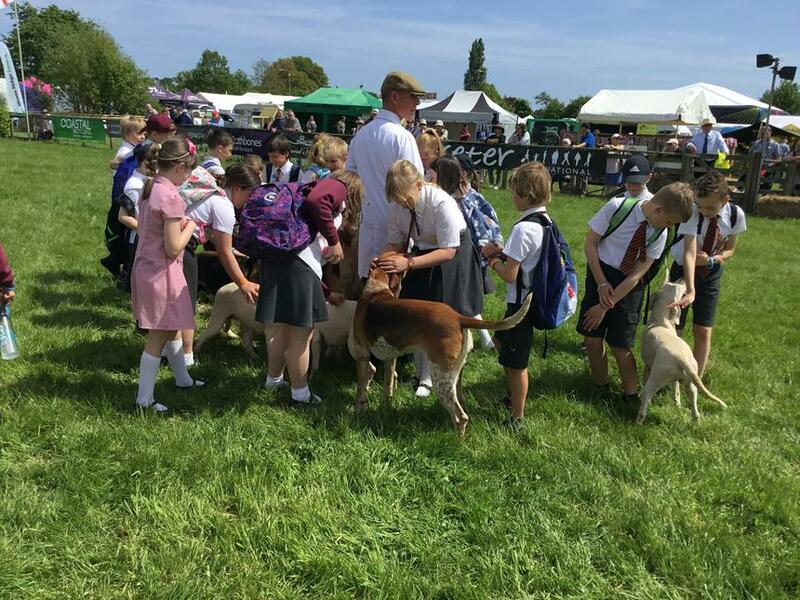 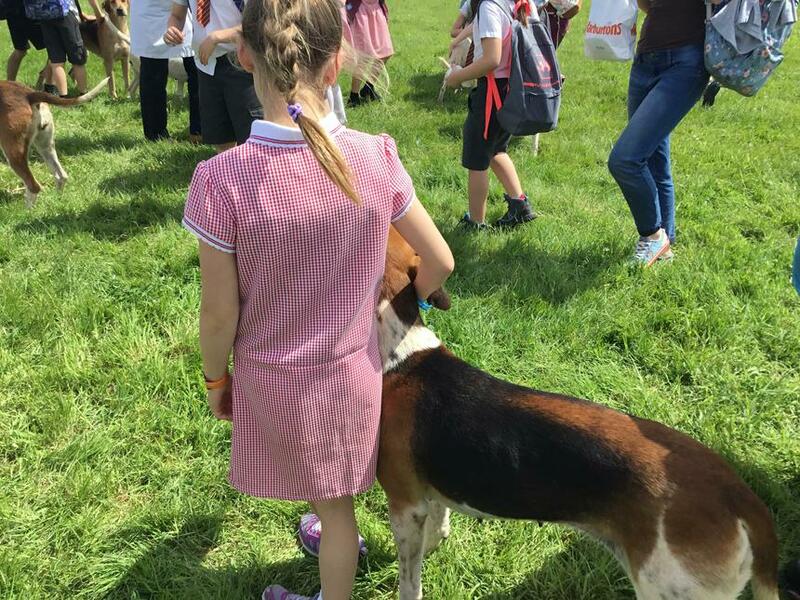 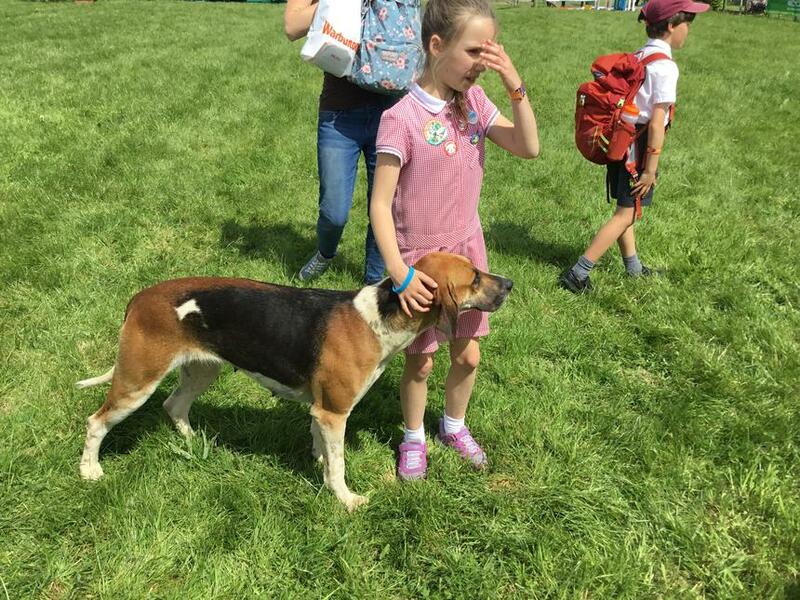 The children were also really lucky to be invited into the dog show to meet and greet the dogs. 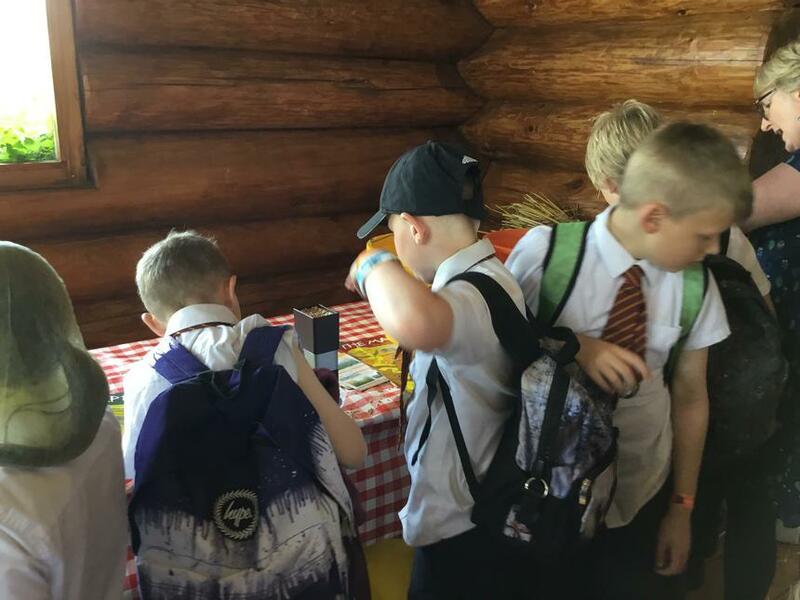 The children were allowed to bring some money with them where they got to choose where they would spend it: an ice cream, fast food or a toy. 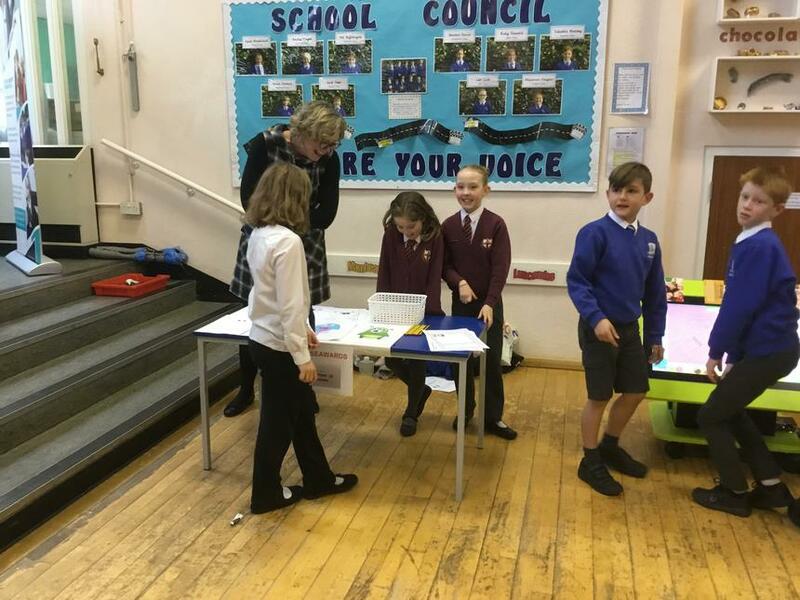 I have to say that this was my most enjoyable moment, witnessing the children filled with excitement in making their decision, speaking to the local businesses and calculating their change. 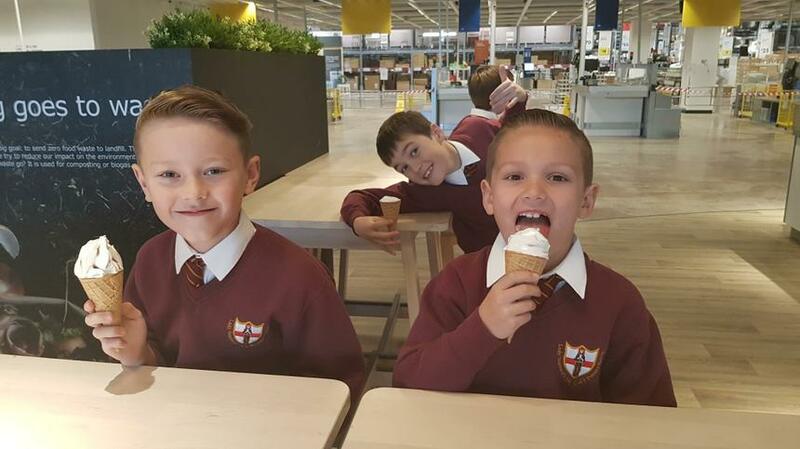 I’m still questioning why none of the children chose to spend their money on buying their teacher an ice cream though! 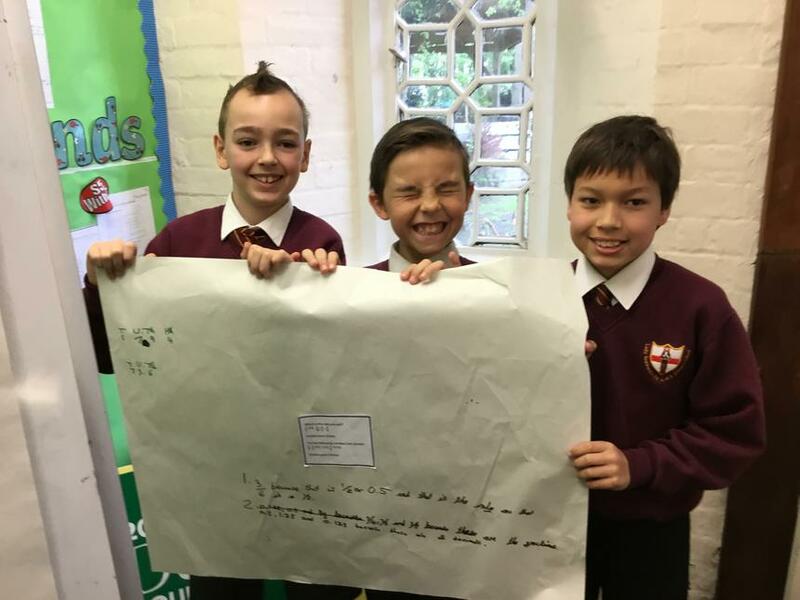 This will link well into our learning in maths where year 4 children will be exploring money and the year 5s will be calculating percentages. 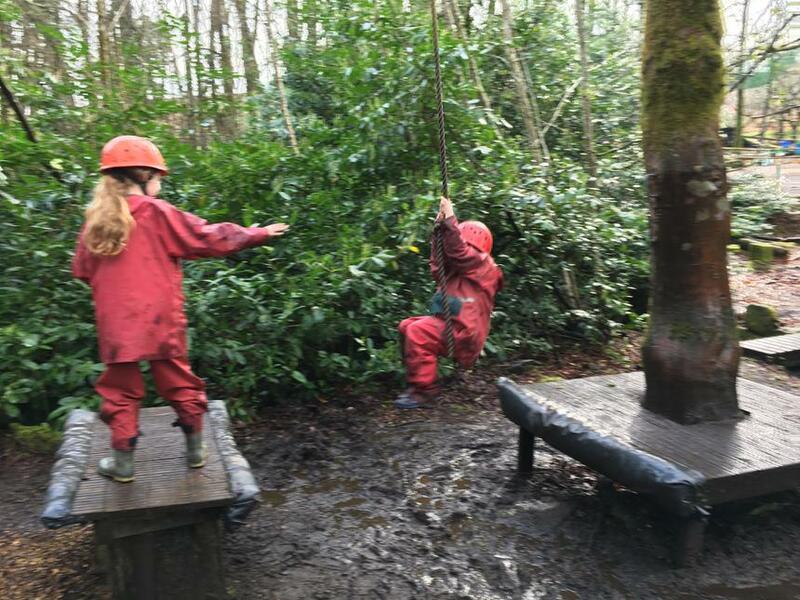 The behaviour of the children was outstanding through the whole day with the staff commenting on how well mannered the children were. 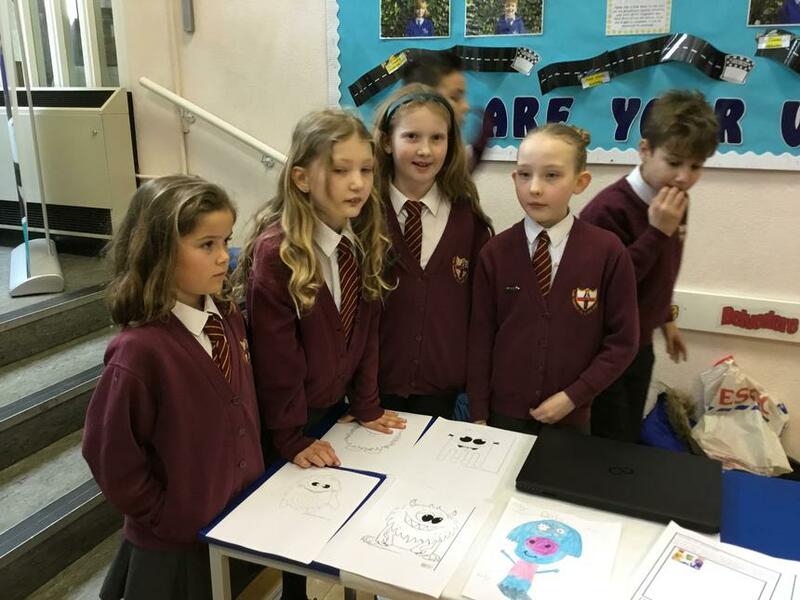 A huge thank you to everyone we interacted with at the show and to our parent helpers. 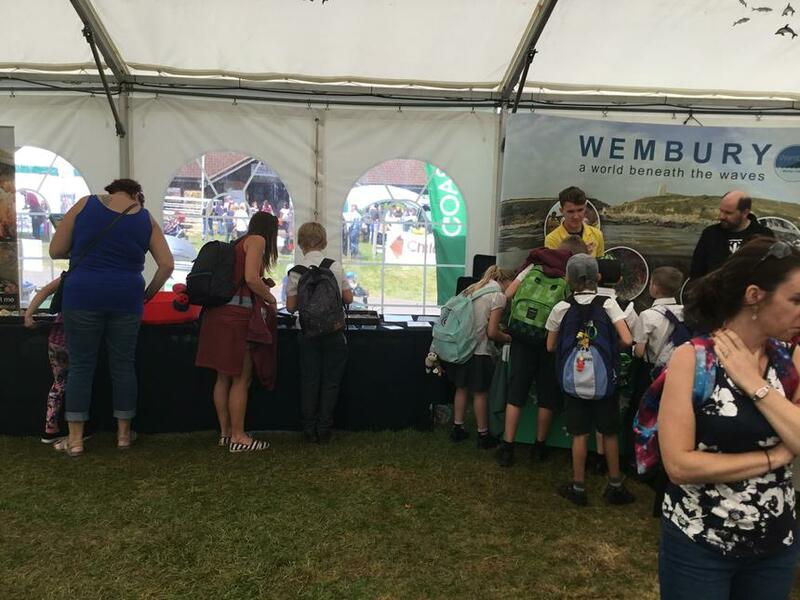 We hope to return again next year. 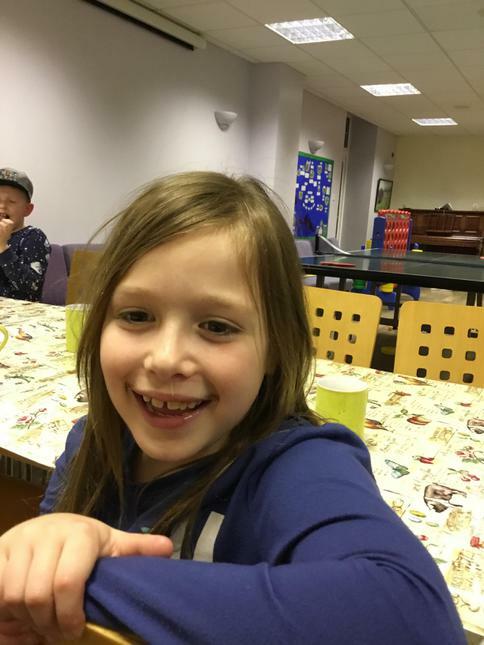 In lunch club, children made some lovely dream catchers with old CD’s, string and decorative equipment. 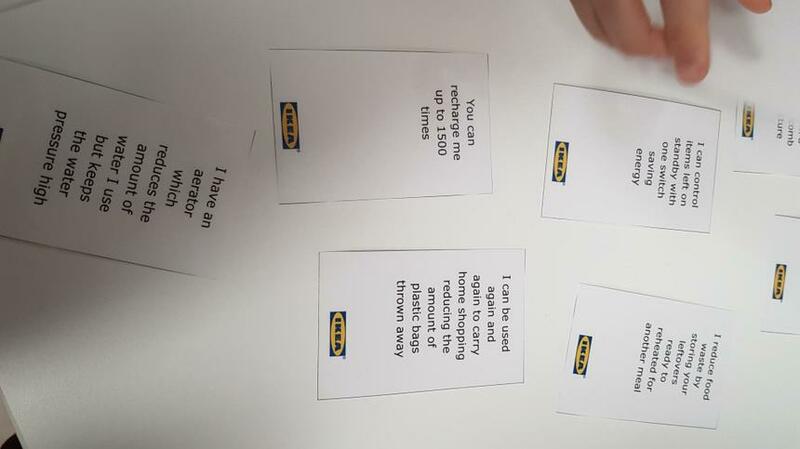 ‘These were really interesting to make. 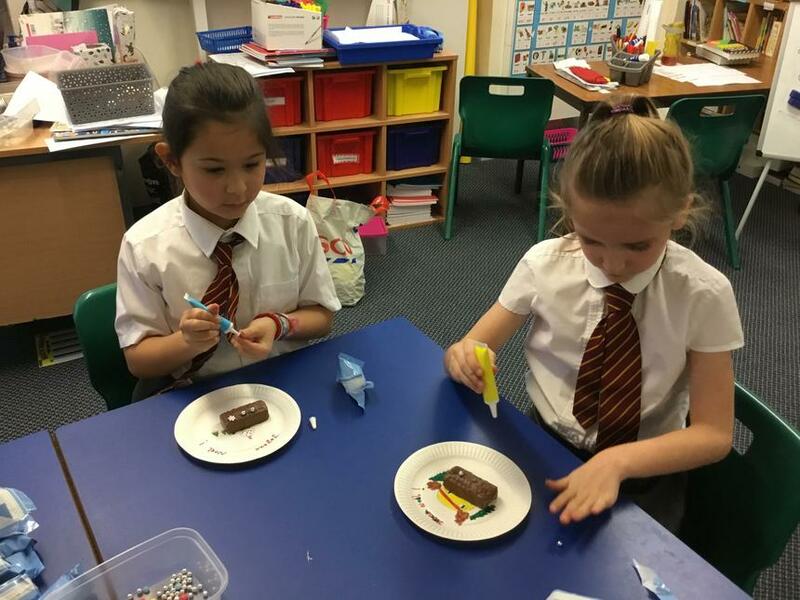 I enjoyed using the cool glue gun to stick them together’ - Stefan. 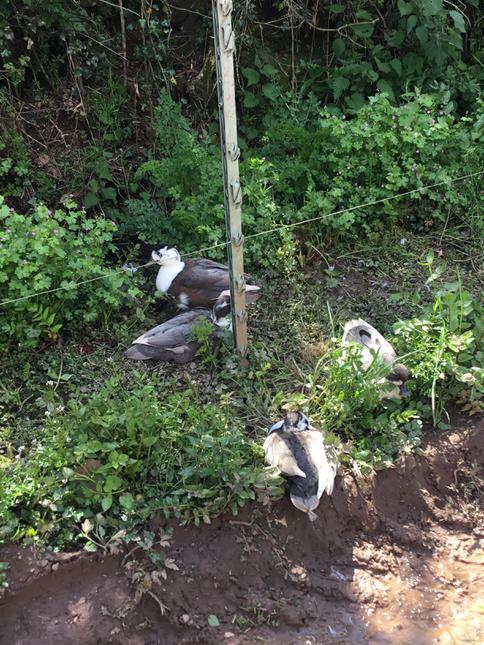 These are displayed in our school garden. 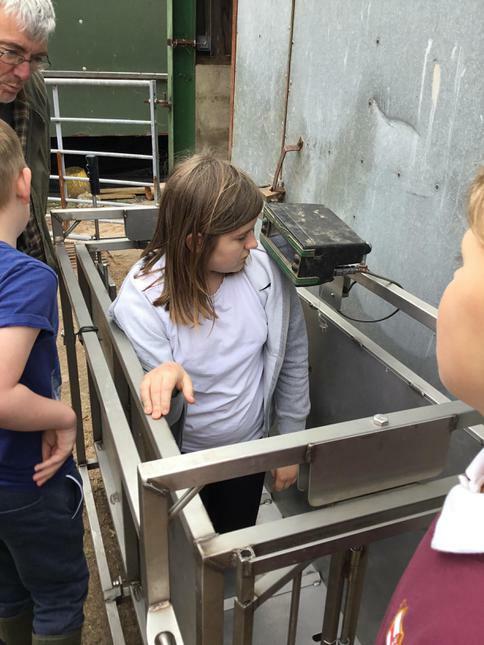 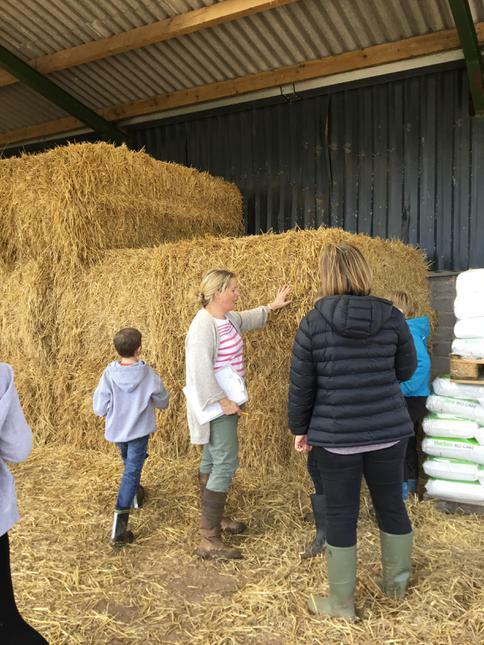 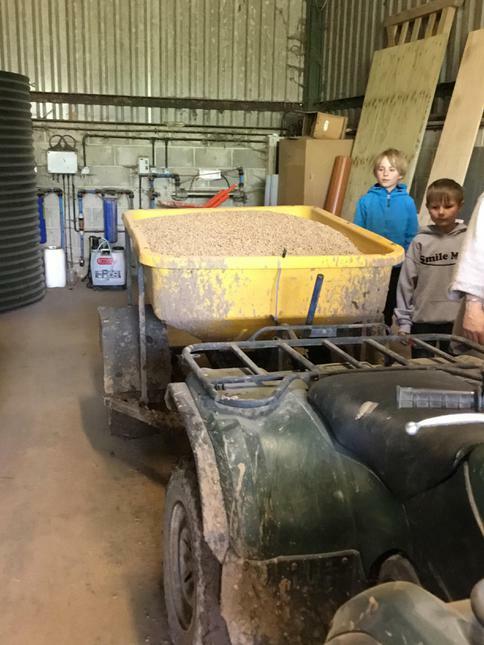 Kenniford farm kindly invited a group of children over to their wonderful farm to learn about the process of running a farm. 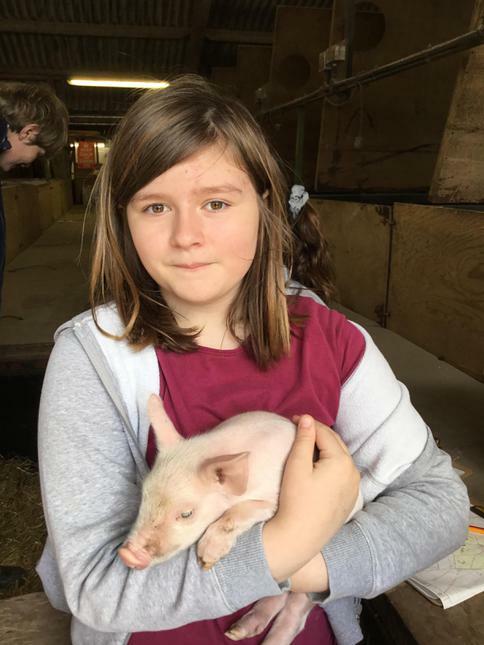 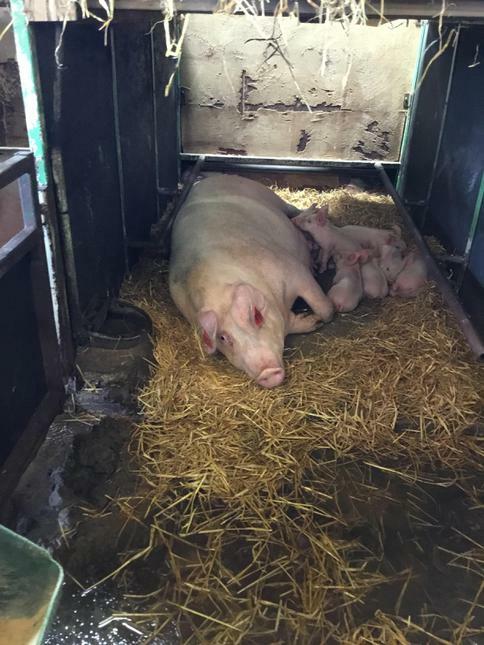 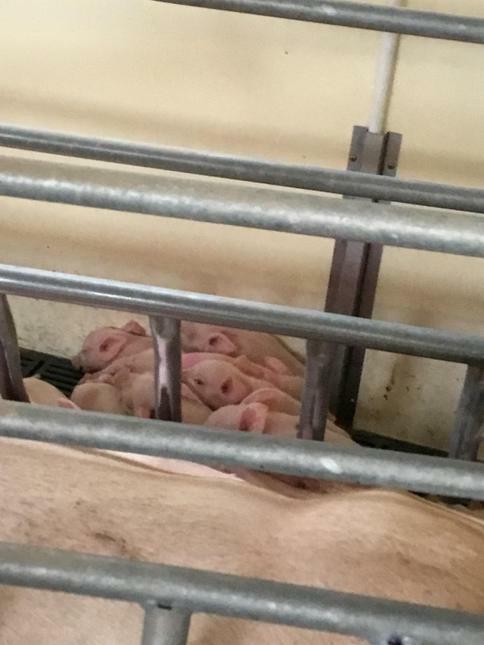 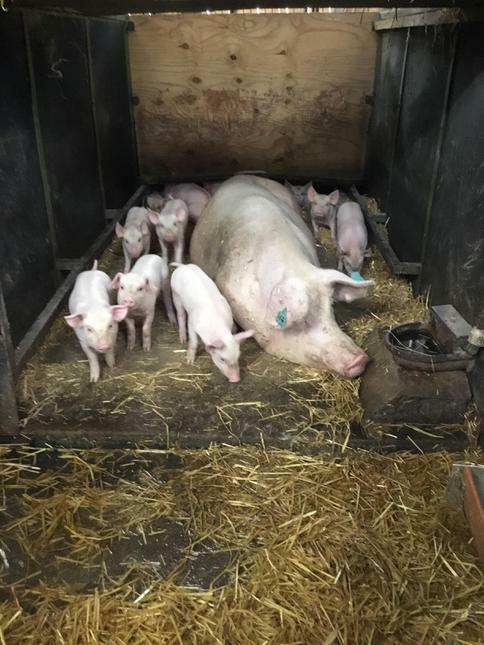 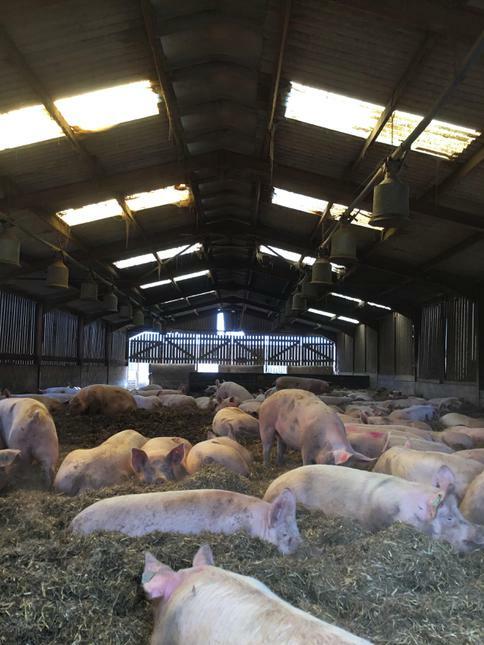 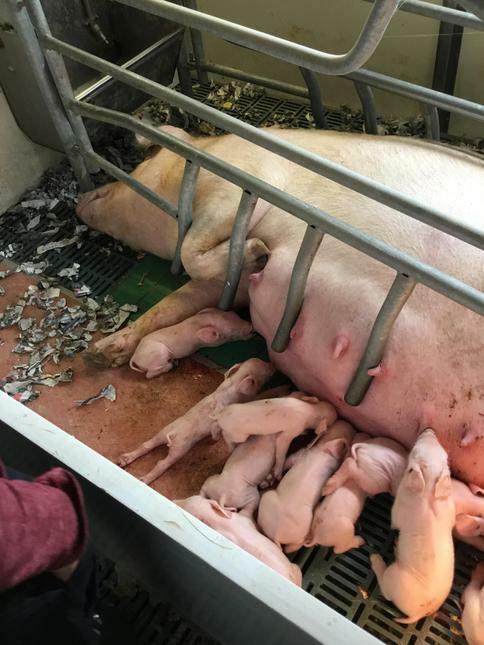 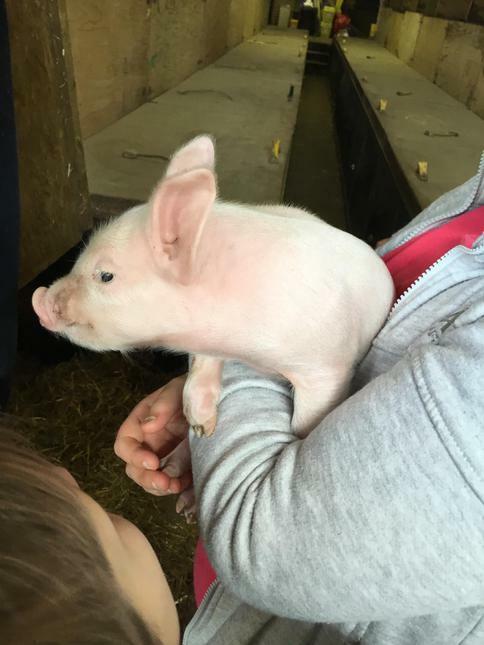 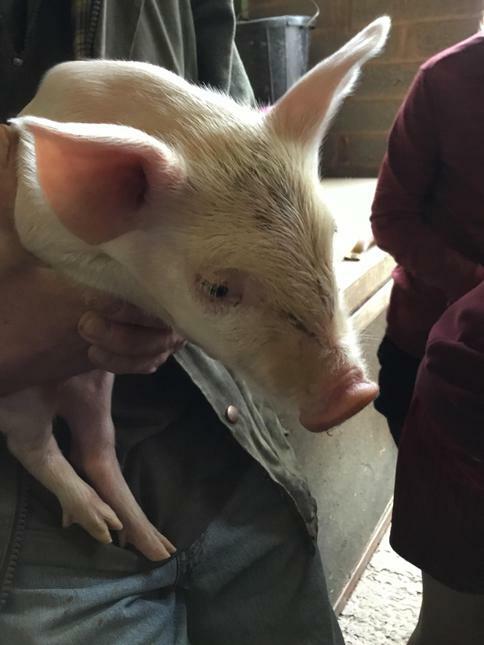 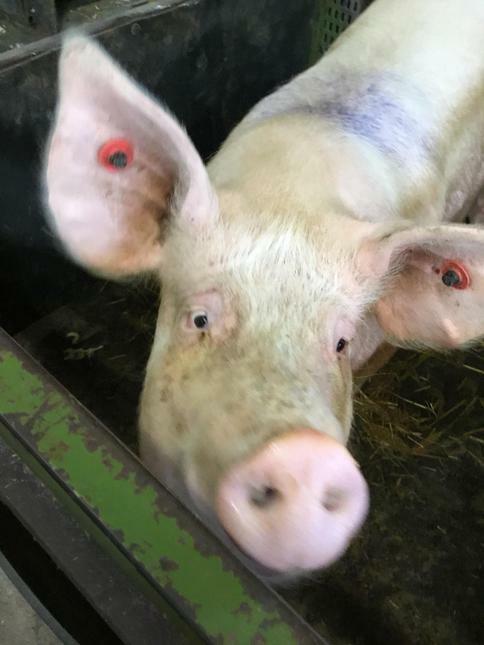 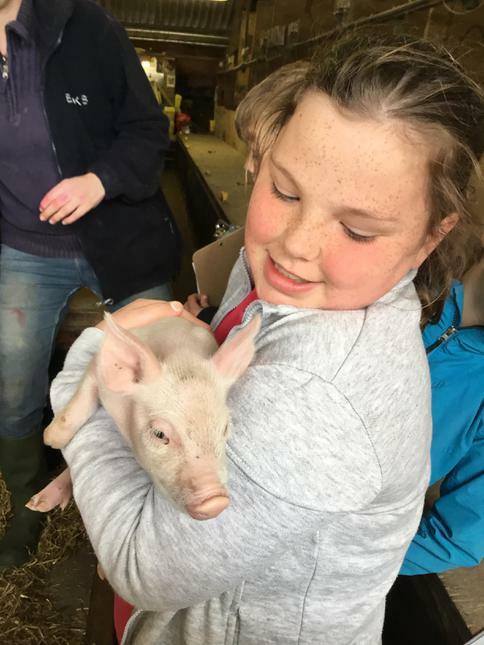 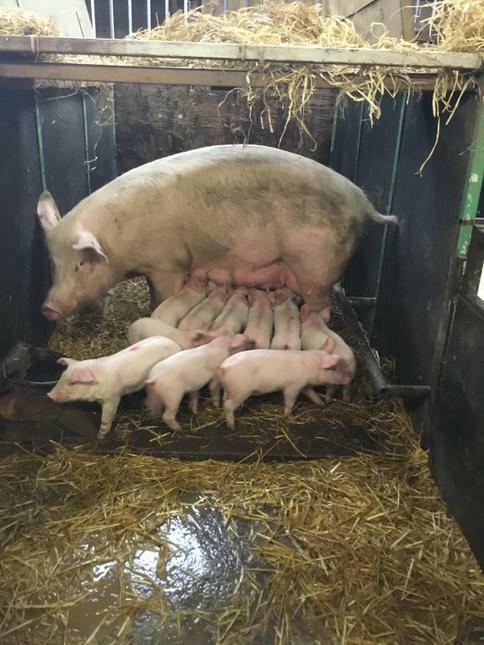 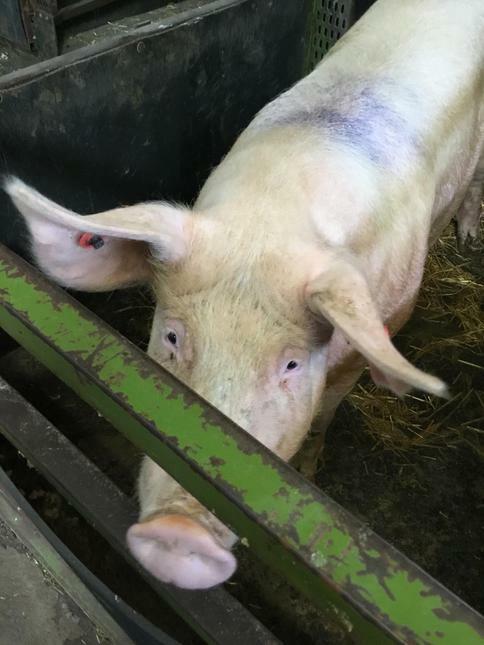 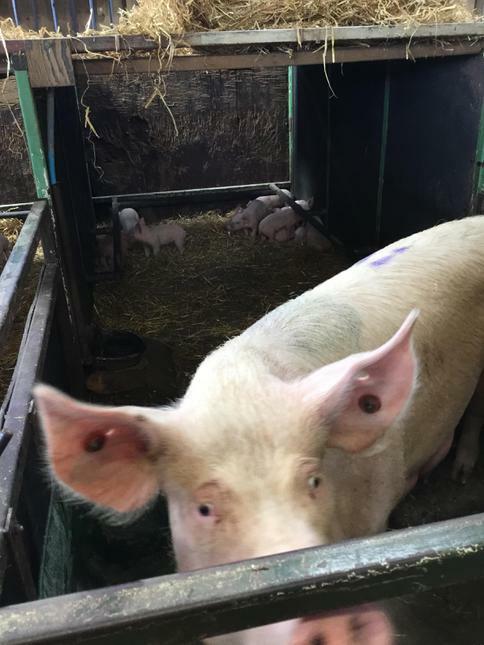 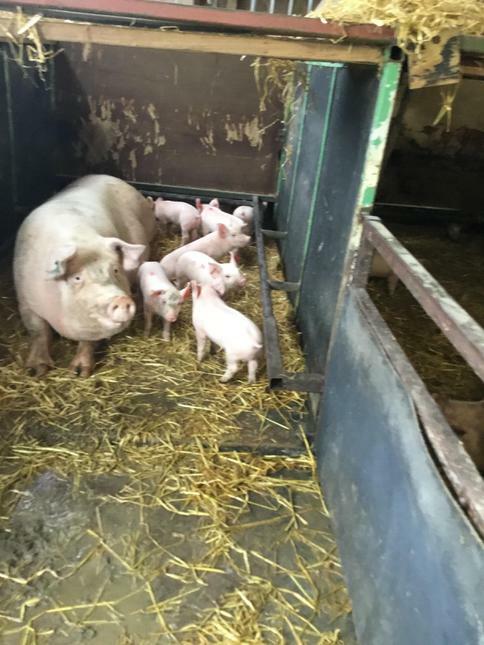 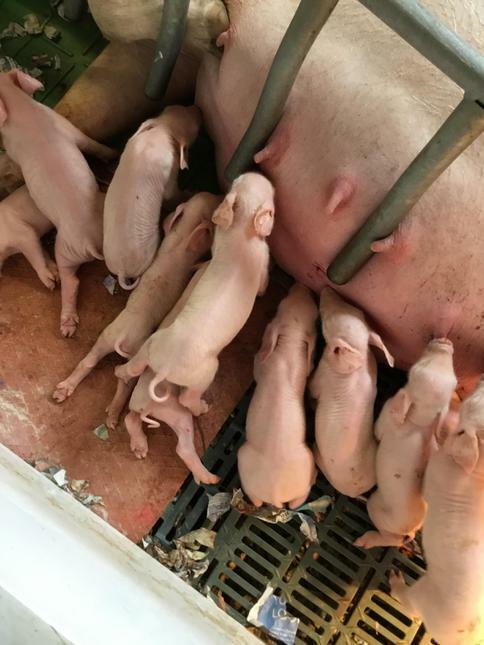 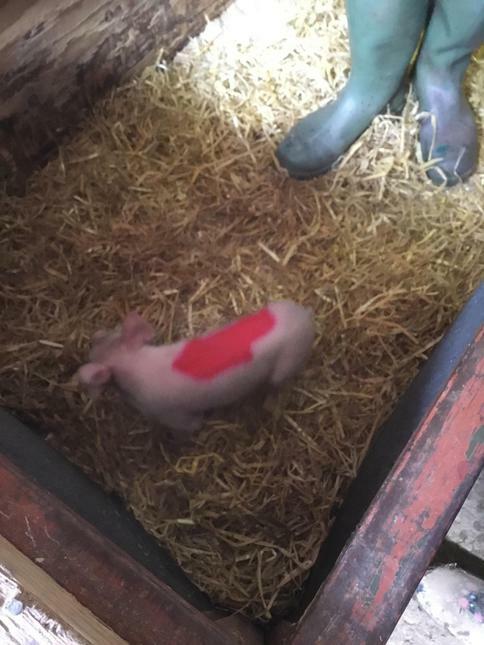 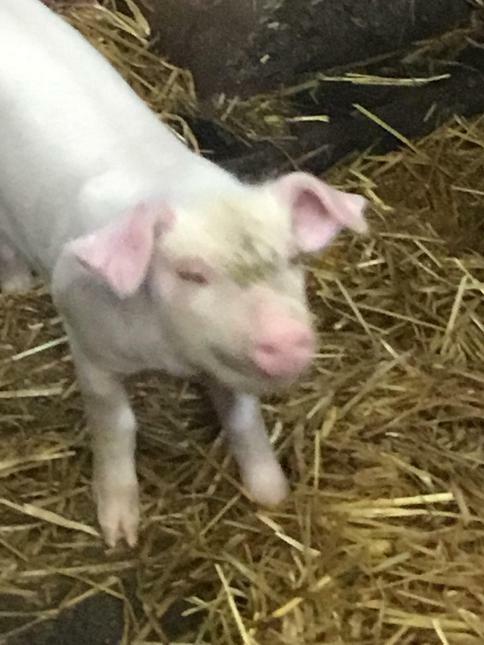 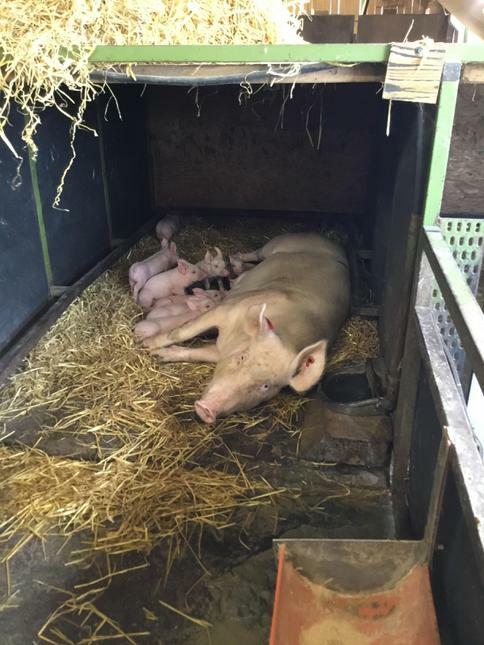 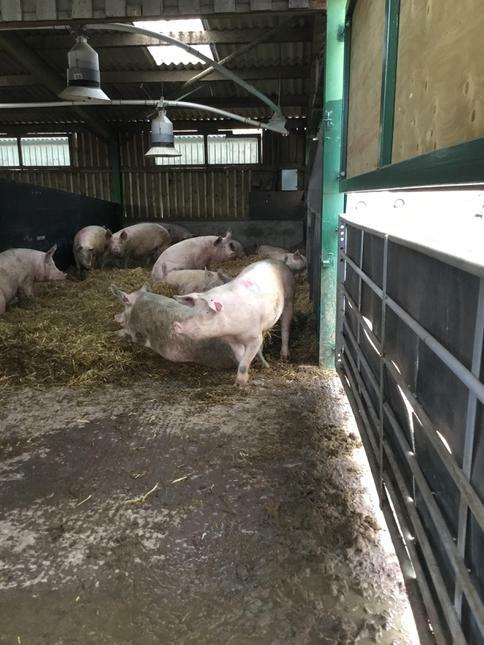 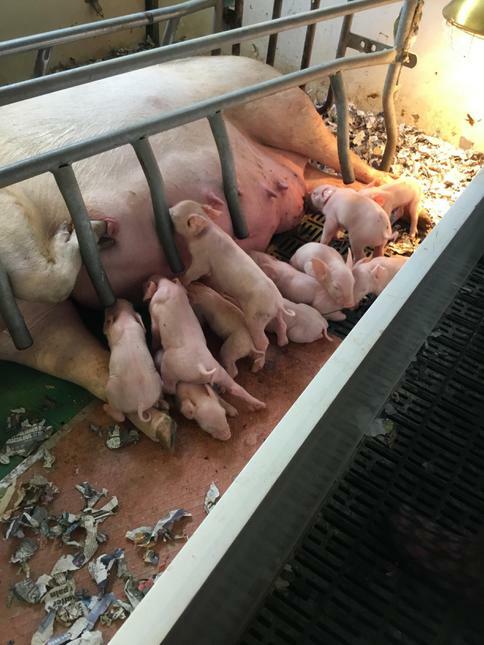 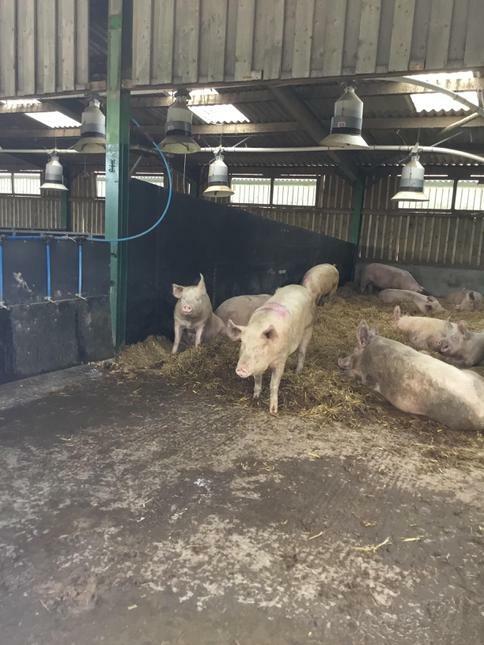 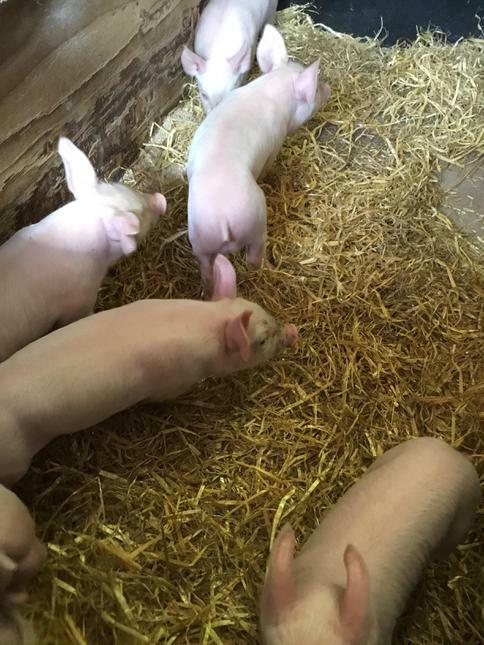 The children were lucky enough to witness the birth of some piglets and welcomed one into the world by picking it’s name. 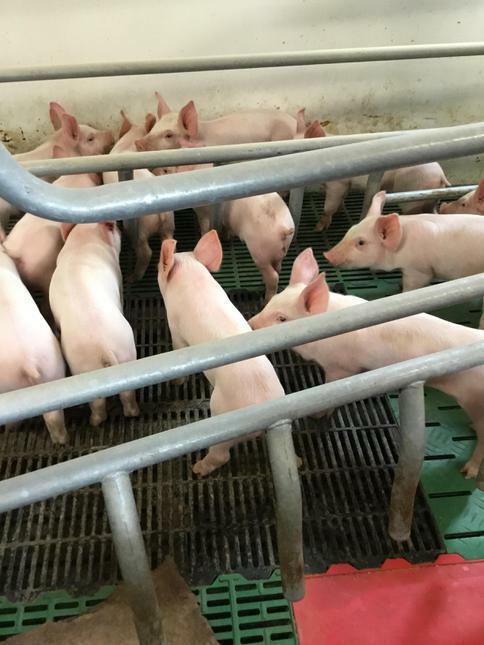 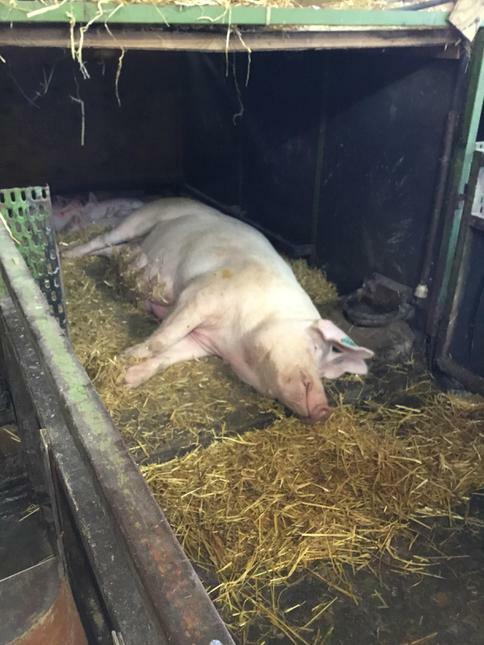 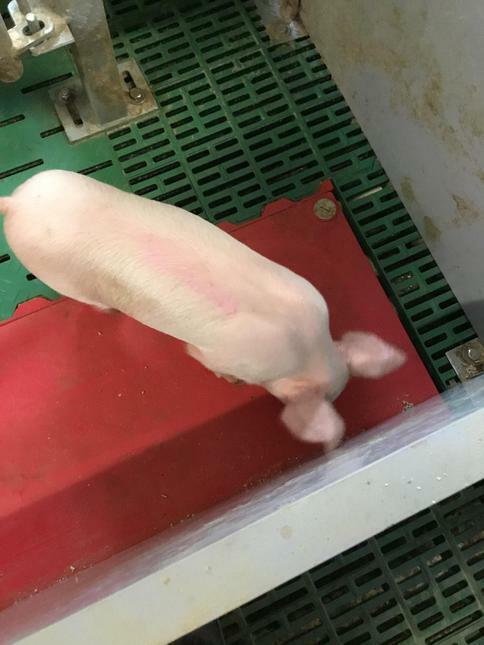 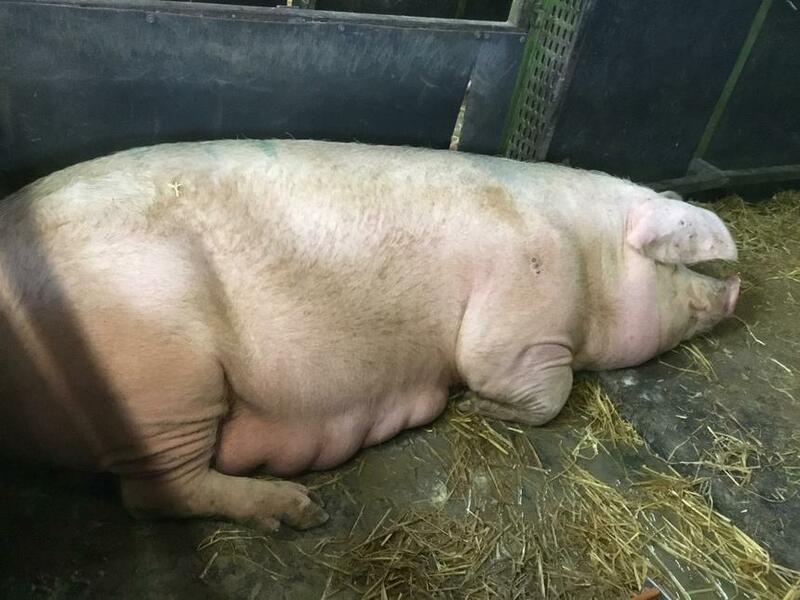 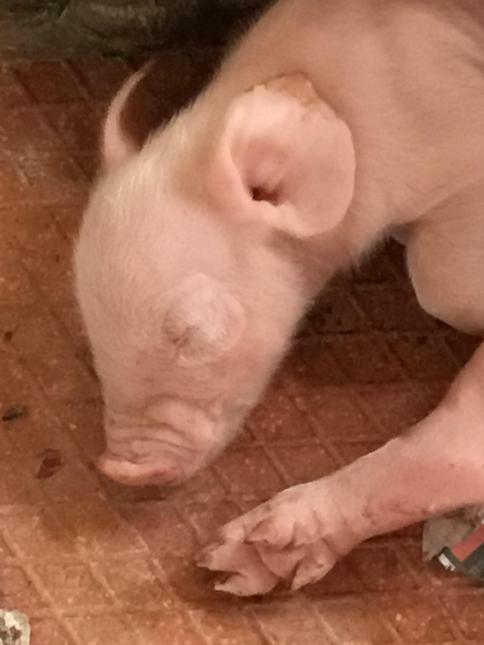 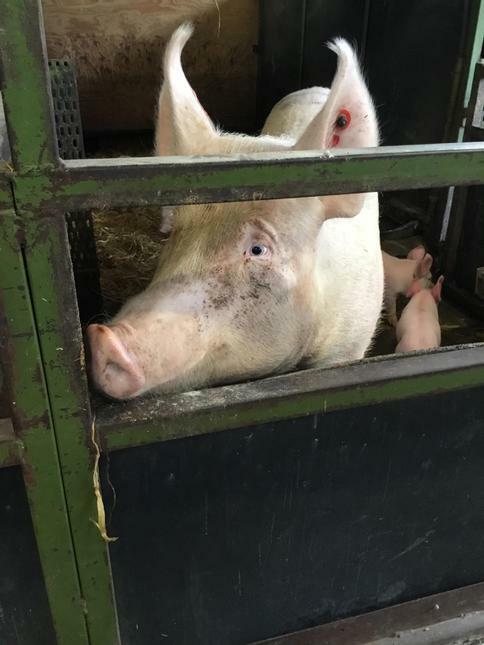 They named the piglet Cherry and will check on her progress every week, including checking her weight. 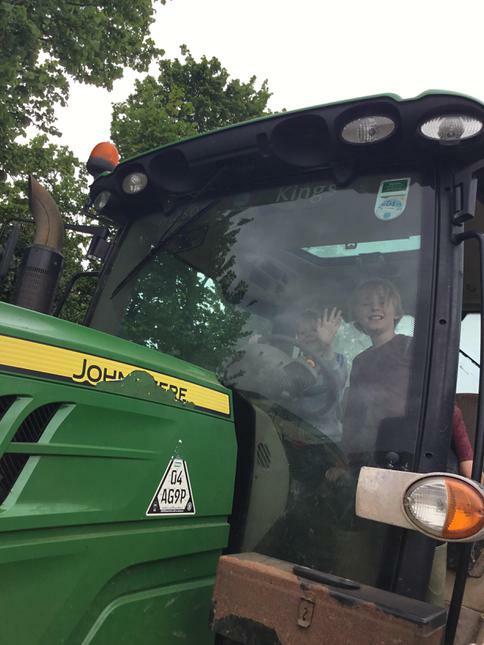 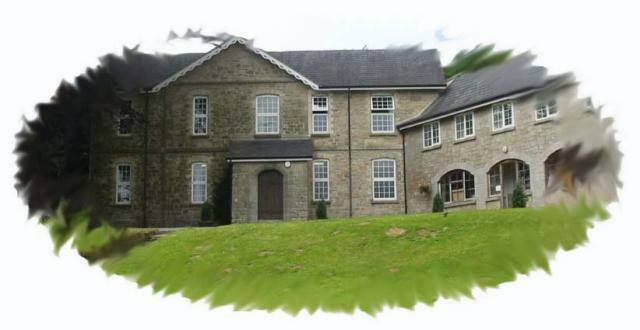 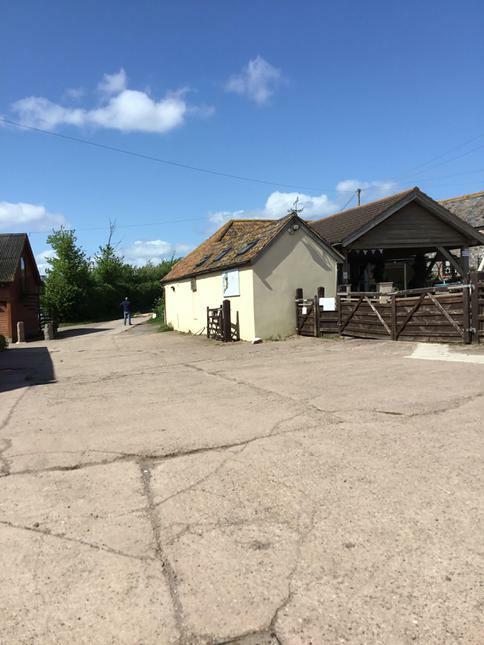 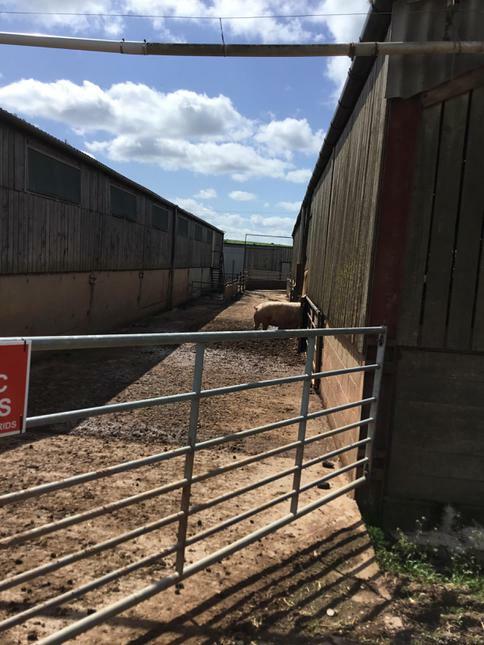 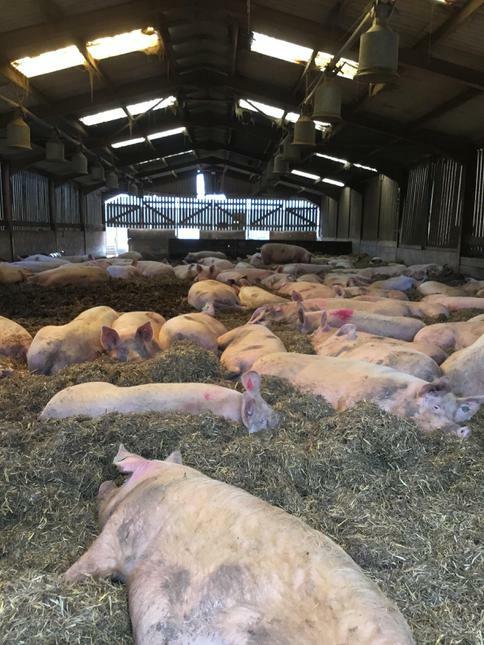 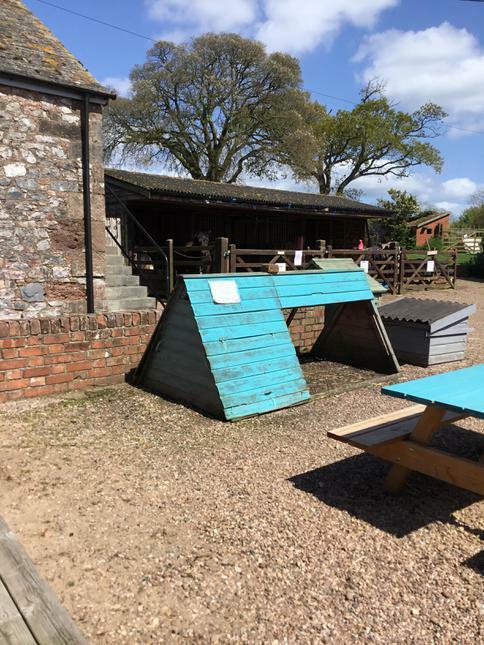 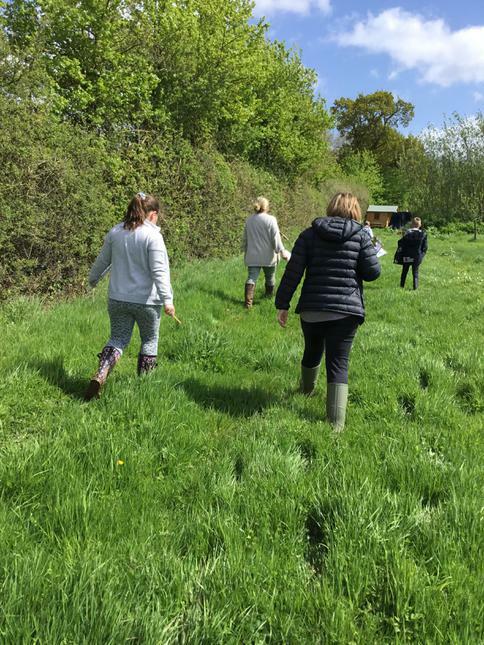 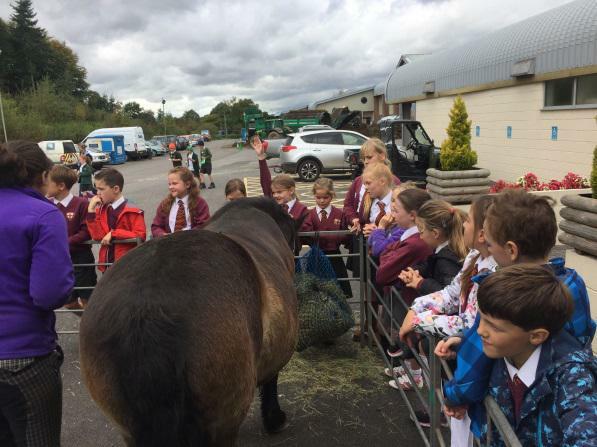 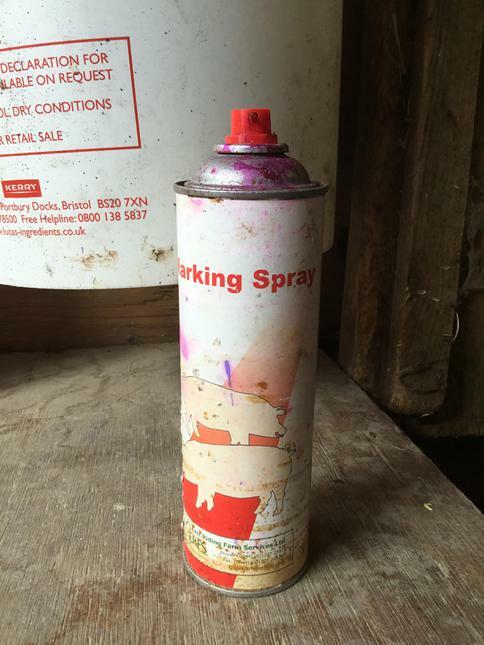 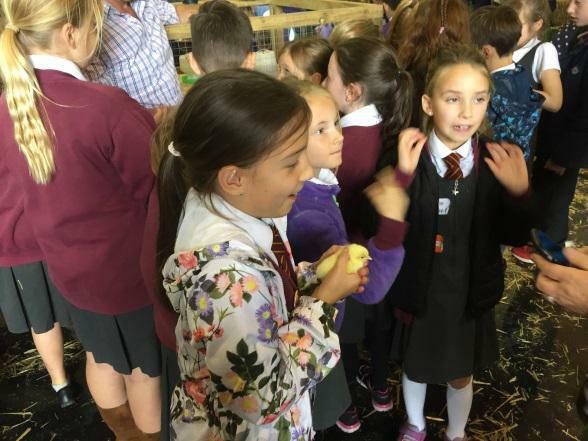 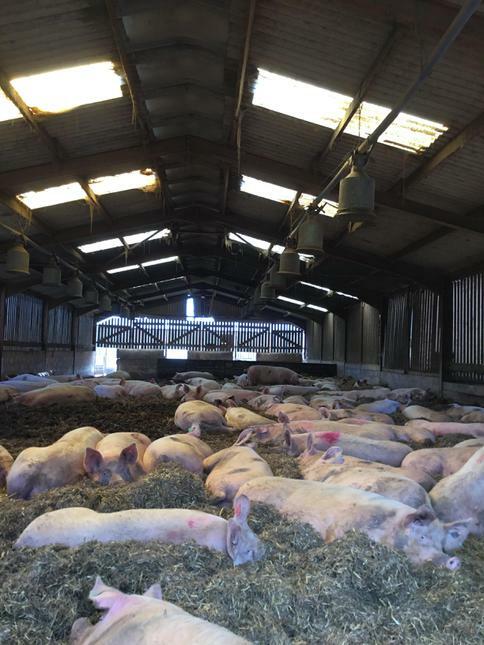 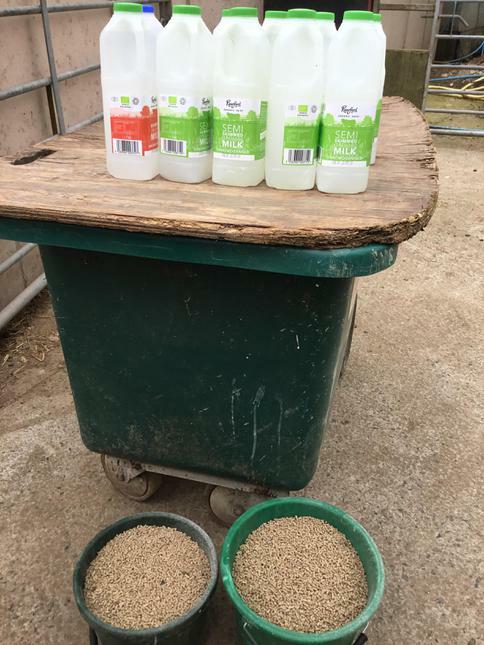 I would like to say a huge thank you to Kenniford Farm for allowing children to come to their farm. 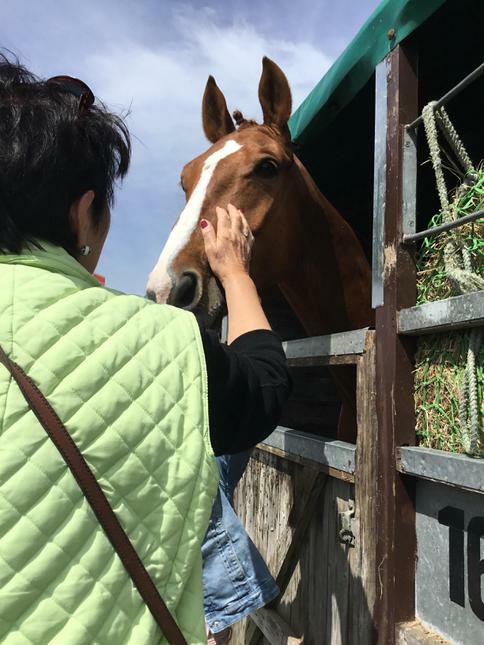 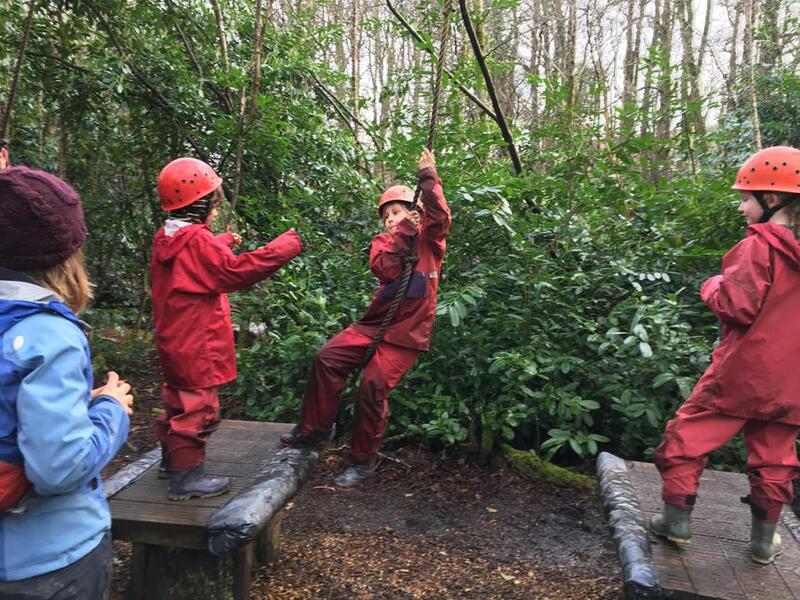 They have enjoyed the experience very much and always look forward to returning. 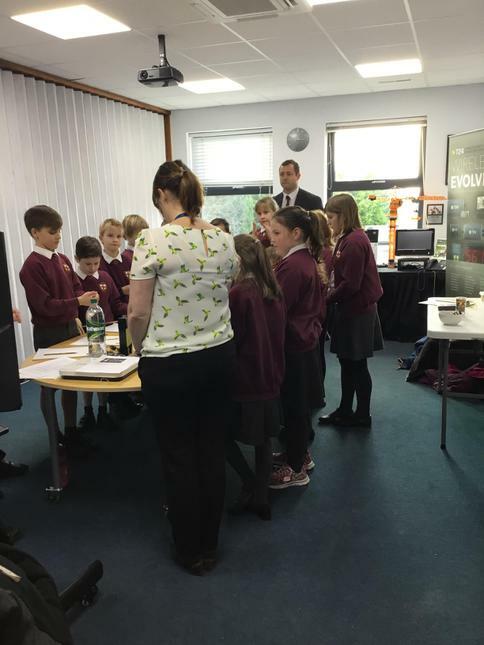 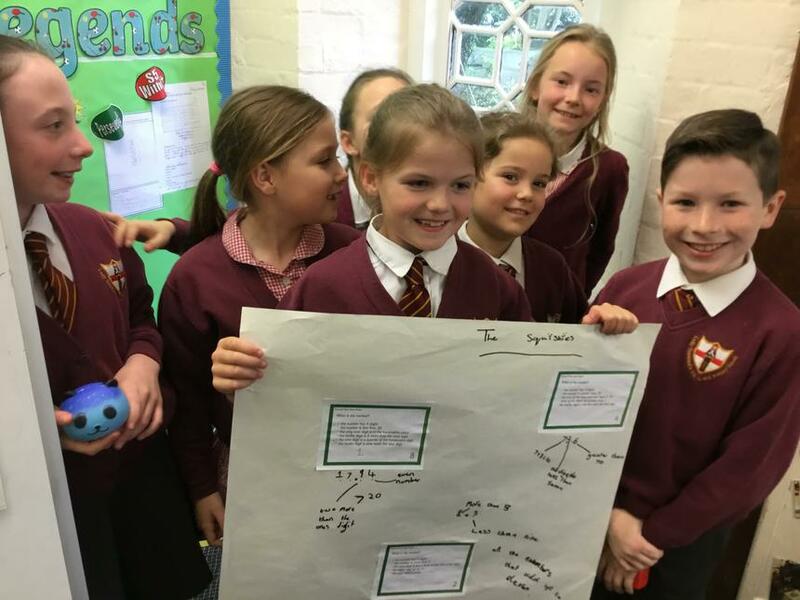 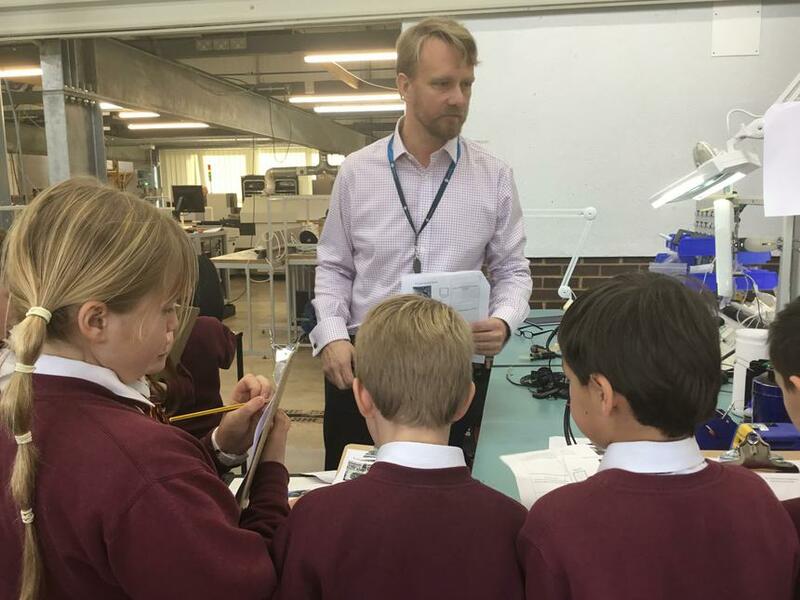 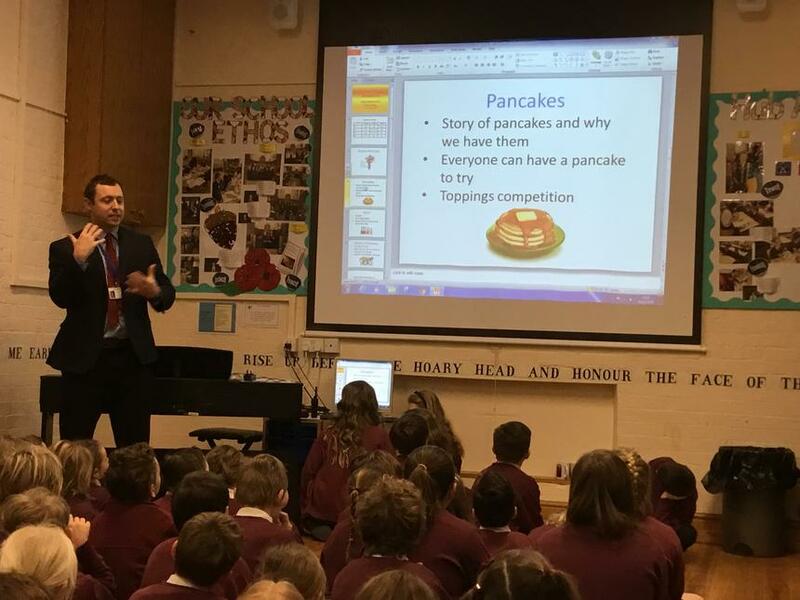 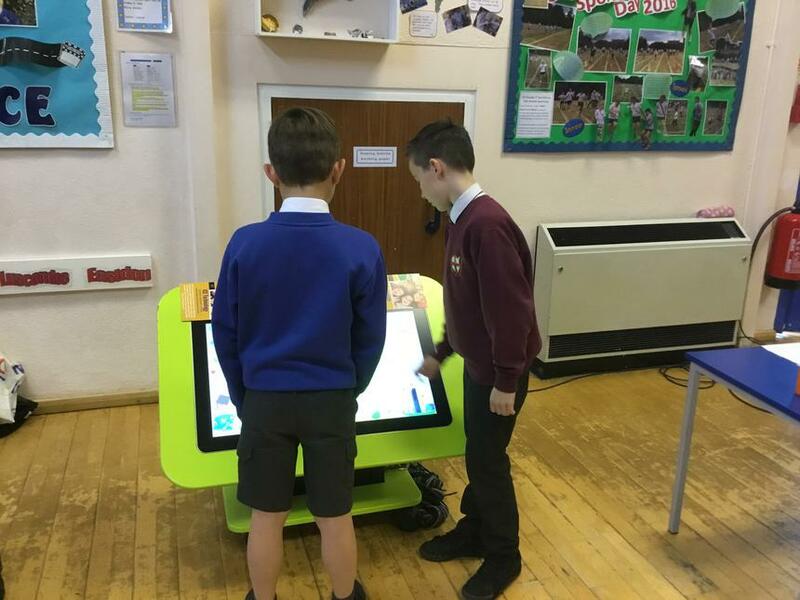 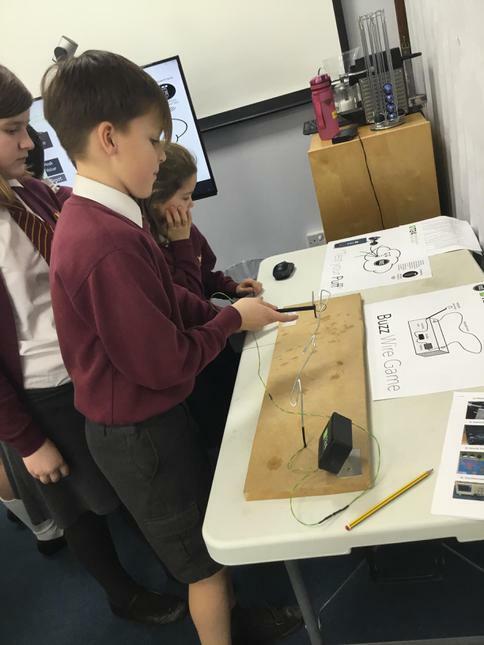 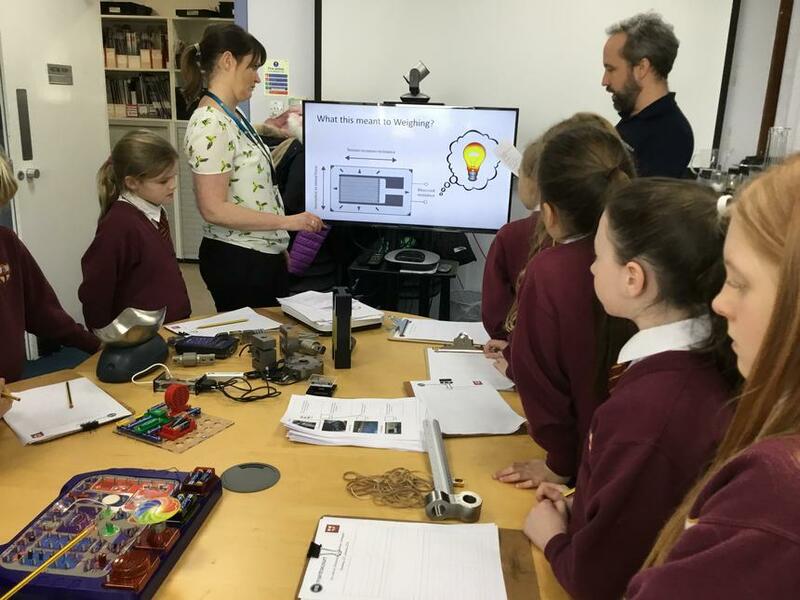 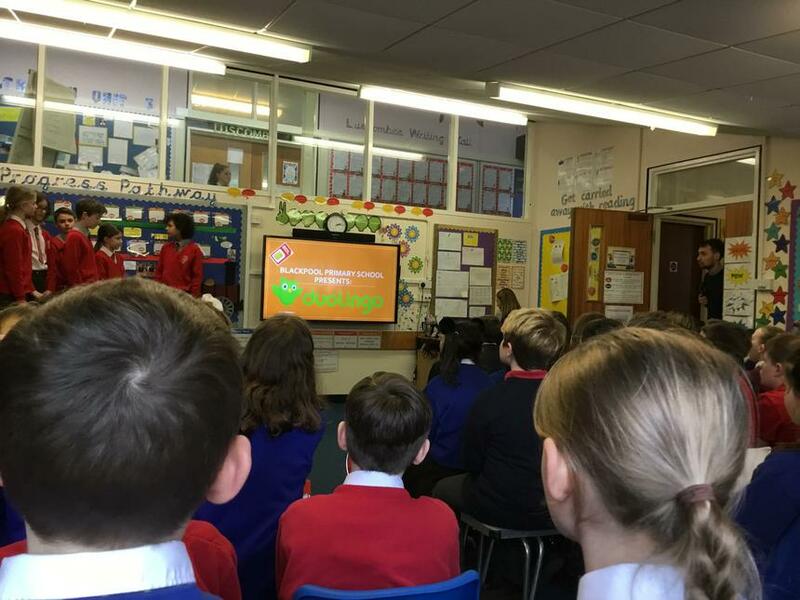 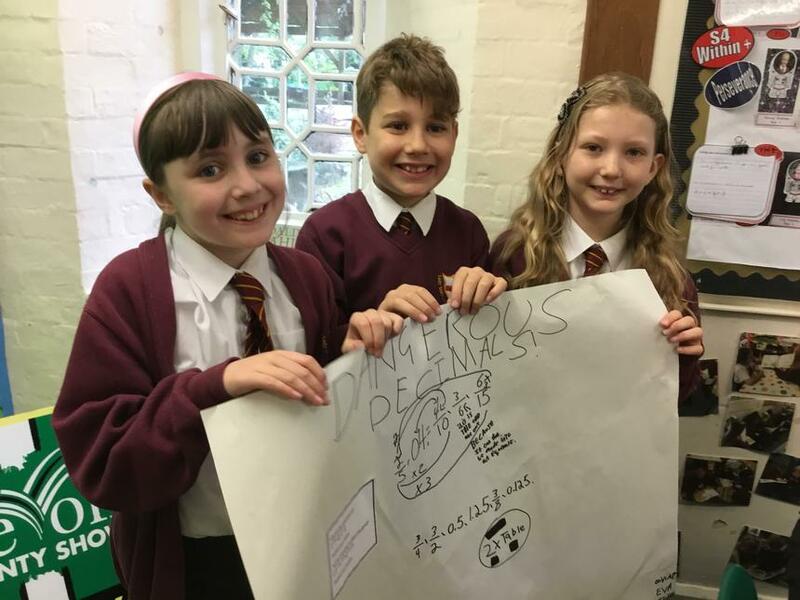 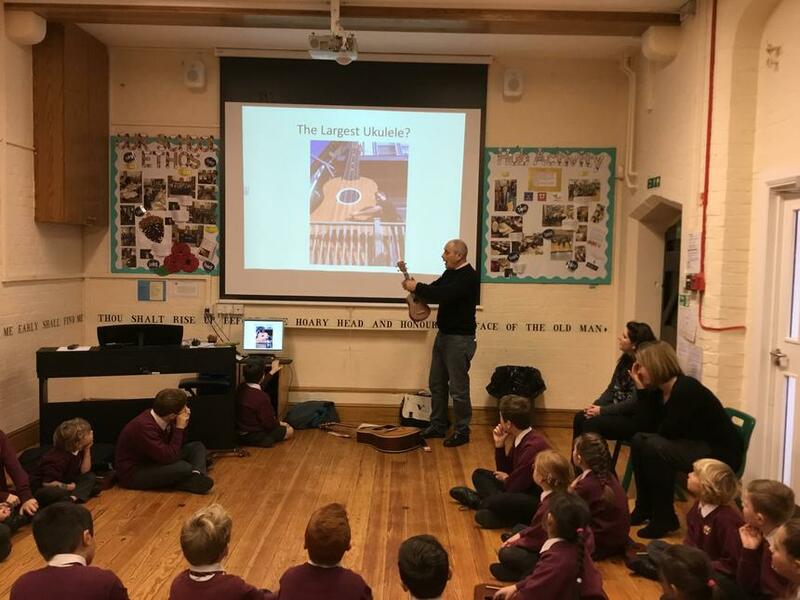 Our IT leaders were invited to Westcliff Primary School to present an aspect of IT that has helped them with their learning. 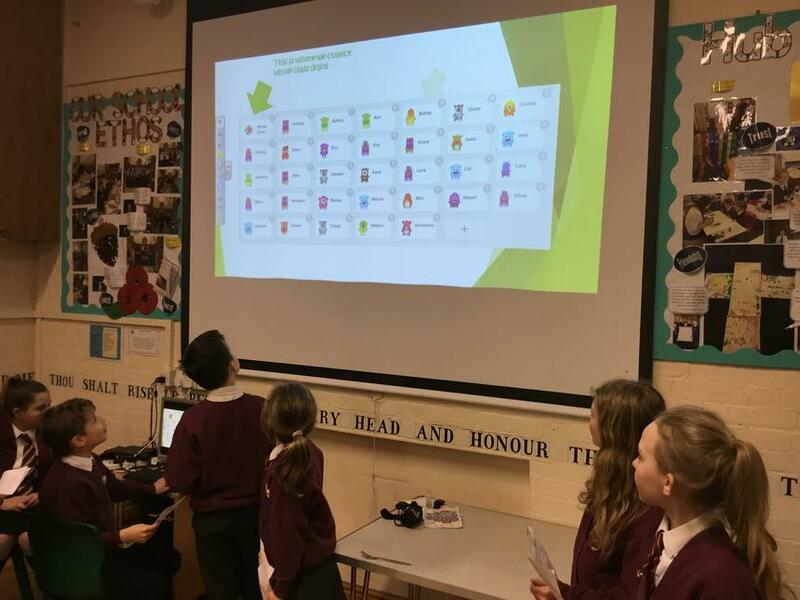 They chose to talk about ClassDojo which is an interactive system where children get to collect points during the day for achievements. 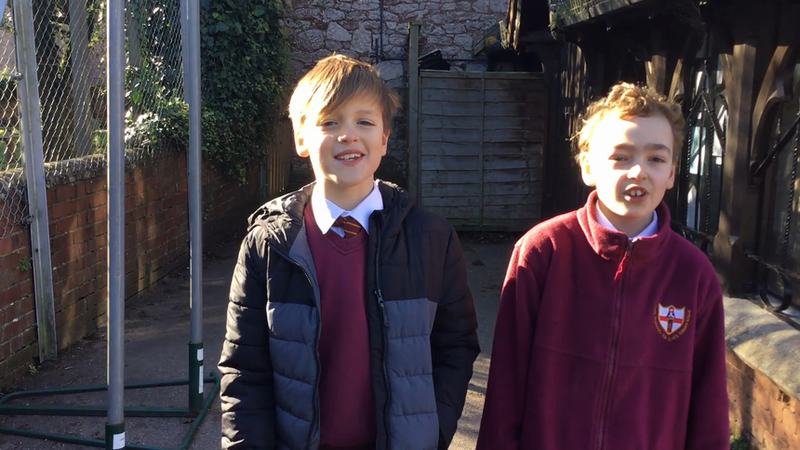 The children made this video in school using Spark Video. 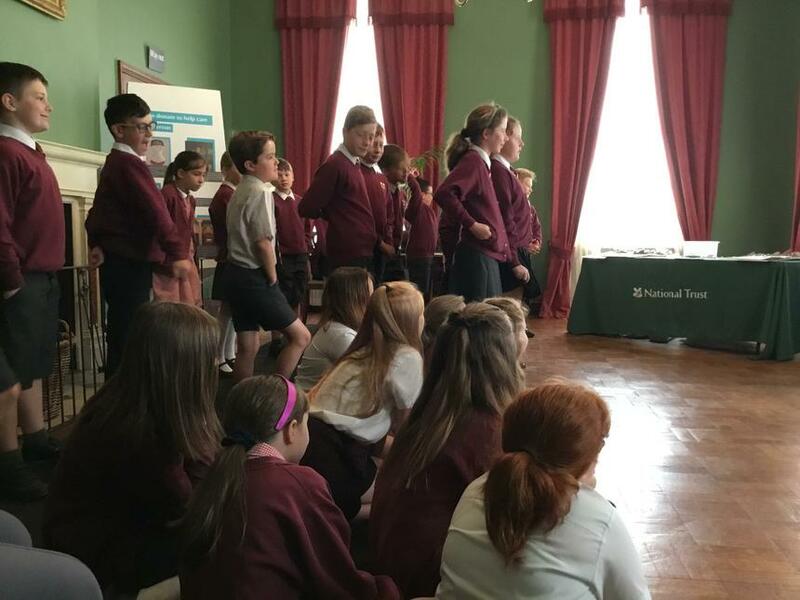 The children were amazing presenters, showing confidence in a nerve racking situation and represented their school beautifully. 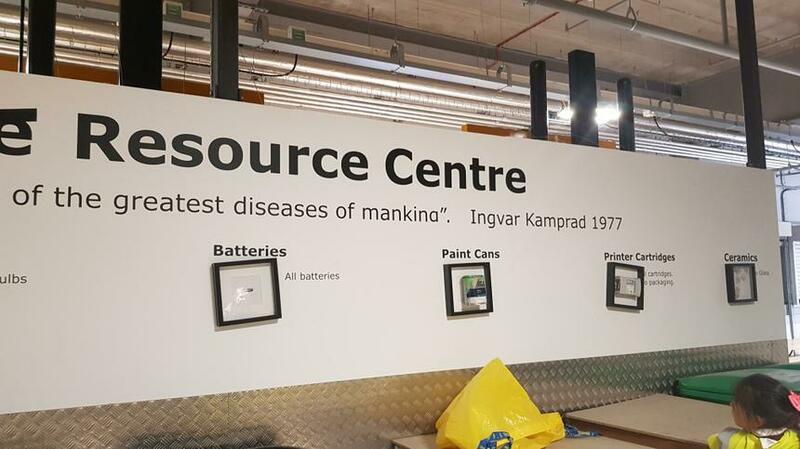 I was very proud of them all. 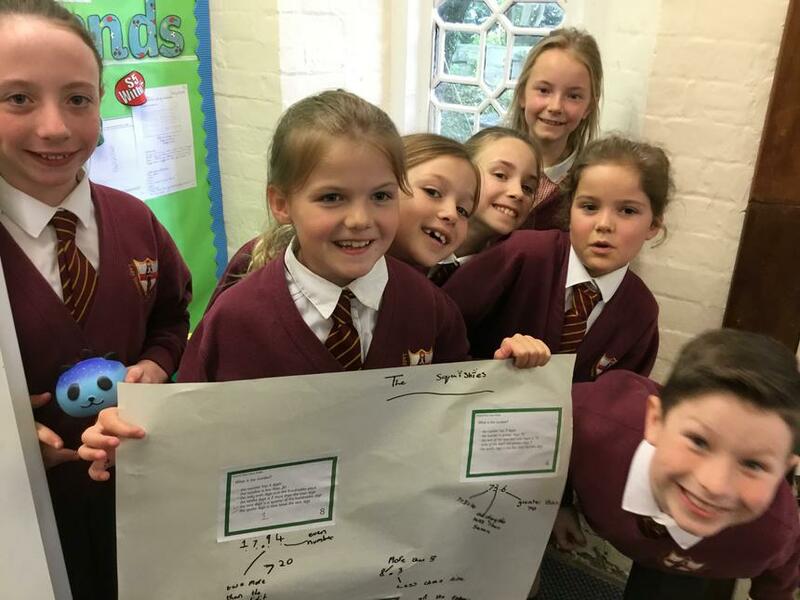 A big well done to Jasmine, Amelia, Stefan, Eva, Eden and Lucy for your hard work. 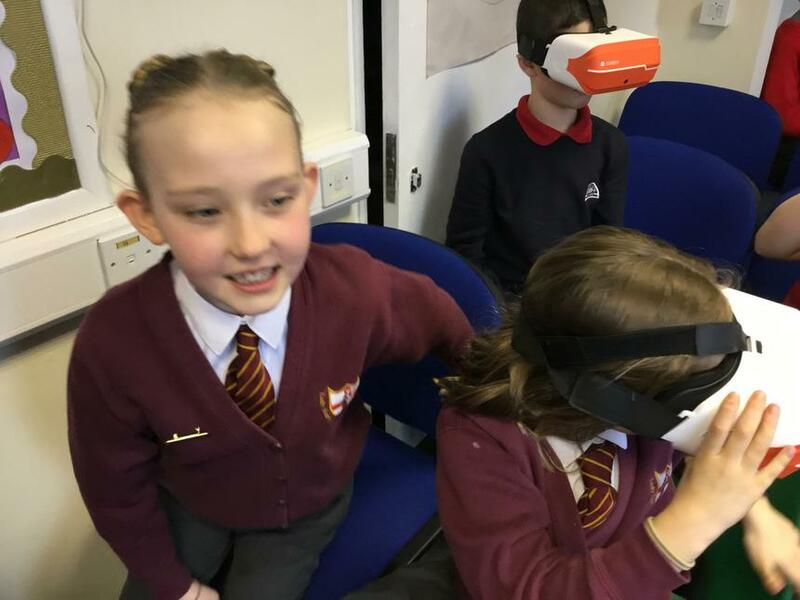 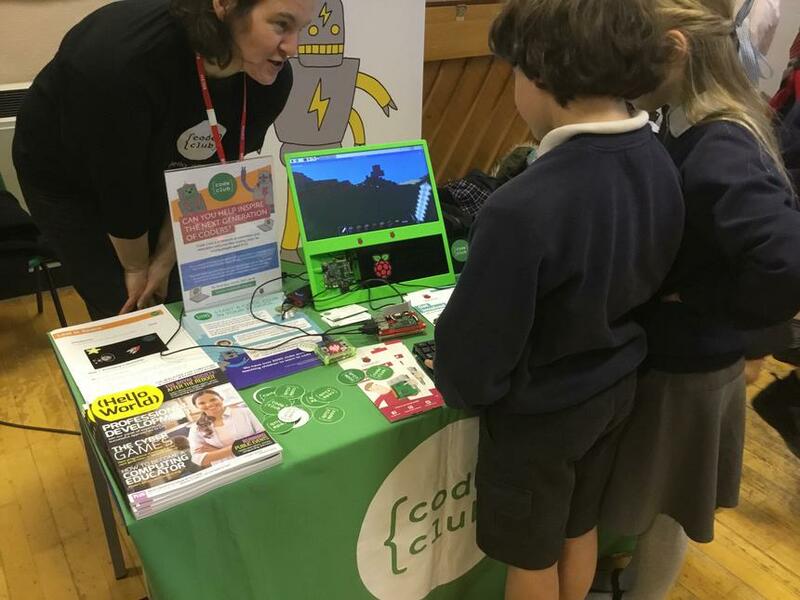 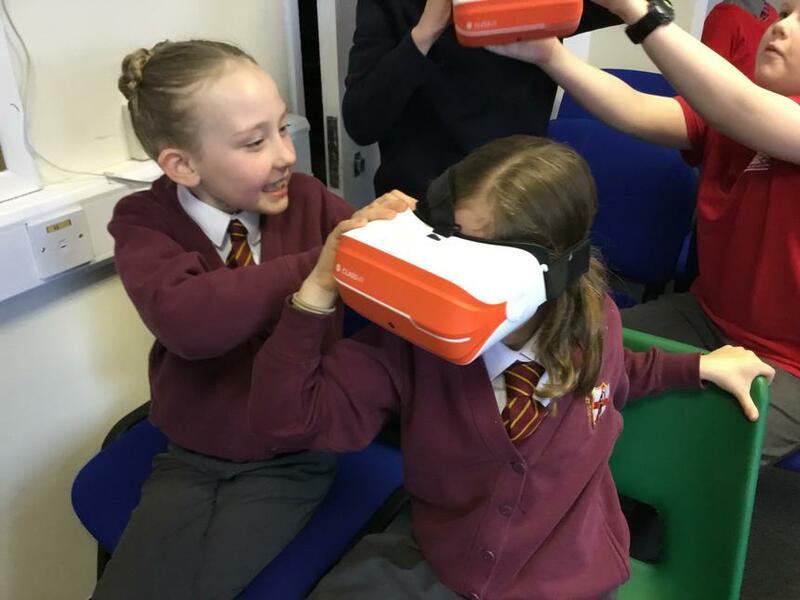 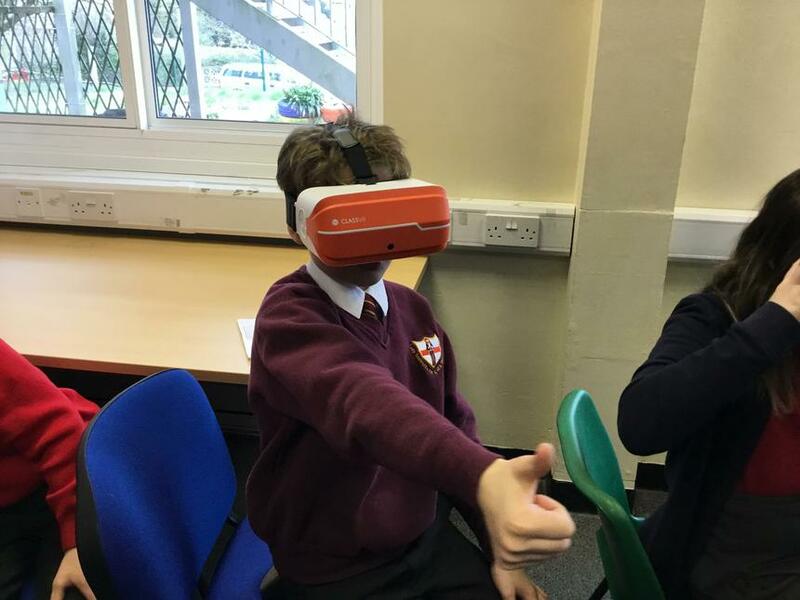 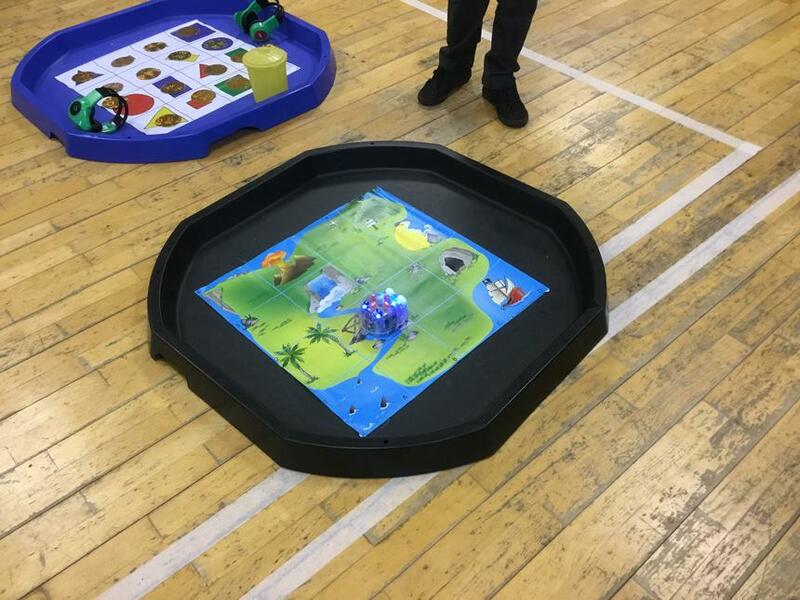 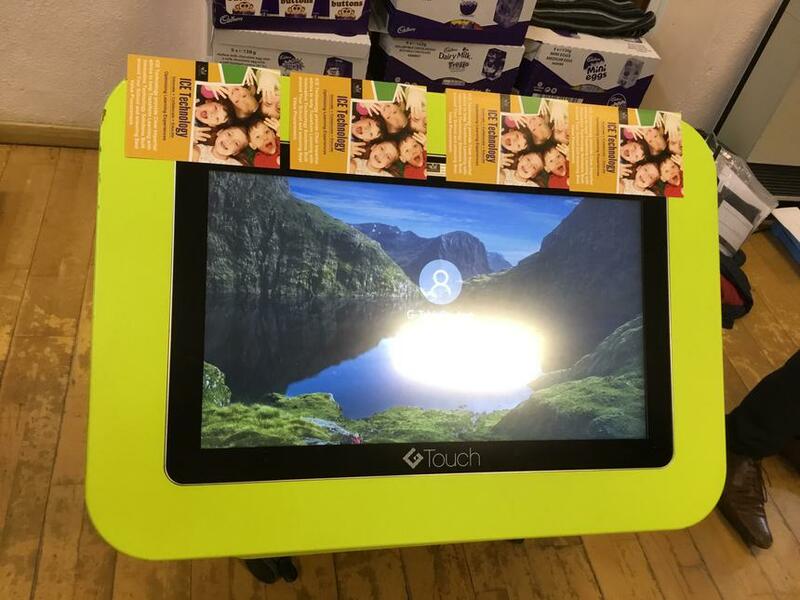 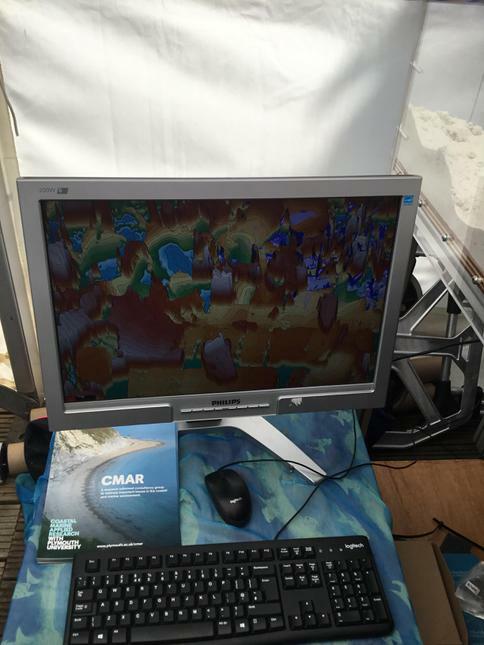 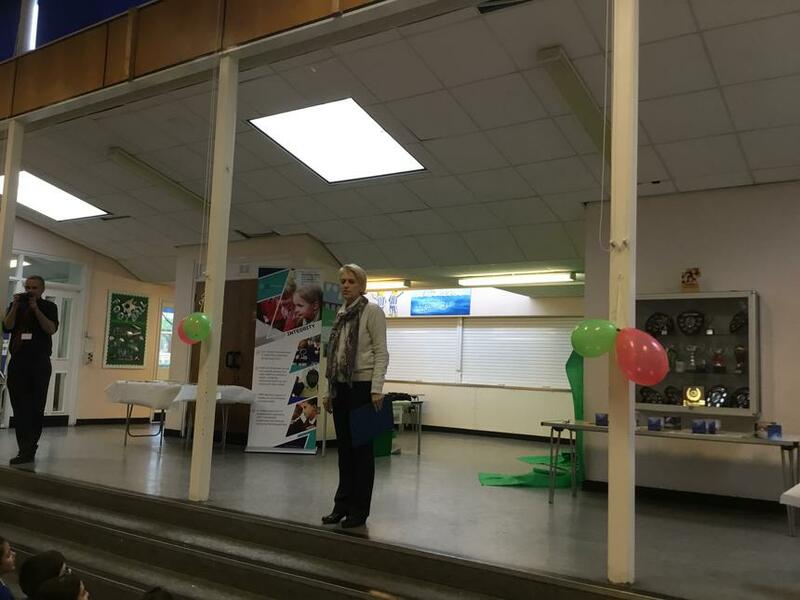 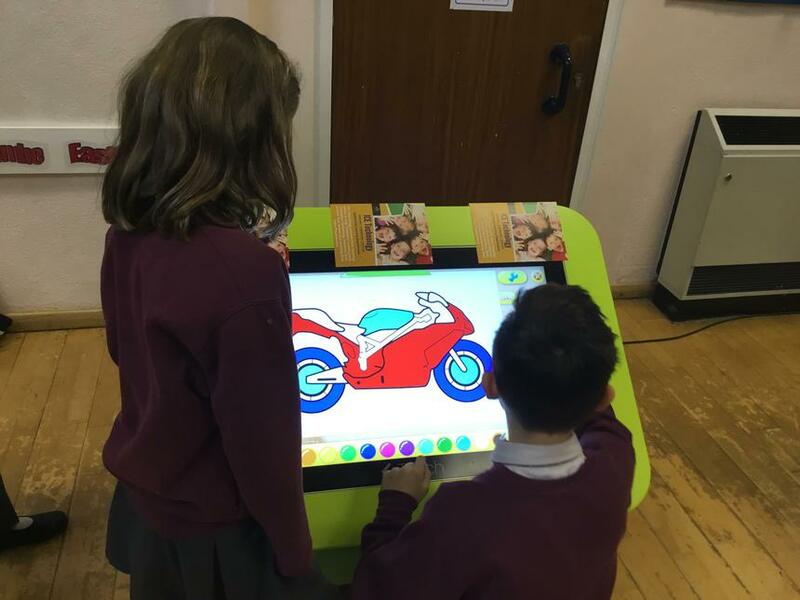 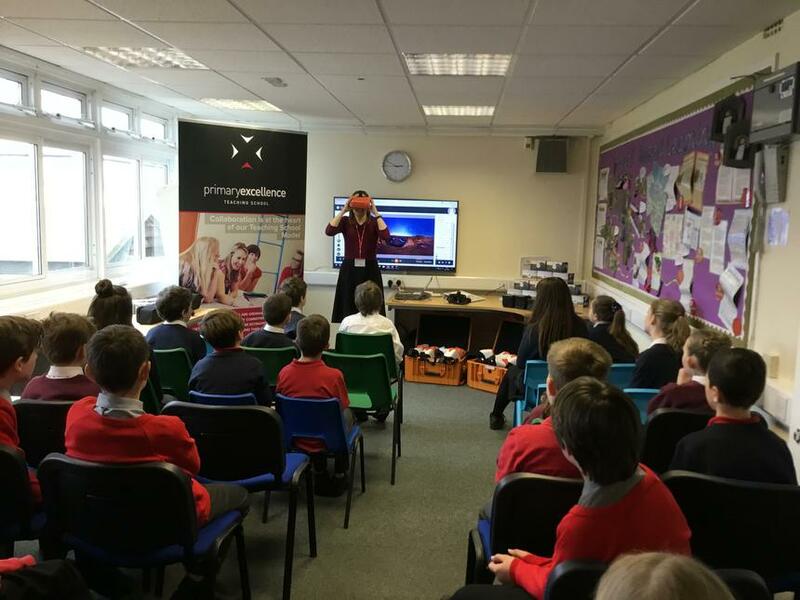 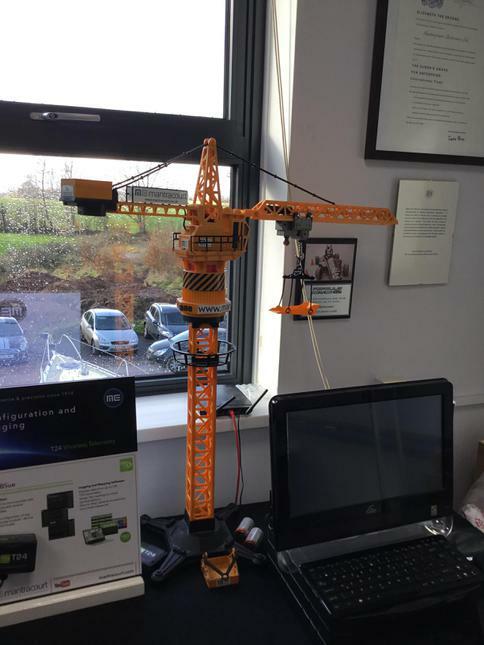 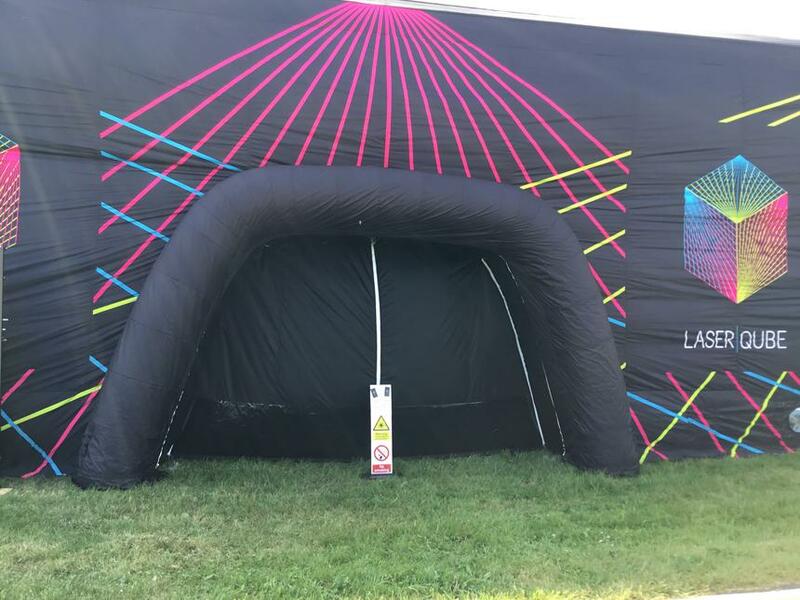 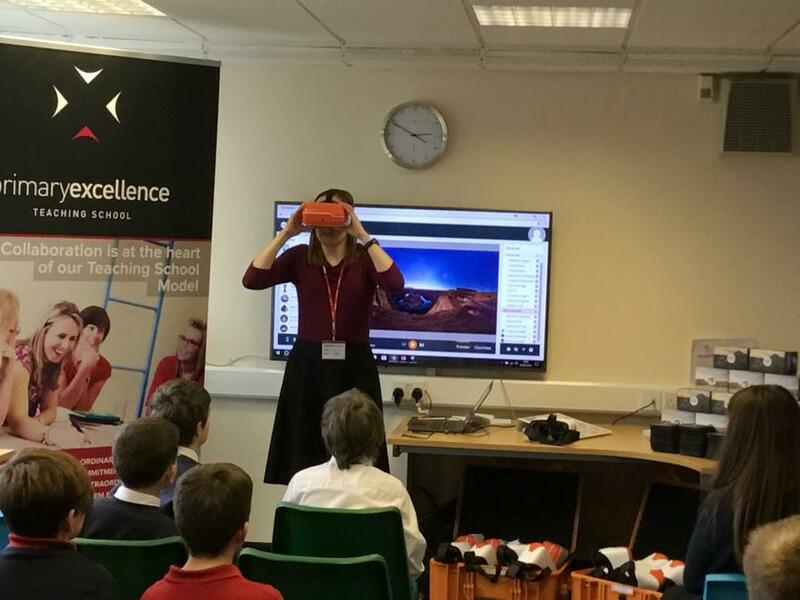 The children won a number of IT prizes, including a virtual reality headset for their school to use. 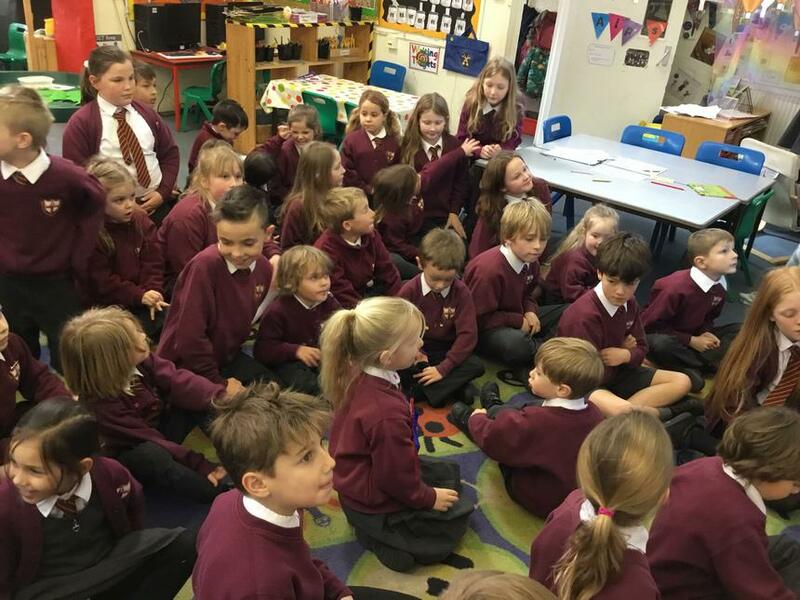 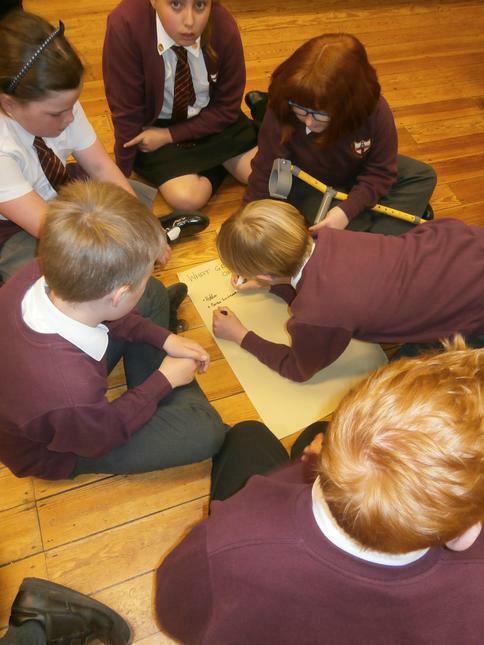 Class 2 and Class 3 worked together this week and merged their topic learning together. 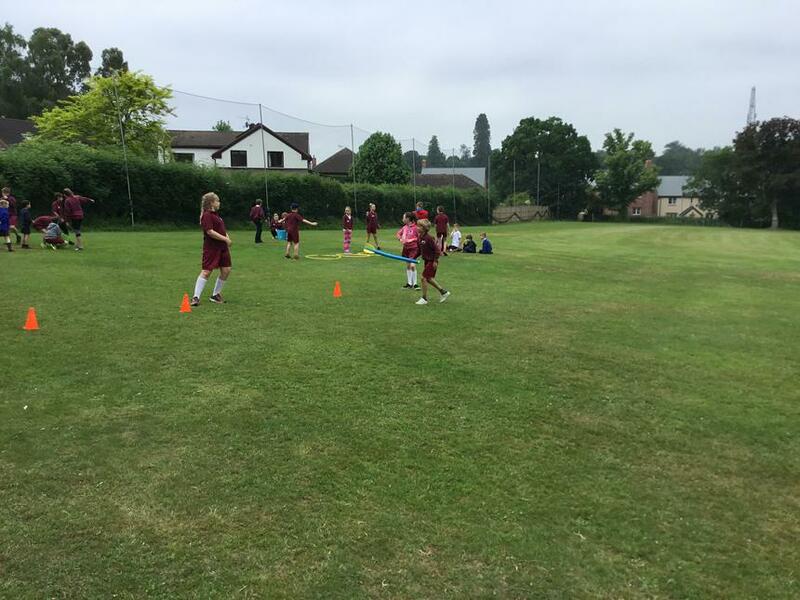 We looked at sport in Africa and compared it to sport in England. 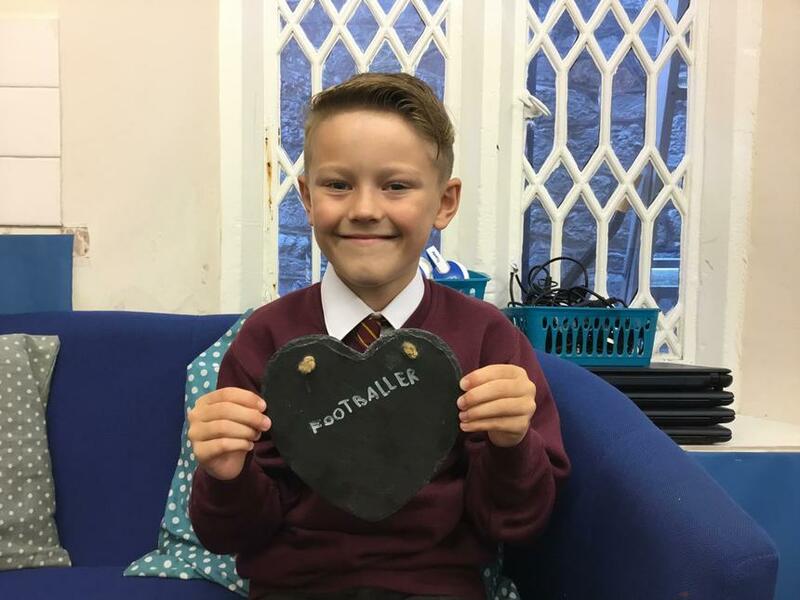 In some places in Africa, rather than buying footballs, children had to make them due to poverty. 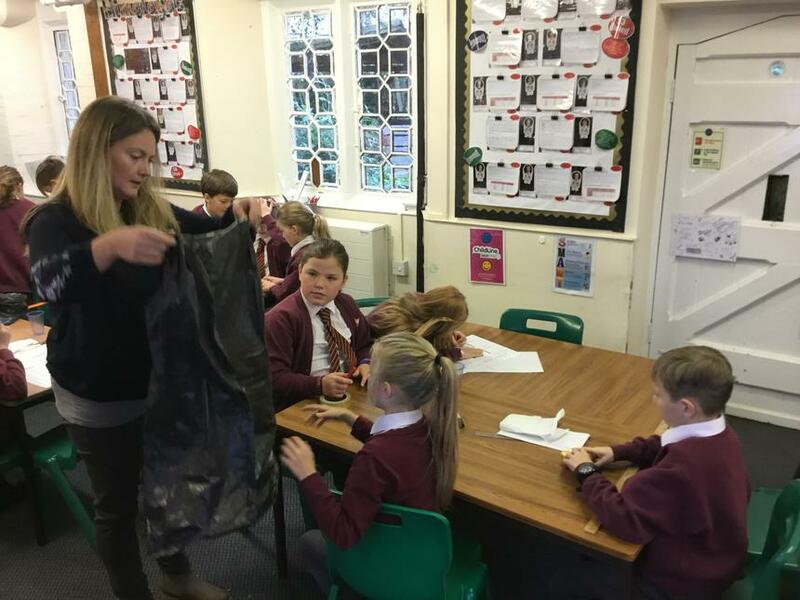 African children normally made their footballs out on recycled materials. 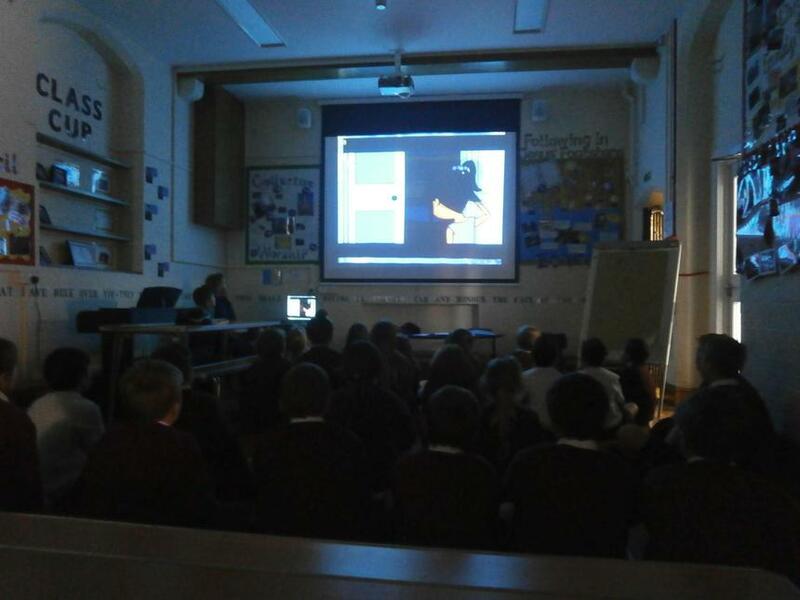 Children watched a video of an African village making footballs out of plastic bags, newspapers and string. 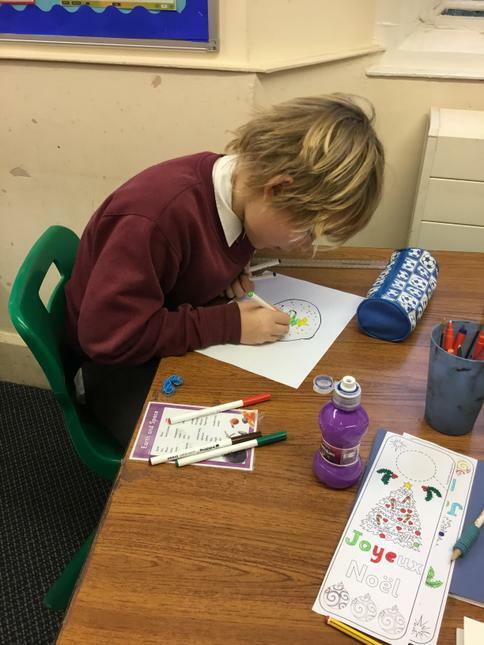 The children in Class 2 and 3 then made their own footballs, using these materials. 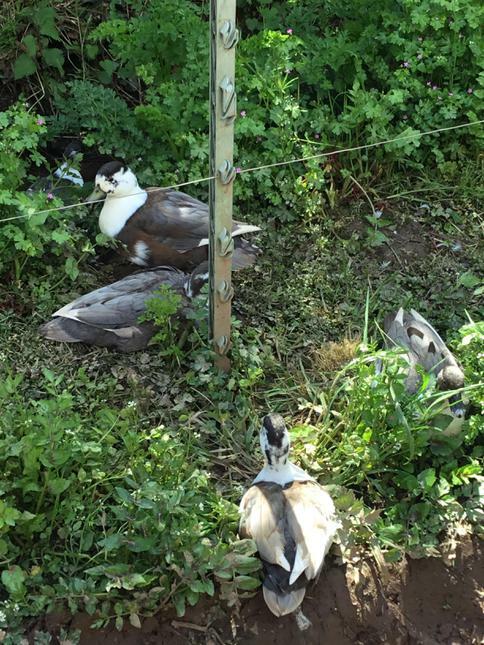 They wrapped a number of plastic bags around some newspaper and then tied it very tightly with string. 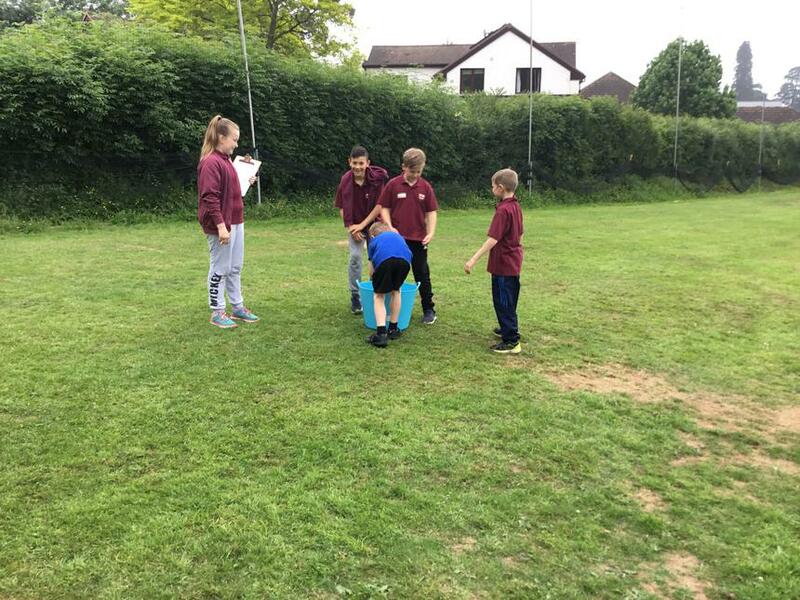 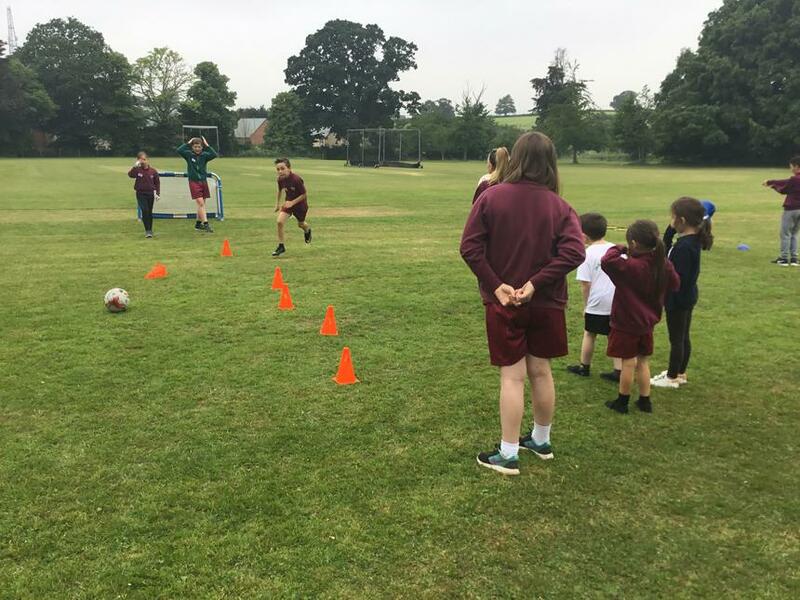 Children then tested out their designs in the school garden to see how strong they were and how they were different from the footballs children have in England. 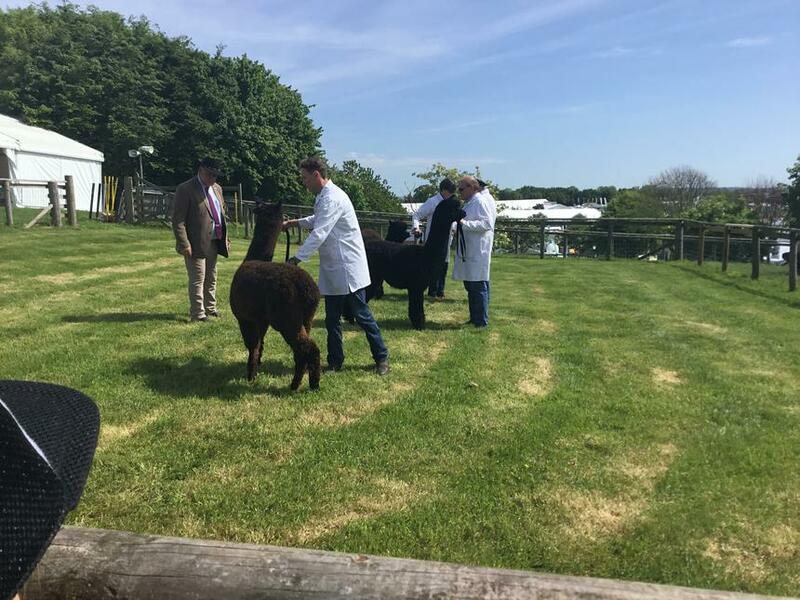 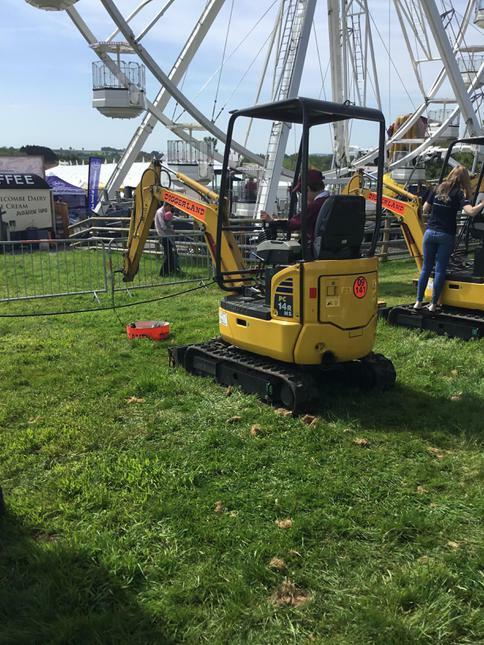 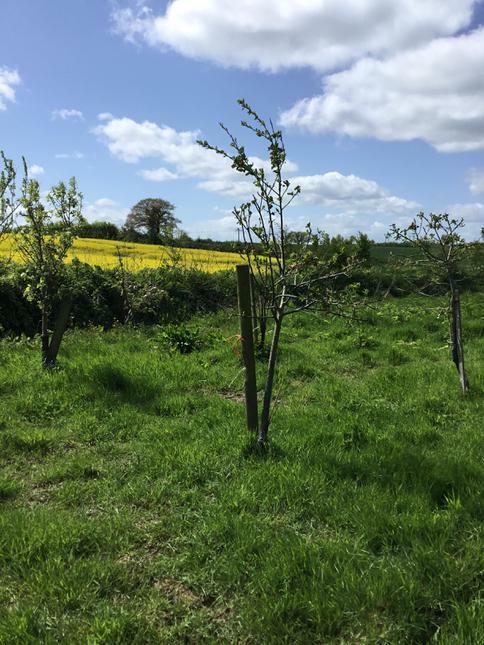 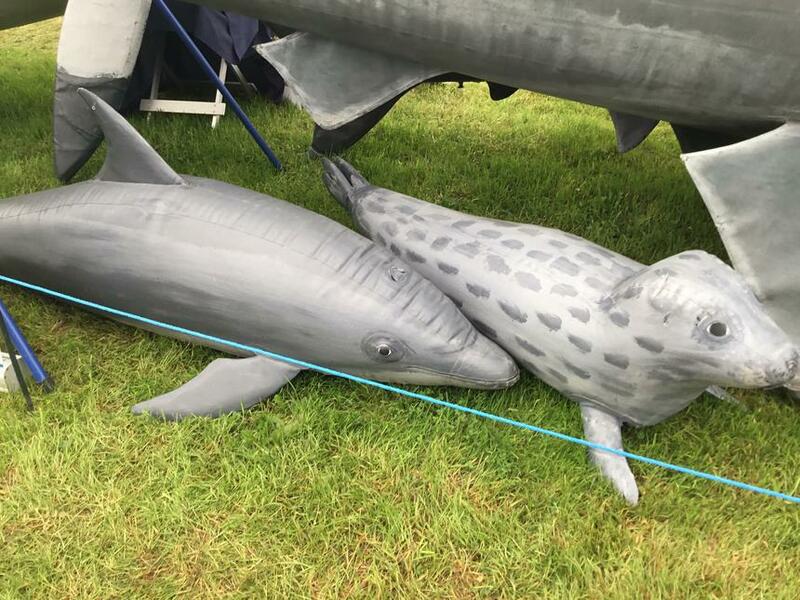 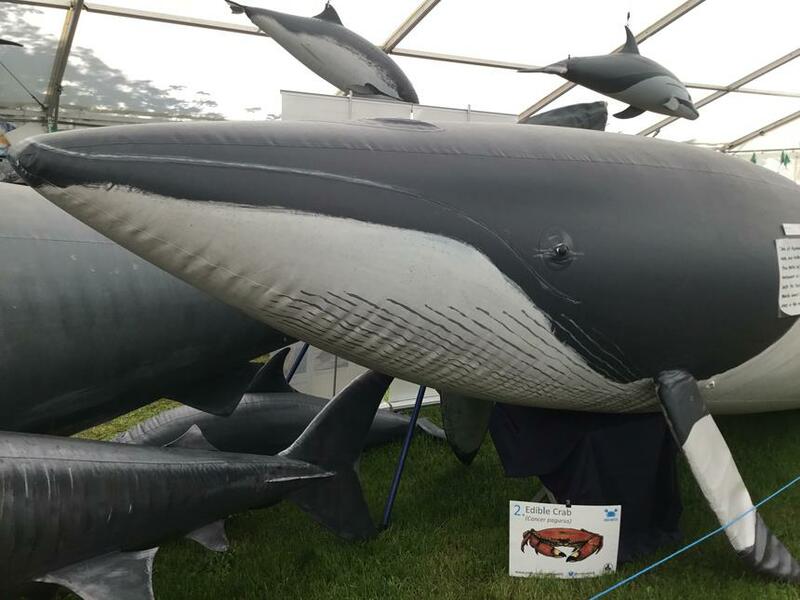 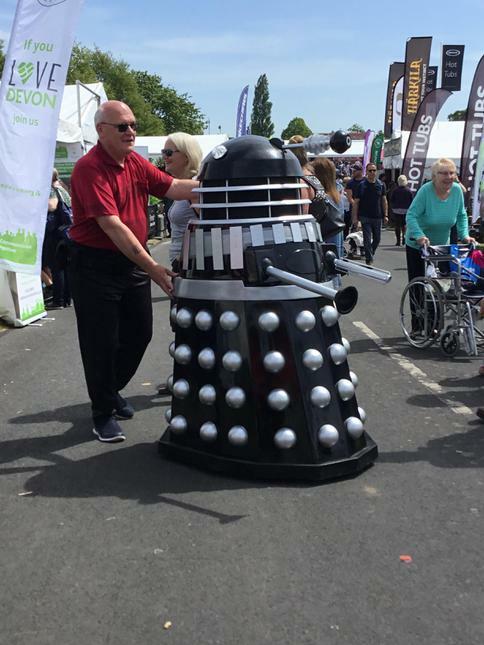 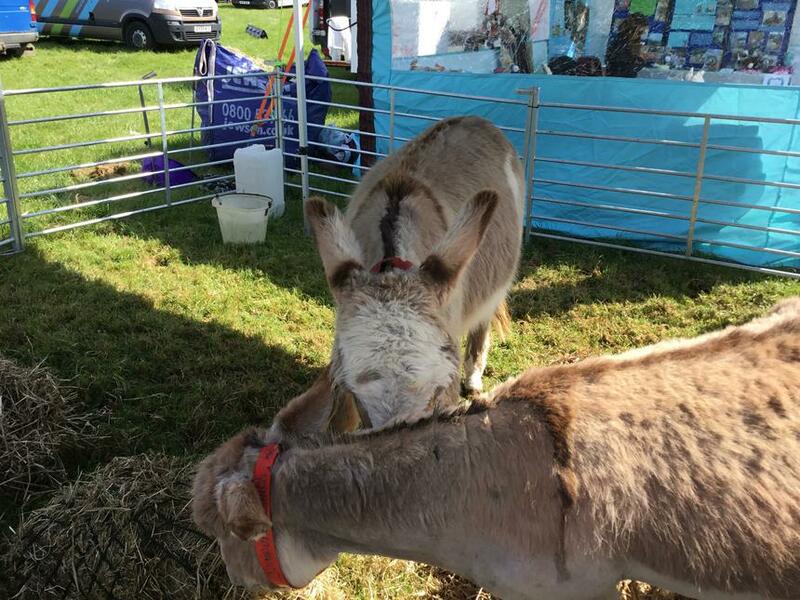 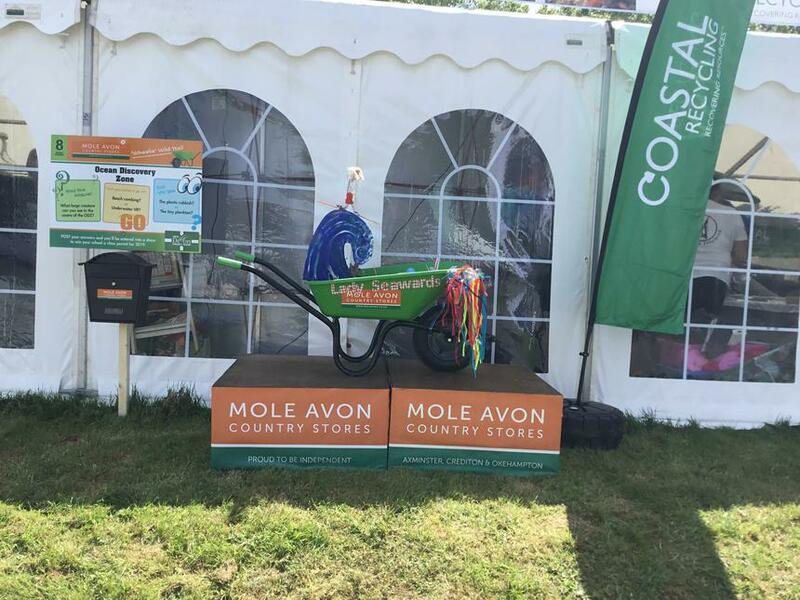 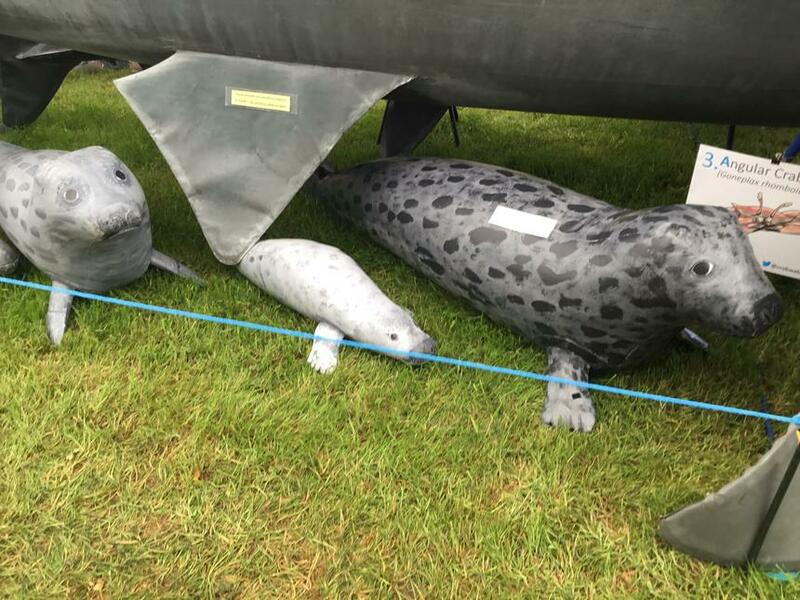 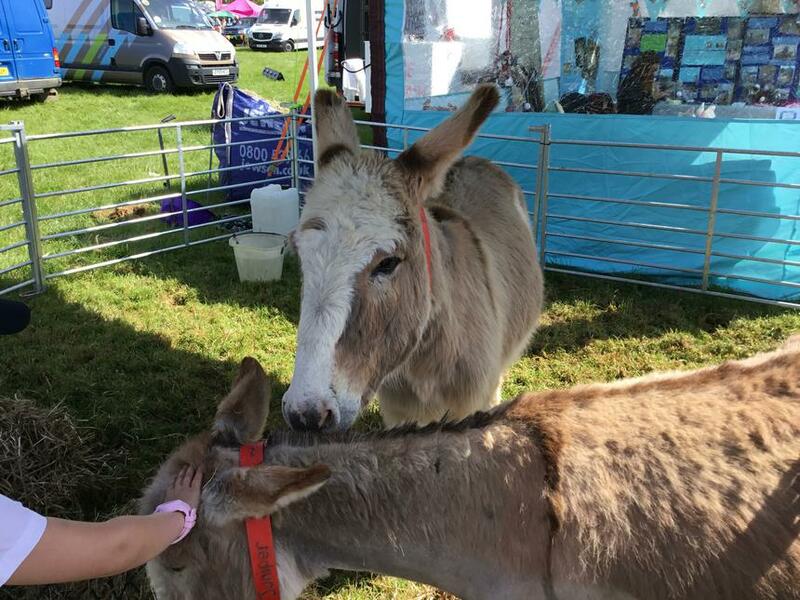 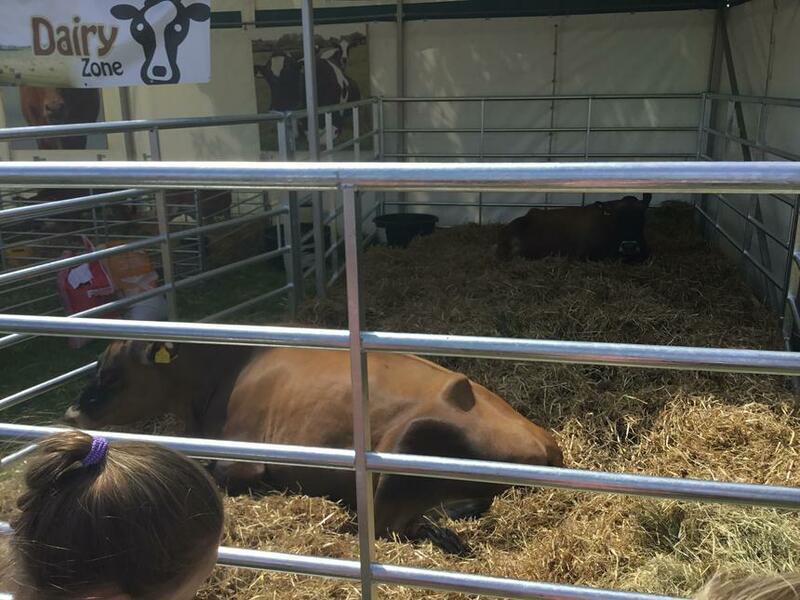 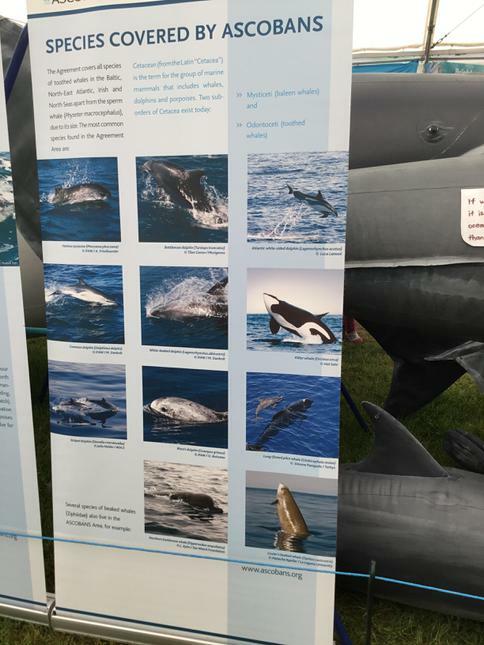 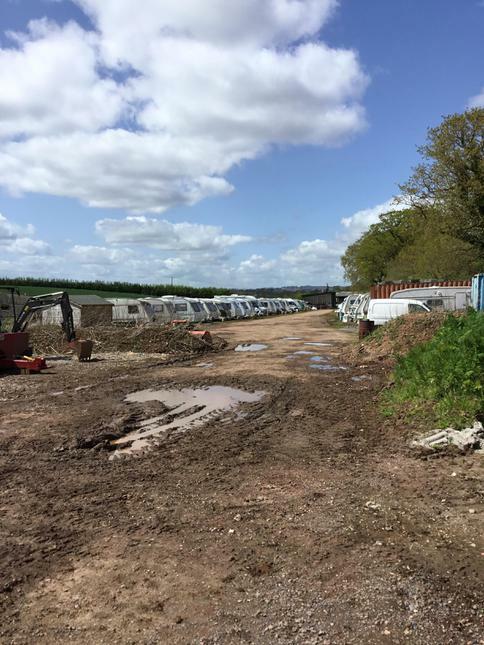 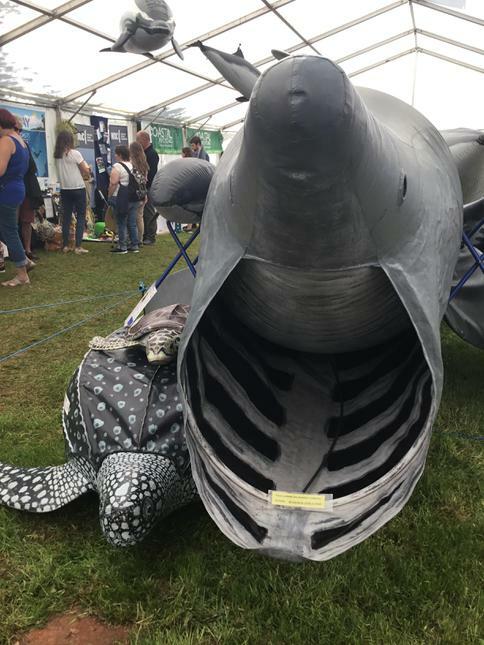 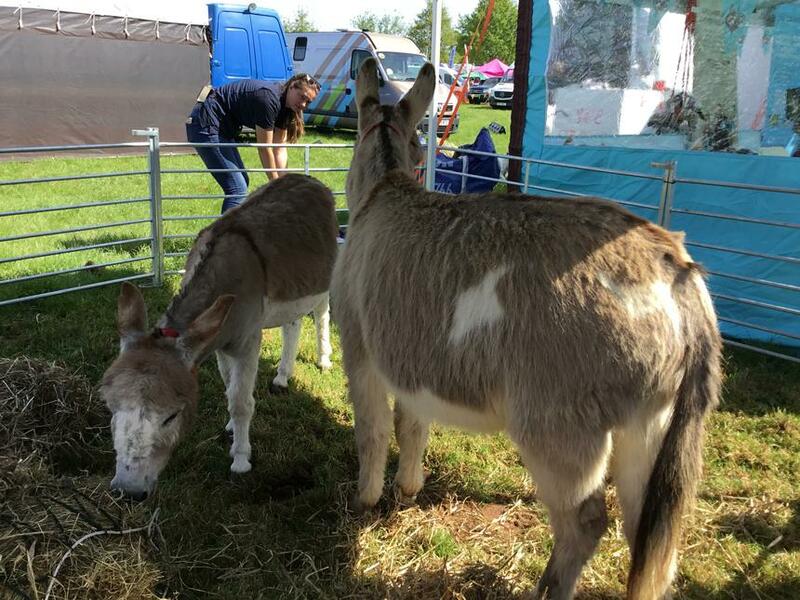 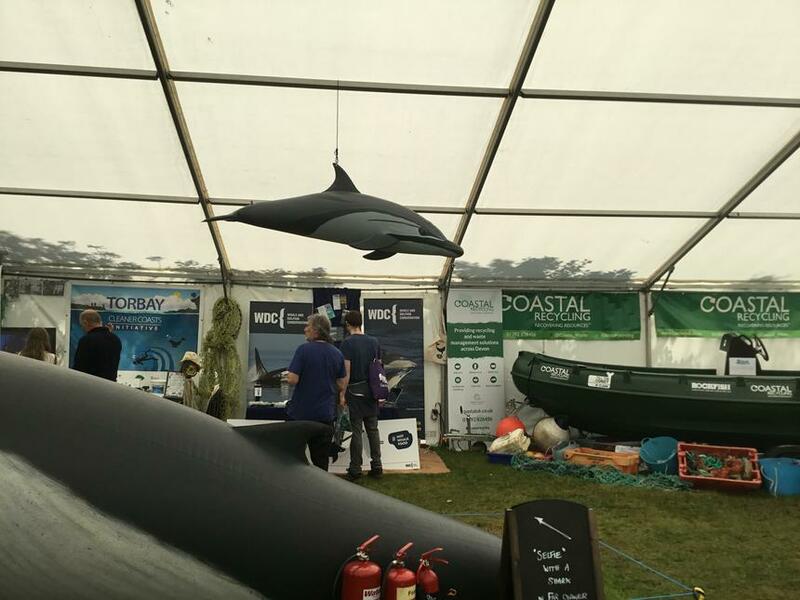 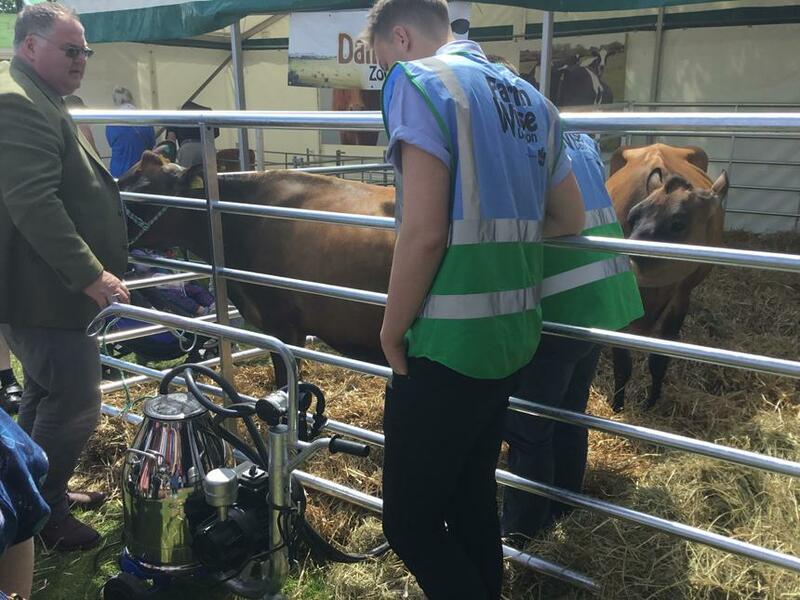 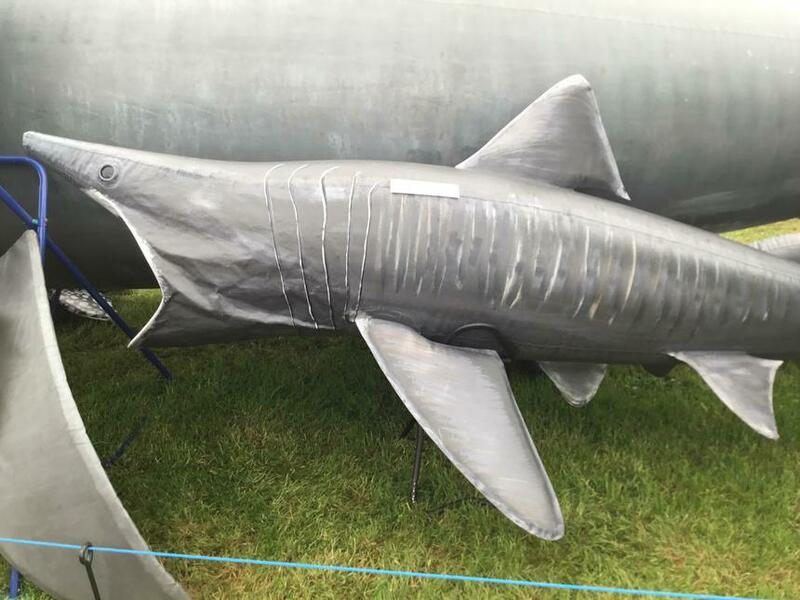 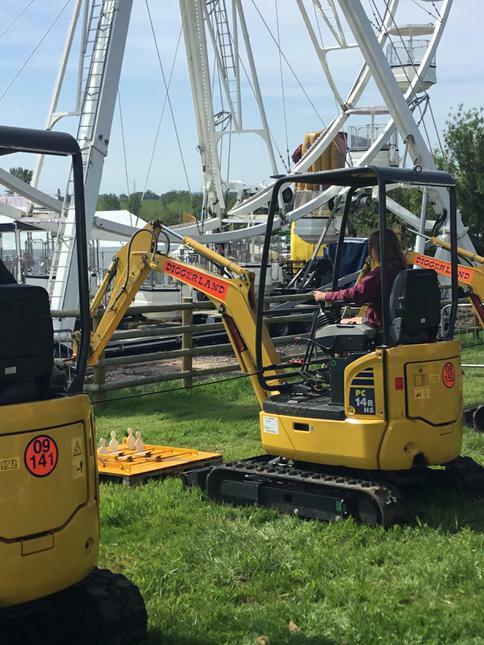 We have been chosen to be entered into this year's Devon County Show. 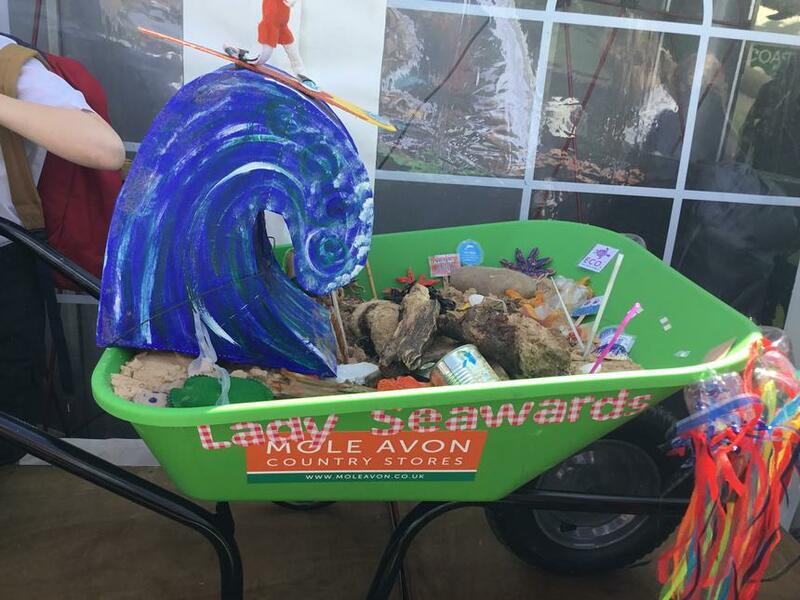 We will design and make a flower arrangement to fit into a wheelbarrow and base it around sea pollution. 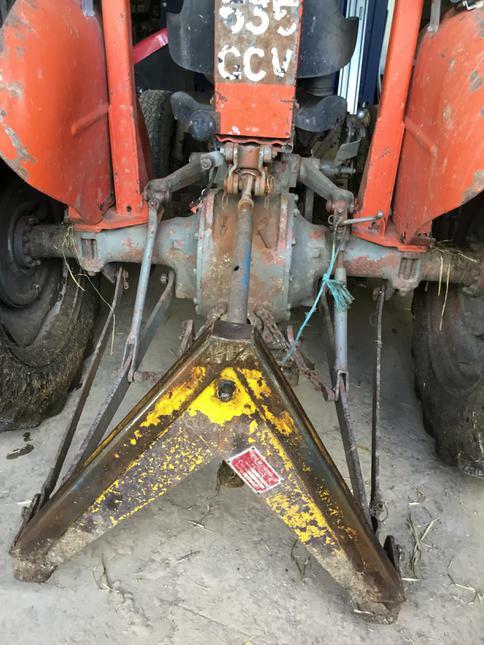 Our wheelbarrow will be collected in May, ready for this year's competition. 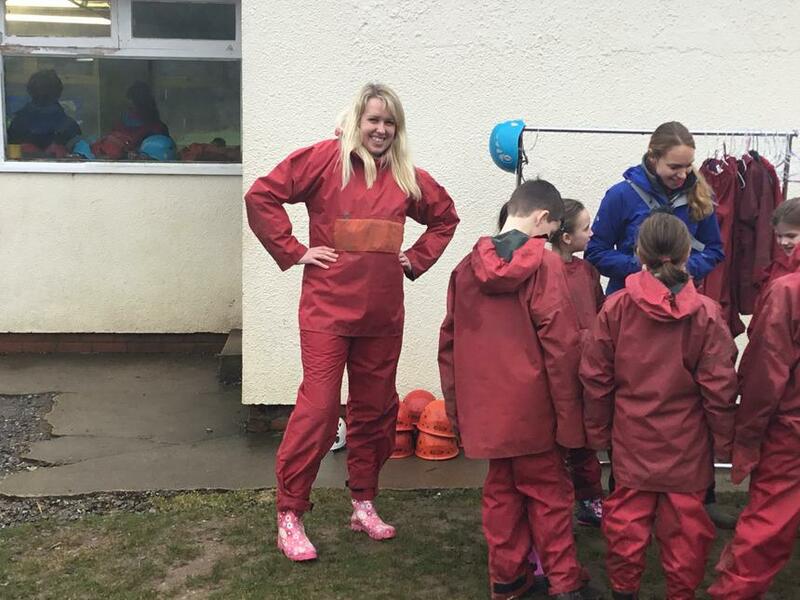 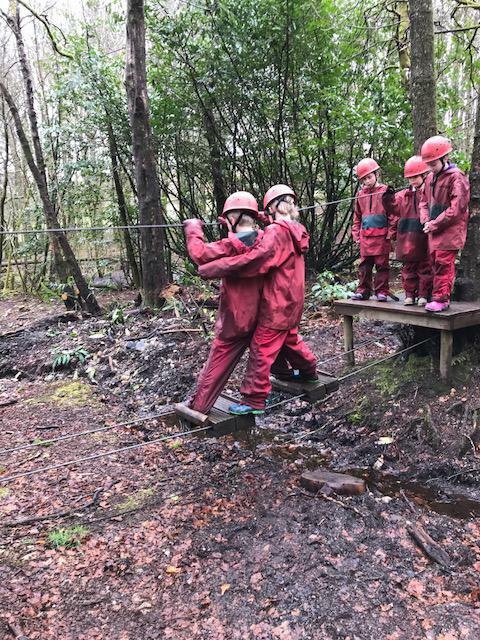 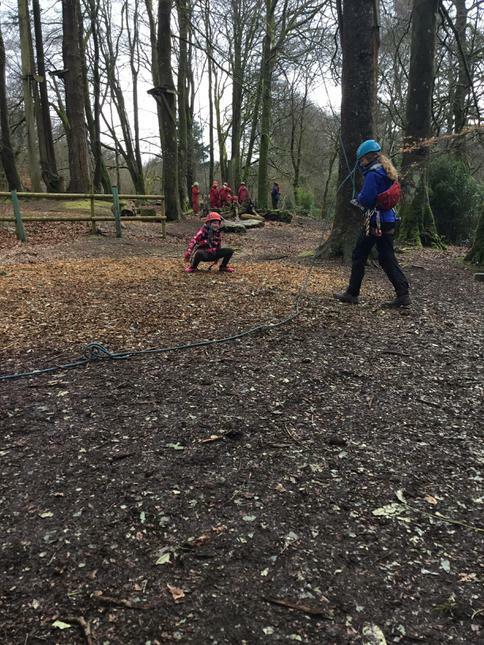 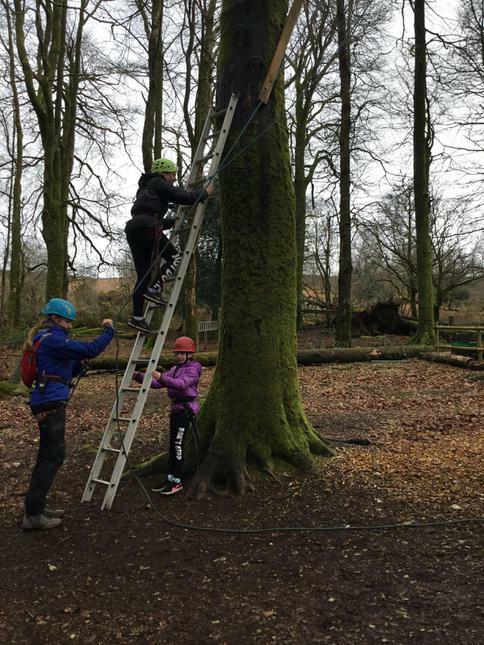 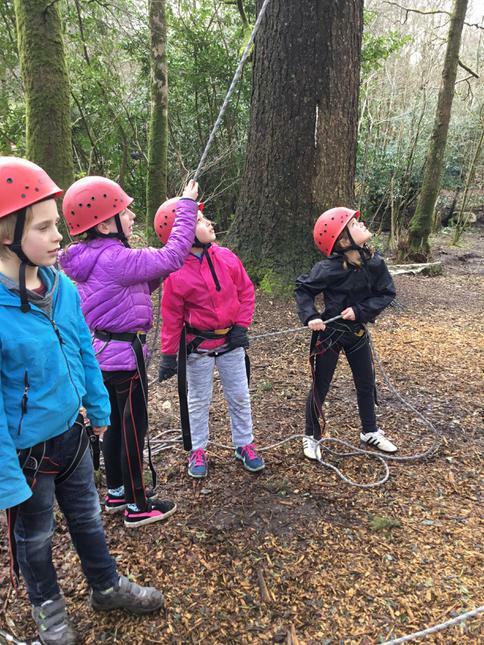 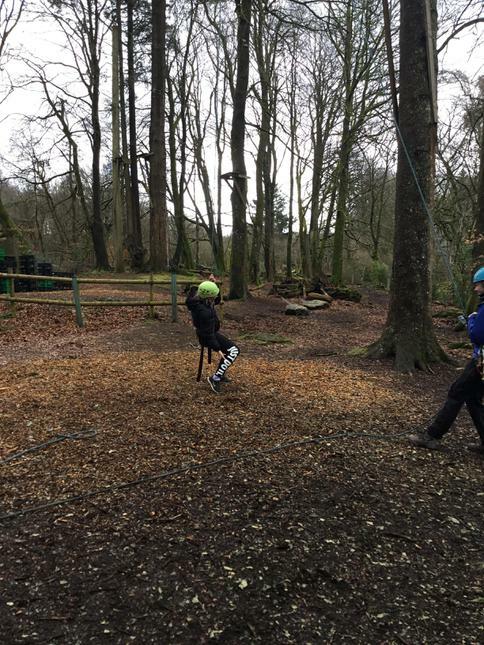 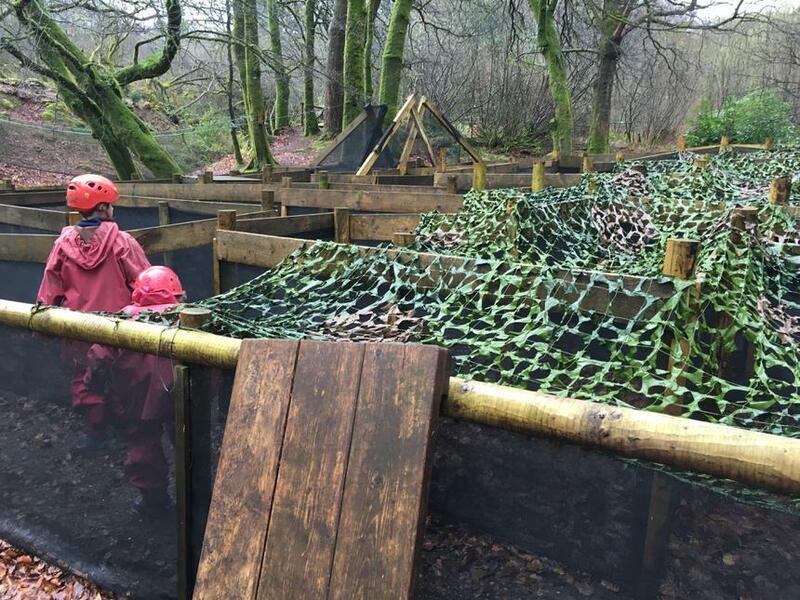 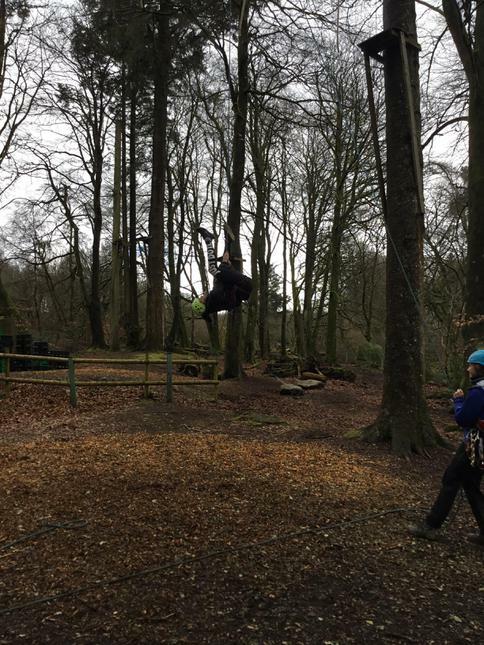 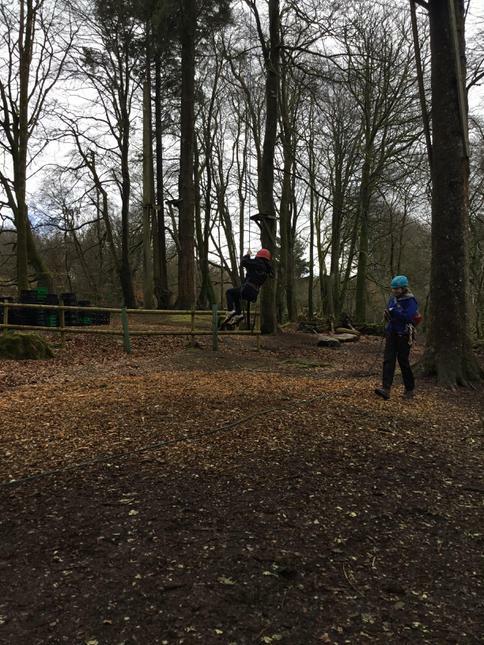 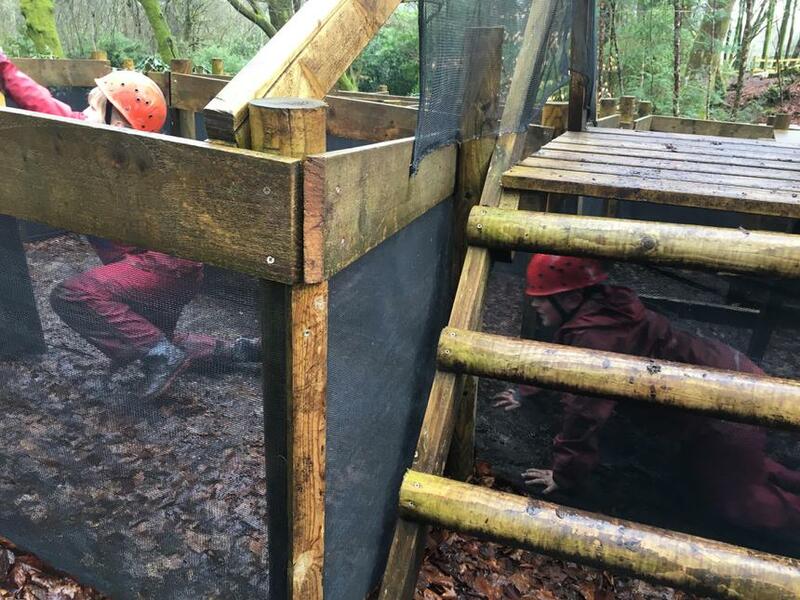 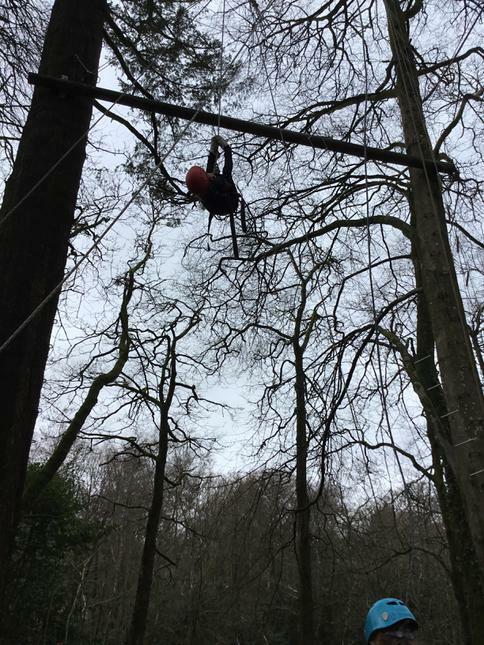 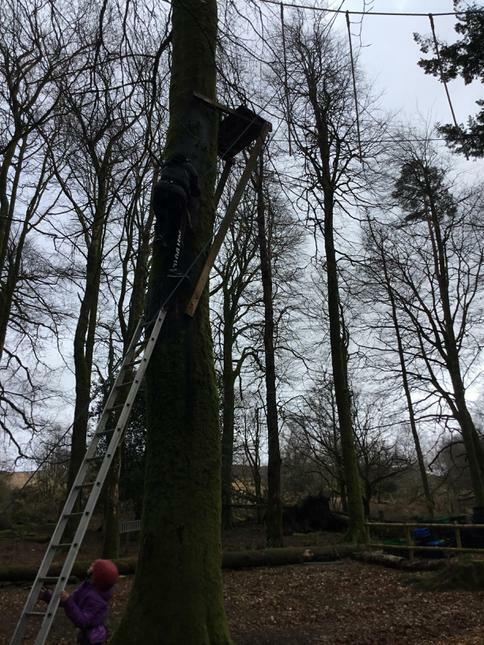 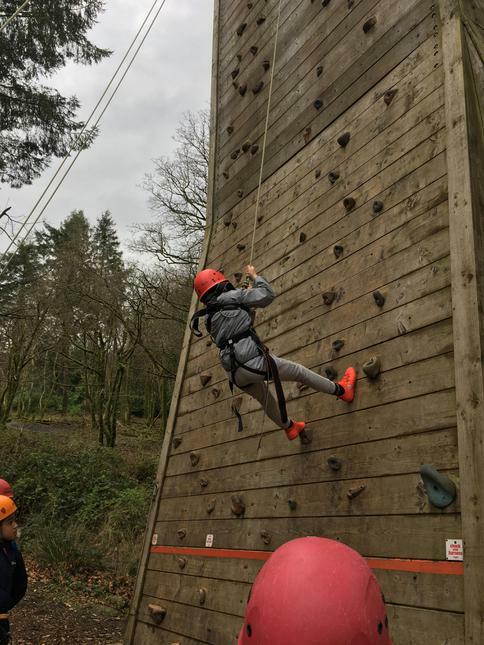 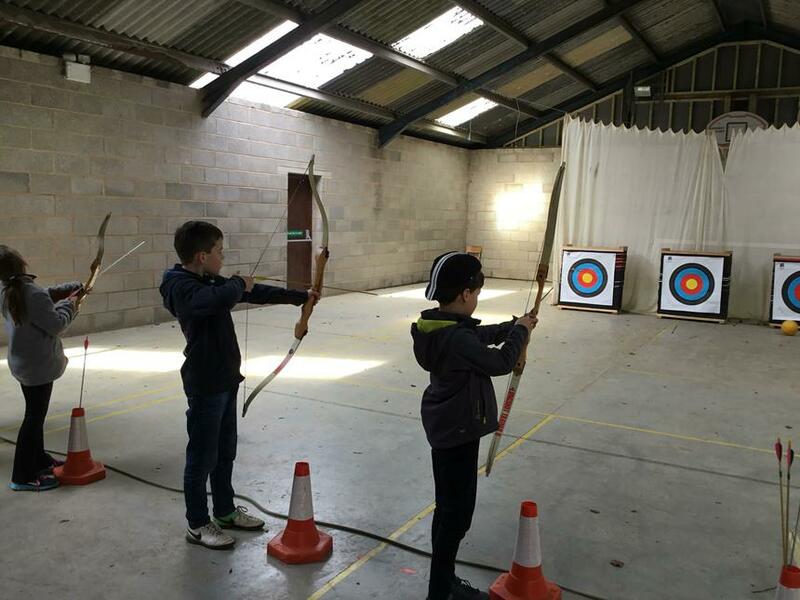 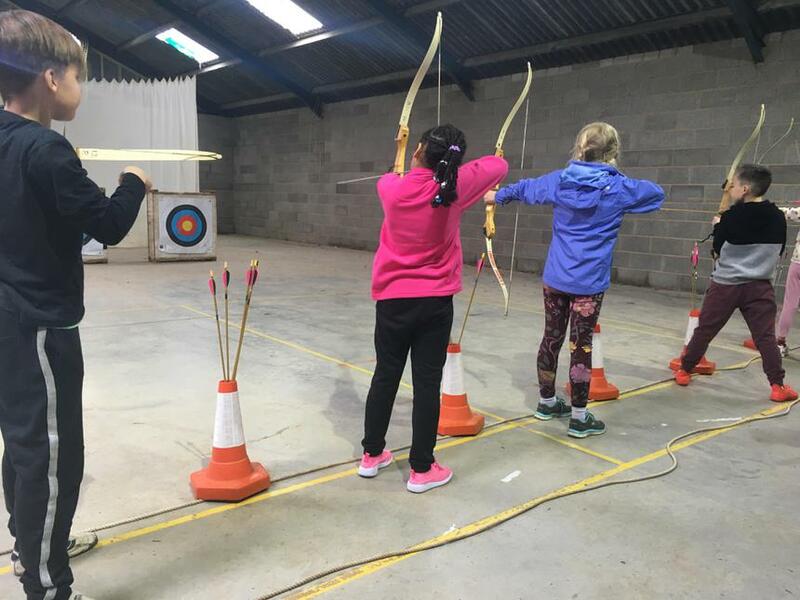 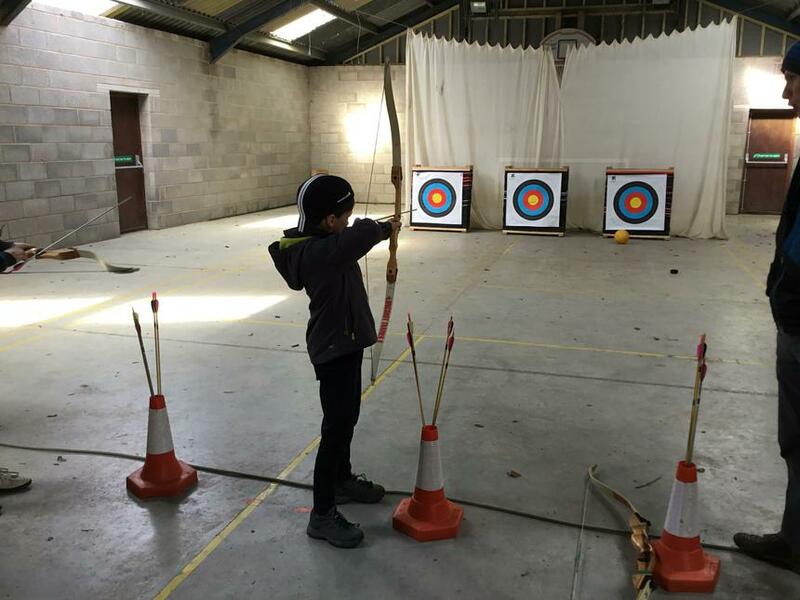 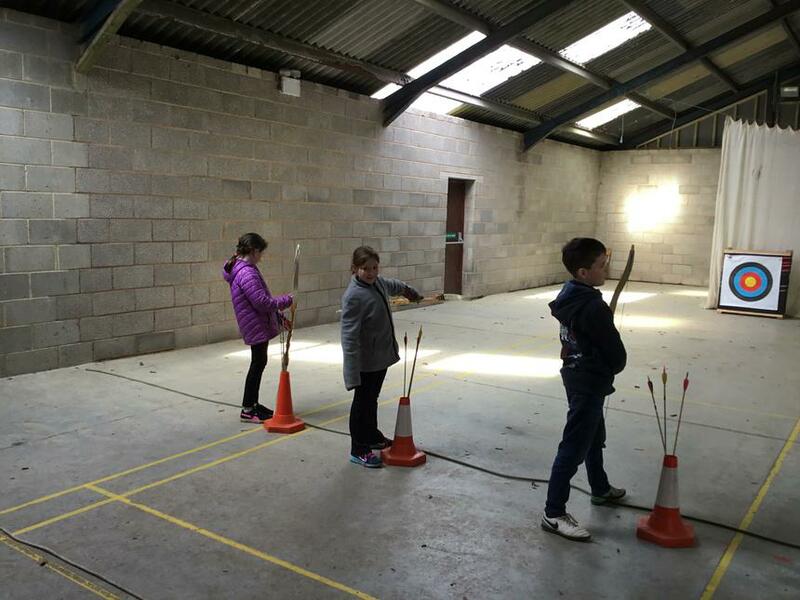 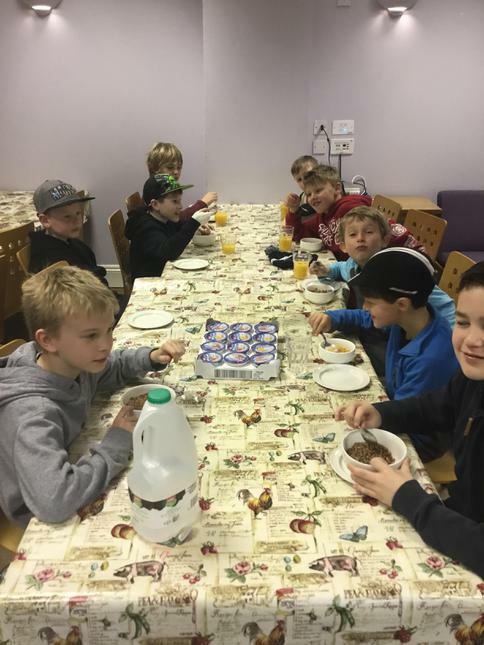 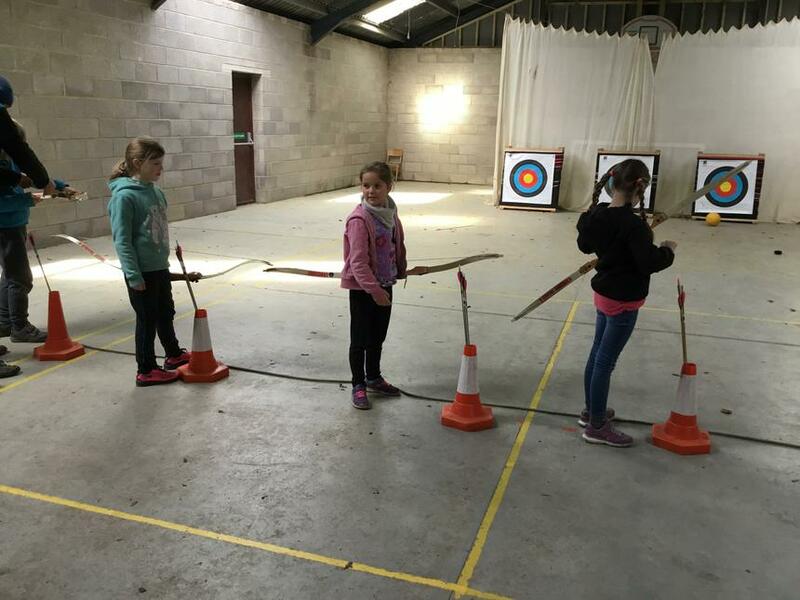 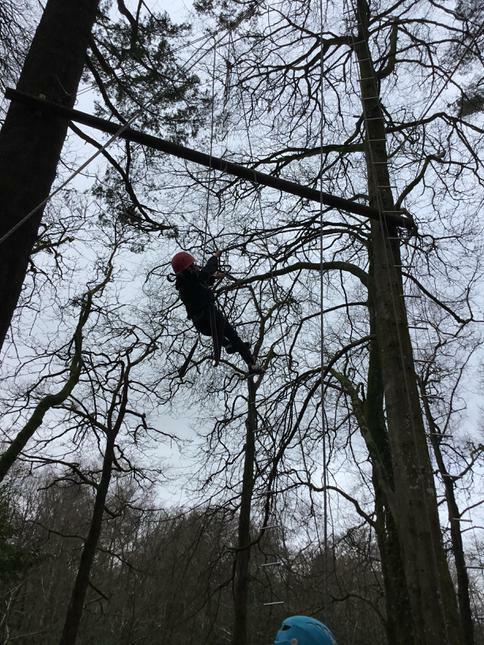 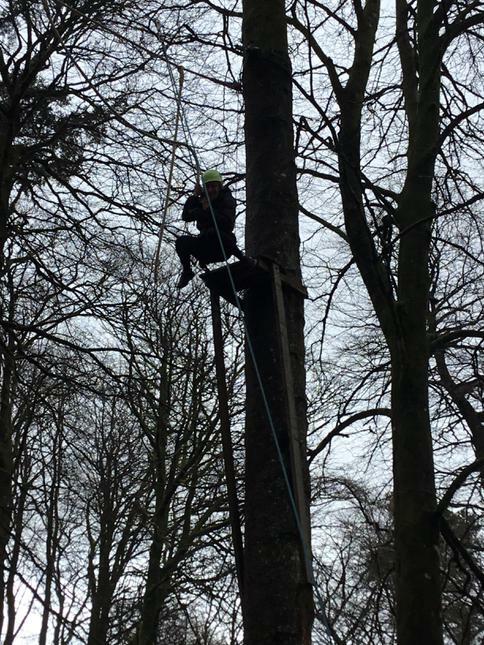 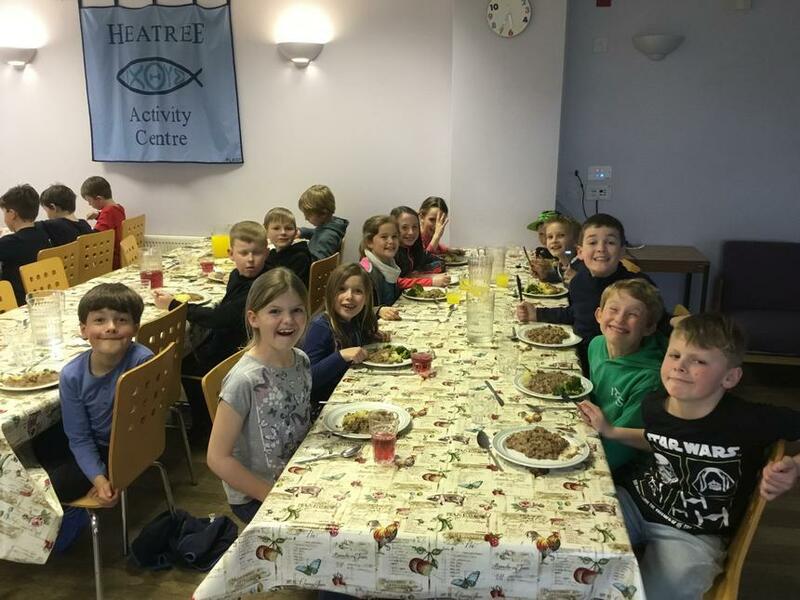 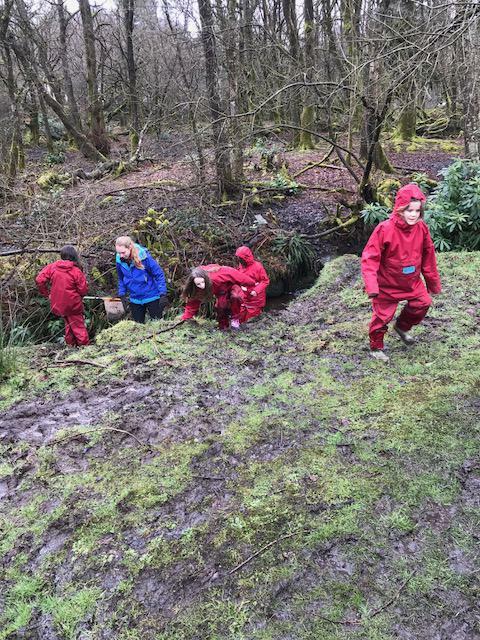 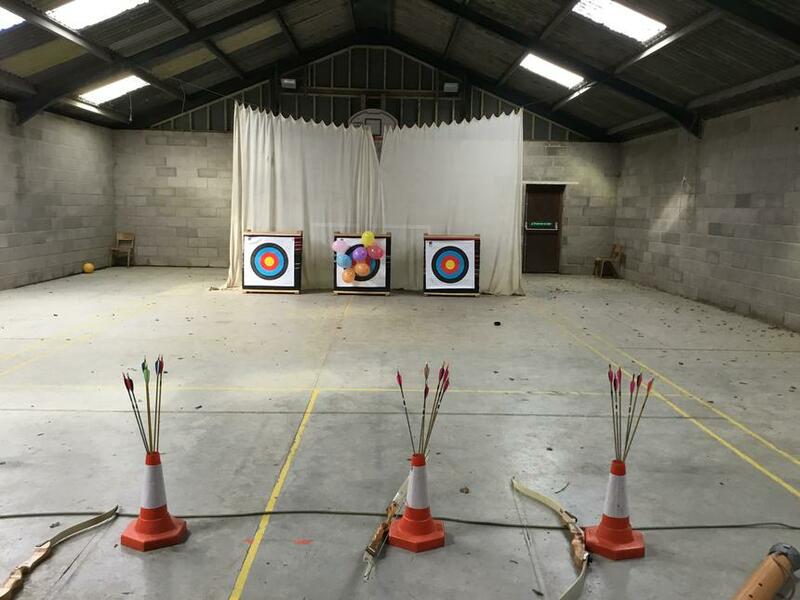 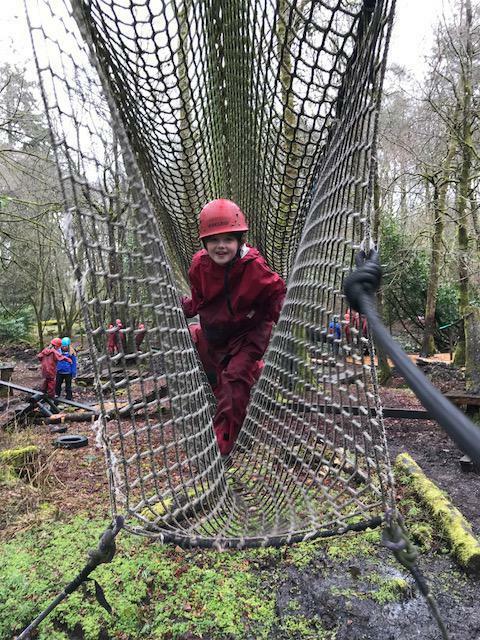 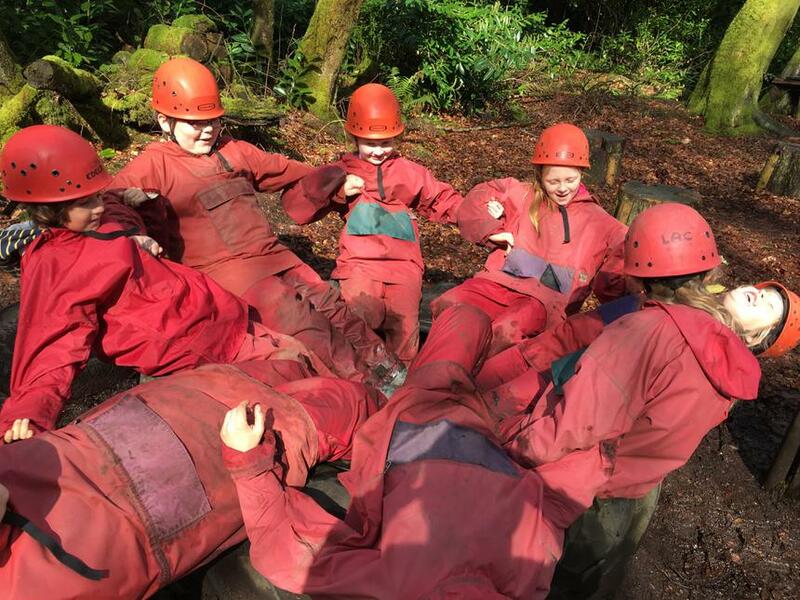 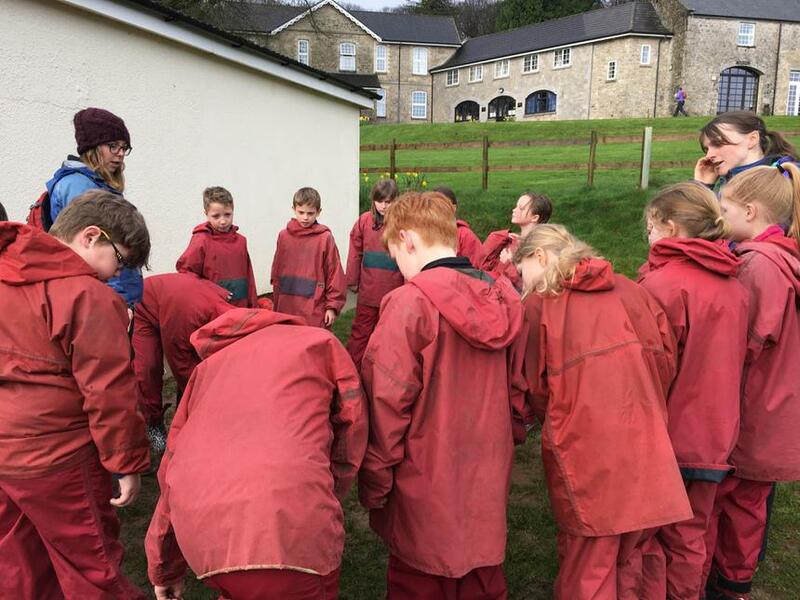 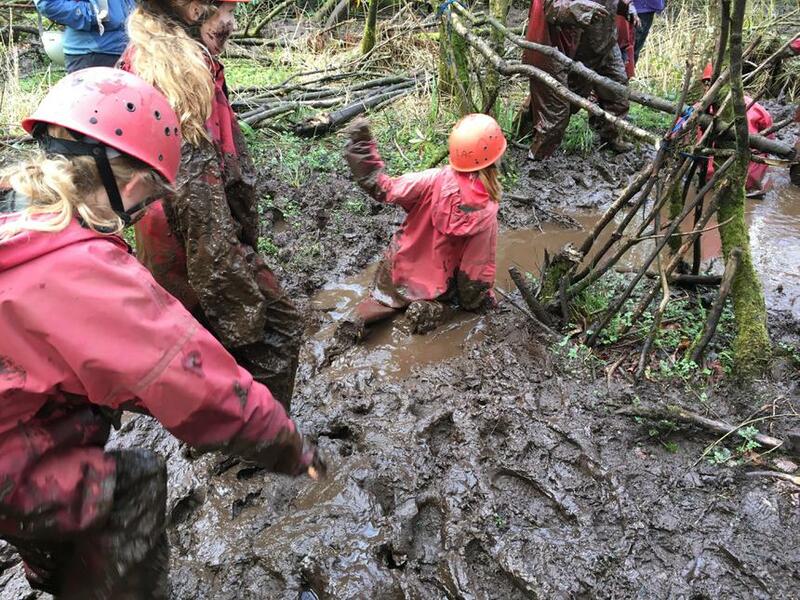 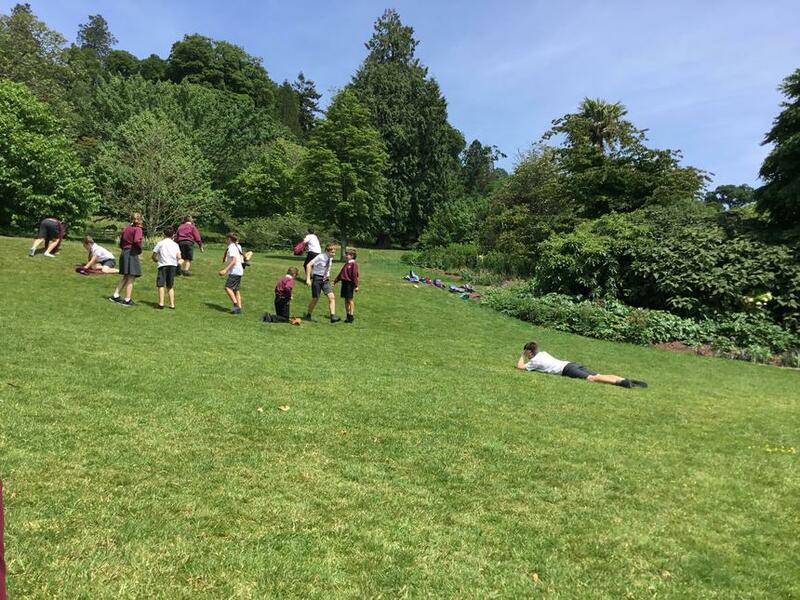 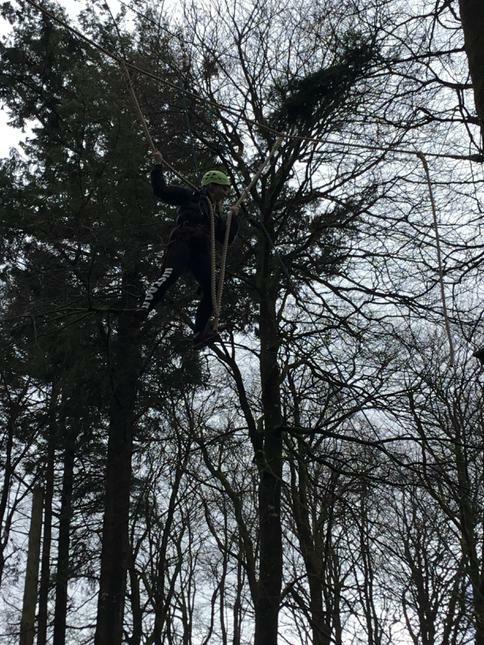 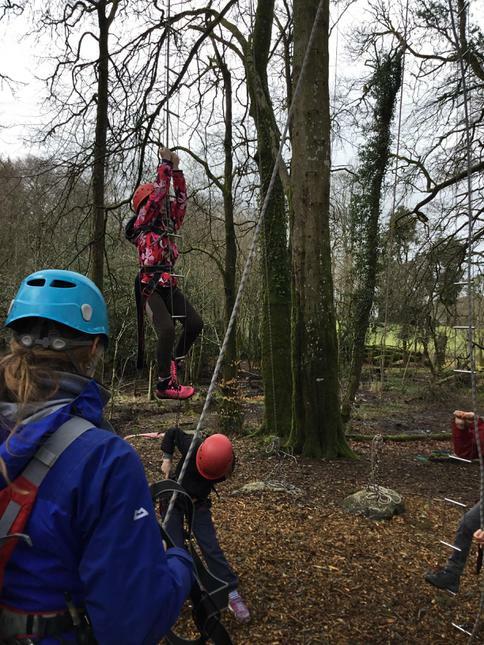 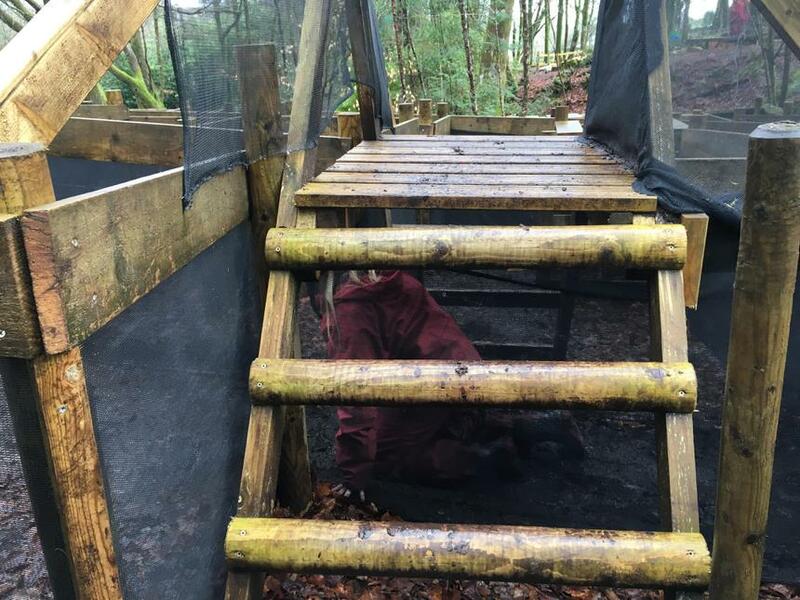 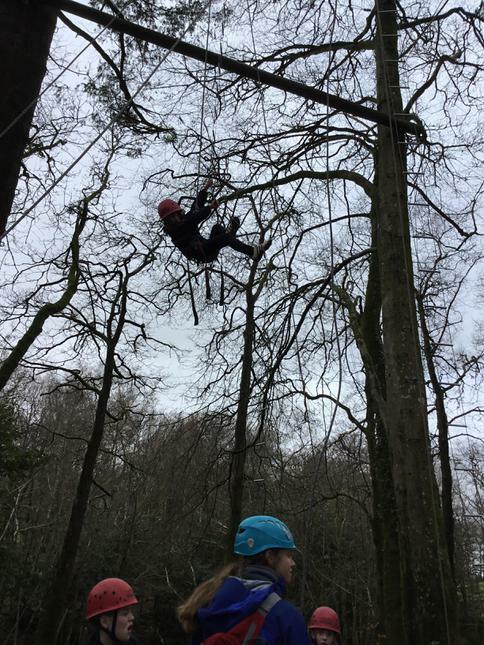 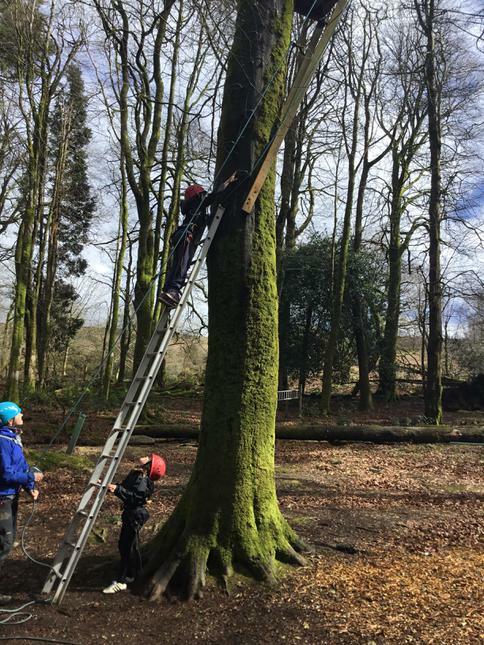 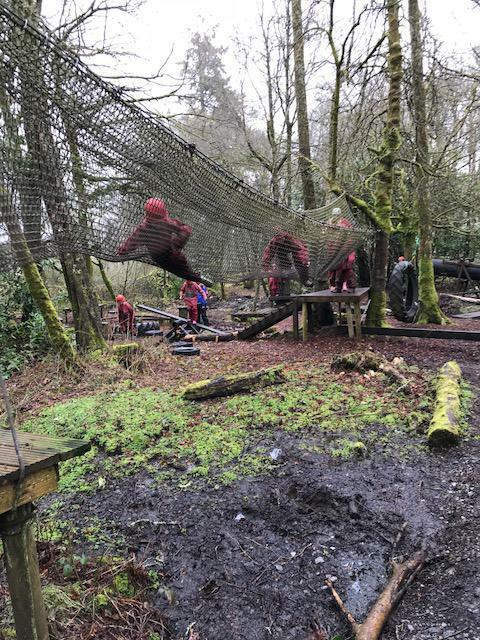 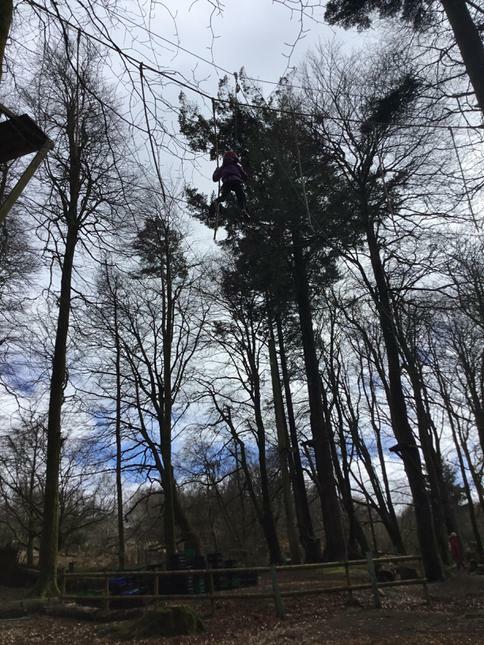 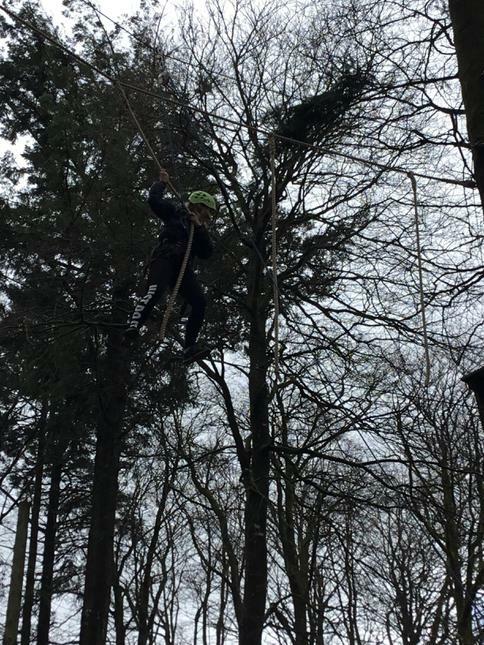 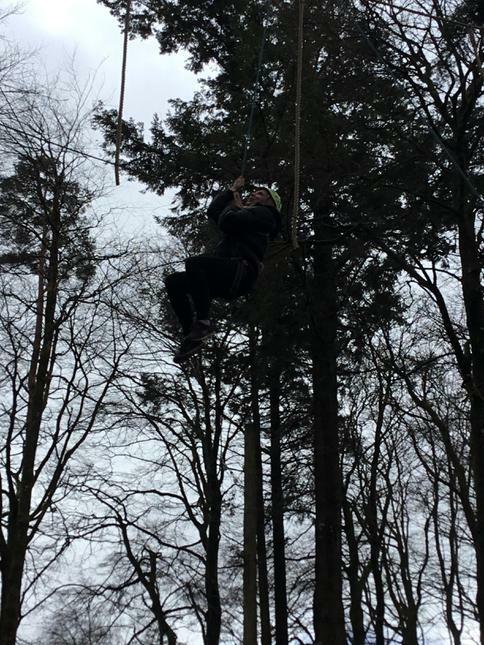 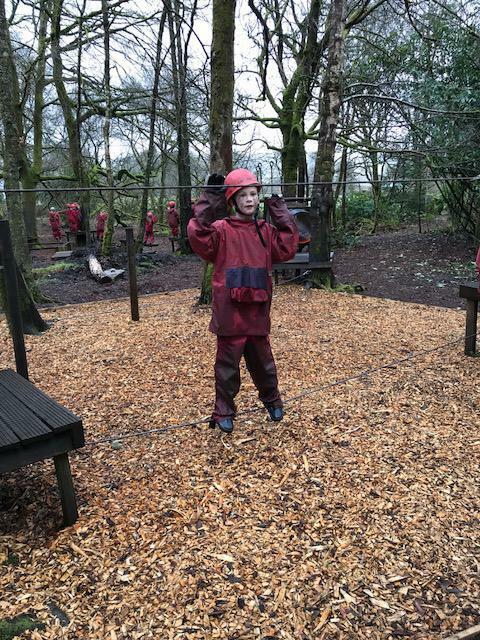 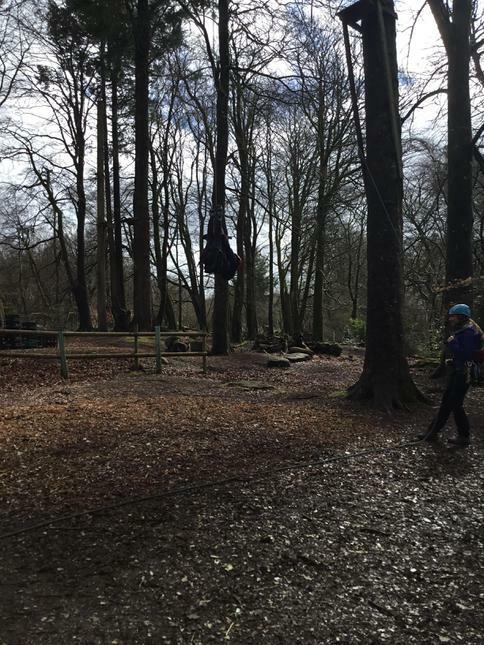 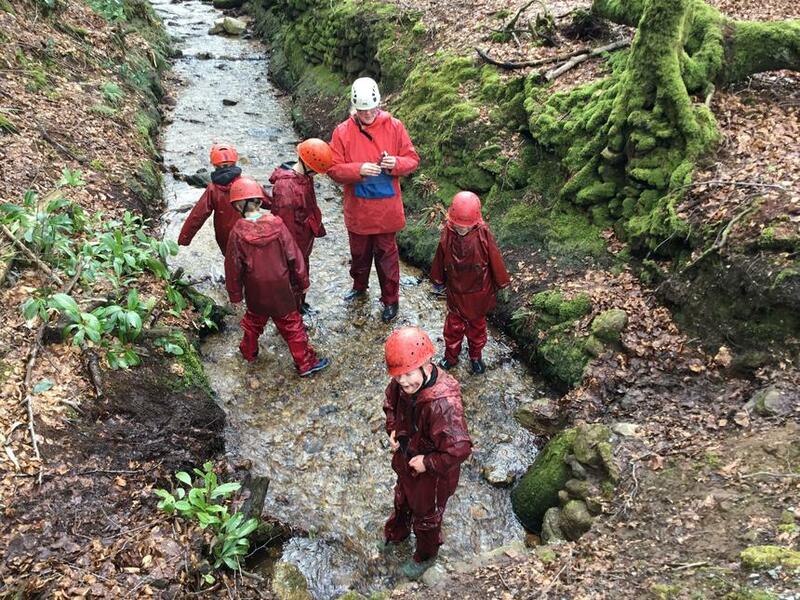 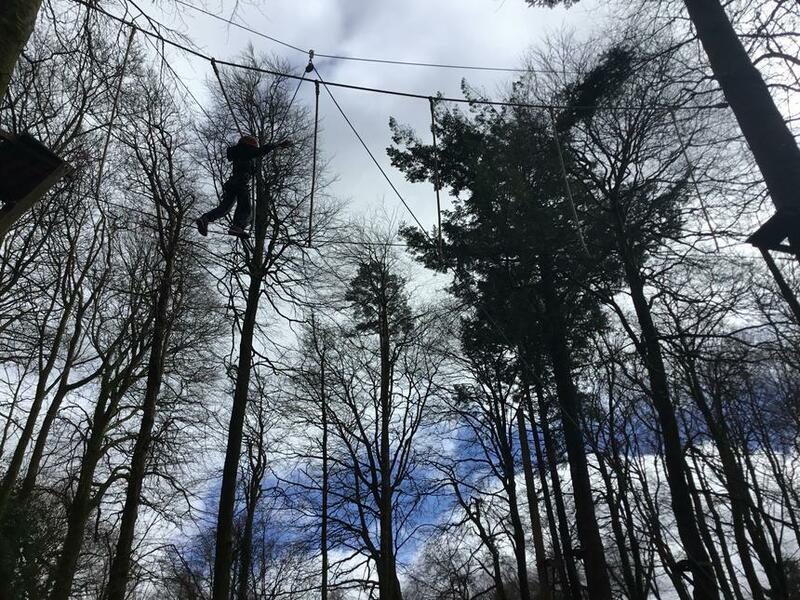 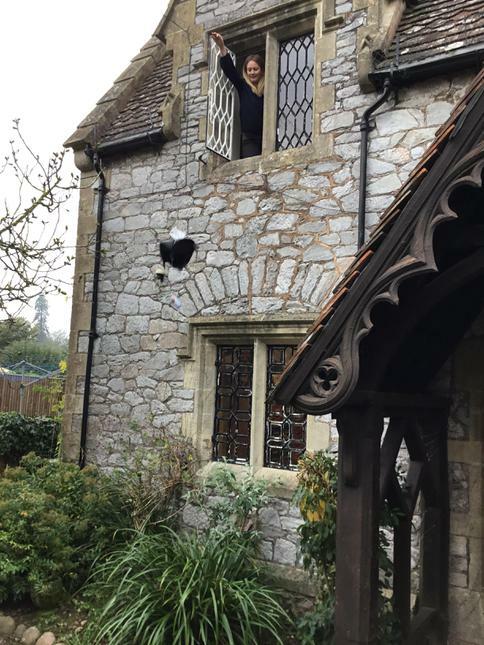 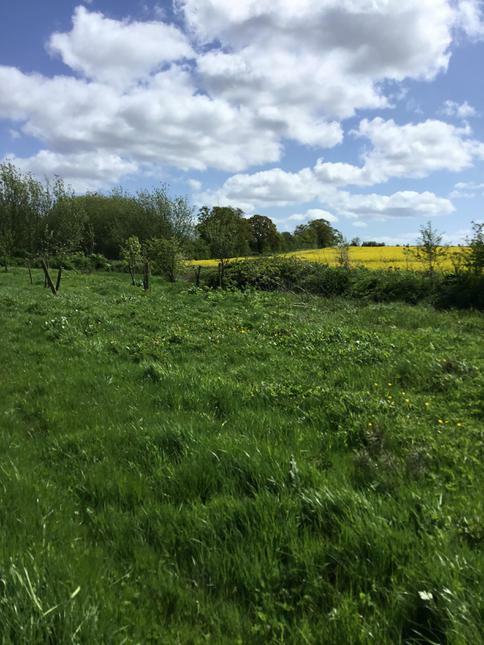 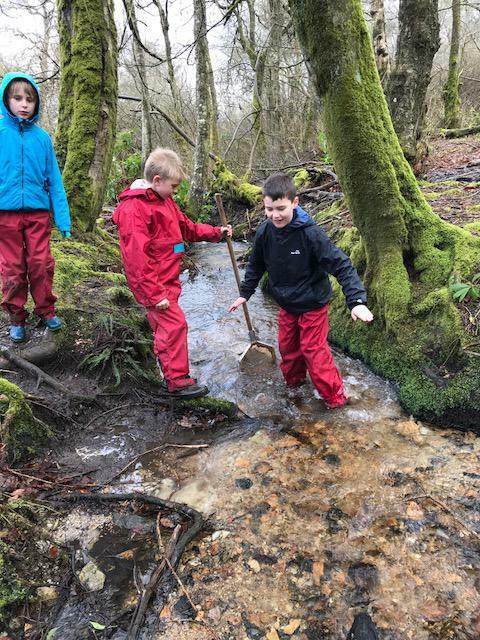 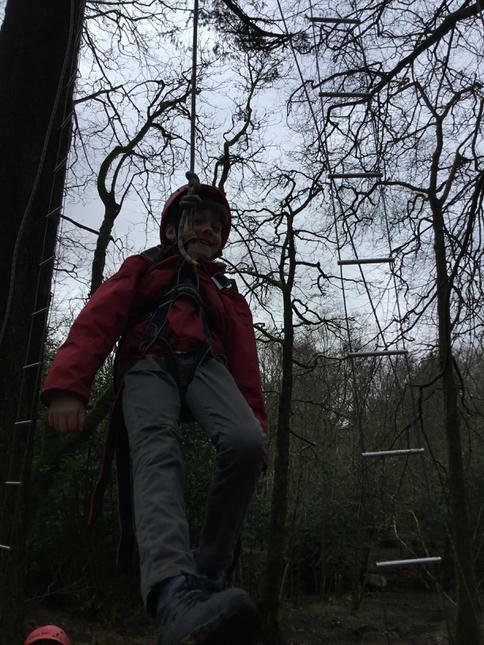 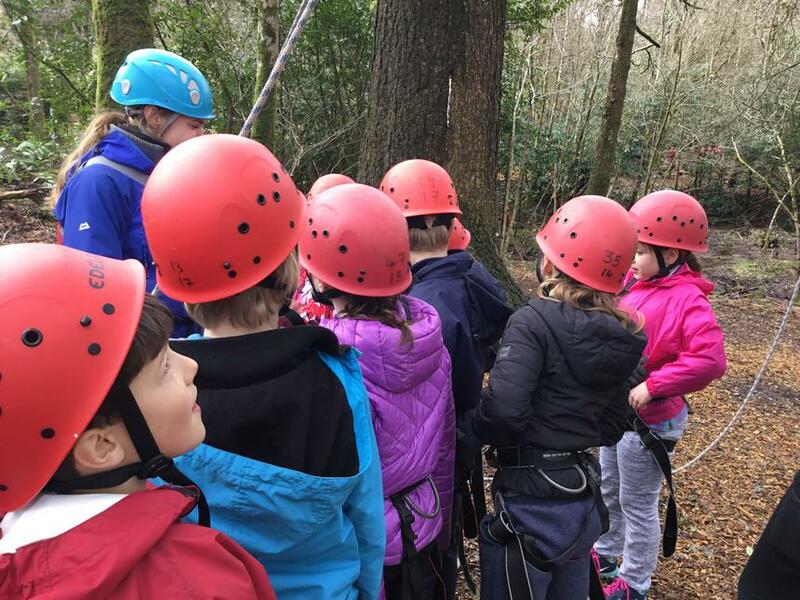 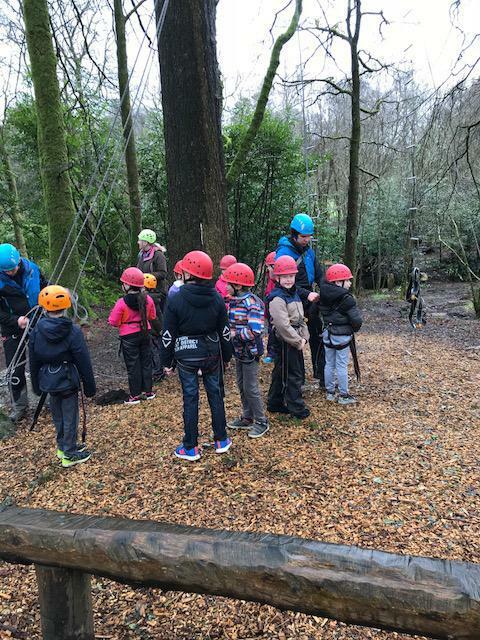 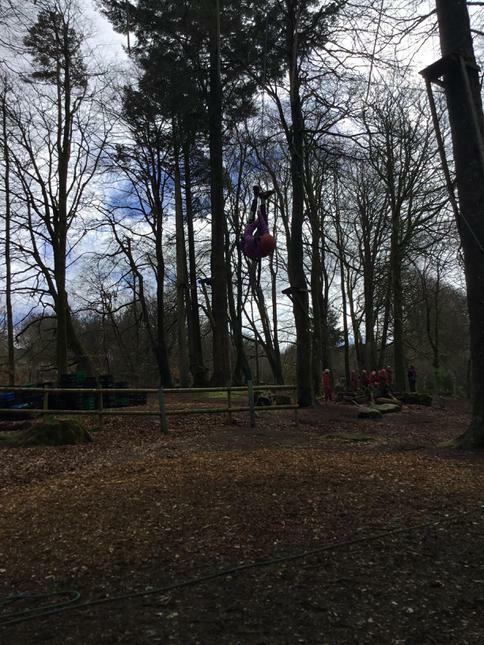 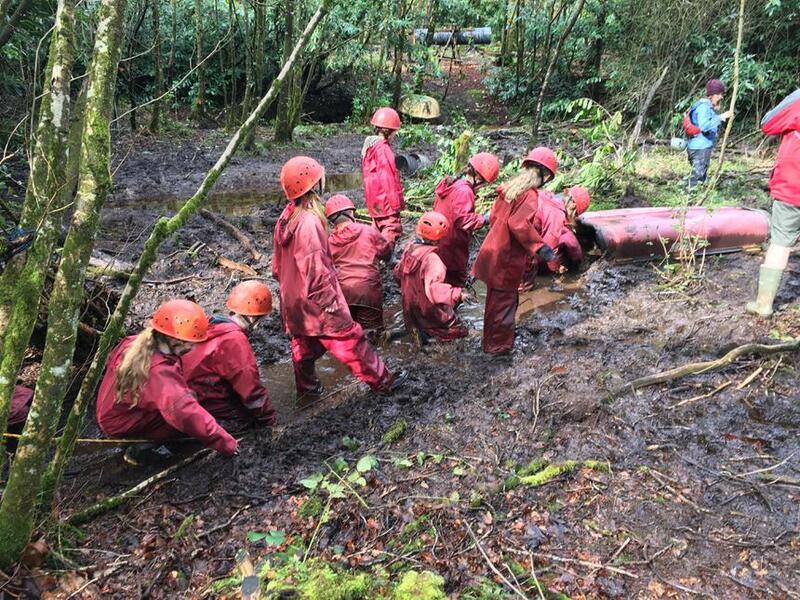 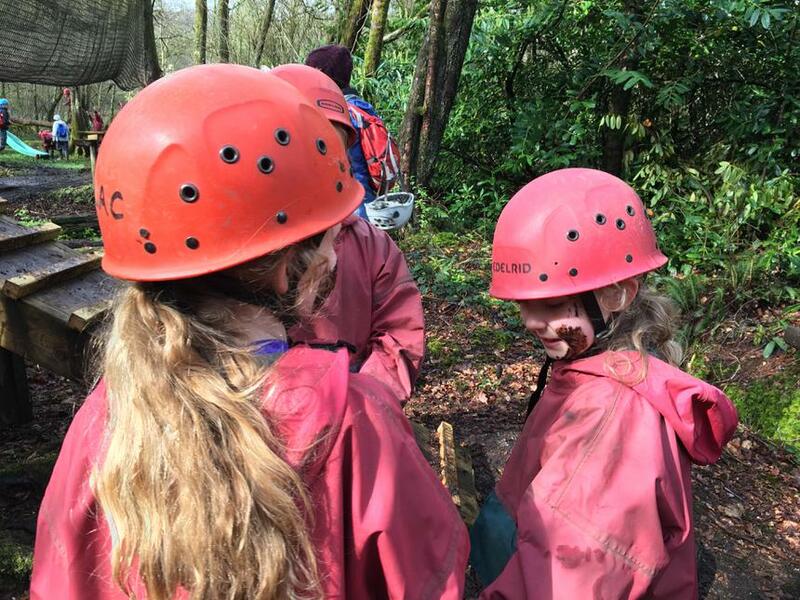 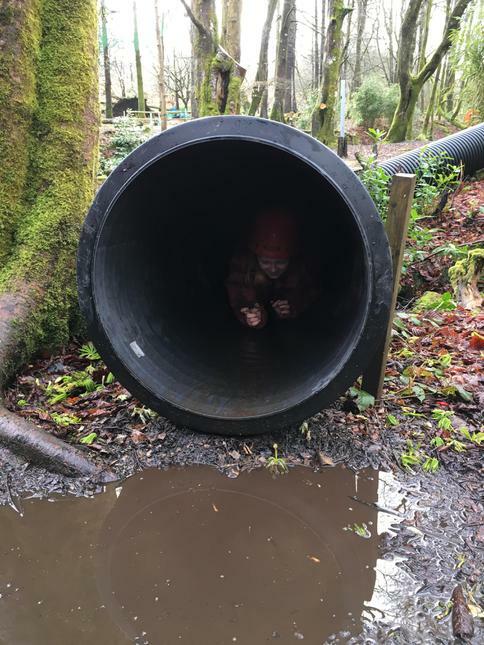 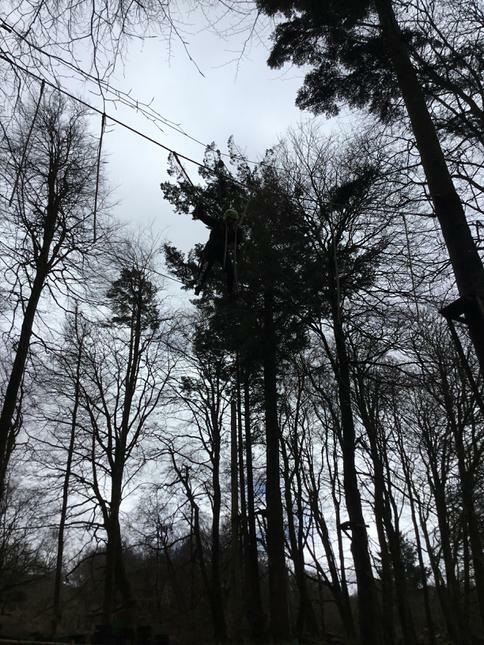 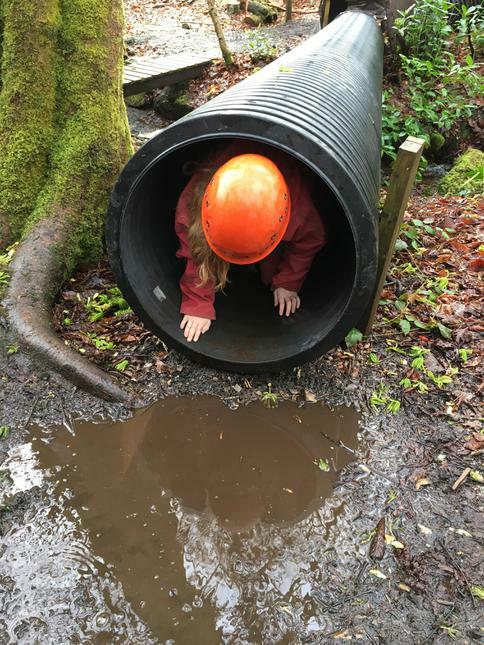 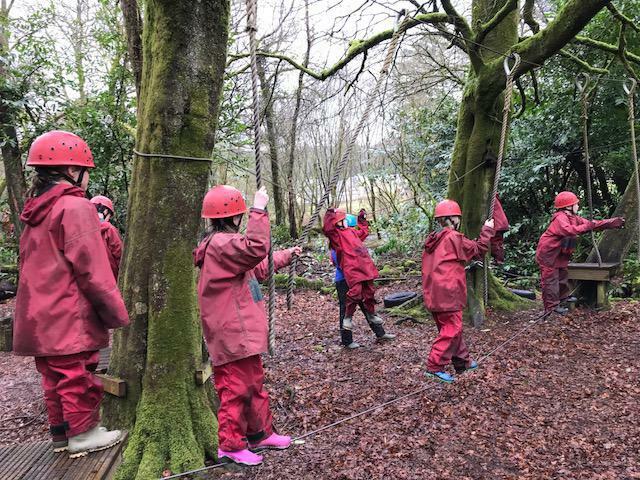 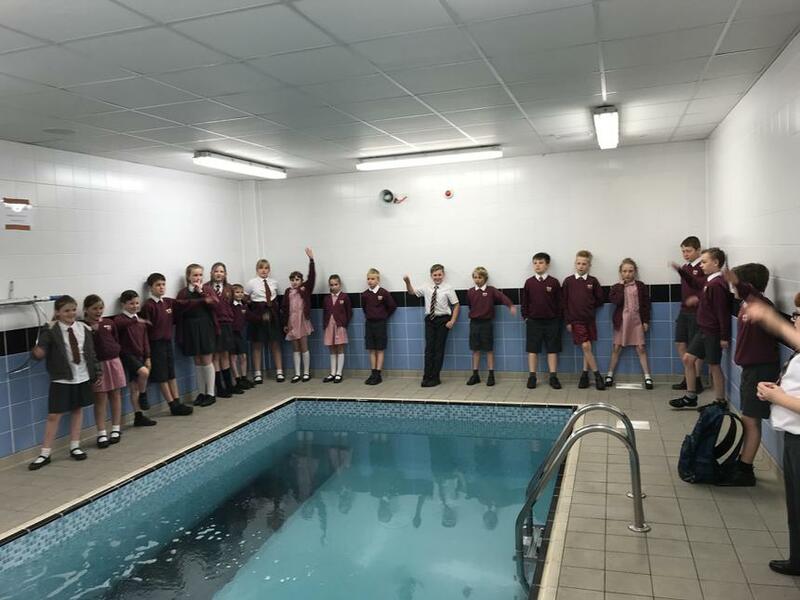 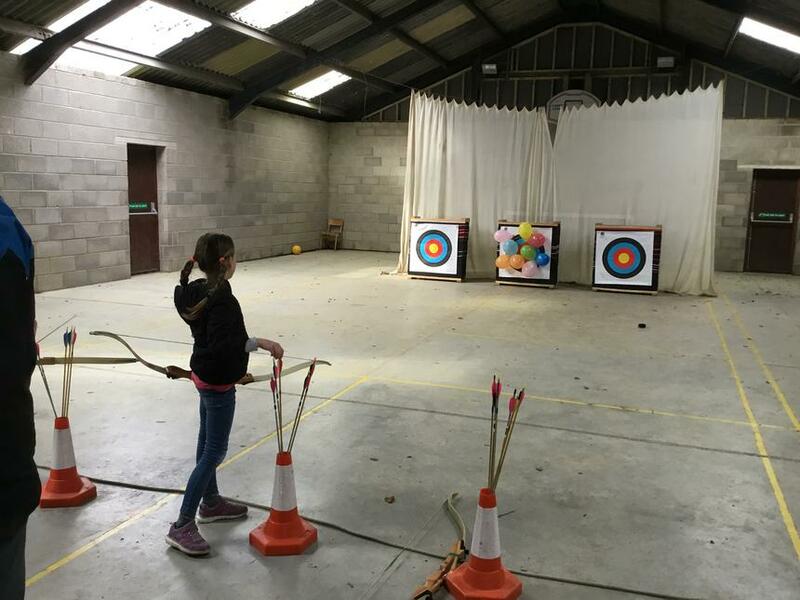 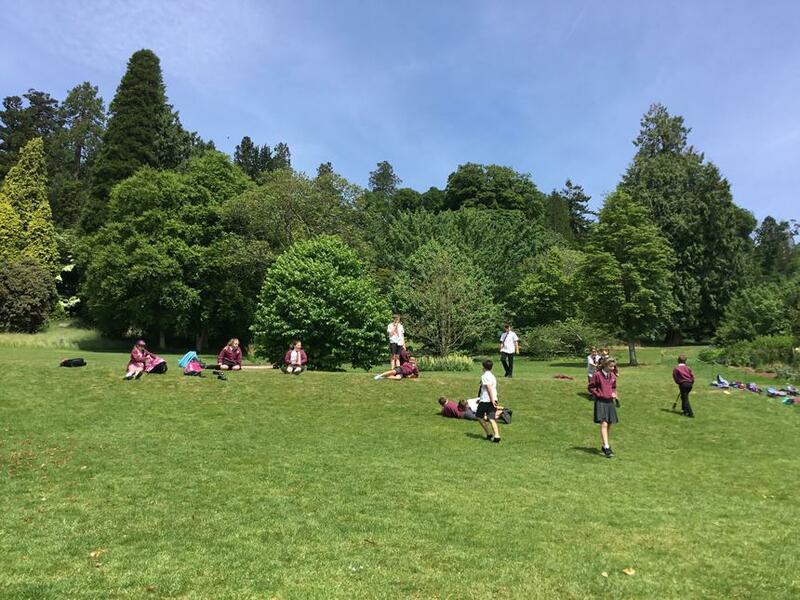 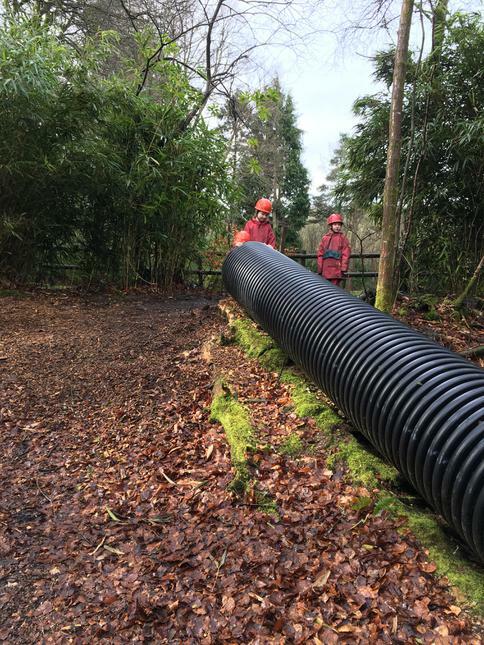 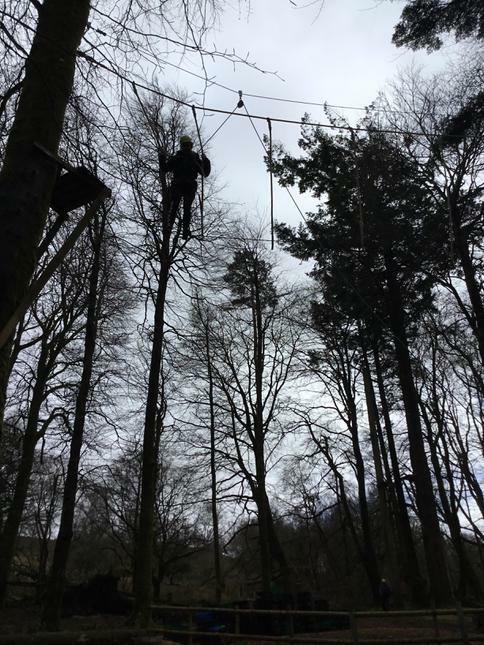 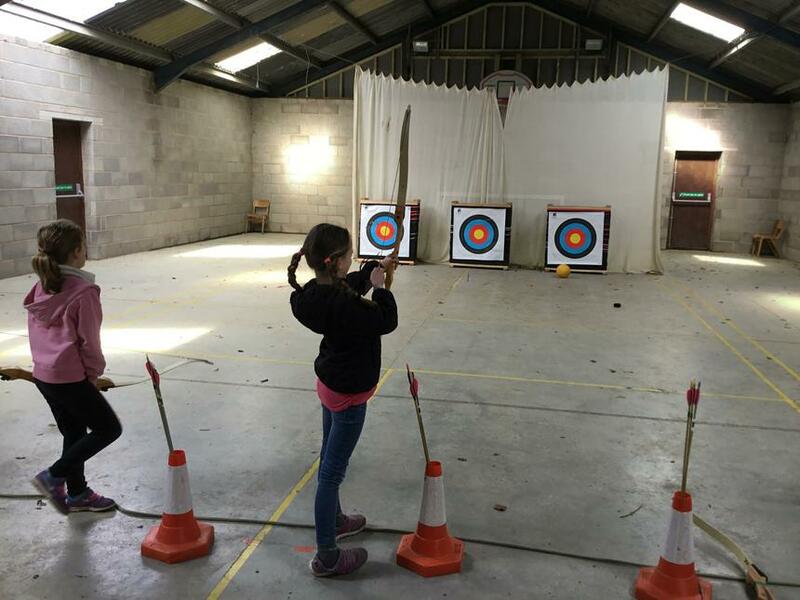 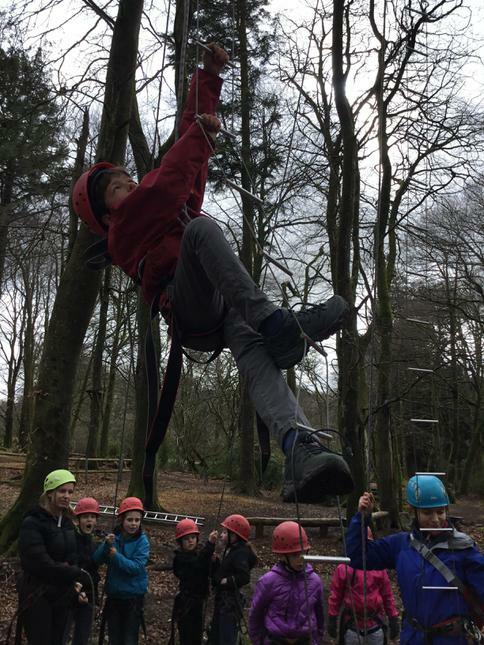 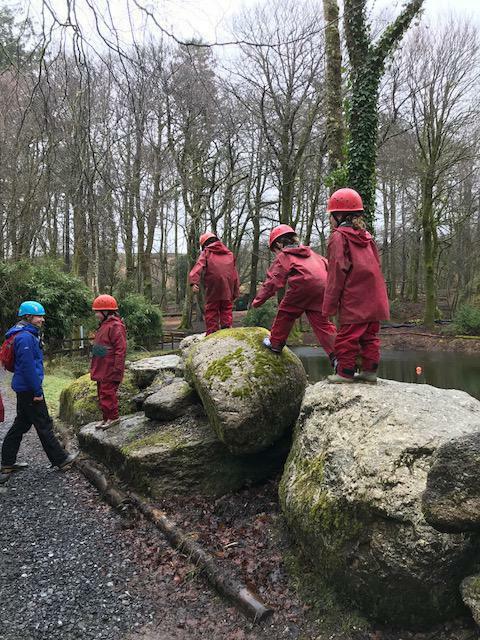 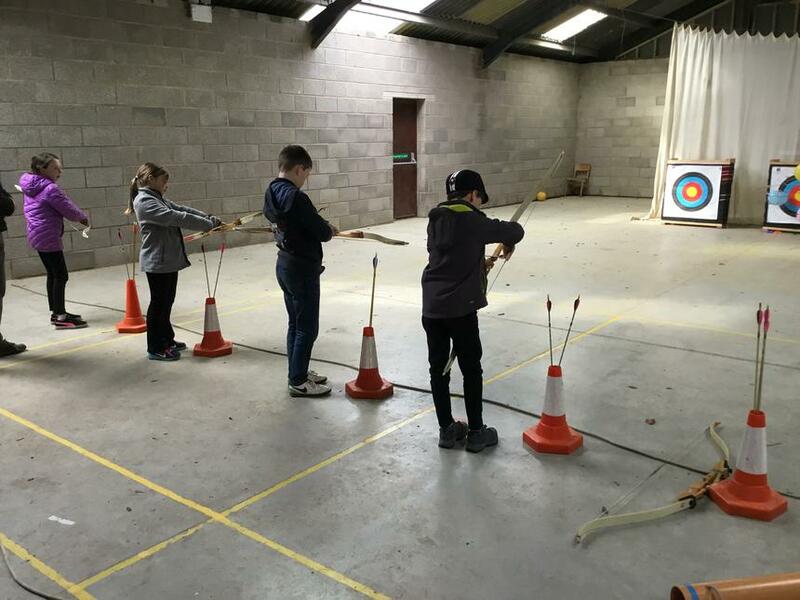 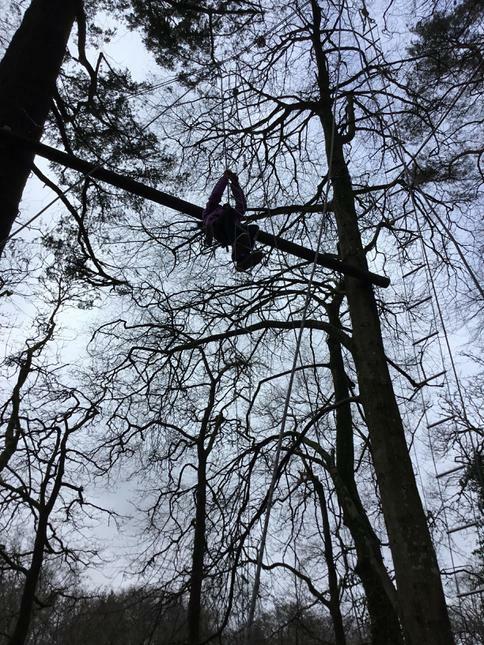 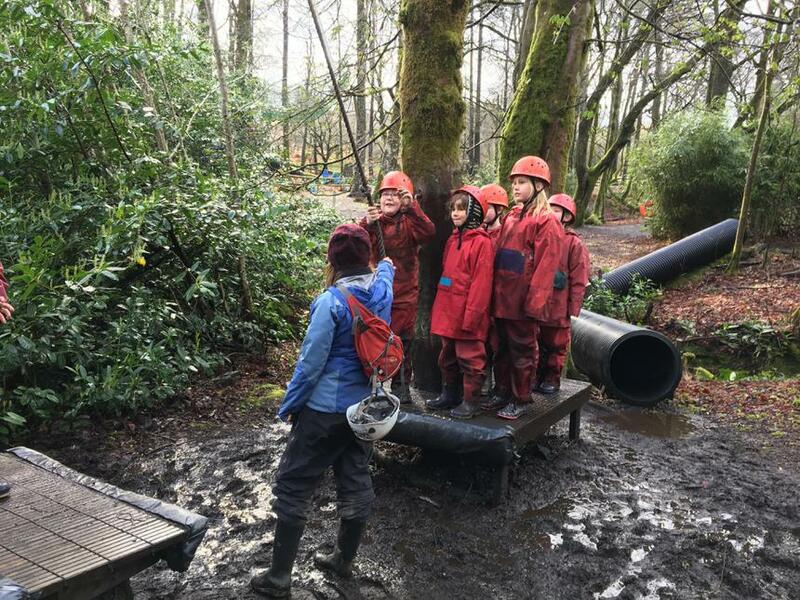 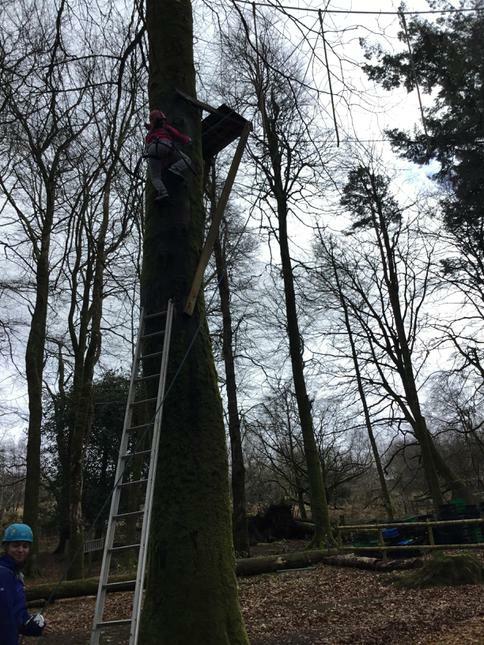 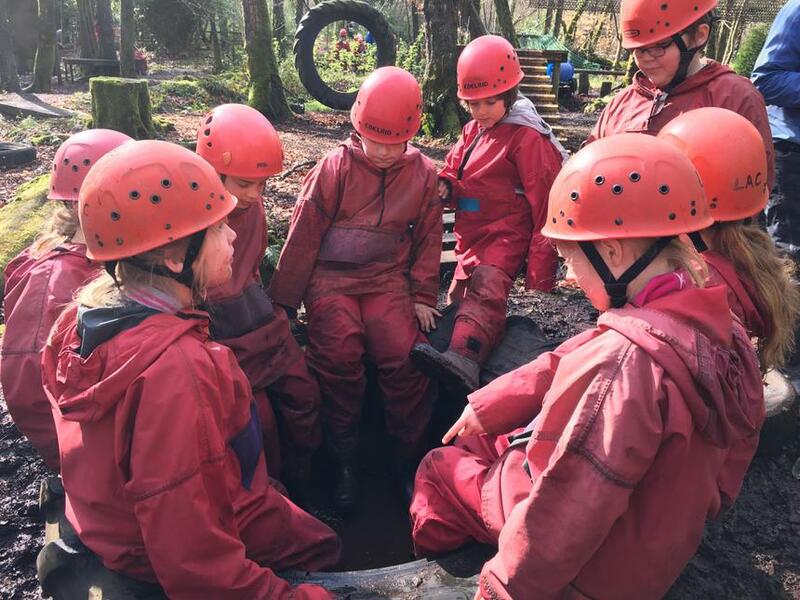 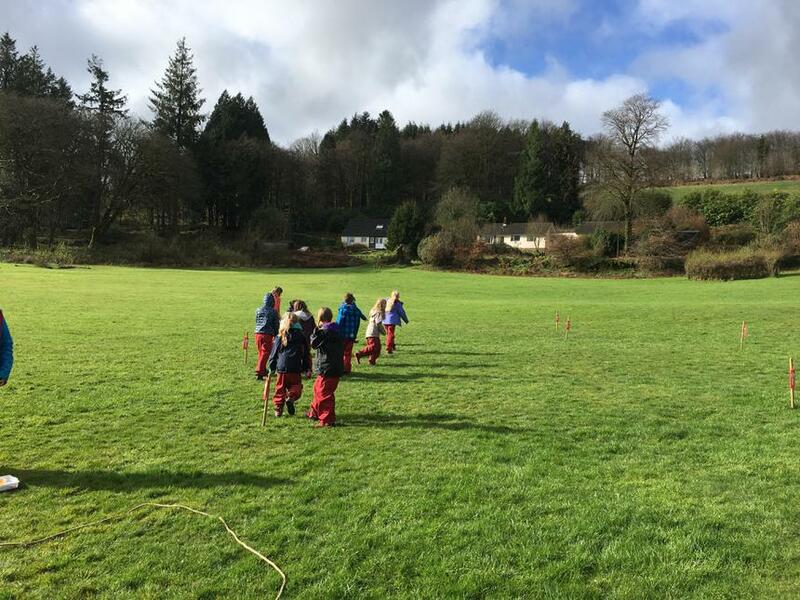 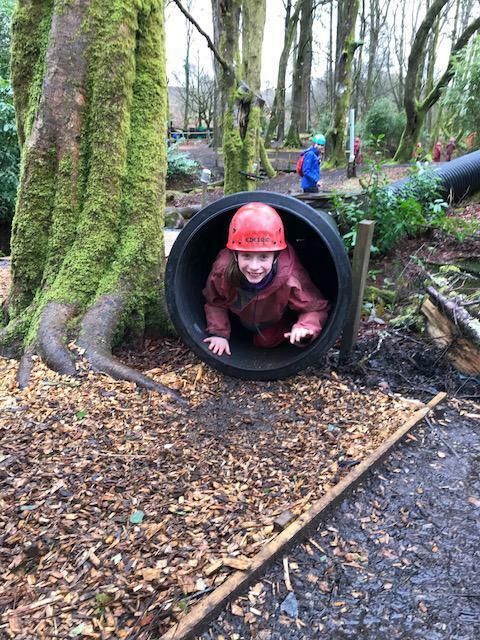 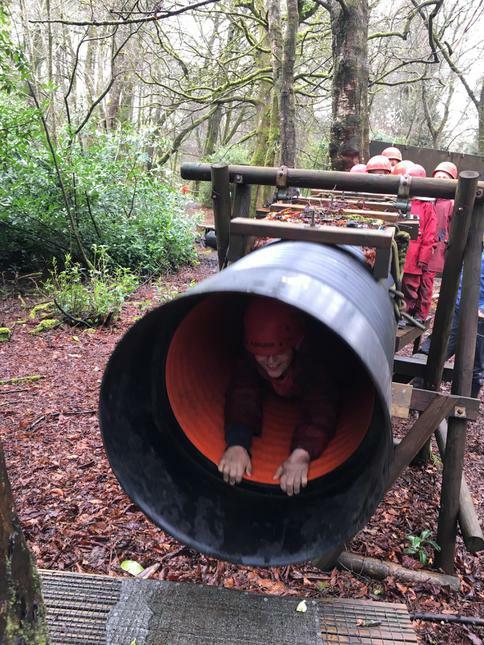 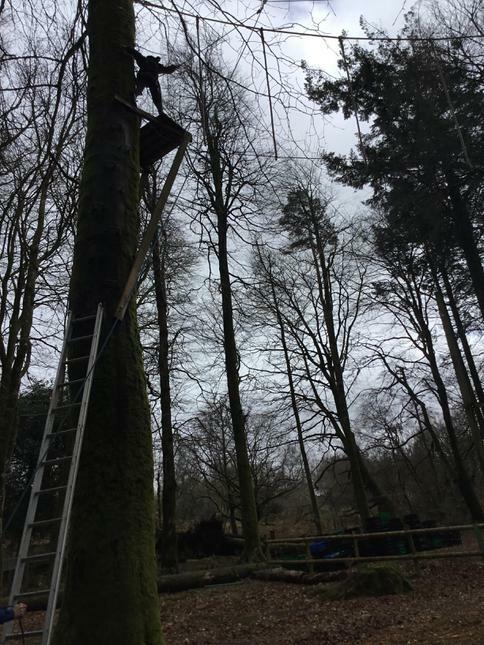 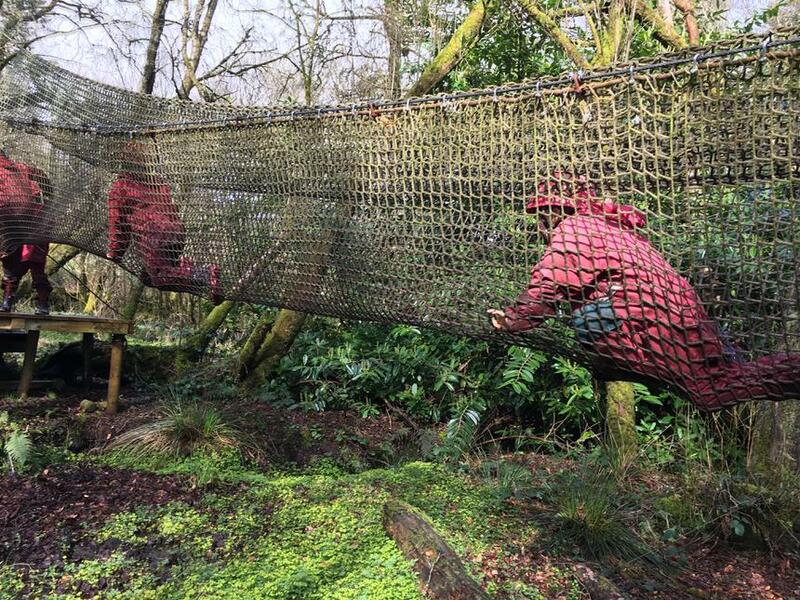 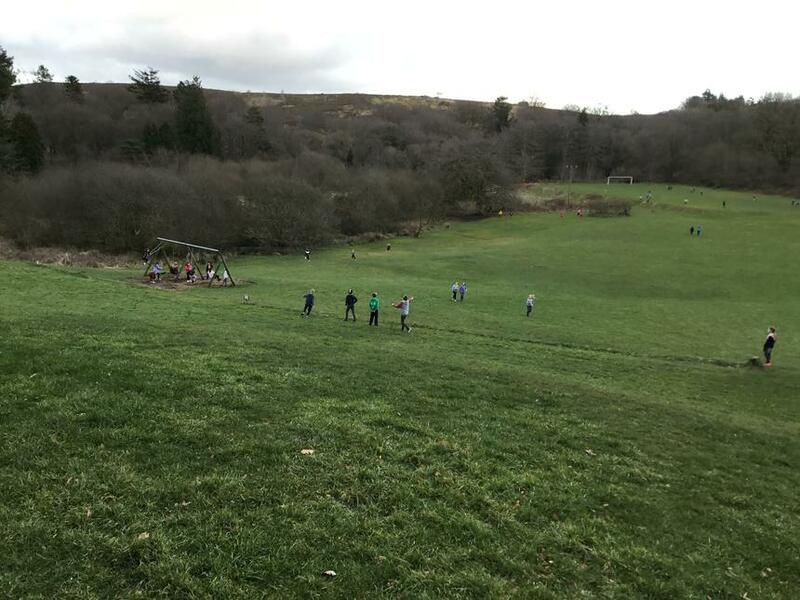 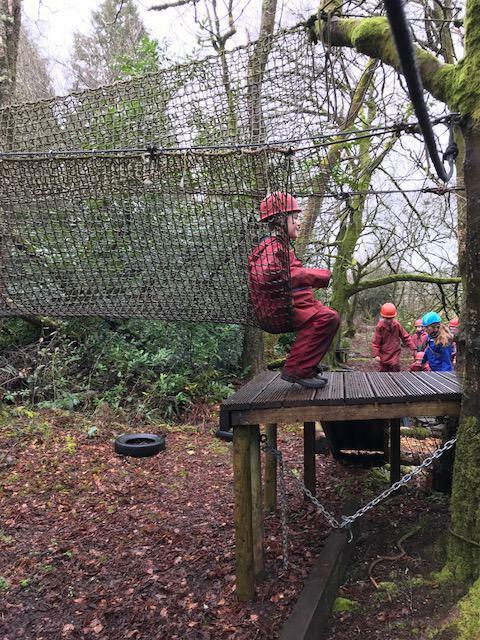 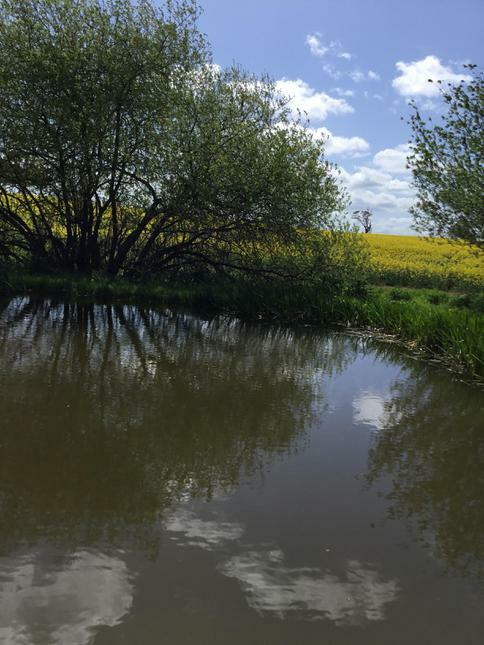 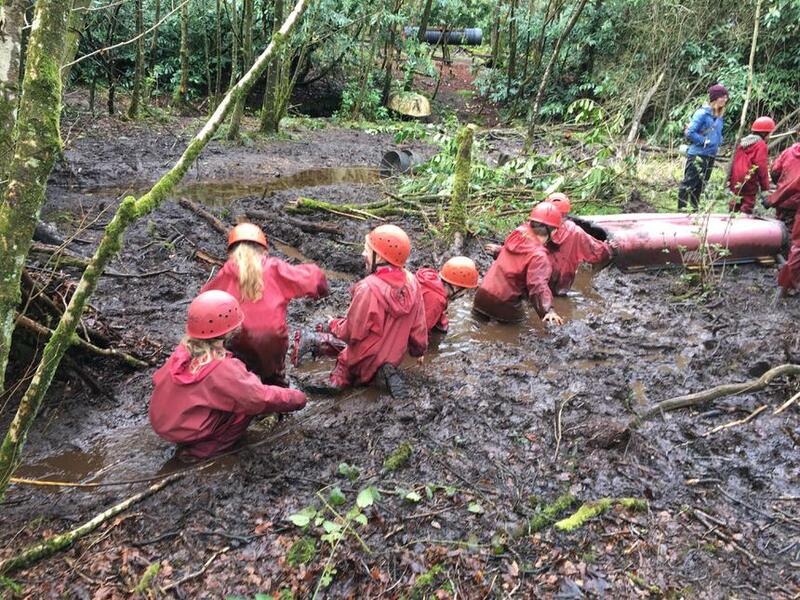 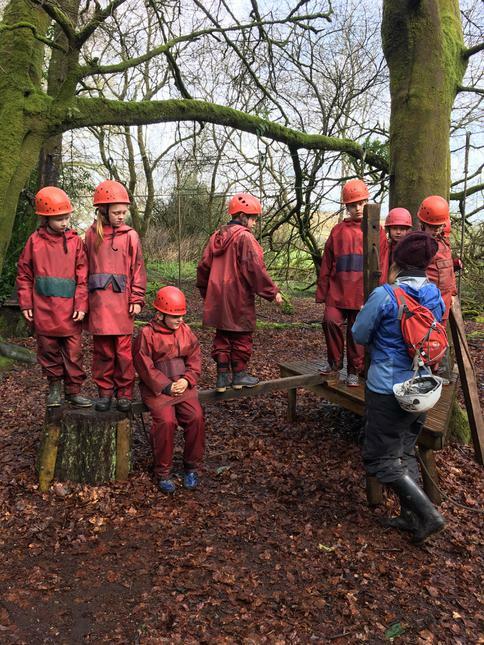 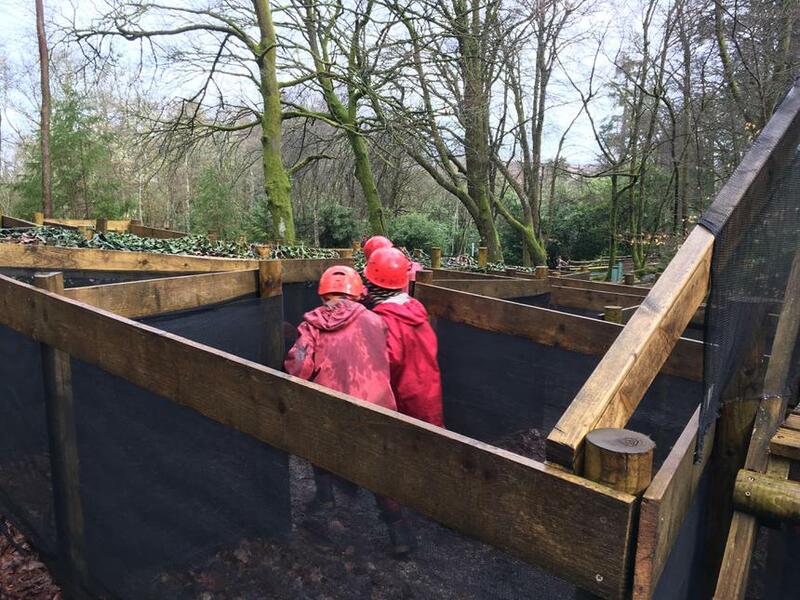 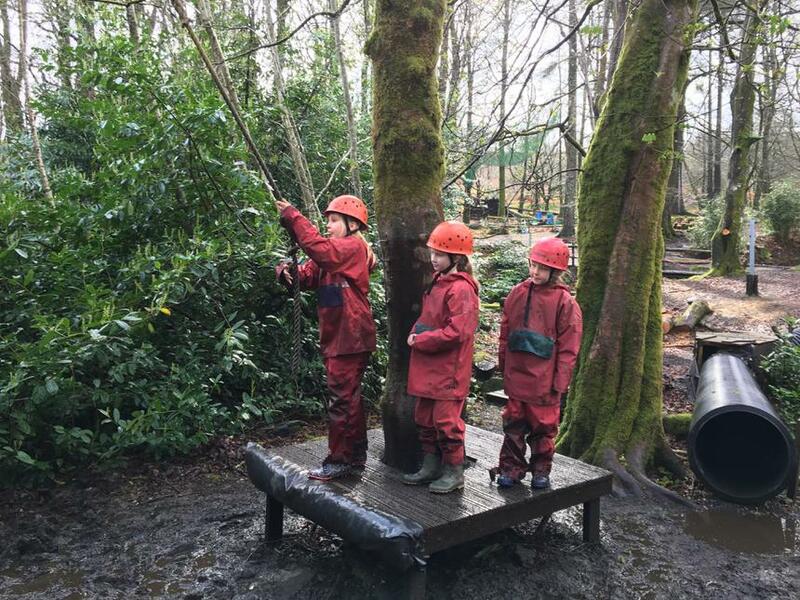 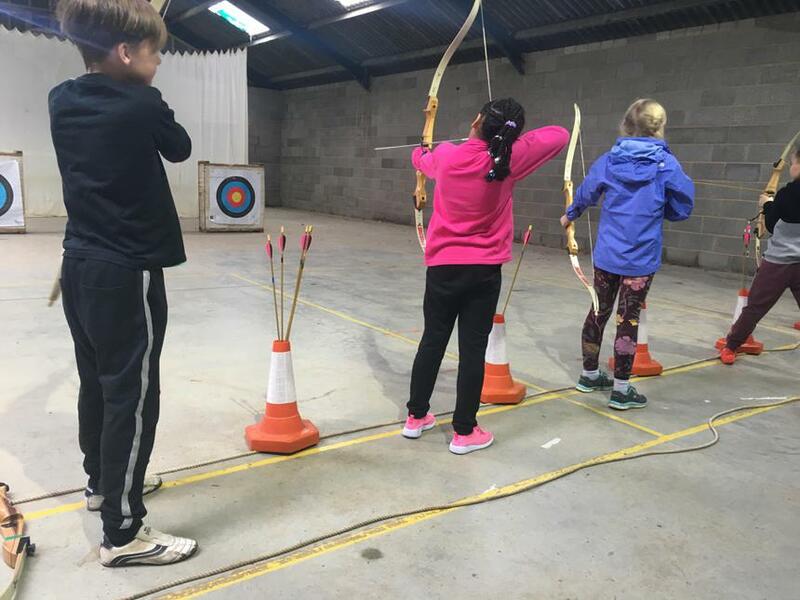 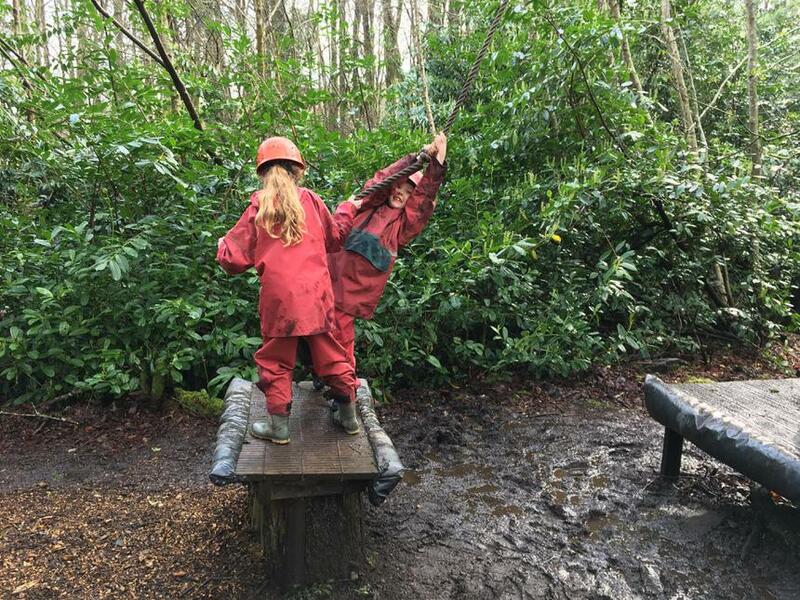 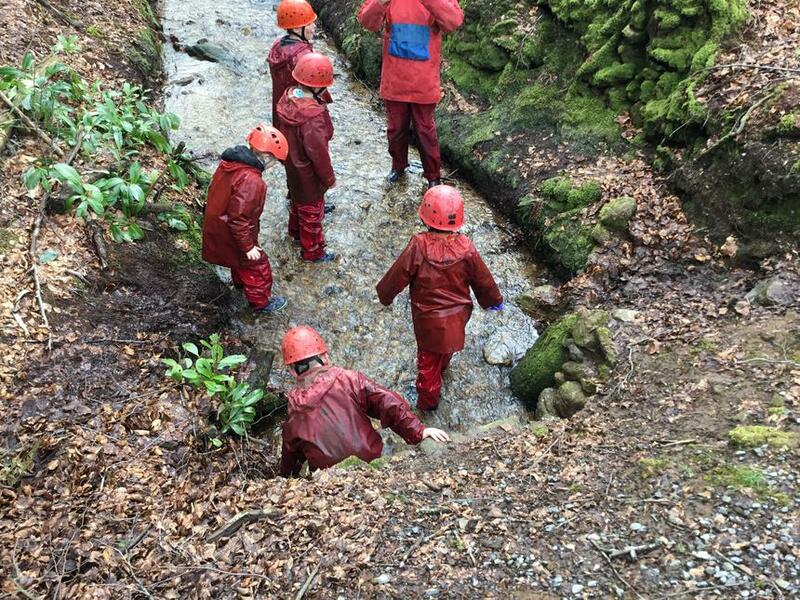 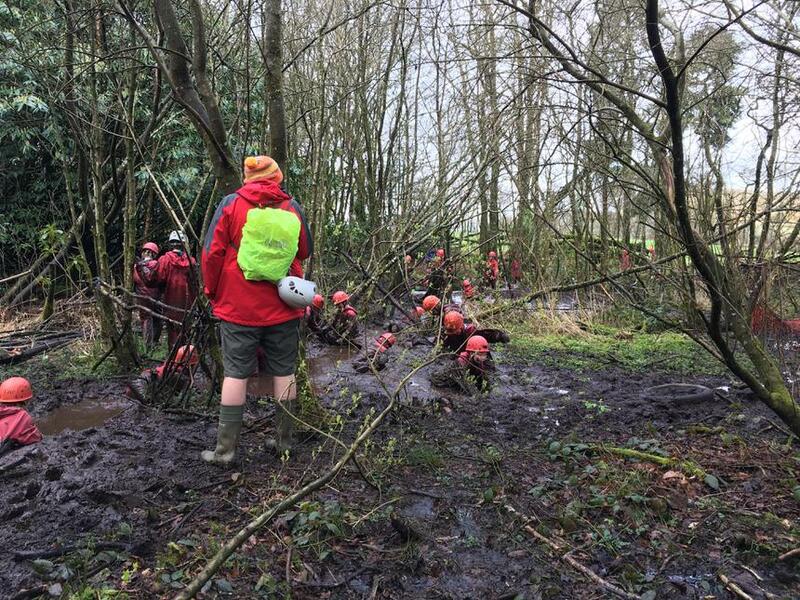 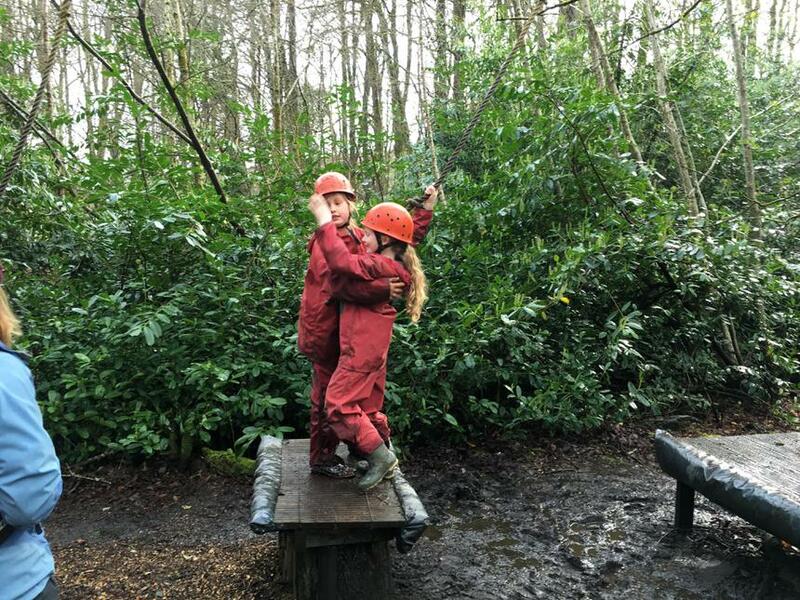 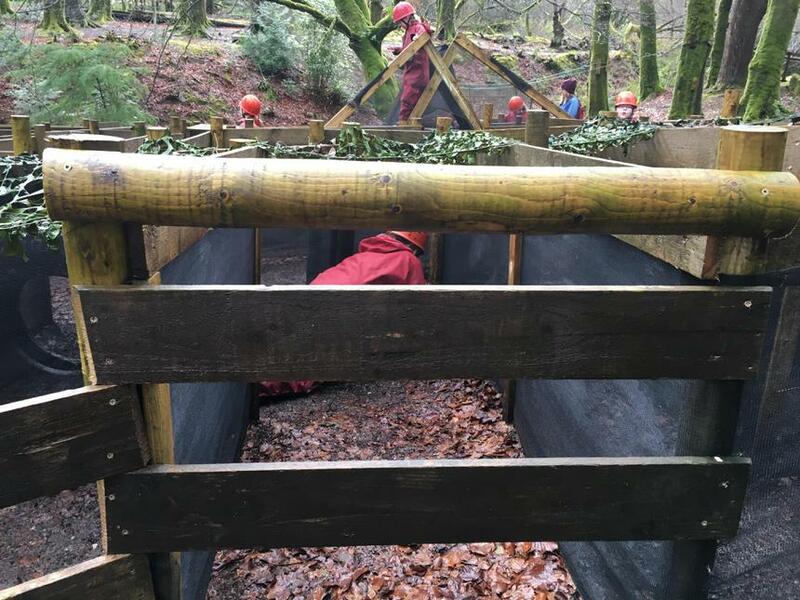 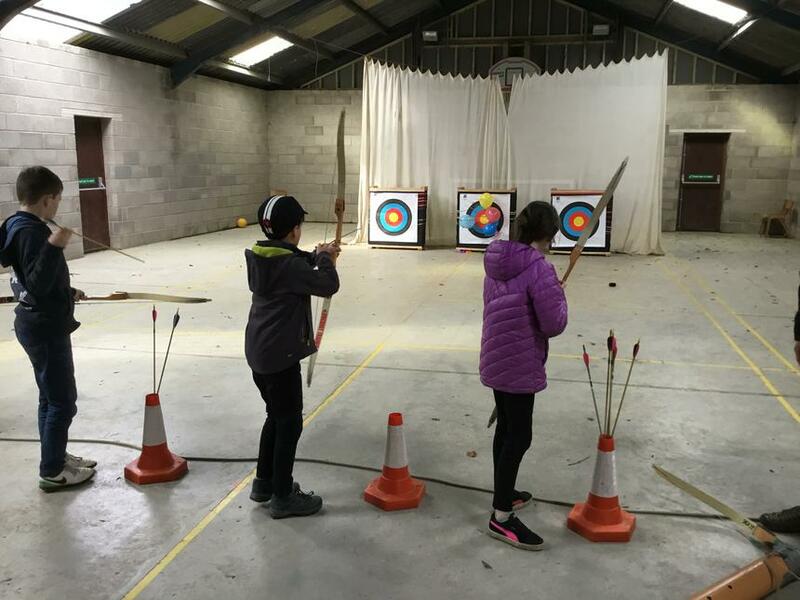 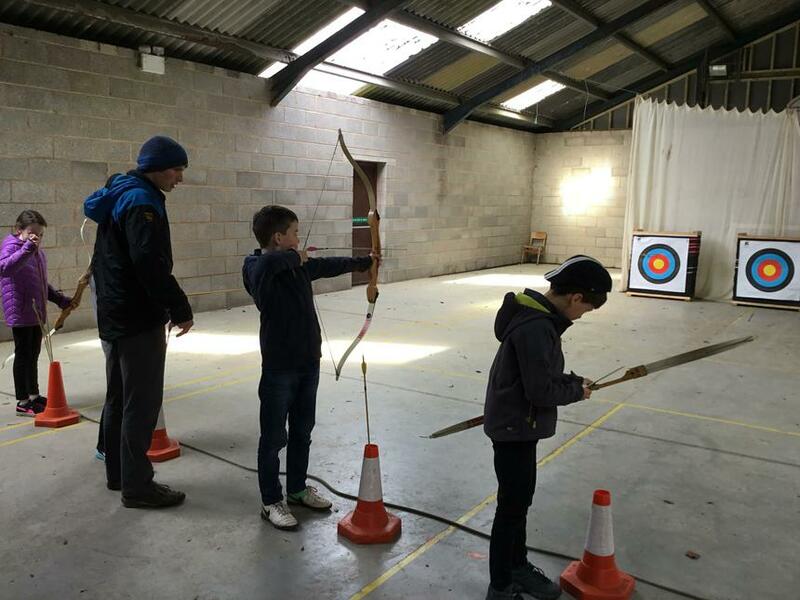 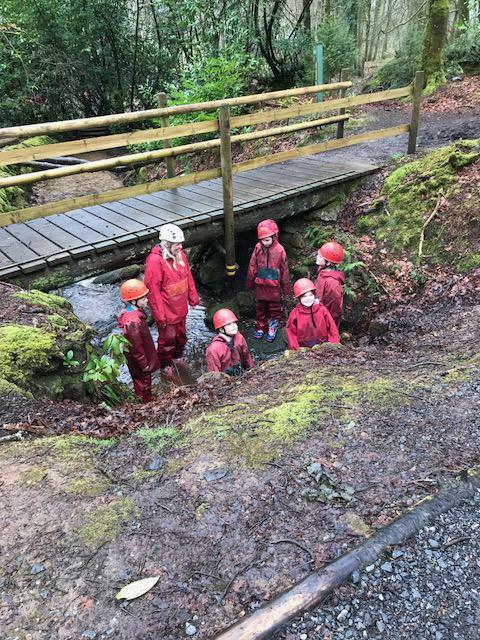 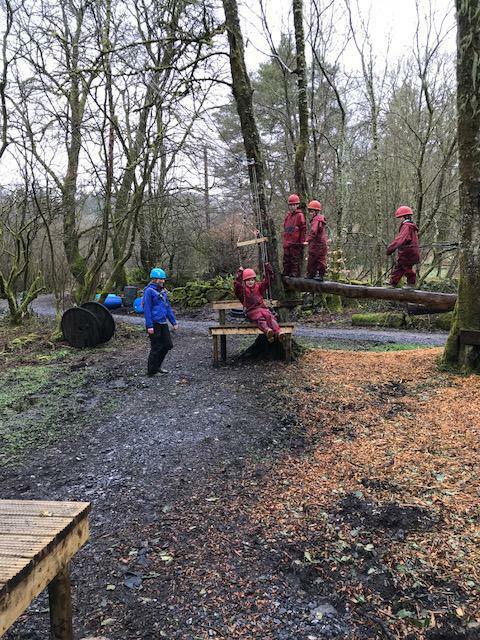 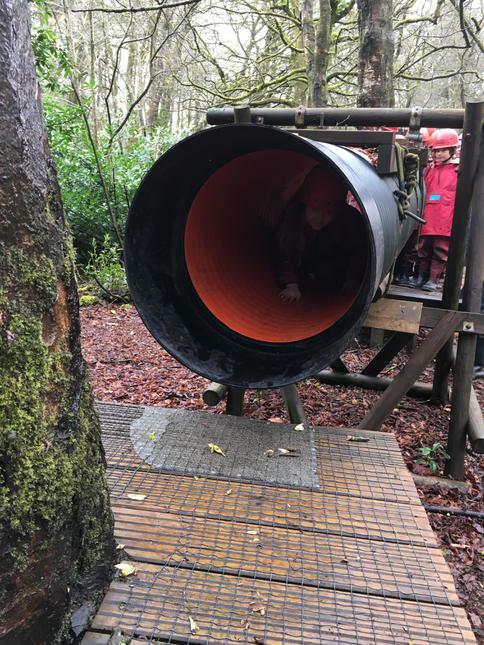 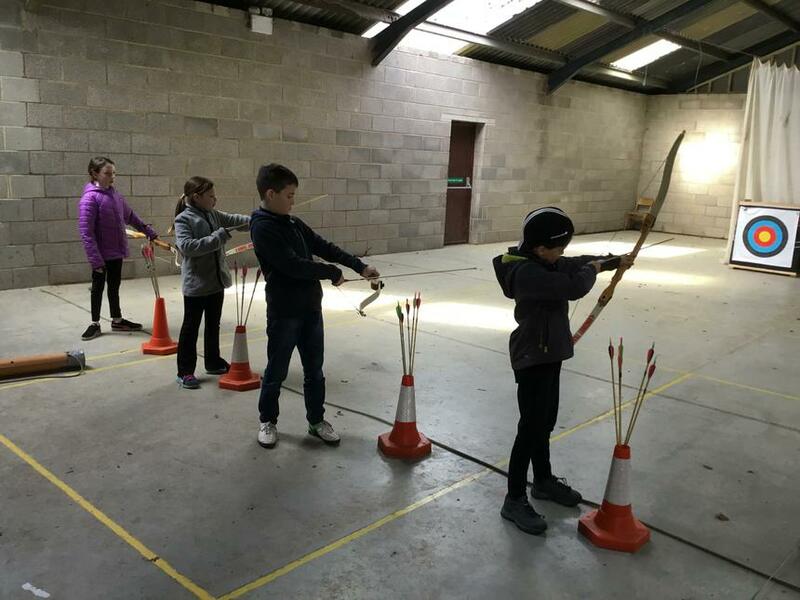 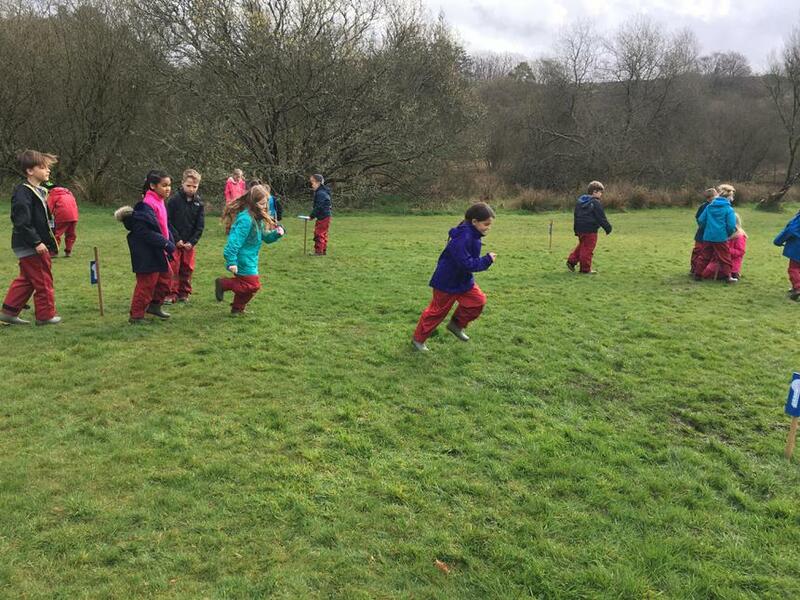 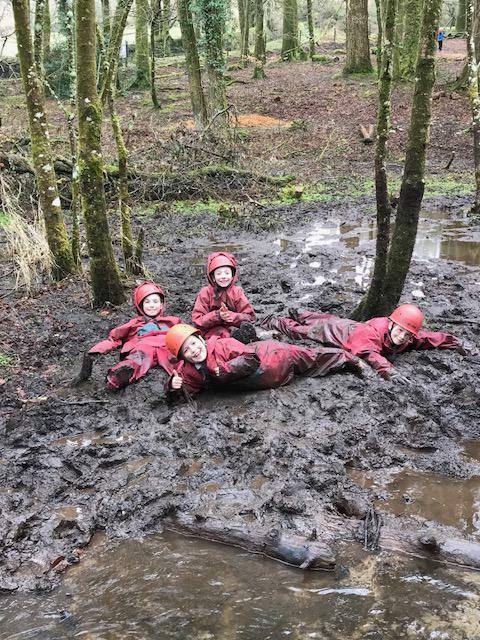 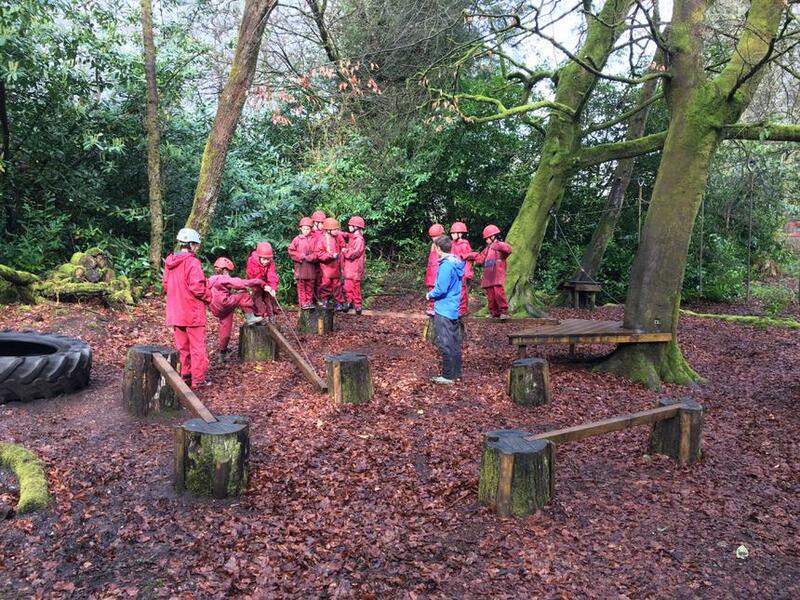 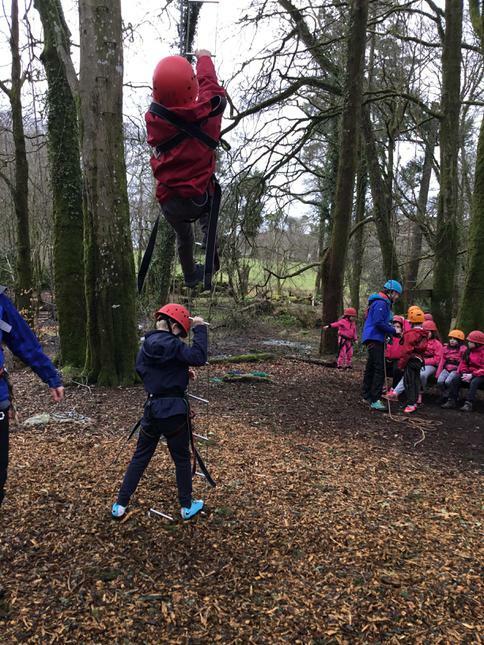 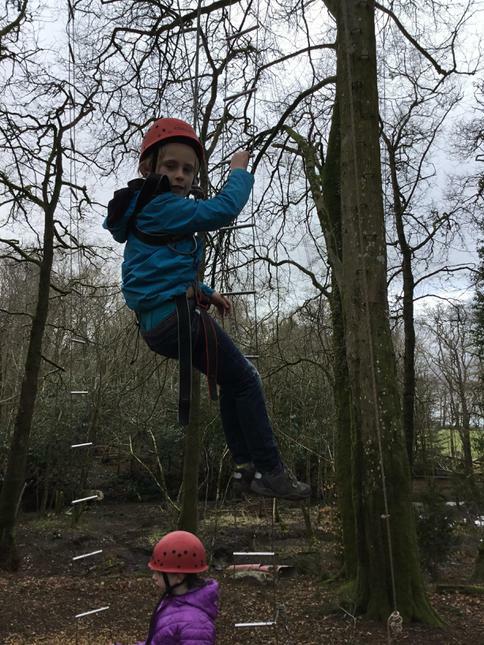 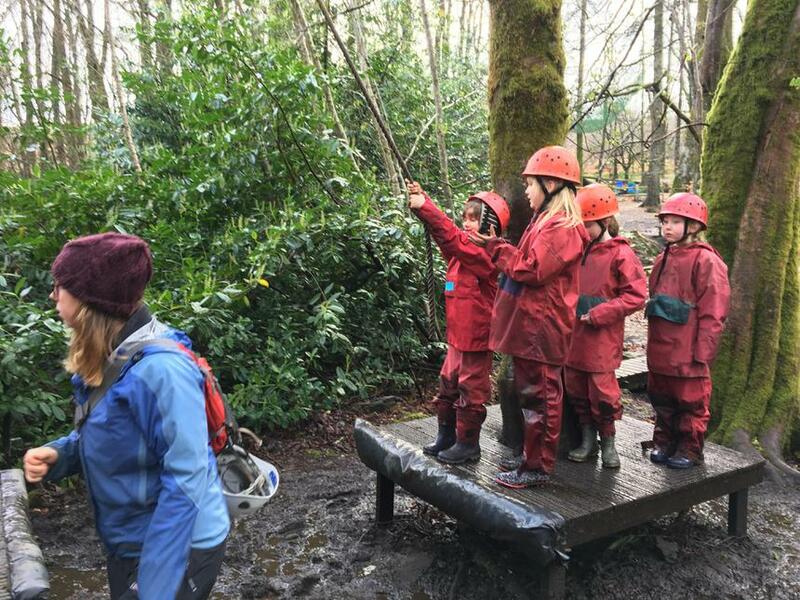 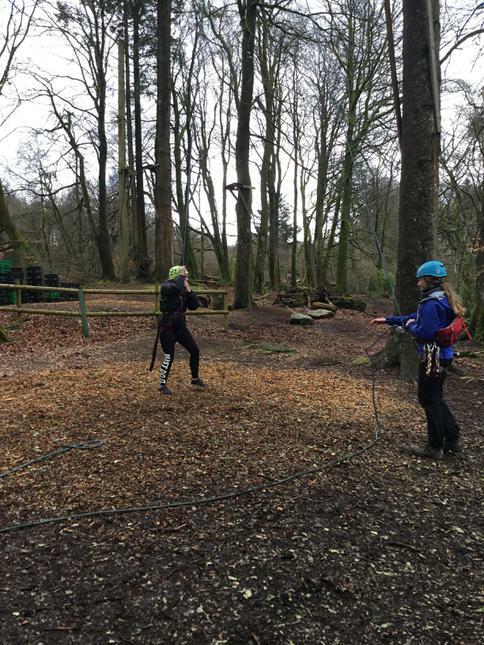 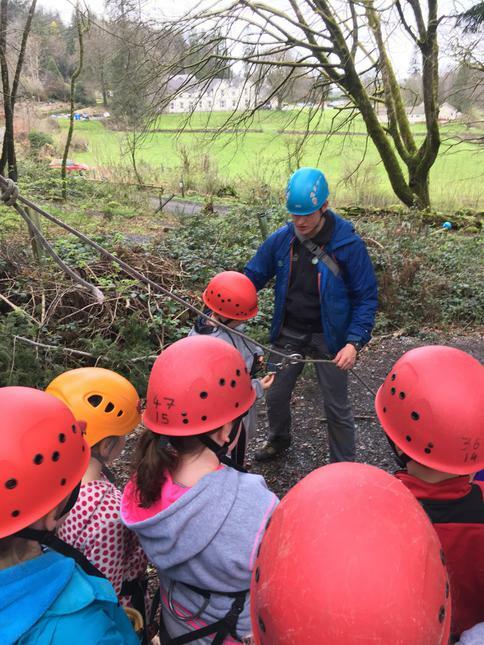 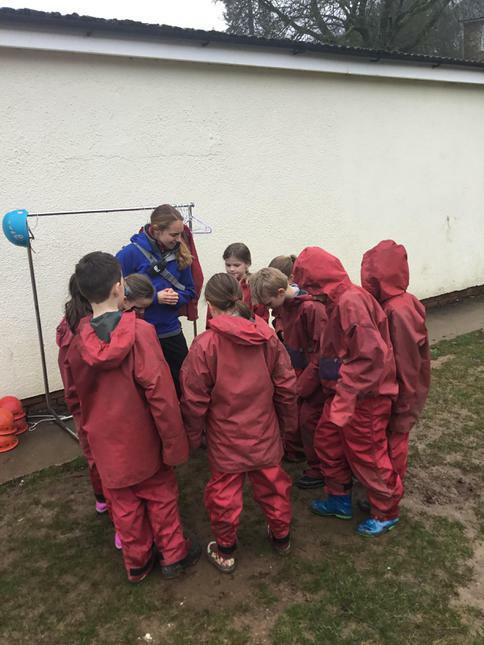 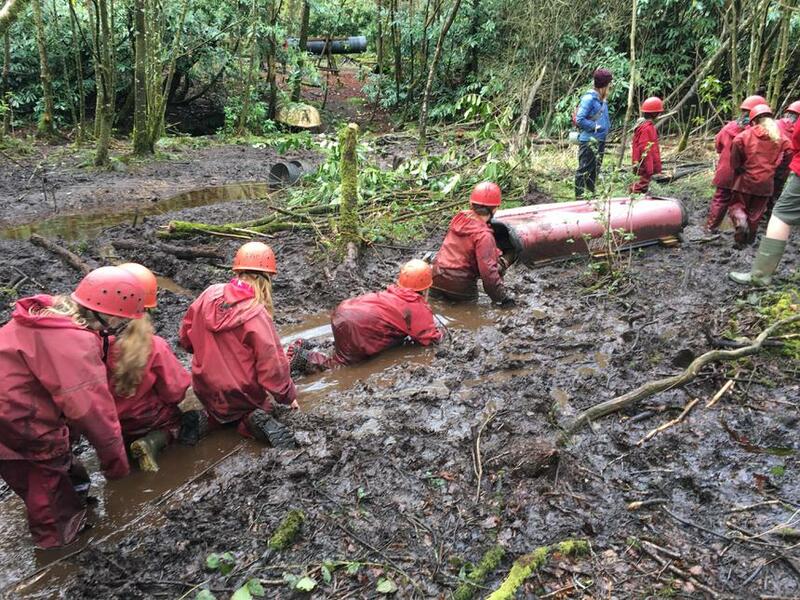 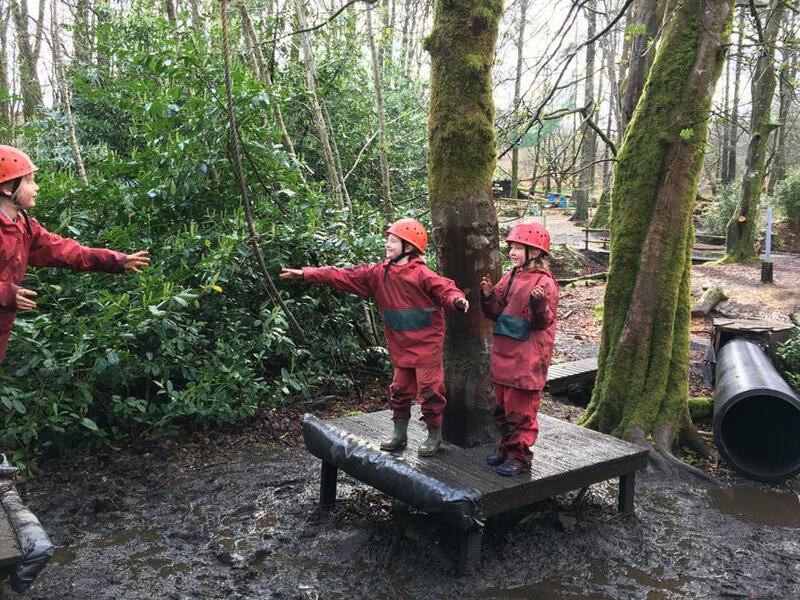 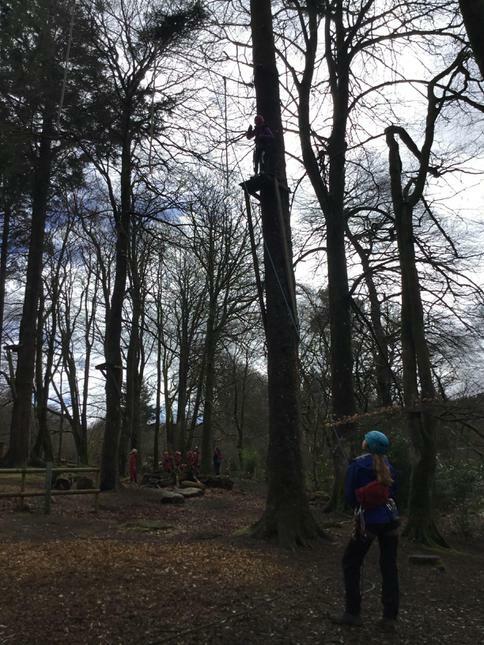 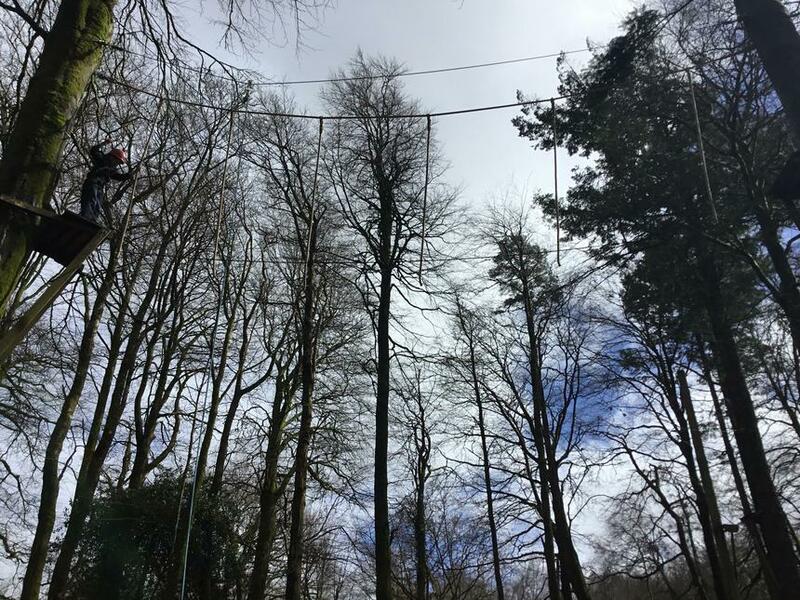 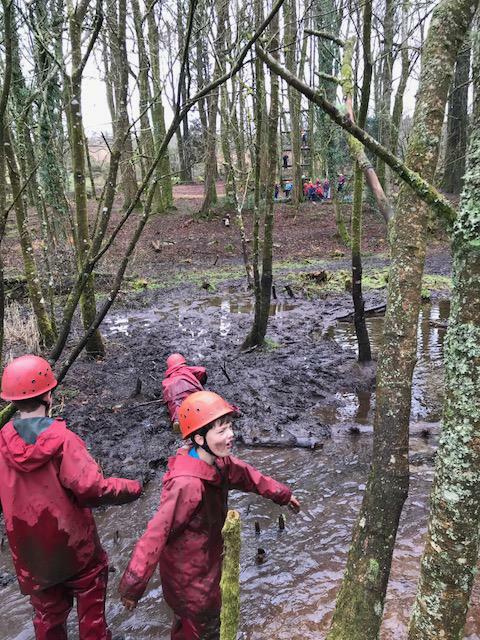 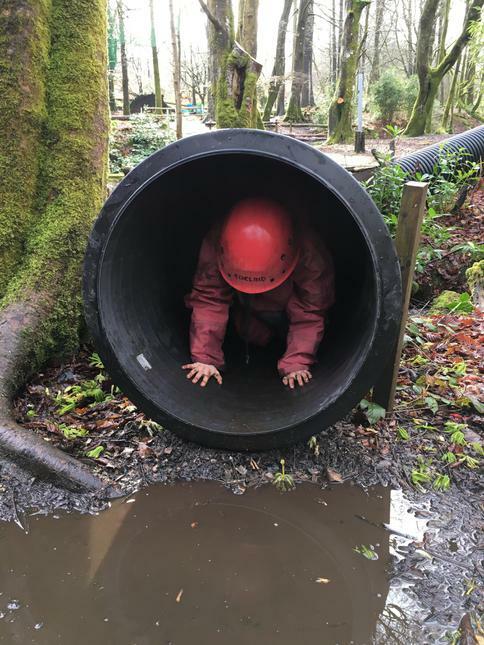 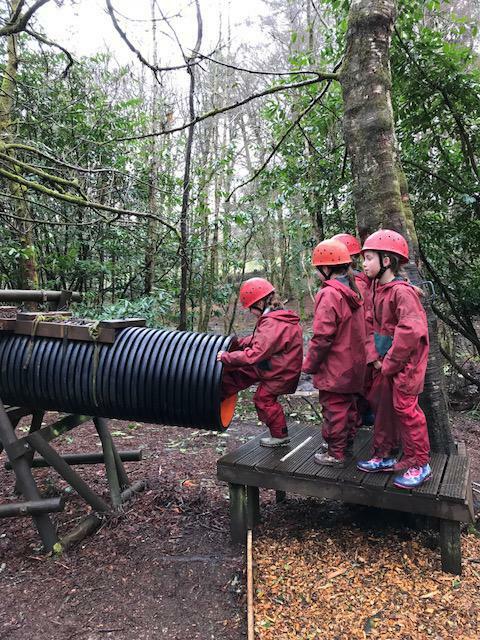 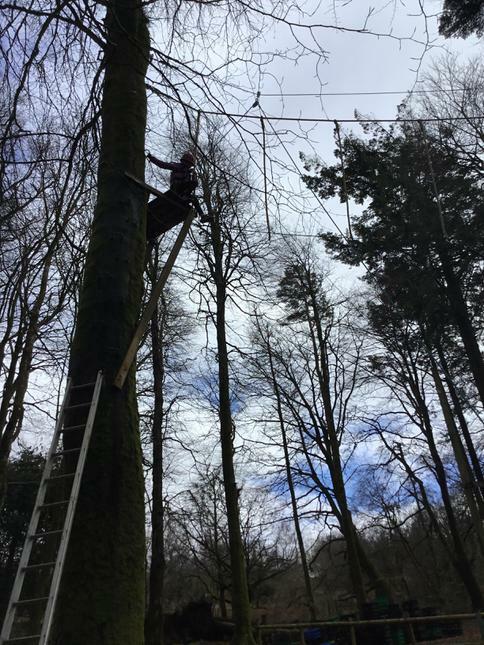 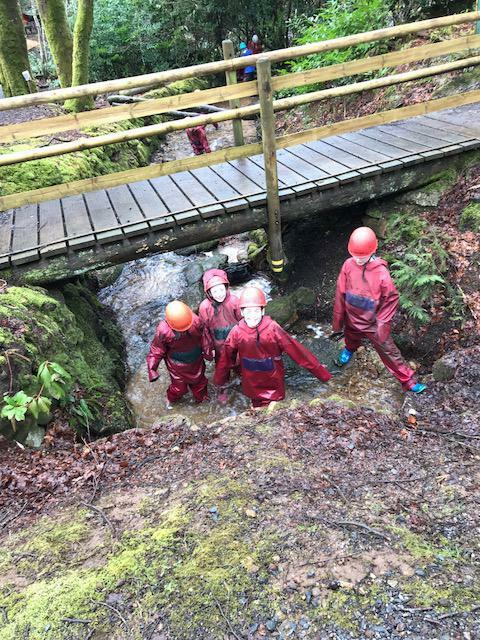 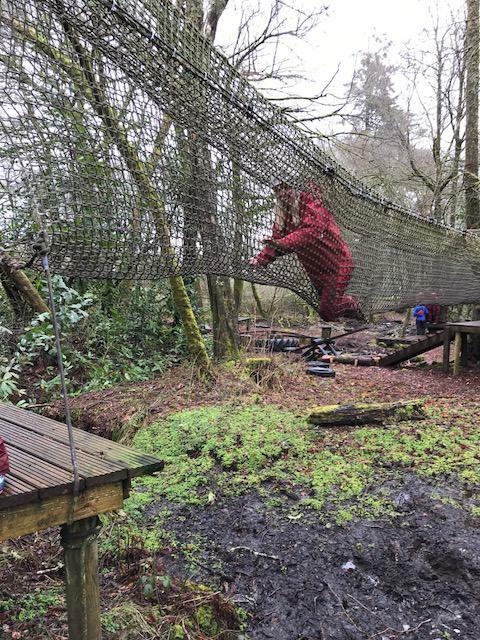 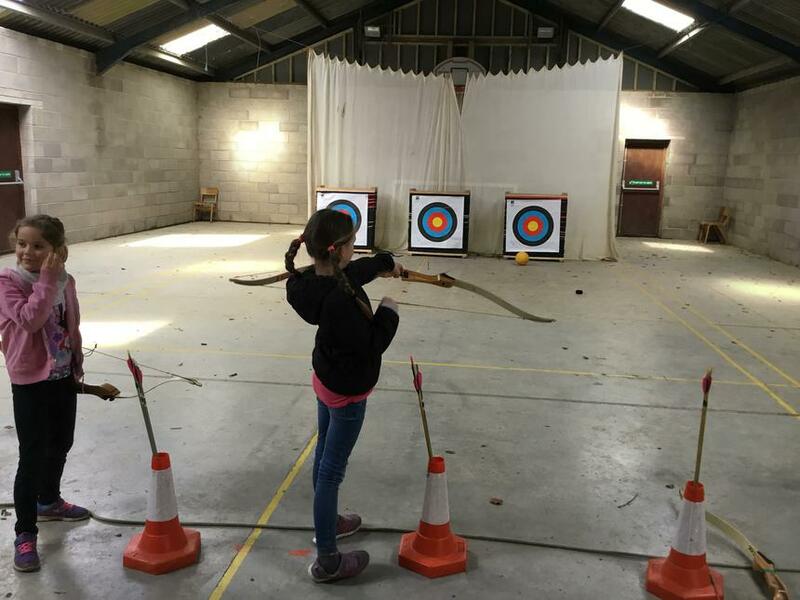 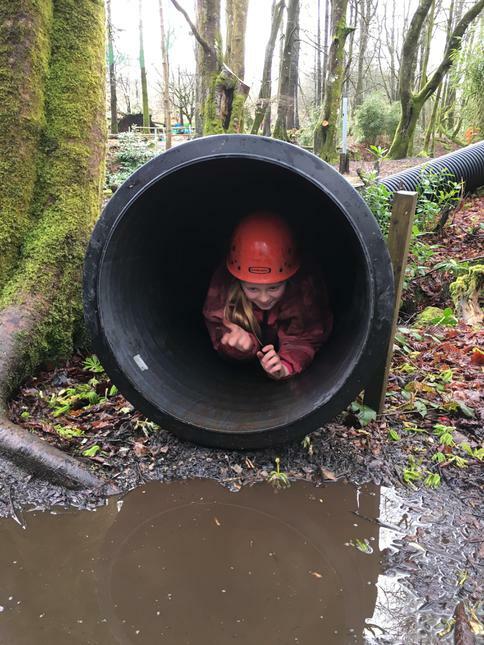 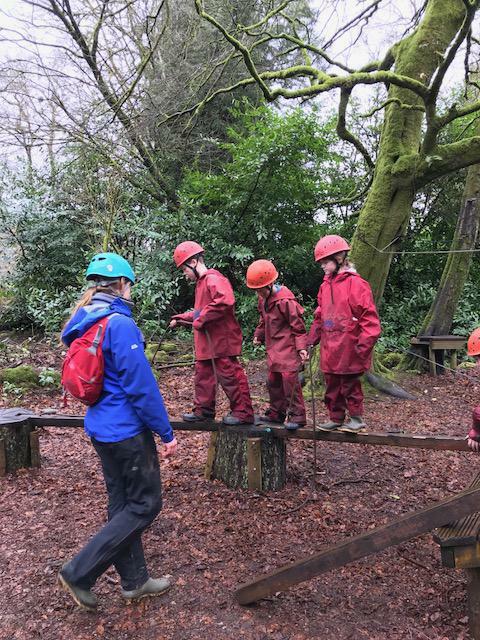 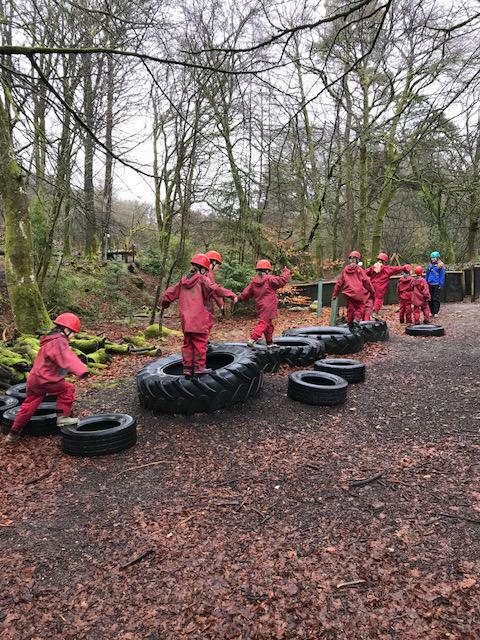 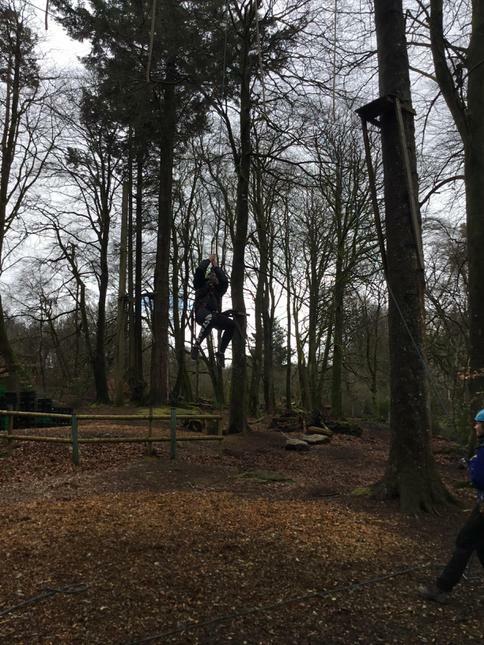 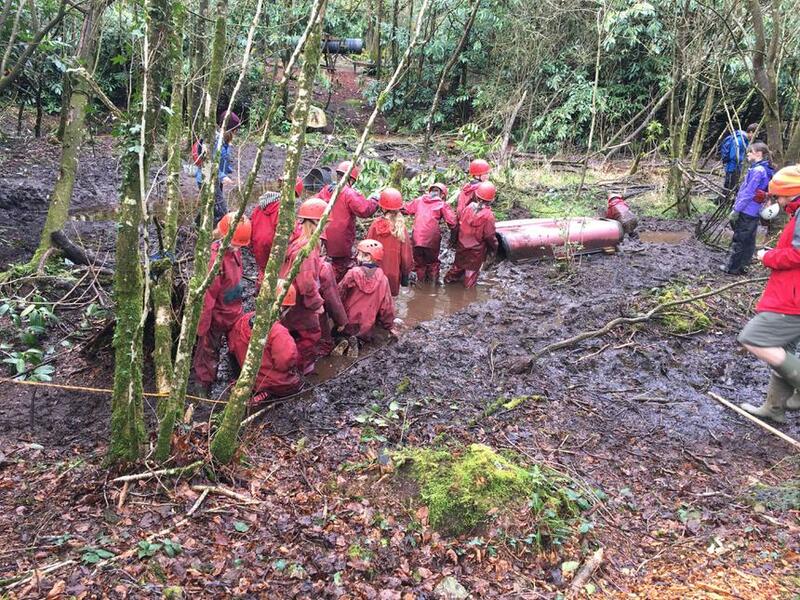 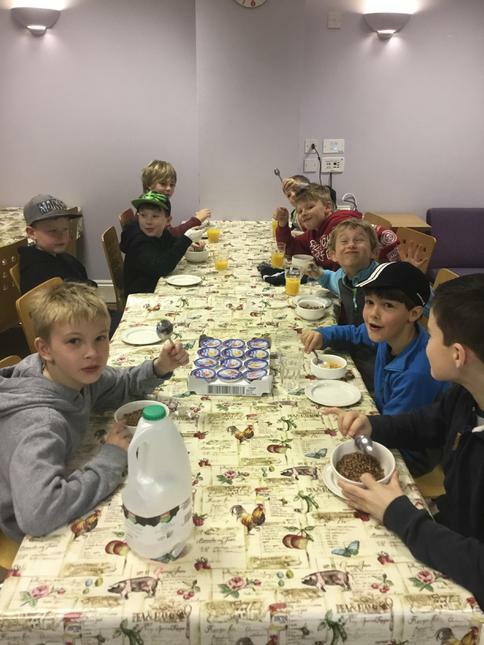 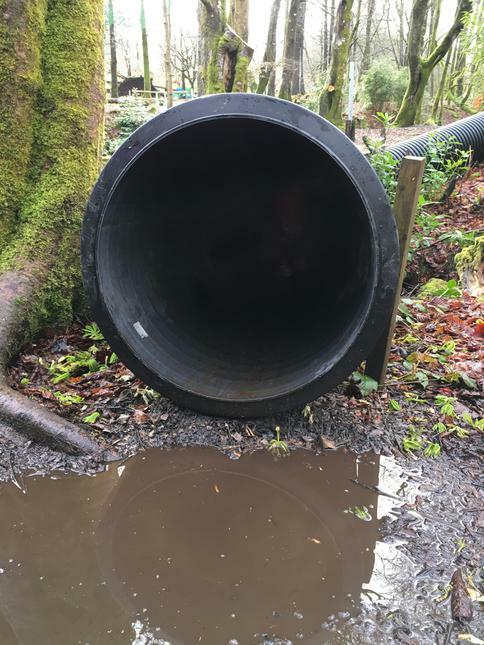 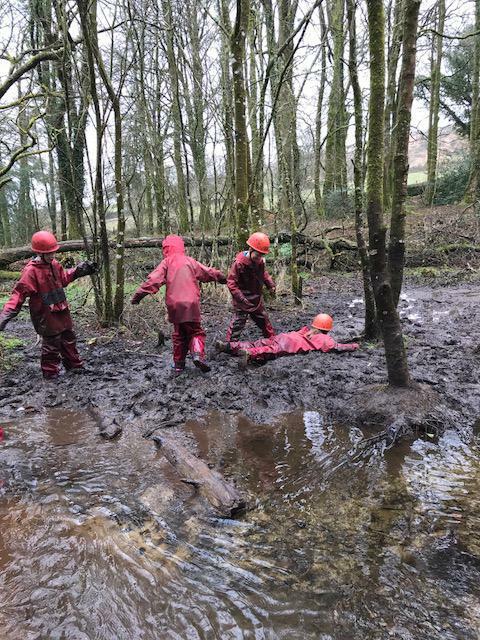 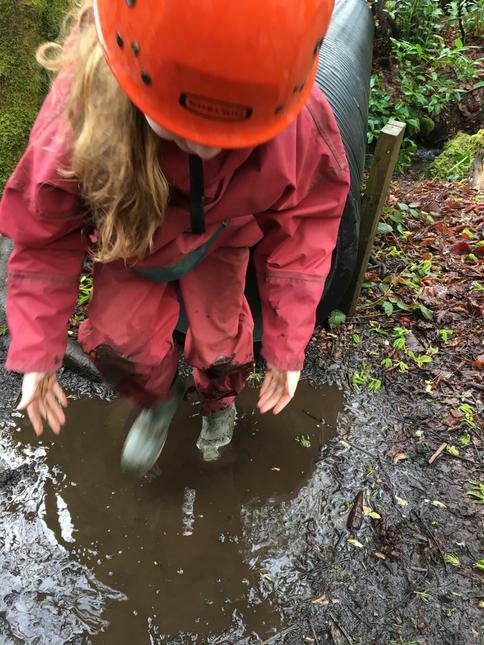 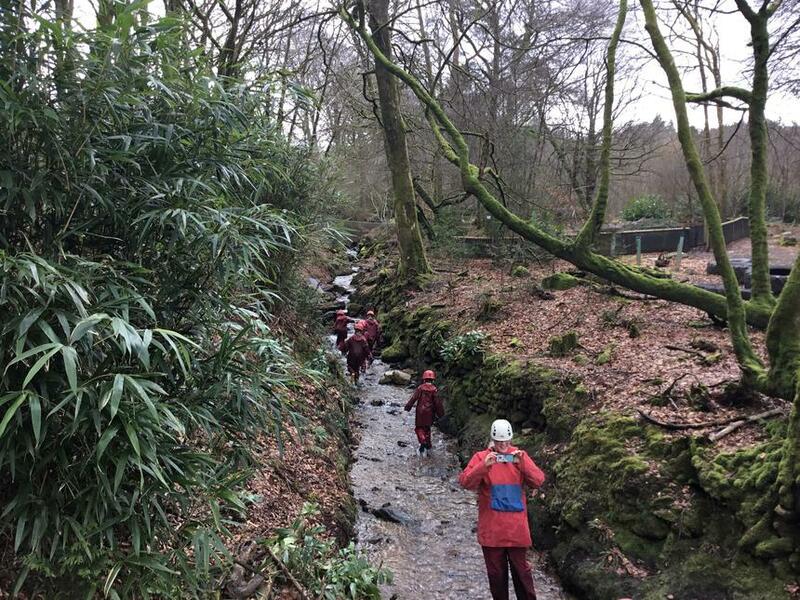 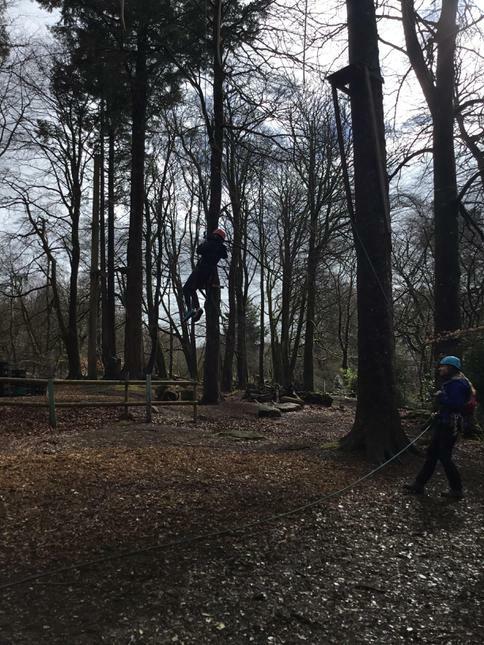 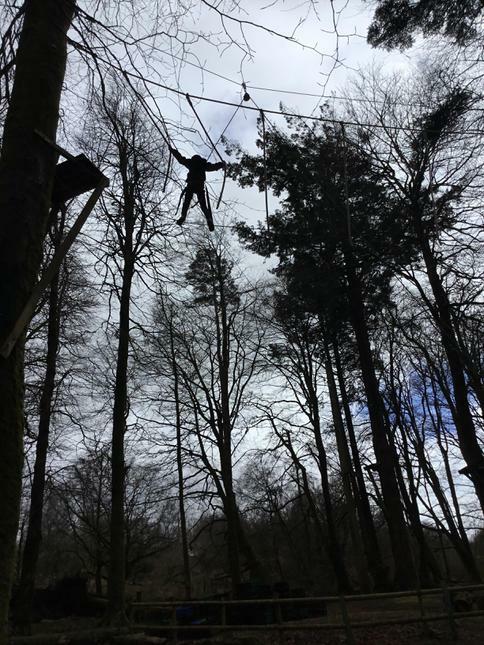 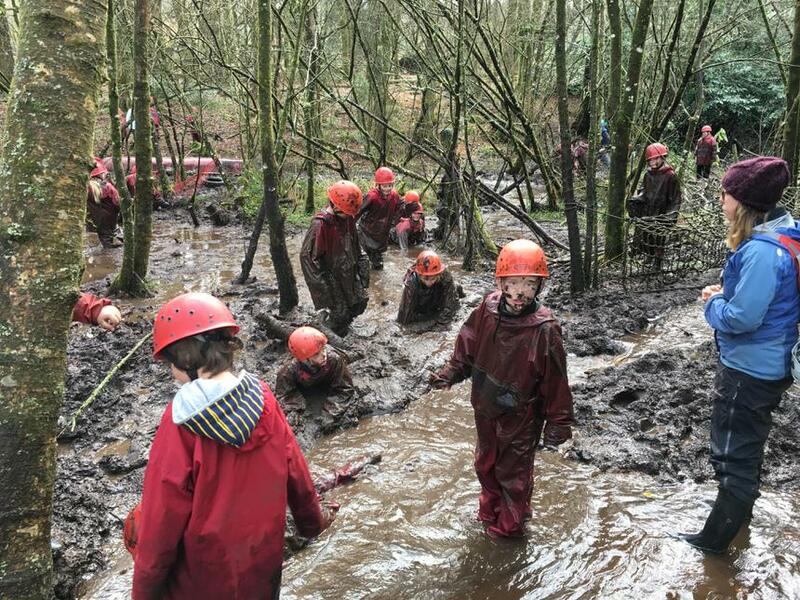 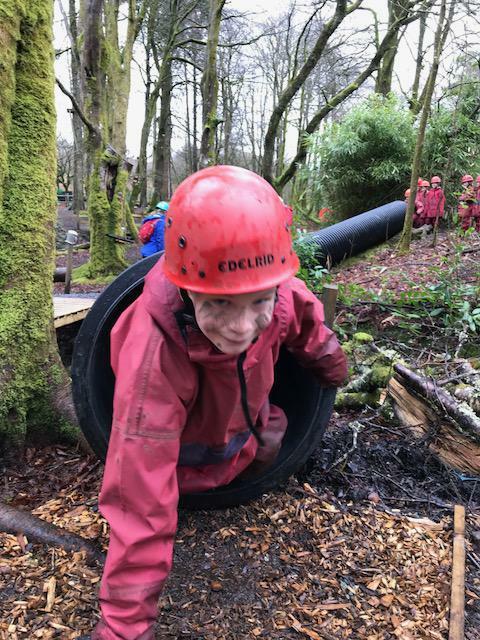 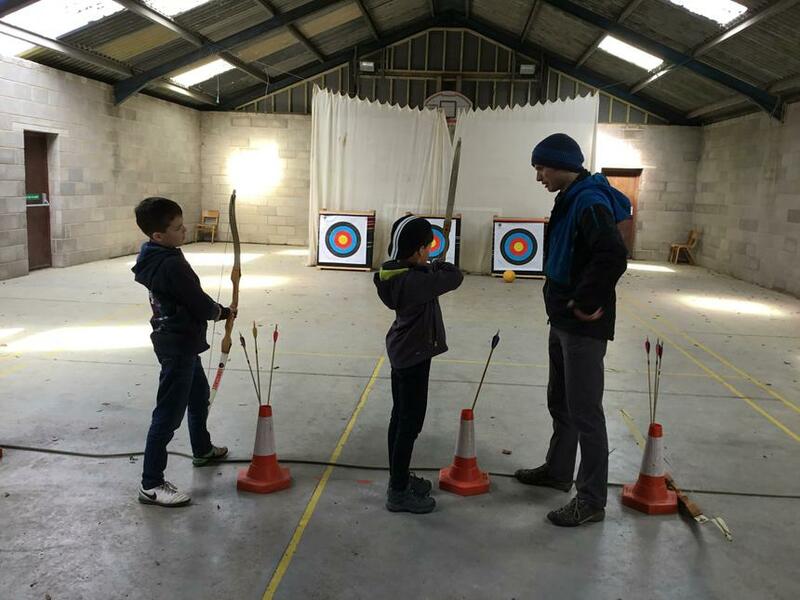 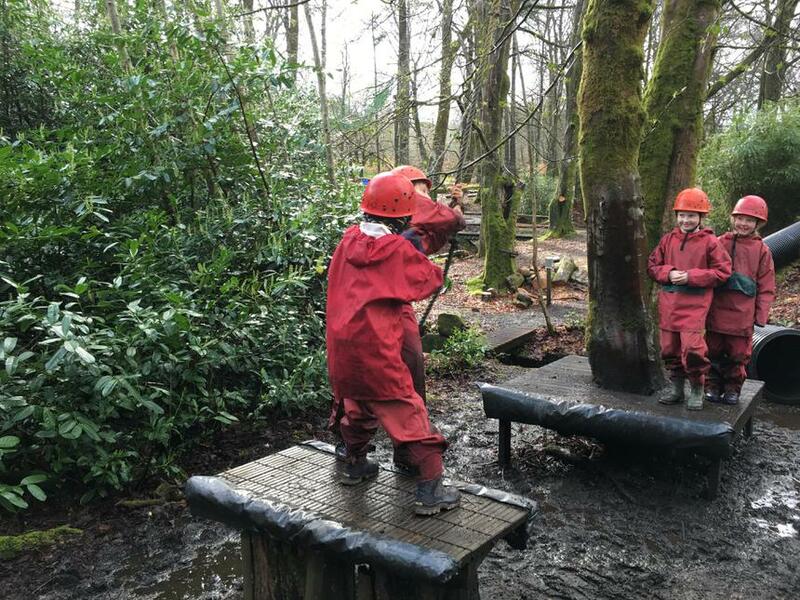 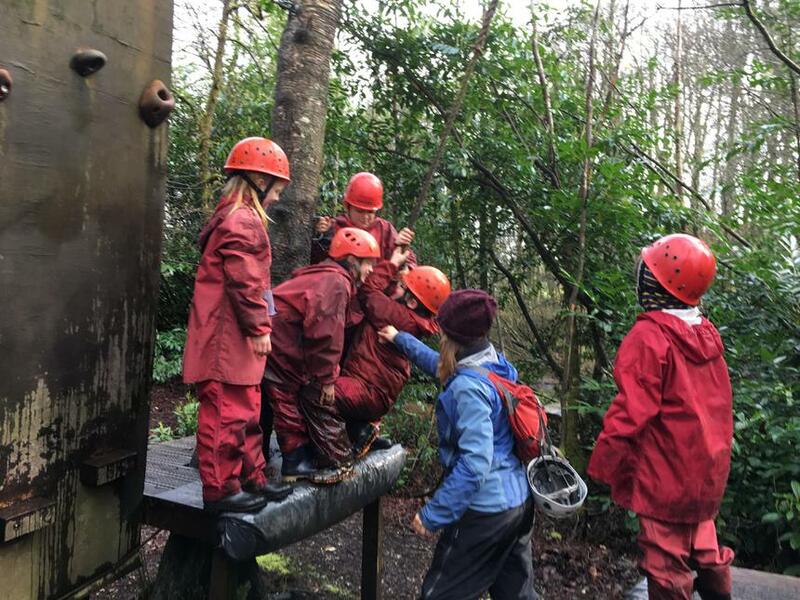 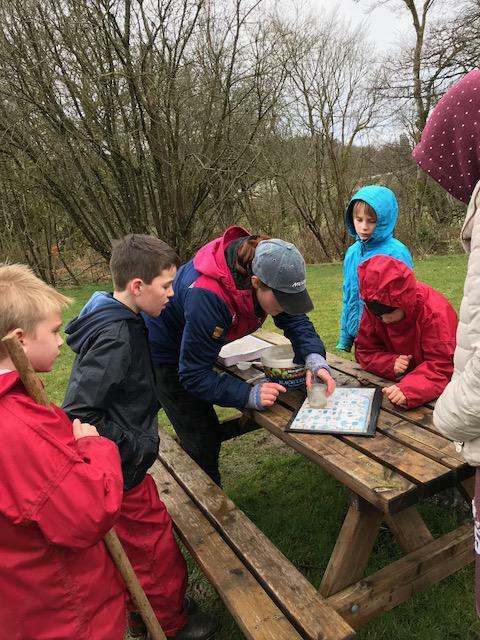 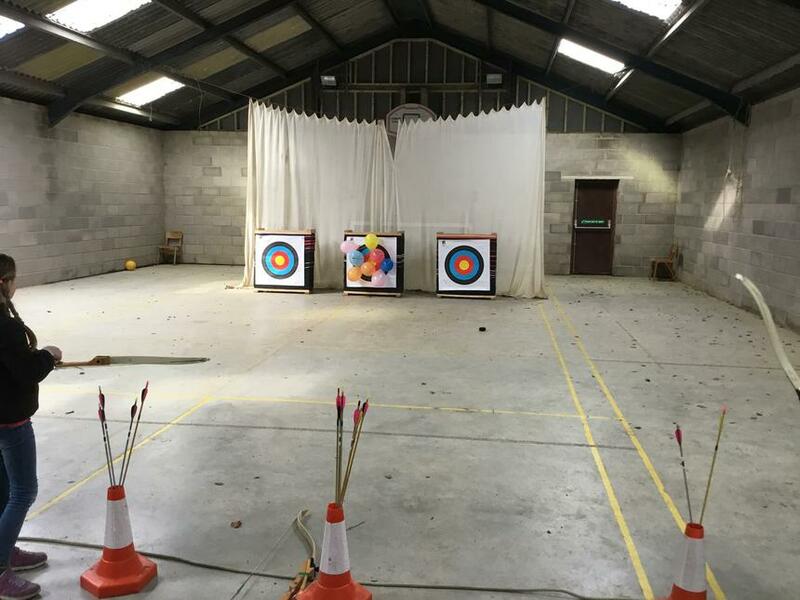 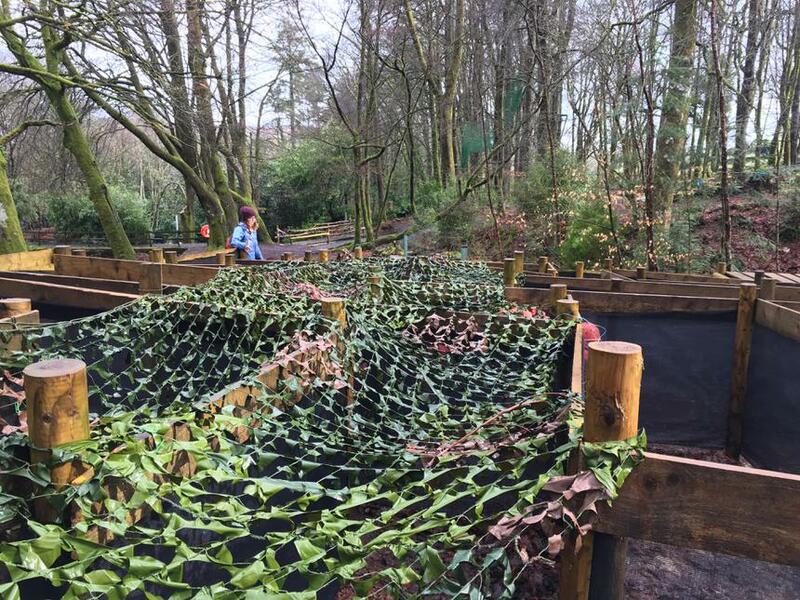 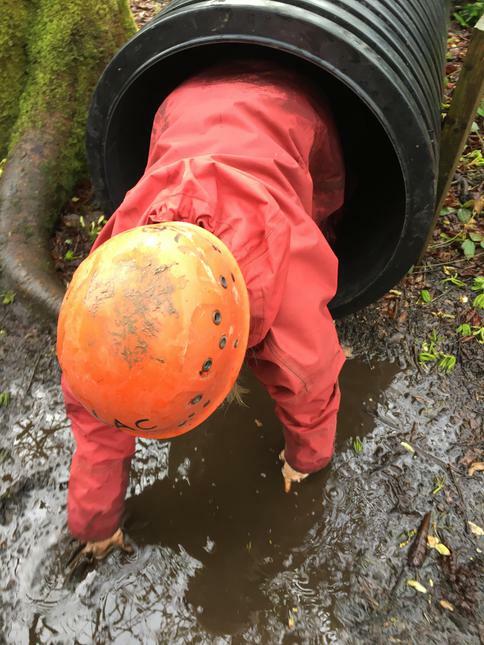 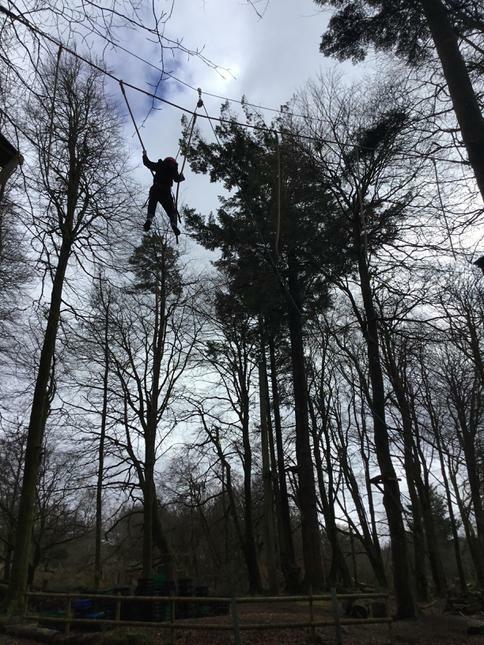 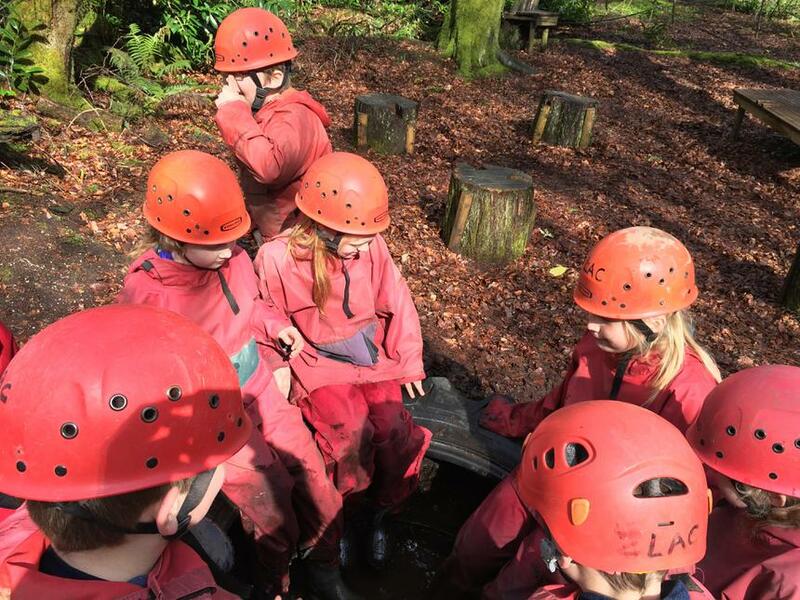 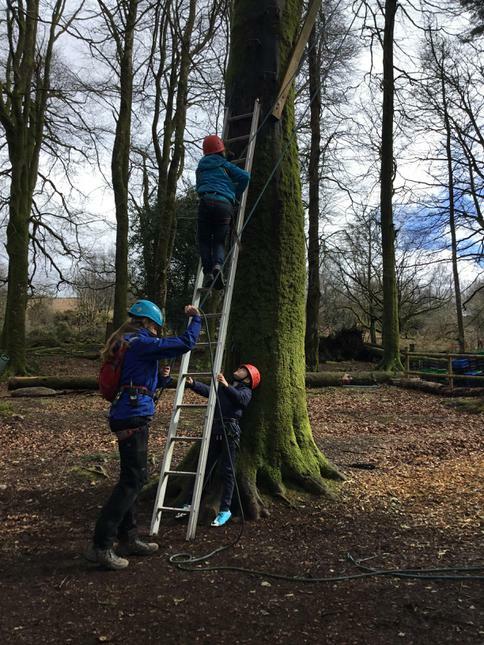 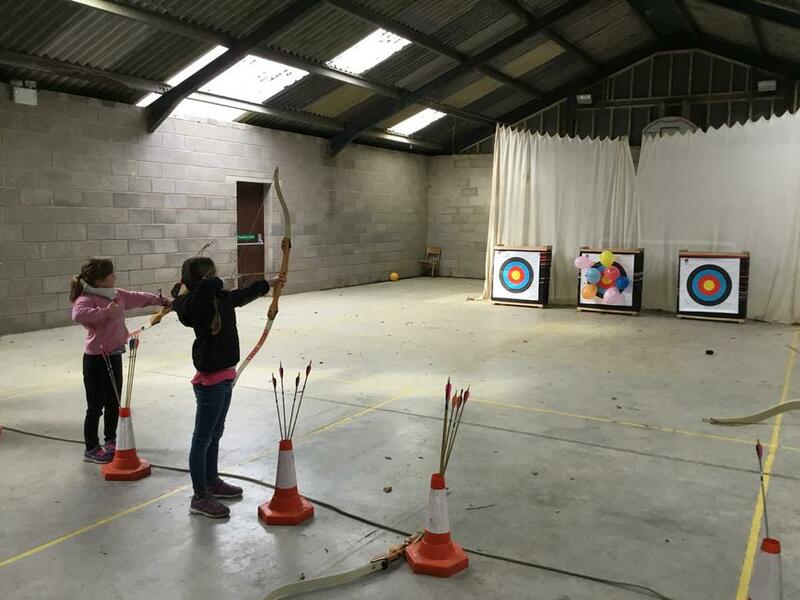 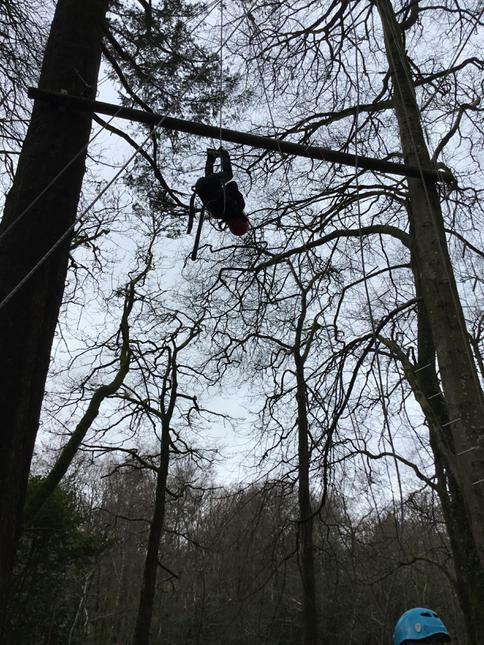 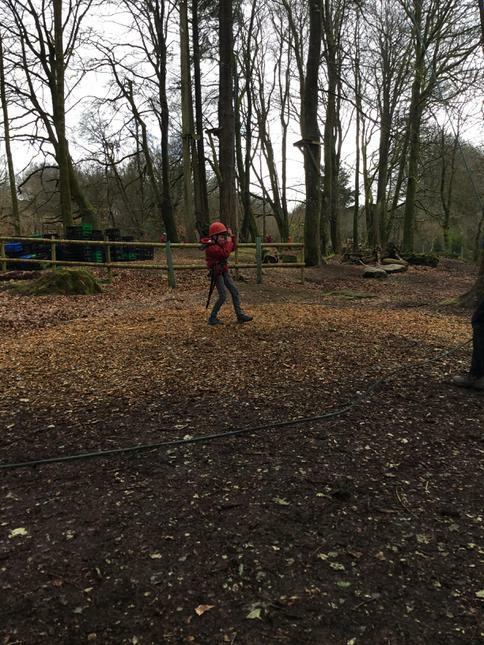 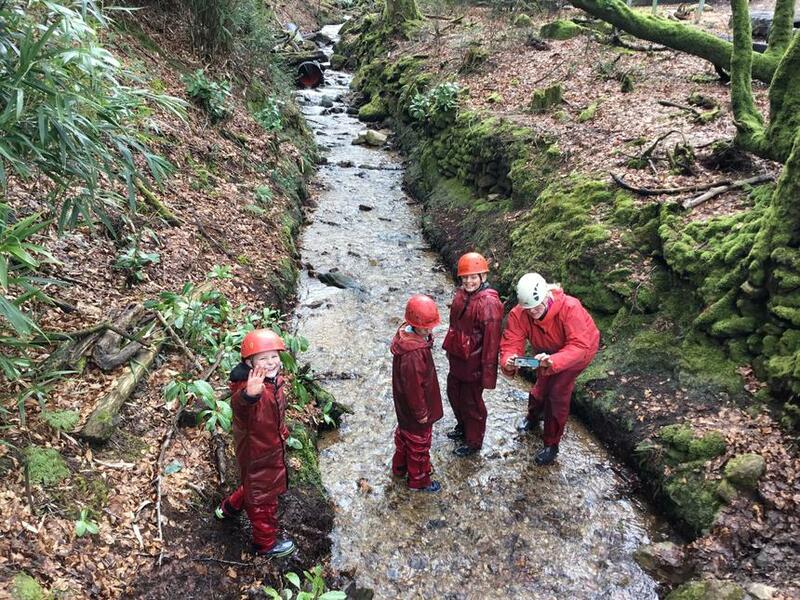 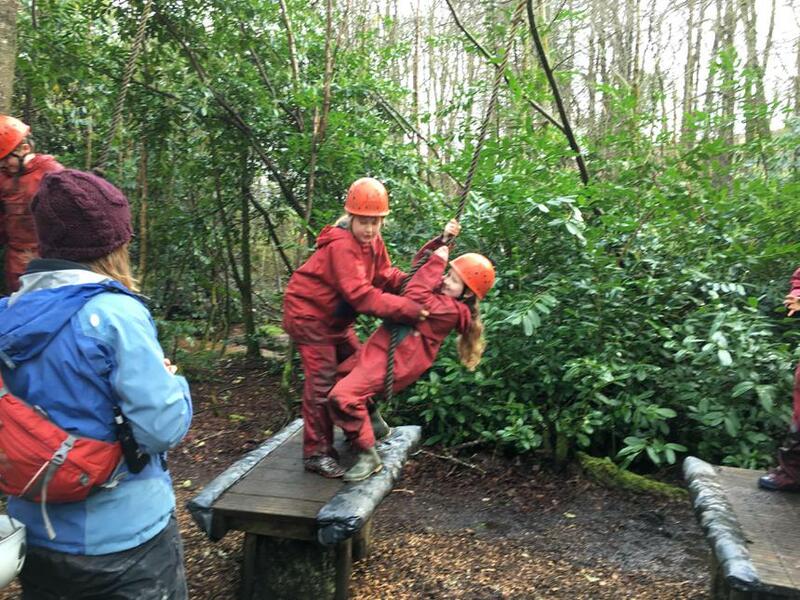 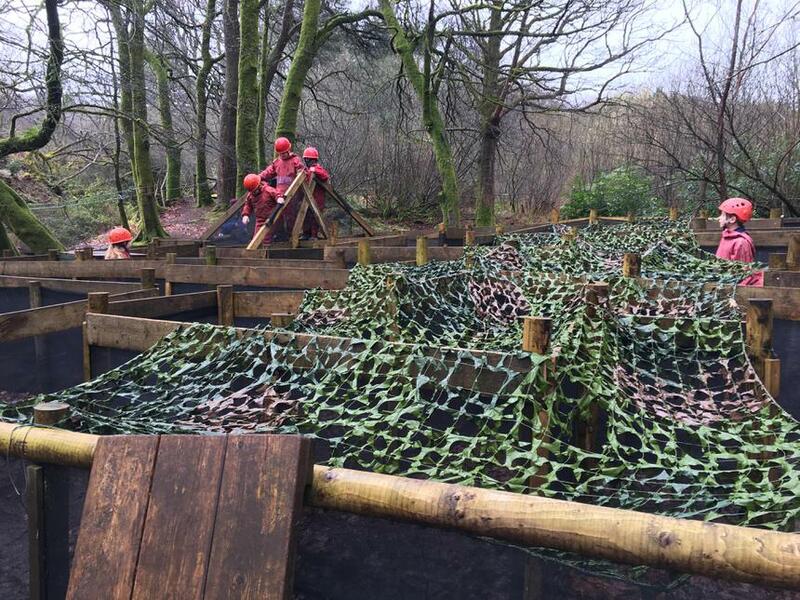 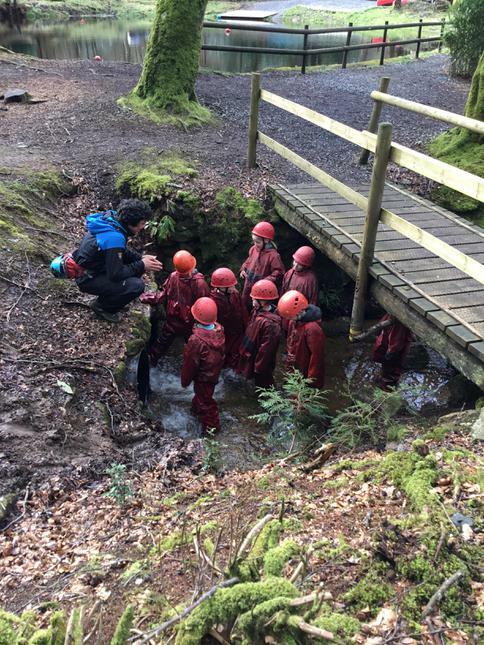 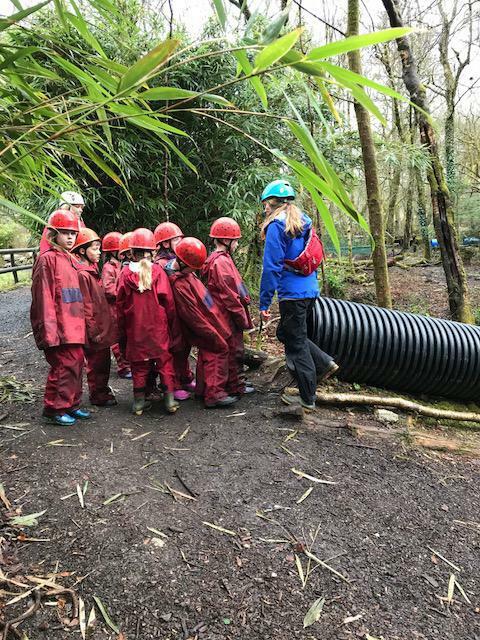 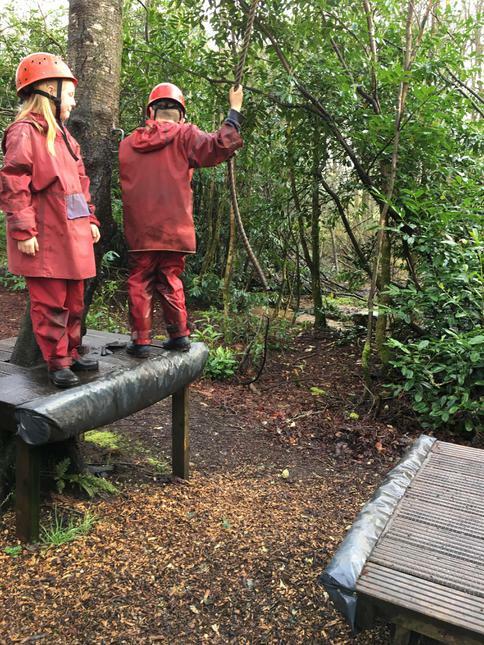 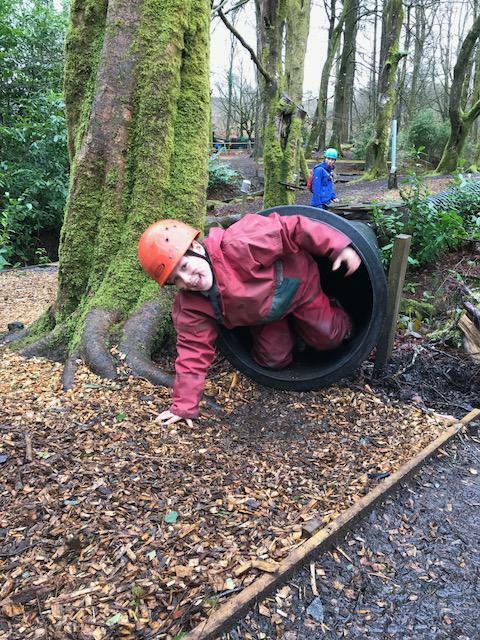 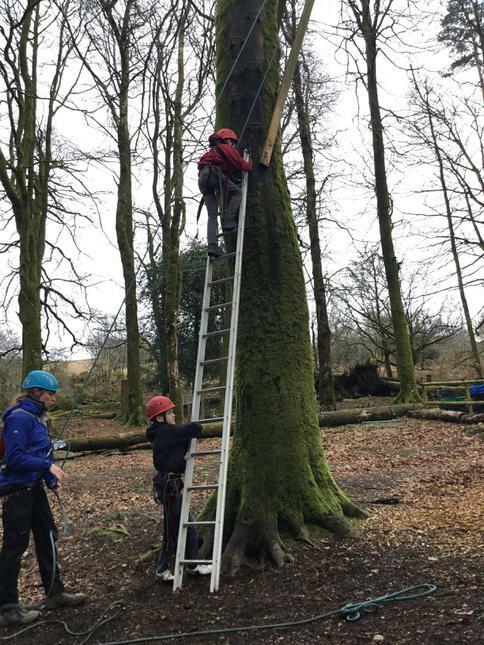 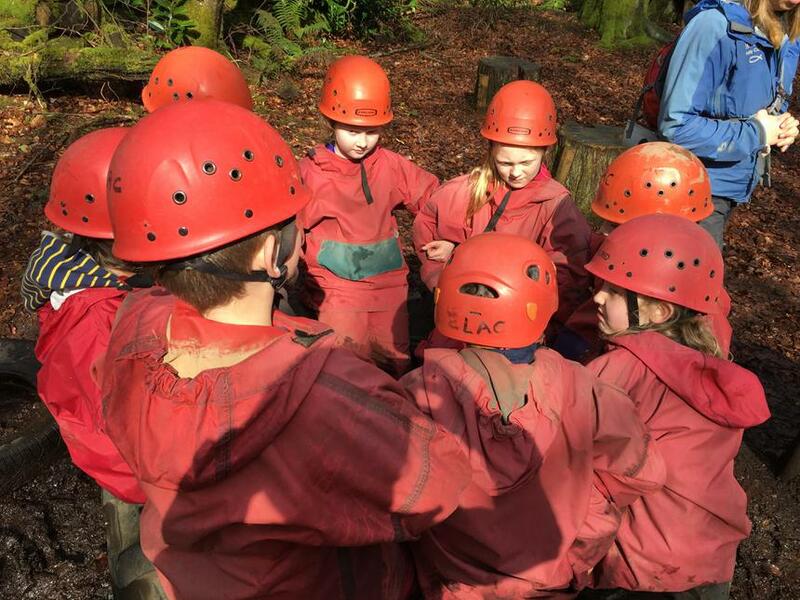 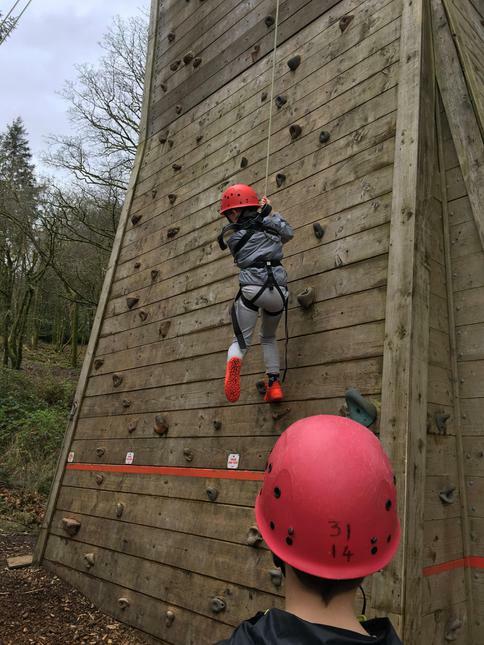 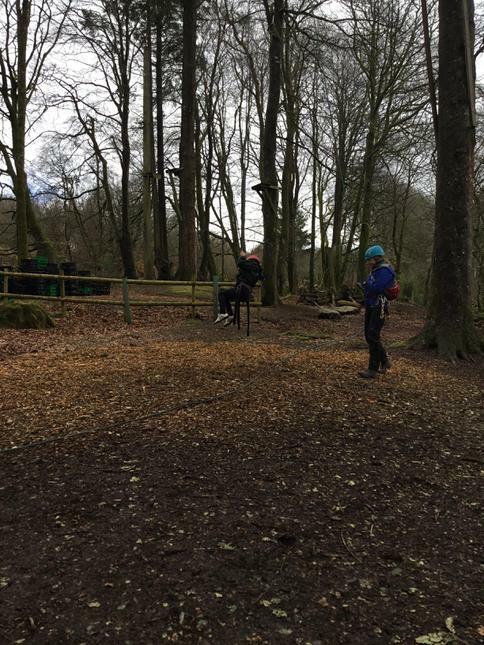 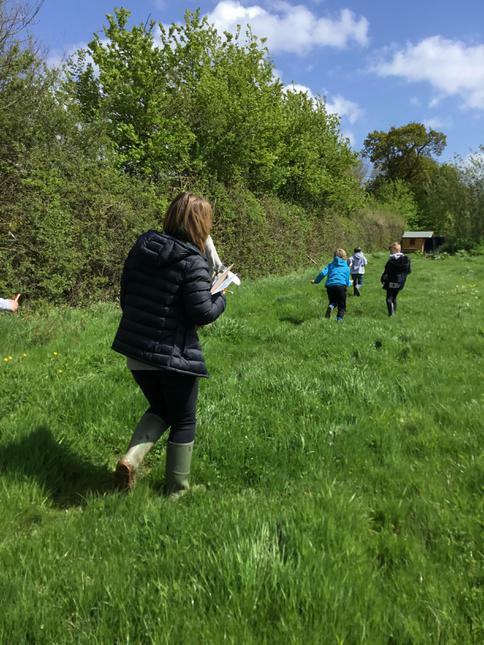 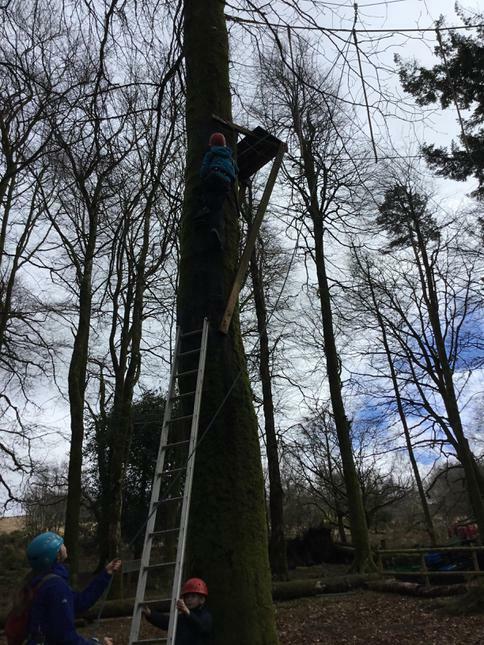 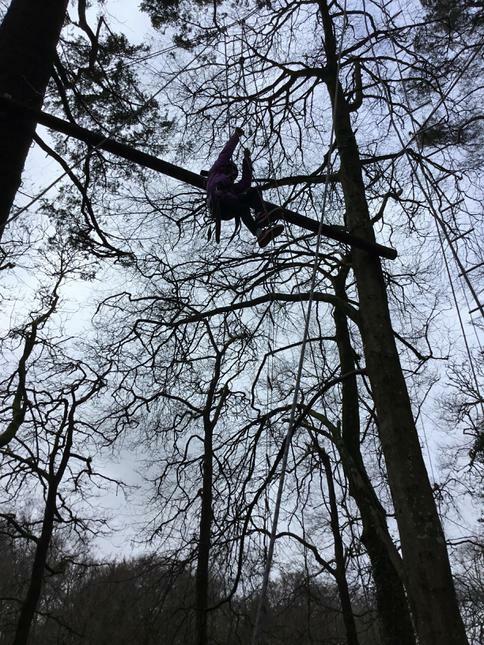 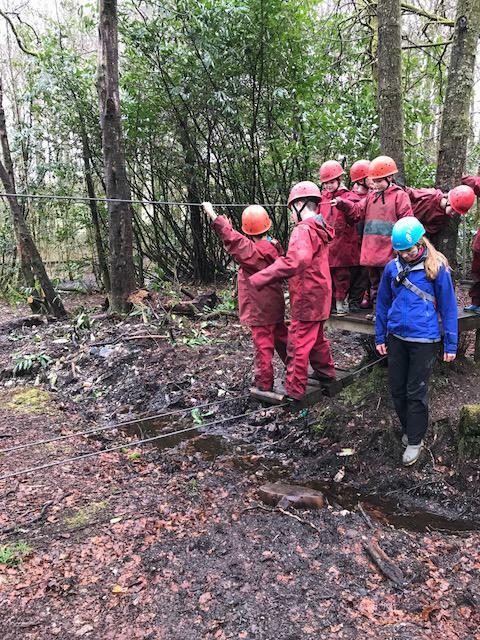 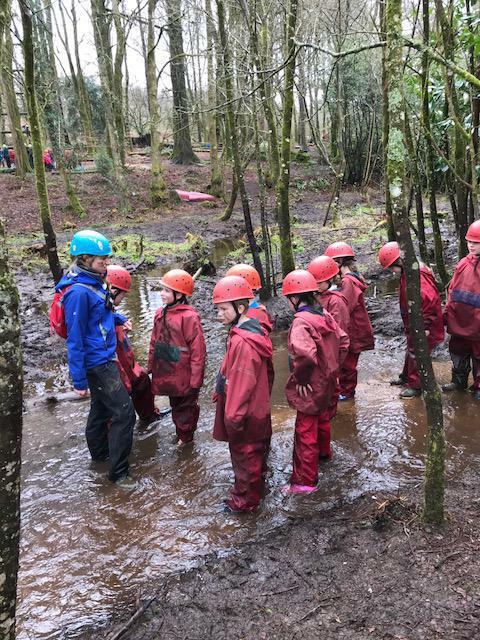 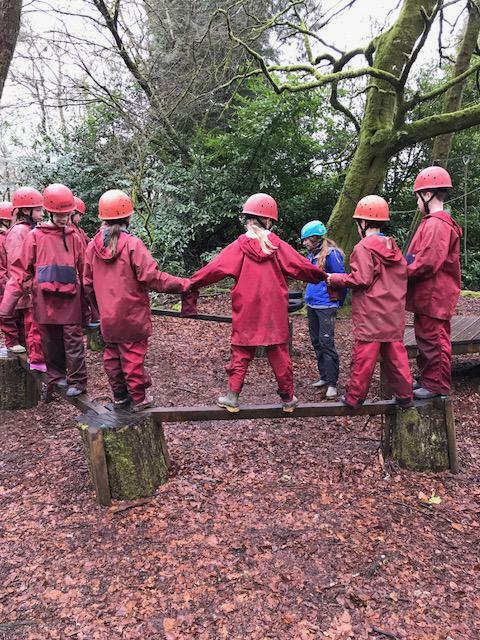 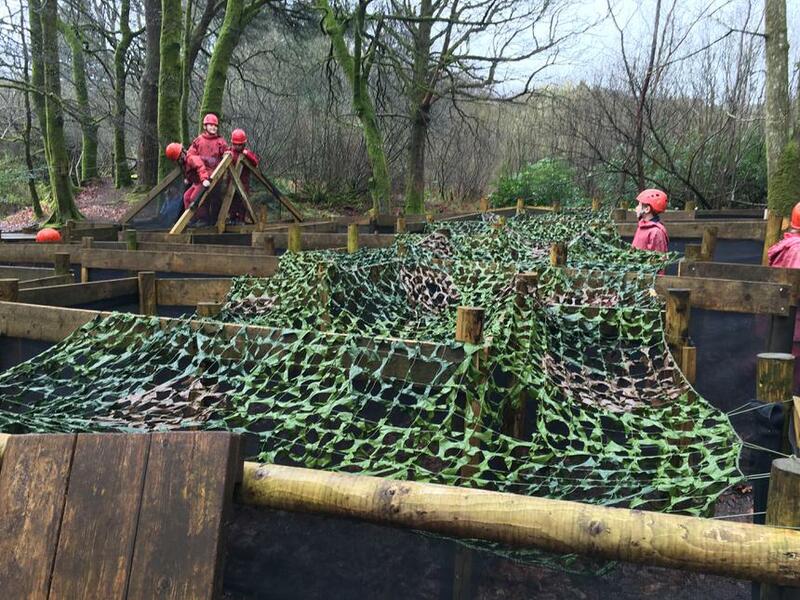 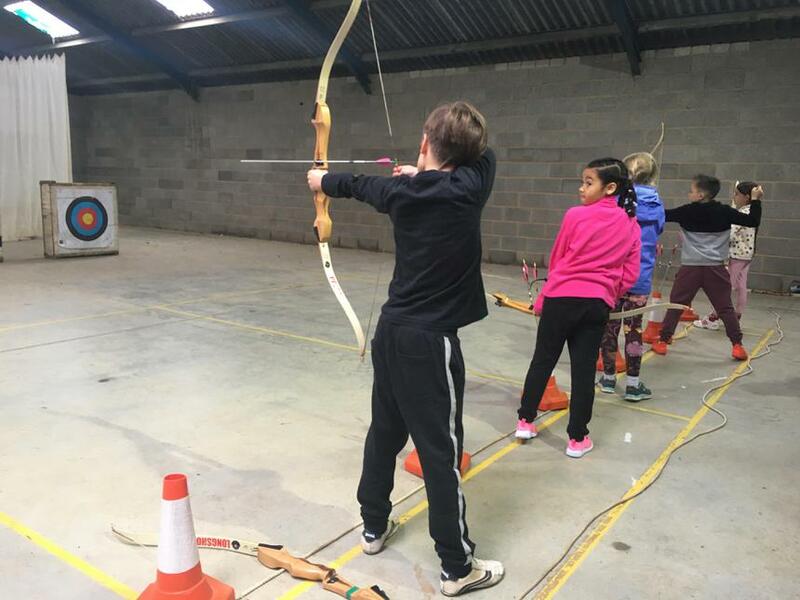 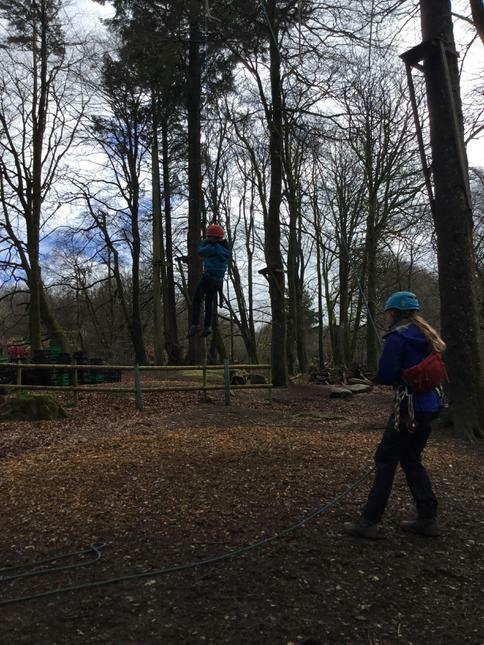 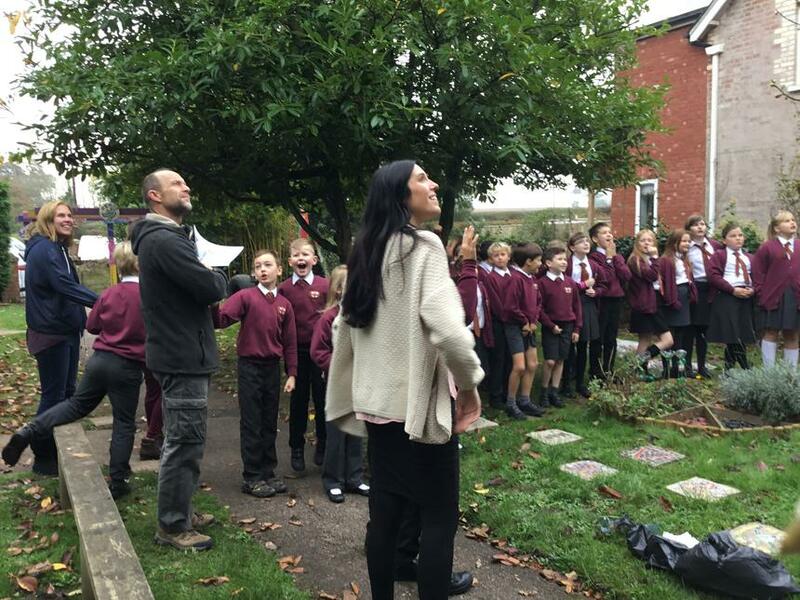 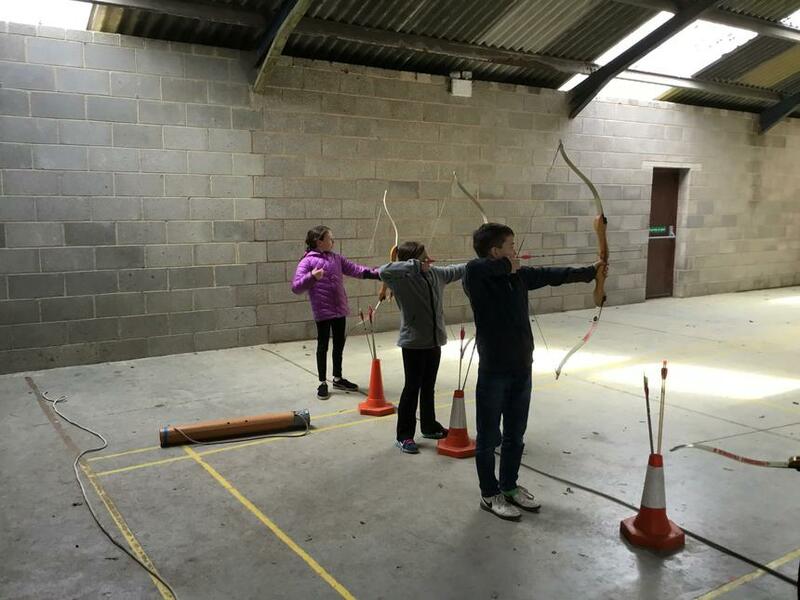 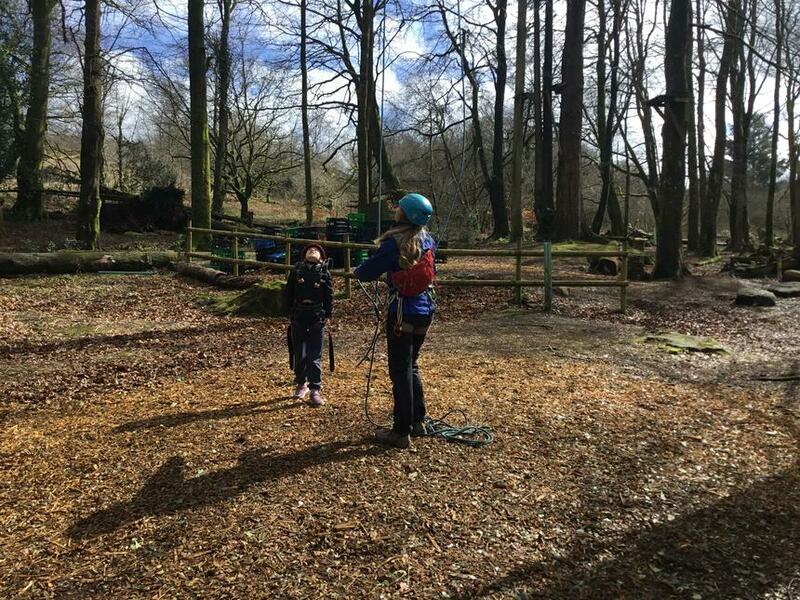 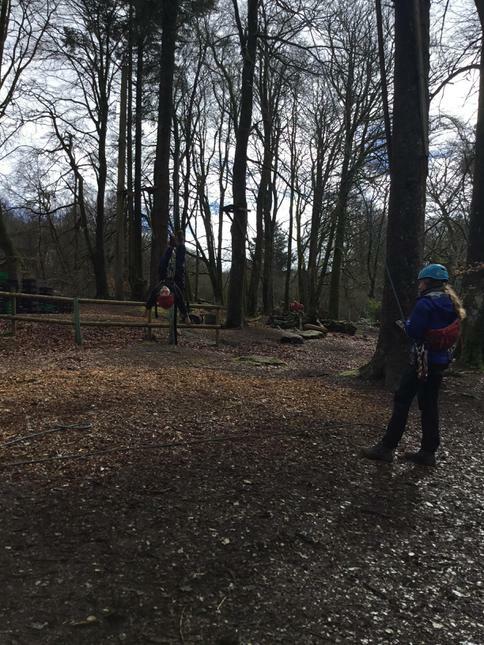 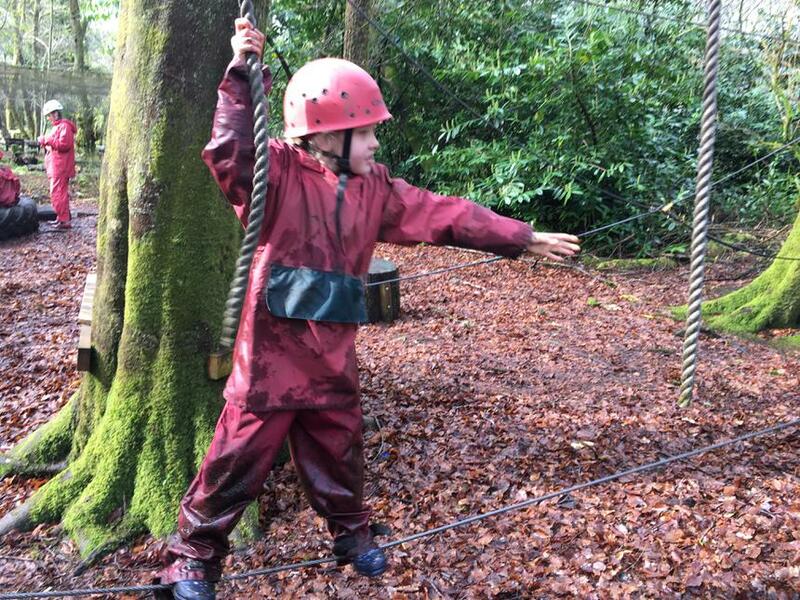 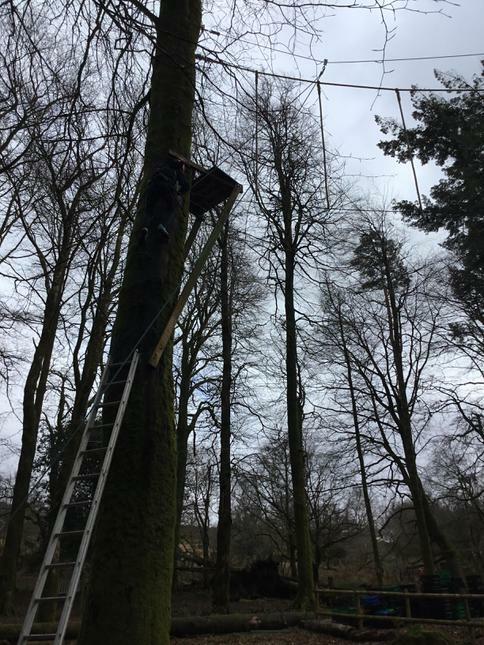 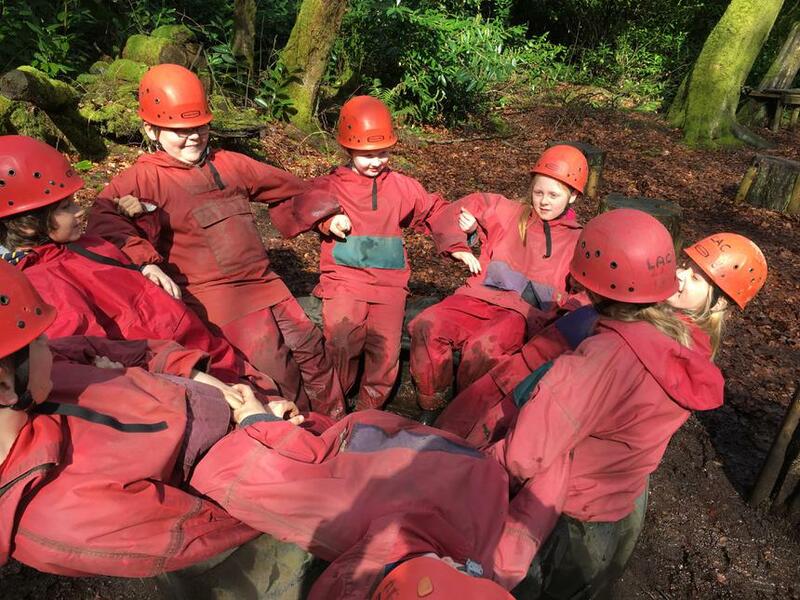 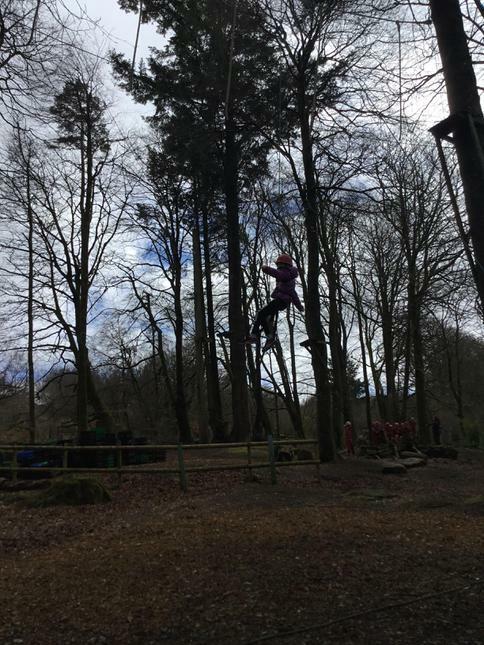 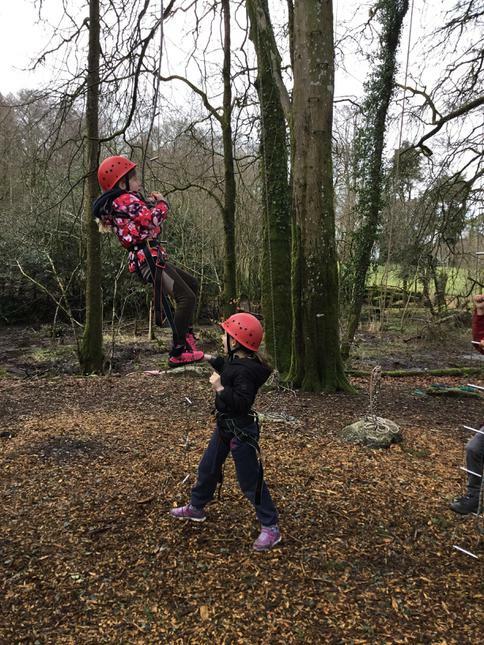 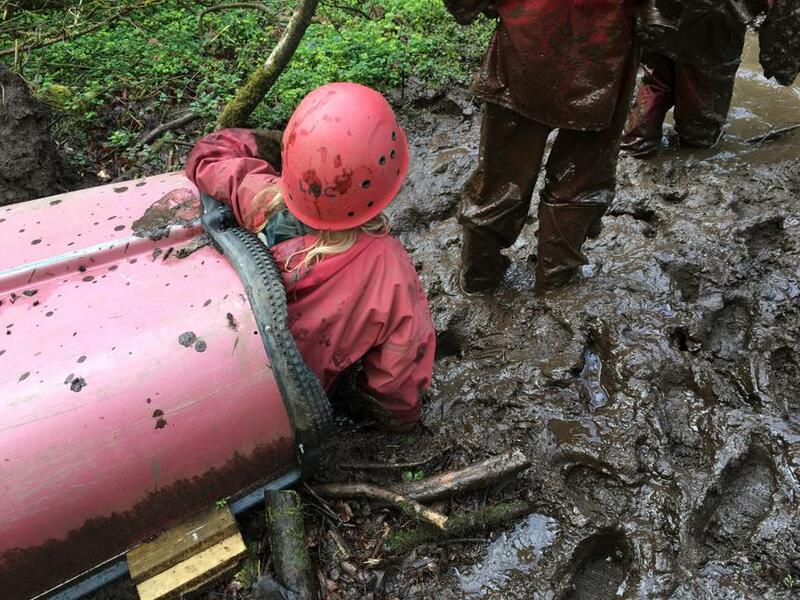 The year 4 pupils took a trip to Heatree Residential where they got to take part in a number of activities based around outdoor learning including: archery, low adventure, high ropes and stream bug hunting. 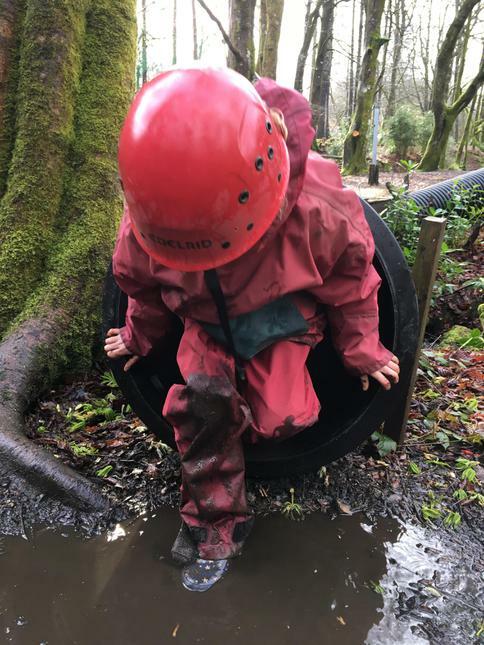 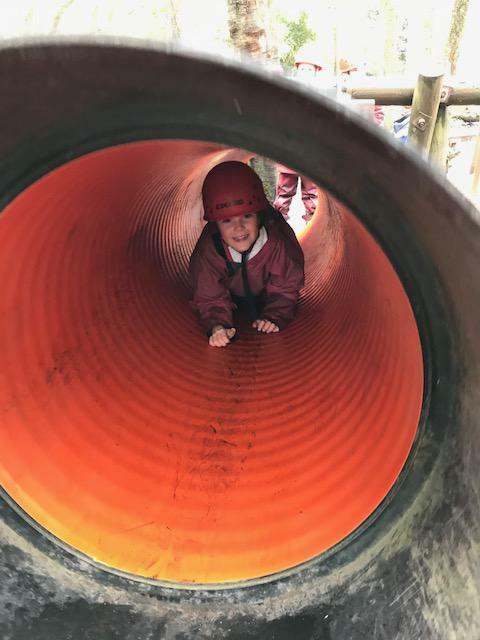 The children had a fantastic time where they put 100% effort into everything and showed determination to accomplish every activity! 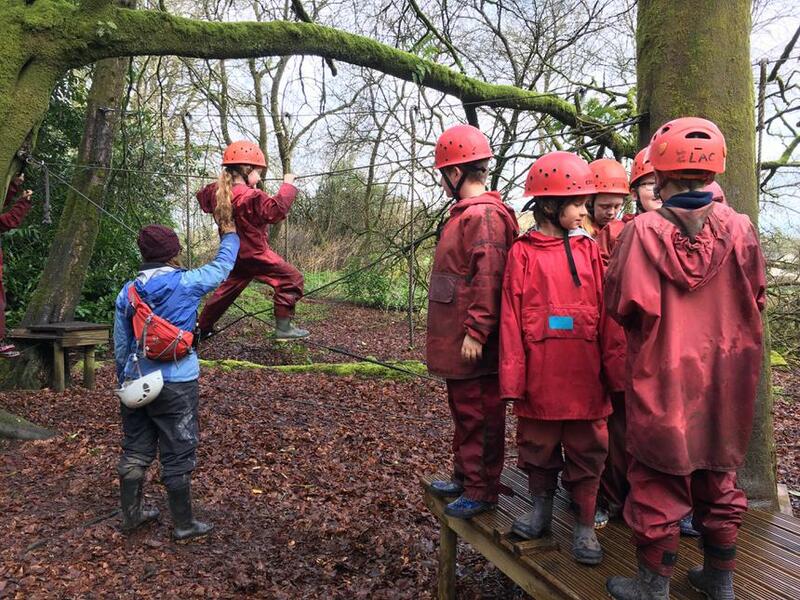 They have been awarded the Heatree Outdoor Adventure award. 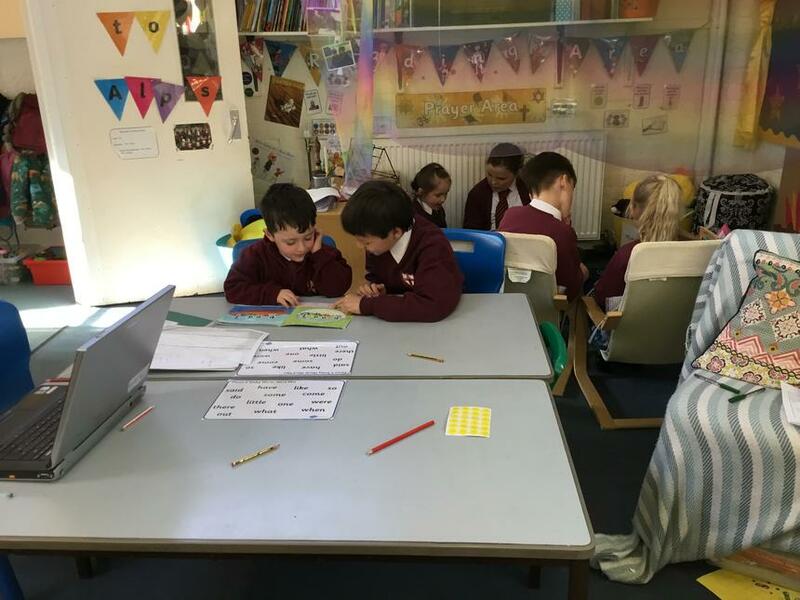 The children looked fantastic on World Book Day this year, choosing characters from their favourite books. 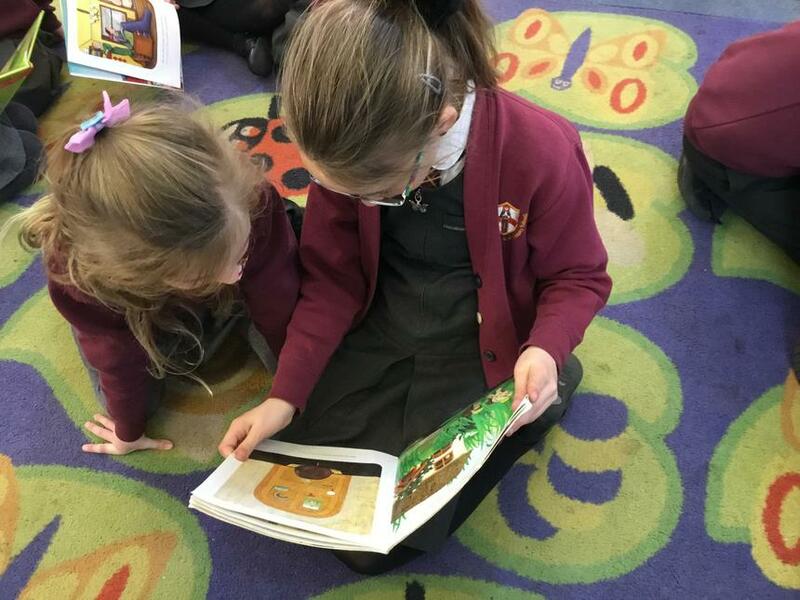 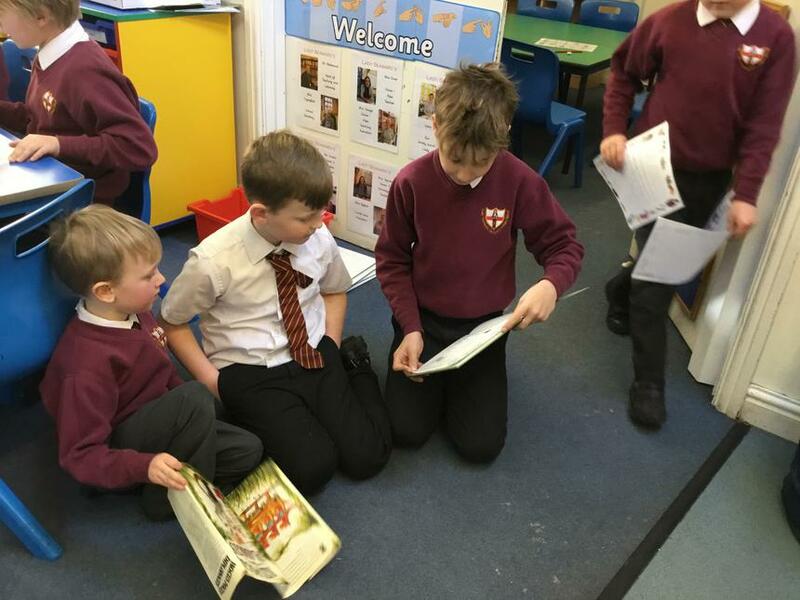 Class 3 and Class 1 got together and shared an afternoon of reading. 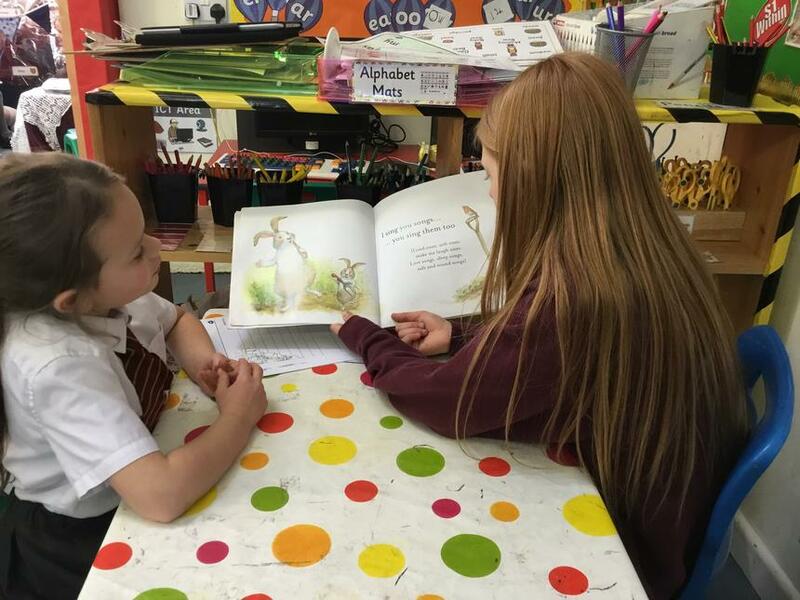 Some of the older children read to the younger children. 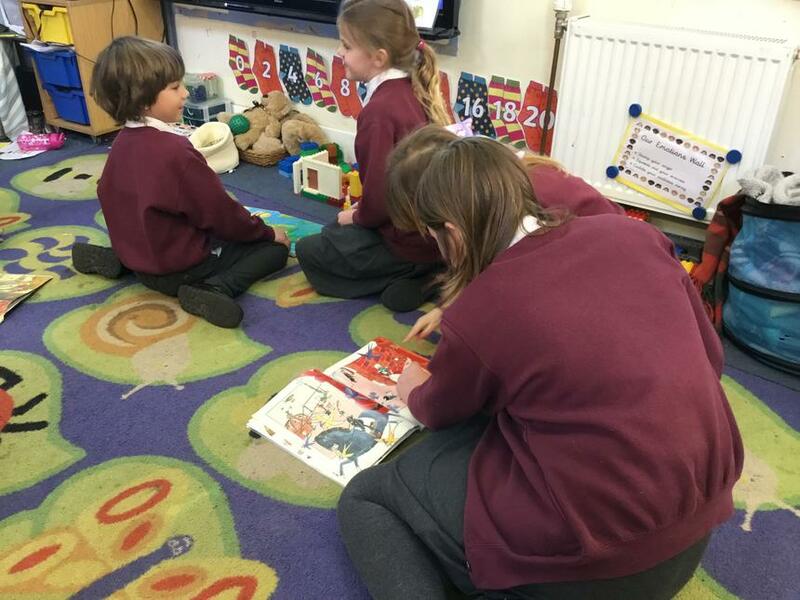 The younger children picked their favourite books in their classroom to hear read to them. 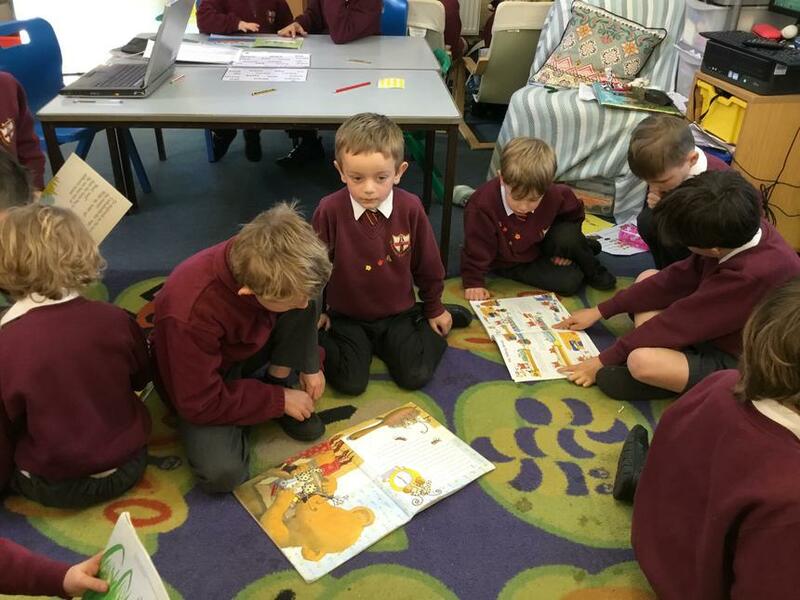 We also heard that Class 1 are excellent readers and some of the children read to the older children. 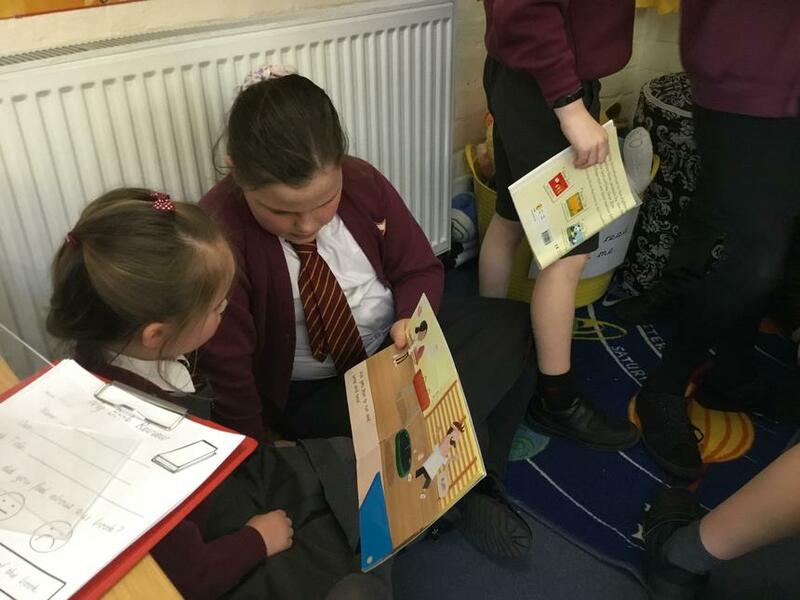 We couldn't believe how good their reading was! 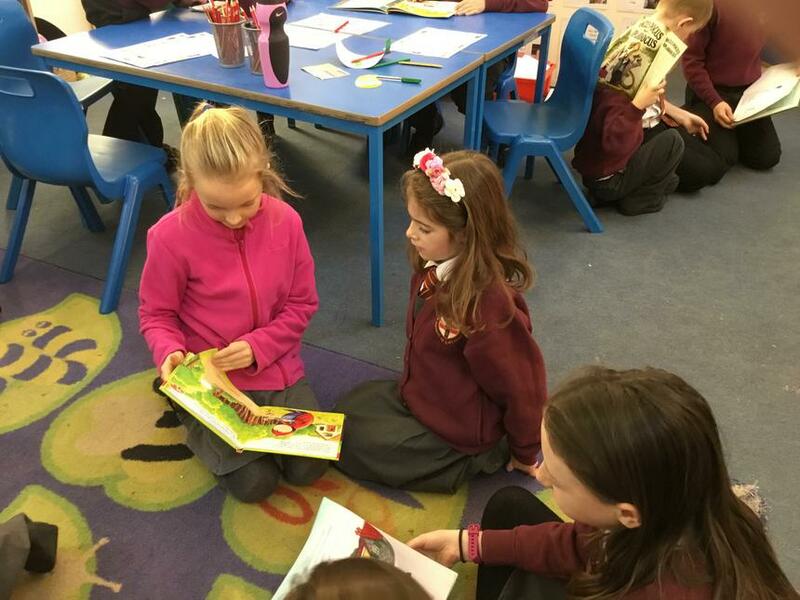 It was lovely to see the children showing kindness to one another and sharing their love of reading. 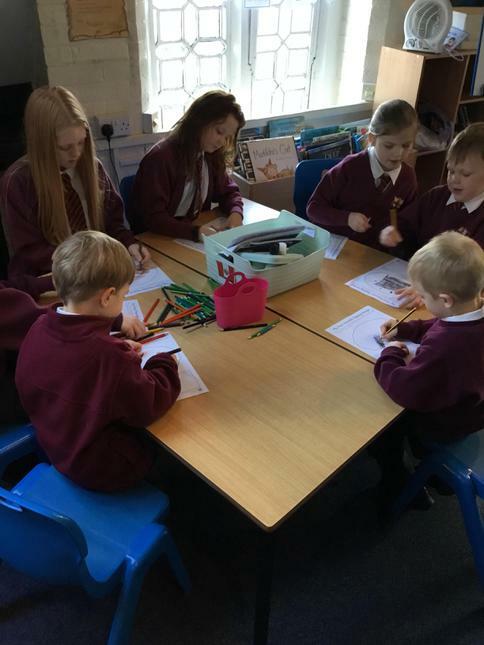 It was decided that children no longer needed chairs to sit on when working in the classroom. 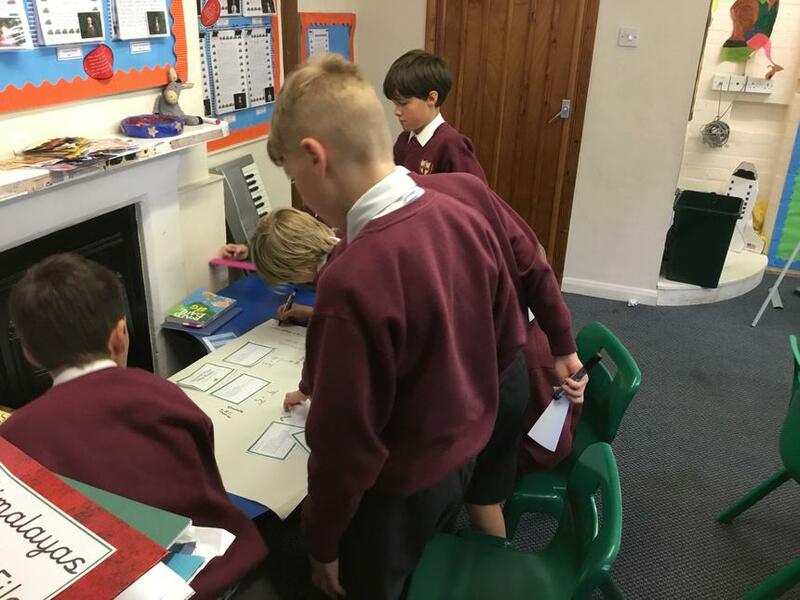 Children were expected to stand when they were learning, including when they were writing. 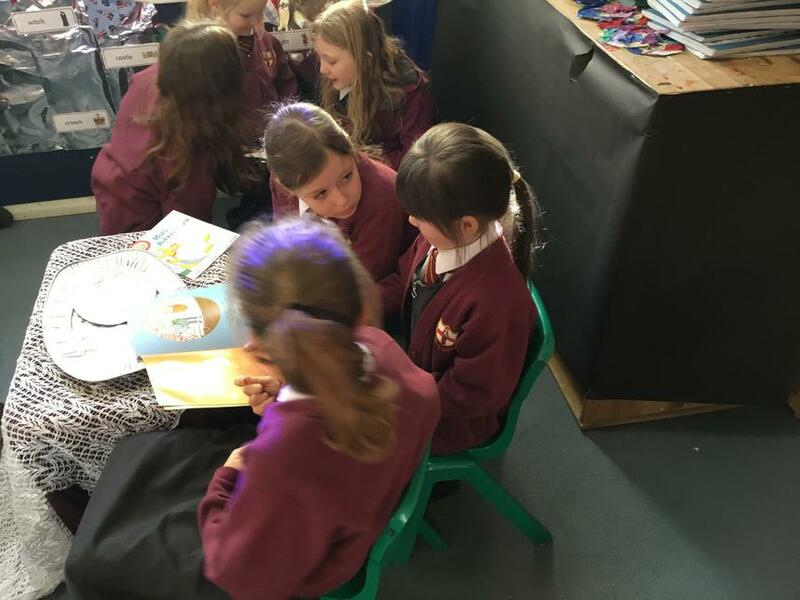 The children weren't very happy about this and were asked to use their persuasive skills to write a letter to Mr Westwood, persuading him to change his mind and give back the chairs! 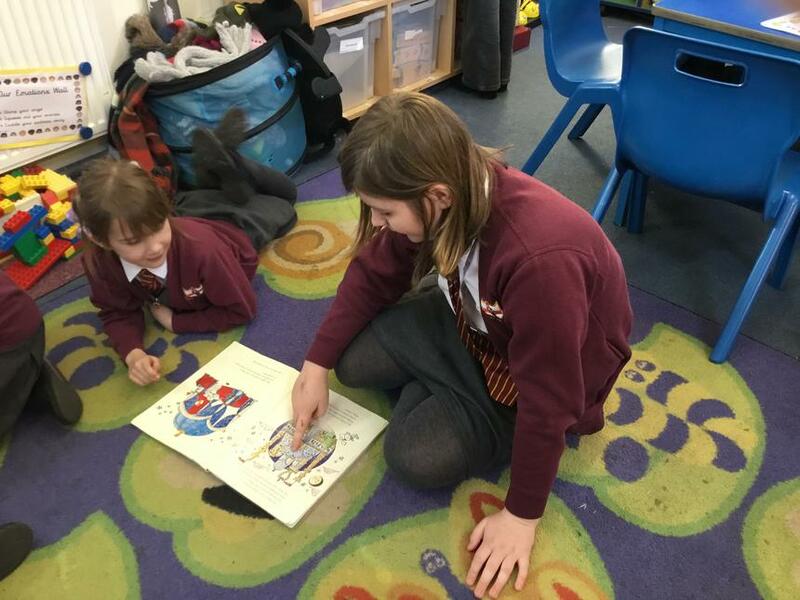 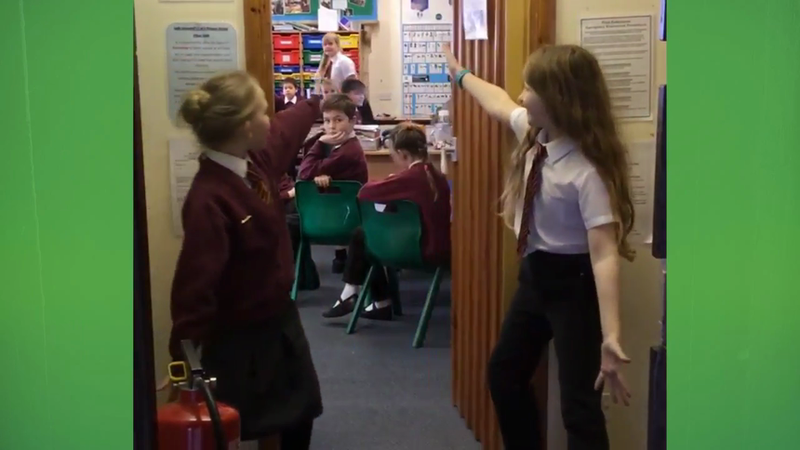 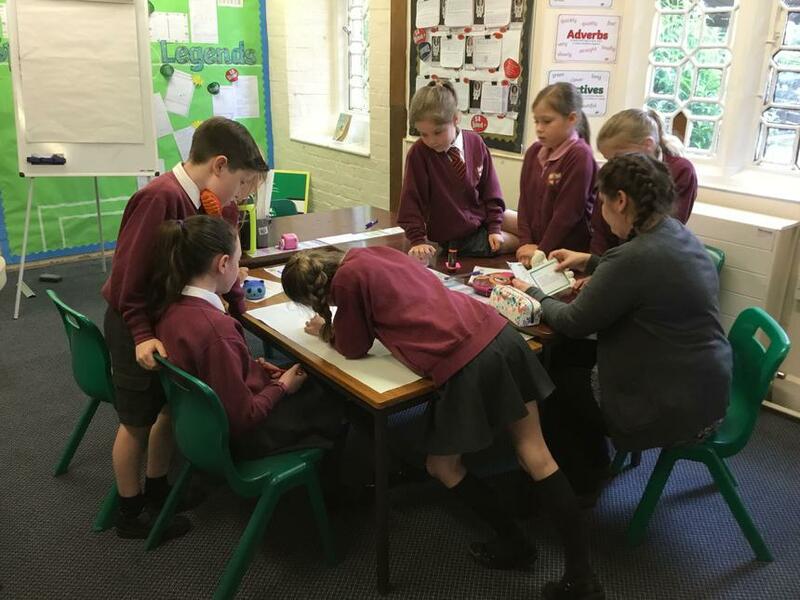 The children used very effective persuasive writing techniques that they have been learning in their lessons and were fortunately allowed them back! 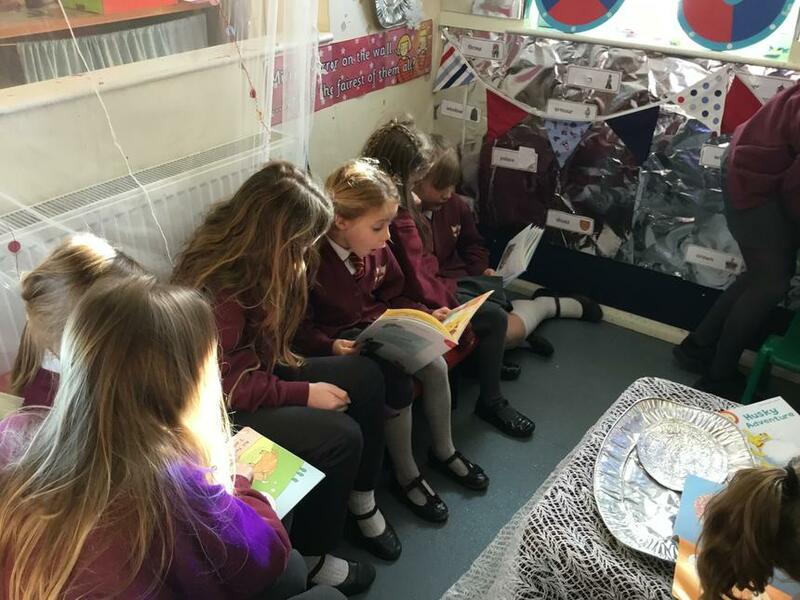 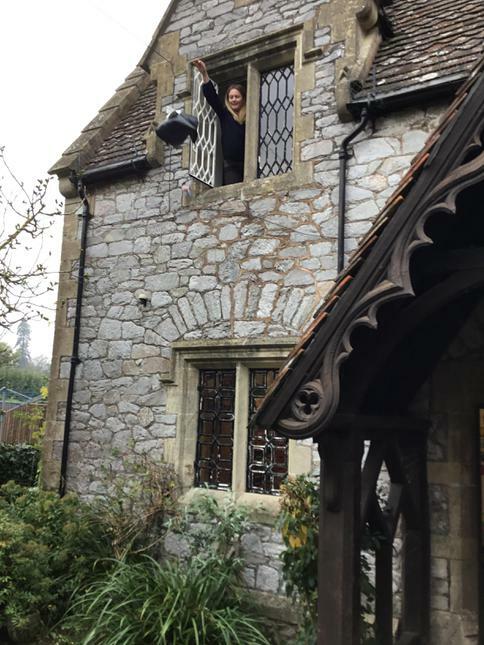 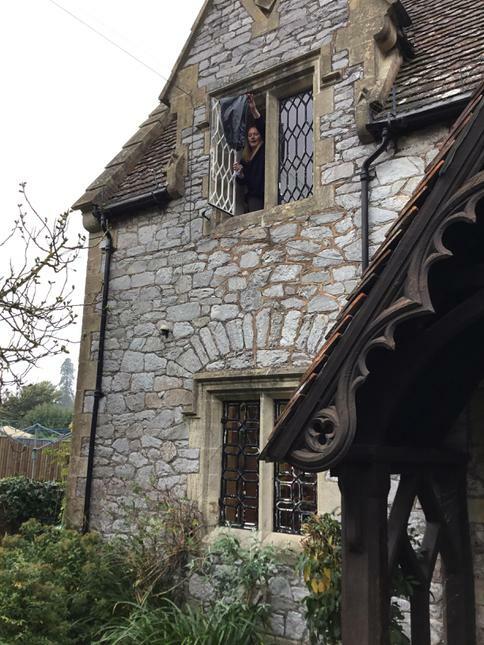 It's not just the children who enjoy reading, the staff at Lady Seaward's also like to get 'caught reading' throughout the day. 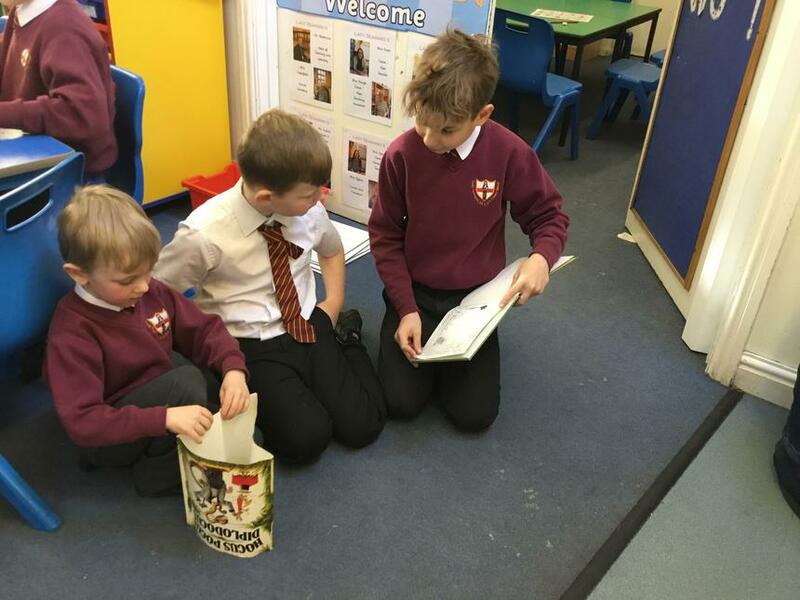 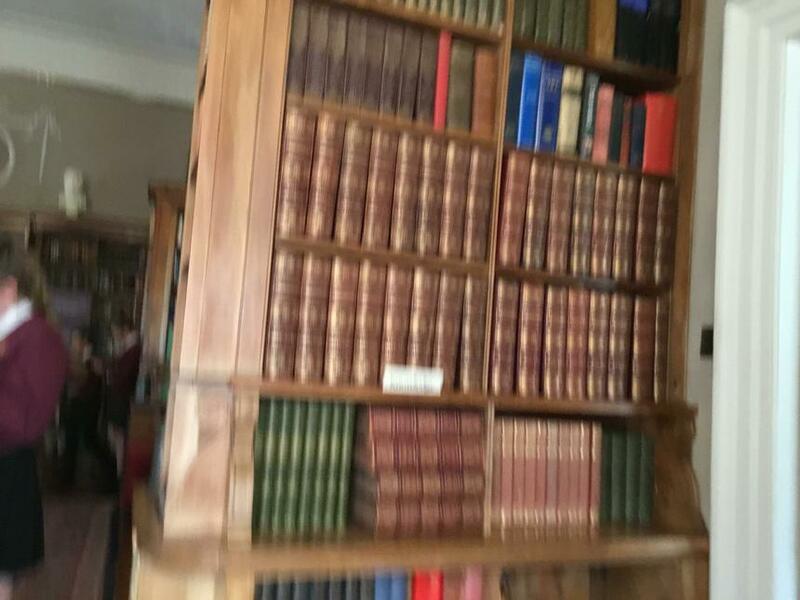 Can you see what their favourite books are? 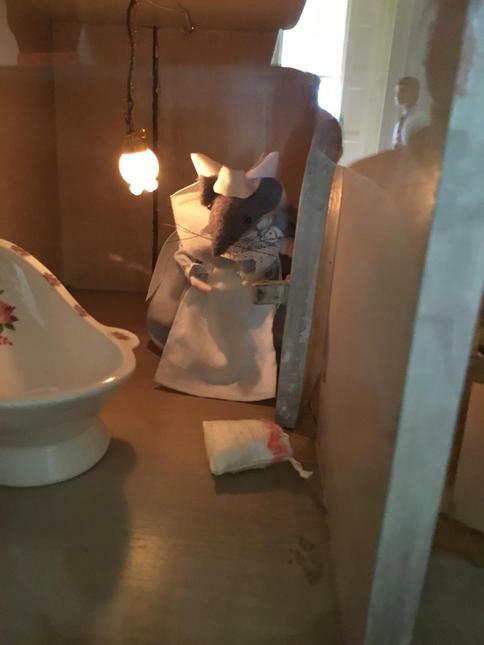 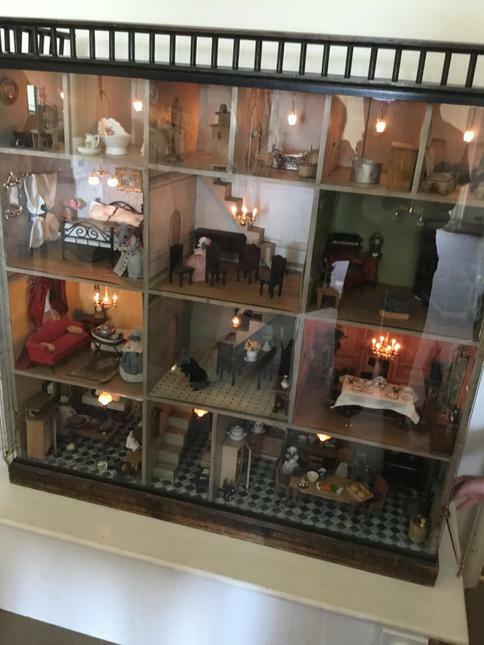 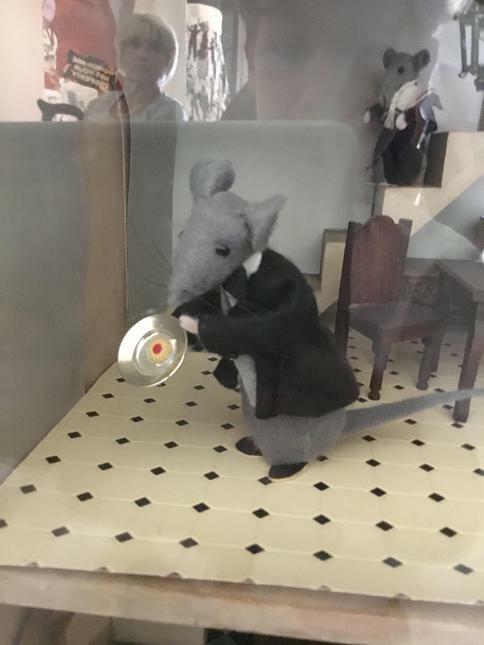 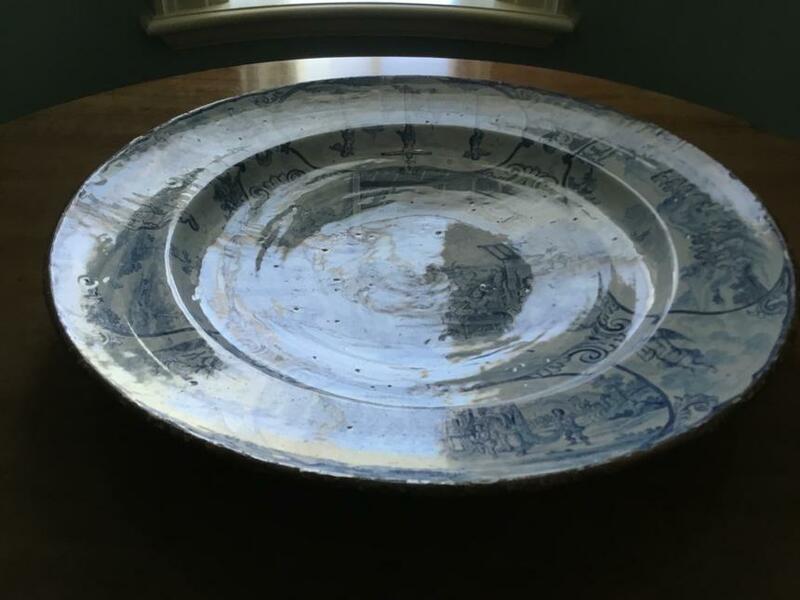 'It took two weeks to make. 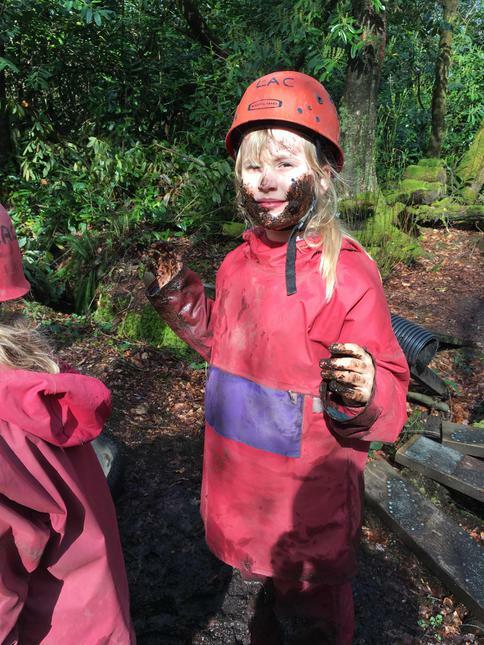 We made the face out of paper mache. 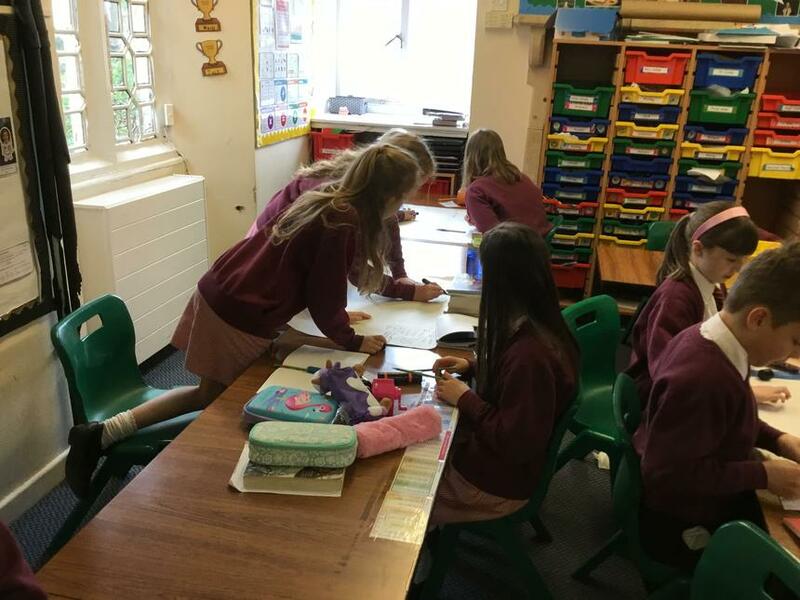 We then put two pillows in the body to make the tummy and used an old pair of tights for the legs and two pairs of gloves to make the hands. 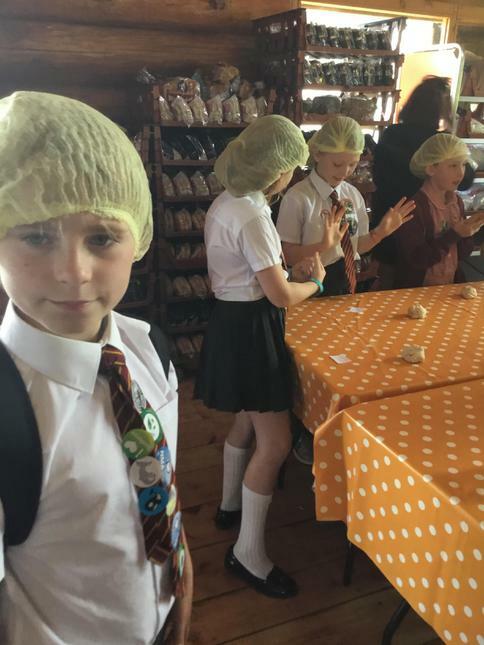 We found a mask to make the face and old dog hair to make his hair. 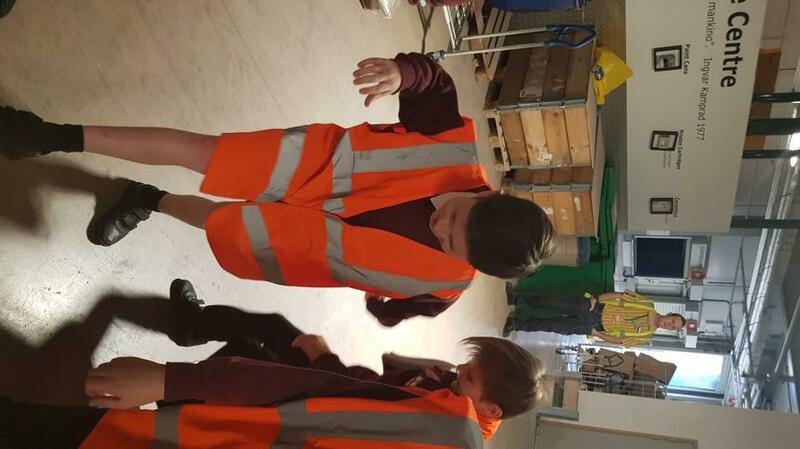 We purchased some lovely new boots for him to wear!' 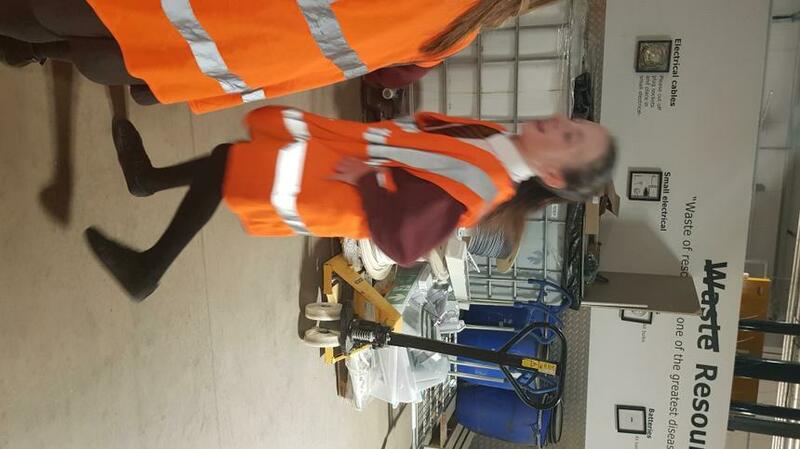 - Karly. 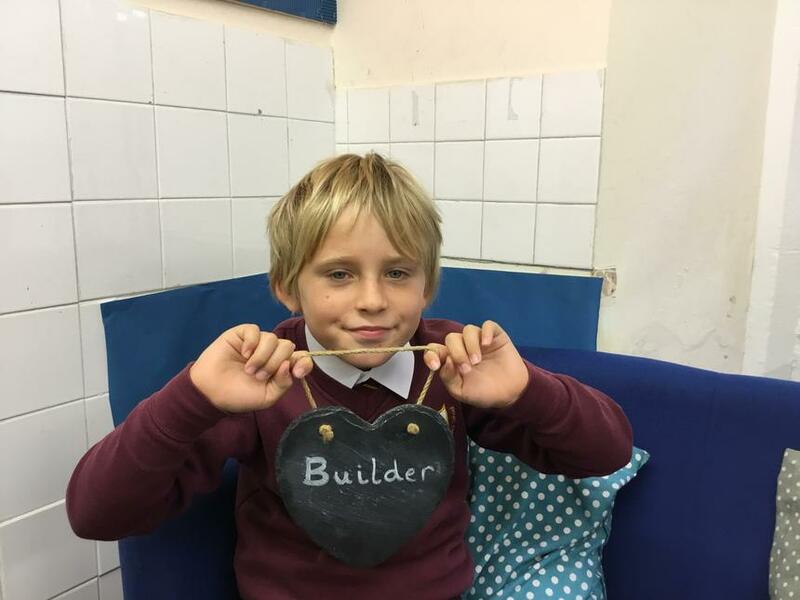 I am very impressed with the work that has gone into making this lovely character and it will be displayed proudly in our classroom. 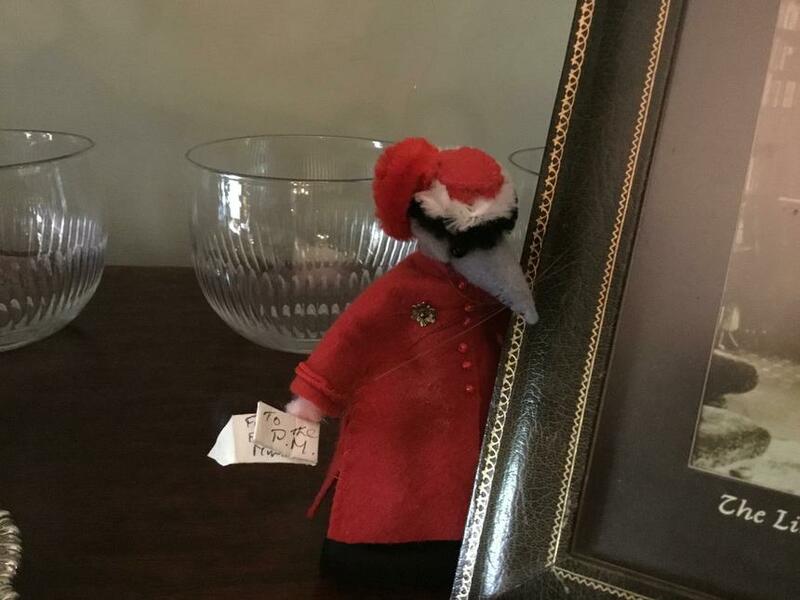 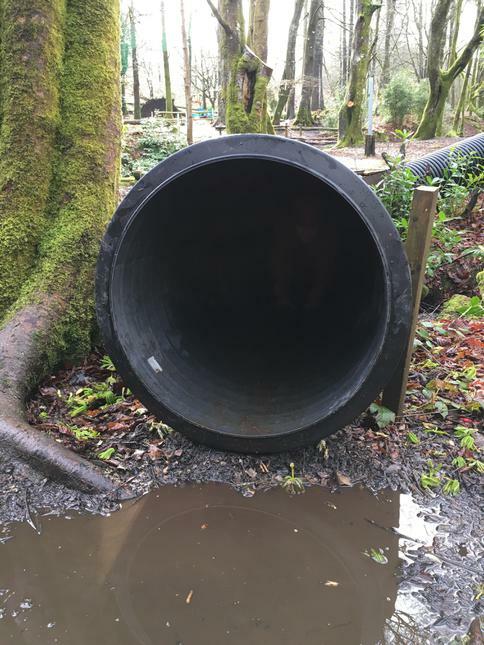 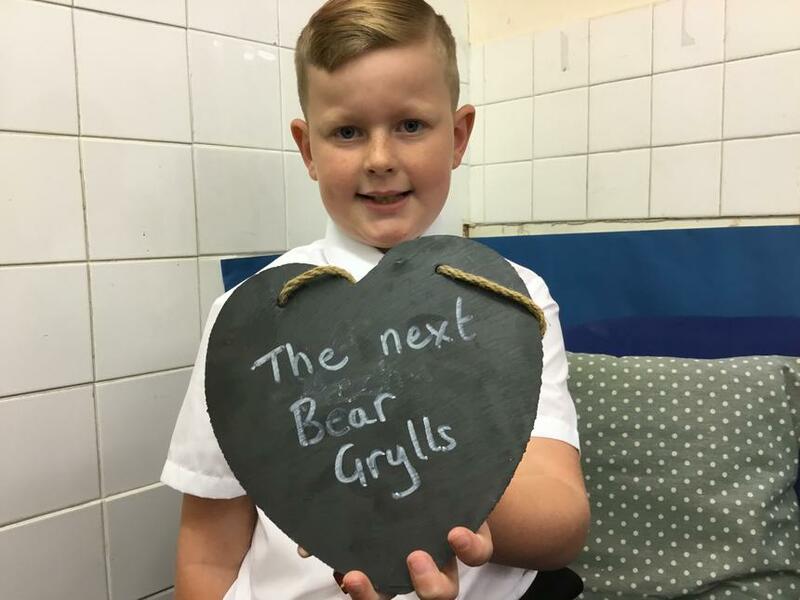 Keep an eye out for him when visiting! 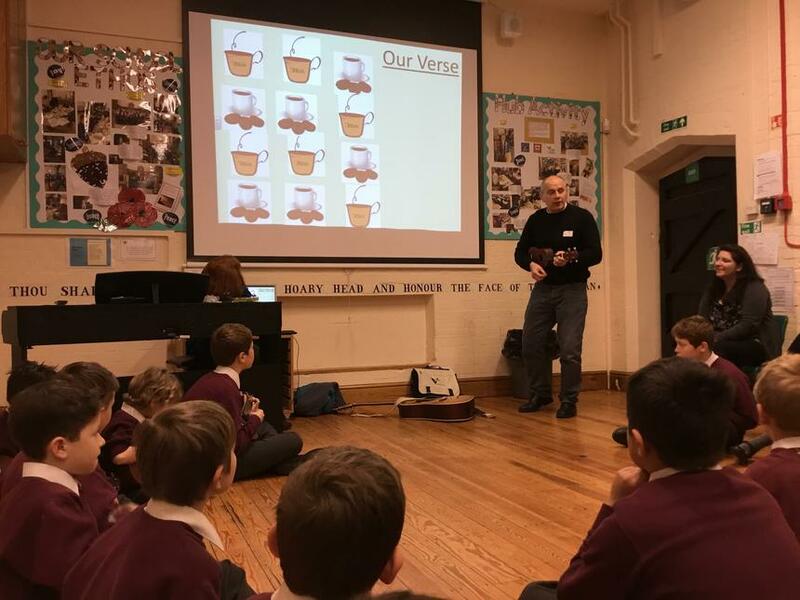 Lady Seaward's C of E Primary School Ethos Day. 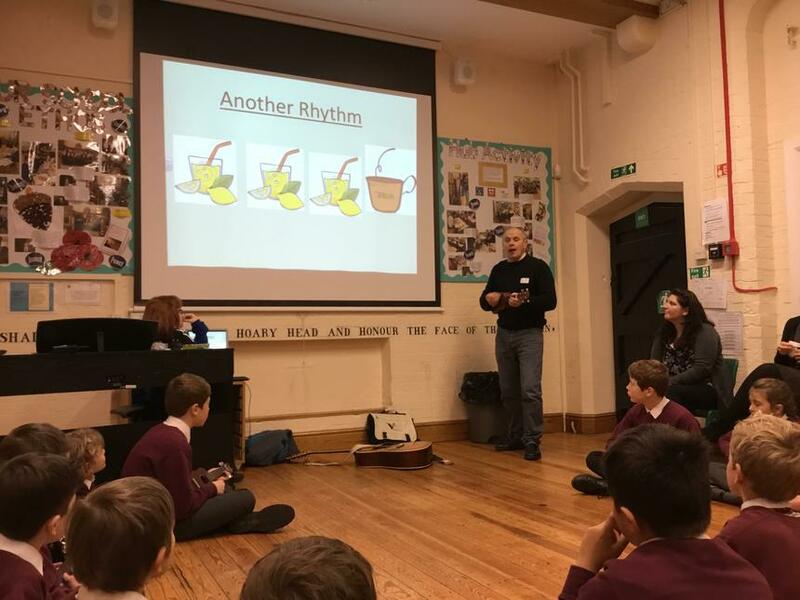 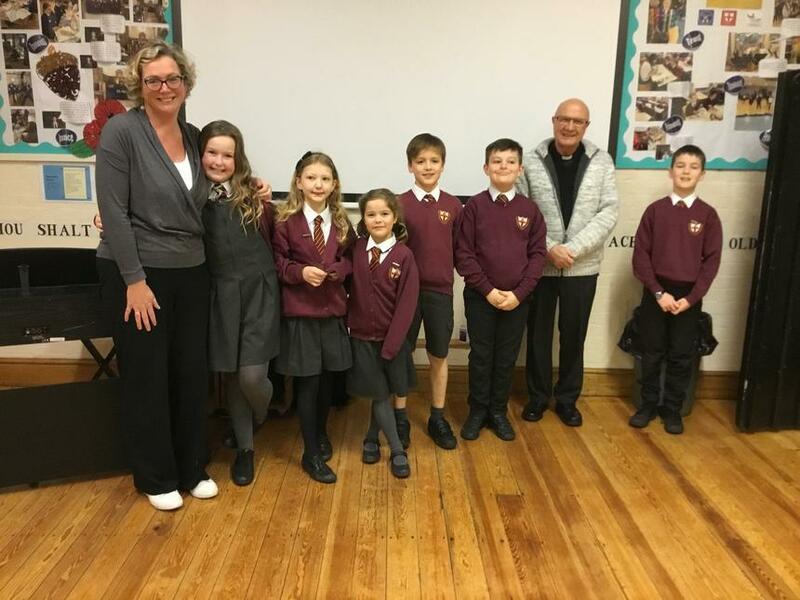 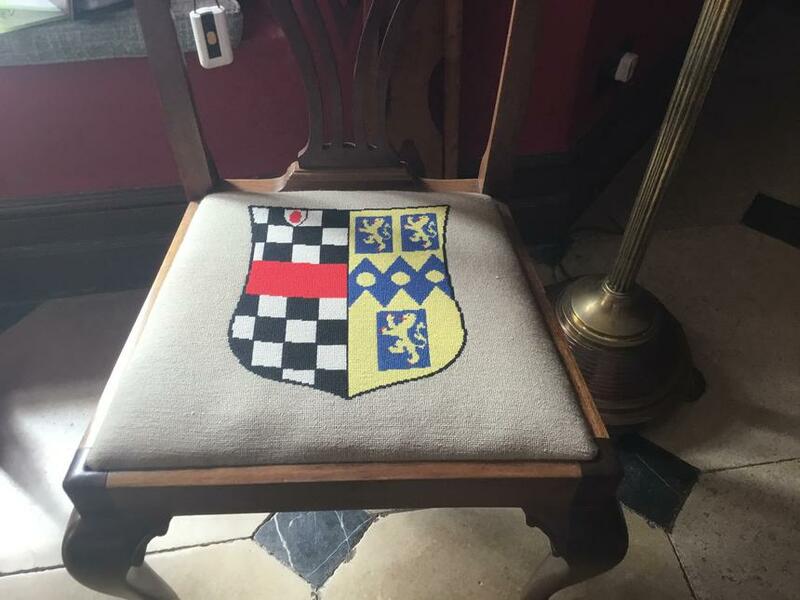 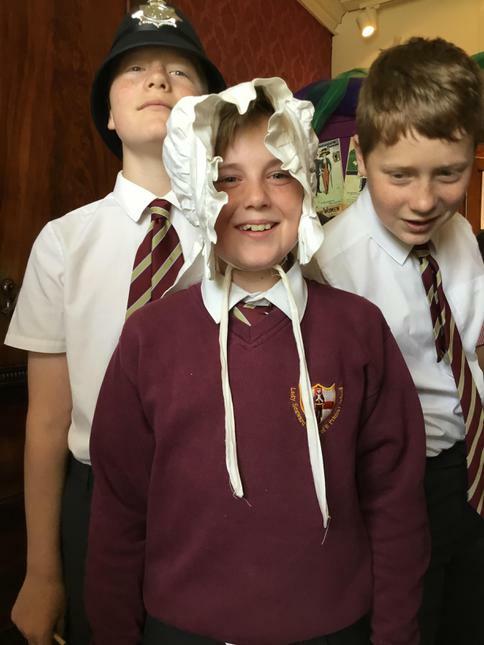 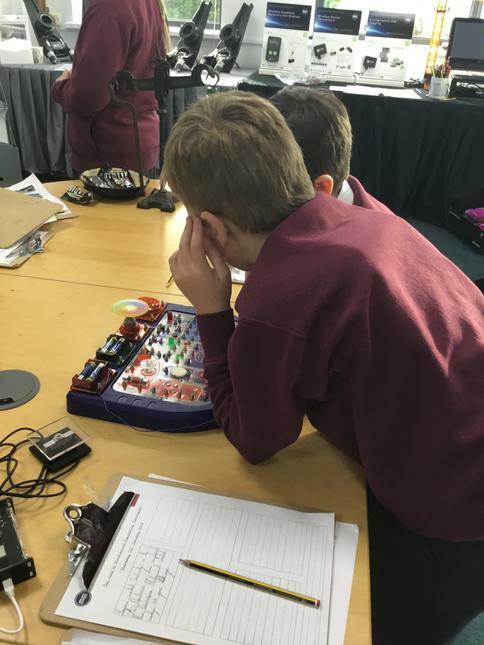 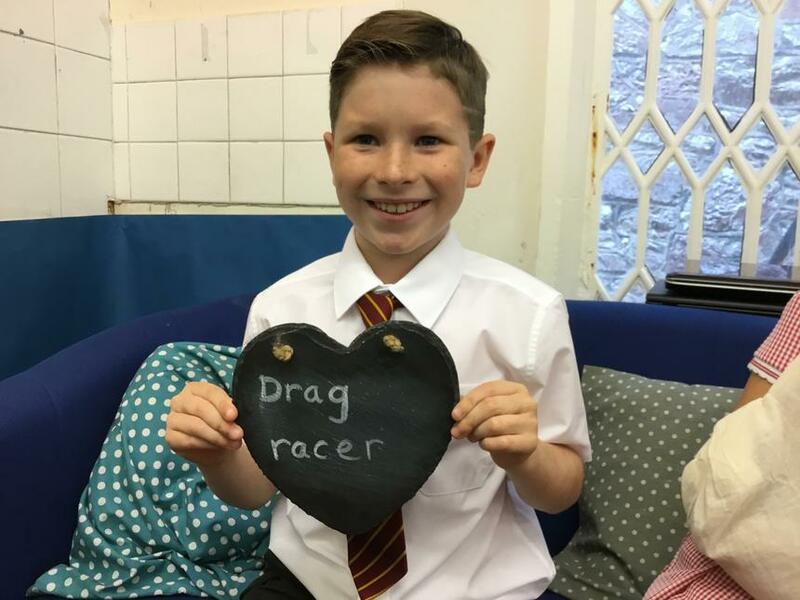 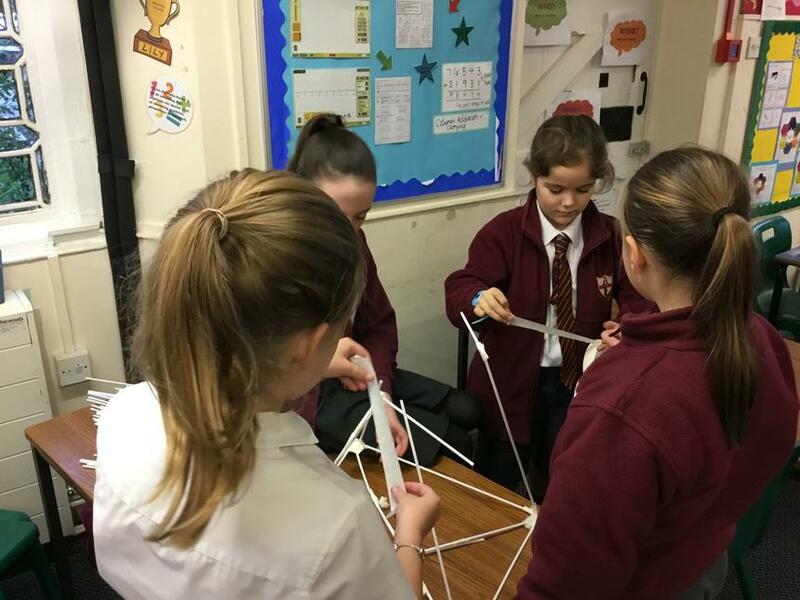 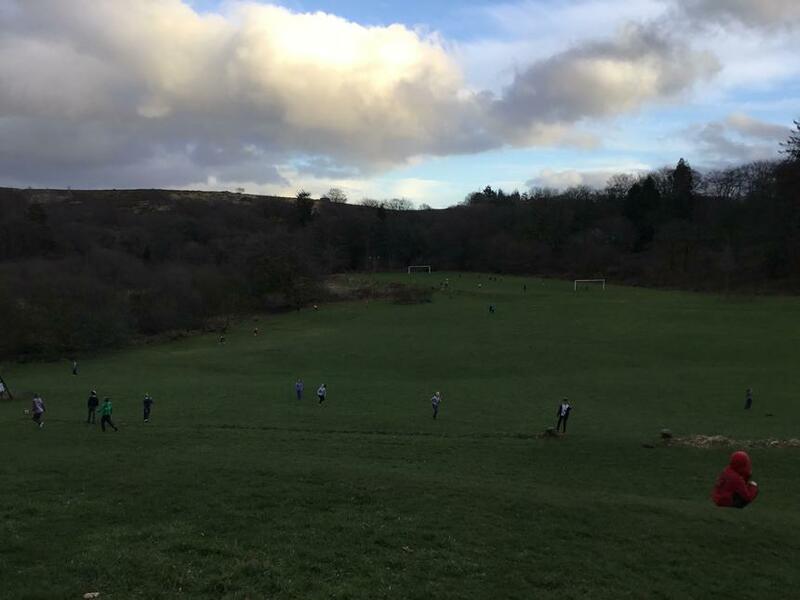 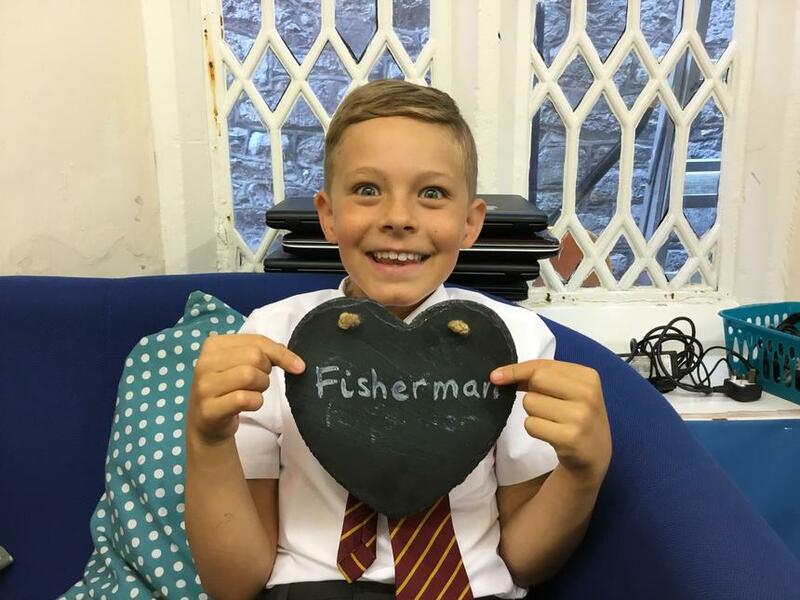 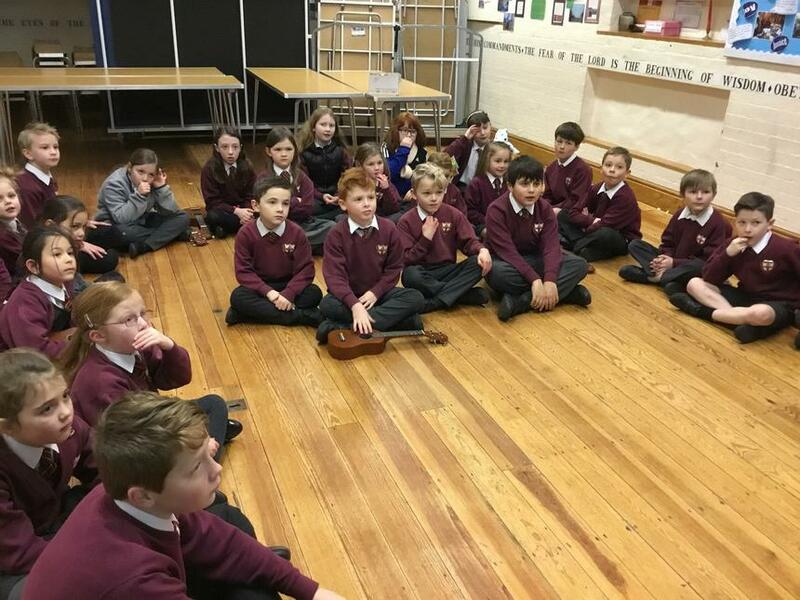 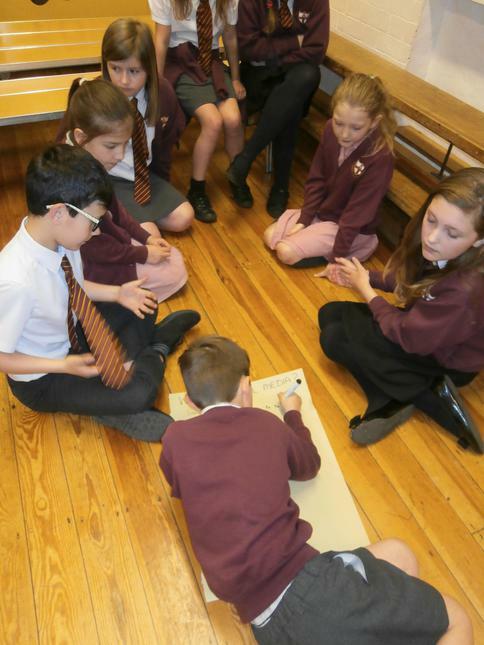 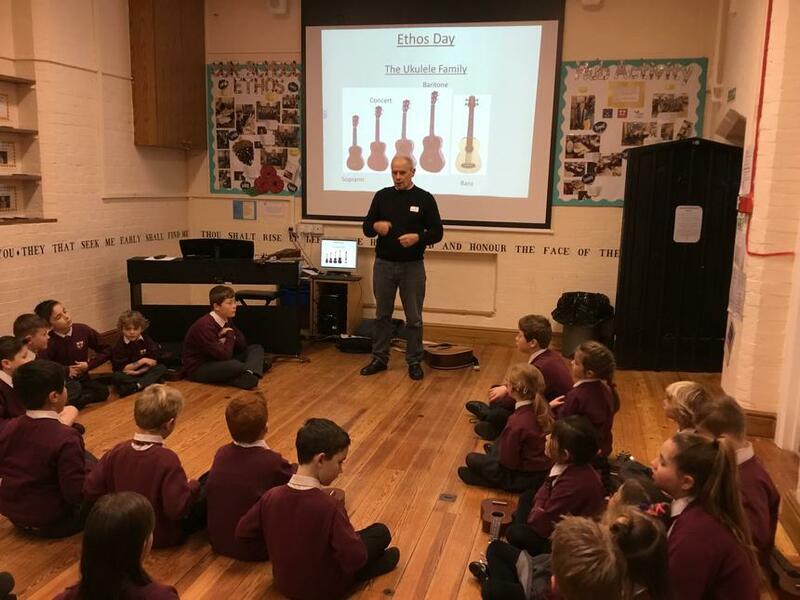 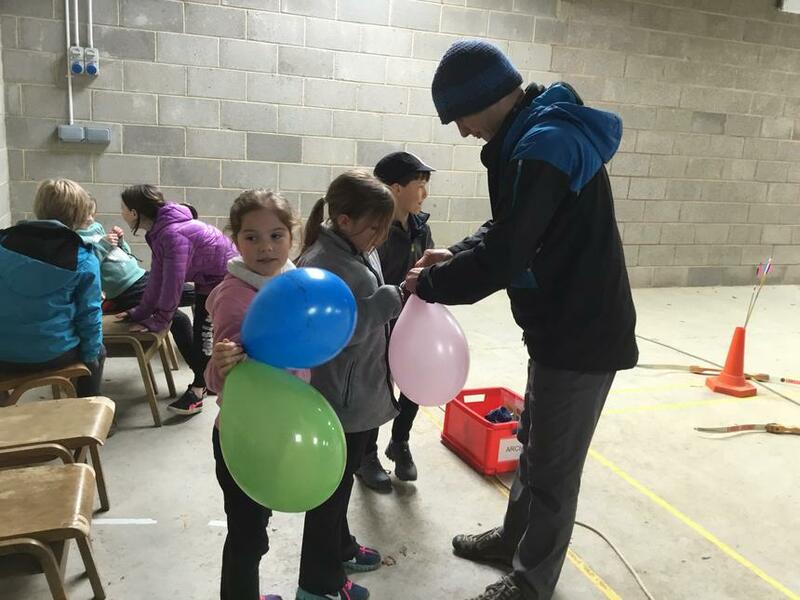 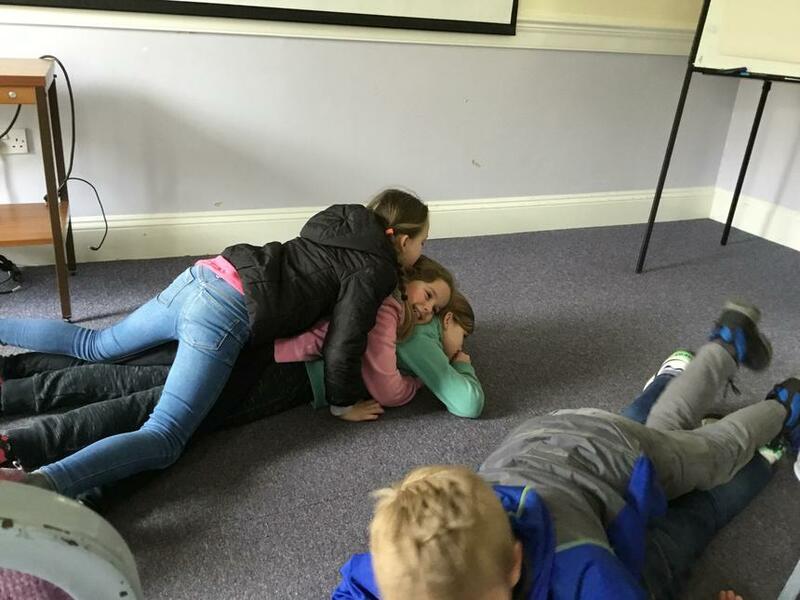 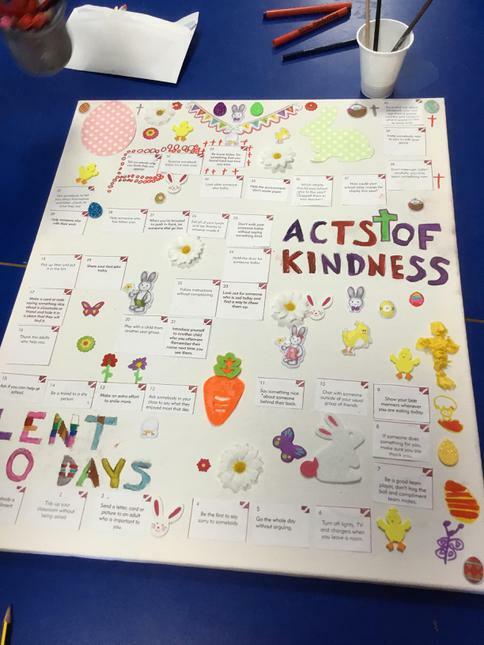 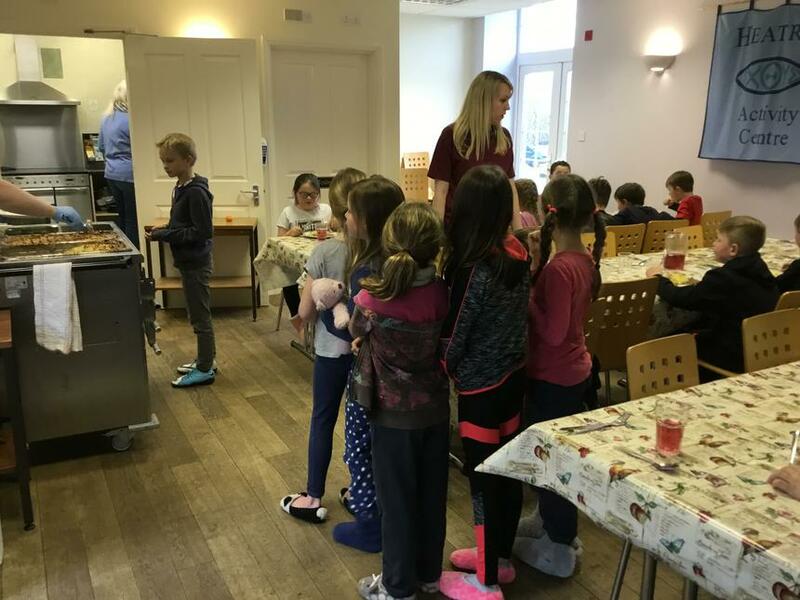 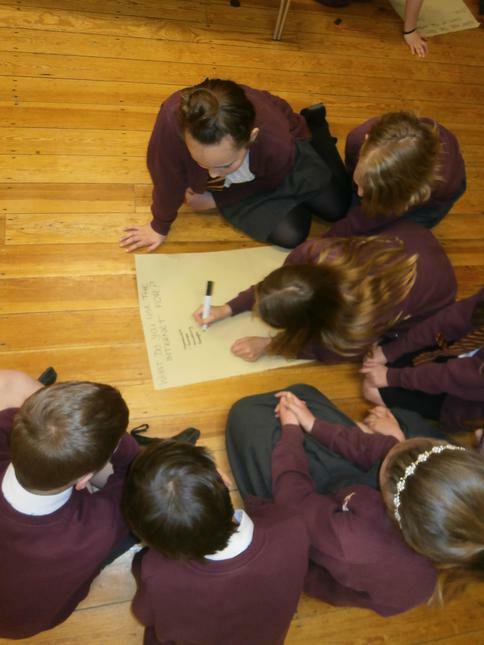 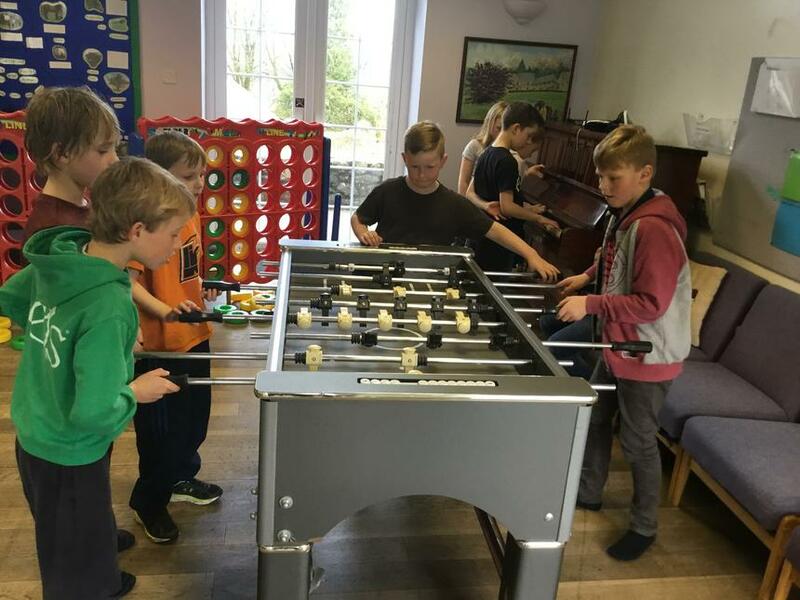 Lady Seaward's held an Ethos Day where children from five different schools were divided into family groups and participated in a number of different activities based on the significance of Lent as a Christian Festival. 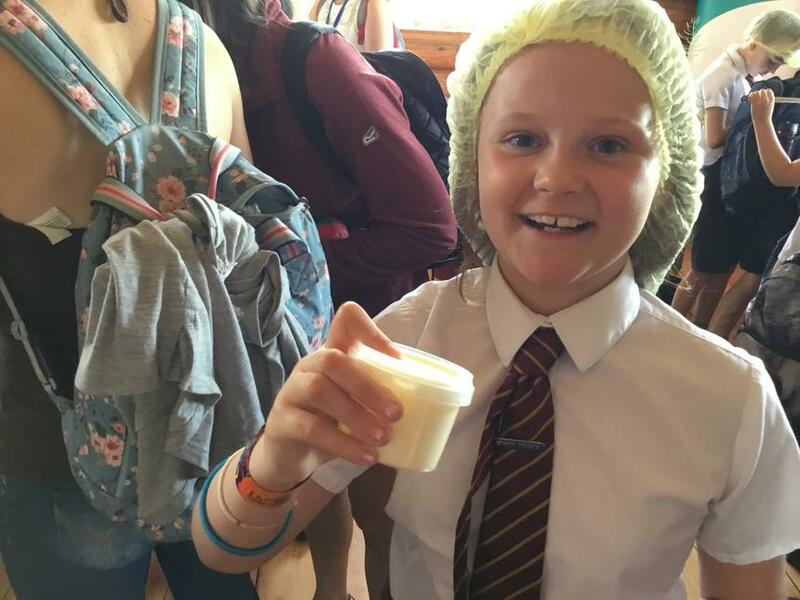 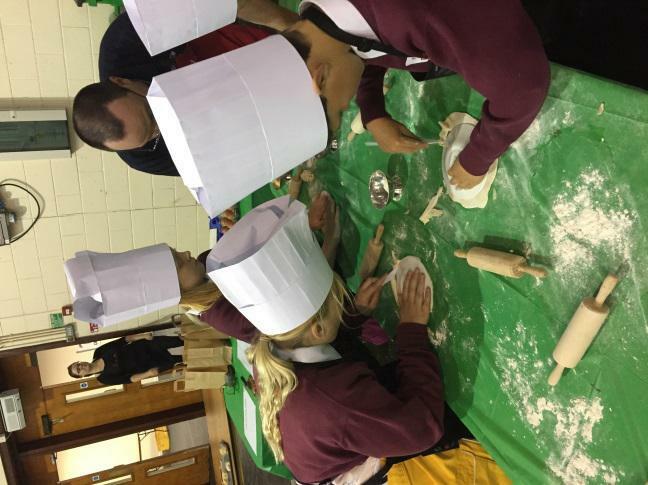 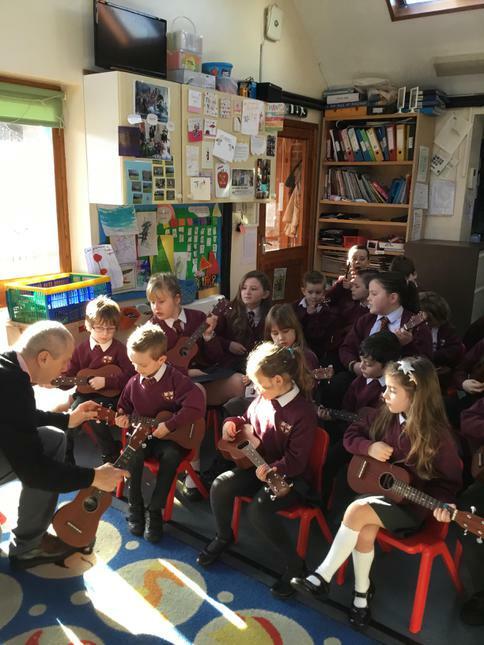 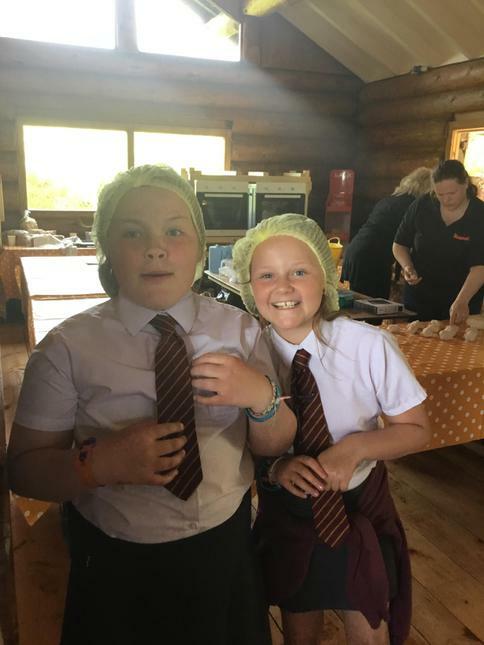 The activities included a variety of workshops including: music, cookery and art. 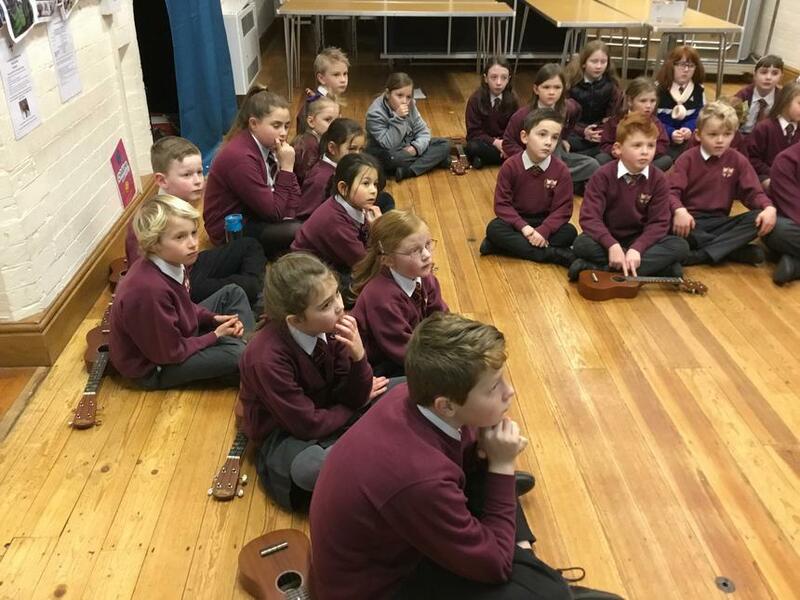 The children shared their learning and reflected on the day through a service at Clyst St George Parish Church. 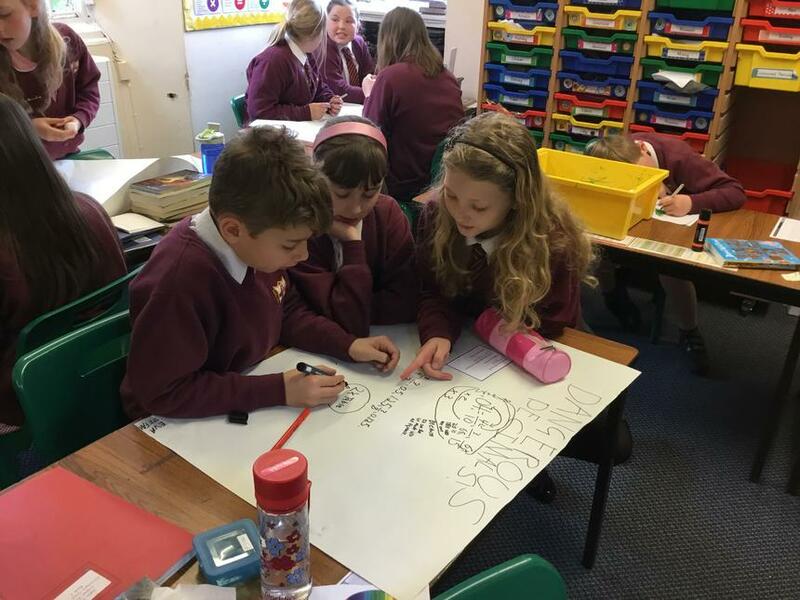 Using mathematical language to explain and justify findings. 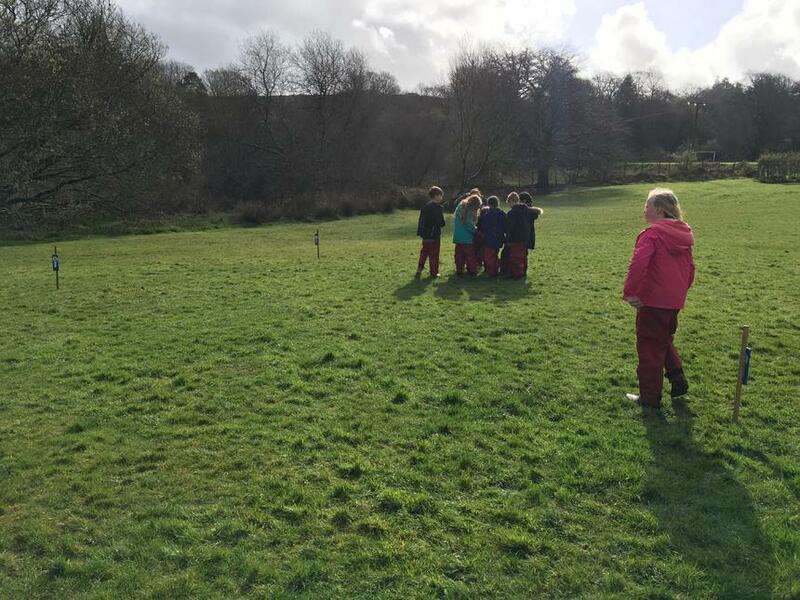 Measuring the perimeter and area of the playground. 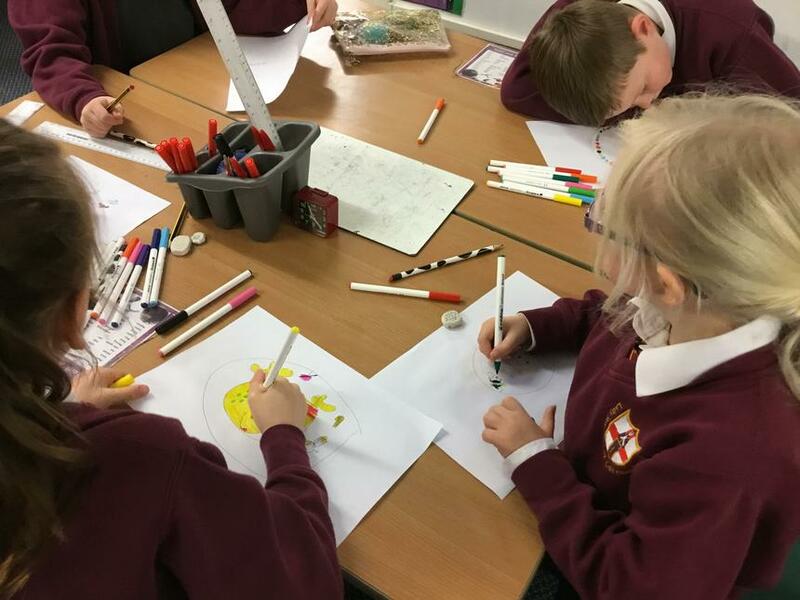 This term the children have been developing their measurement skills and have been learning how to measure the perimeter and area of different shapes. 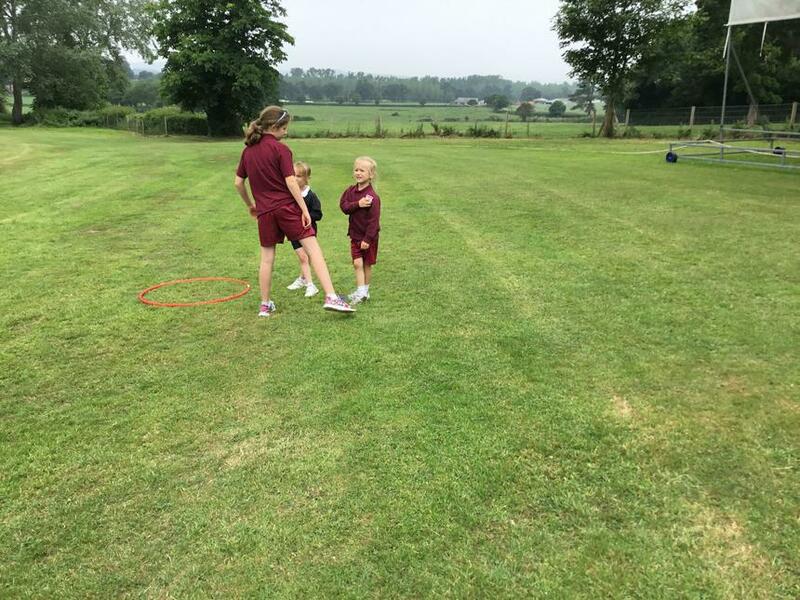 To show our skills and knowledge, the children decided to measure the perimeter and area of the playground. 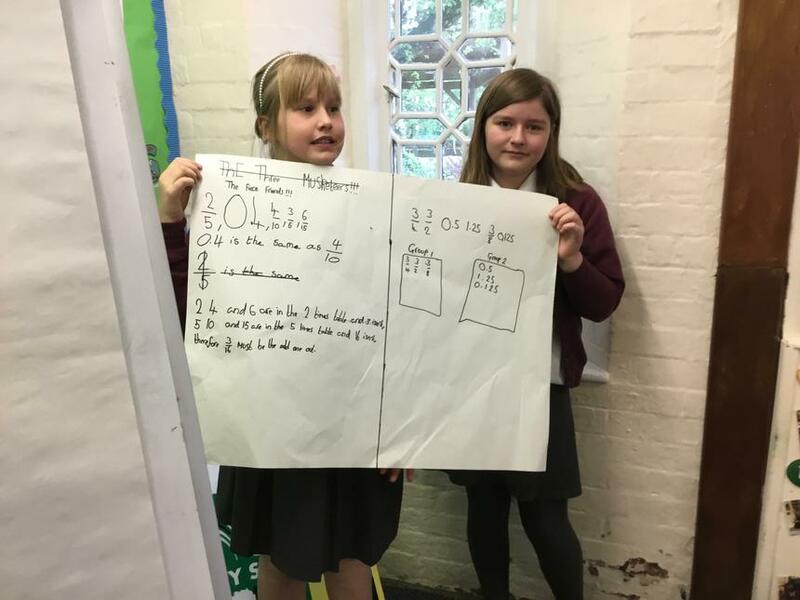 They estimated the measurement first as this is a skill we have been developing in class and worked out the formulas needed to calculate the perimeter and area. 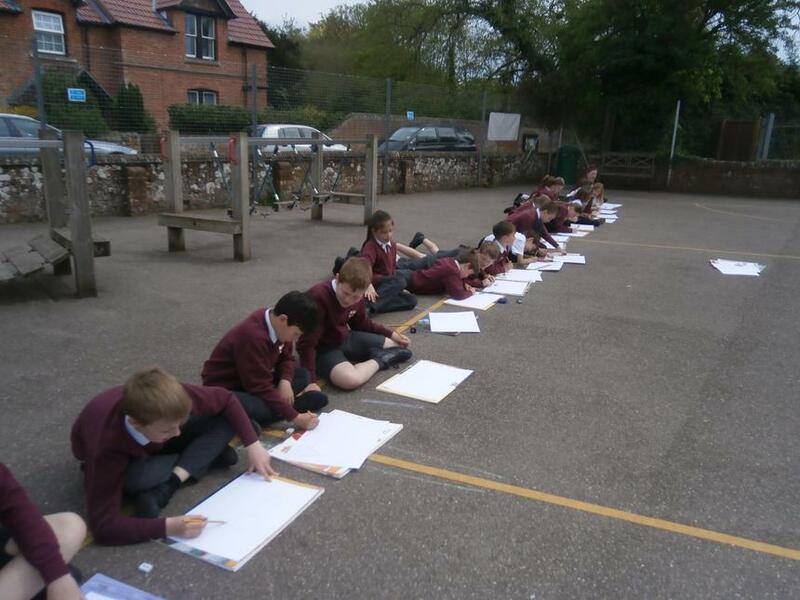 They then used trundle wheels to calculate the perimeter and area. 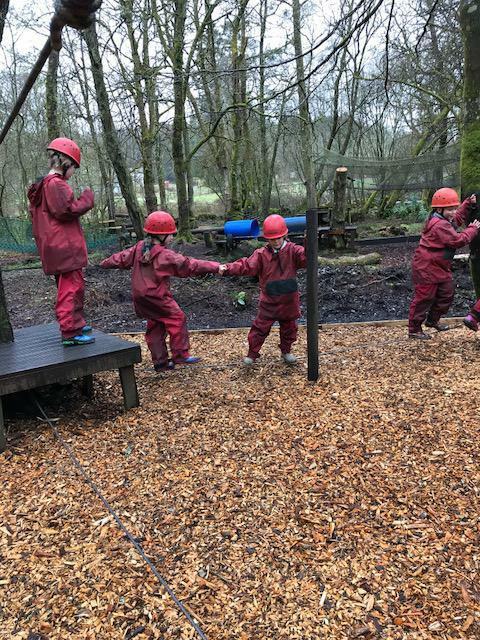 The children showed friendship when working together and perseverance to make sure they had measured every side. 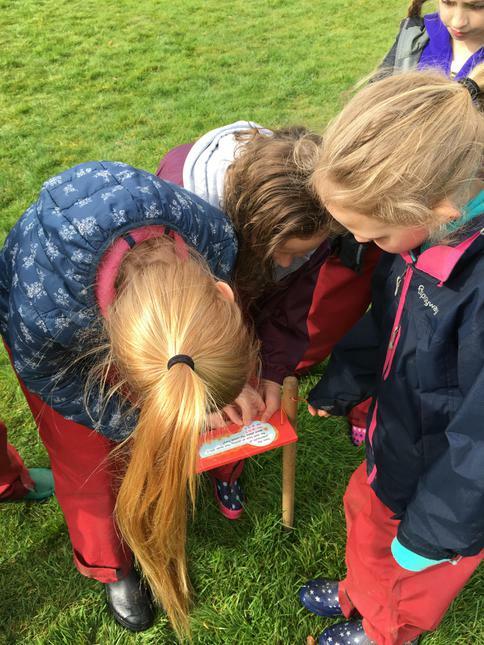 Through our learning of 'Animals and Their Habitats' we decided to go on a bug hunt. 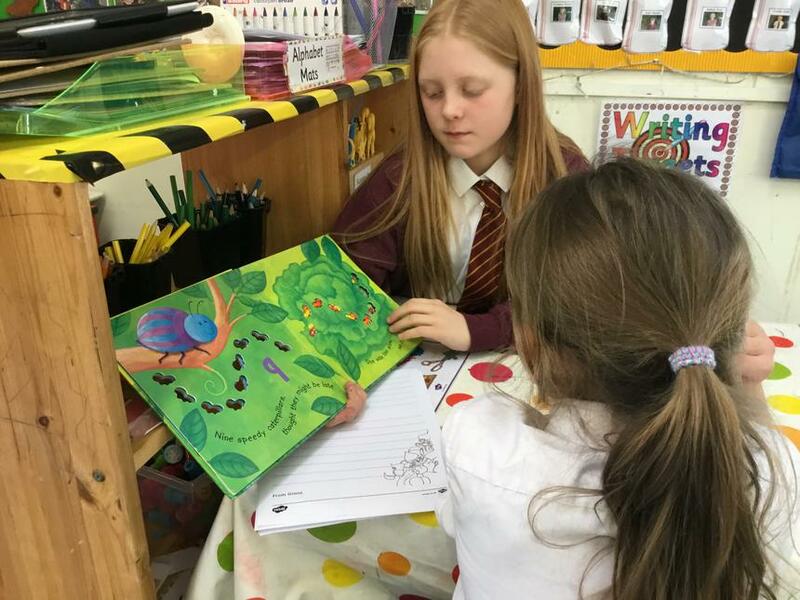 We have been looking at the differences between invertebrates and vertebrates. 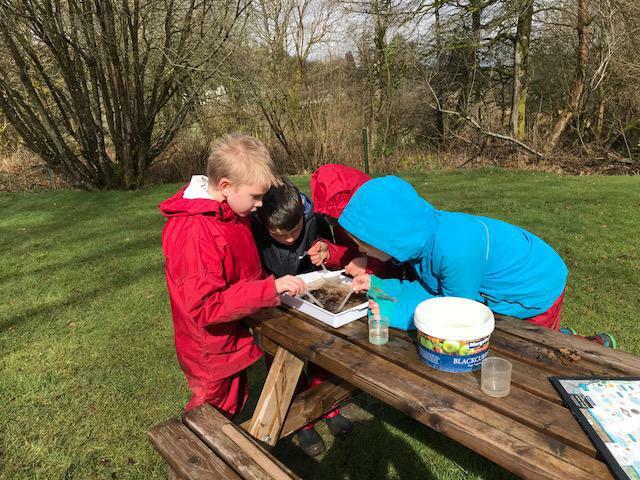 We used the outdoor space to hunt for living things. 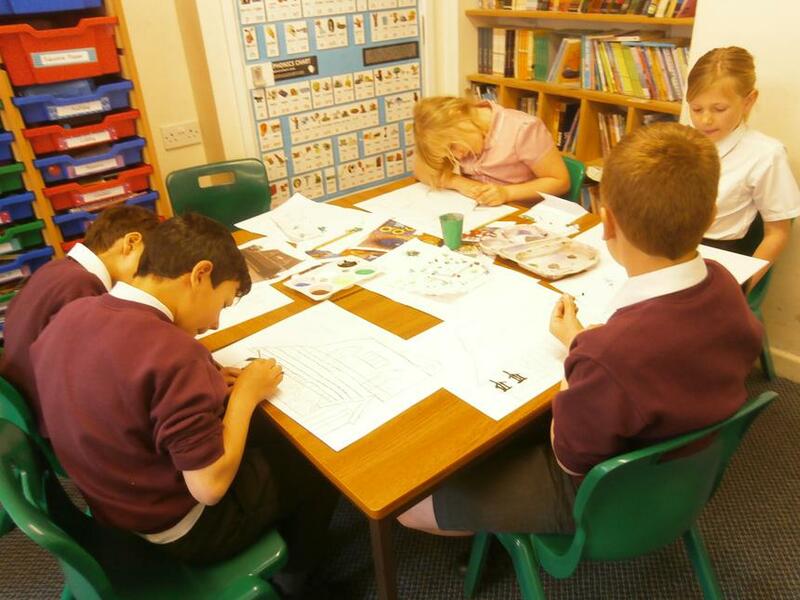 In the classroom, we then had to identify the creatures using a classification key. 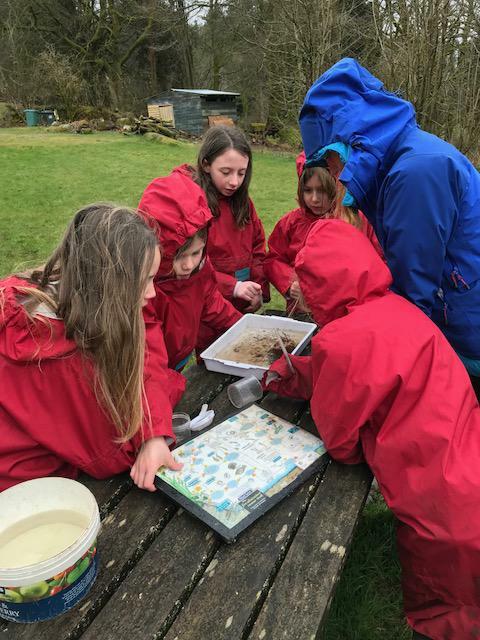 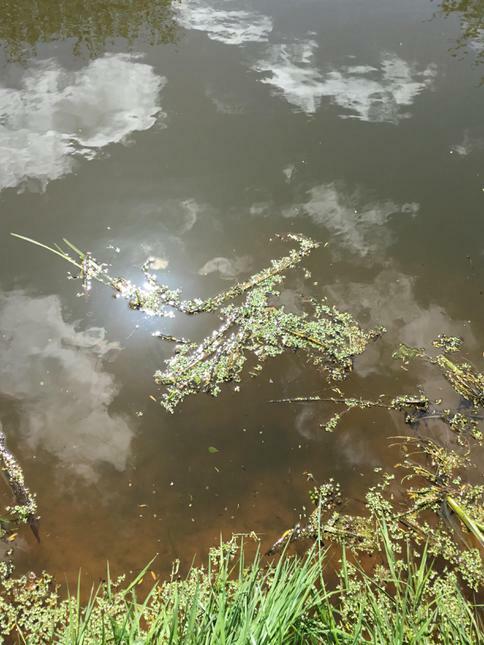 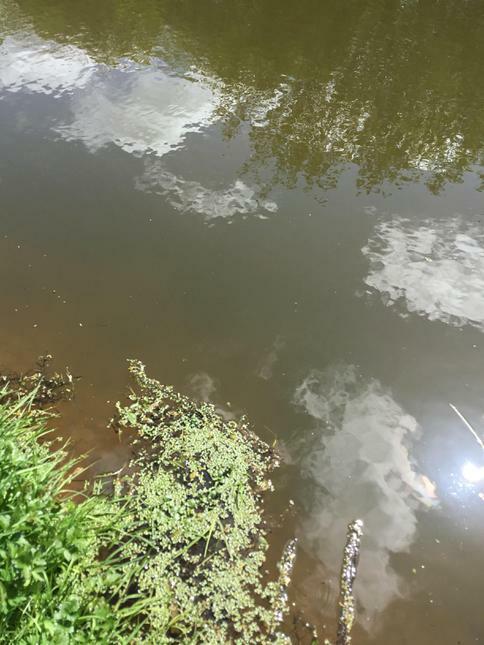 We found many things and proved that you are never too old to get excited about finding a frog in the school pond! 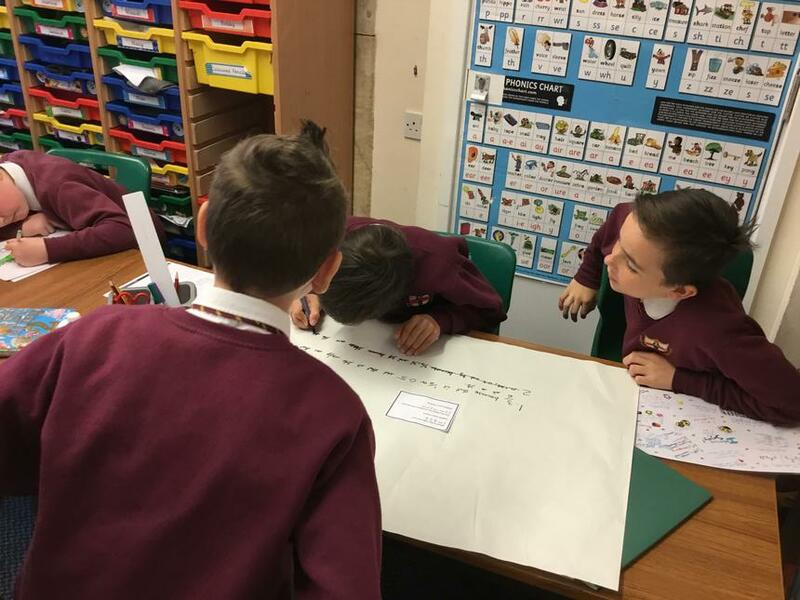 Spelling List for Year 4 & 5. 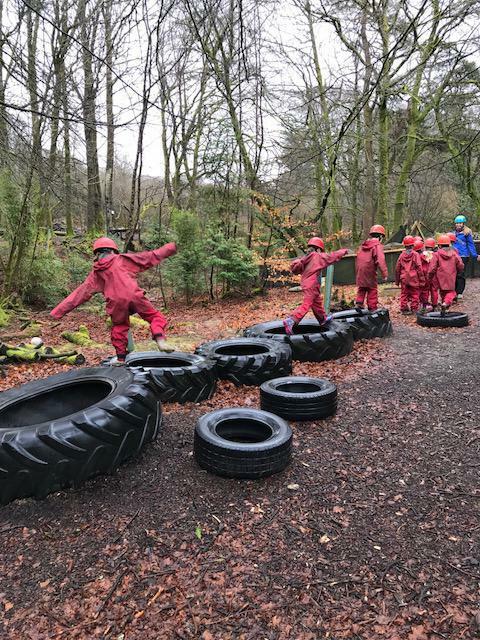 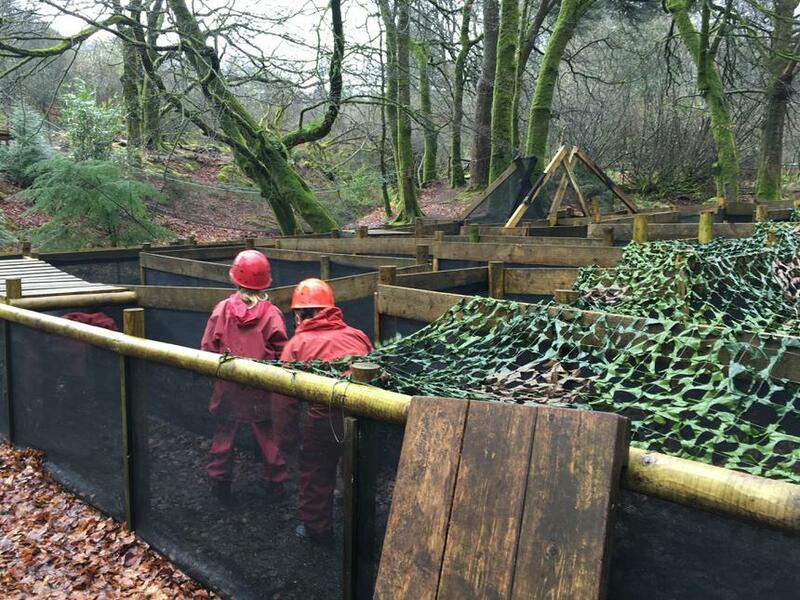 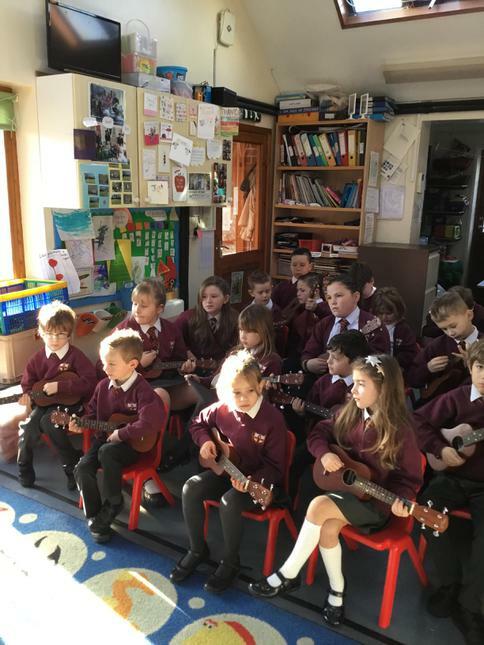 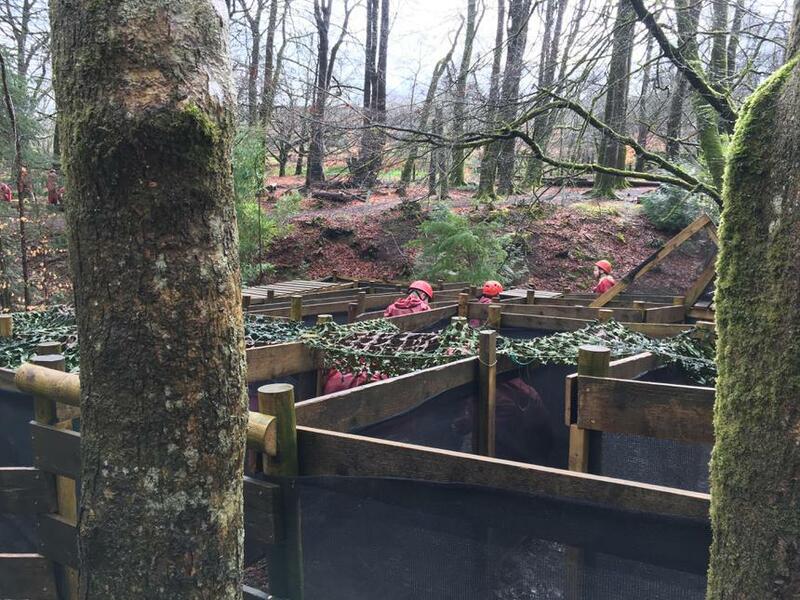 Class 3 were lucky enough to be invited to Mantracourt for an afternoon class trip. 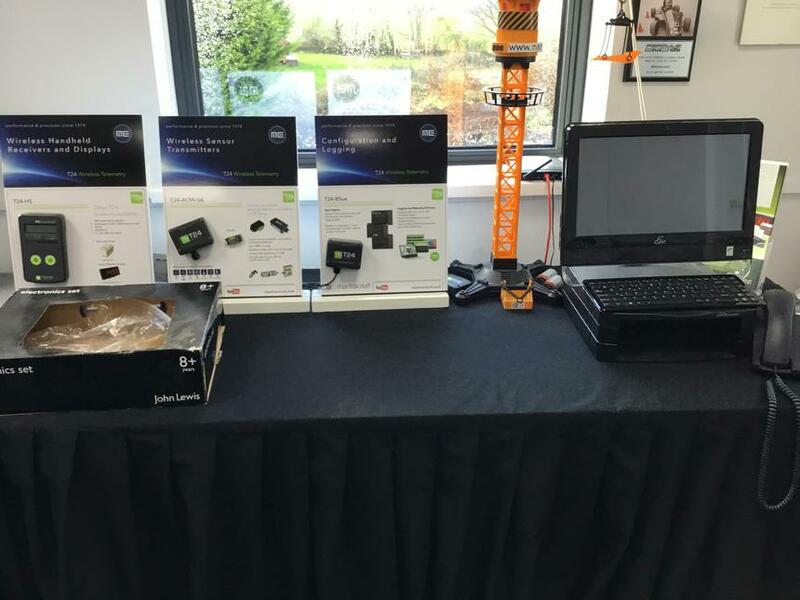 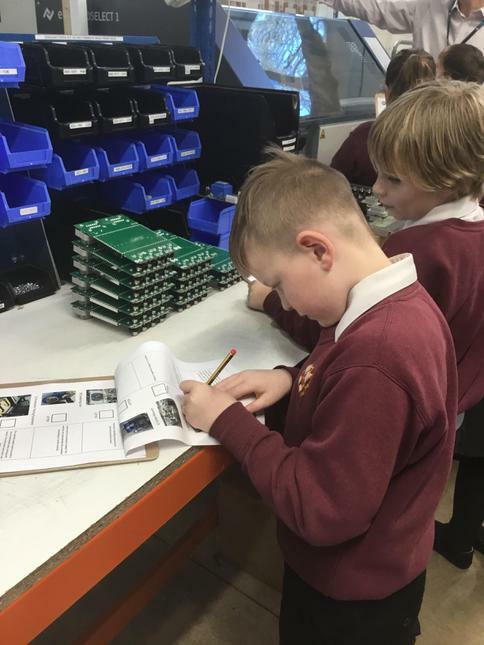 Mantracourt specialise in miniature high performance electronic products and have a factory just minutes away from our school. 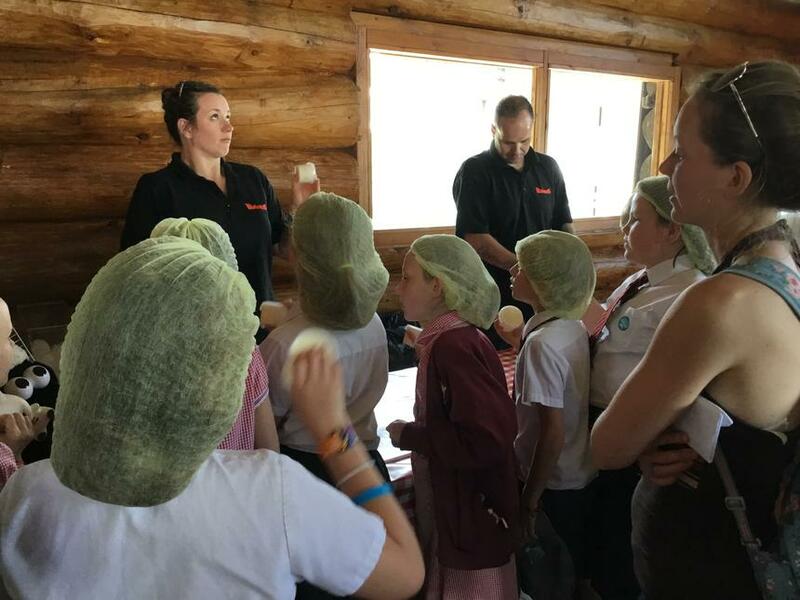 The children were given a talk by staff members who informed the children how the company started and the day to day running of the company. 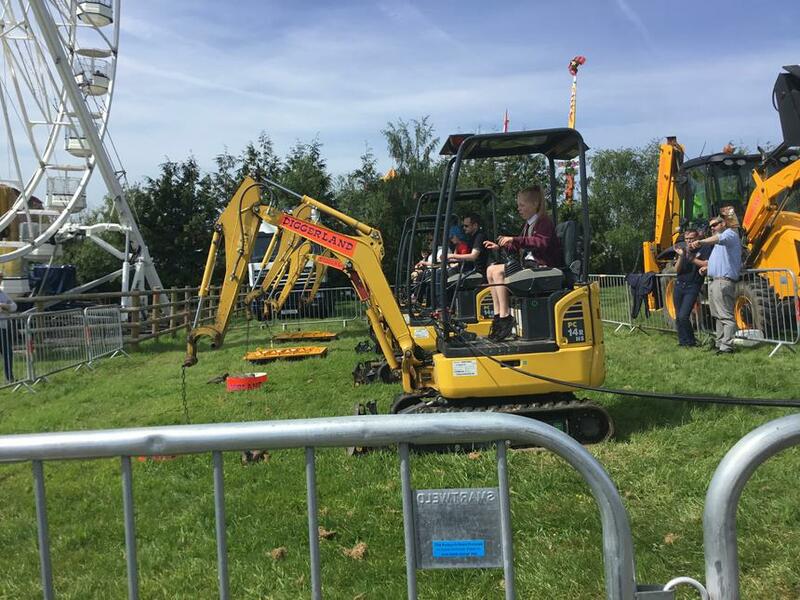 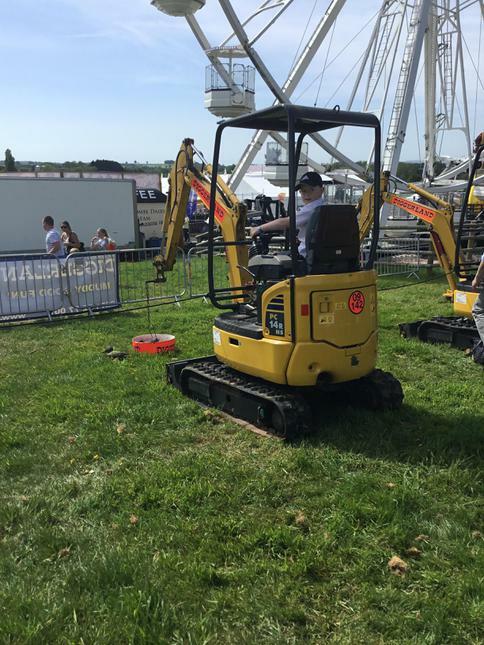 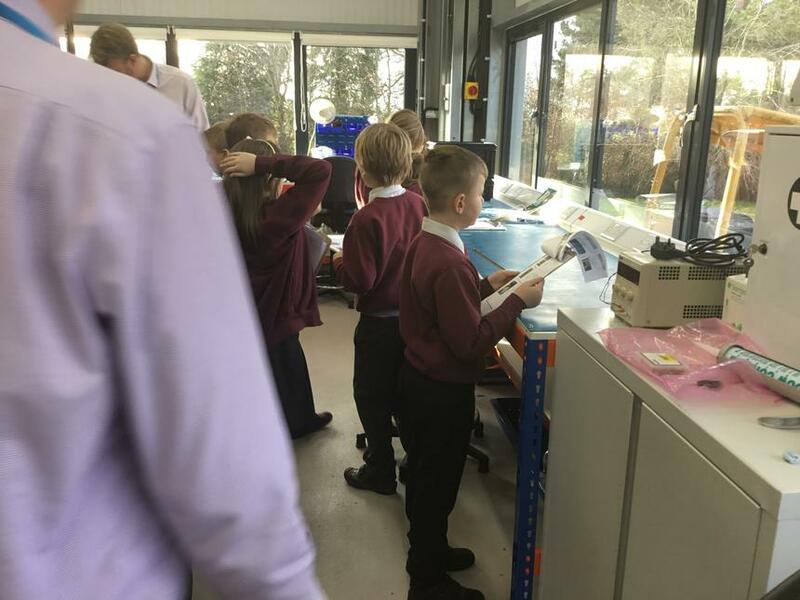 We were then taken on a tour where children got to see the staff at work and got to view the equipment and machinery running. 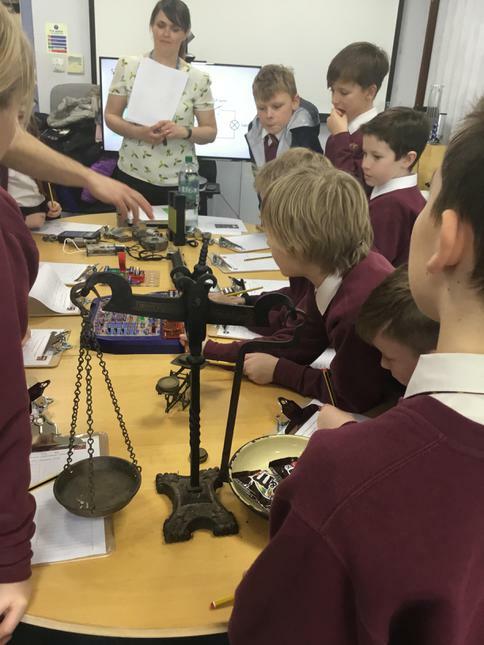 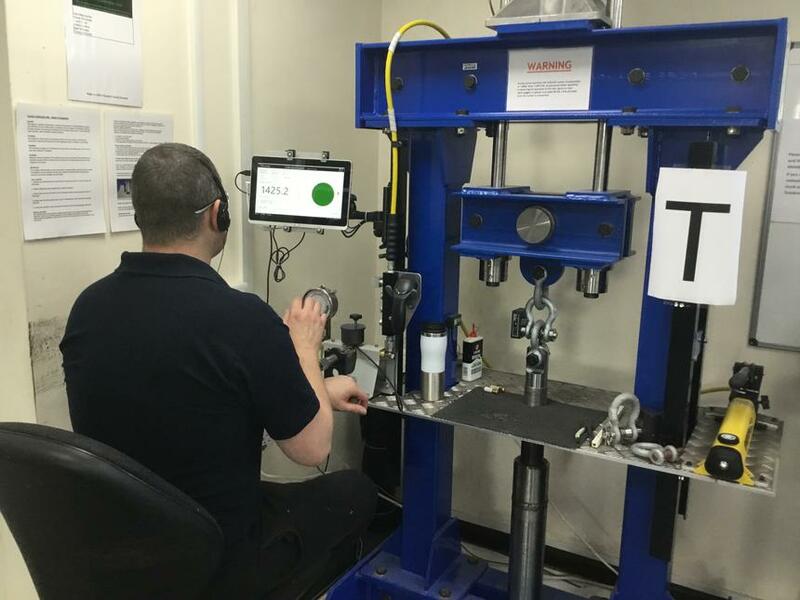 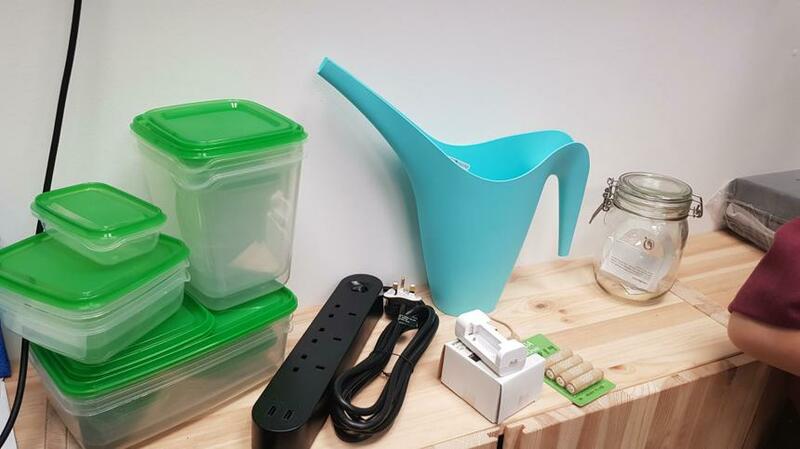 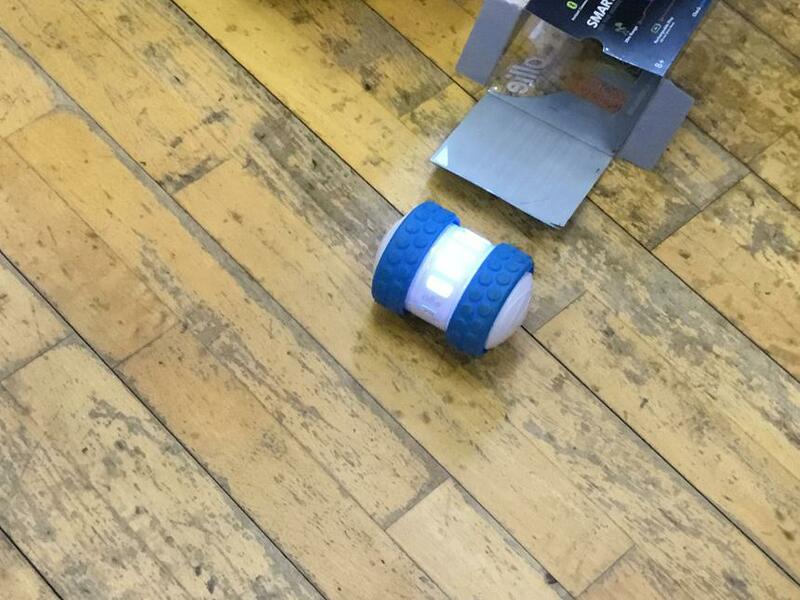 Additionally, children were invited to take part in a number of scientific testing involving weight and measure. 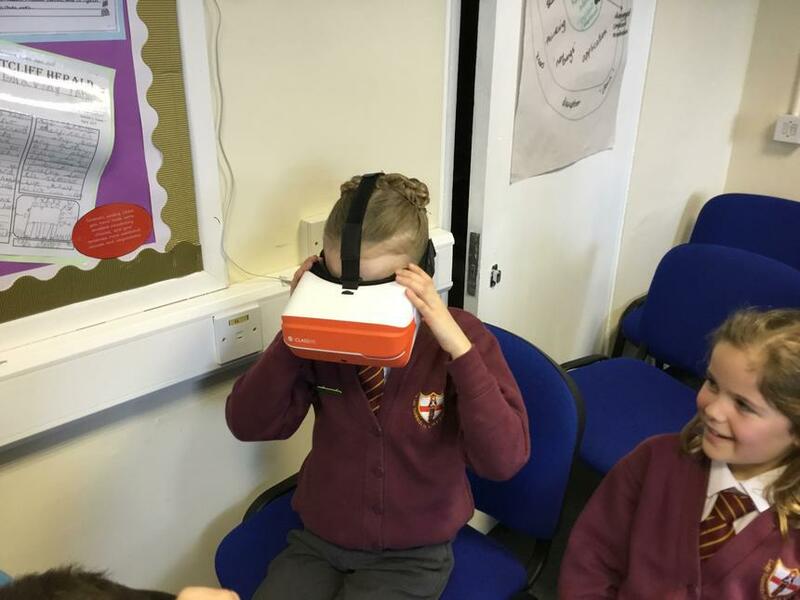 Class 3 learnt a lot of information and were very impressed with the technology. 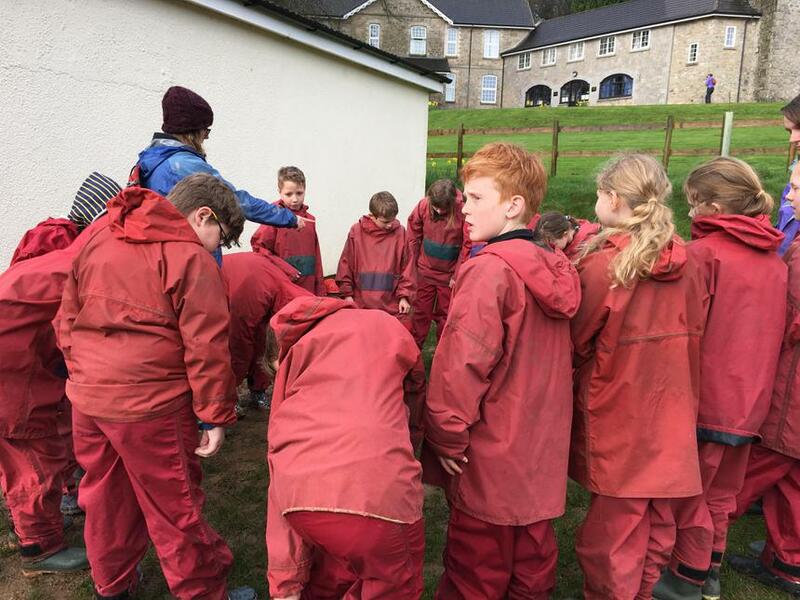 This trip will now form part of our science topic for the rest of the term. 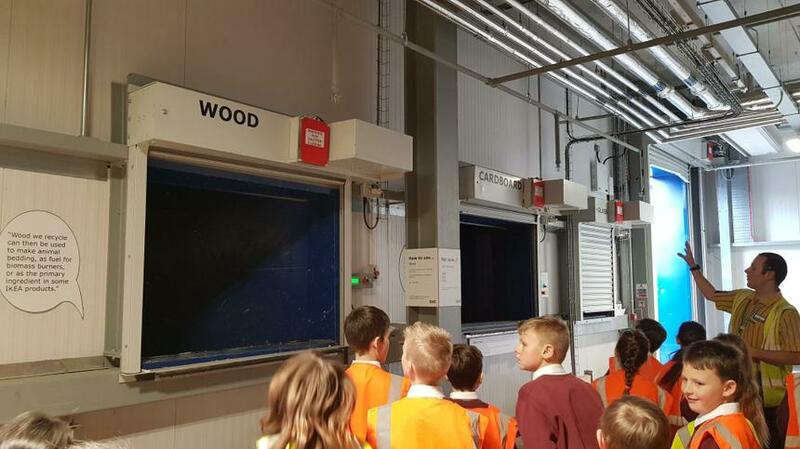 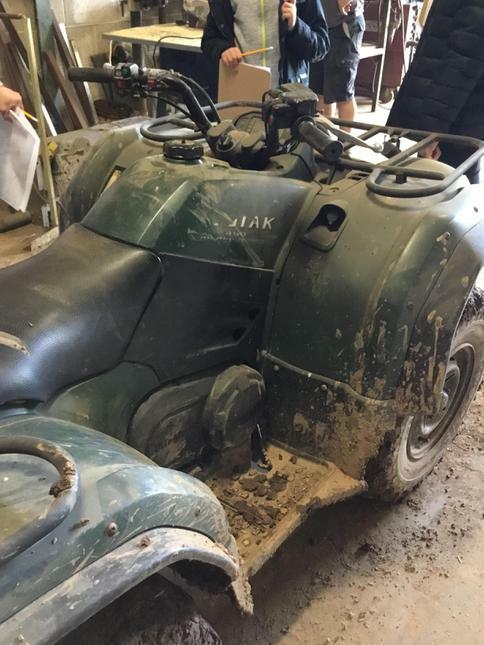 We would like to thank the staff at Mantracourt for inviting us to visit your factory and really hope we can return again one day. 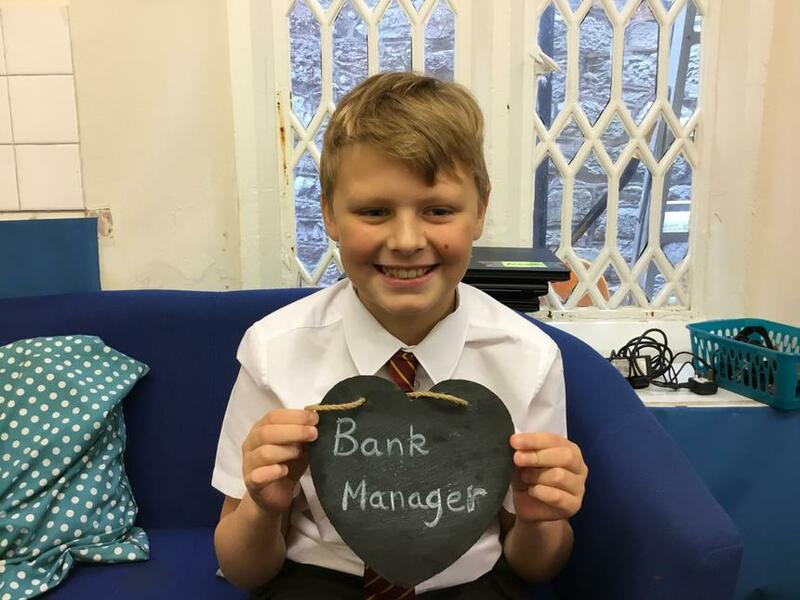 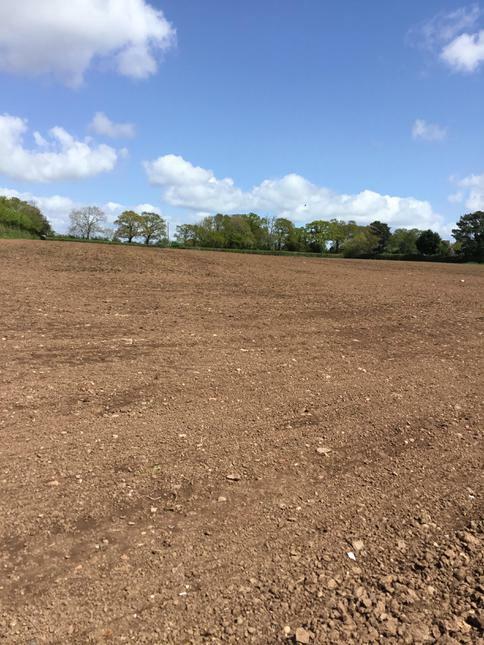 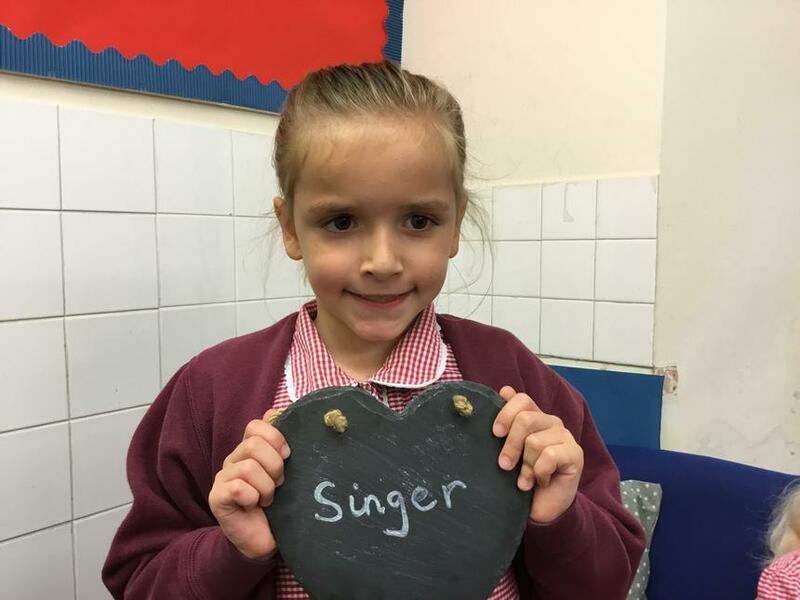 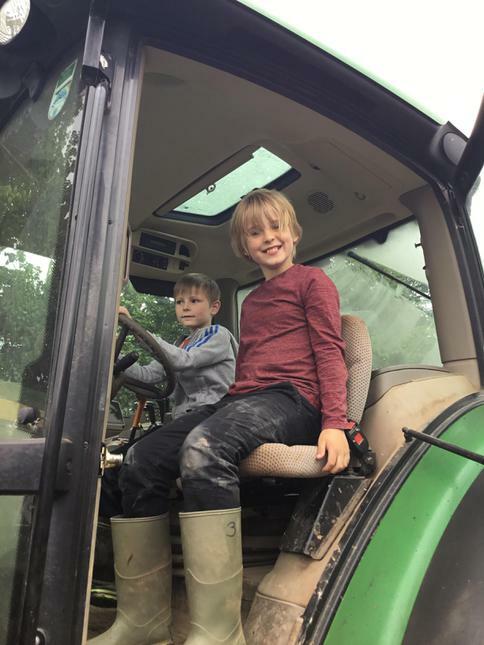 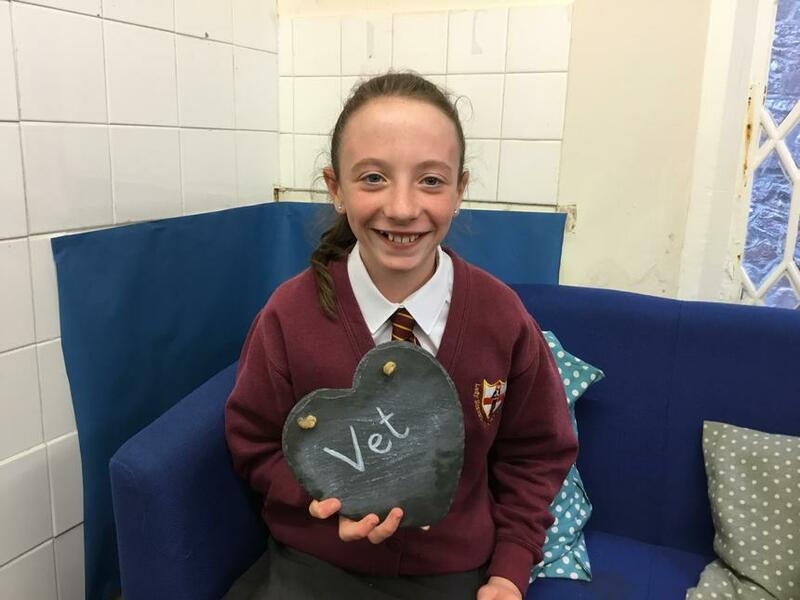 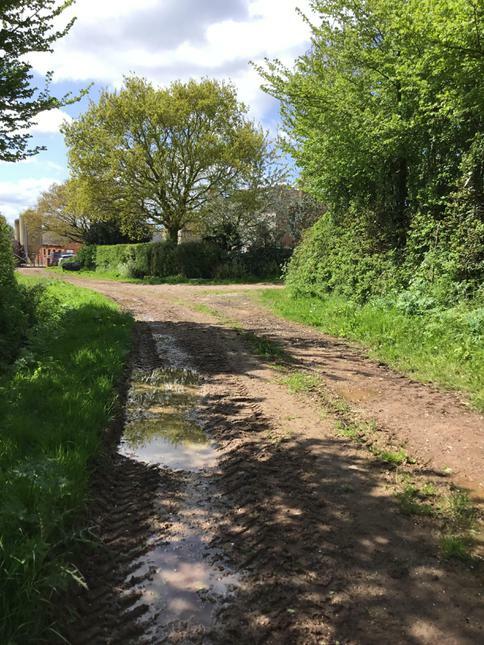 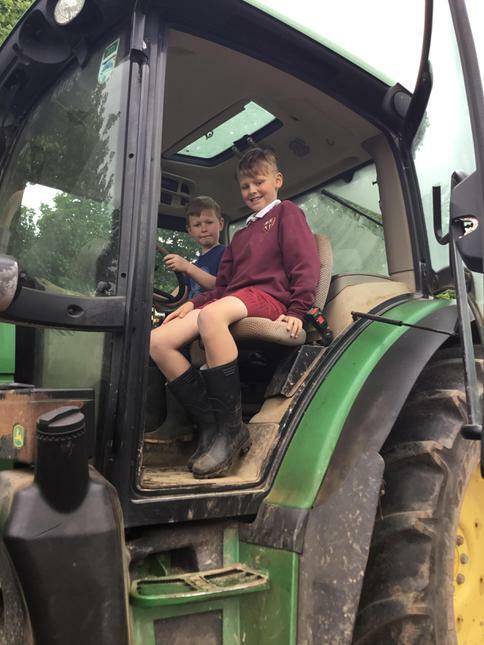 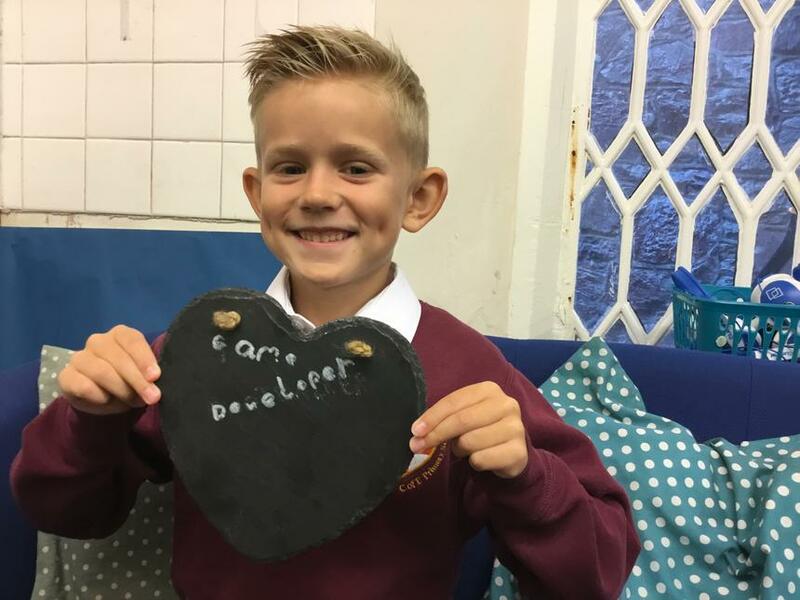 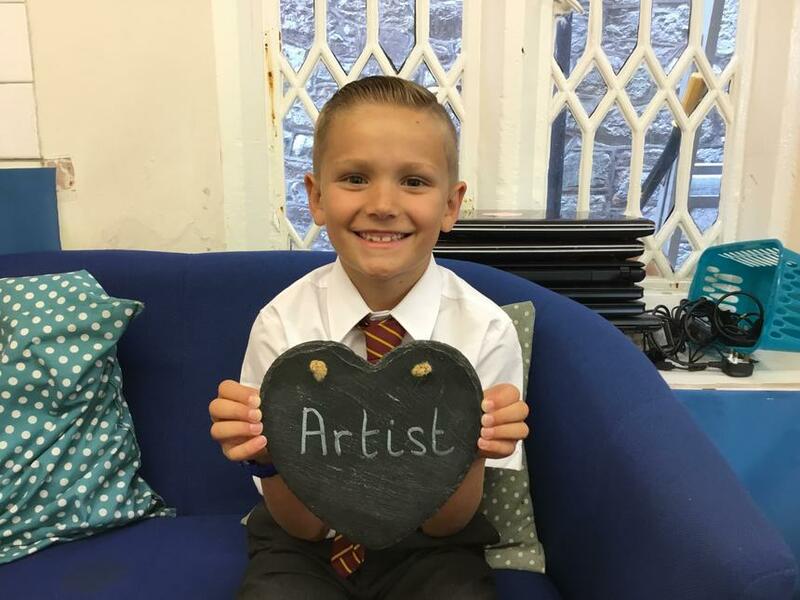 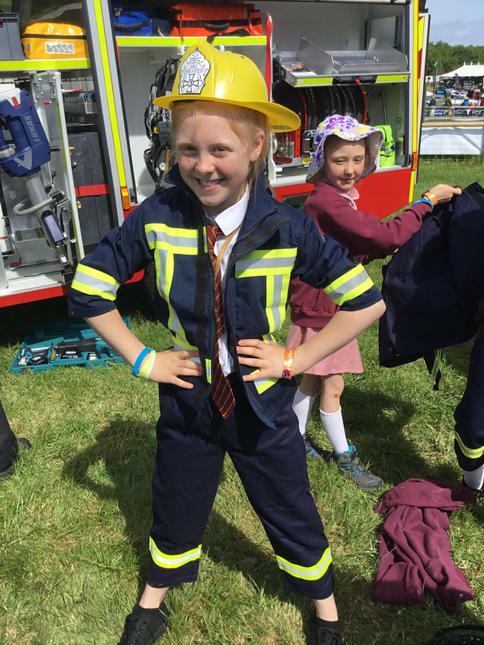 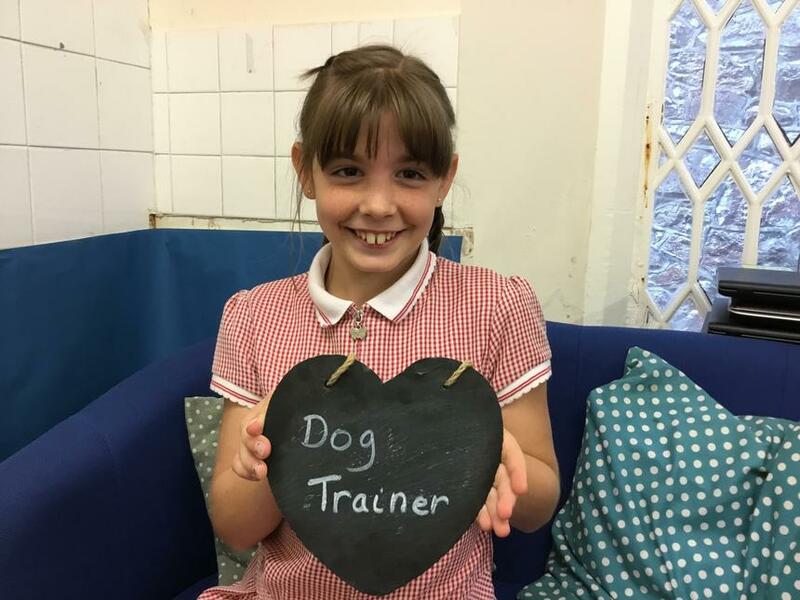 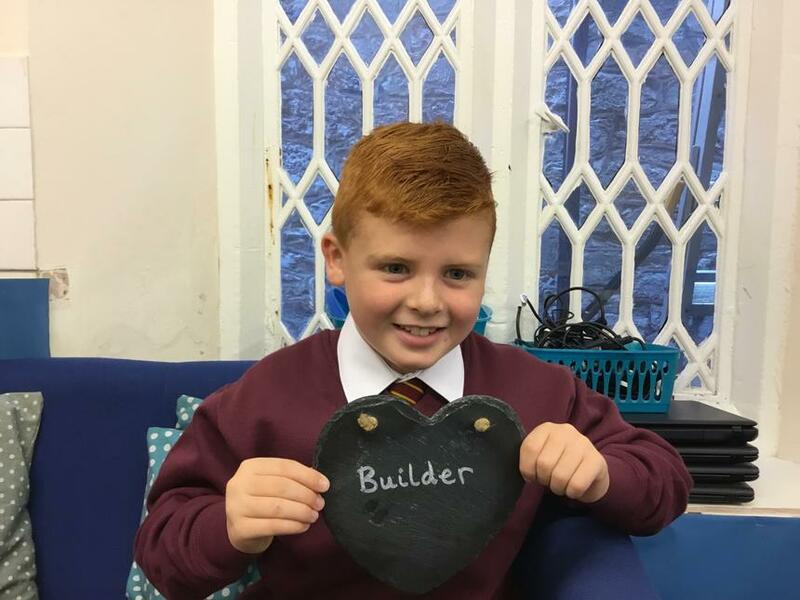 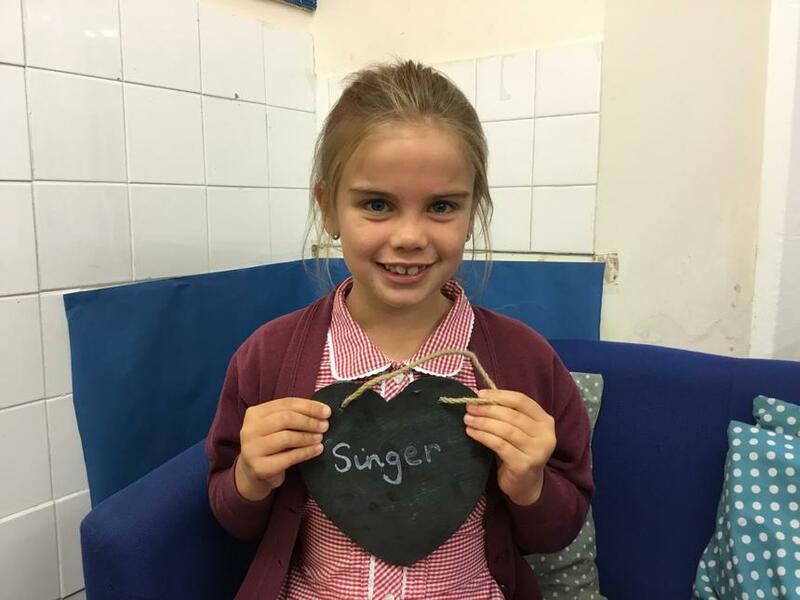 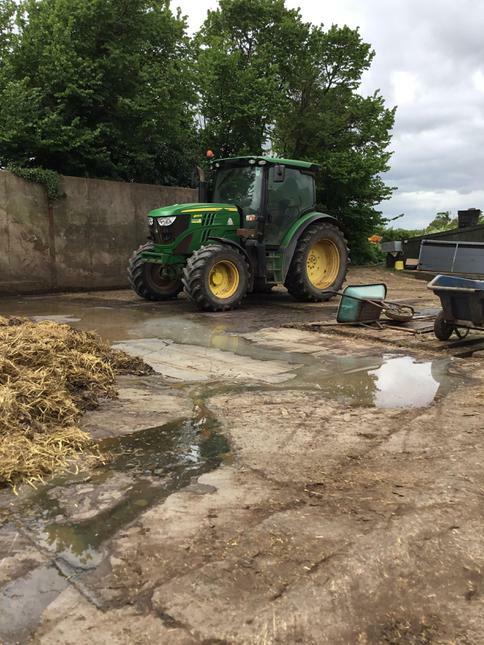 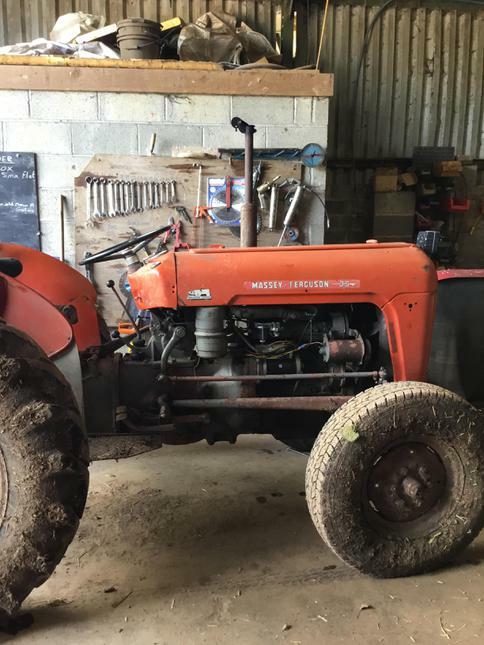 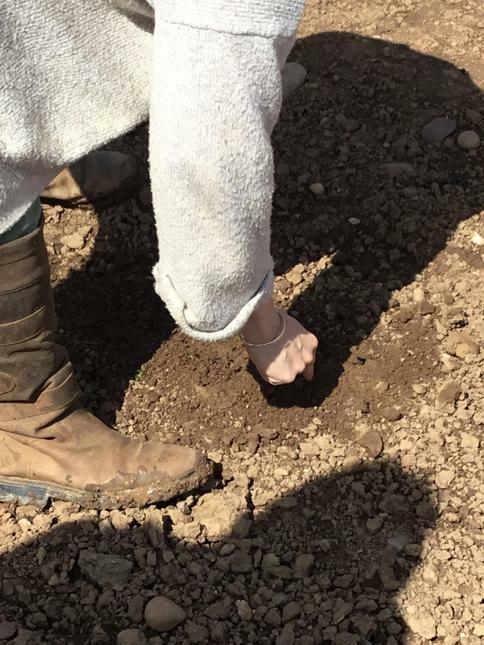 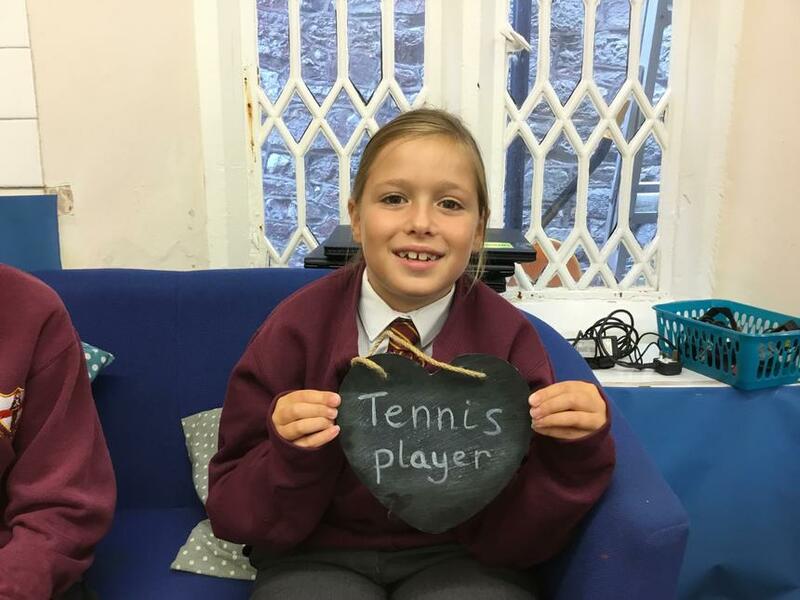 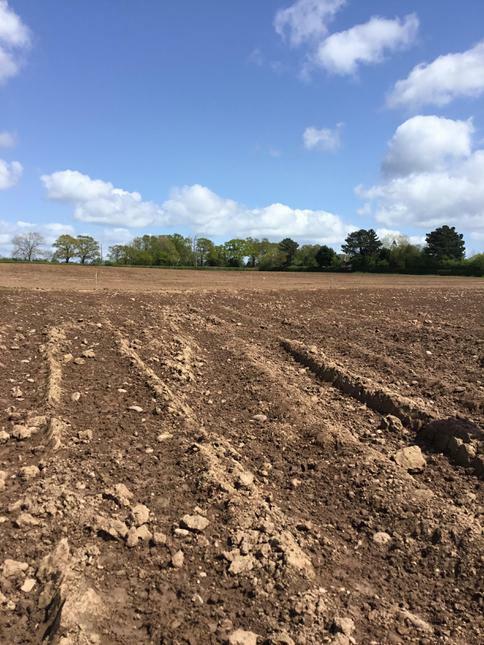 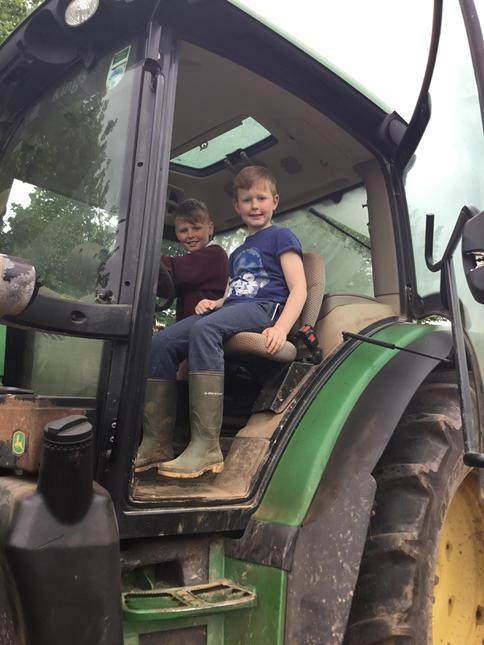 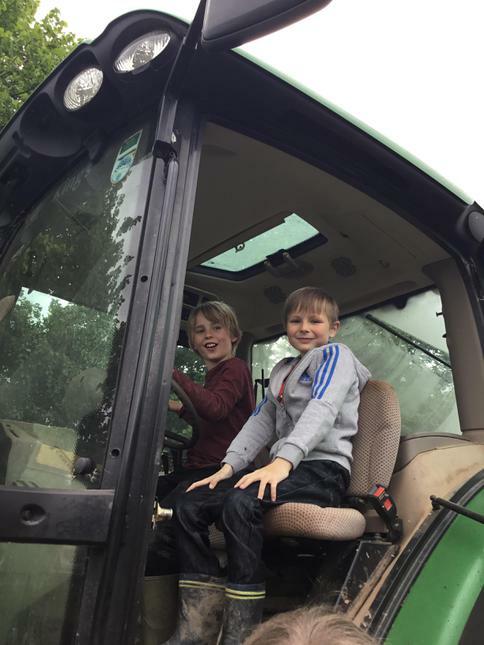 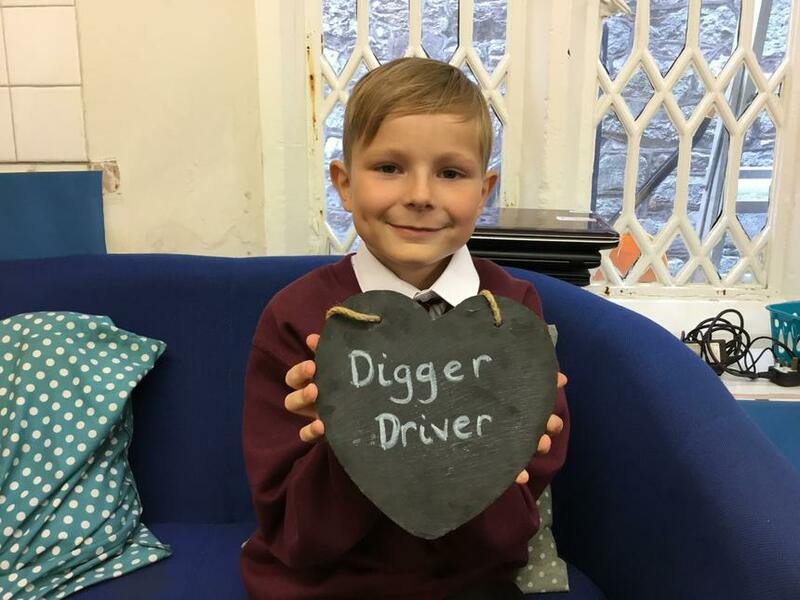 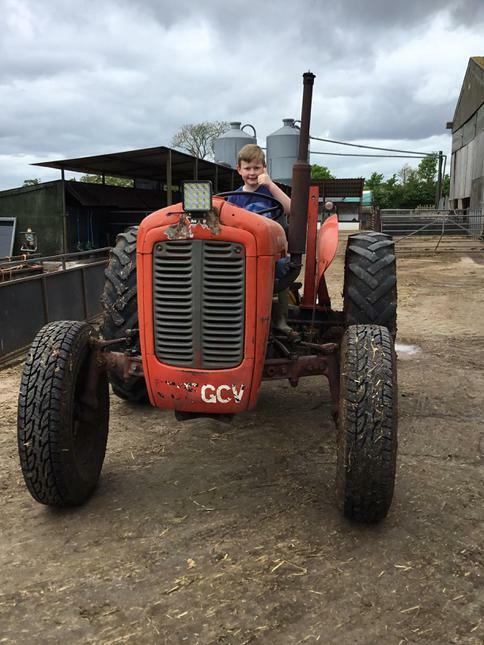 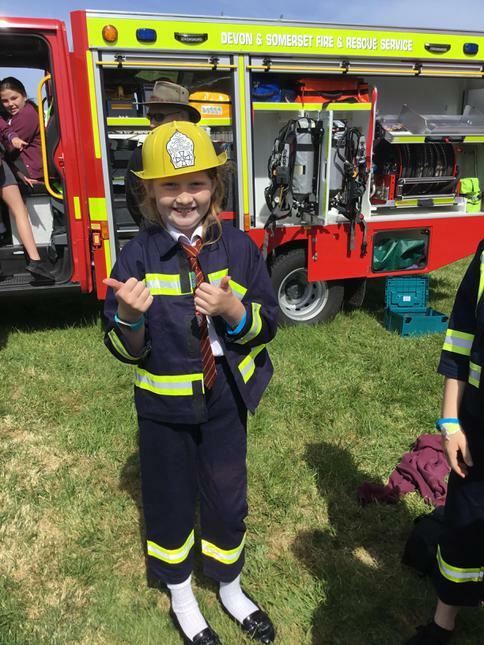 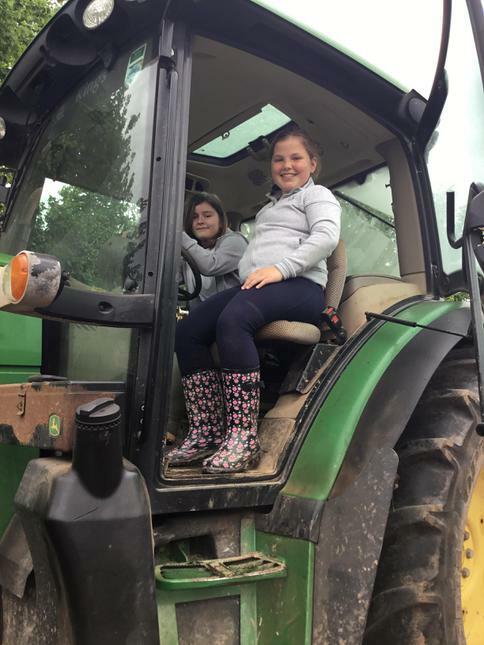 'I really want to work for Mantracourt when I am older, which will hopefully only be a couple of years from now, as long as I work hard in school!' 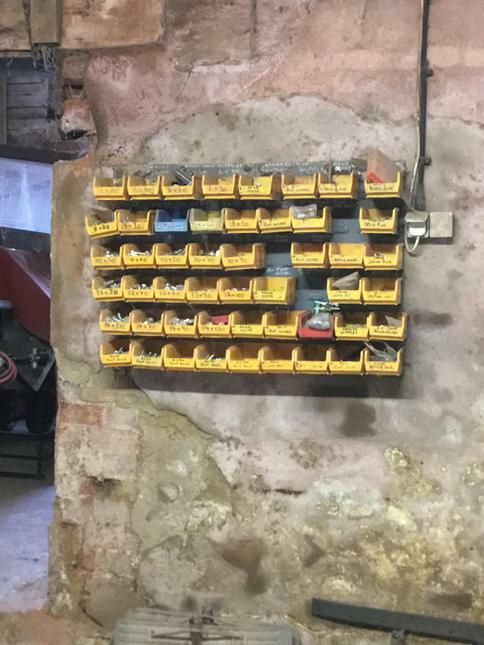 - Max. 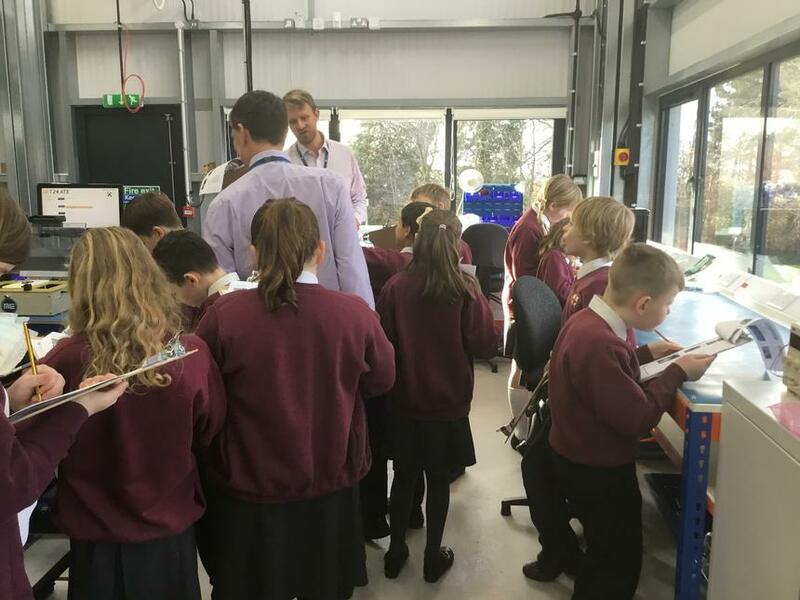 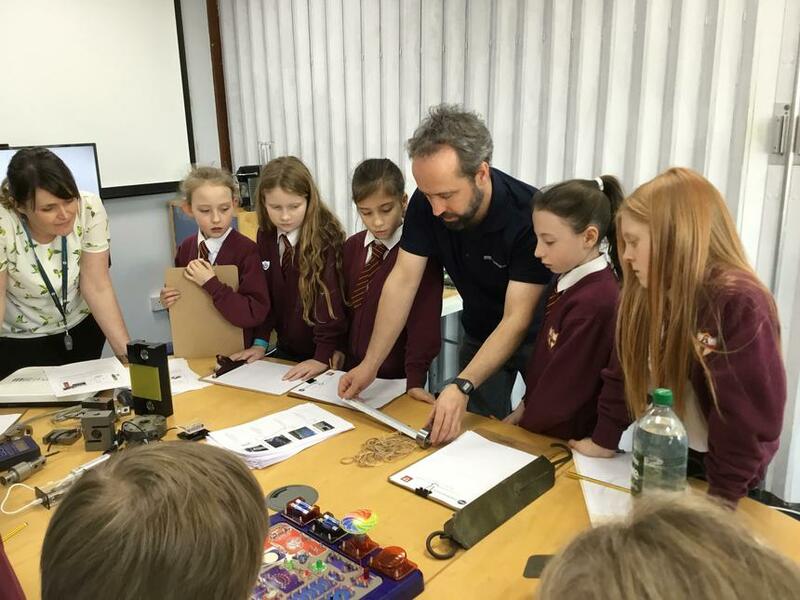 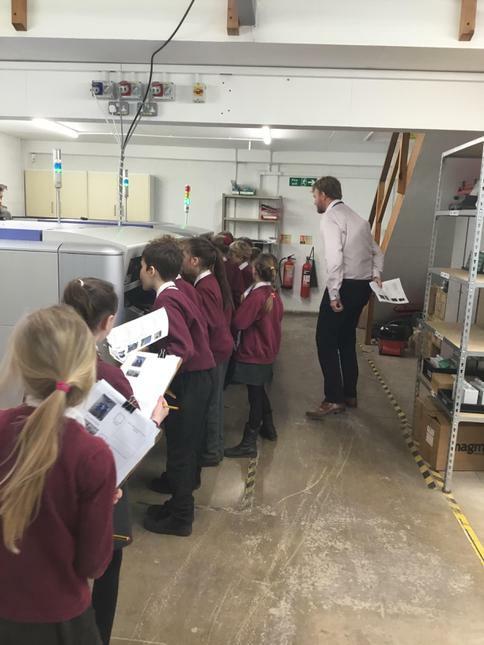 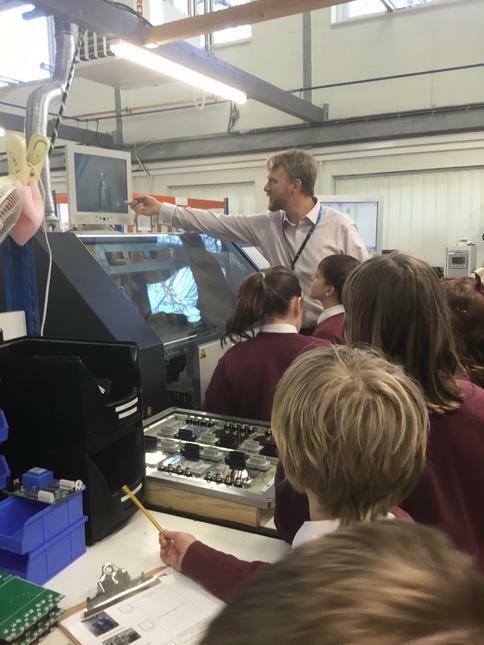 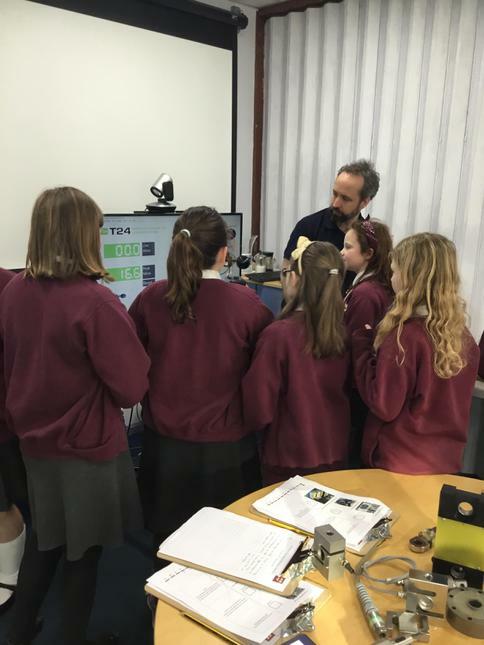 Class Trip to Mantracourt Electronics Ltd.
Mr Tomlinson also brought part of the 'Supercomputer' where the children studied the RAM memory of the device, the cost of this computer and how it was used in the Met Office. 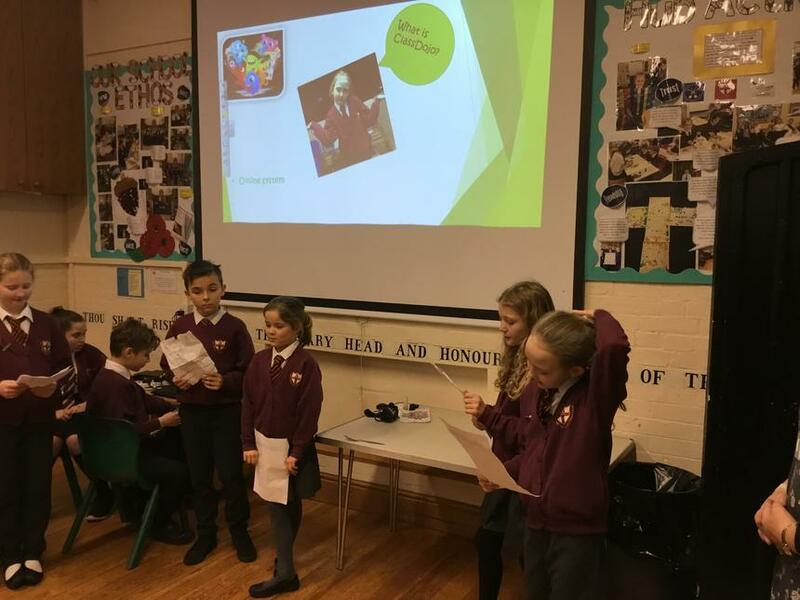 Finally, the children became weather forecasters, where they had to read and present the weather to the rest of the class, using the relevant terminology and actions as seen by real reporters. 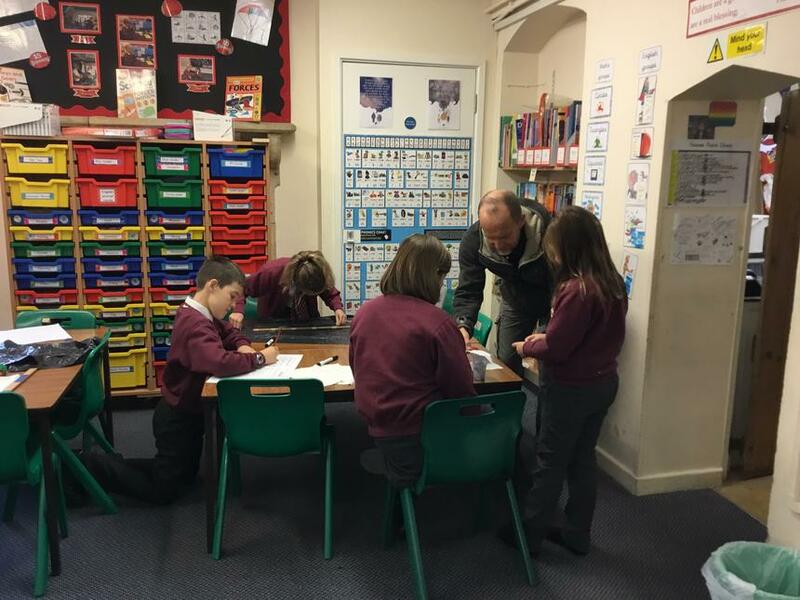 A huge thank you to Mr Tomlinson for giving up his time and for sharing such interesting information with the children as part of our Extreme Earth topic. 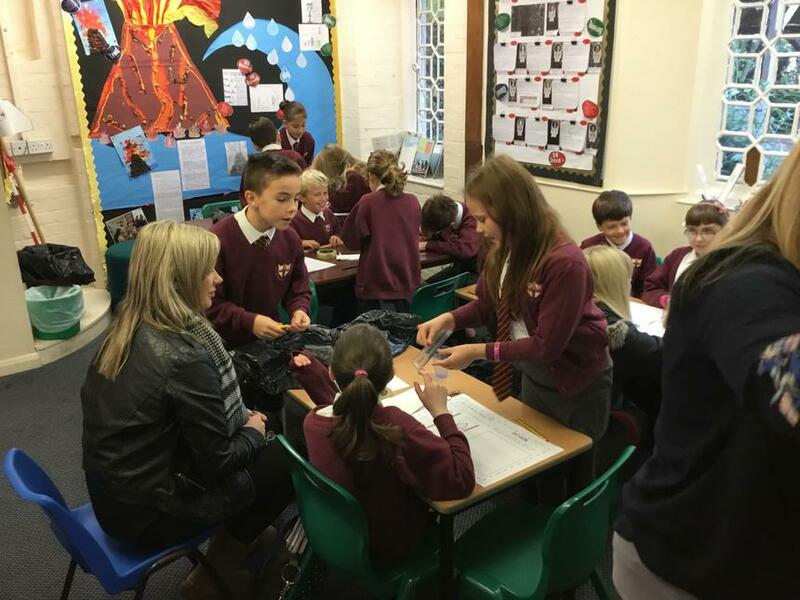 Thank you to the parents who came to our open morning on Friday the 3rd November. 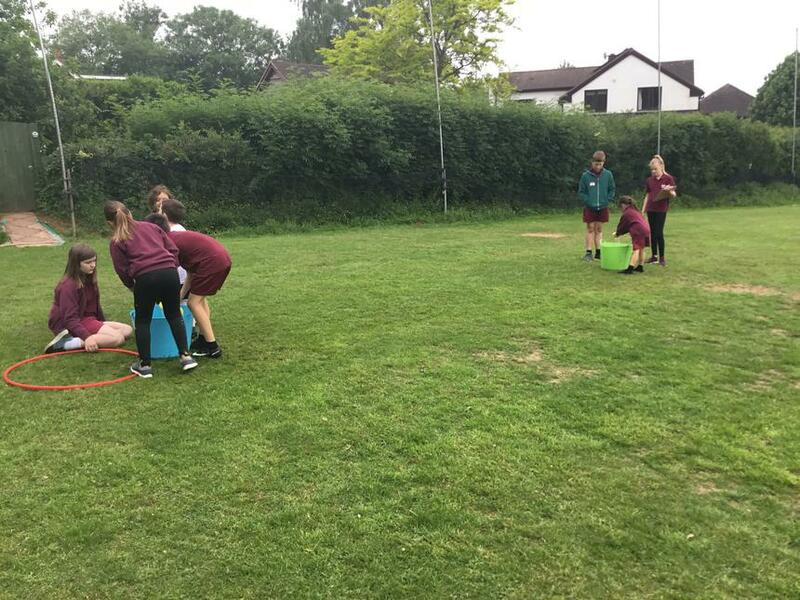 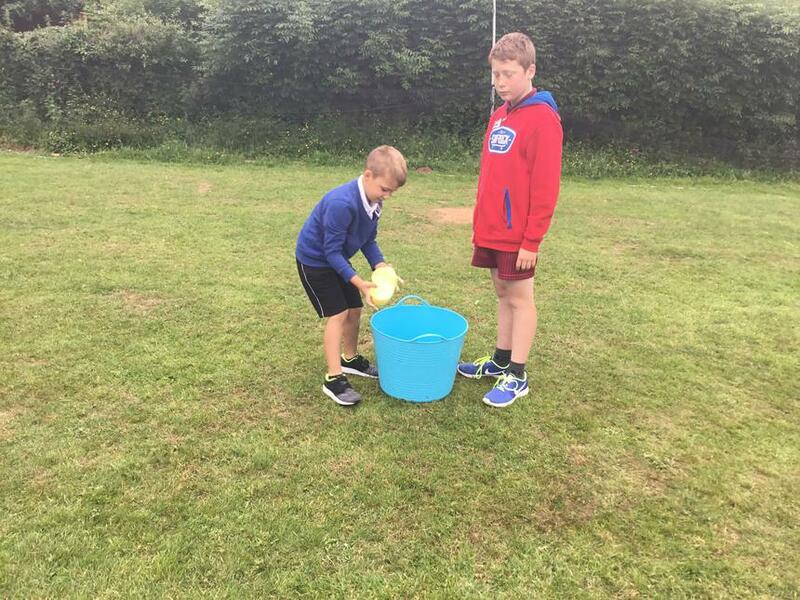 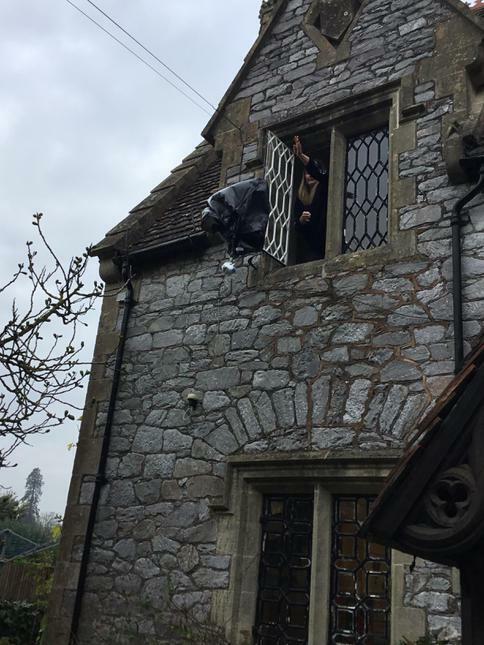 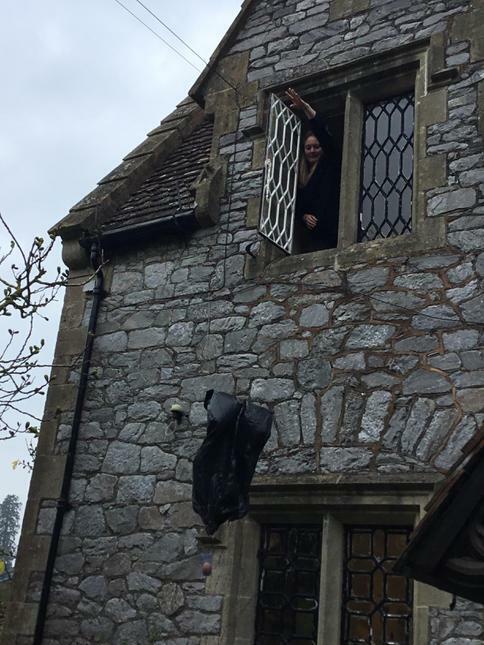 The children were given the challenge to safely land an egg out of the staff room window using a bin liner, string, sticky tape and a plastic cup. 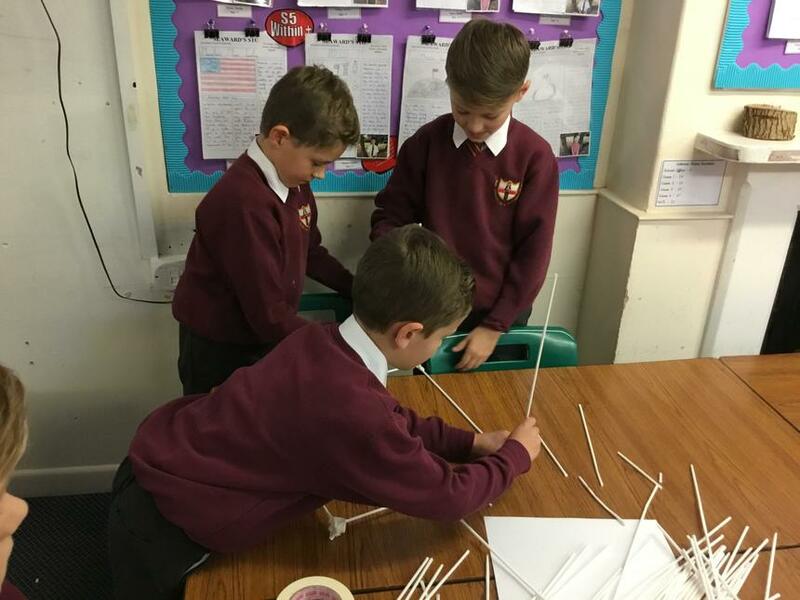 Using their knowledge and expertise about the forces of gravity and air resistance they began designing their parachute. 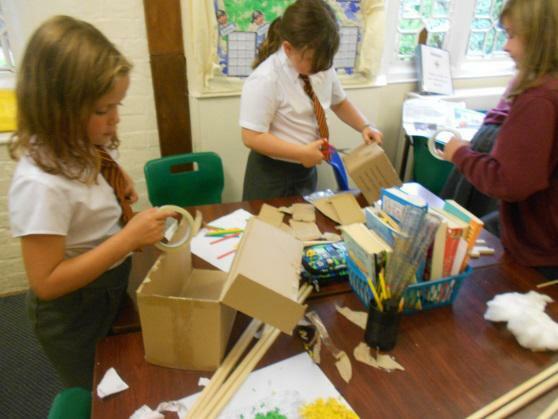 Half an hour later, the parachutes were launched out of the window and tested.... 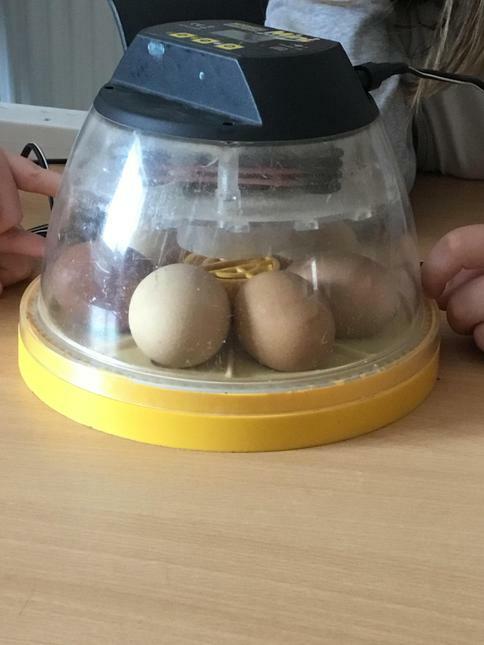 They were a great success and lots of eggs survived! 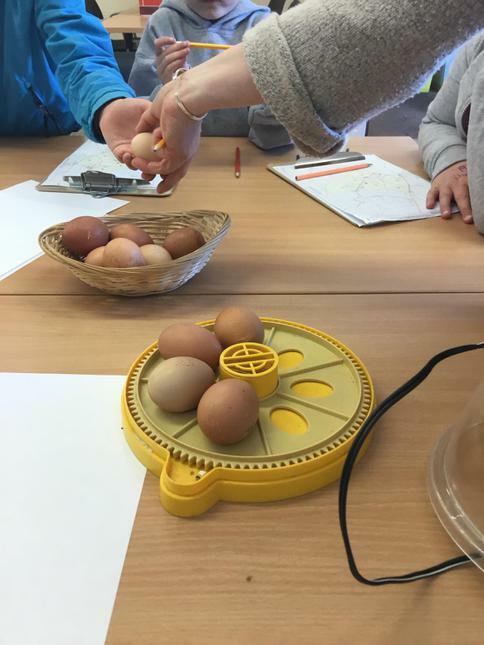 EGGcellent! 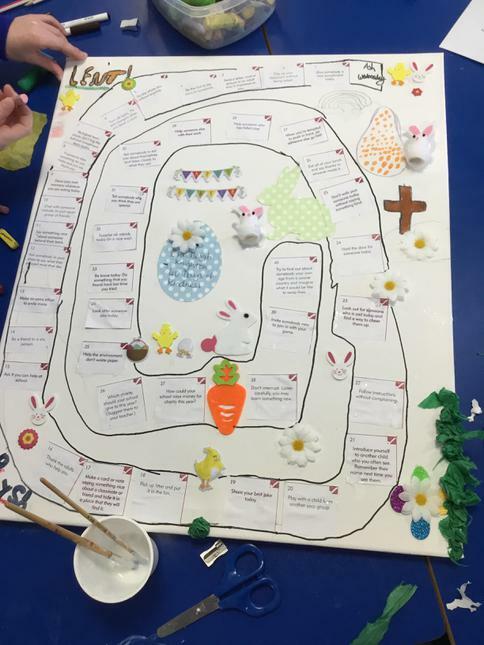 The children and parents thoroughly enjoyed this mission! 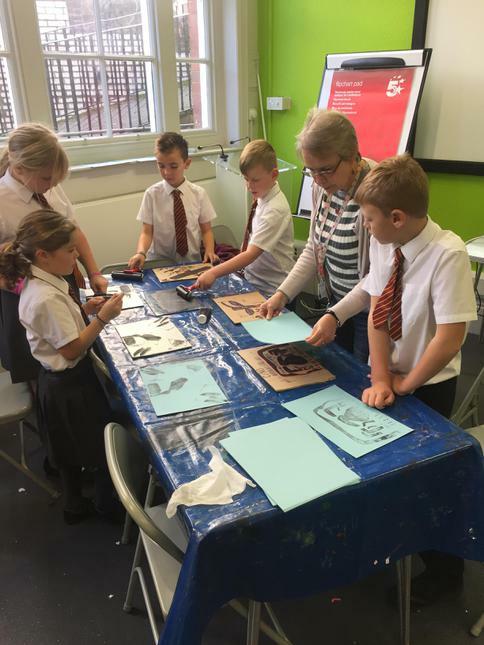 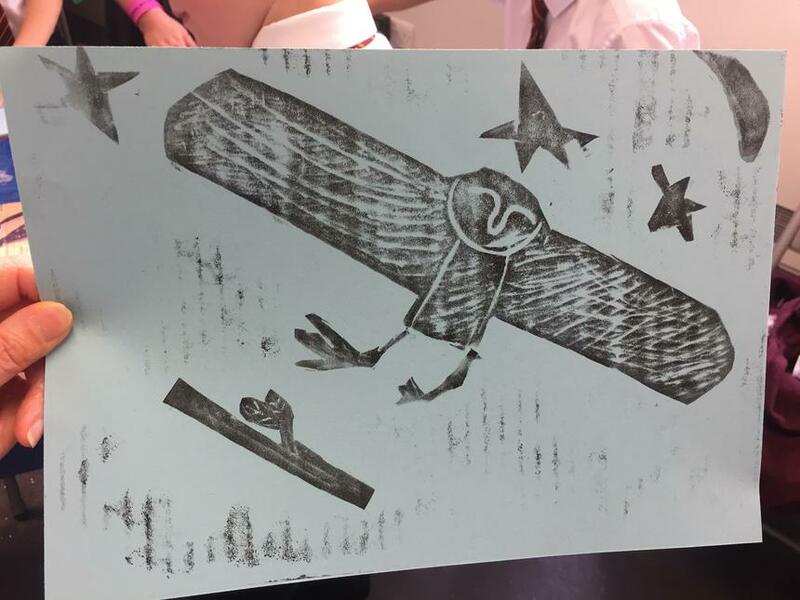 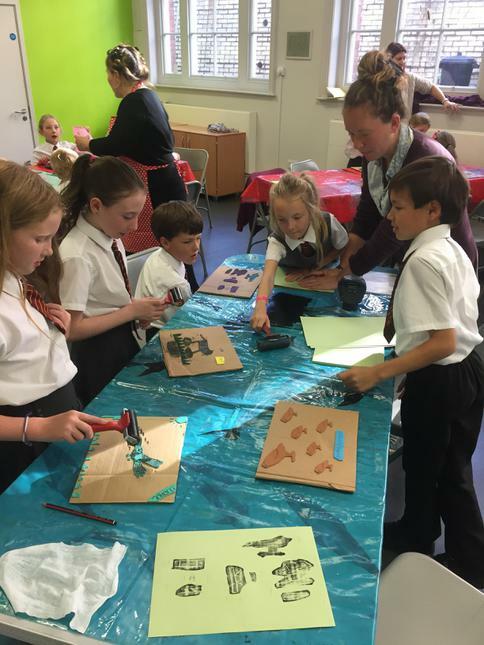 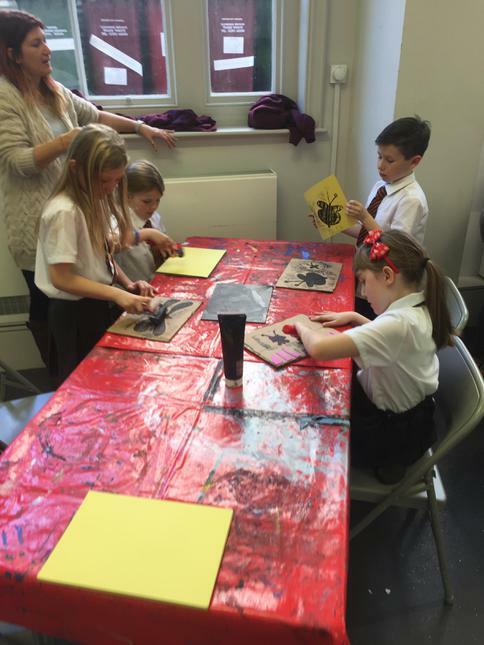 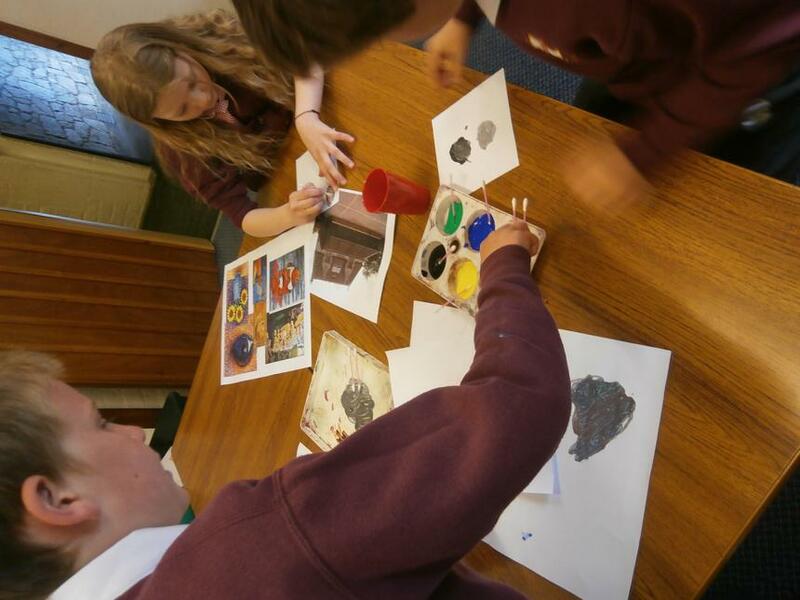 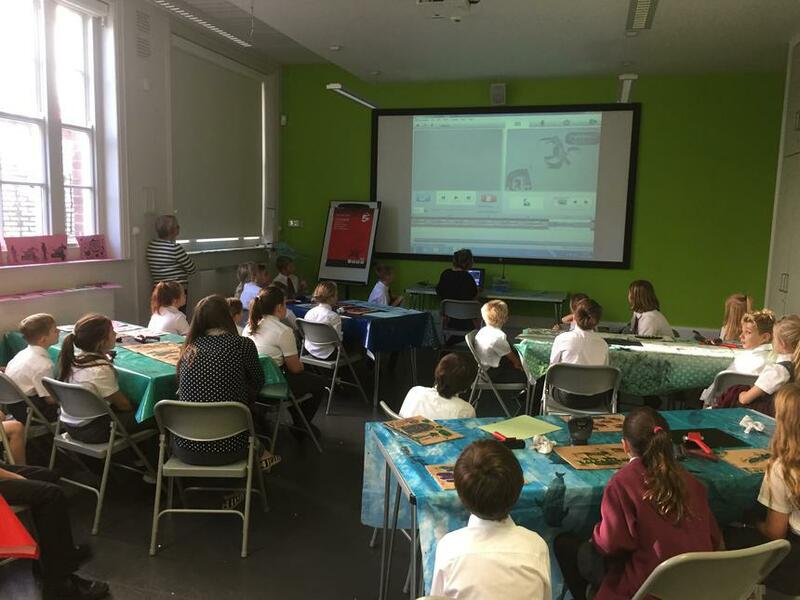 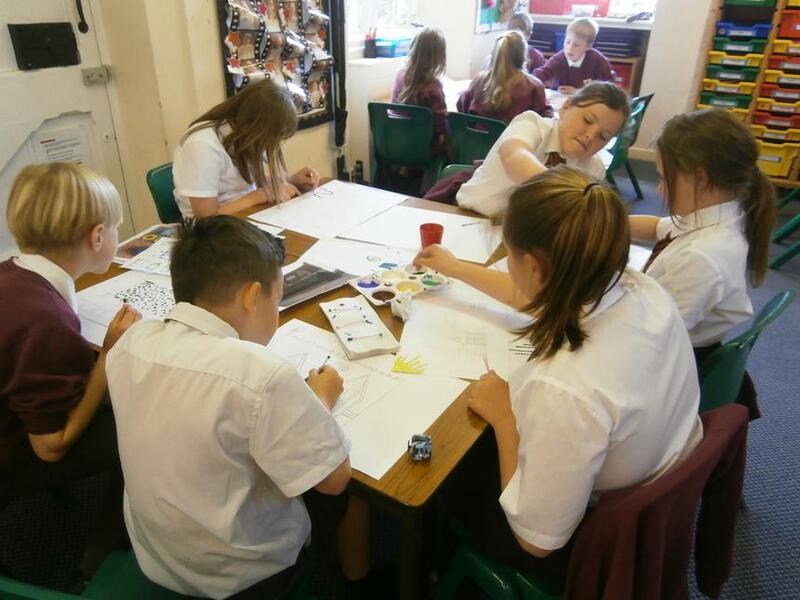 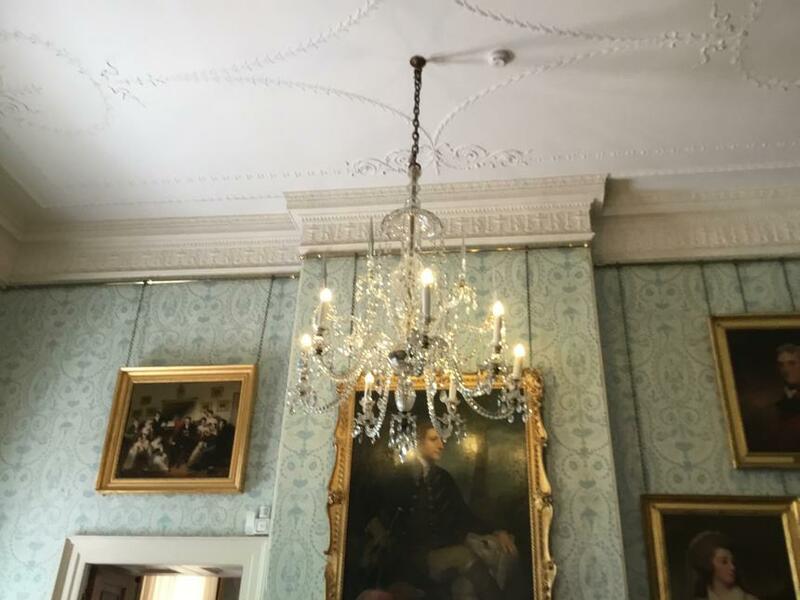 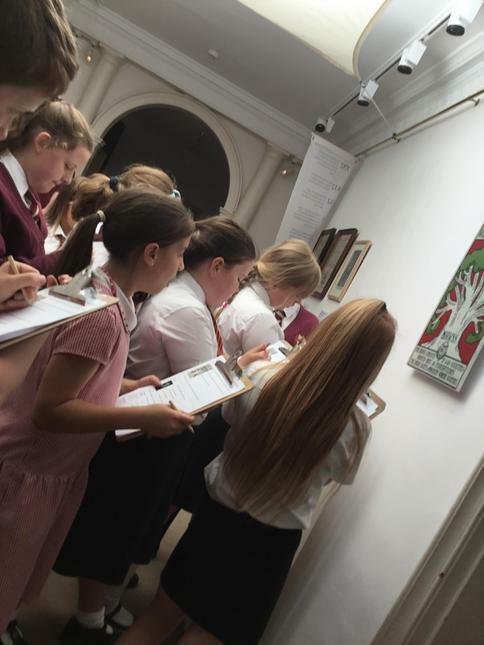 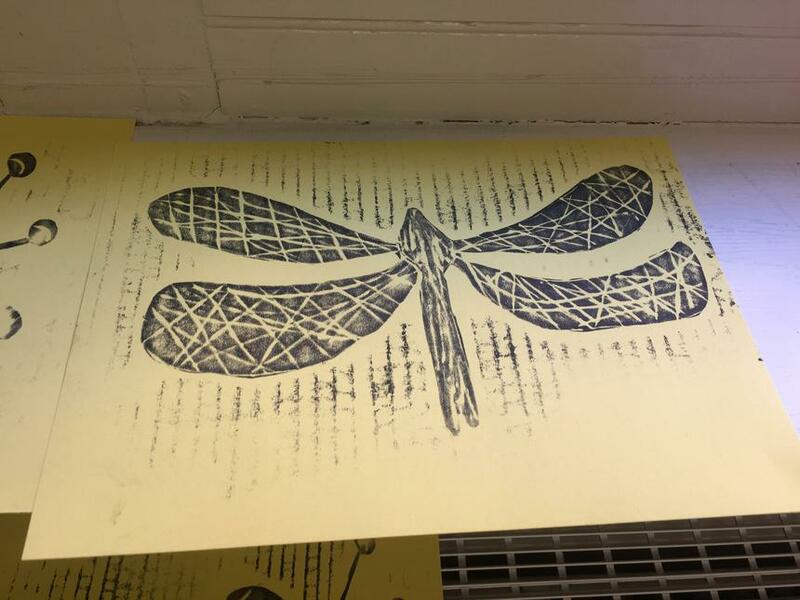 We were invited to Exeter Ramm Museum to take part in an art workshop. 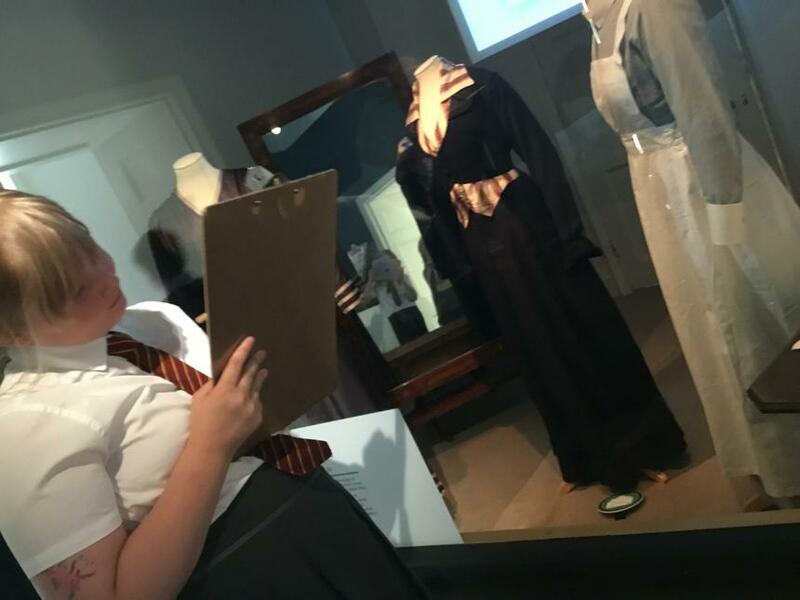 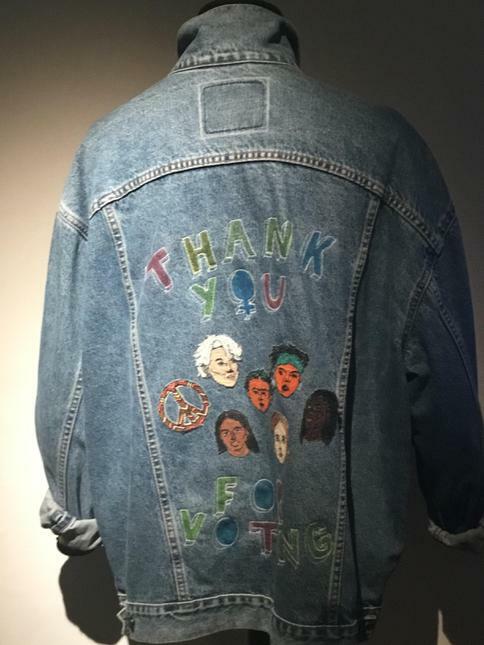 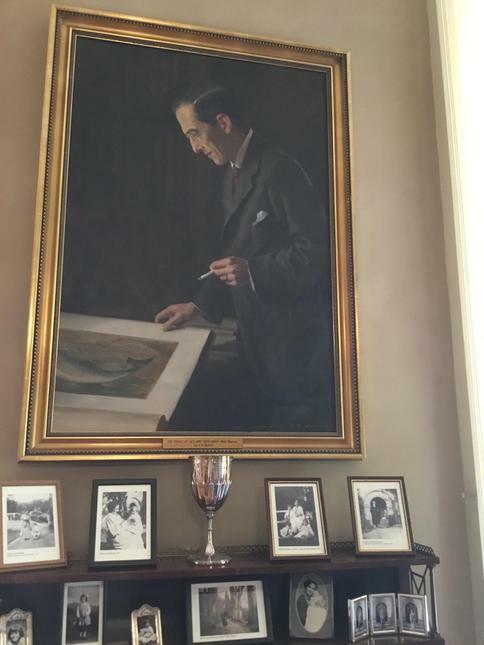 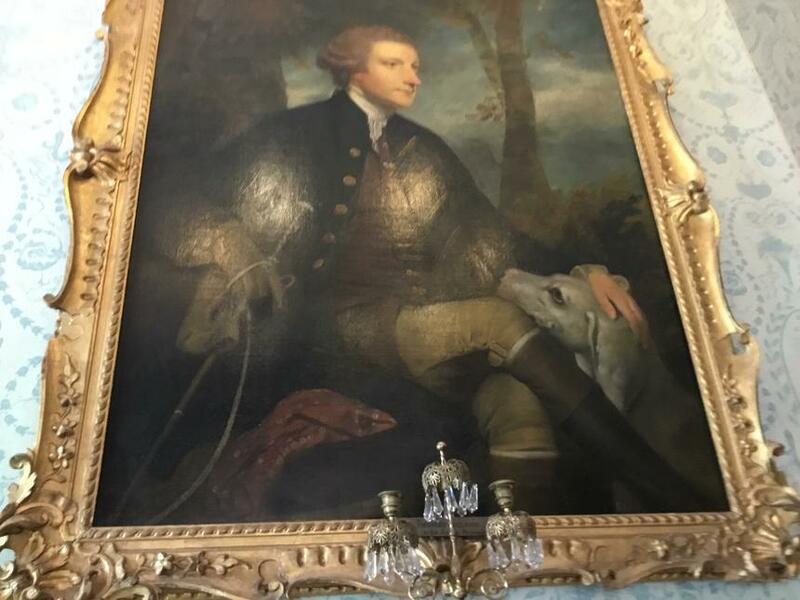 We had the opportunity to look around the museum for inspiration. 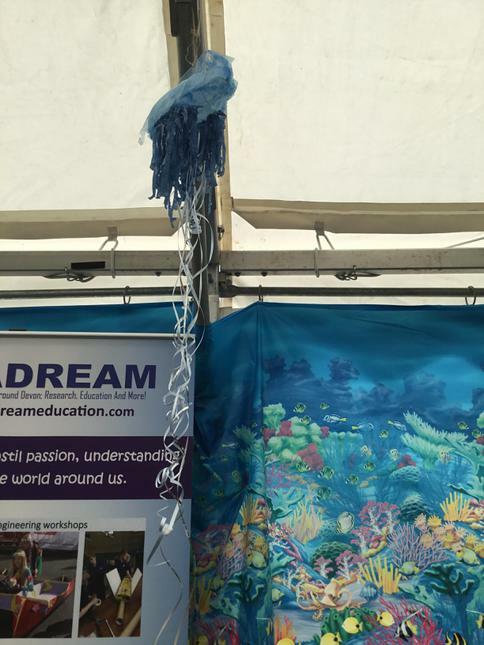 Once we had decided our focus (mine was a jelly fish) we then created a stencil out of foam. 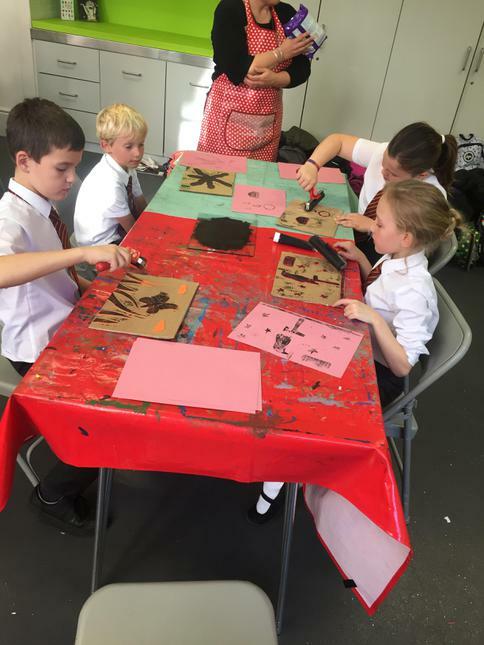 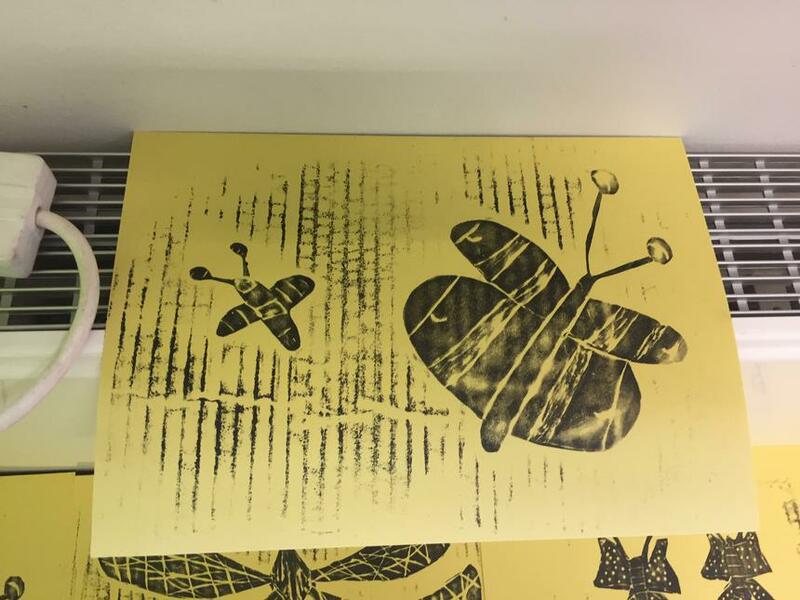 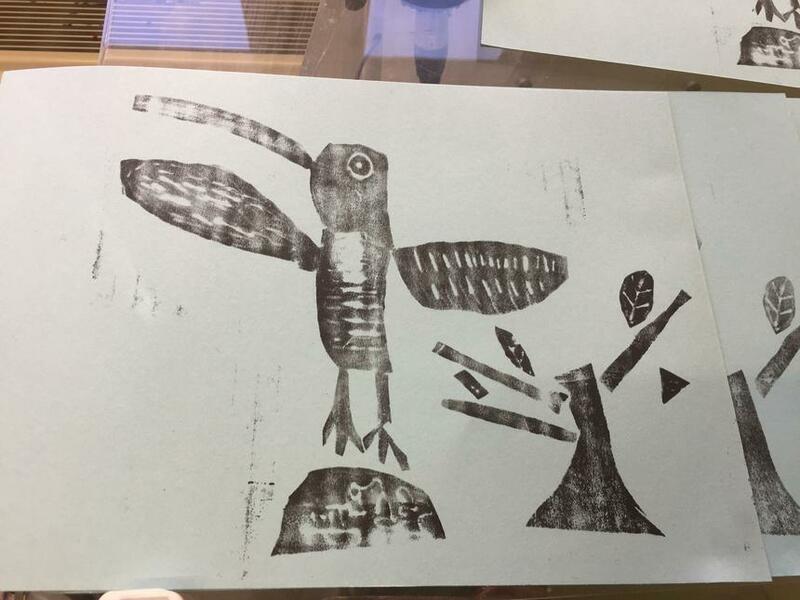 With our stencils we then made prints which were inputted onto a computer to make an animation. 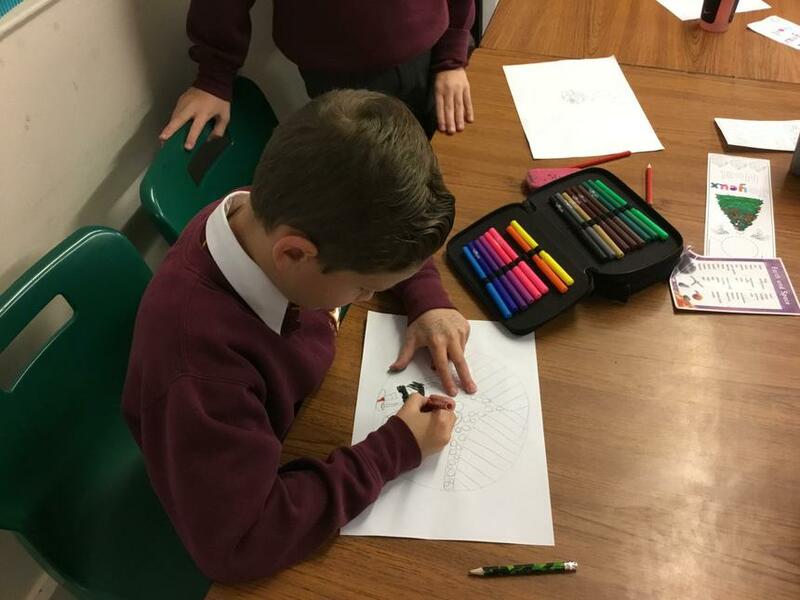 Watch this space, the animation is coming soon! 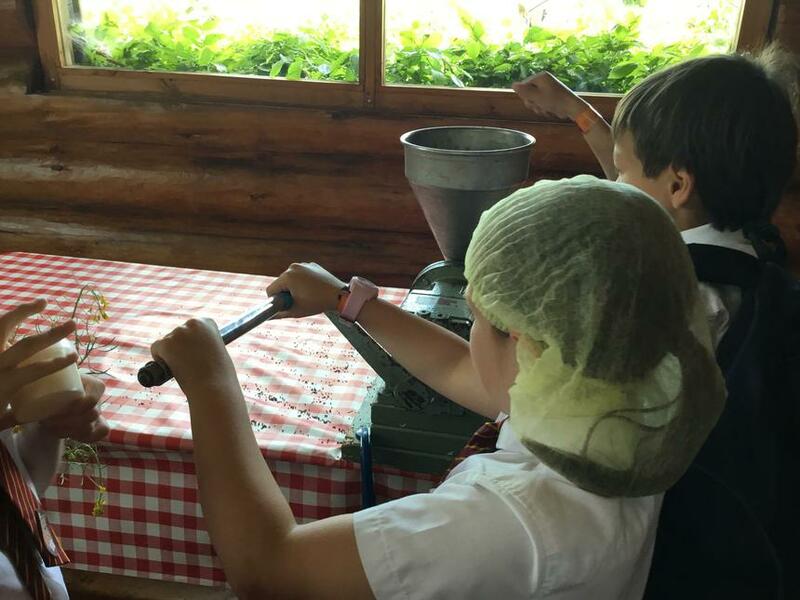 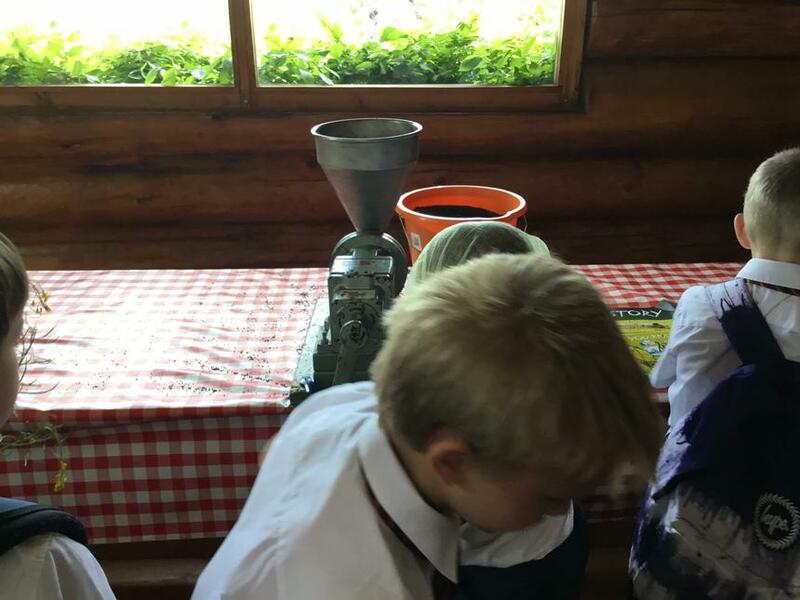 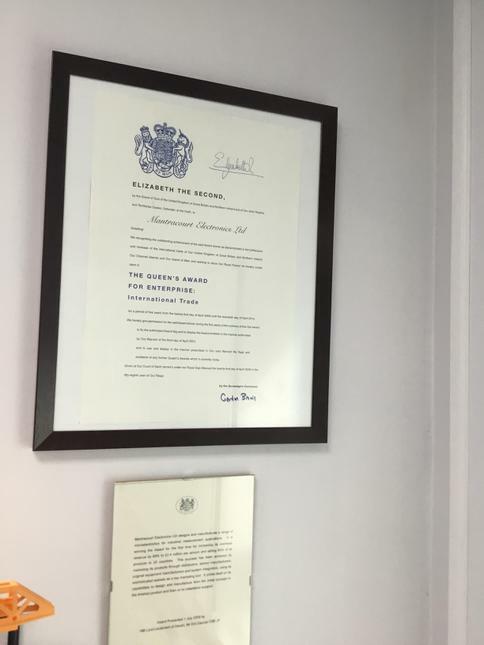 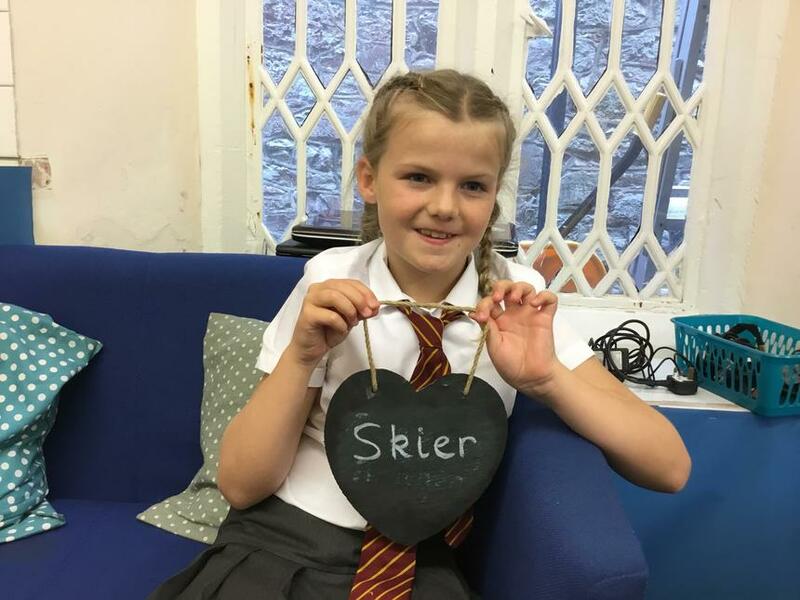 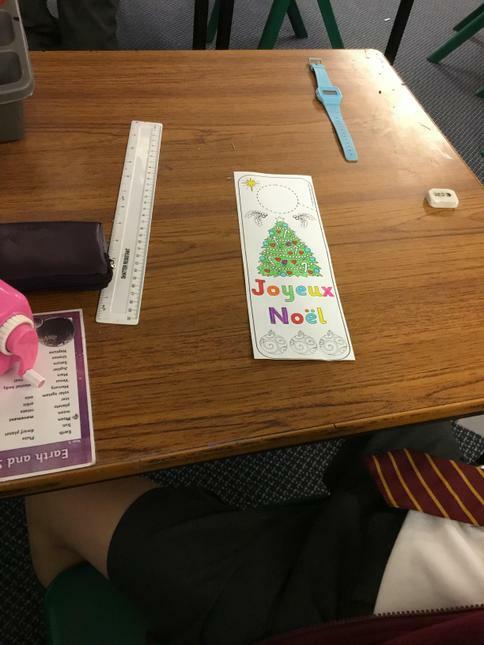 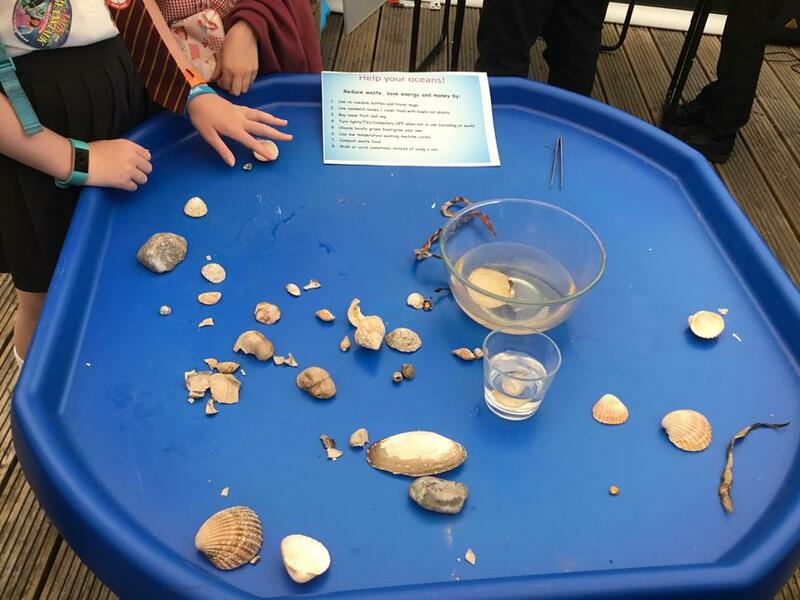 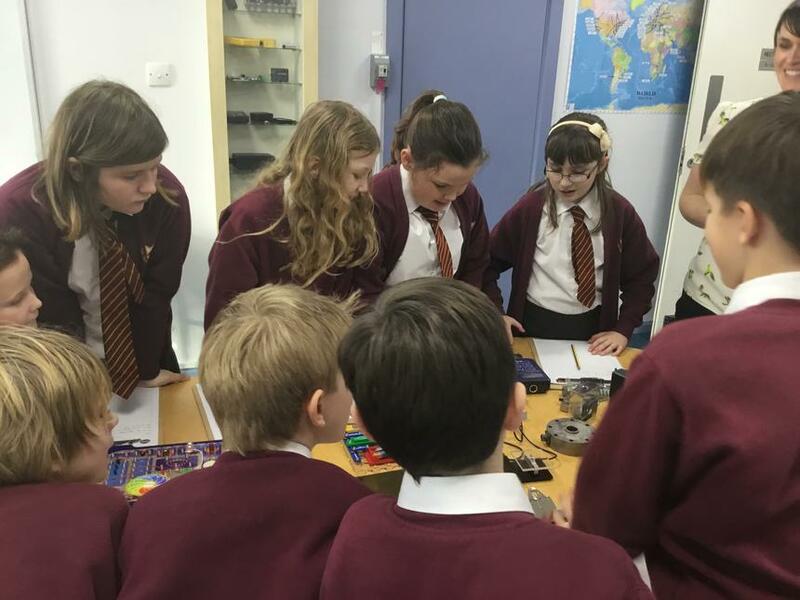 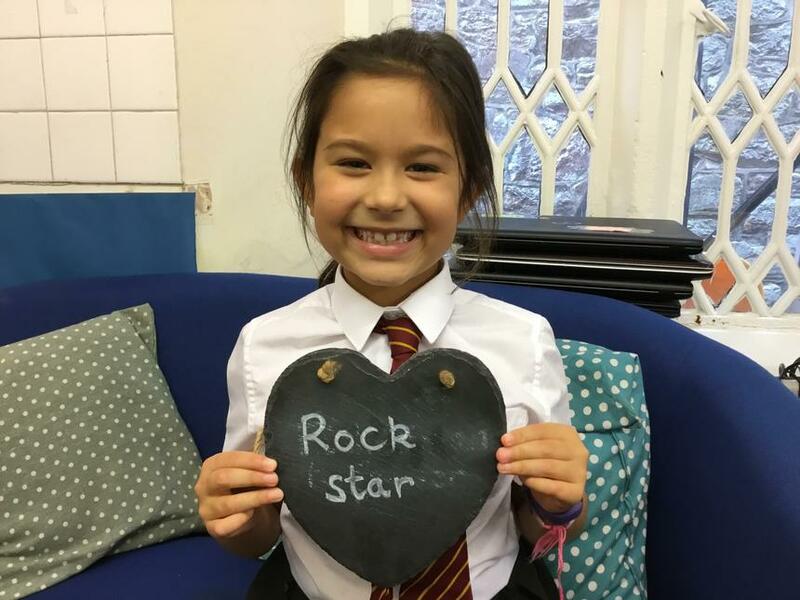 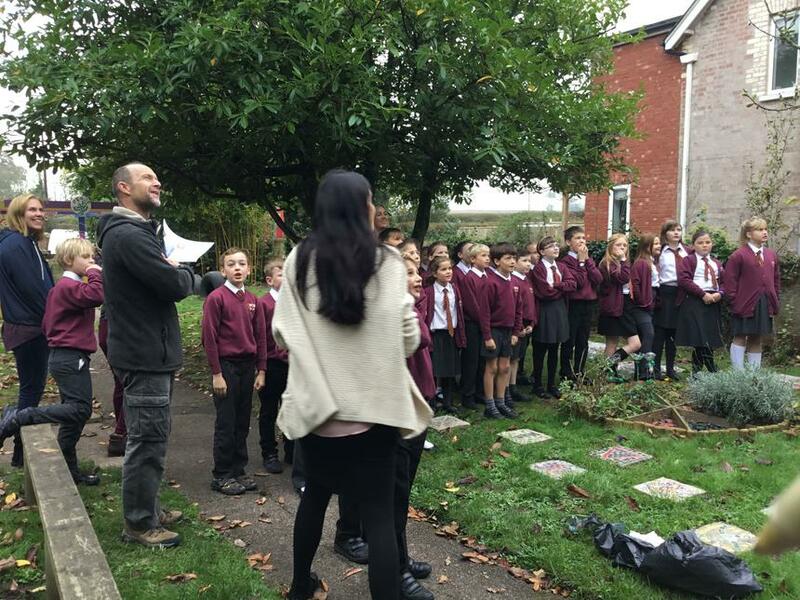 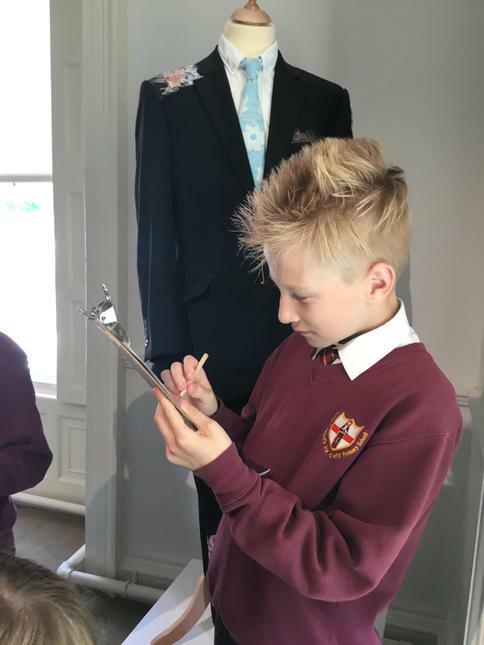 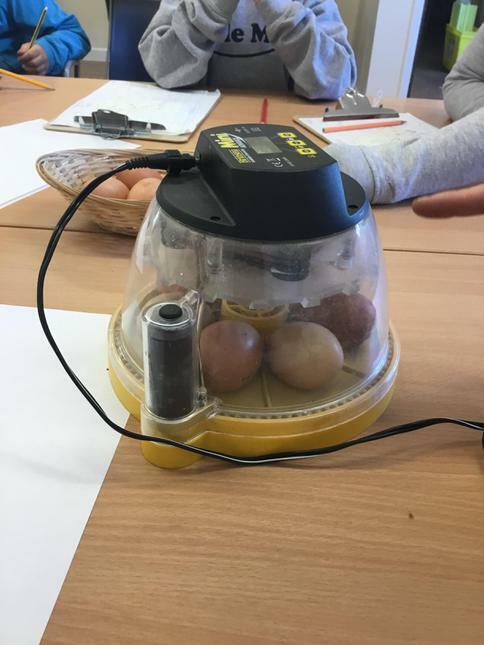 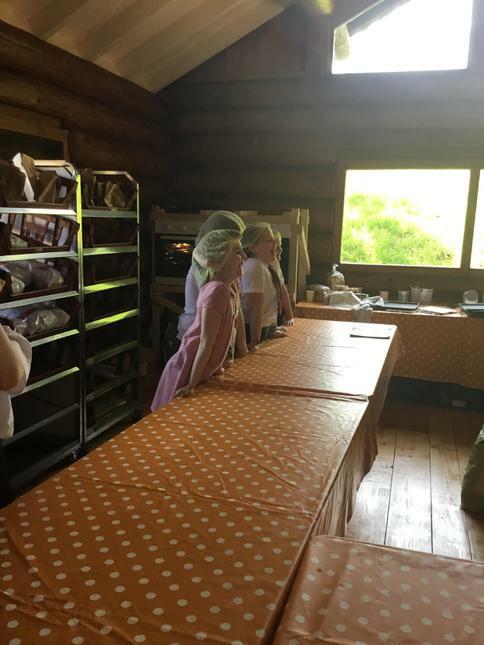 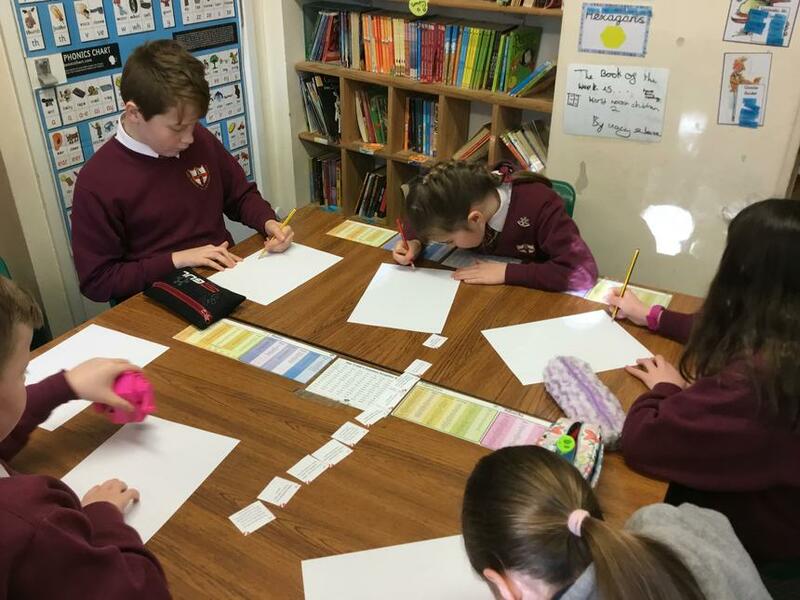 From this visit, the children have completed some cross curricular learning activities where they have written up their experience from the day. 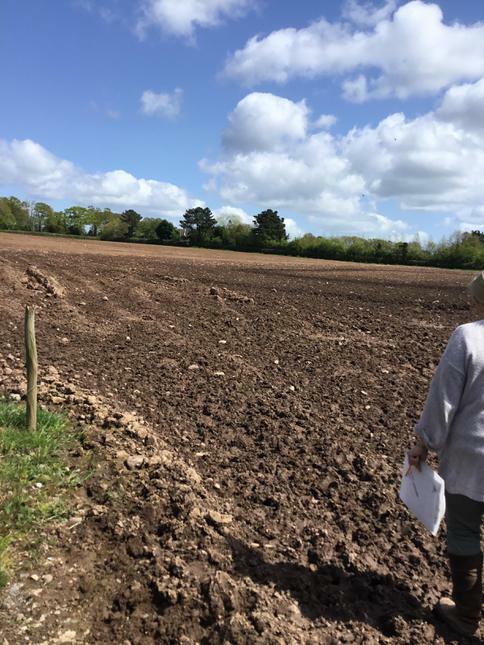 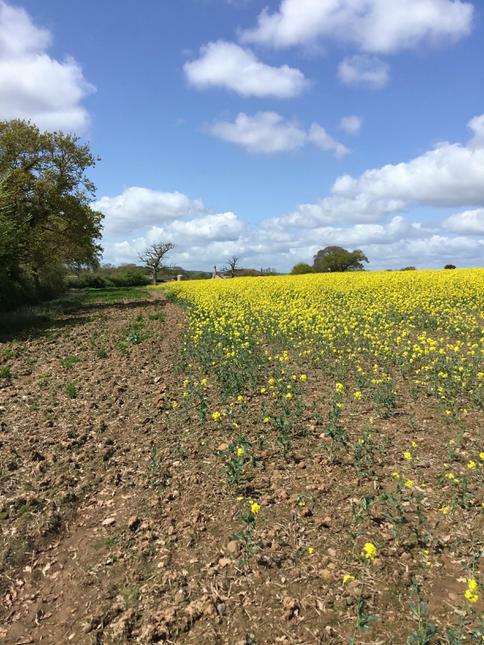 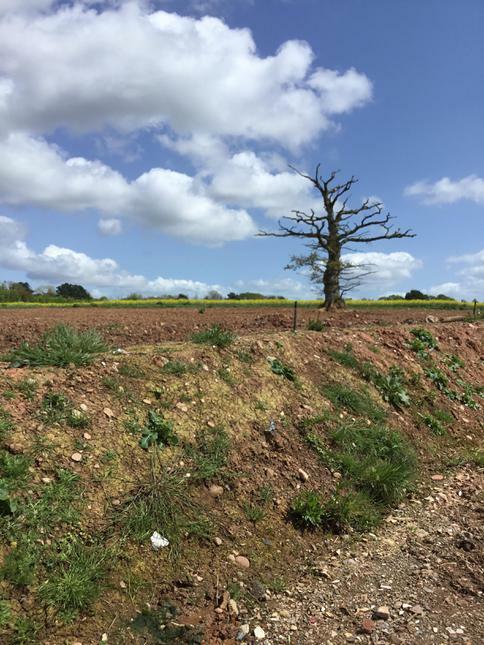 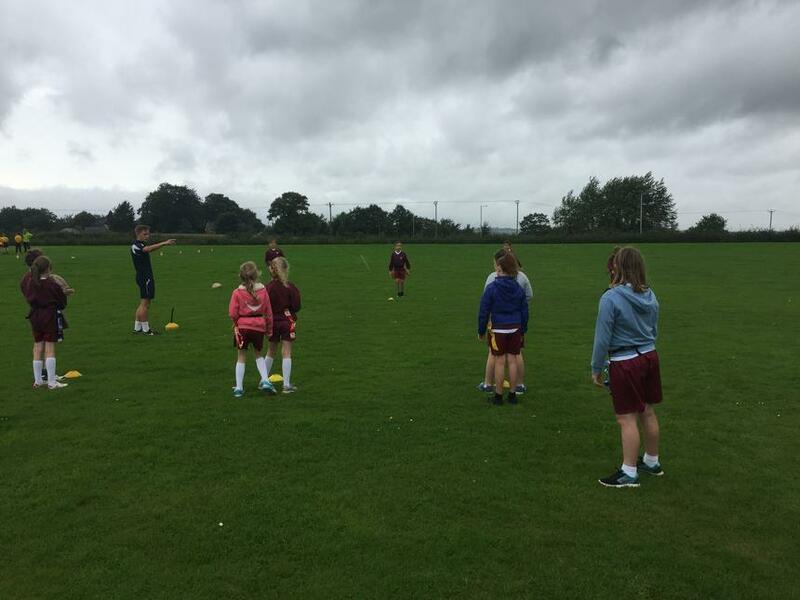 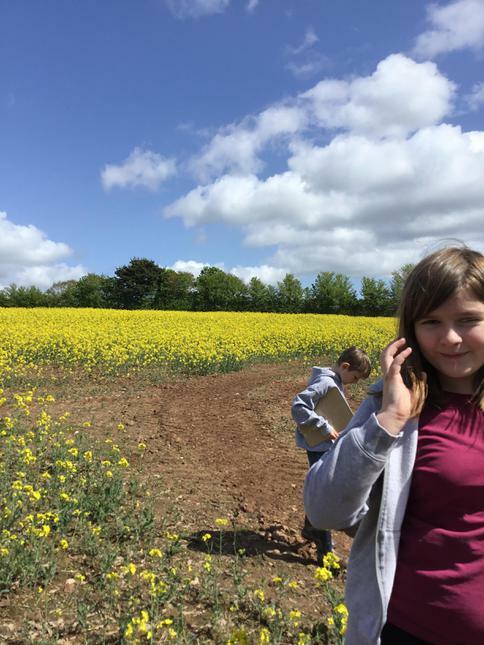 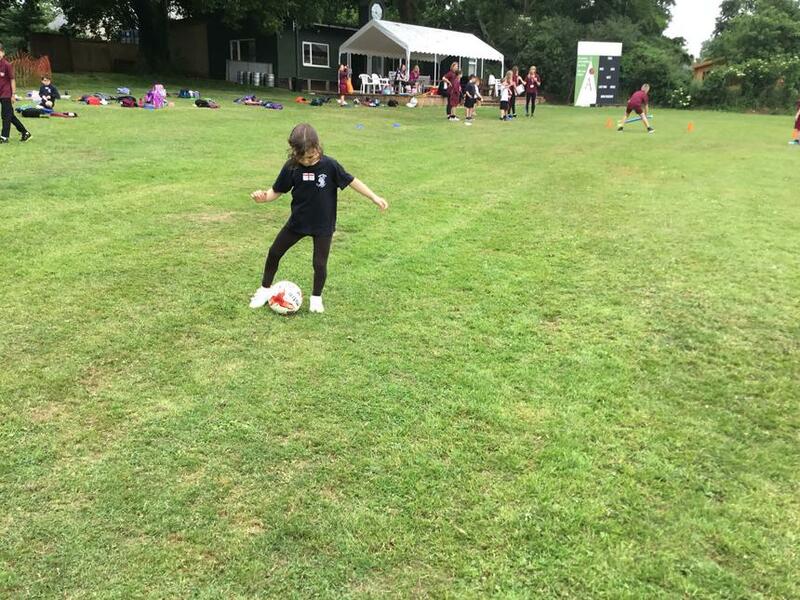 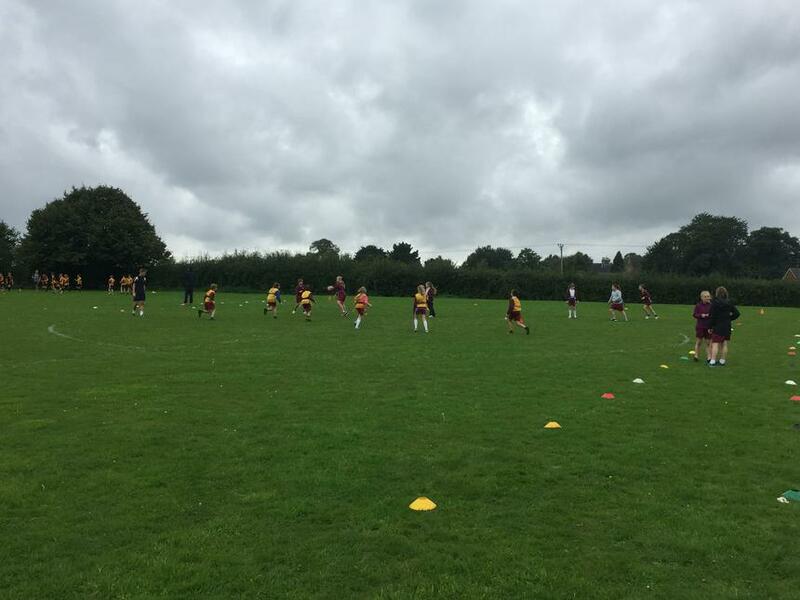 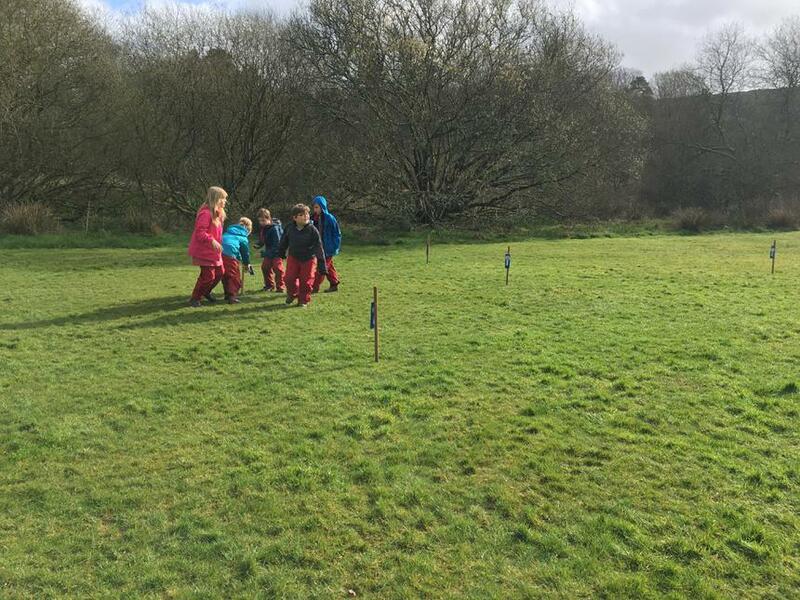 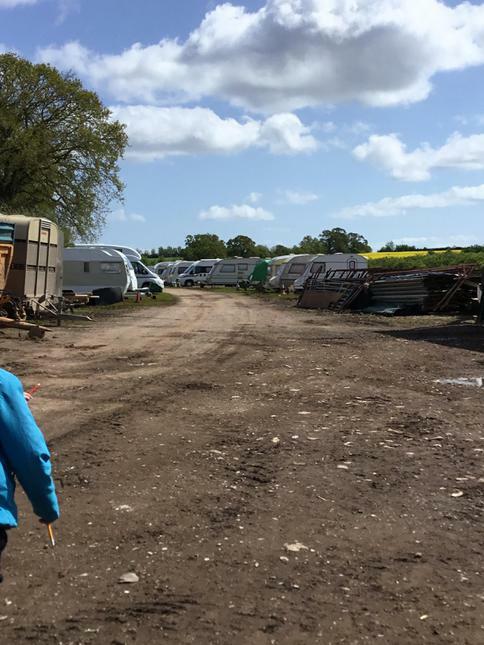 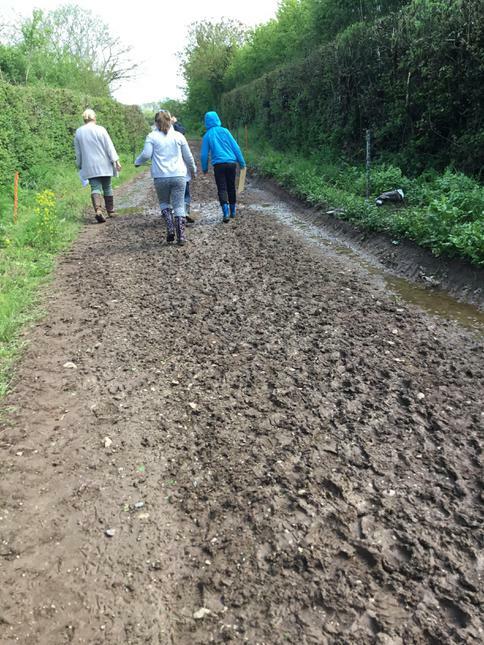 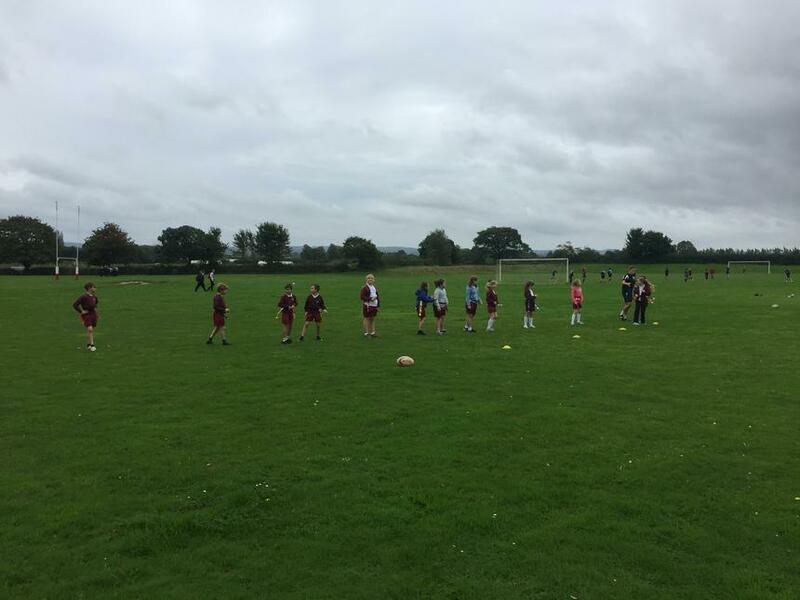 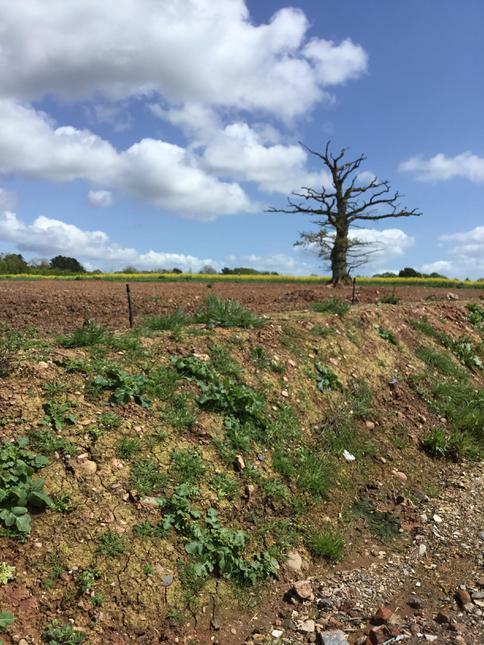 We took a coach to Clyst Vale and when we arrived we were greeted by a play leader who taught us how to pass down a line diagonally so we could improve our skills in matches. 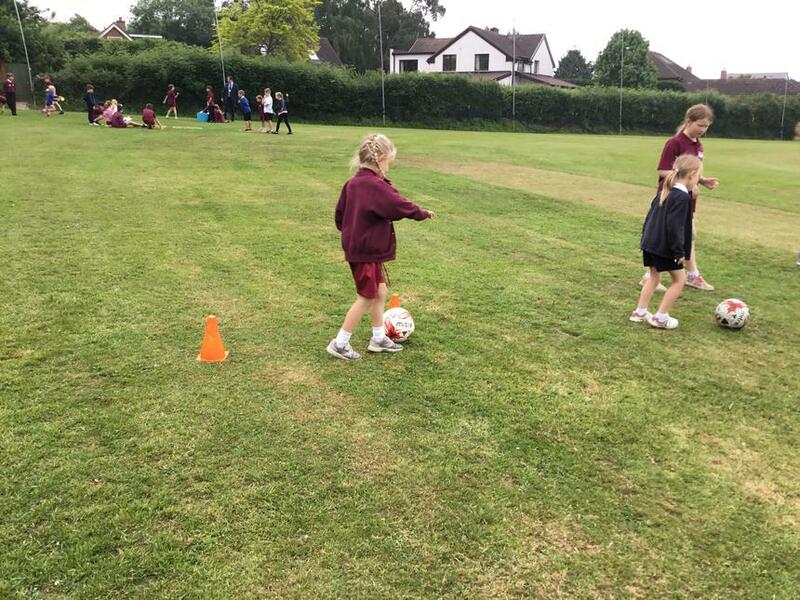 We also did two on one with the ball, which helps our side stepping, agility skills. 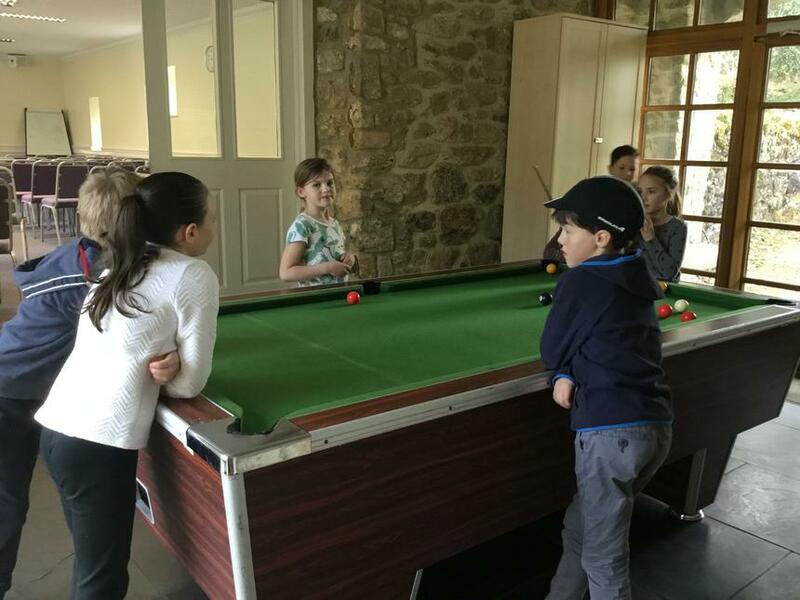 After that, we played a match which was really fun because we had some game-play experience. 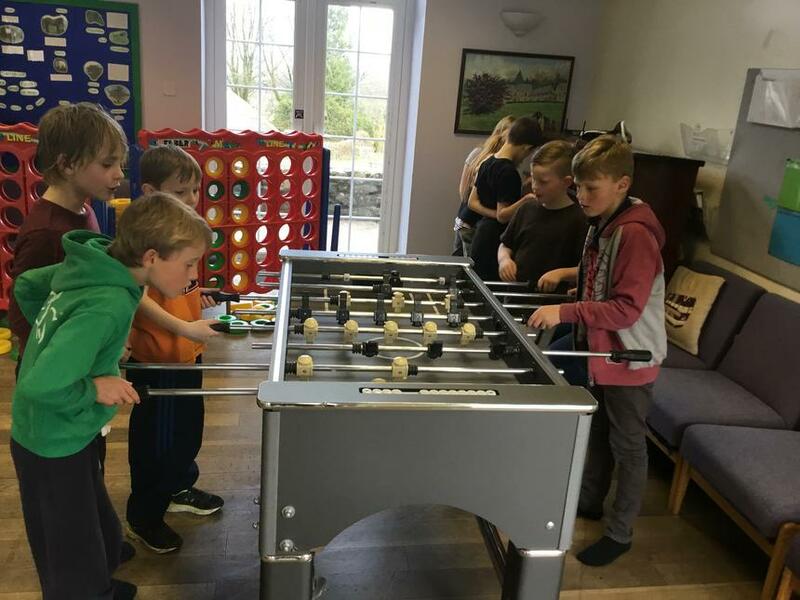 It was a close match! 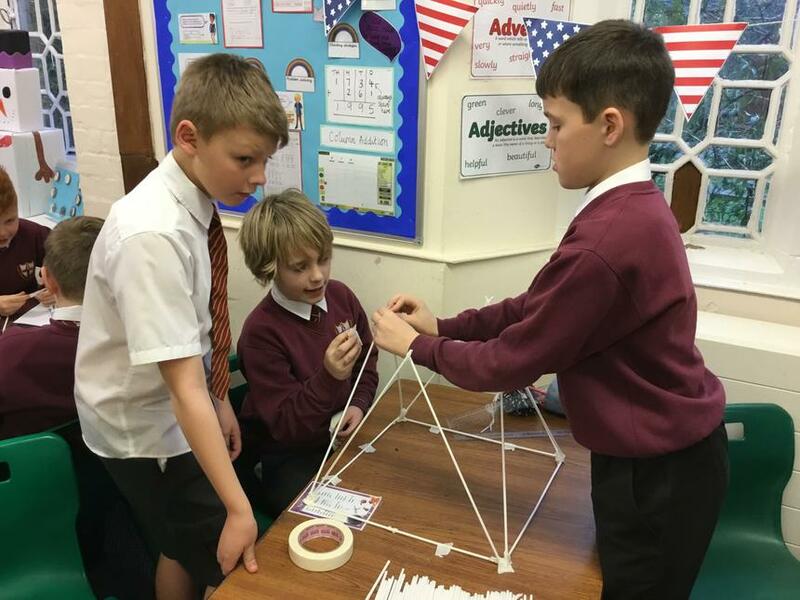 Earthquake tower investigation! 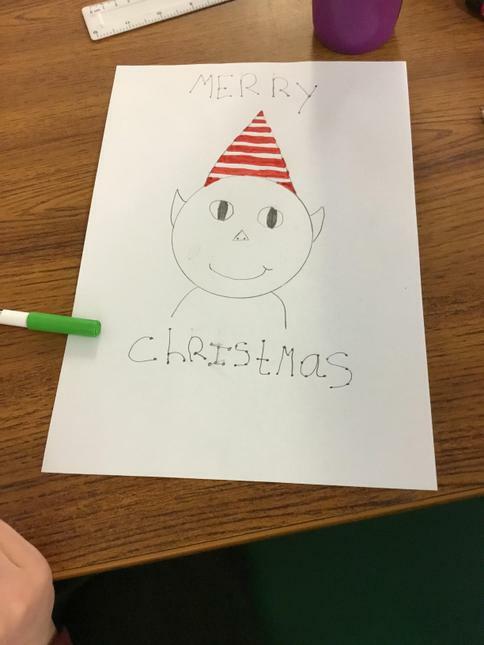 How would you create yours? 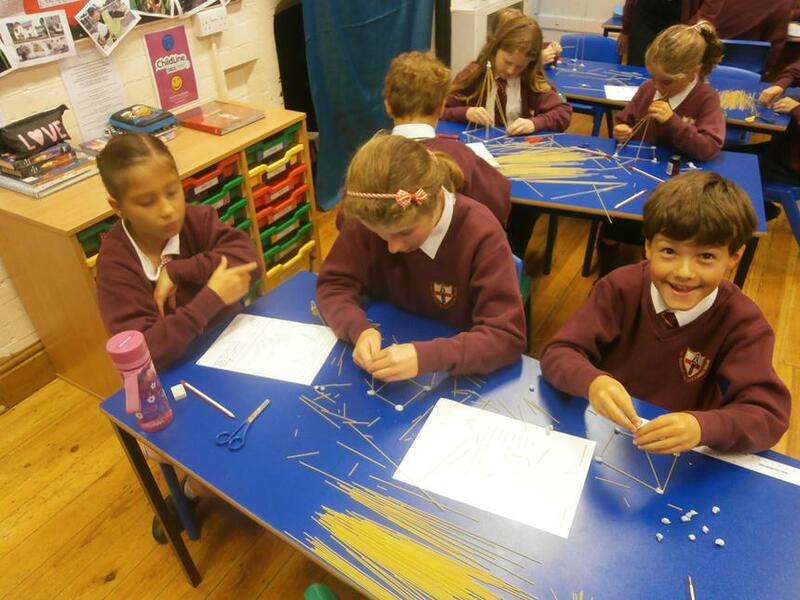 We were designing structures out of spaghetti and Blu-tac to withstand an earthquake. 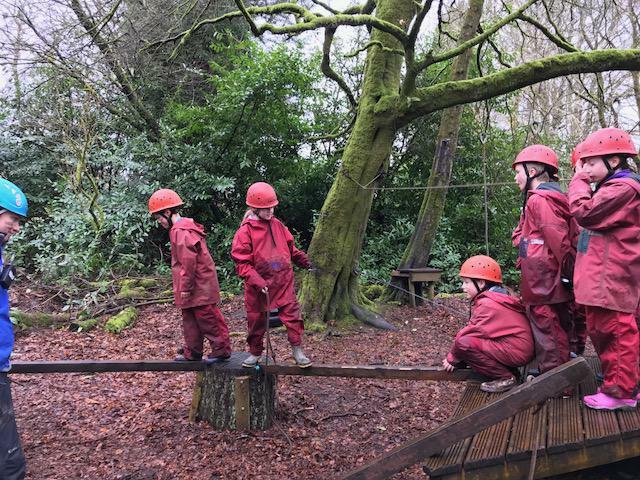 We shook the tables to see whether they stayed up or fell over! 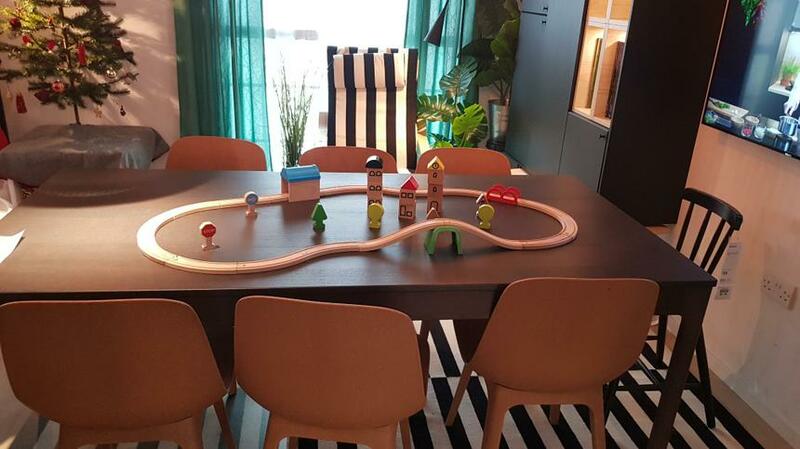 Next time, I wouldn't make it as big because it wasn't as sturdy when we used big pieces of spaghetti. 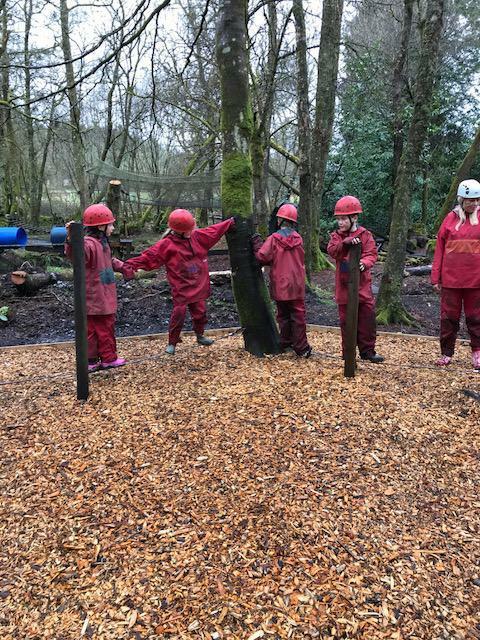 We had to re-make ours about five times because it kept falling over! 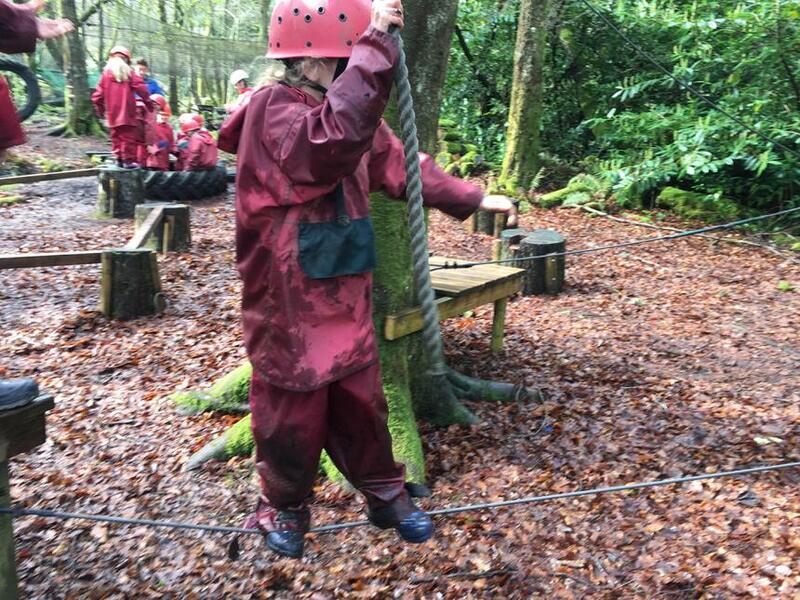 We showed lots of perseverance and never gave up. 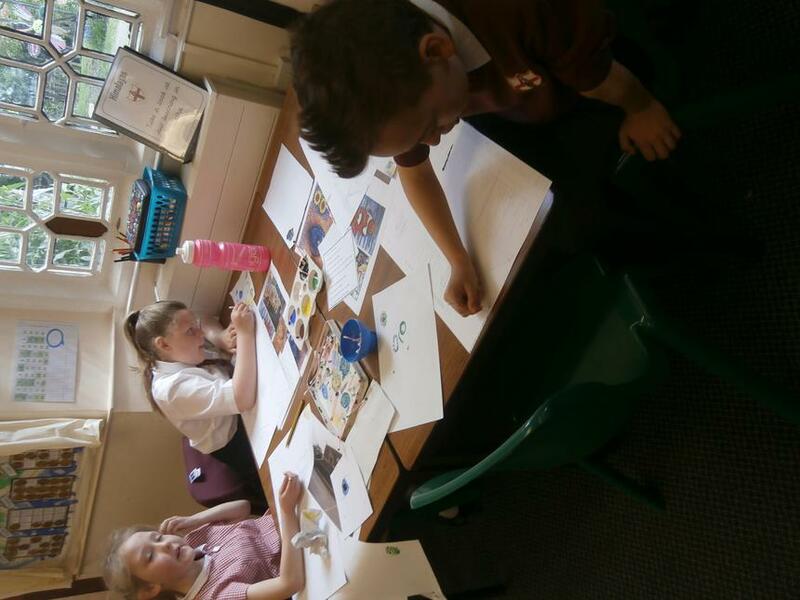 Himalayas class have had an enjoyable few weeks back to school. 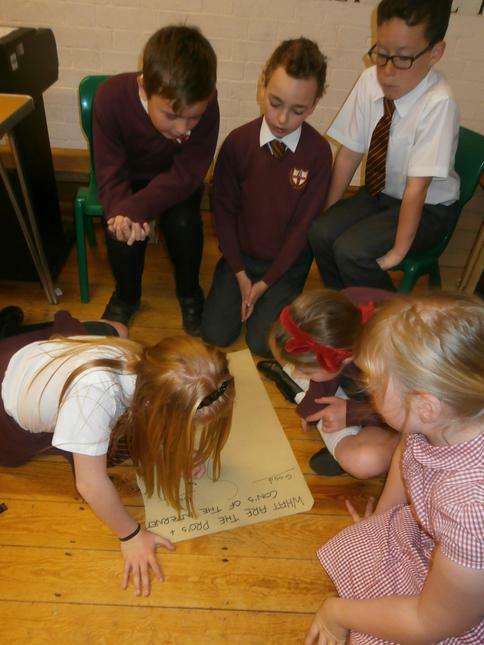 They have shared lots of interesting facts about natural disasters and have discussed what they want to find out. 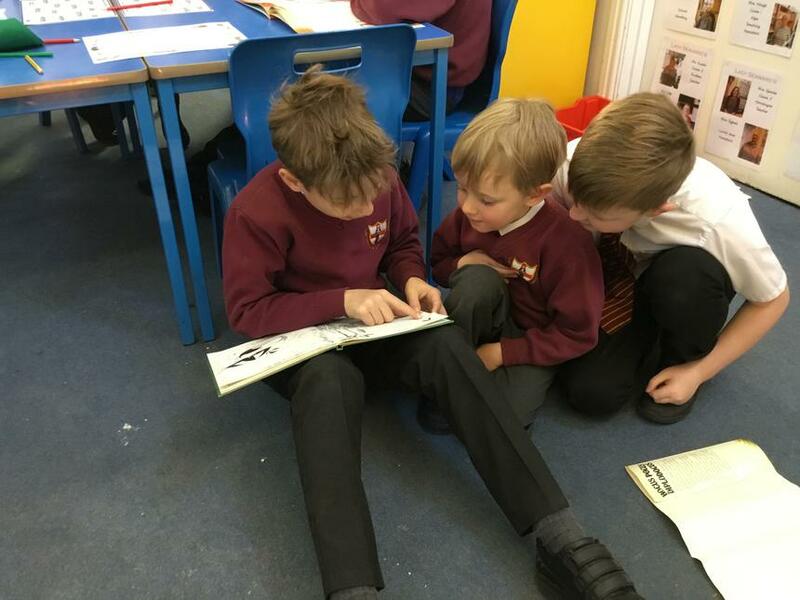 We have linked maths and literacy to our learning. 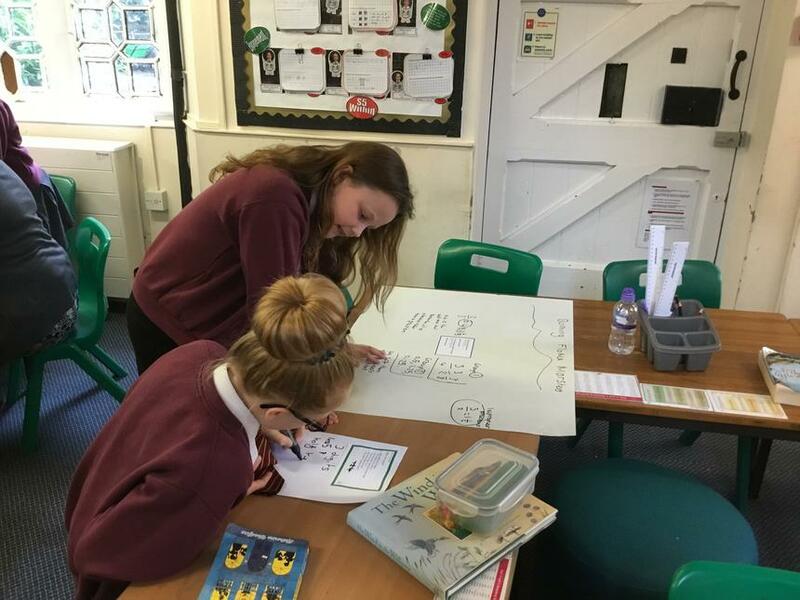 We began by collecting data about our favourite natural disaster, plotting these results on a bar chart and discussing the results. 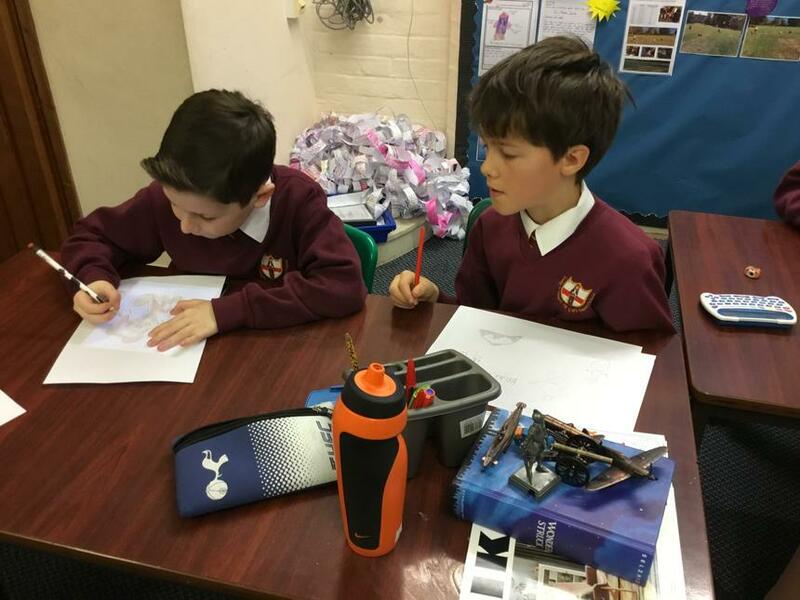 Then we wrote an information text about volcanoes trying to include a range of facts and subheadings. 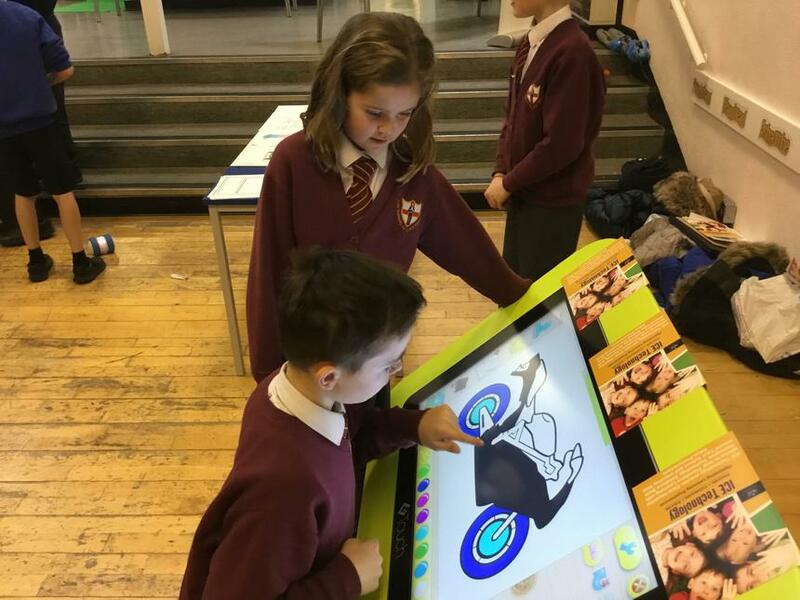 Come and have a look at our fantastic work on our classroom display! 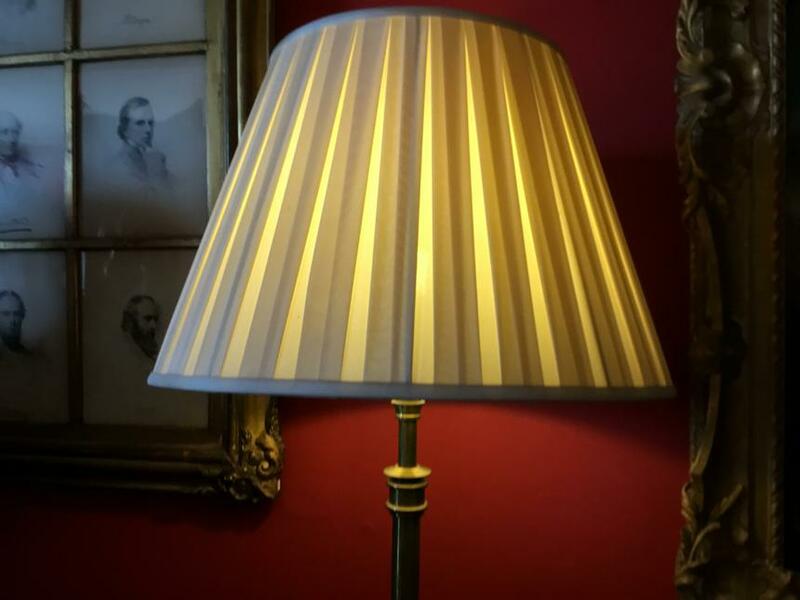 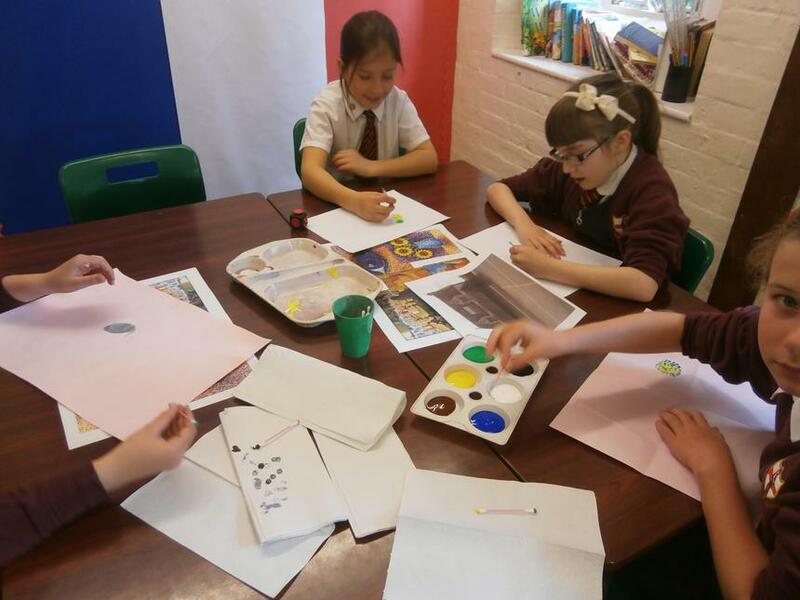 As creative artists, we have been discovering French artists and their techniques. 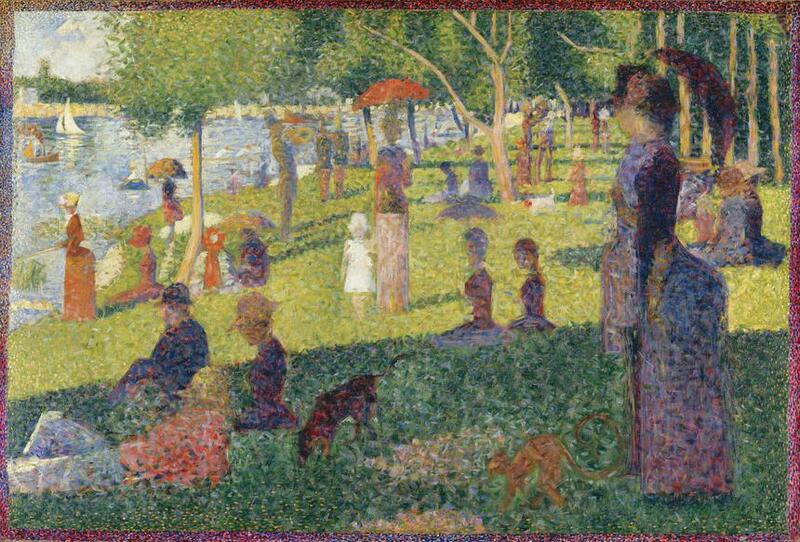 In particular, we have been exploring the work of the French artist Georges-Pierre Seurat and pointillism. 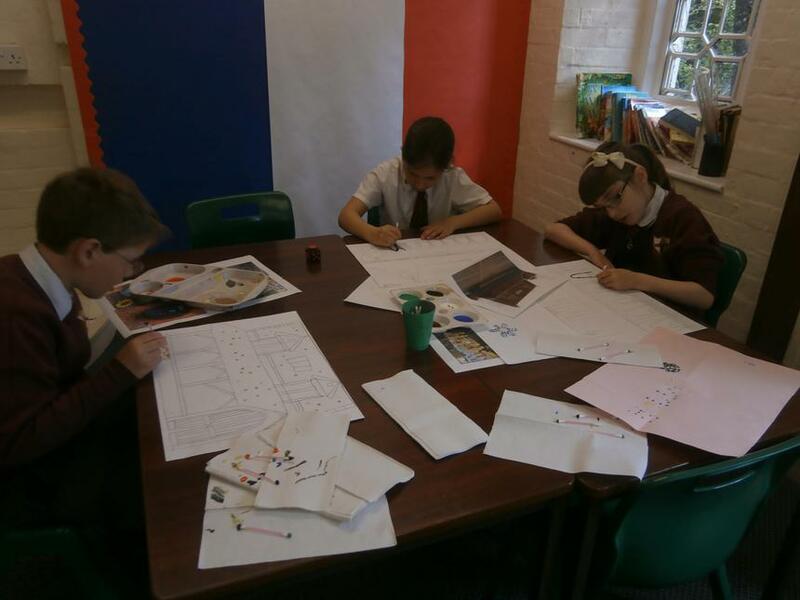 The children have sketched the school building and then used cotton wool buds to create the pointillism effect. 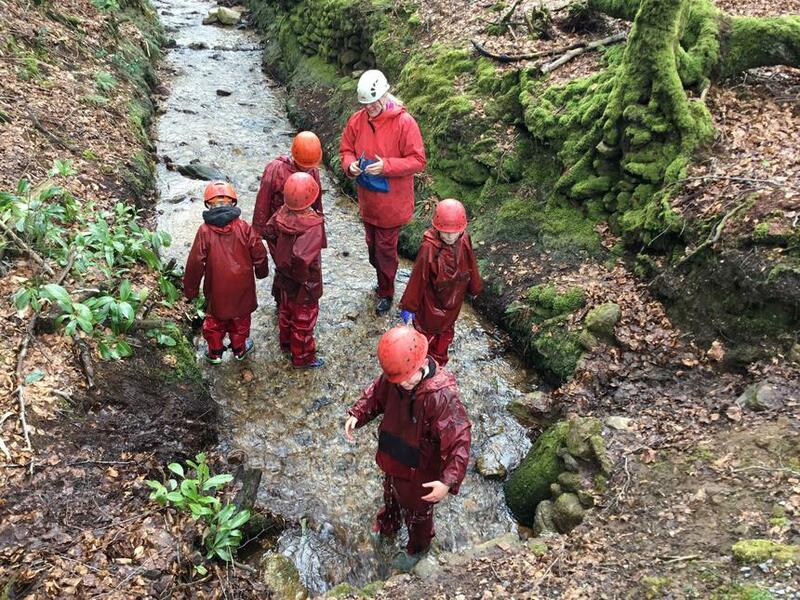 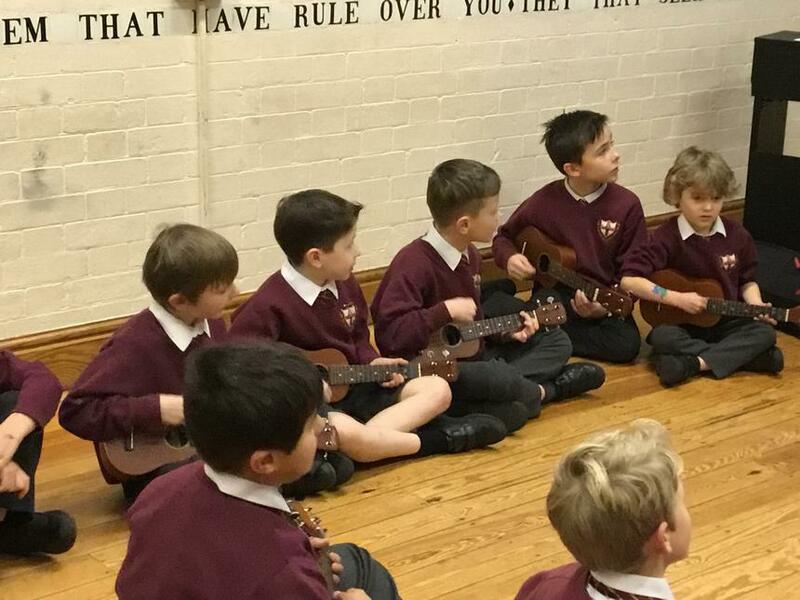 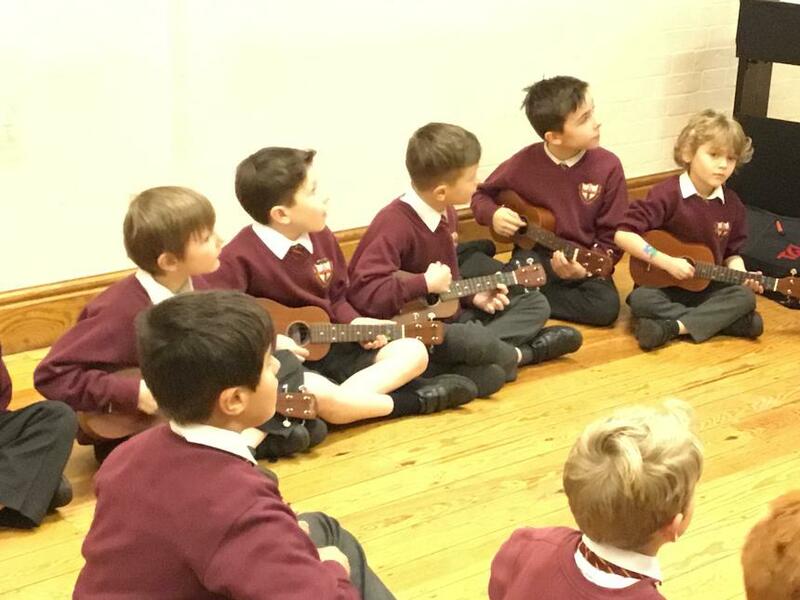 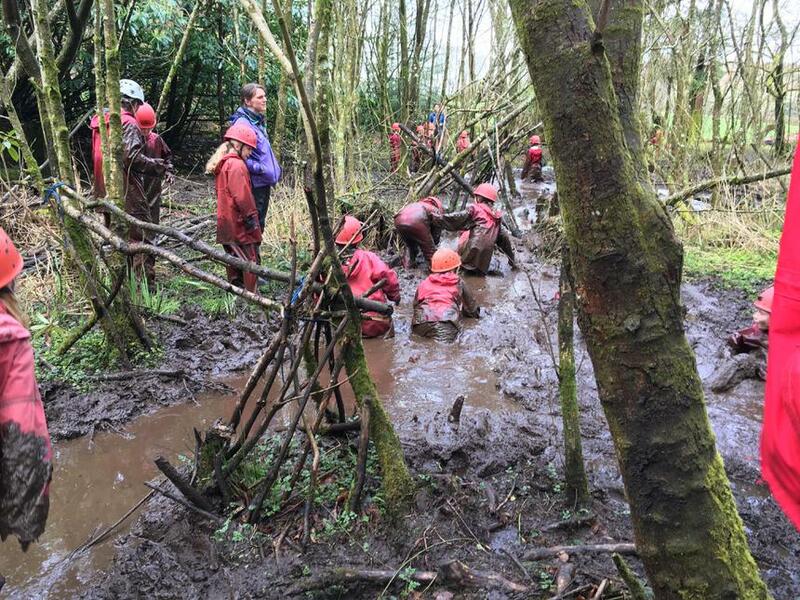 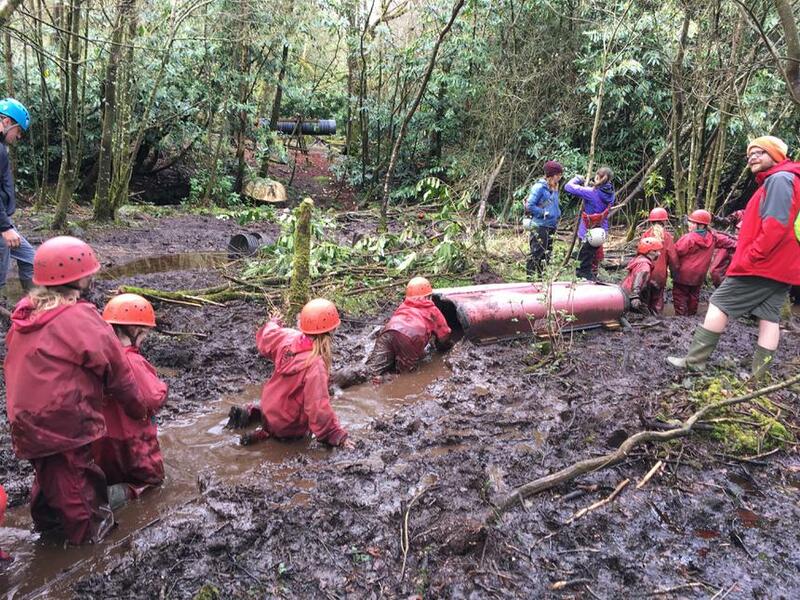 The year 4 children had a fantastic few days on their residential this year. 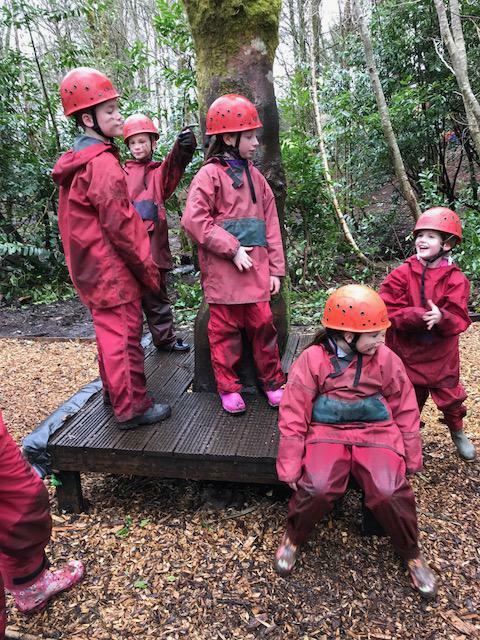 The children participated in a range of activities and had lots of fun and laughter along the way. 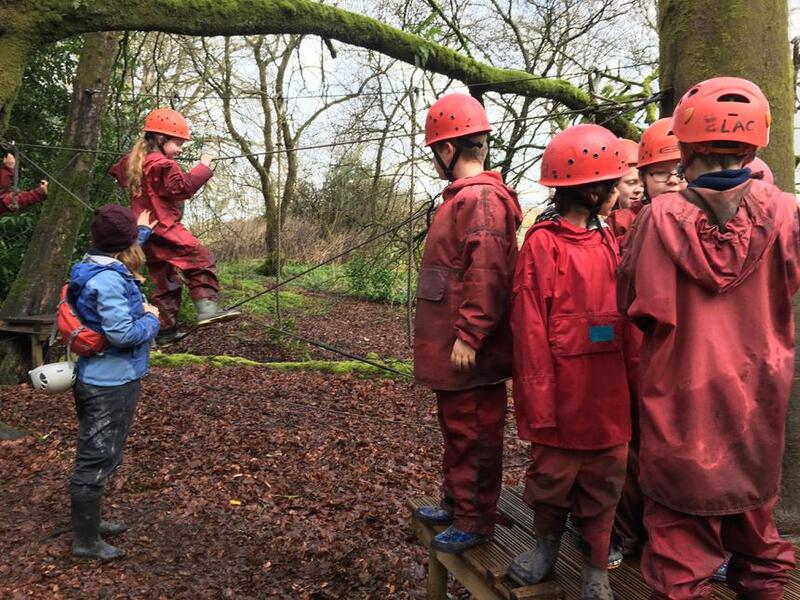 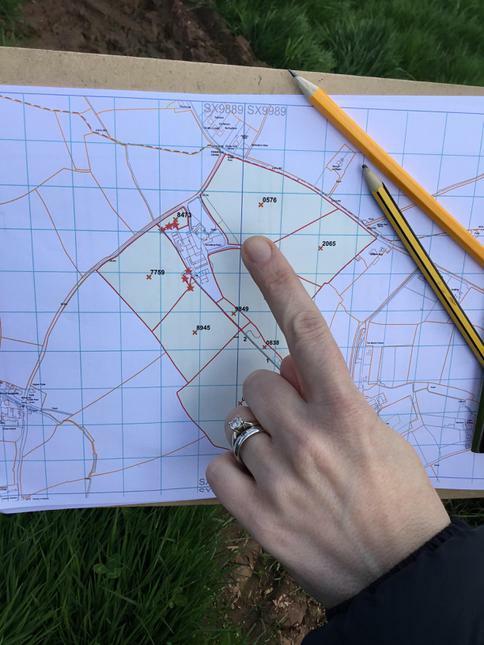 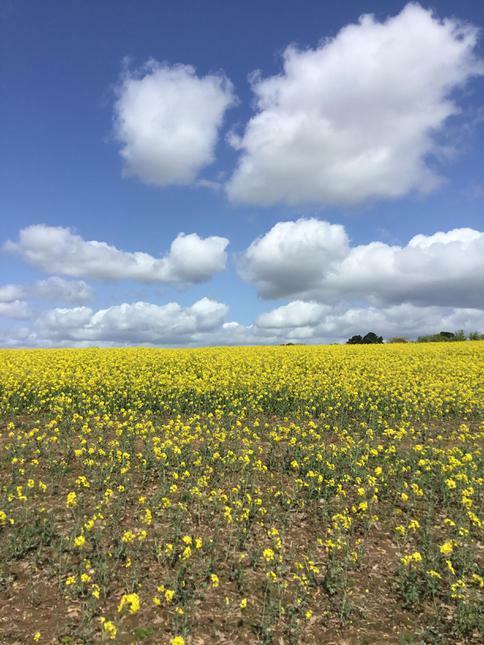 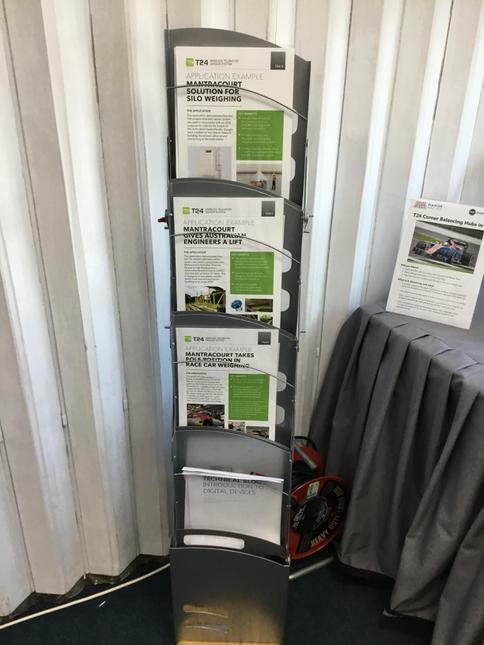 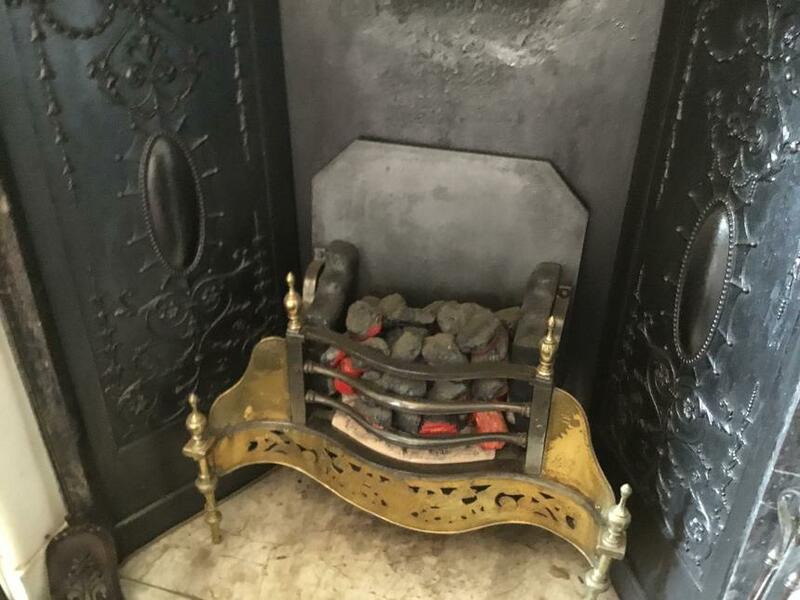 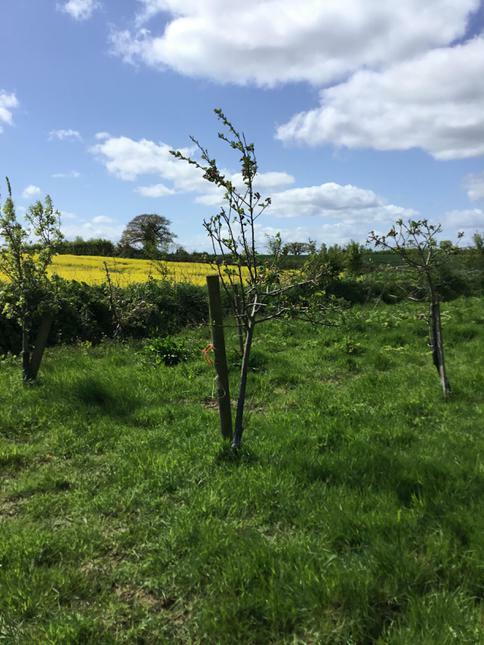 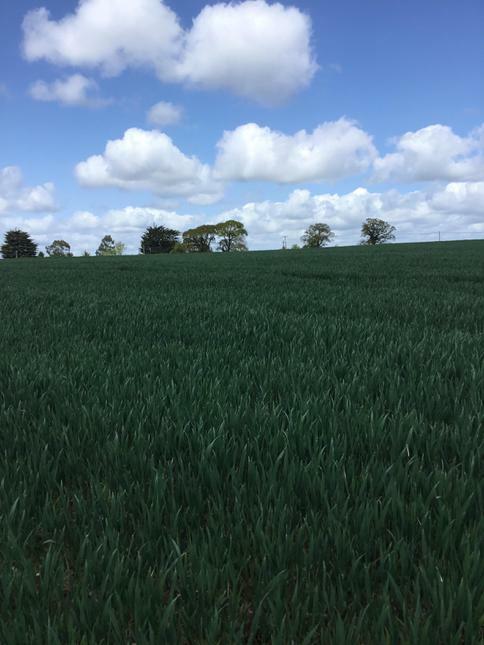 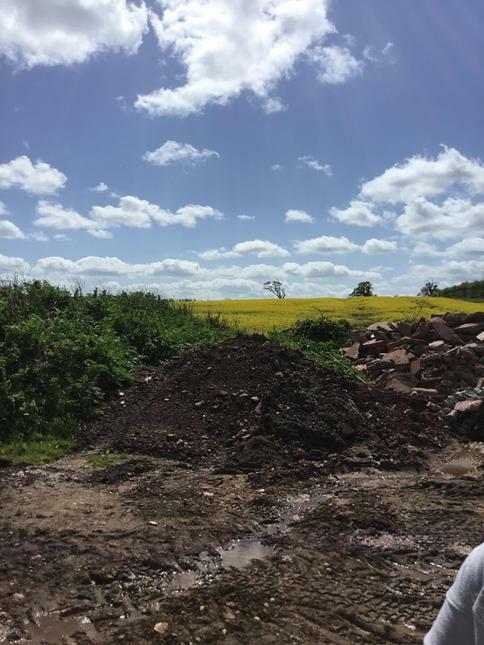 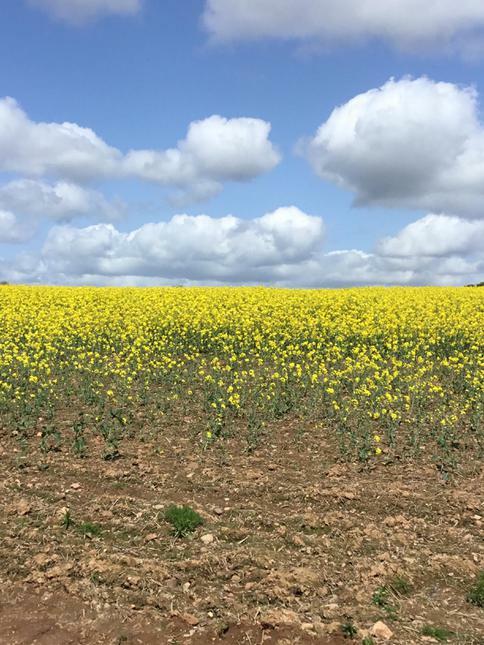 Take a look at the pictures to see what we got up to. 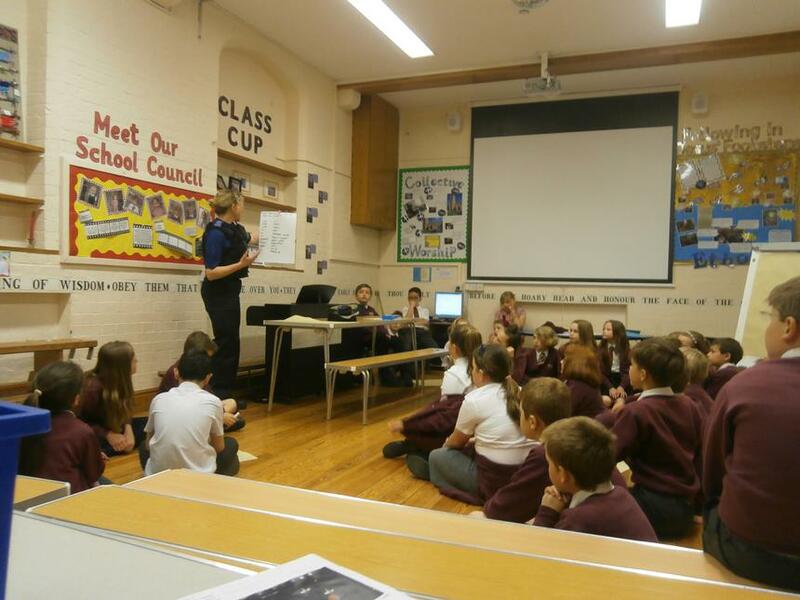 The children of Class 3 and 4 were fortunate enough to have our local PCSO visit us to discuss internet safety. 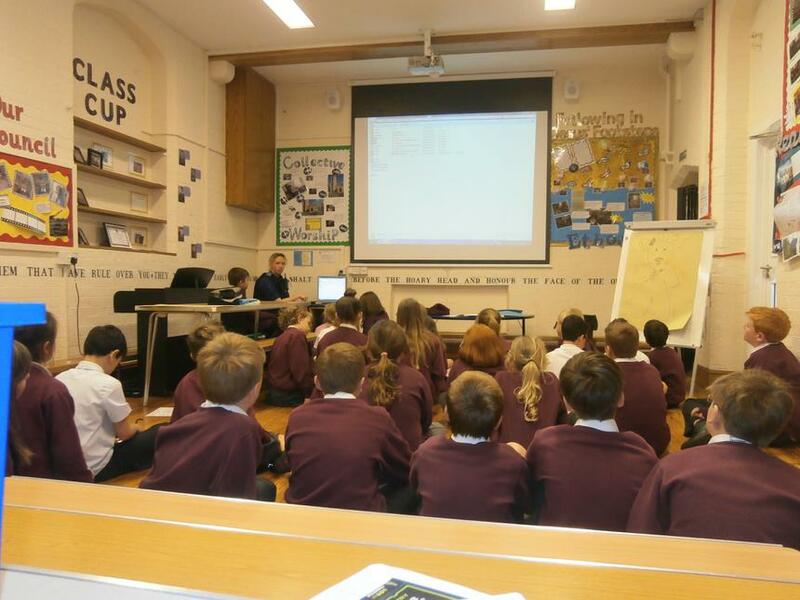 This session involved lots of practical work as well as learning about the dangers of giving out personal information. 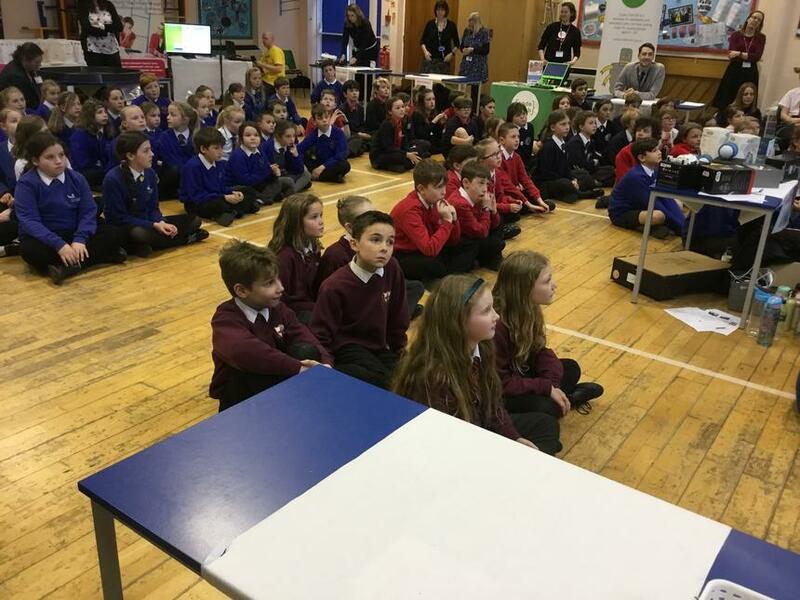 We all now feel very well informed and know how to keep safe online. 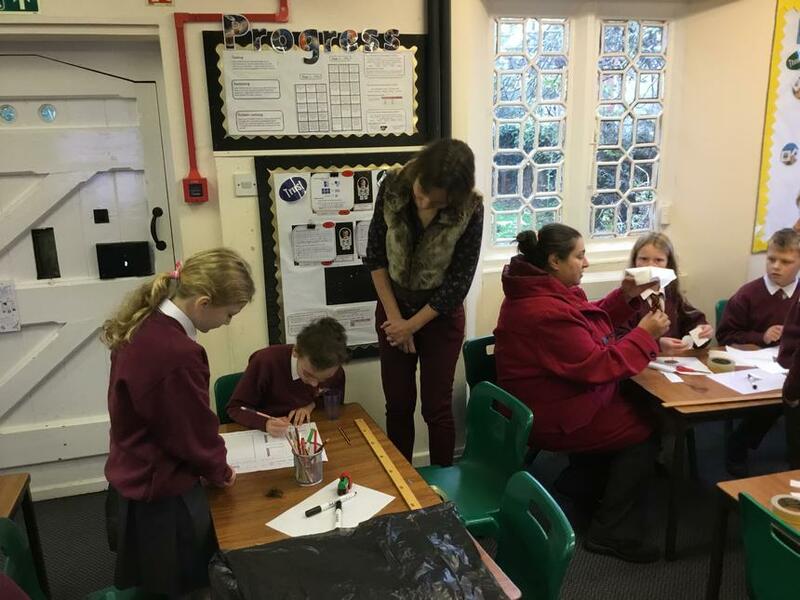 As part of our science learning this term, pupils from Class 3 and 4 have been carrying out their own investigations into how shadows are formed as well as how images are reflected. 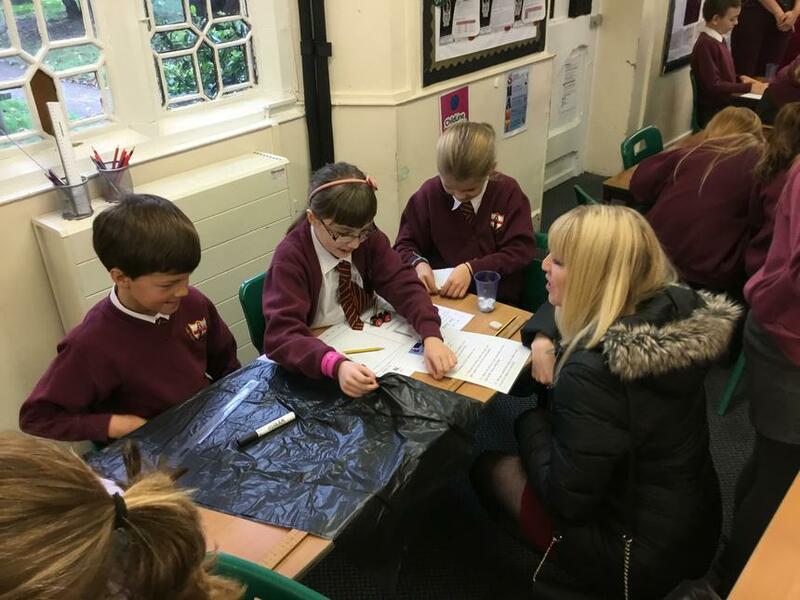 The children have extended their core investigation skills, learning about the importance of controlling set variables to ensure a fair test. 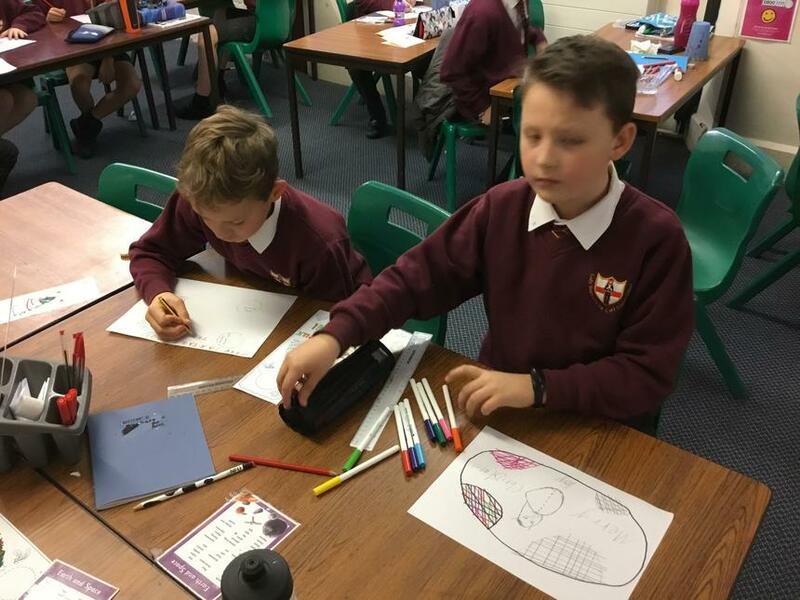 The most recent experiment saw the pupils creating multiple reflections of objects using mirrors placed at differing angles. 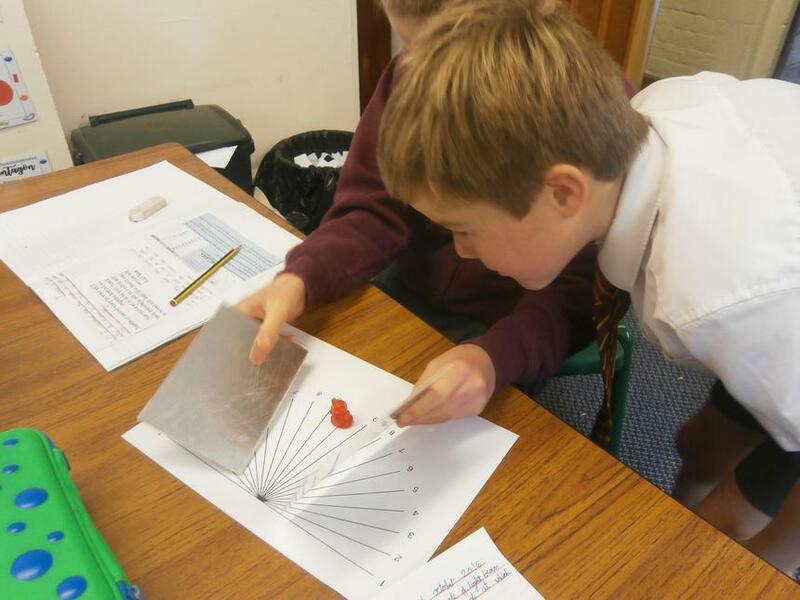 This optical illusion created great excitement and engagement from our budding scientists! 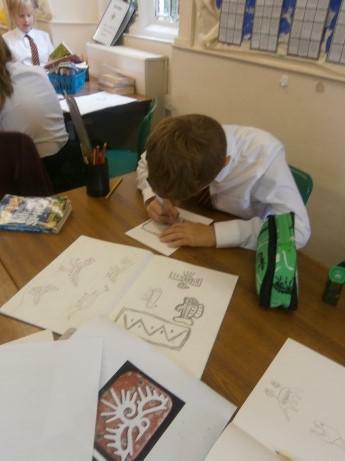 The children have started creating their very own Aztec houses and produced some wonderful Aztec artwork. 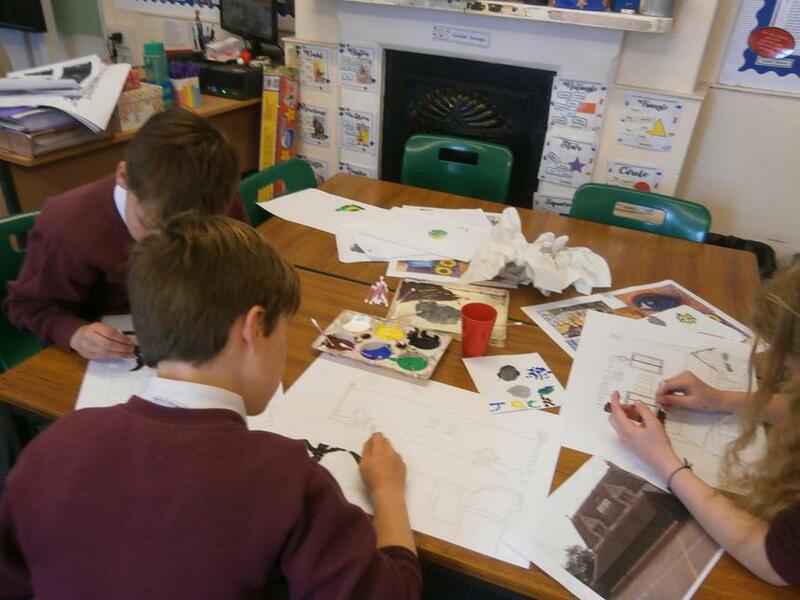 We have used information gathered from previous lessons to build their houses in a style that they would have seen during the Aztecs time in Mexico. 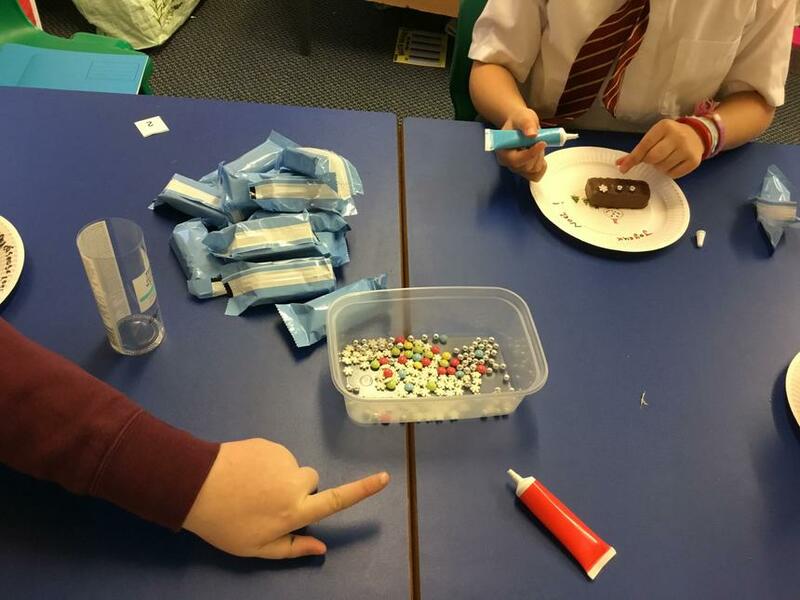 They thought carefully about the materials that they would use and some children even brought in items from home! 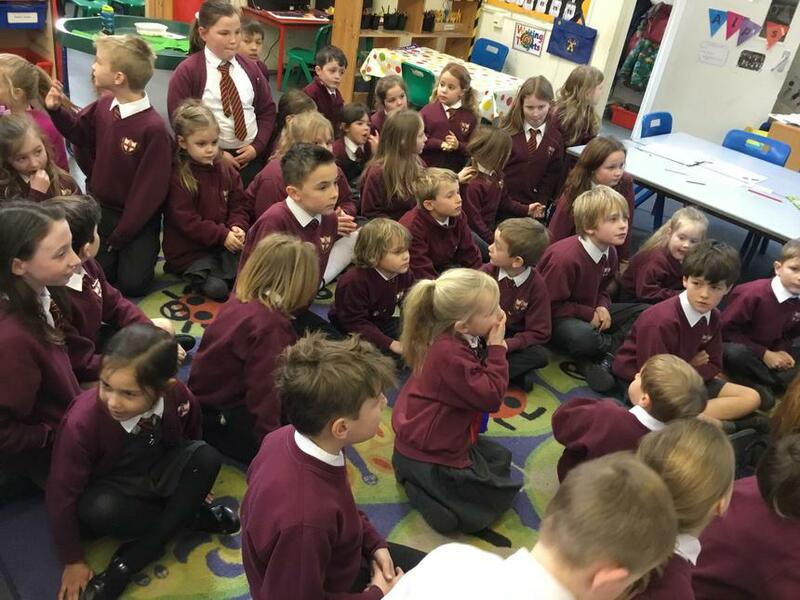 It’s great to see that the children are so excited by their topic.